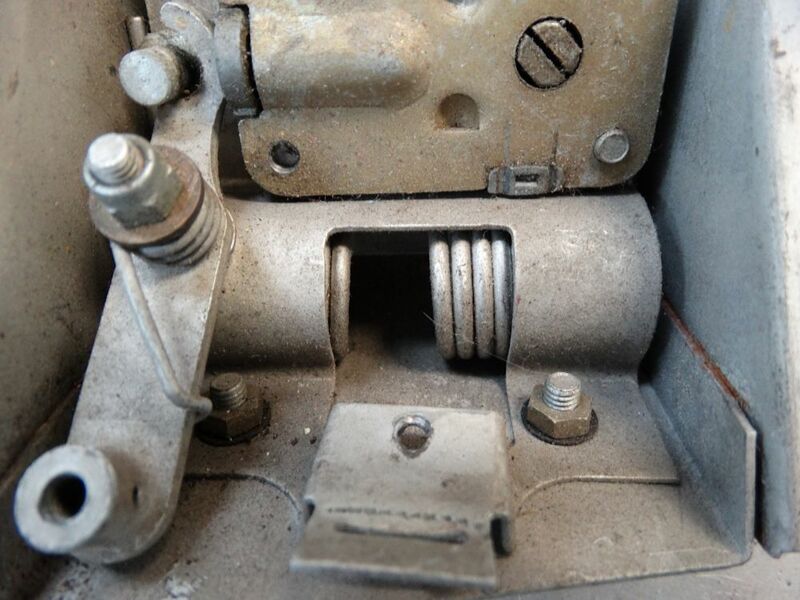 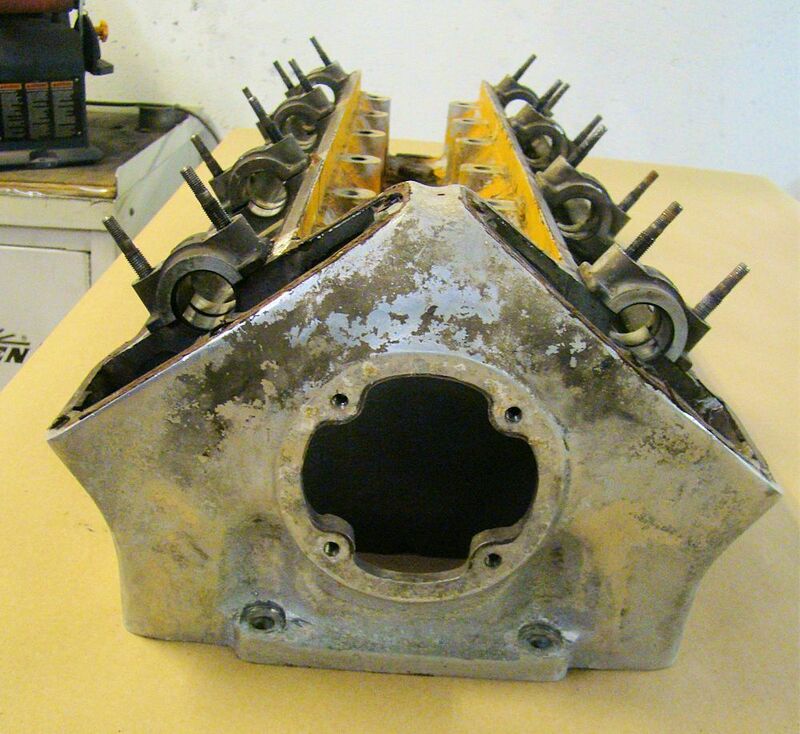 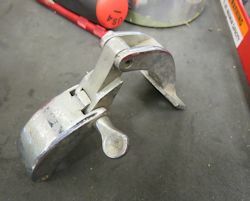 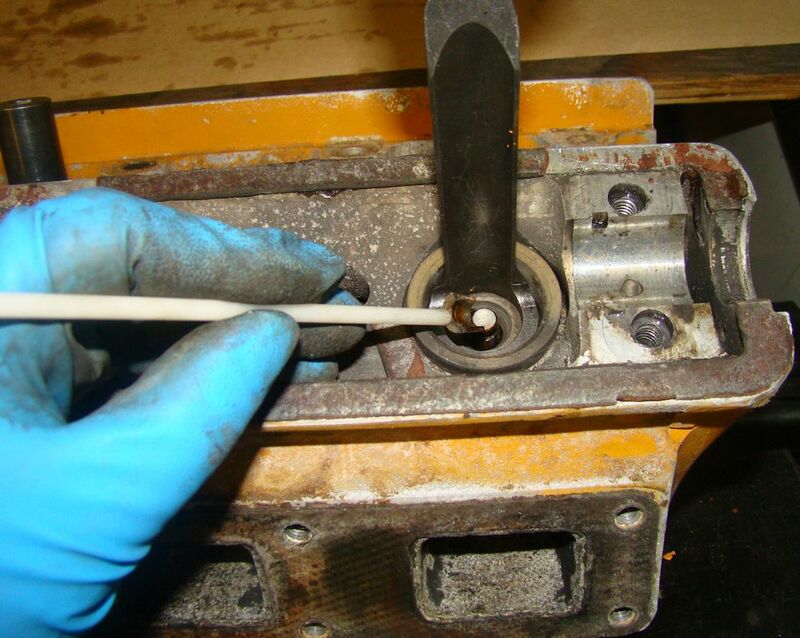 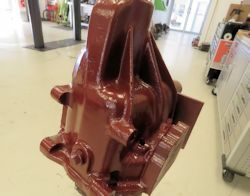 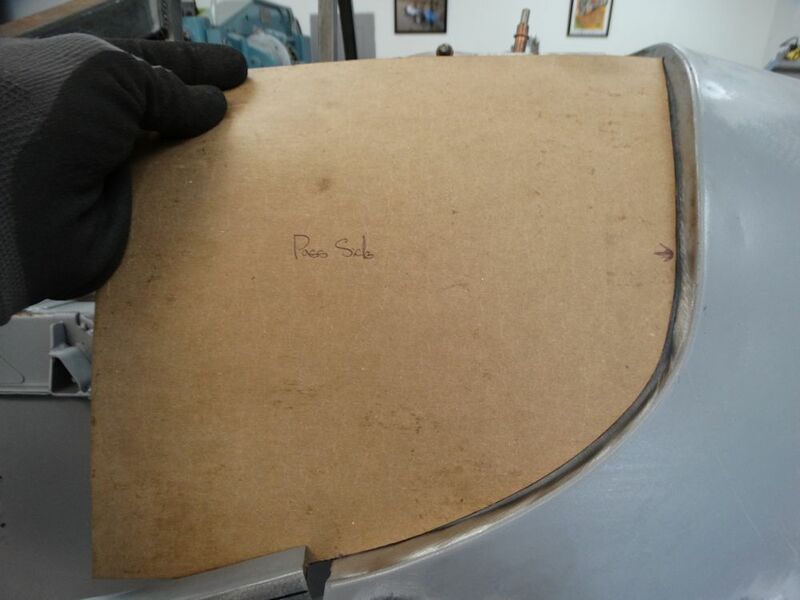 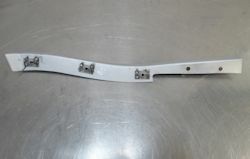 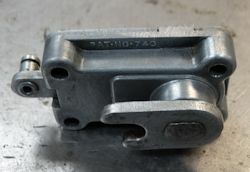 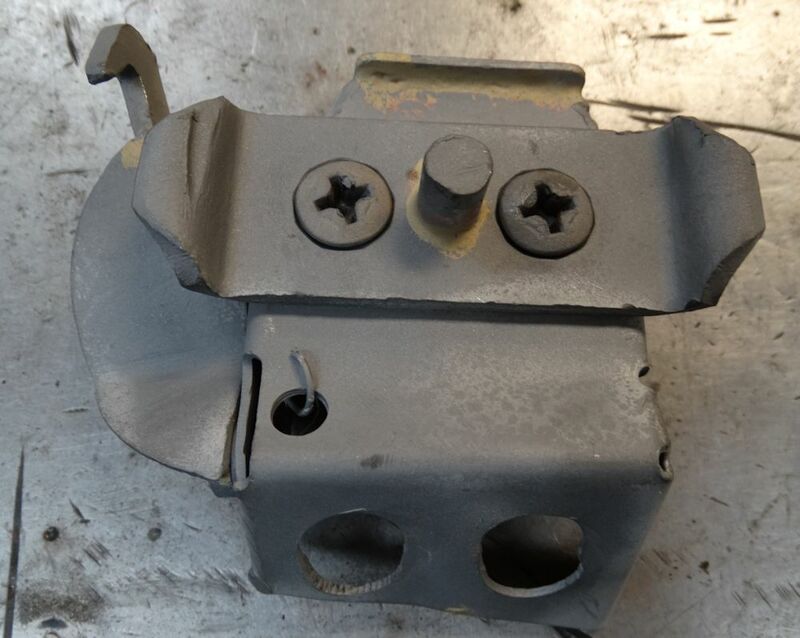 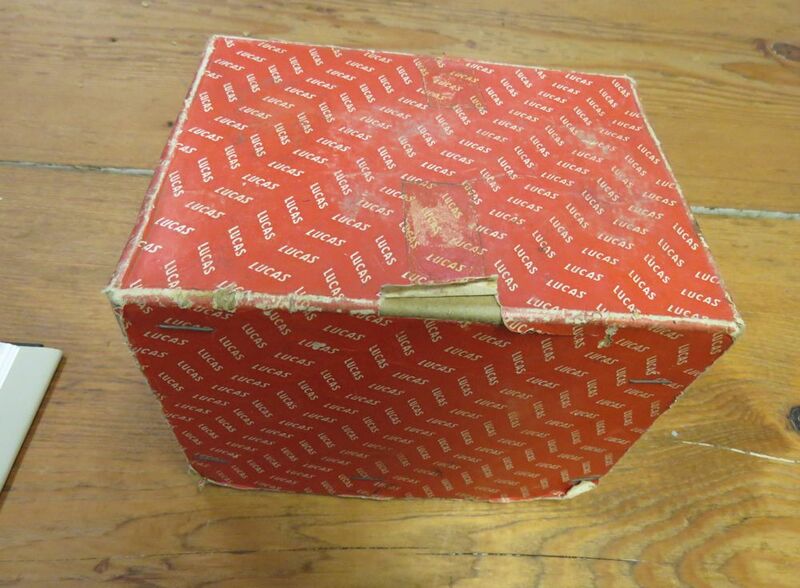 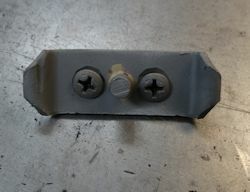 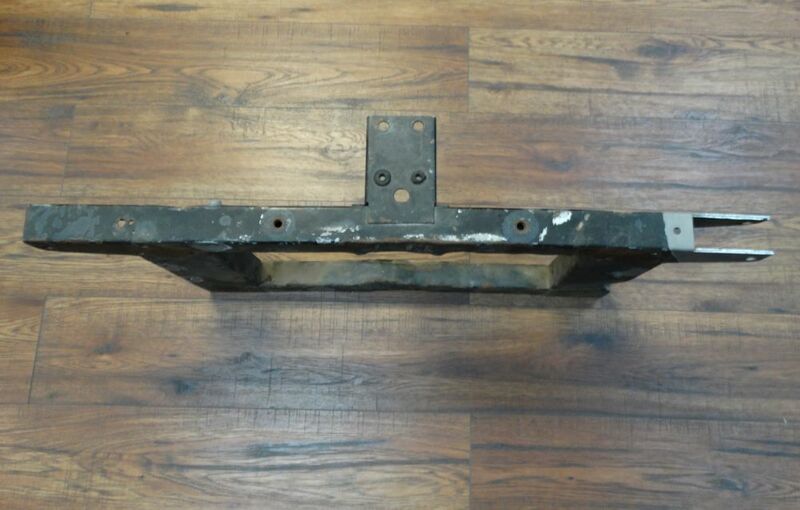 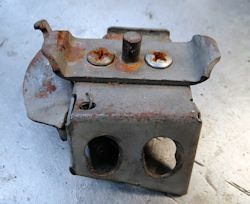 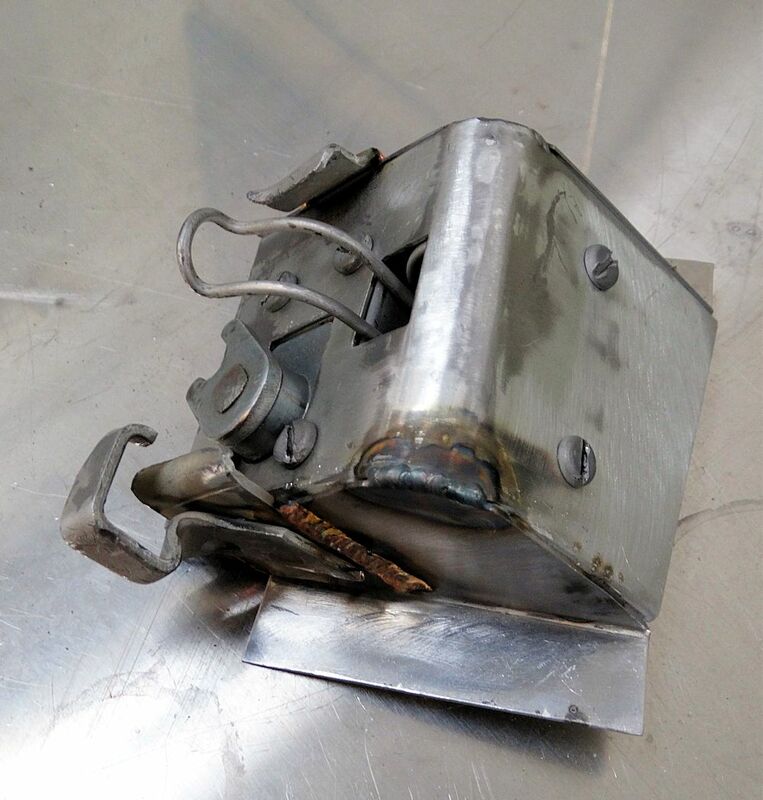 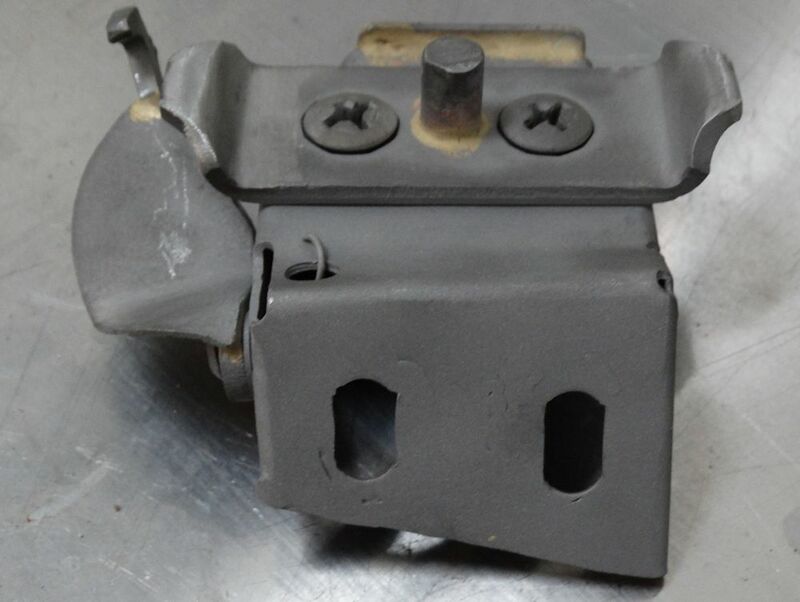 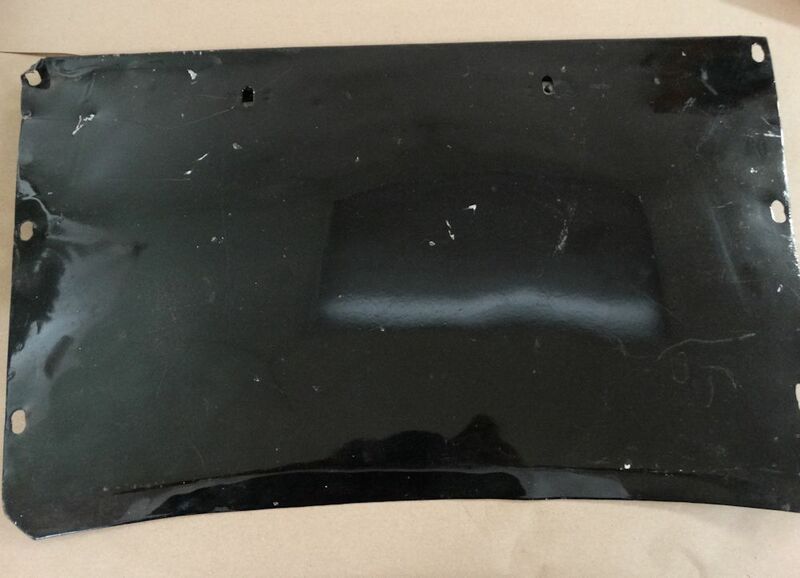 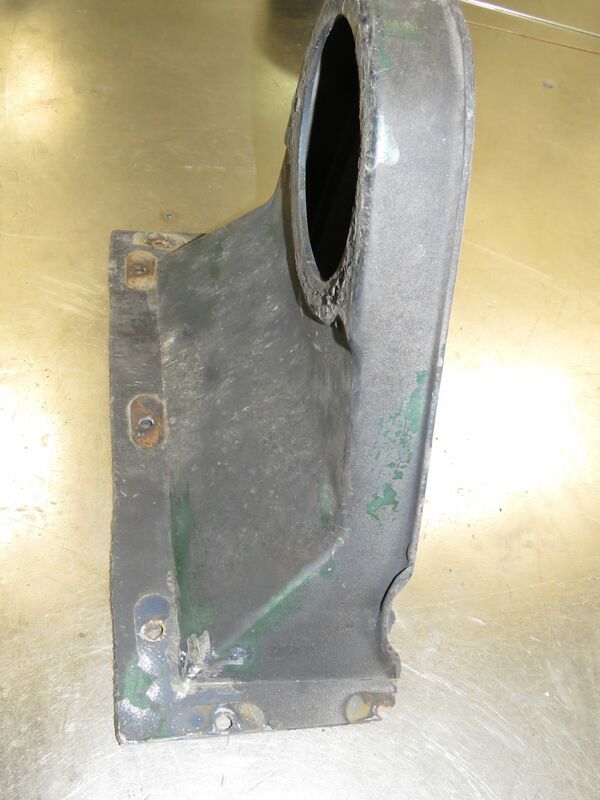 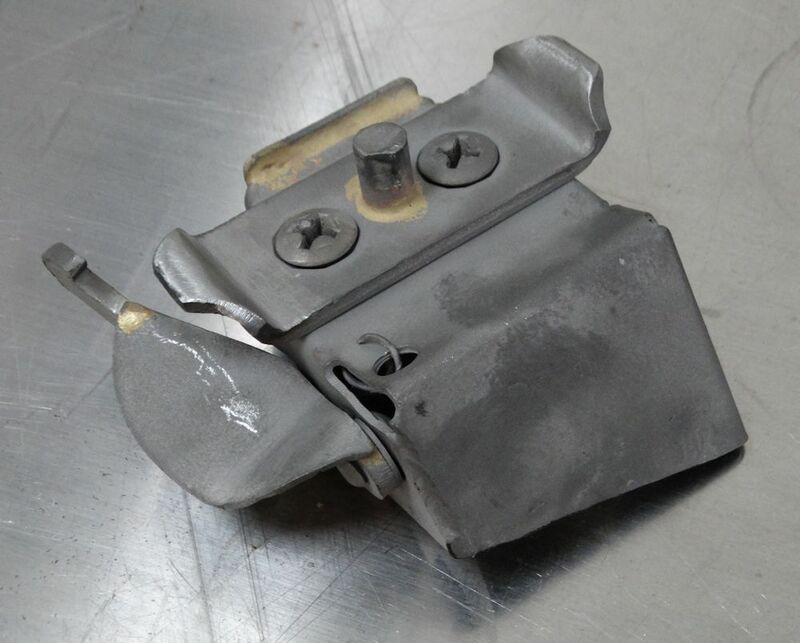 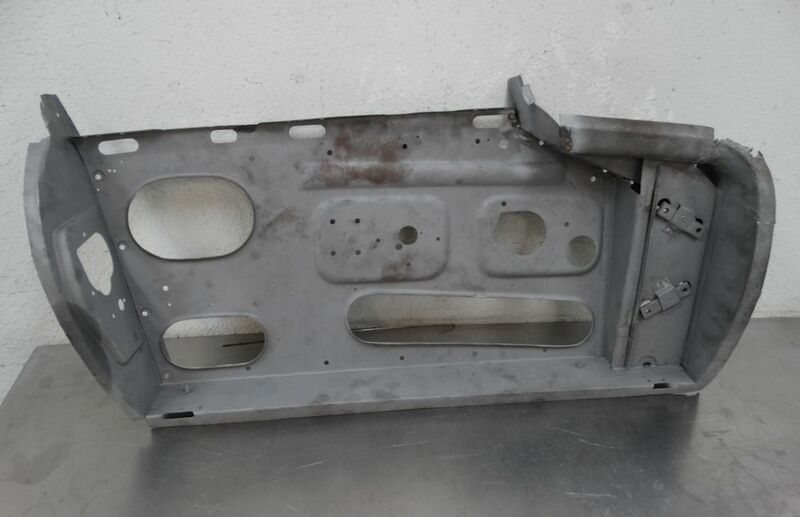 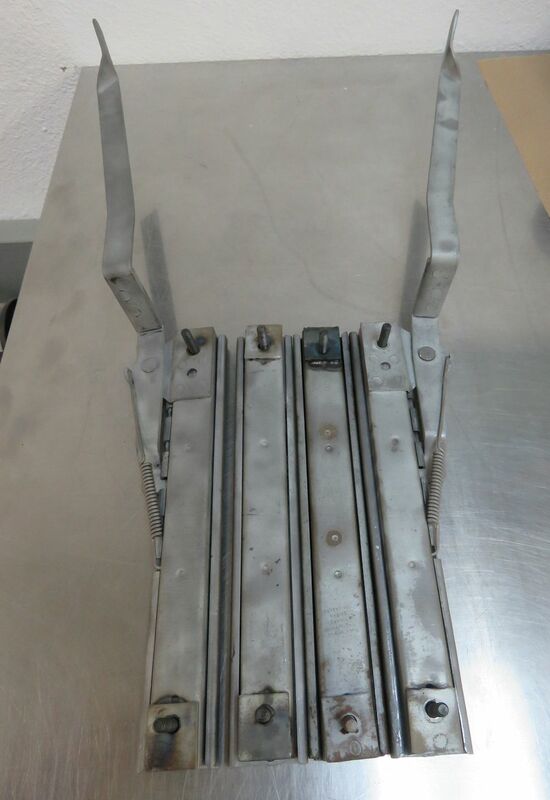 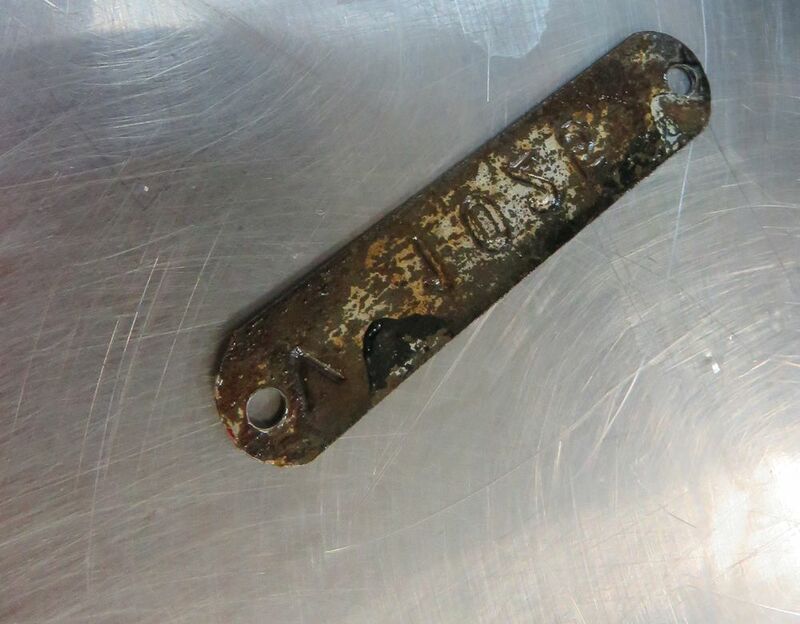 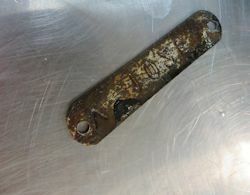 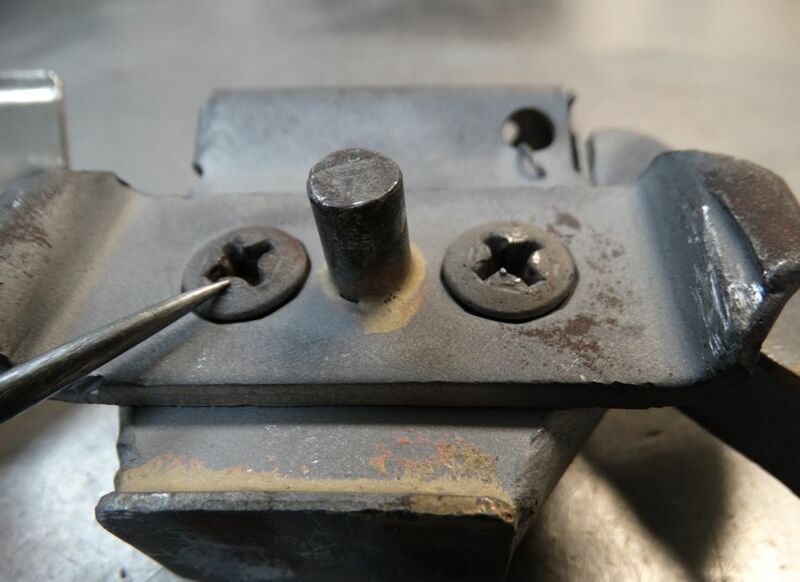 Total restoration to original specification of an extremely rare outside bonnet latch FHC. 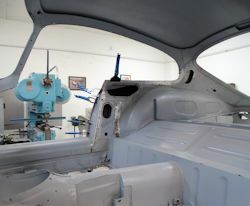 This car will be restored in its original factory livery of Opalescent Dark Blue with Biscuit interior. 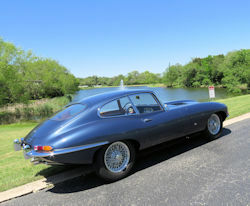 One last photo opportunity on a gorgeous spring day in Austin. 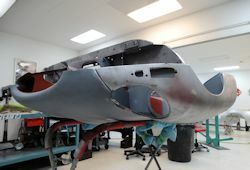 We have been pushing really hard to get this fantastic project finished this week, and we almost made it! 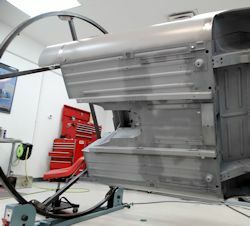 We should certainly be able to wrap everything up next week. 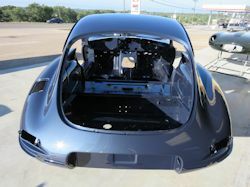 Earlier today we road tested the car and it performed flawlessly. 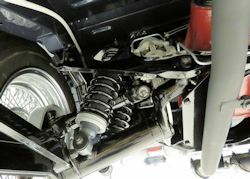 I snapped the pictures below when Alex was checking the ride height and stance after adjusting the torsion bars. 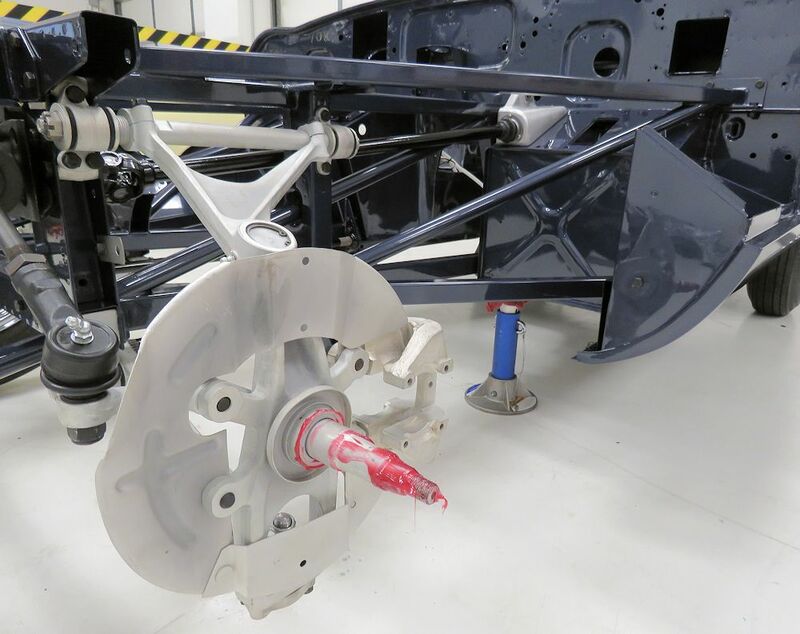 In these photos the car is sitting on its Borrani wire wheels shod with Dunlop R70 SP radials. 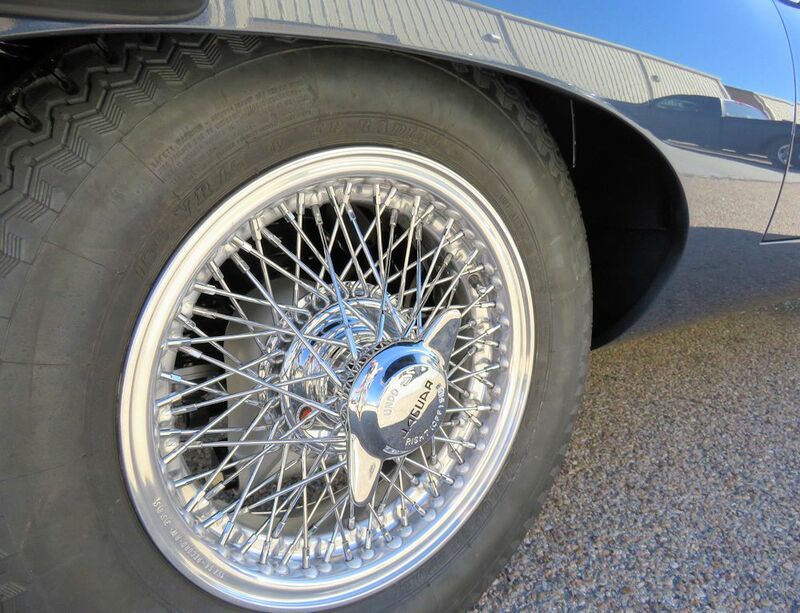 We also have a set of traditional wire wheels with bias ply tires for the show ground. 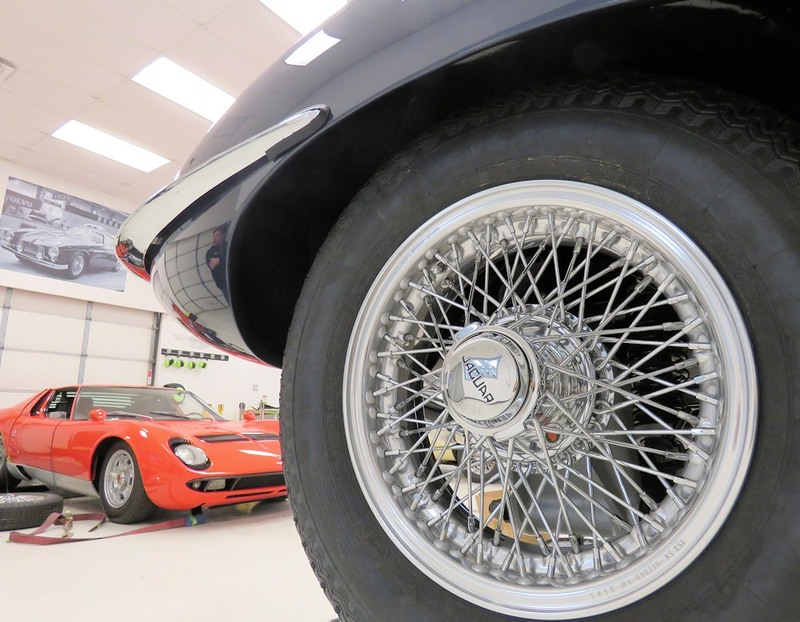 If you look carefully, Jake is lurking in the photo! 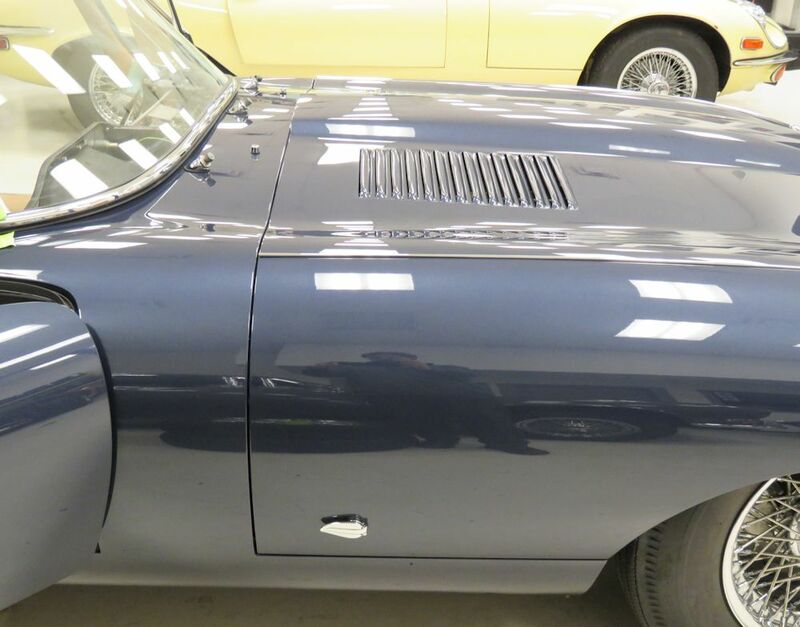 Putting some of the finishing touches to this incredibly challenging restoration. very appropriate Jaguar club badge! 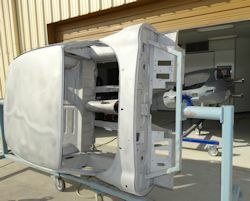 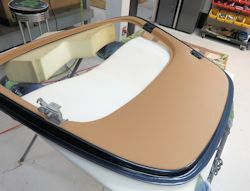 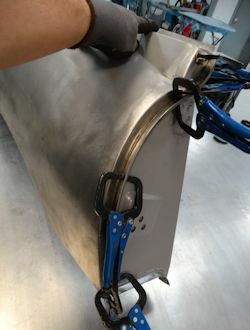 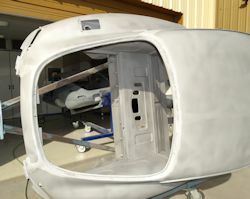 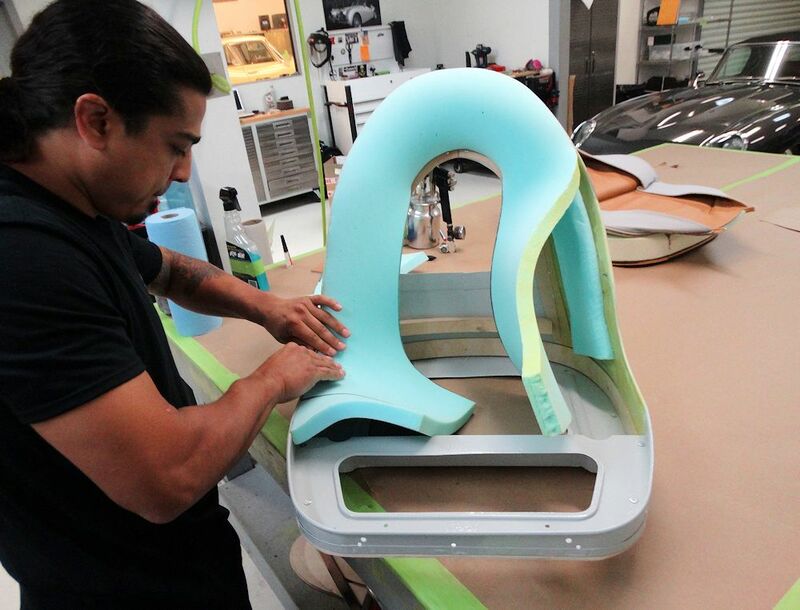 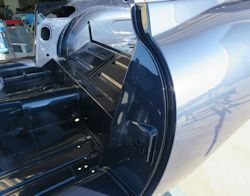 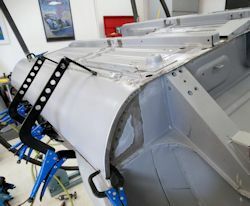 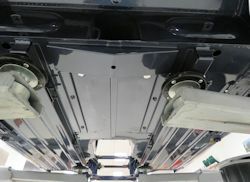 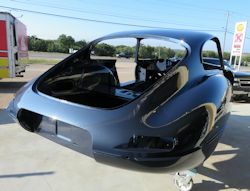 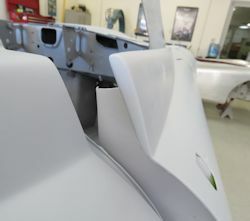 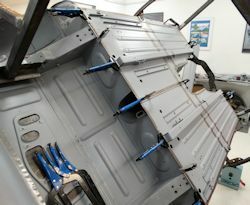 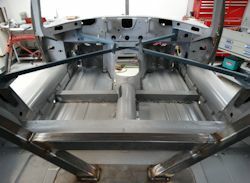 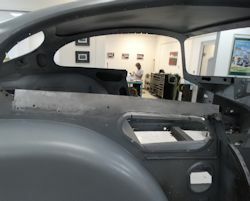 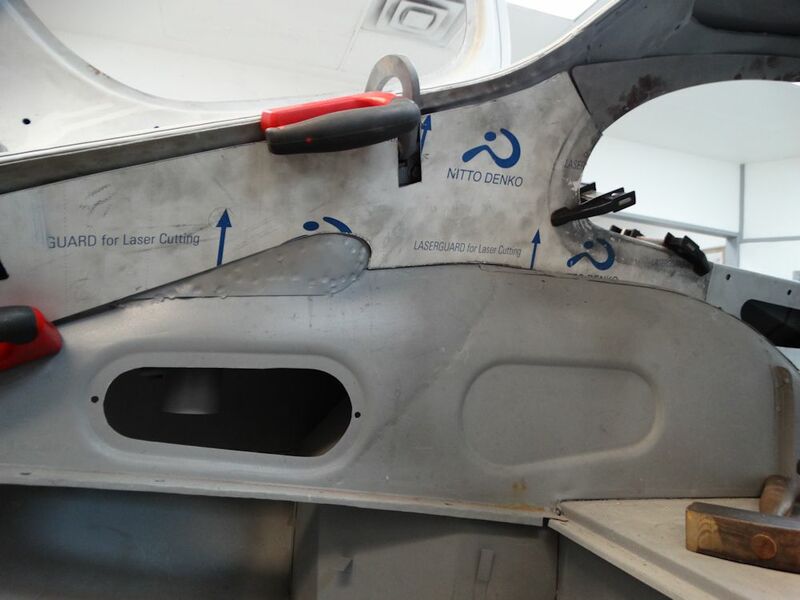 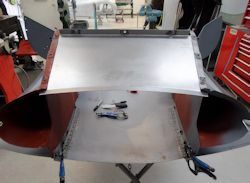 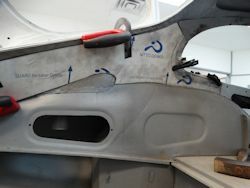 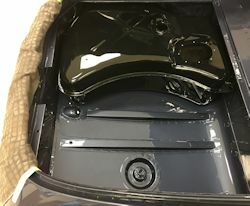 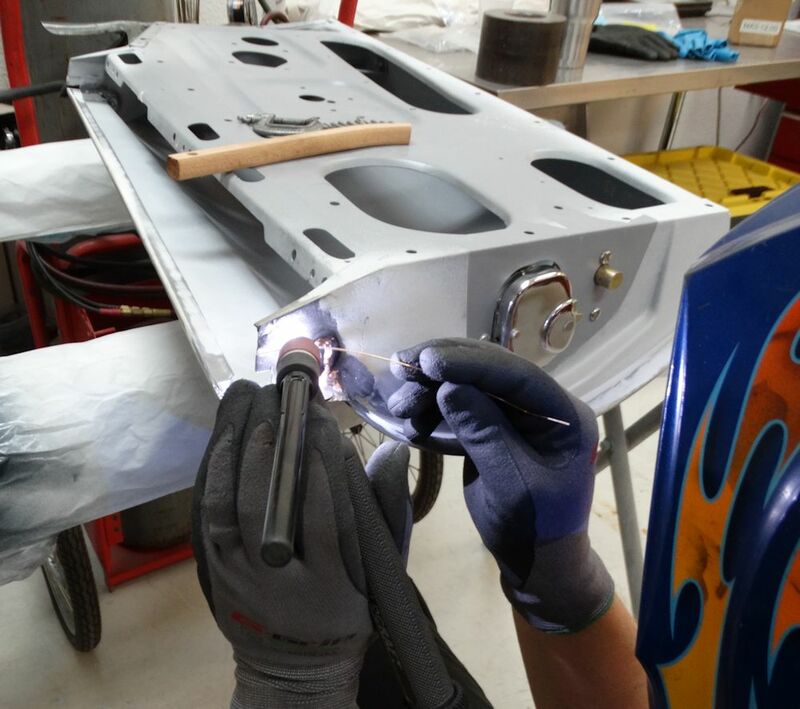 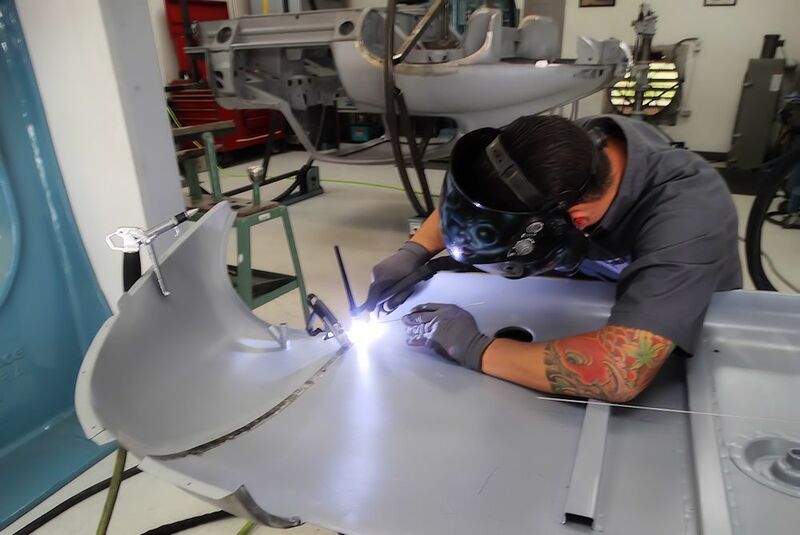 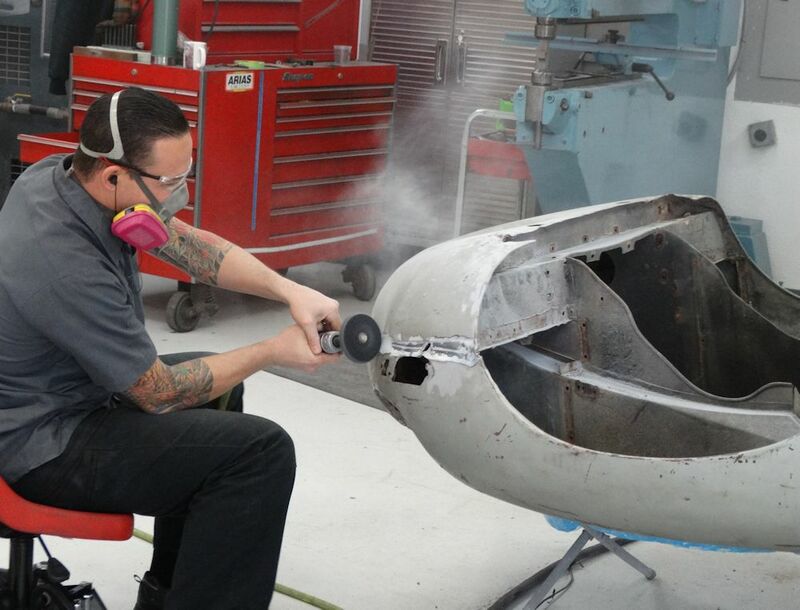 Carlos has been trimming the rear luggage compartment and installing the luggage rails to the two piece rear mat. We are now entering the finishing straight of this very special project. 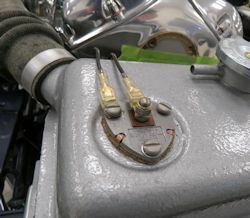 I am pleased to report that we have now run the engine through several heat cycles and everything is working perfectly. 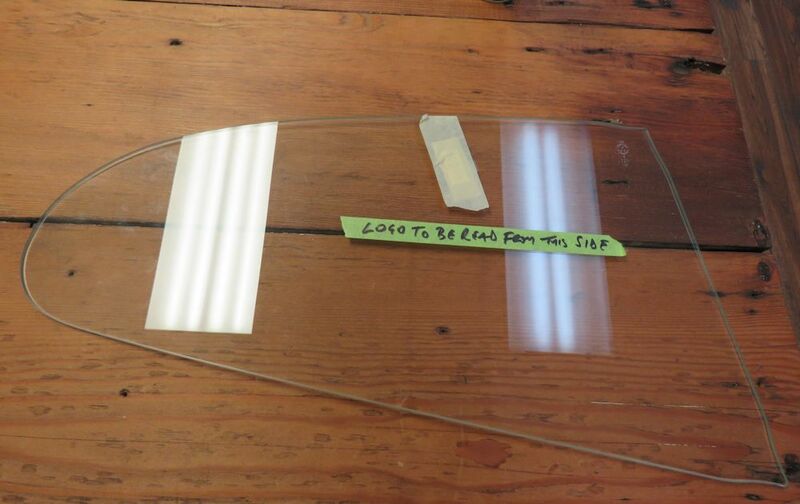 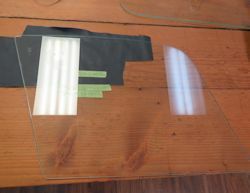 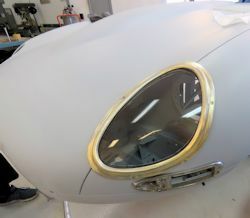 We have also installed all of the glass, including the front windscreen. 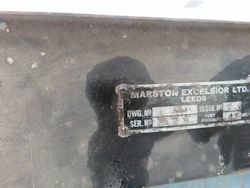 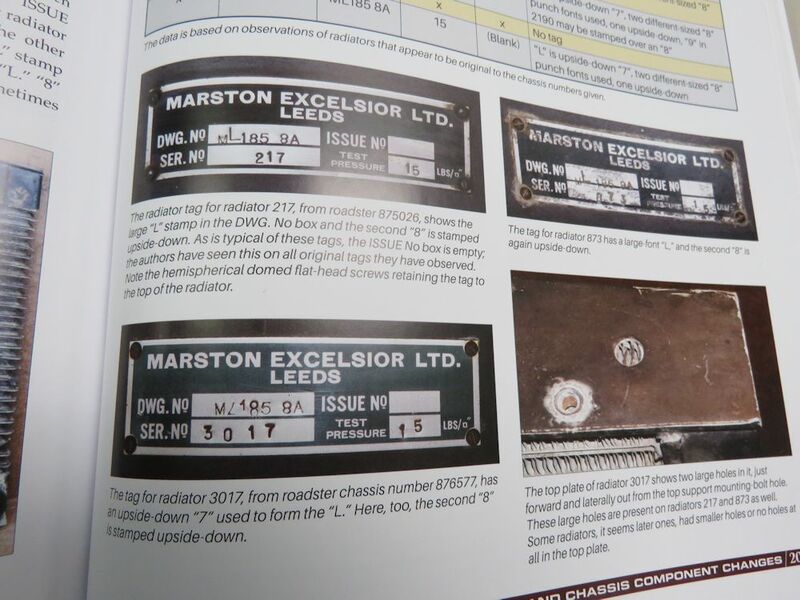 Once again using the Haddock/Mueller Originality Guide, we managed to replicate the original Marston radiator tag. 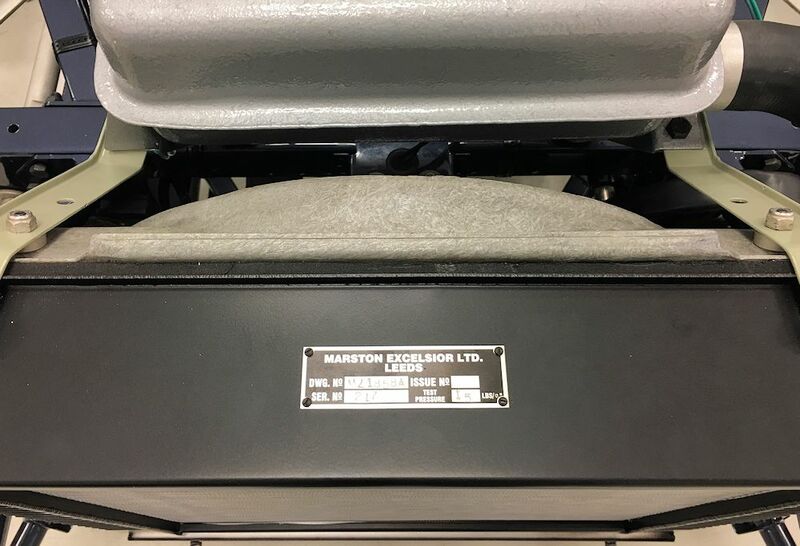 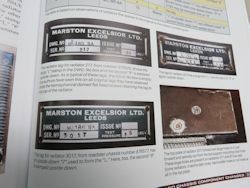 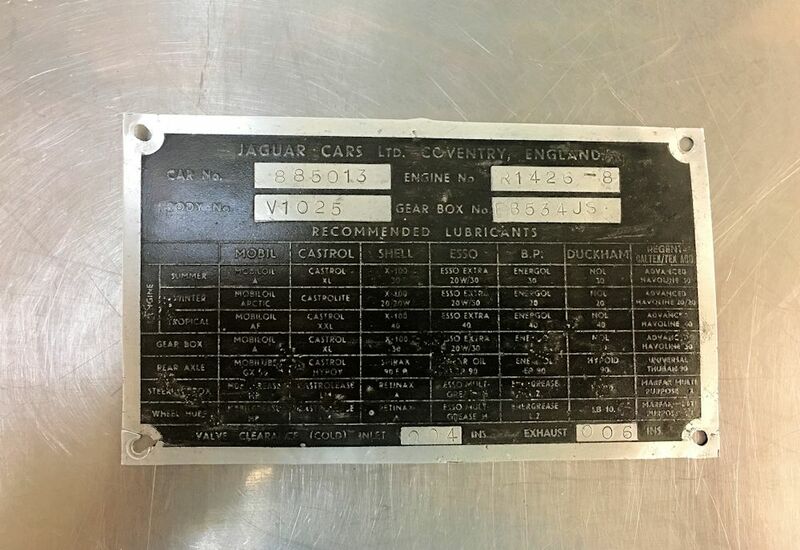 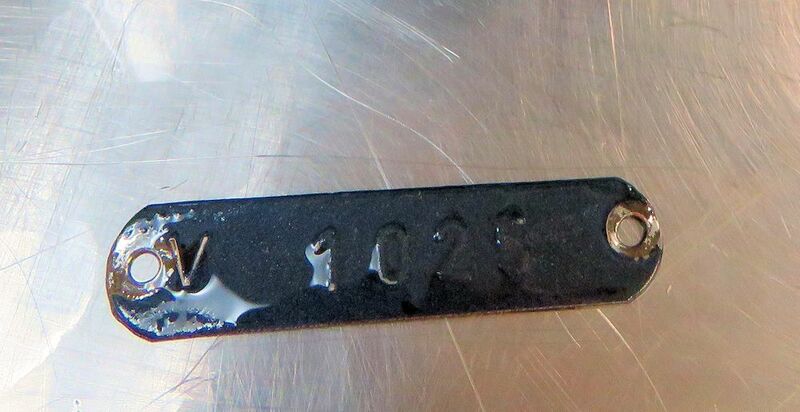 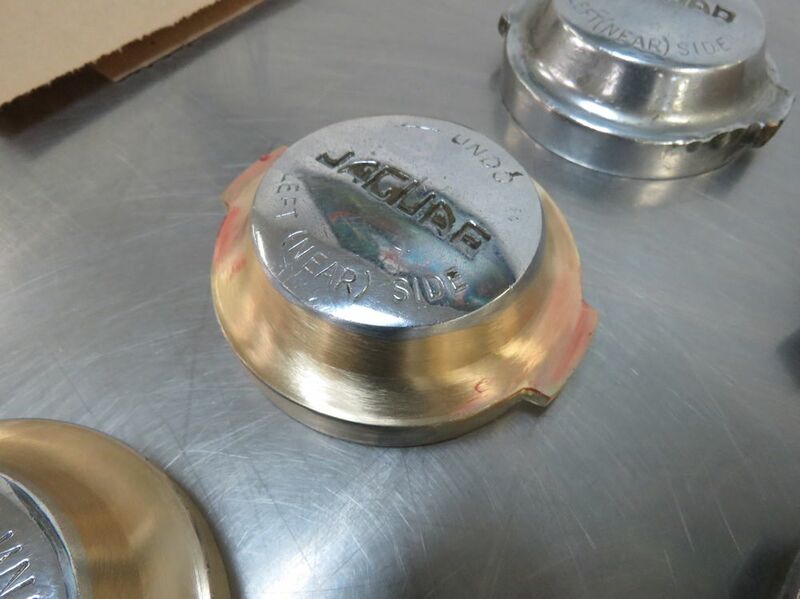 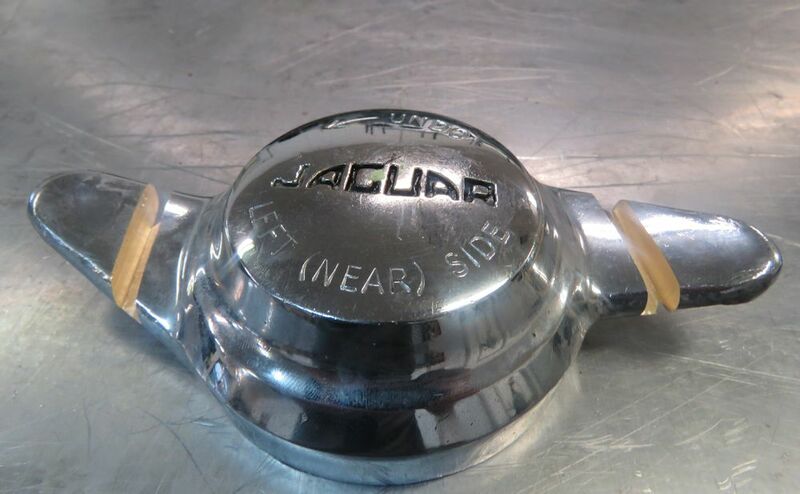 Interesting to note that Marston, the company that supplied Jaguar with their radiators, did not have a letter "L" of the same font size as the rest of the numbers and letters they used when stamping the radiator tags prior to delivery to the Jaguar factory at Browns Lane. 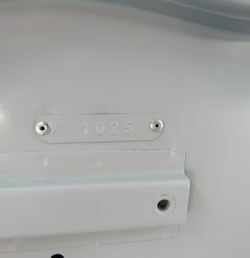 As a result, they used either a larger letter "L" or, more commonly, an upside down number "7". 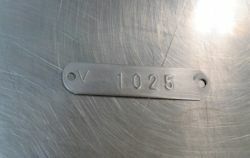 We decided to use an upside down 7 on our new tag. 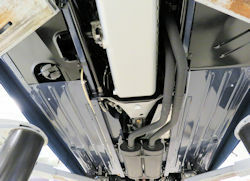 A few shots taken standing beneath the car earlier today. 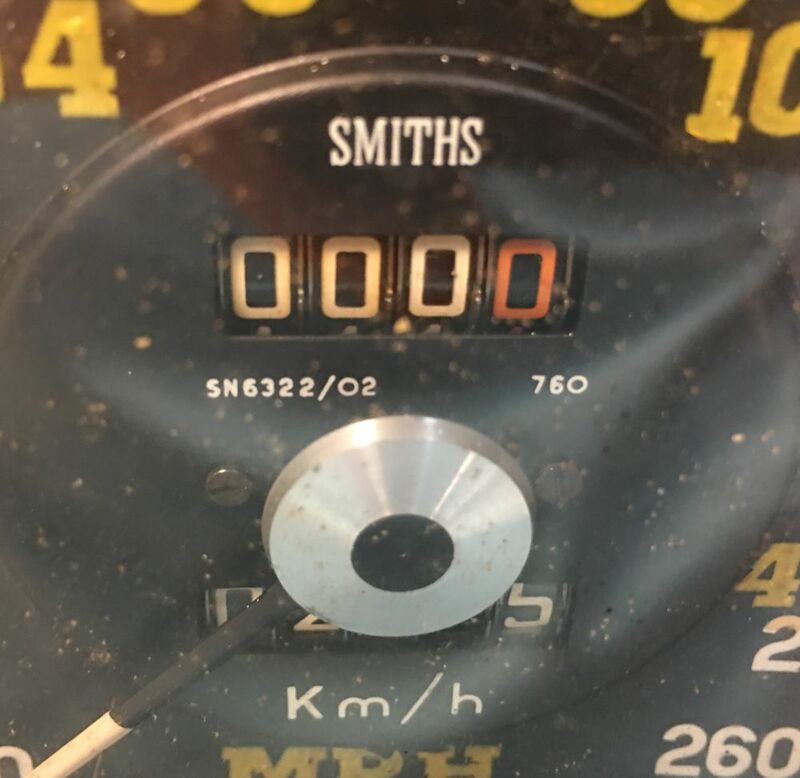 The speedometer for 885013 was always going to be a challenge. 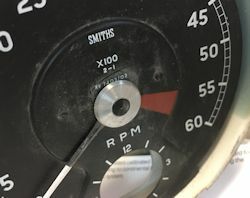 MPH stickers had been glued to the face when the car was imported from Germany to the United States and there was no way to remove the stickers without damaging the face. 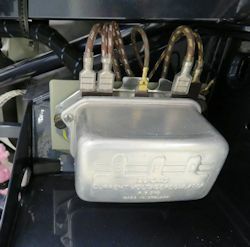 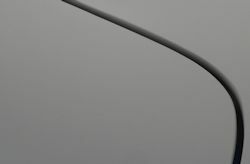 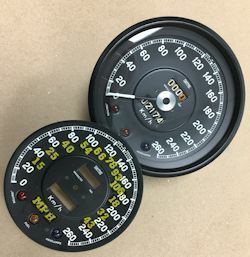 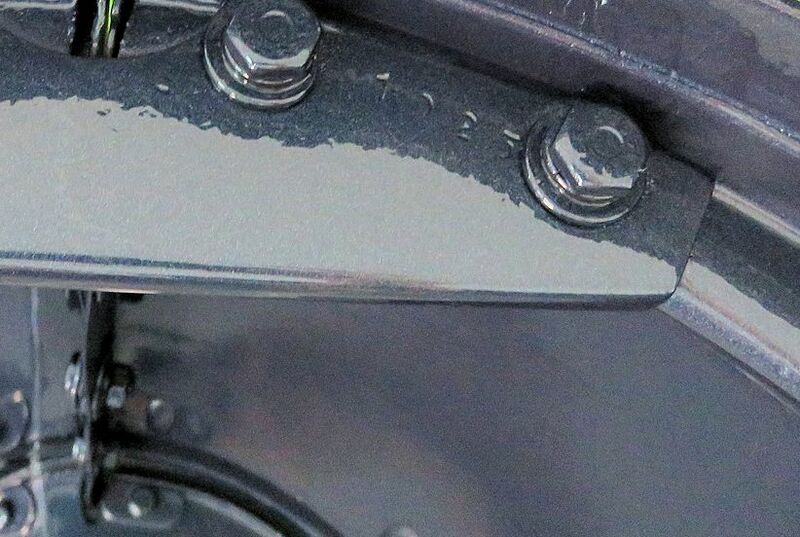 The original speedo face was marked with a serial number (6322/02) and final drive ratio code (760) that is unique to cars with a 3:31 final drive that were supplied new in Germany and Italy, it was important to us that the new face should also have these markings. 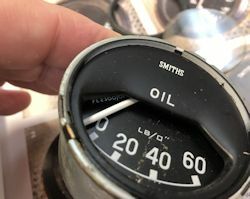 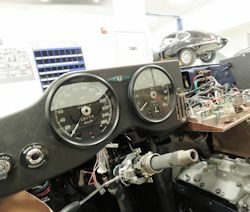 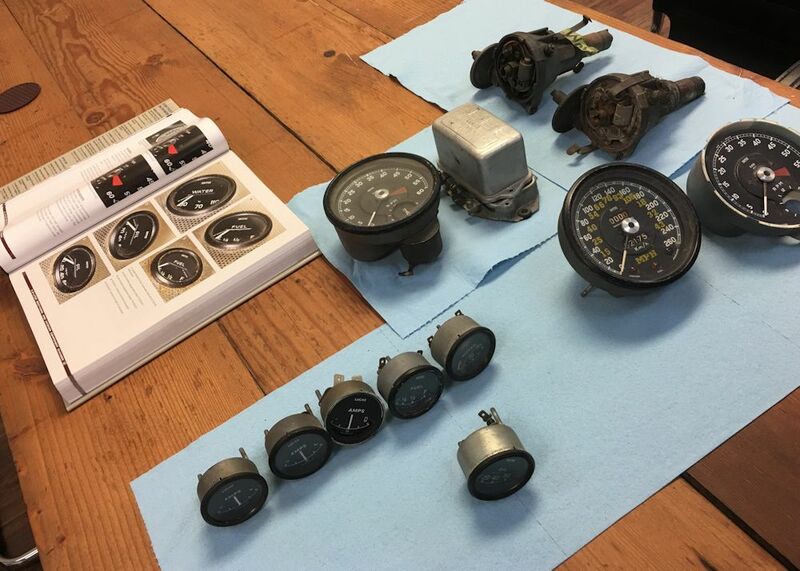 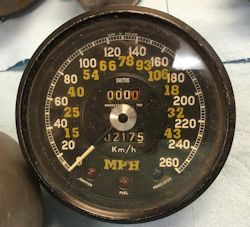 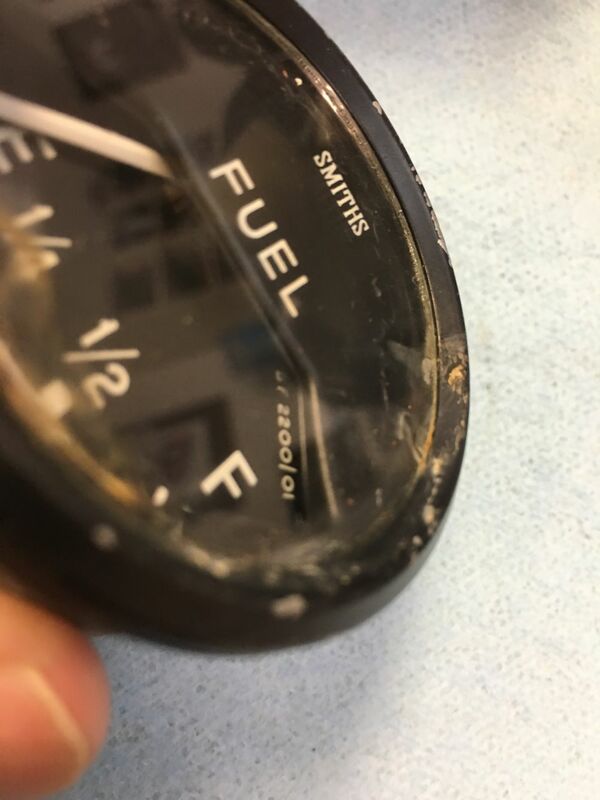 My thanks are due to Nisonger Instruments in NY who came up with a correct early, German/Italian km/ph face, and did a beautiful job restoring the speedometer for us. 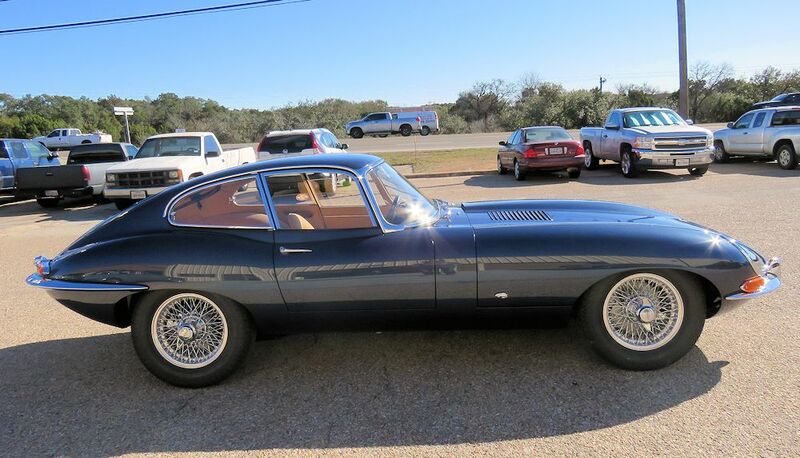 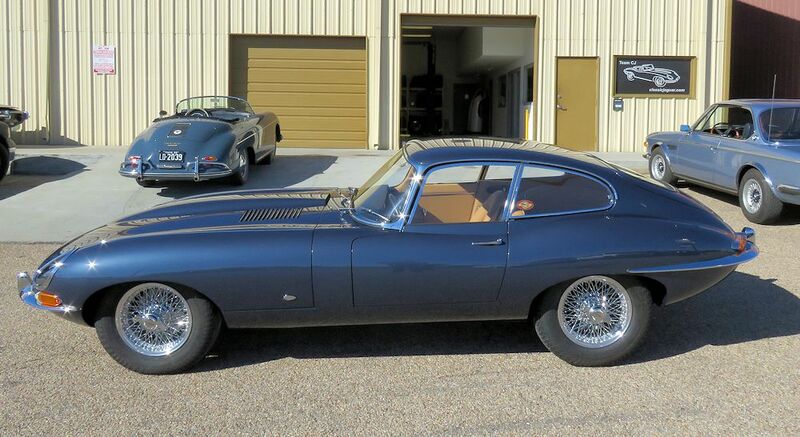 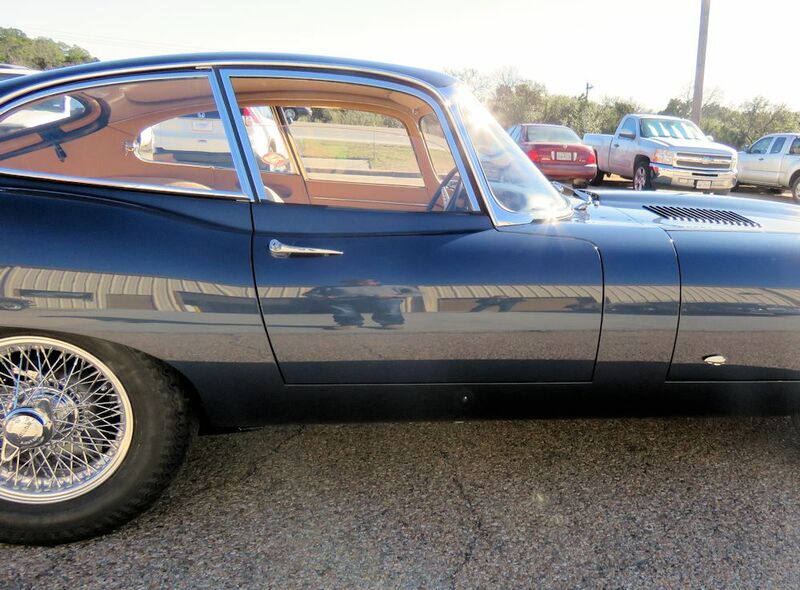 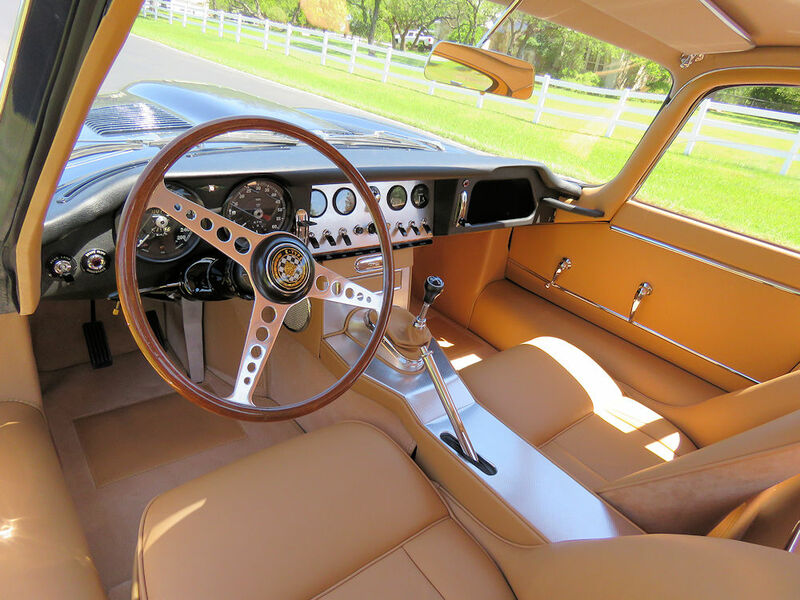 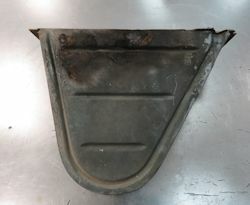 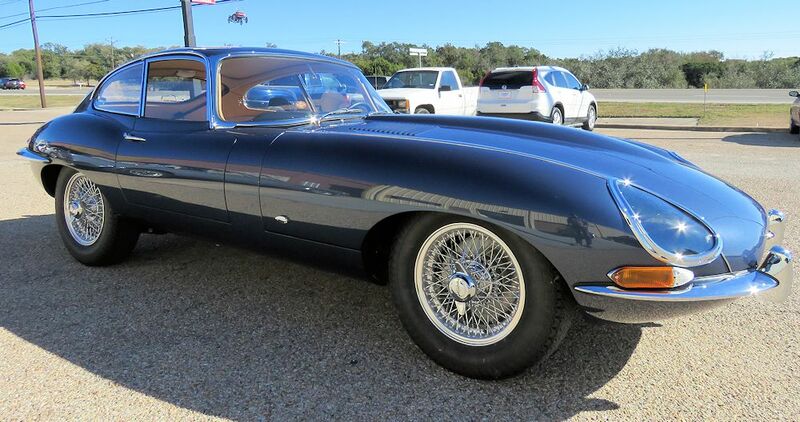 Very early E Types had what are known as 'short' seat tracks. 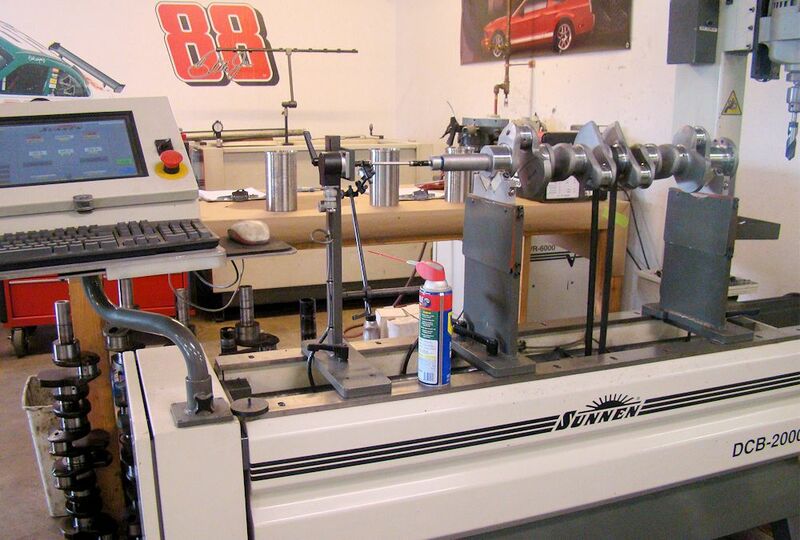 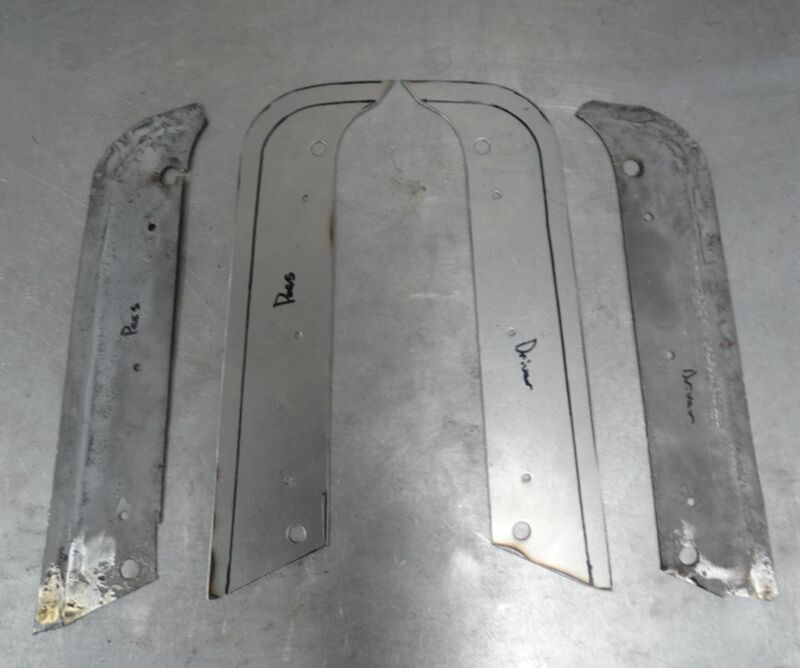 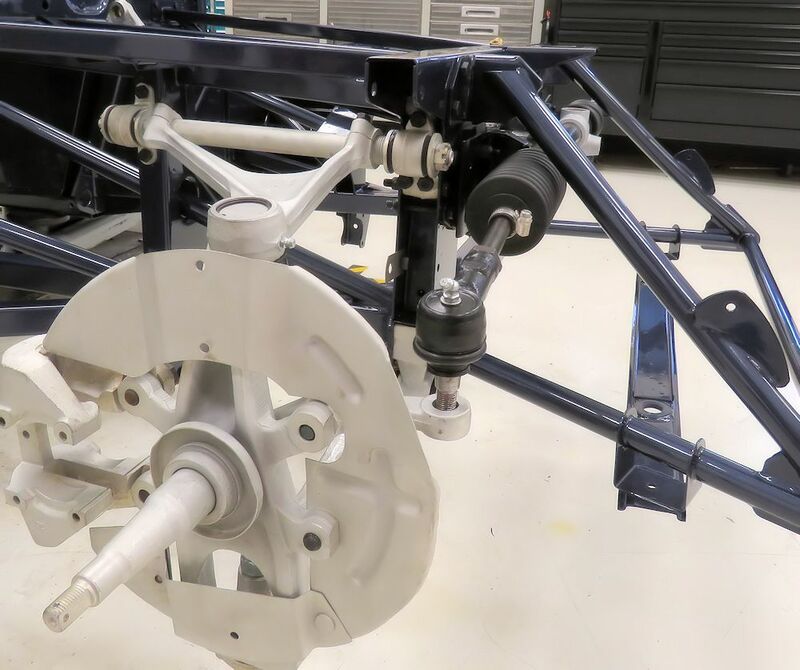 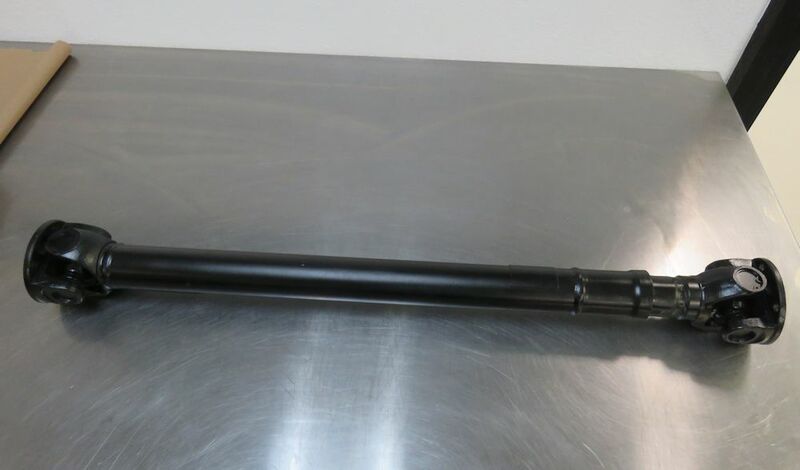 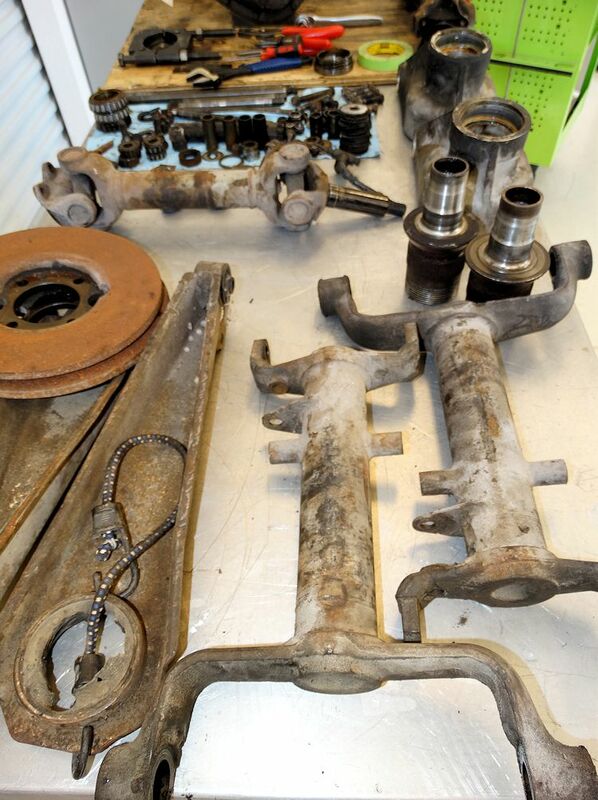 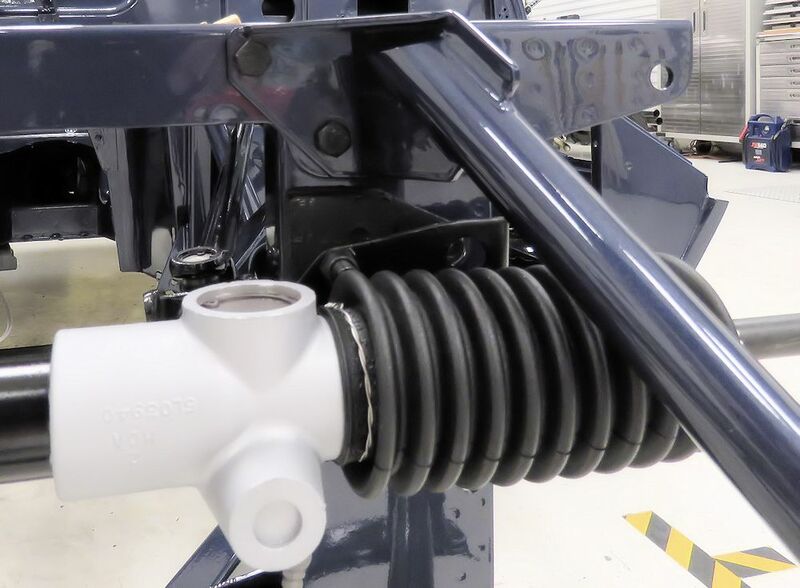 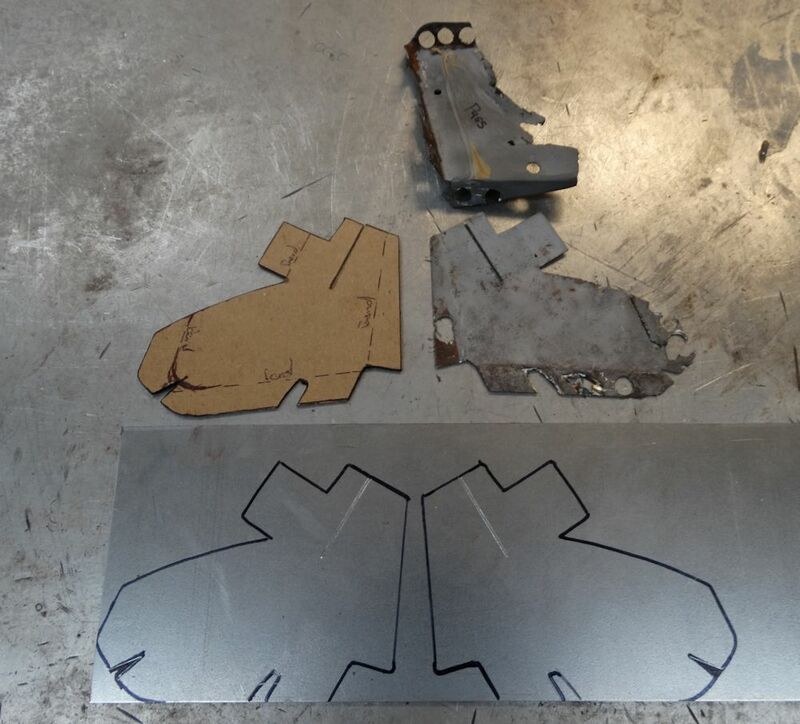 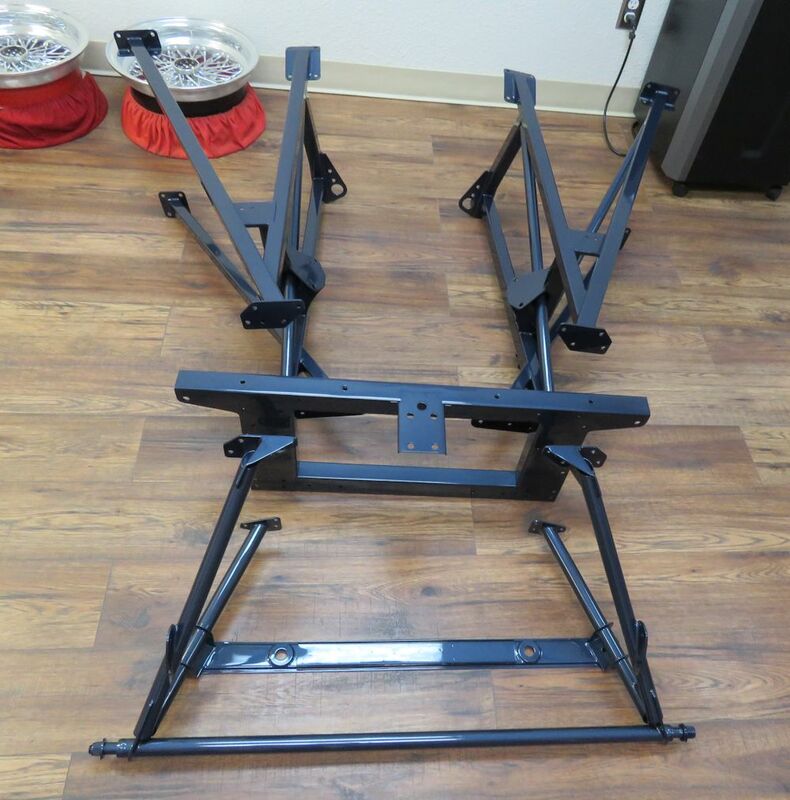 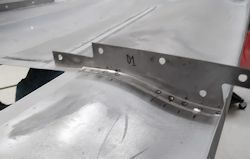 We were fortunate enough to have three out of the four seat track component pieces that were original to 885013, but even Mike Mueller couldn't assist with the missing short track we needed to complete the set. 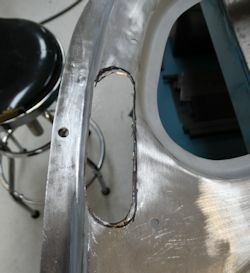 In the end we had Jake modify a later (long) seat track and he was able to replicate the short track perfectly. 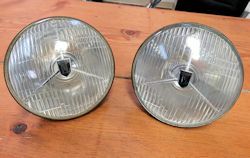 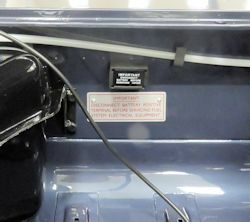 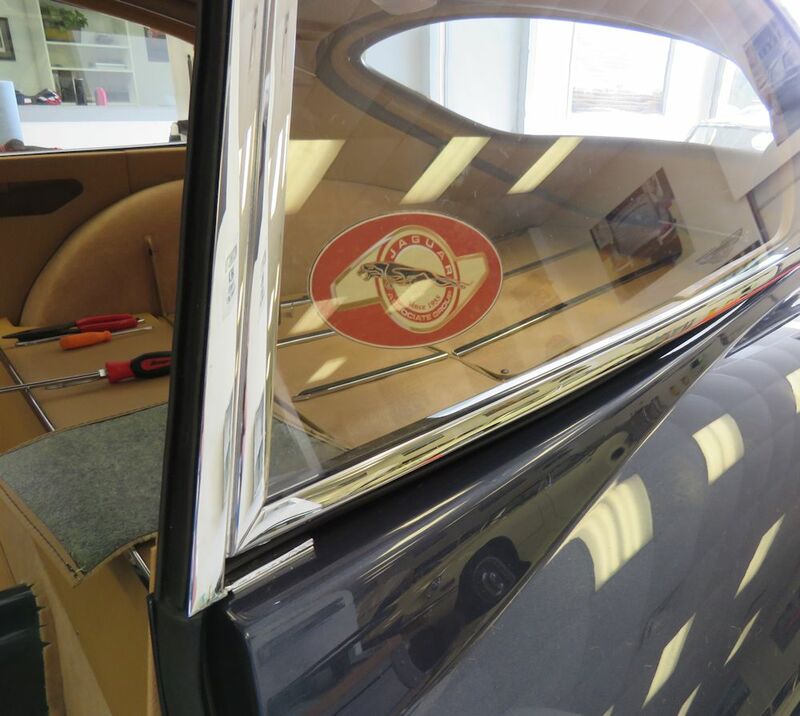 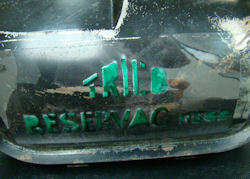 As many of you will know, the Triplex logos etched into the window and headlamp glass on classic cars are usually dated coded. 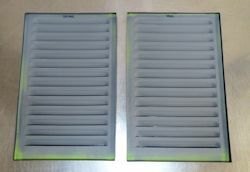 As most of the original glass for 885013 was either missing or damaged, we had no choice but to replace it with new. 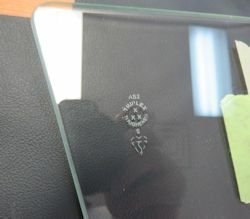 We therefore had to carefully remove the logos (by sanding and polishing) and have appropriately date coded logos etched on the new glass. Once again I am grateful to Mike Mueller who actually persuaded the only person we knew who could do the Triplex etching out of retirement to etch all of the new glass for 885013. The finished results are absolutely superb and totally indistinguishable from original etchings. 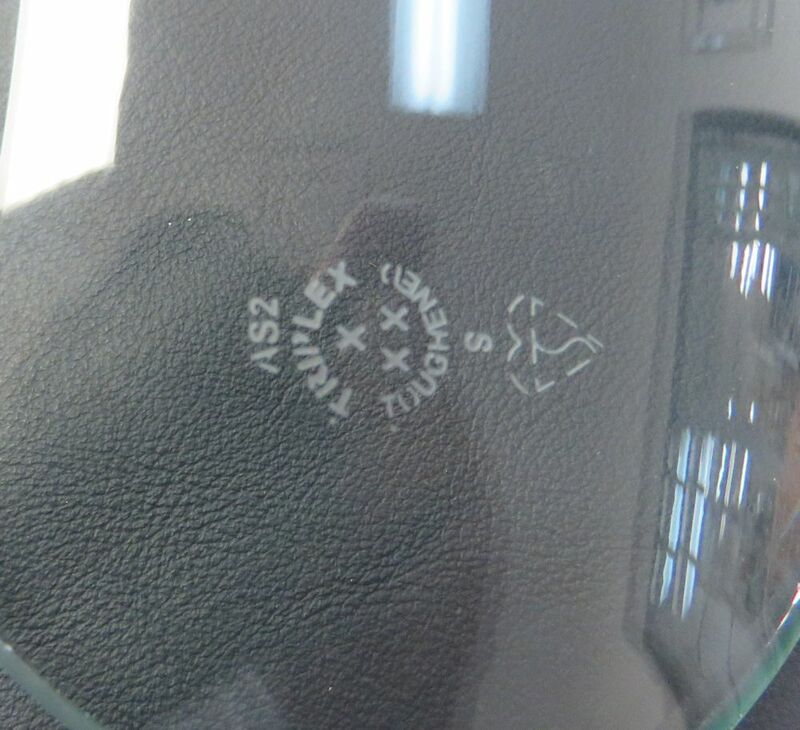 The dots above the lettering (in Triplex) and beneath the lettering (in Toughened) are the indicators of the date. 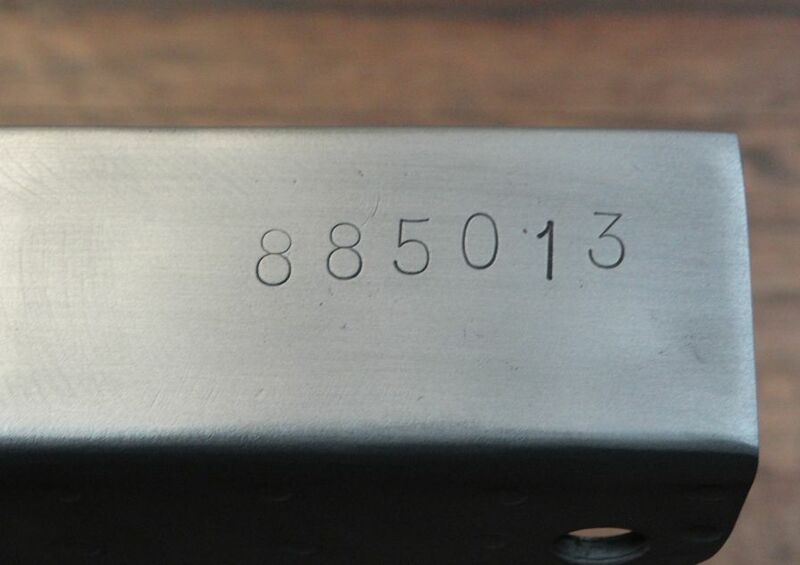 In the case of 885013, the dot above the "T" in Triplex denotes the first quarter of the production year, and the dot beneath the "T" in Toughened denotes the year in a particular decade. Accordingly, all of the glass for 885013 is date coded for the first quarter of 1961. 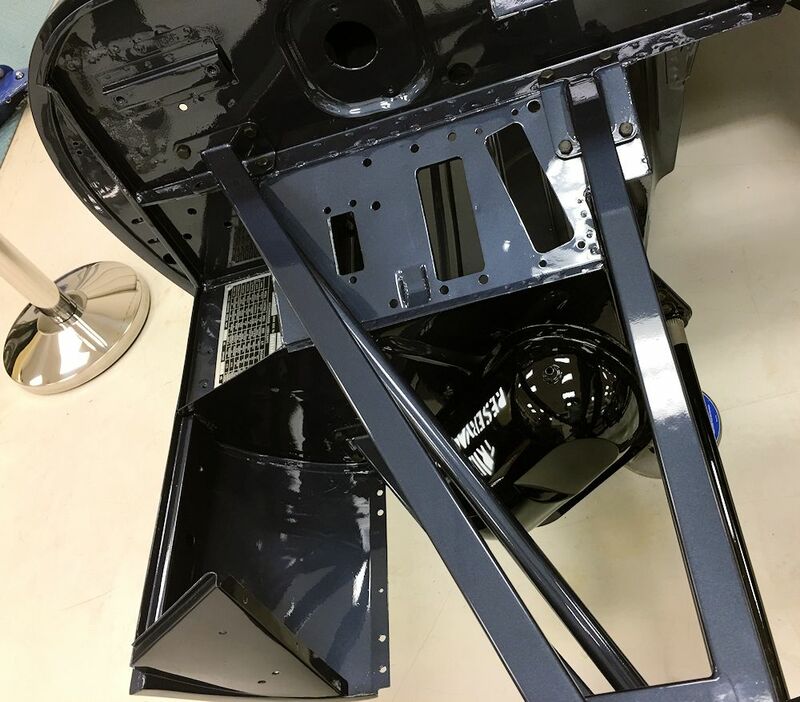 Lots of progress with the assembly of 885013. 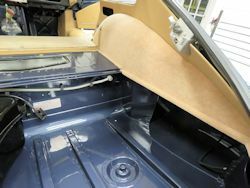 Engine bay filling up rapidly! 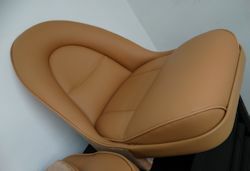 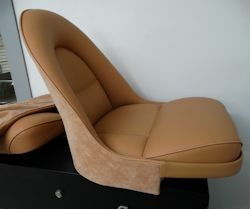 Time to get the interior installation underway. 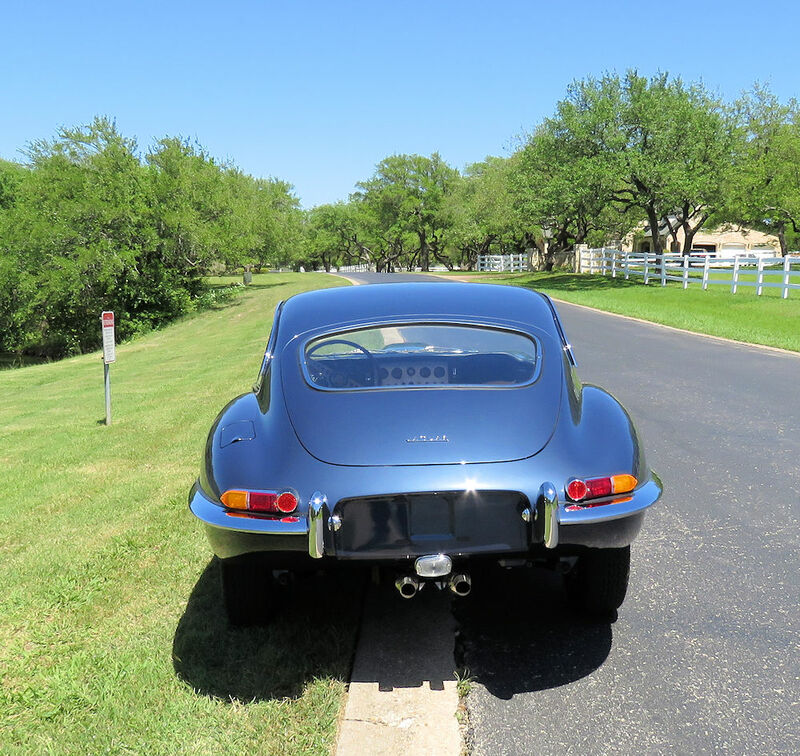 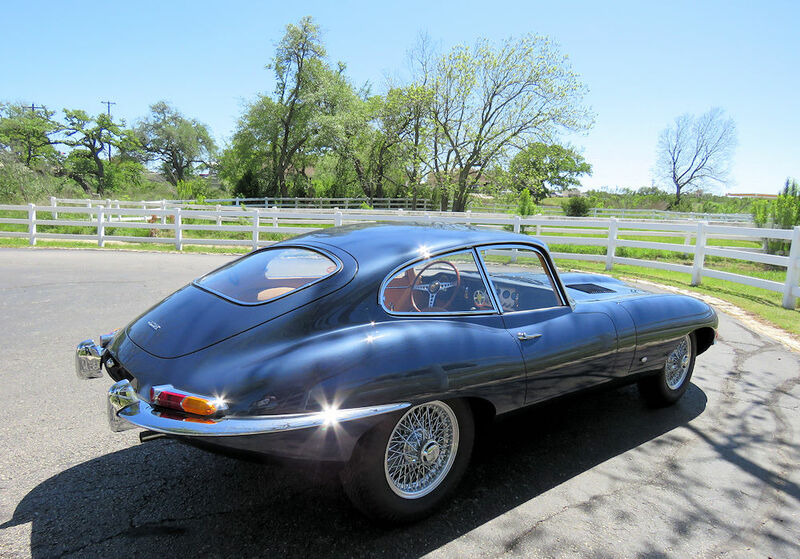 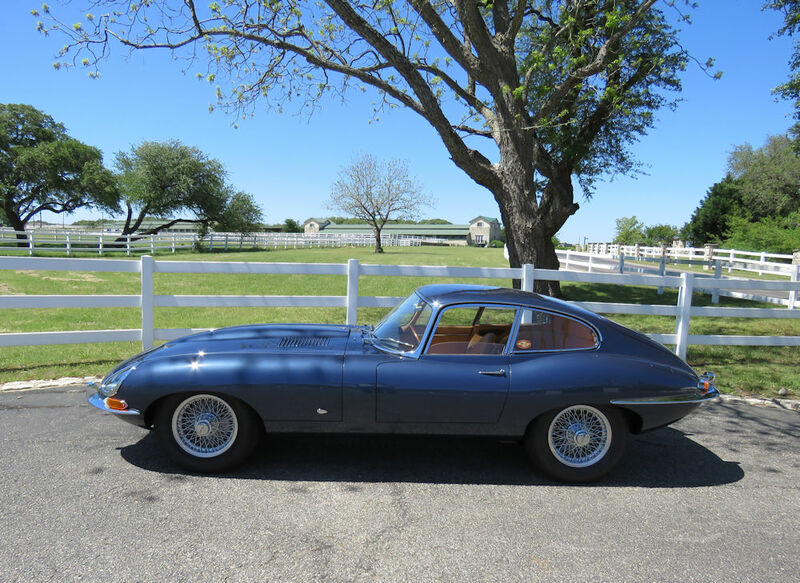 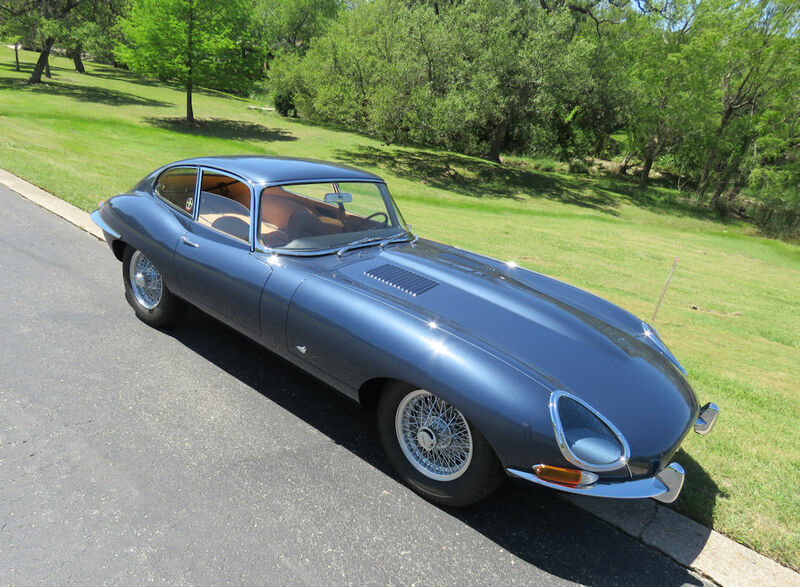 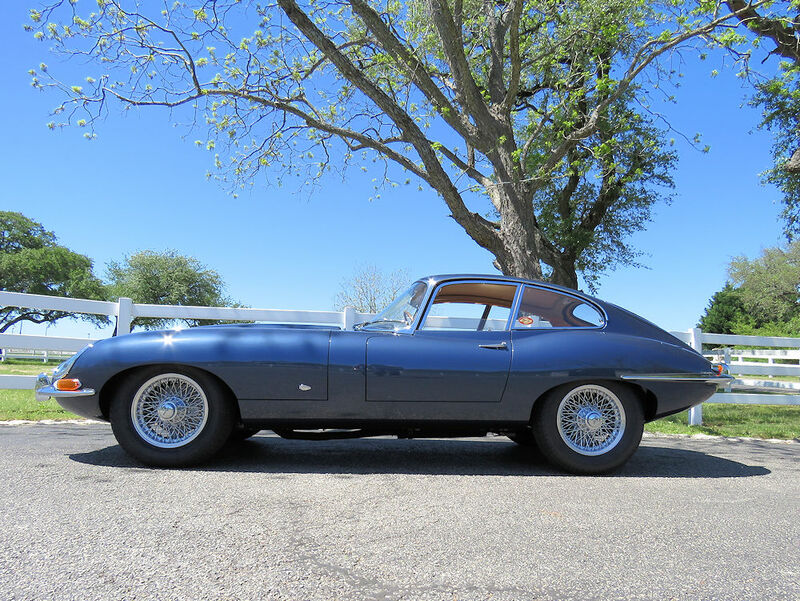 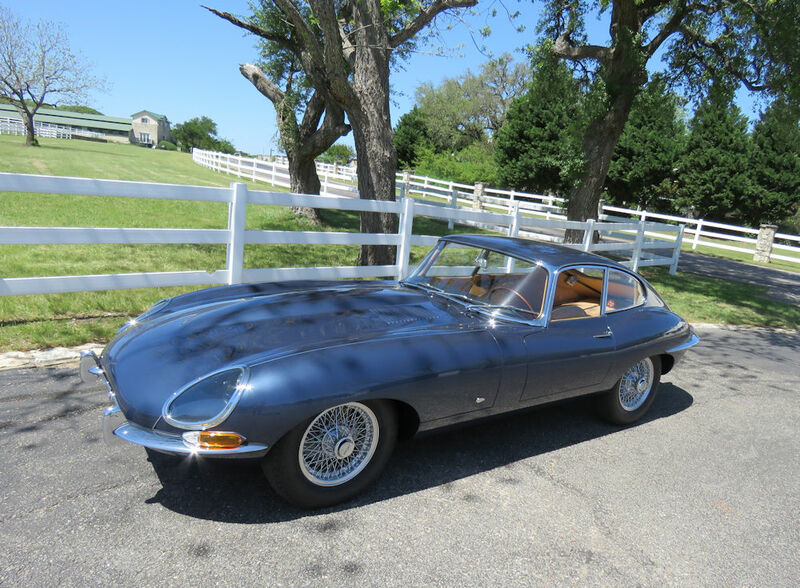 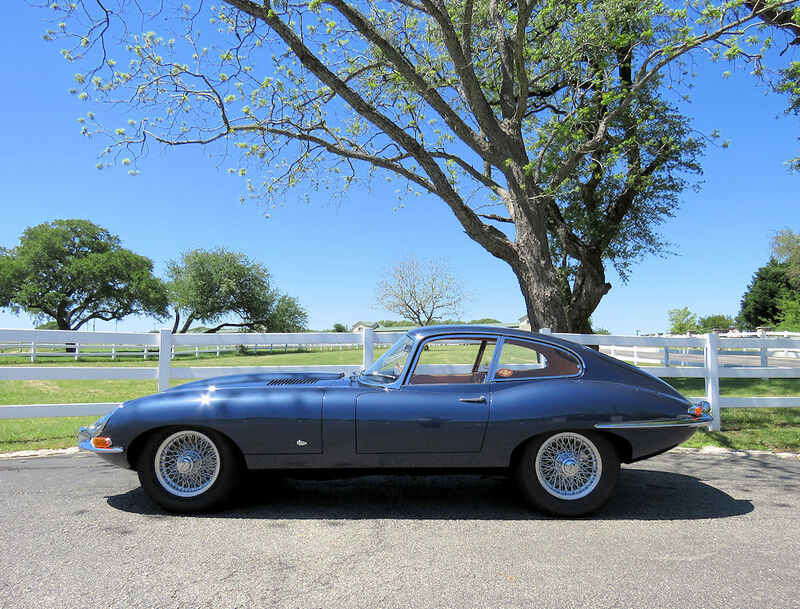 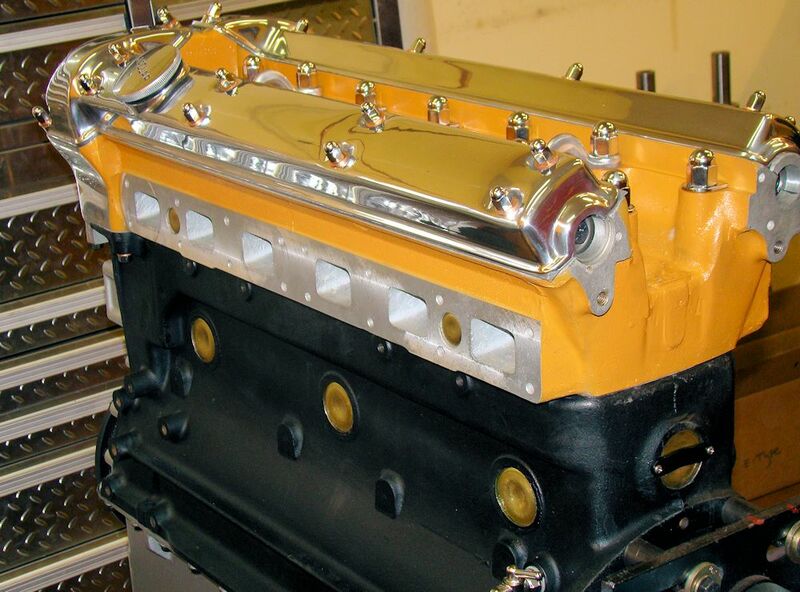 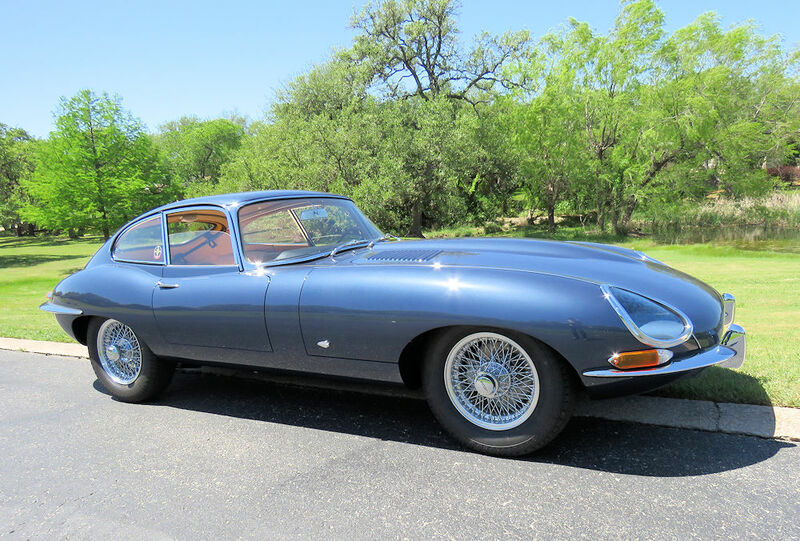 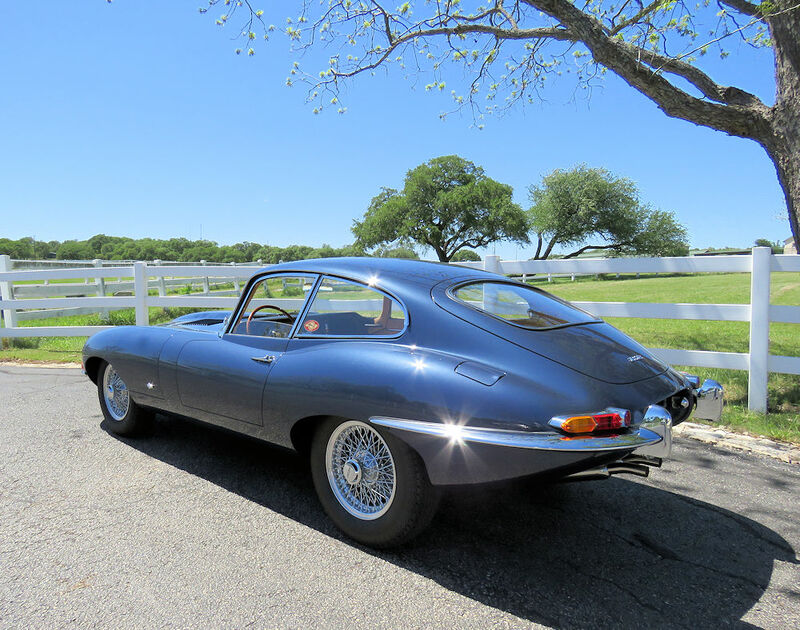 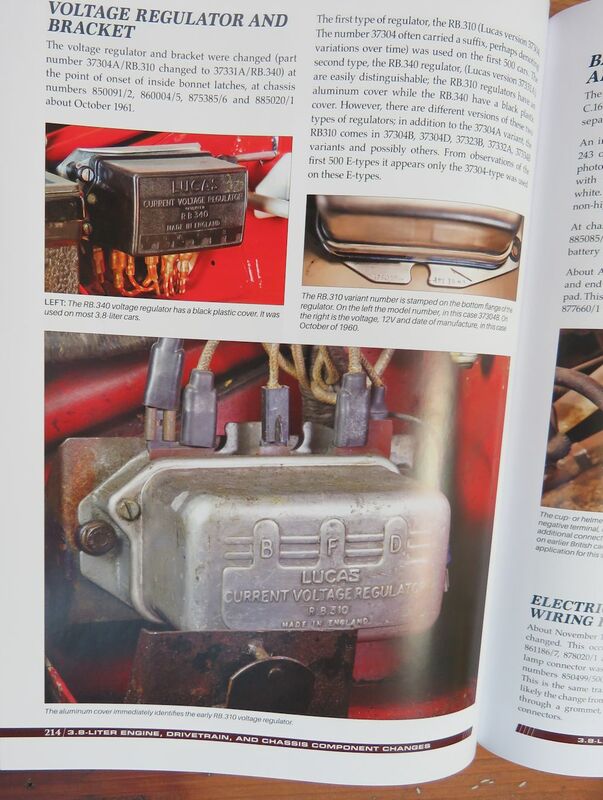 I have previously mentioned that the Haddock/Mueller 6 Cylinder E Type Originality Guide has been an invaluable resource for me as I strive to make this car as correct and true to the original as possible. 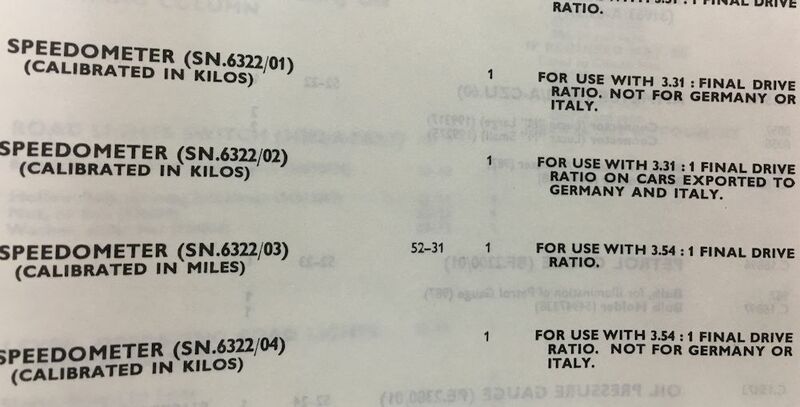 Interestingly enough, 885013 is mentioned and referenced no fewer than nine times in the book. 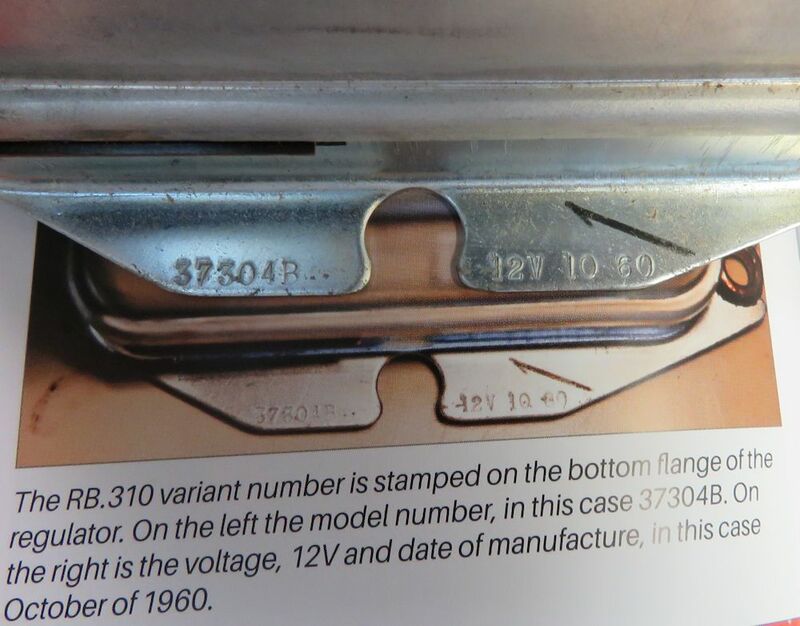 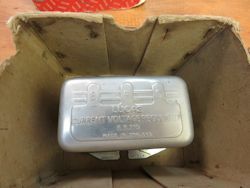 Having researched precisely which voltage regulator I needed using the Haddock/Mueller book, I was able to purchase a brand new old stock RB310 unit with the correct E Type specific model number of 37304B, and a highly appropriate date stamp of 10/60, from Dr. Mike Mueller himself. In fact, it is the actual voltage regulator used as an example of the original type in the book, photographed on page 214. 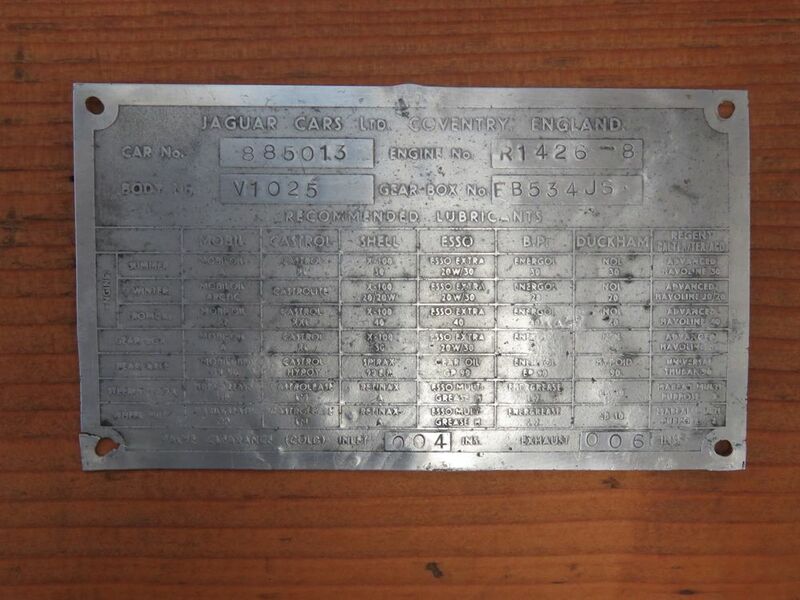 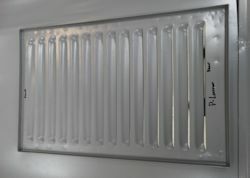 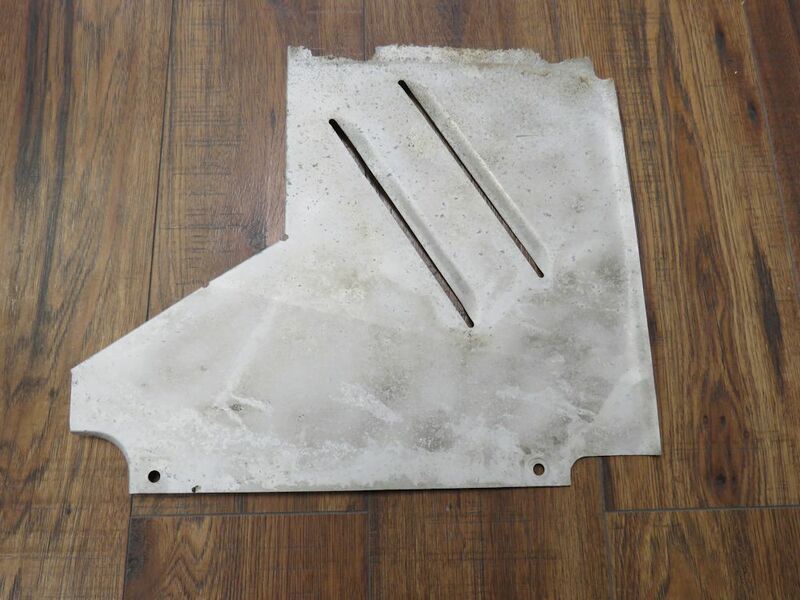 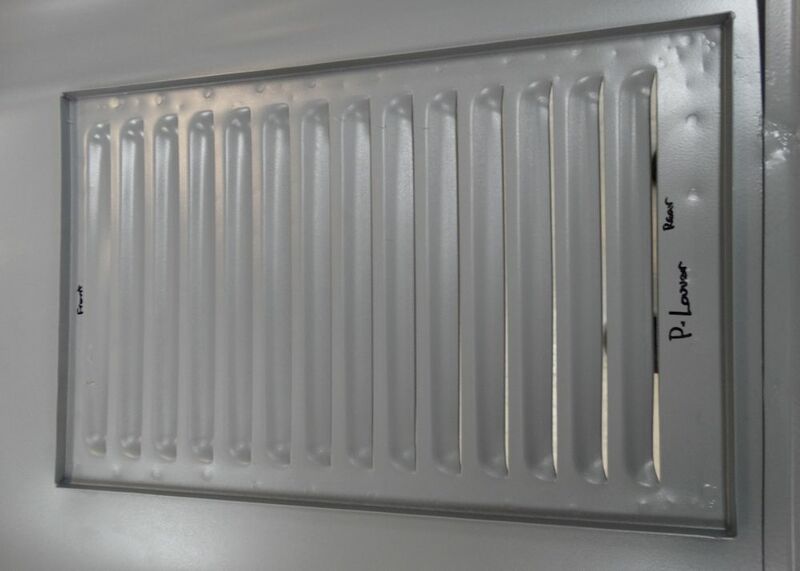 As rough as the original data plate for 885013 obviously was (see first image below), we felt it was important that it should be retained, if at all possible. The following sequence of photos show the steps we took to achieve our goal. 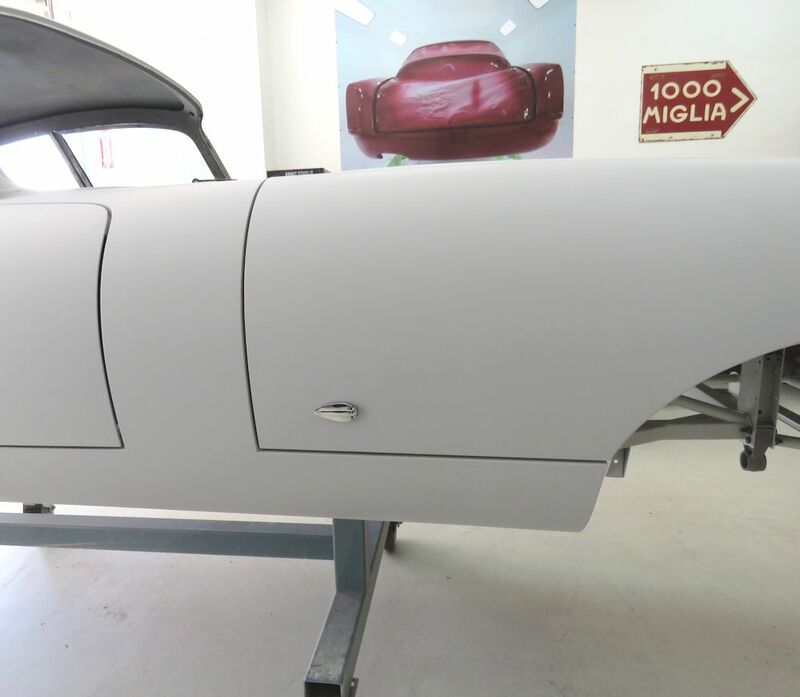 With Gerardo's sanding and buffing of the paintwork now complete, Jake has begun the process of installing and adjusting the doors. 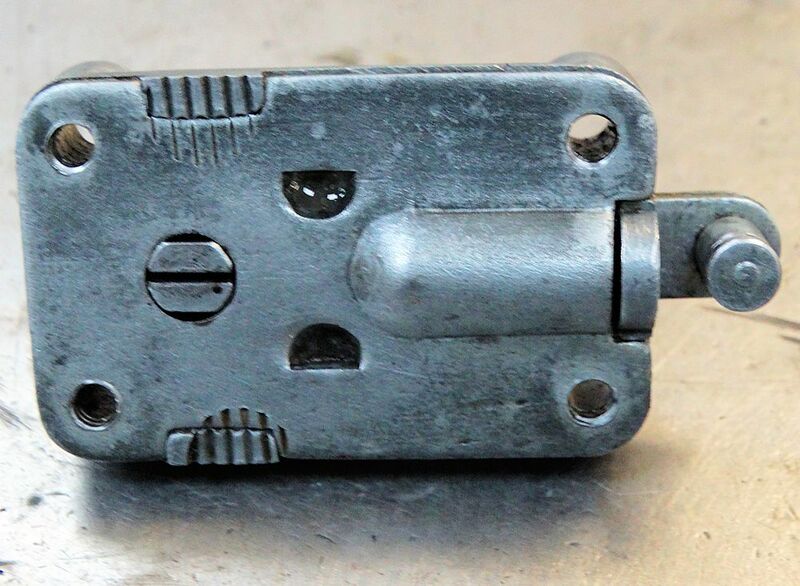 Interesting to discover that the unused German/Swiss knock-off tool kindly supplied by Bruce Cox in Canada is actually clear Cad plated. 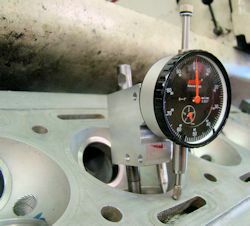 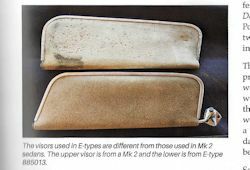 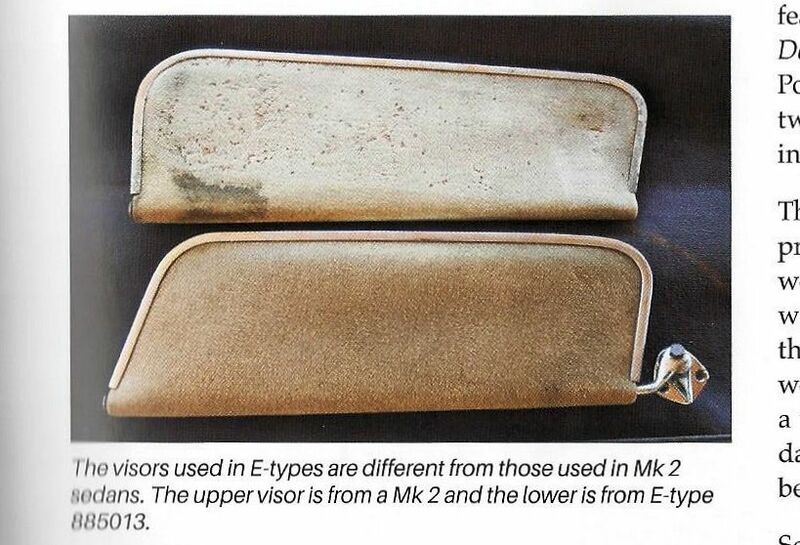 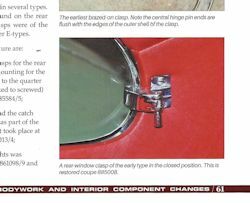 The excellent Haddock/Mueller E Type Originality Guide highlights the differences between early and late E Type gauges. 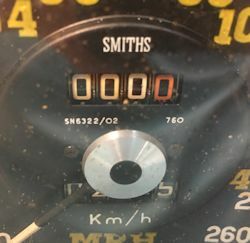 This morning I used it as a reference to confirm that our gauges are correct (and in most cases original) to 885013. 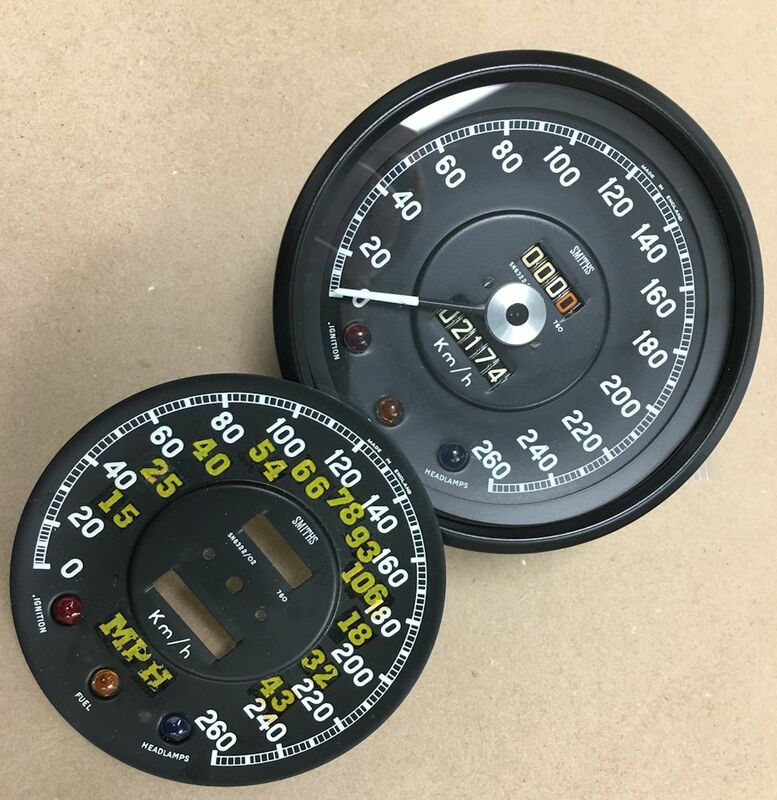 According to the Spare Parts Catalogue (J30), the serial number of our speedometer was exclusively used in E Types supplied to the German and Italian markets (with 3.31 final drive ratio). 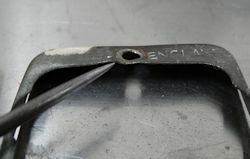 this mint condition German/Swiss knock-off tool! 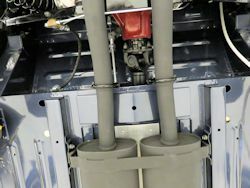 which are modified US spec knock-offs? 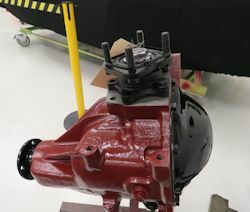 I am pleased to report that 885013 is now back on its wheels! 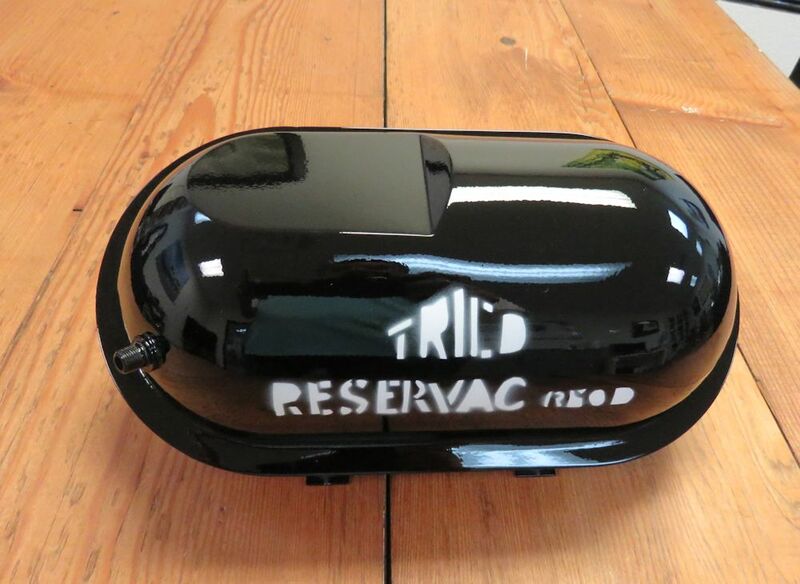 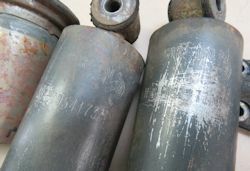 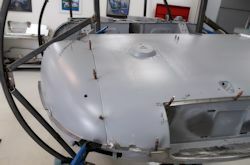 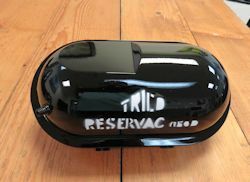 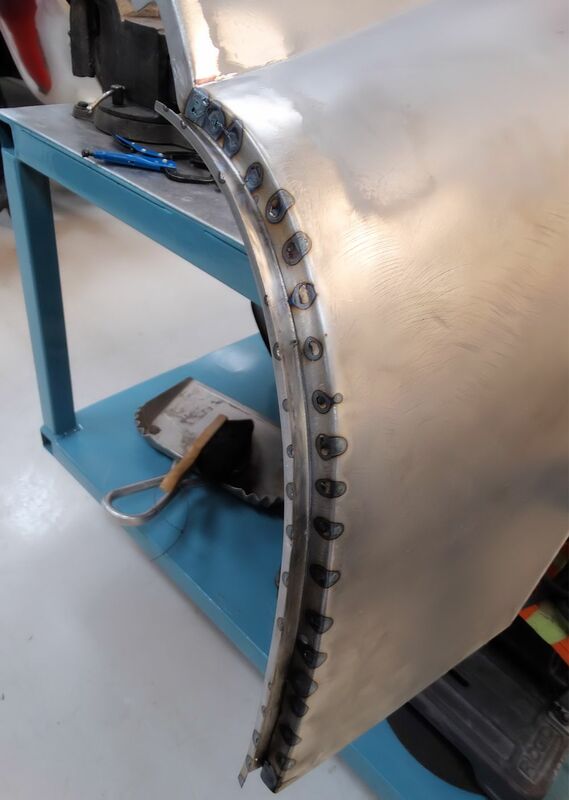 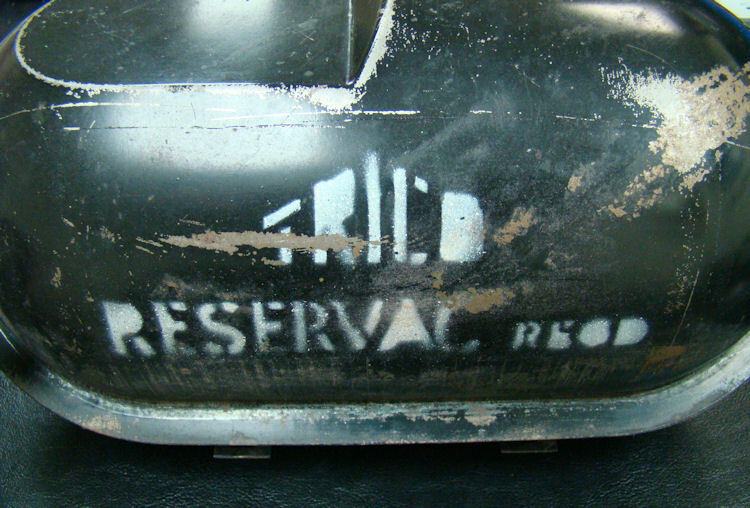 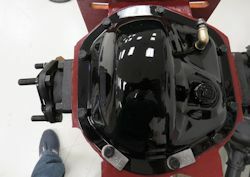 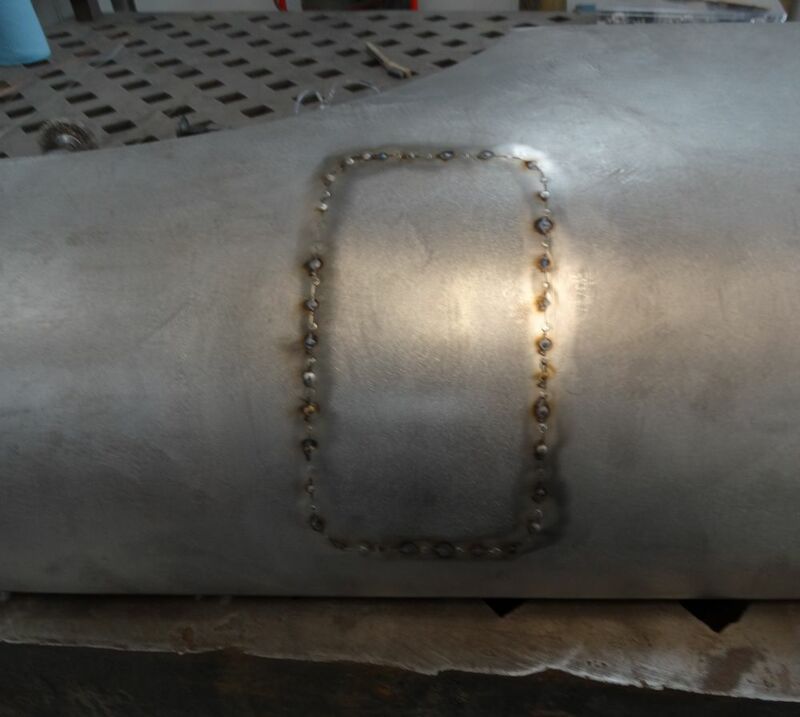 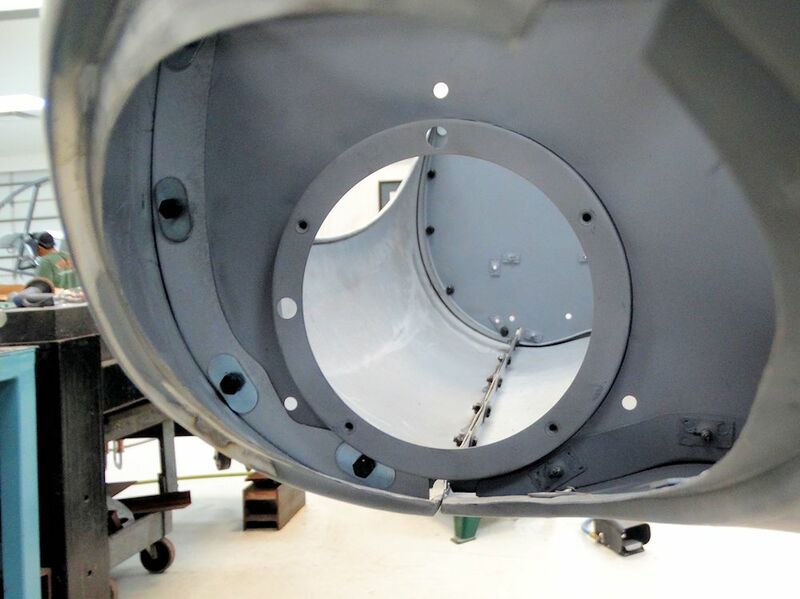 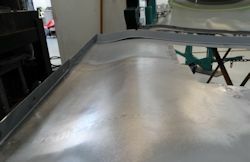 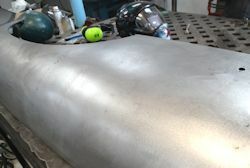 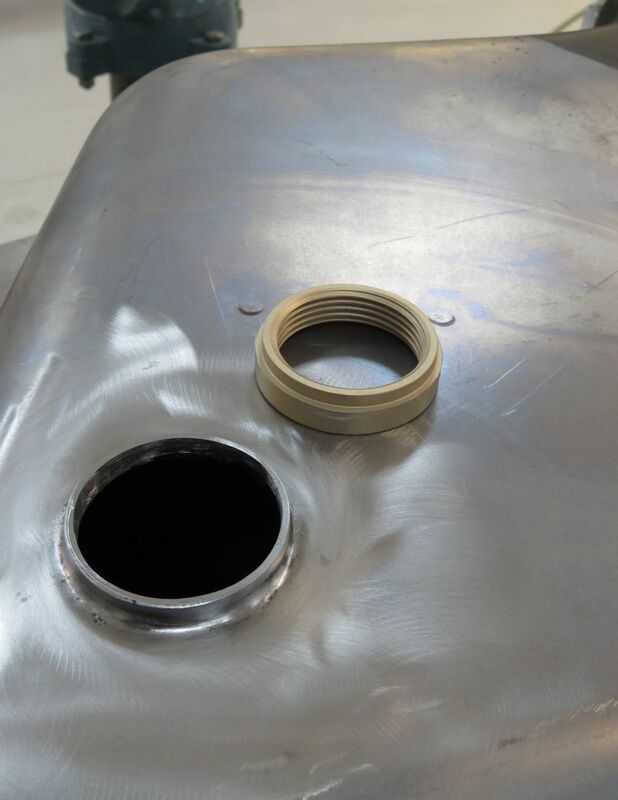 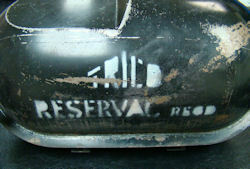 The following sequence of photographs also shows the restoration of the brake vacuum tank, including reproduction of the 'Trico Reservac' label. 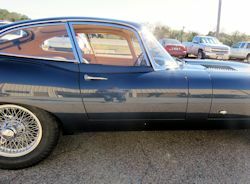 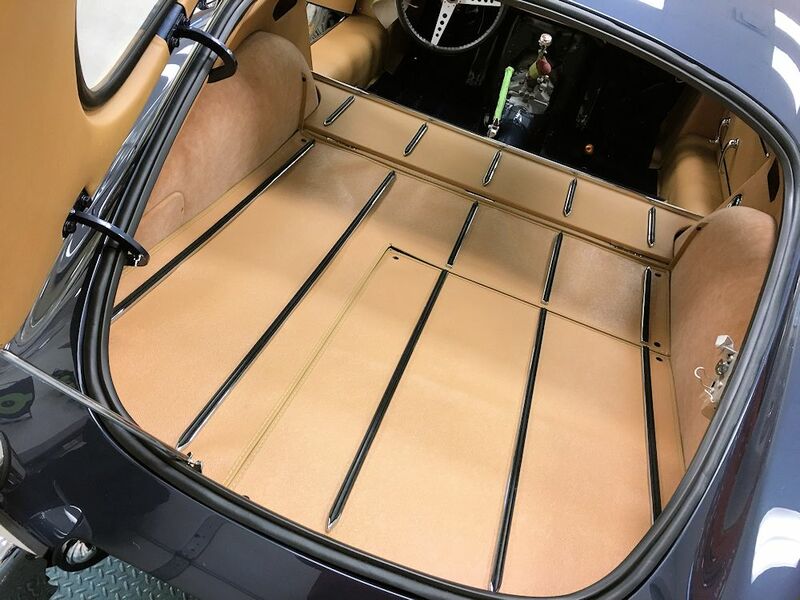 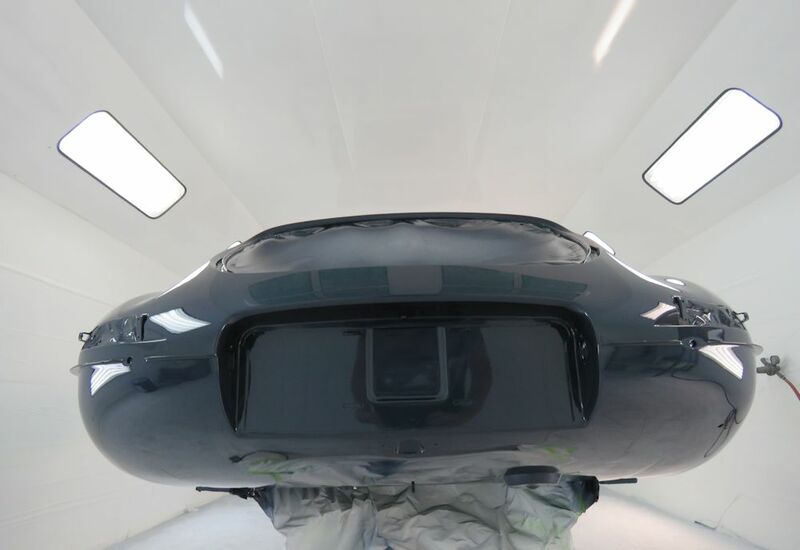 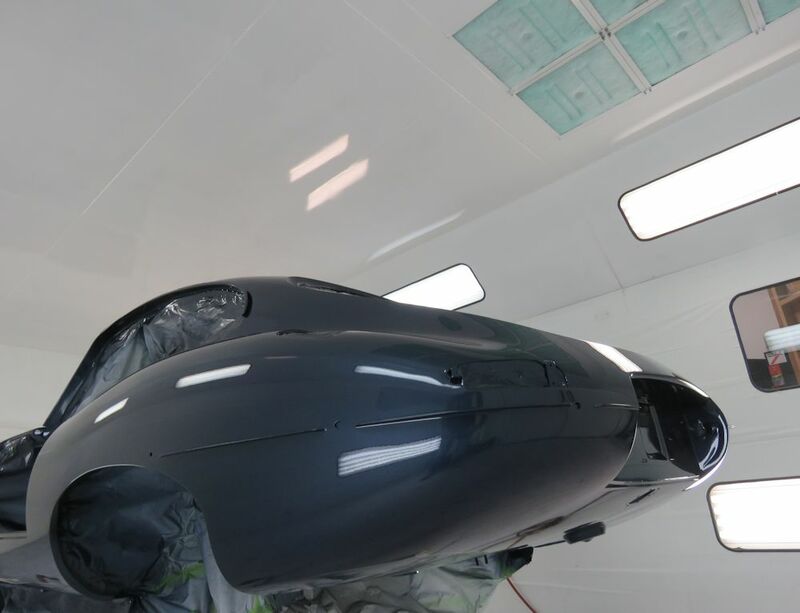 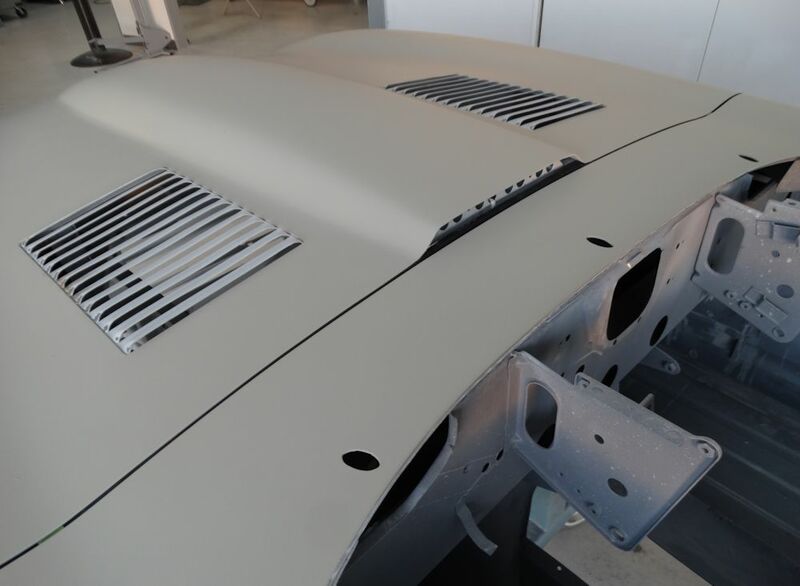 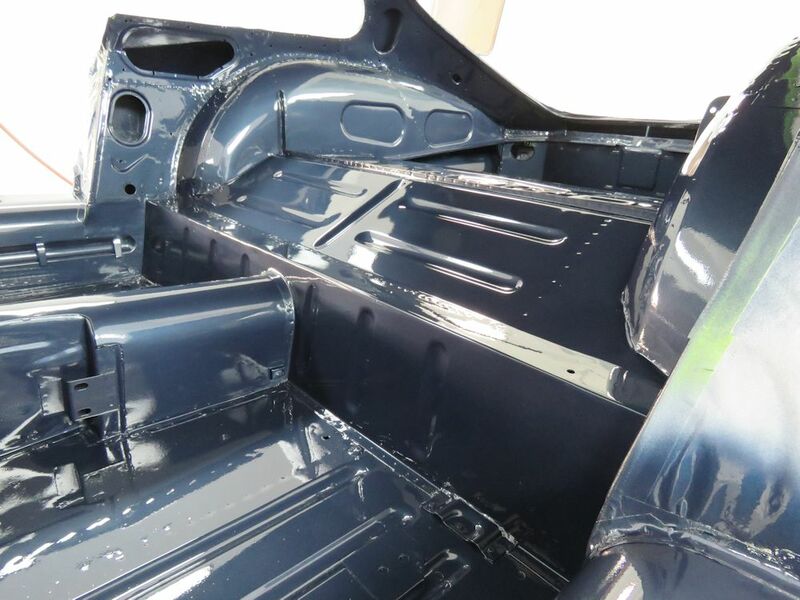 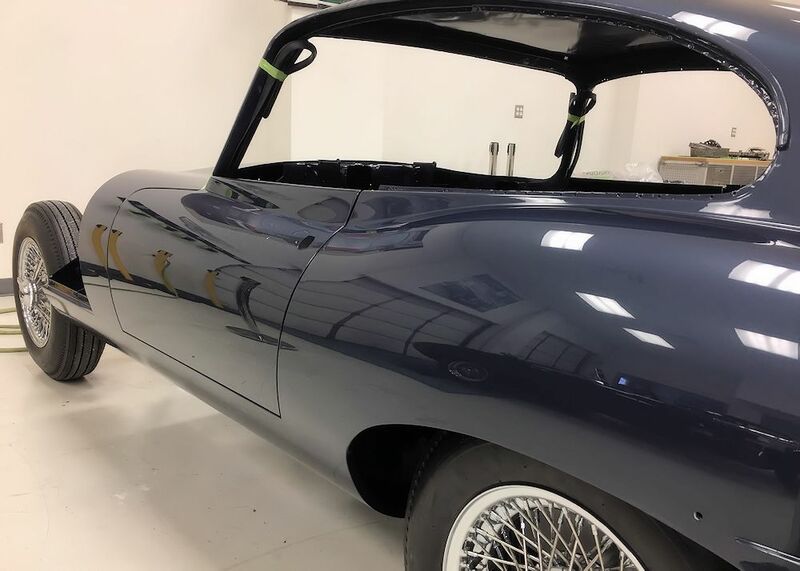 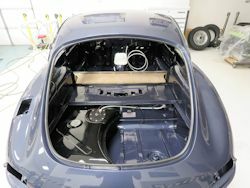 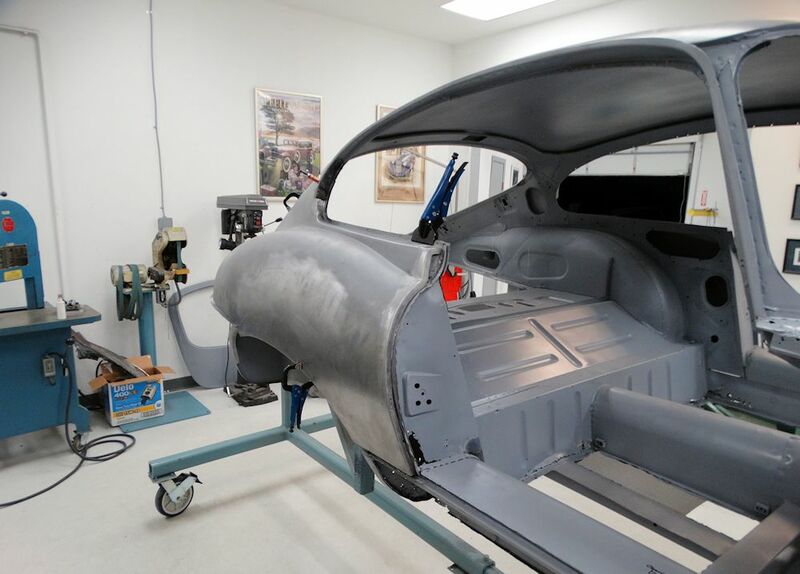 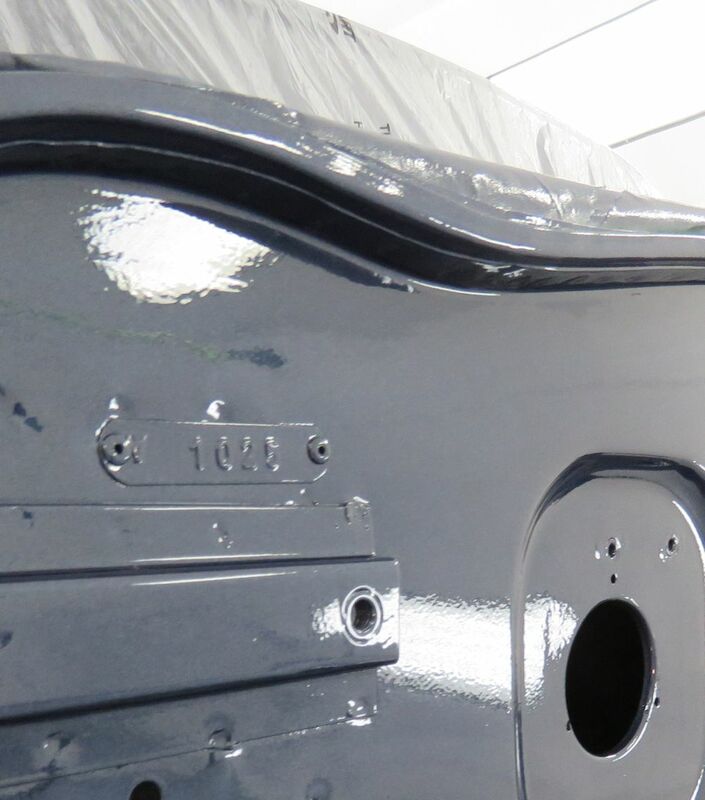 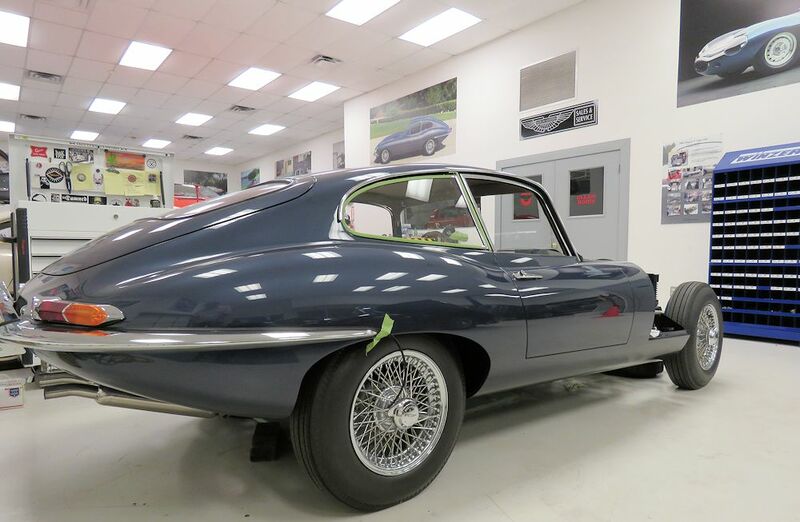 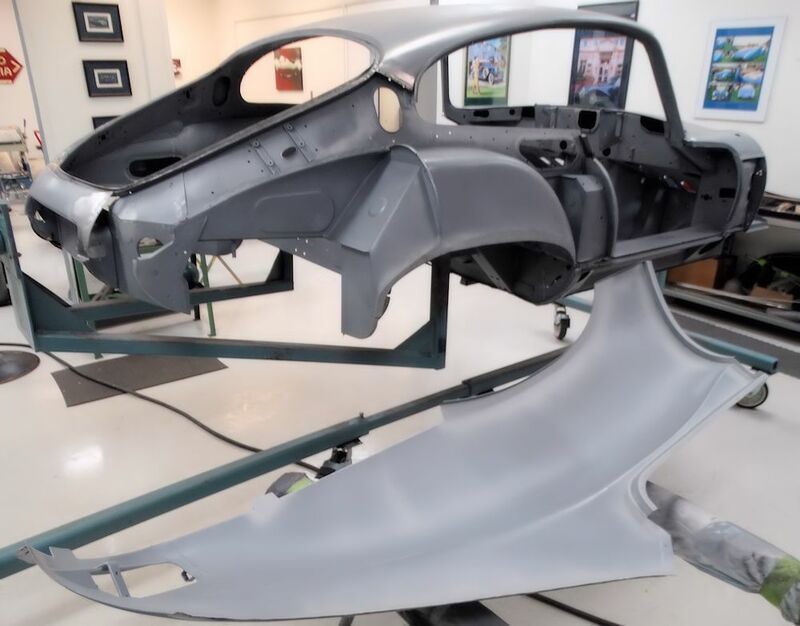 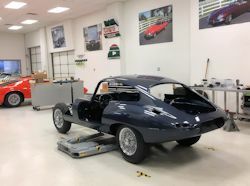 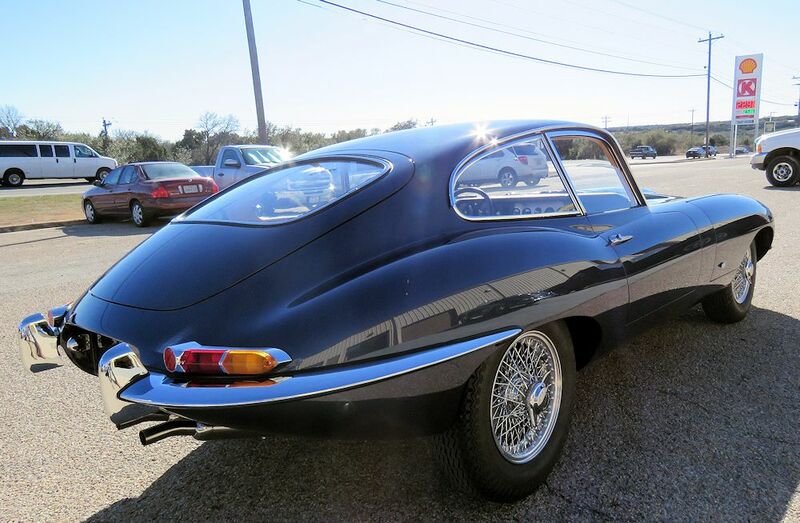 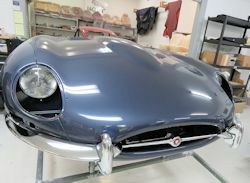 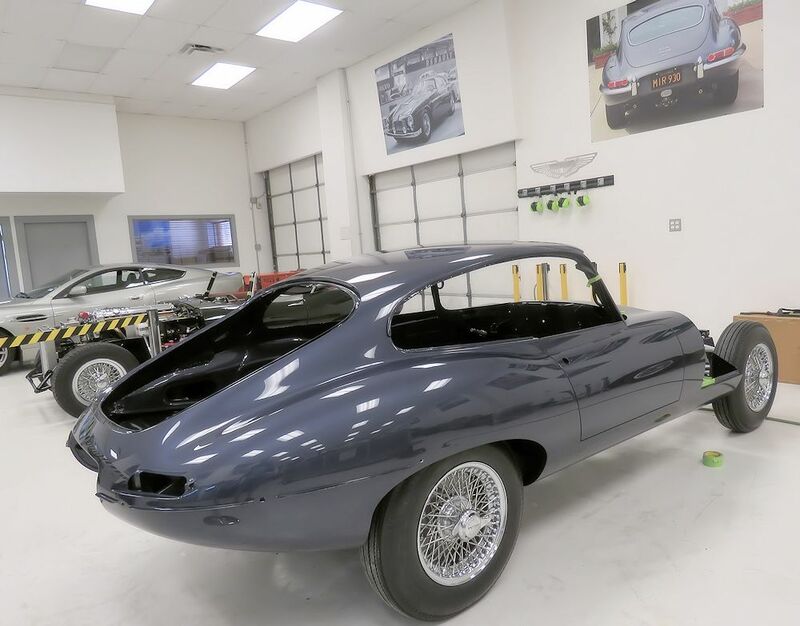 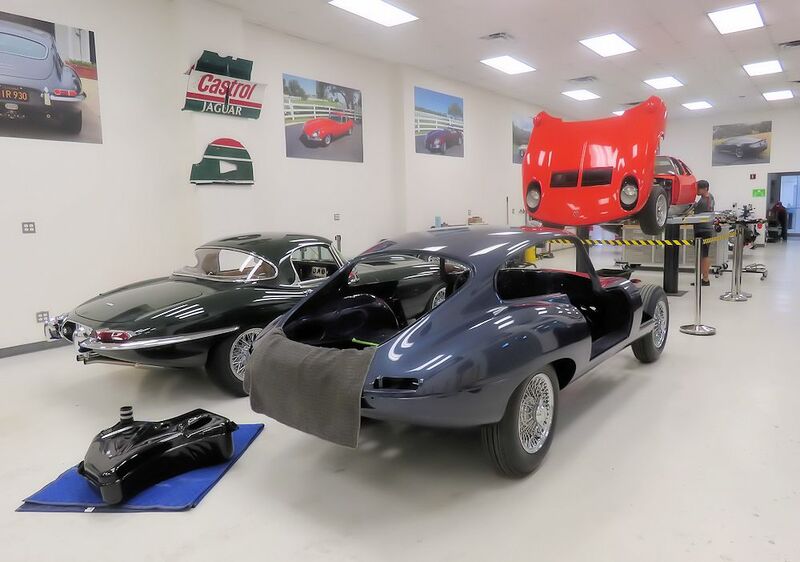 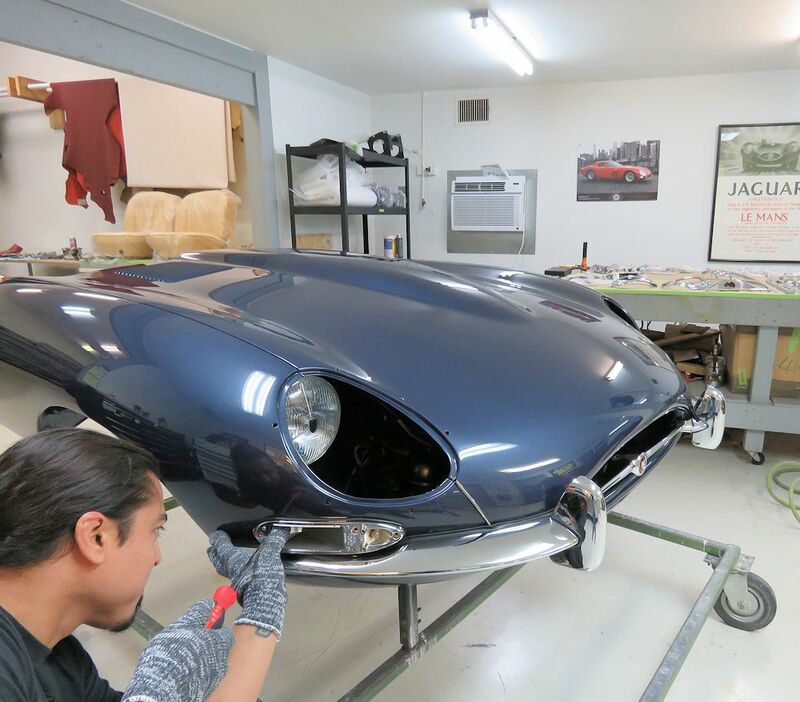 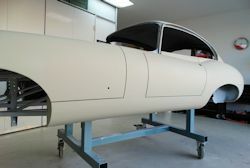 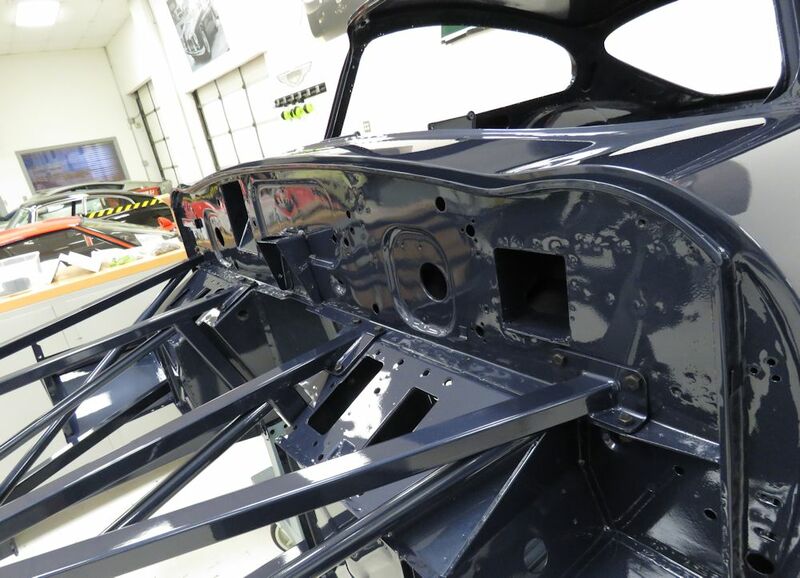 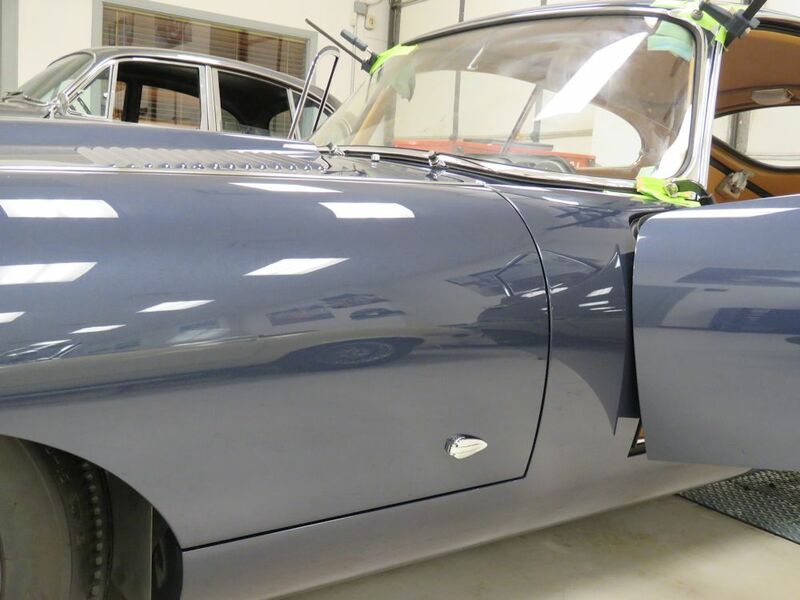 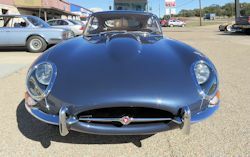 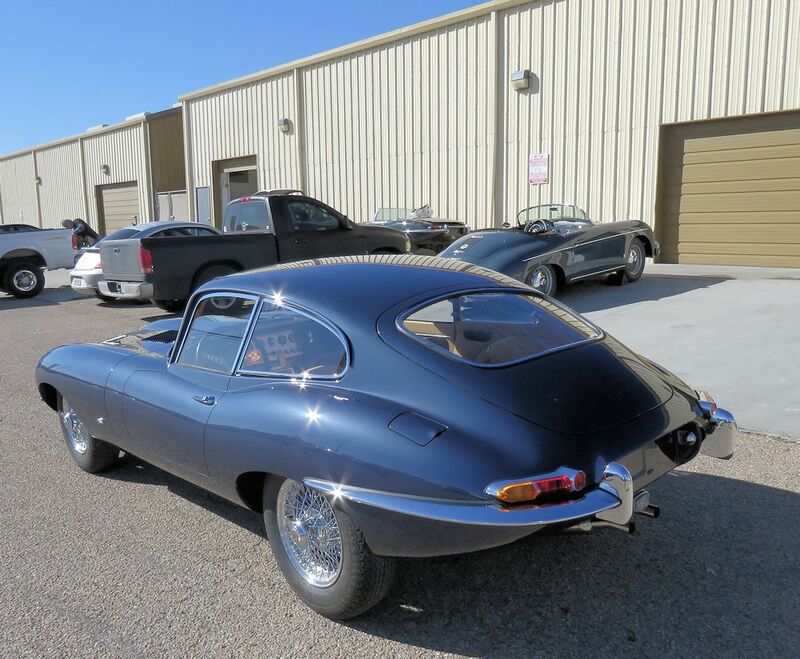 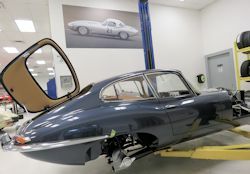 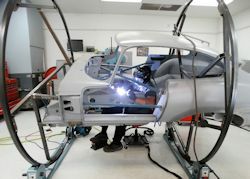 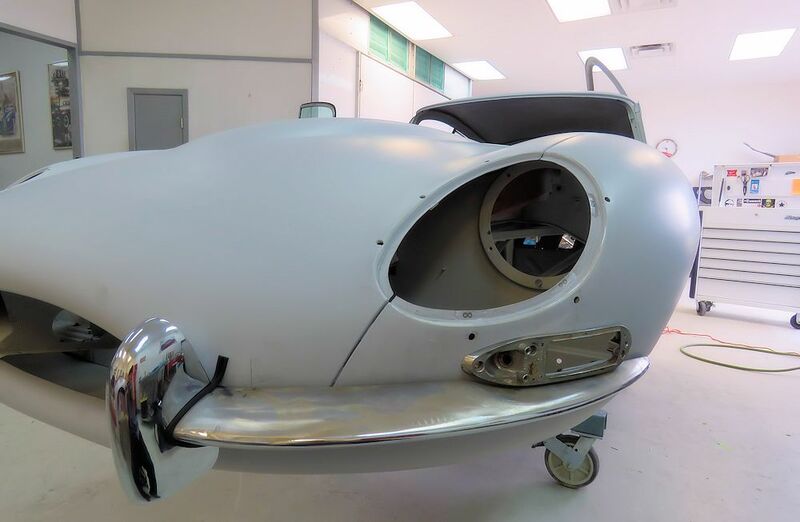 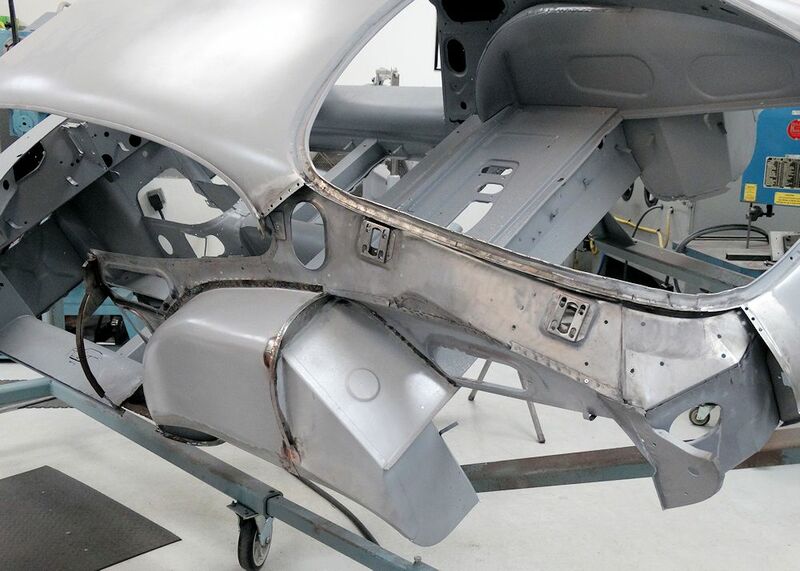 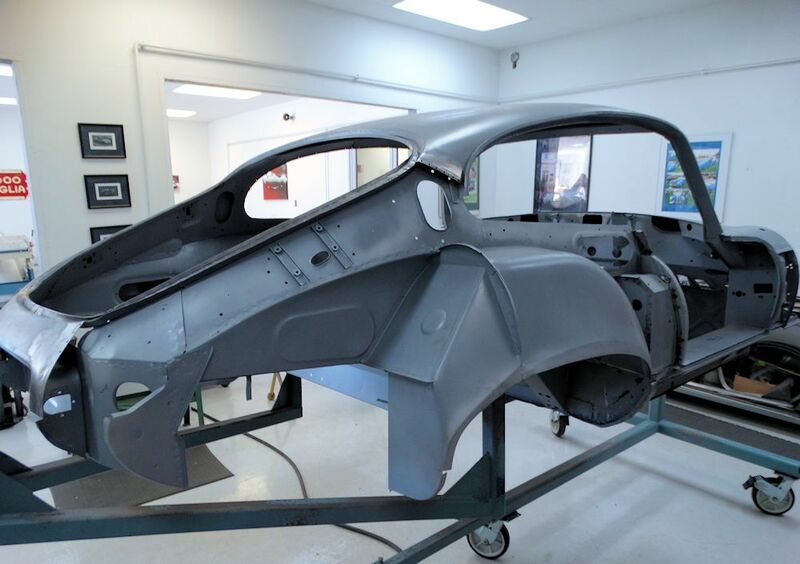 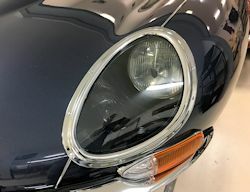 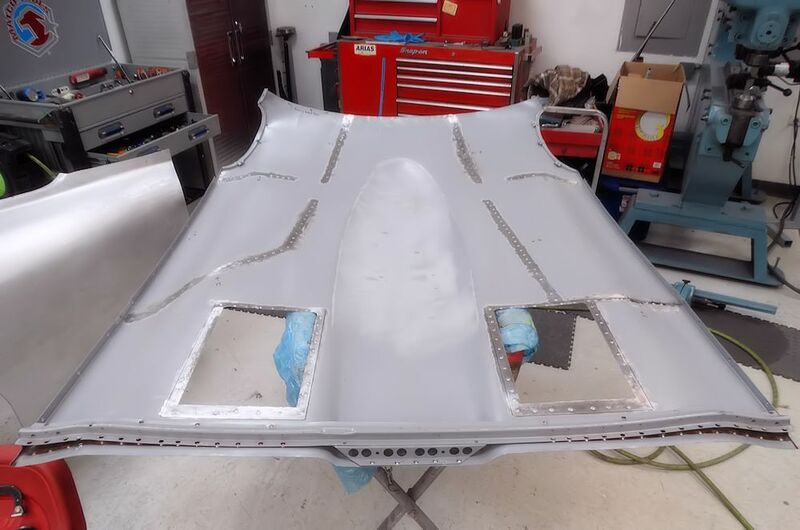 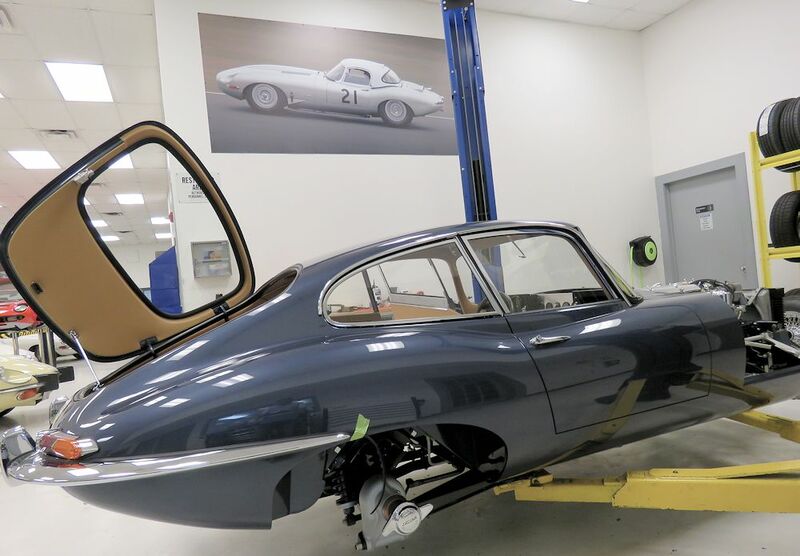 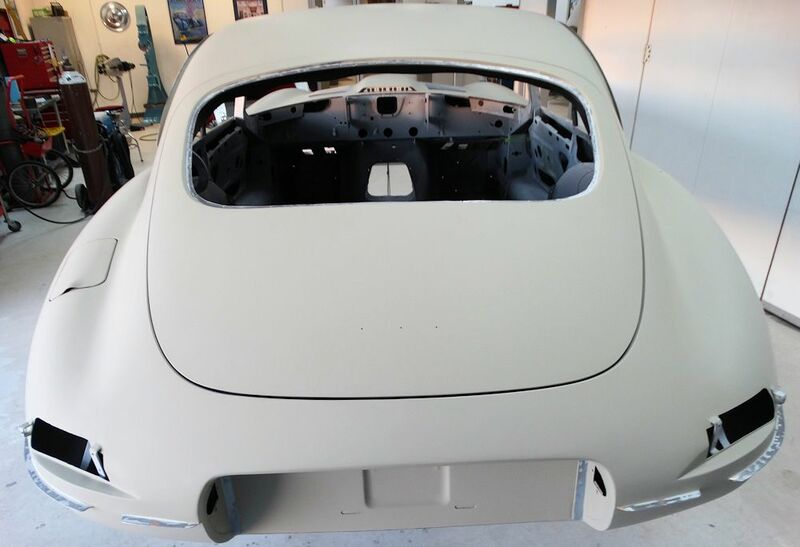 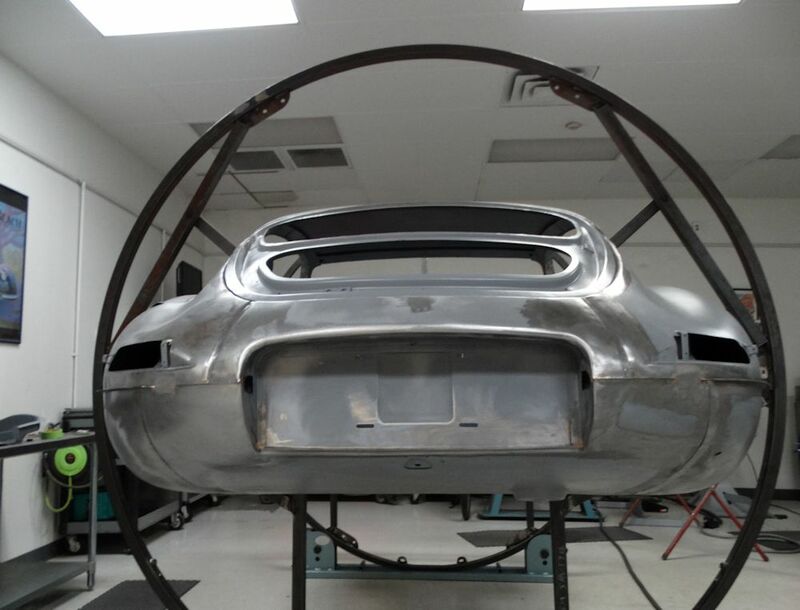 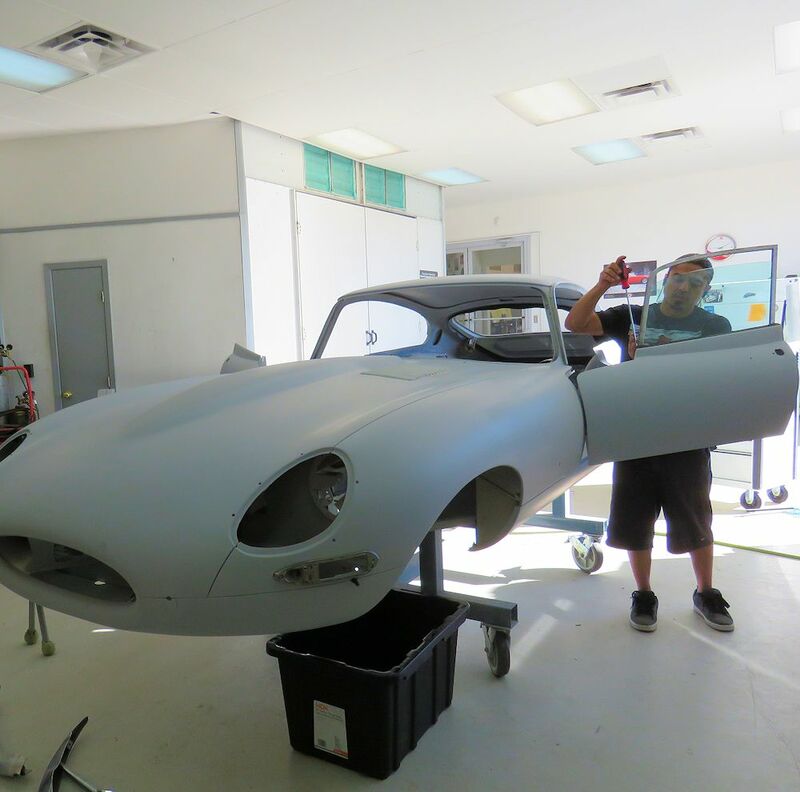 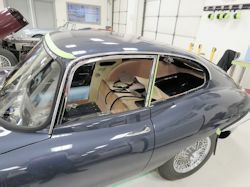 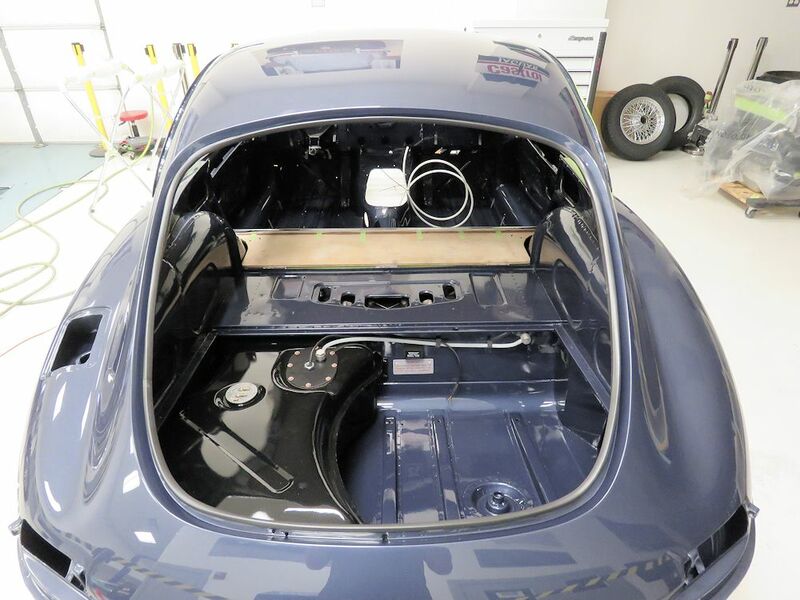 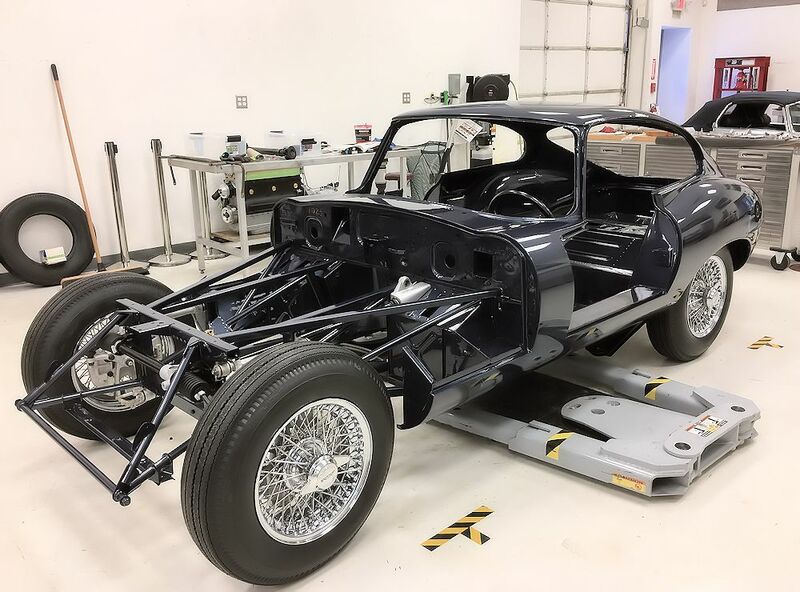 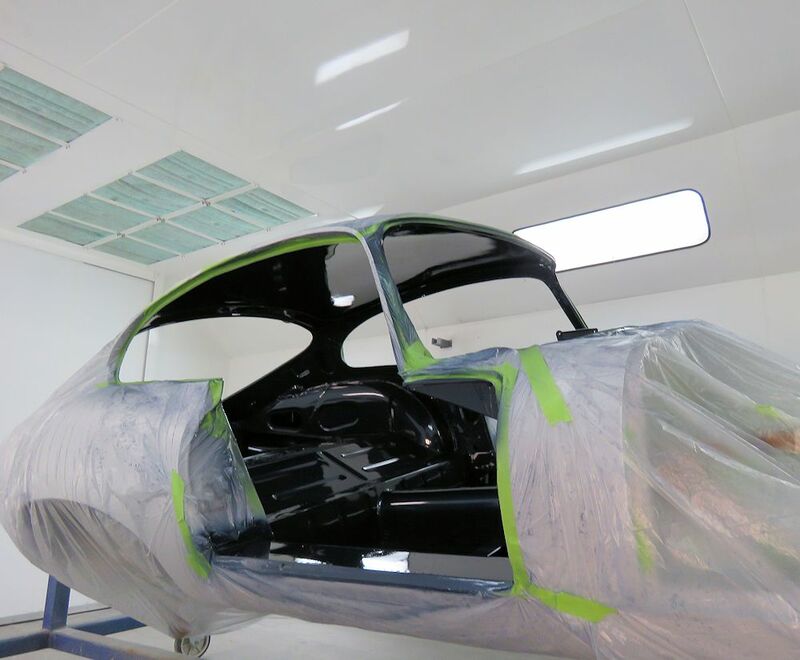 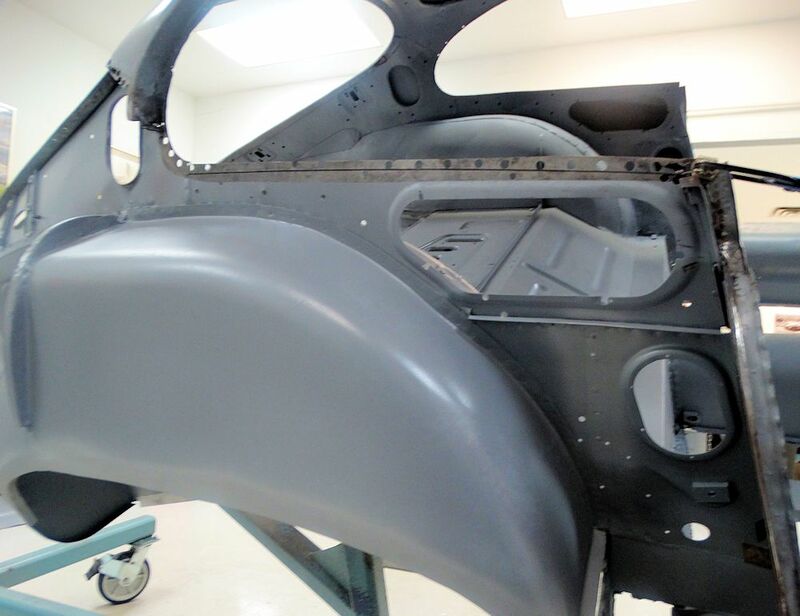 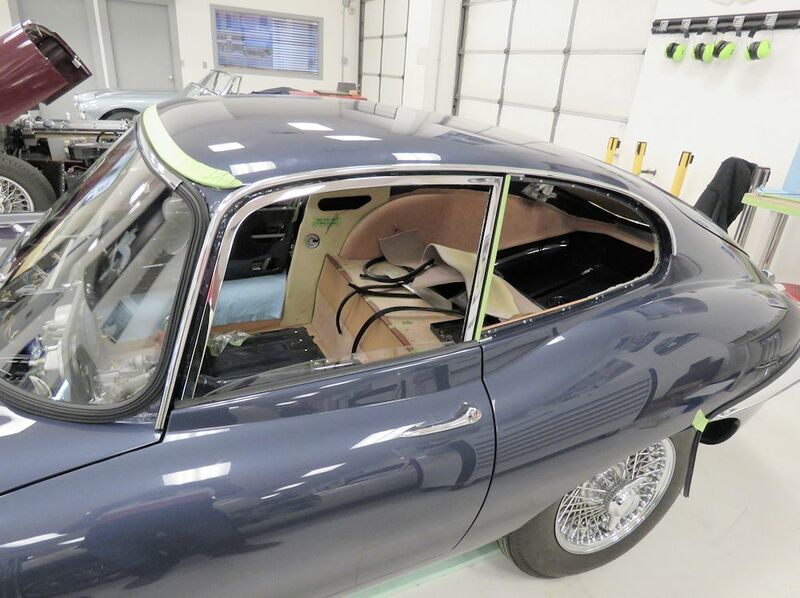 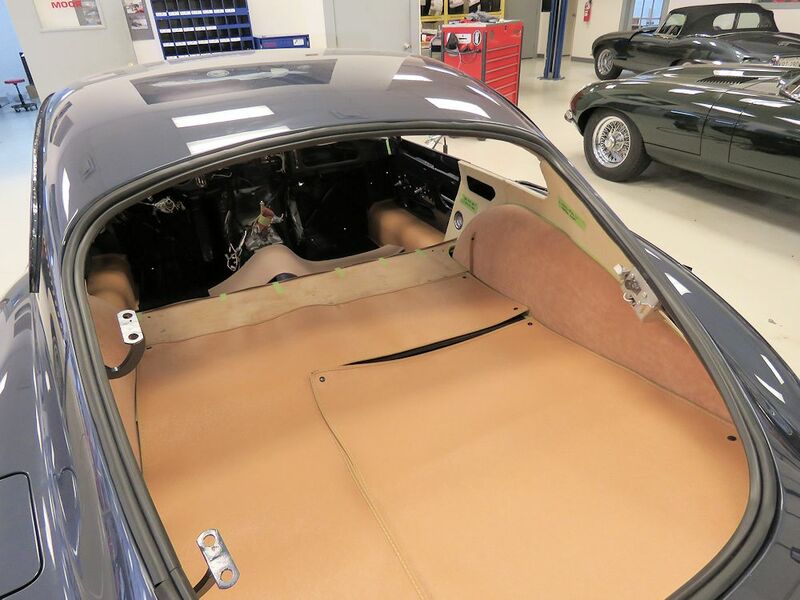 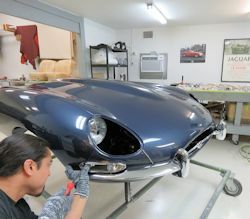 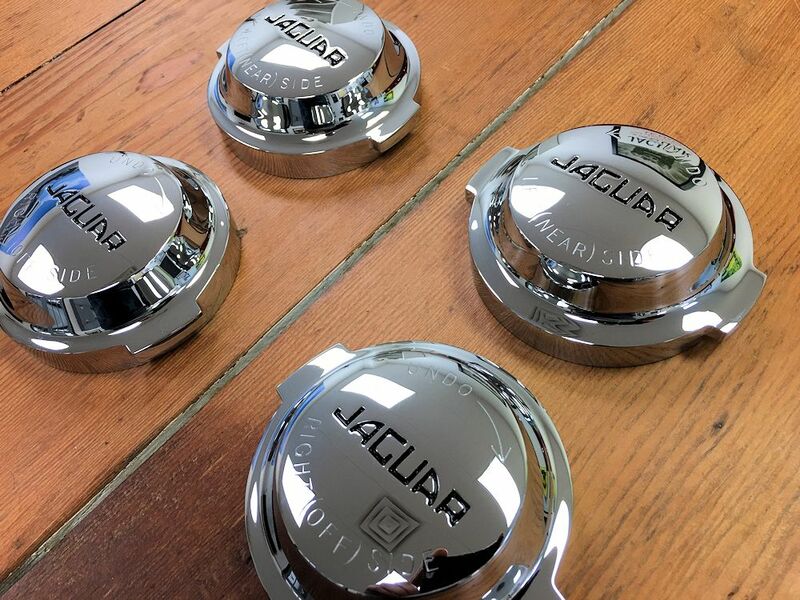 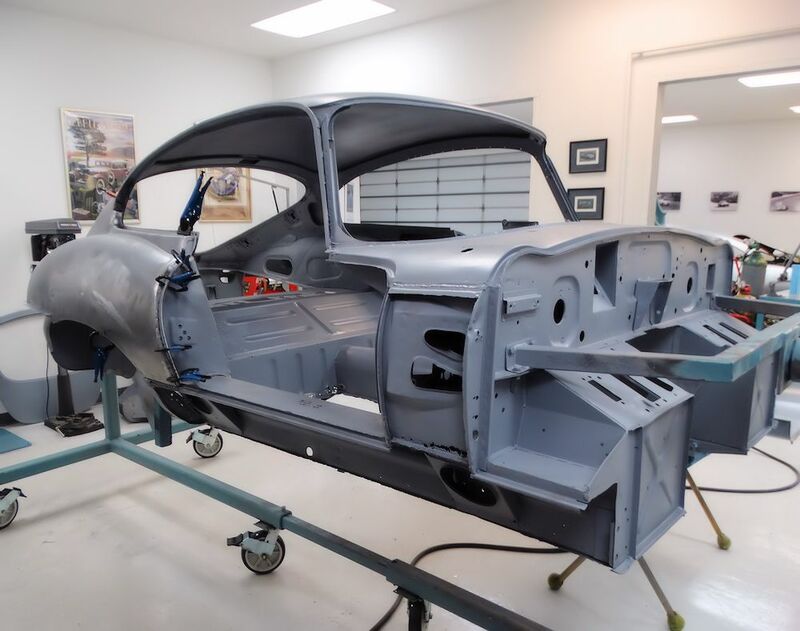 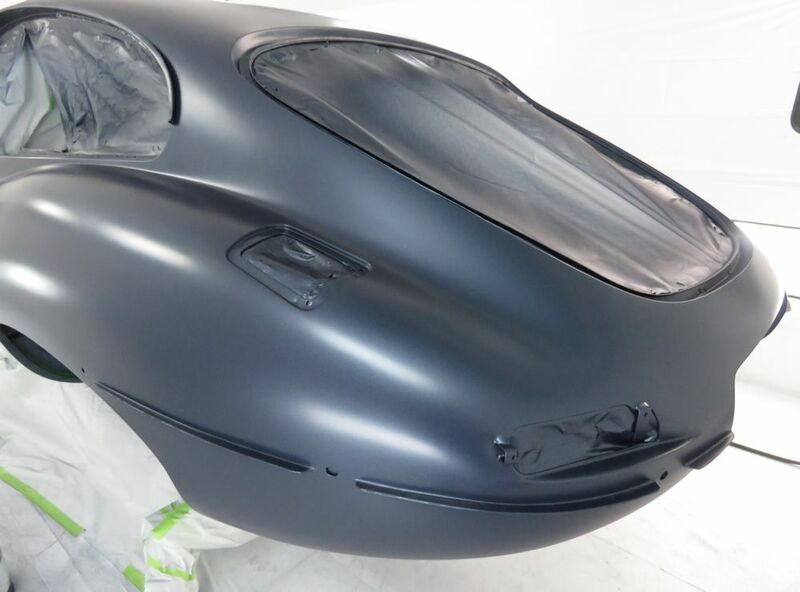 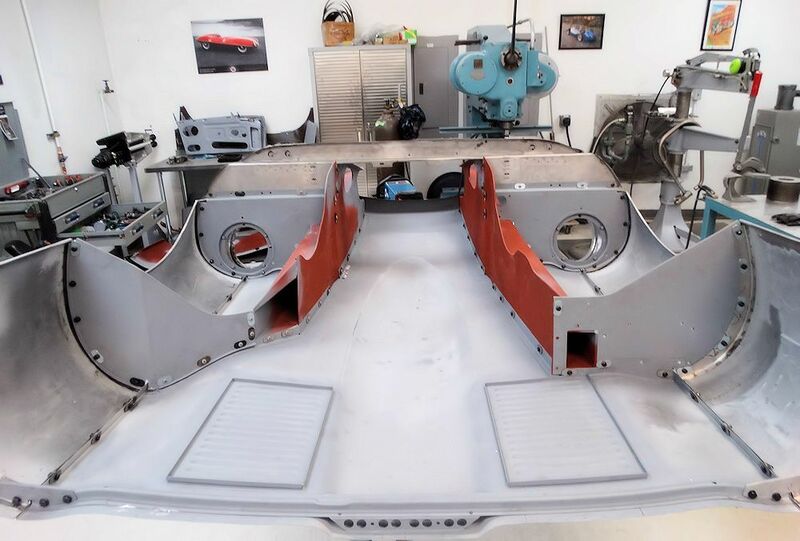 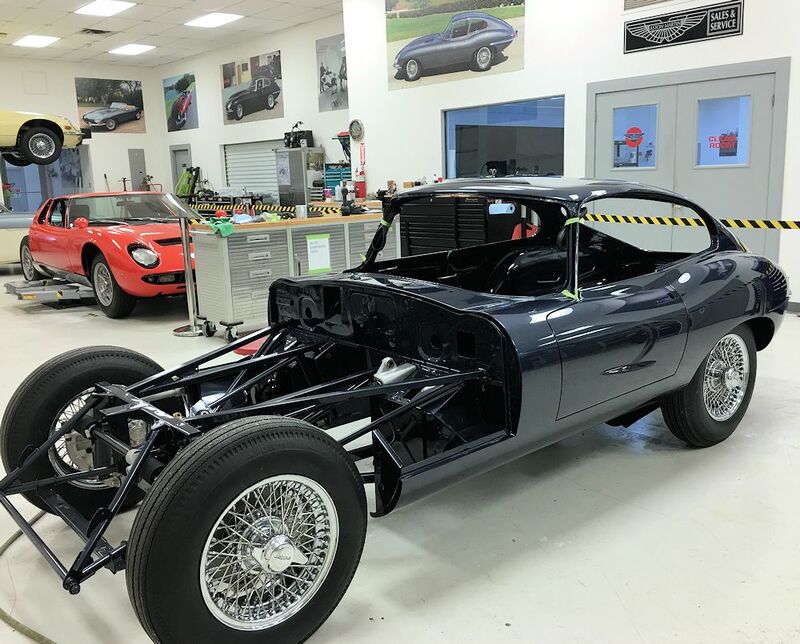 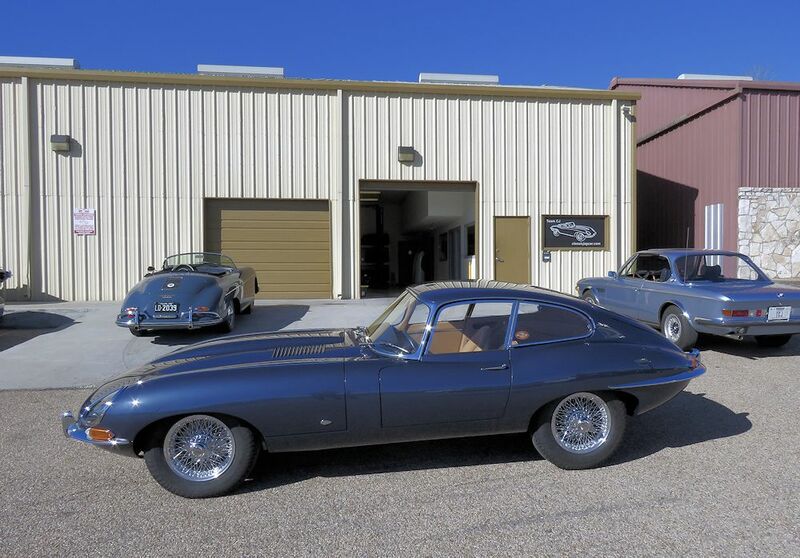 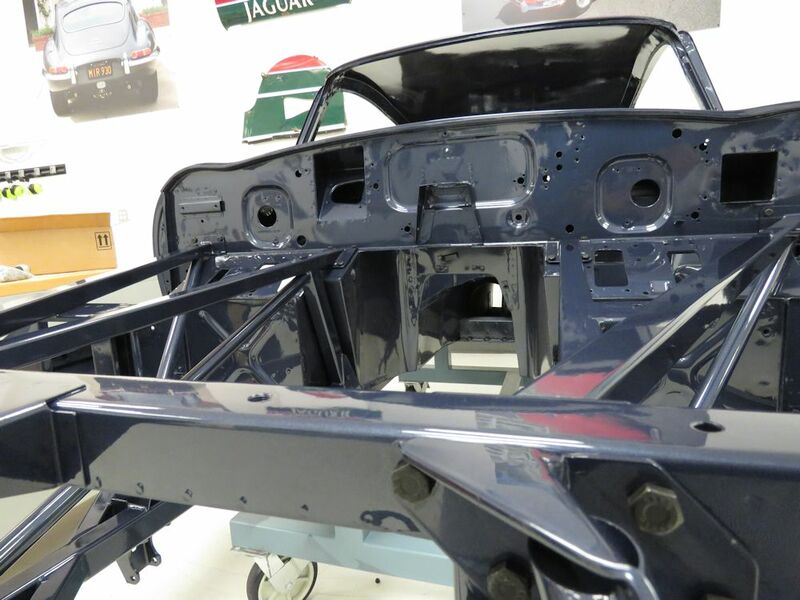 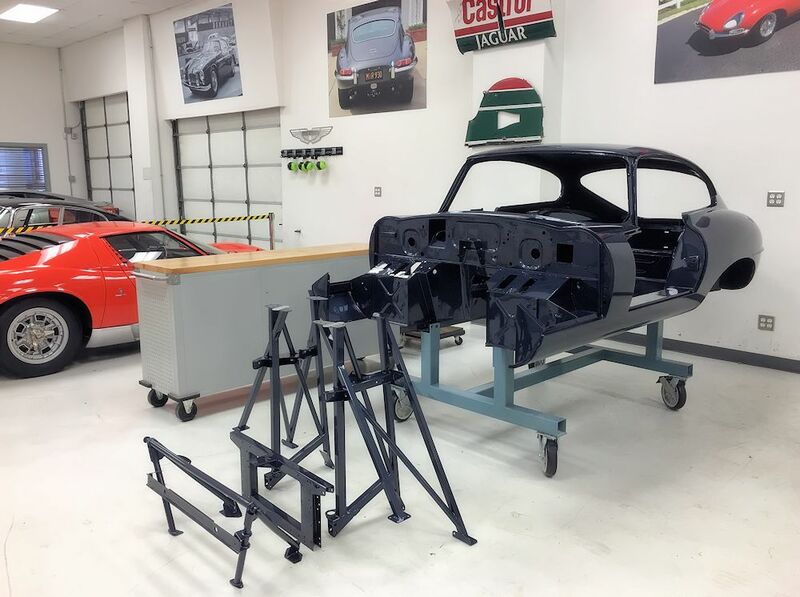 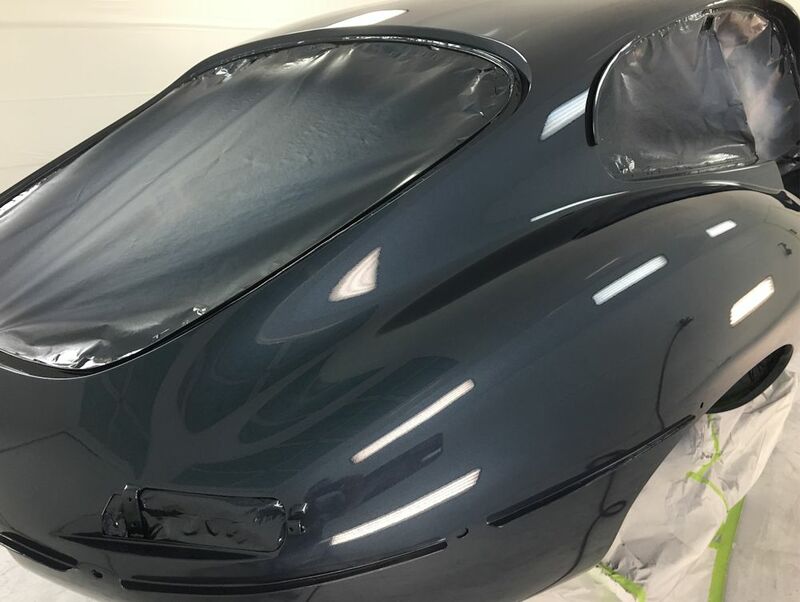 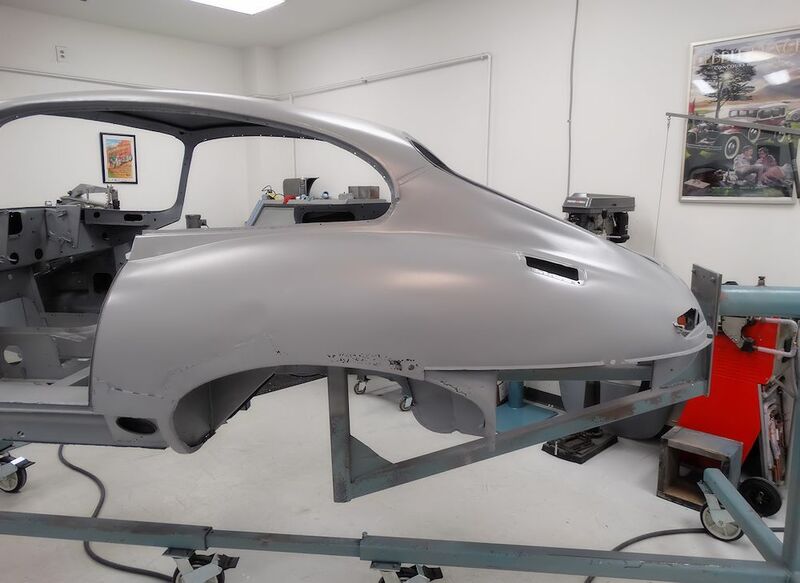 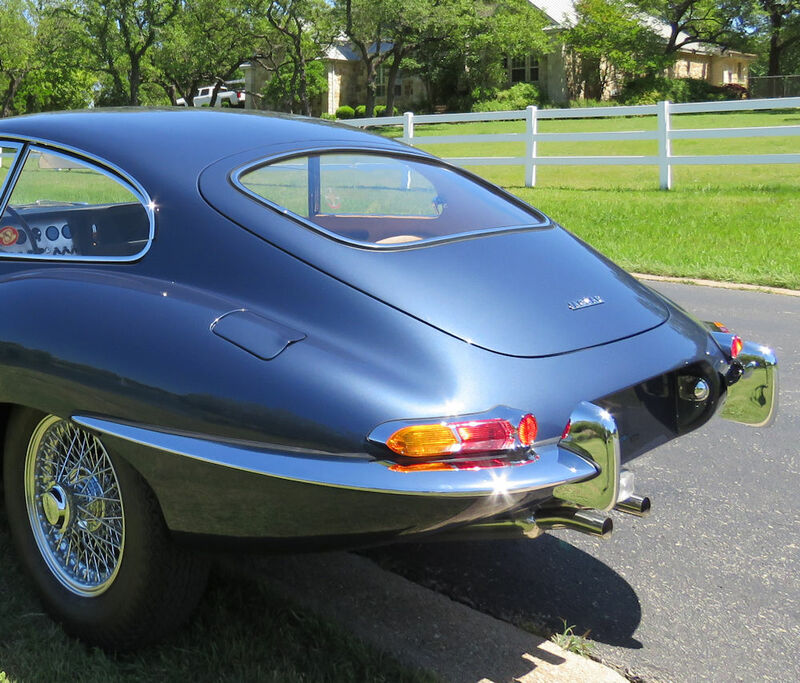 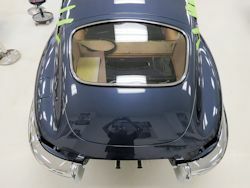 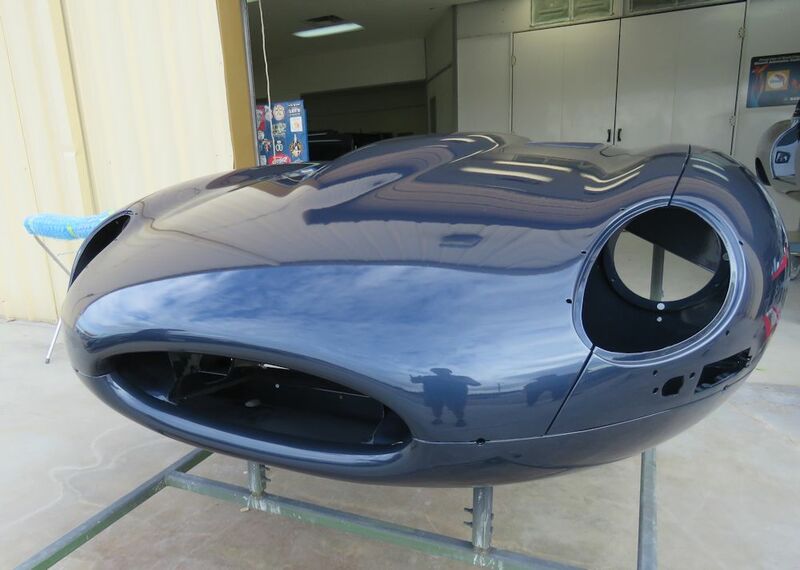 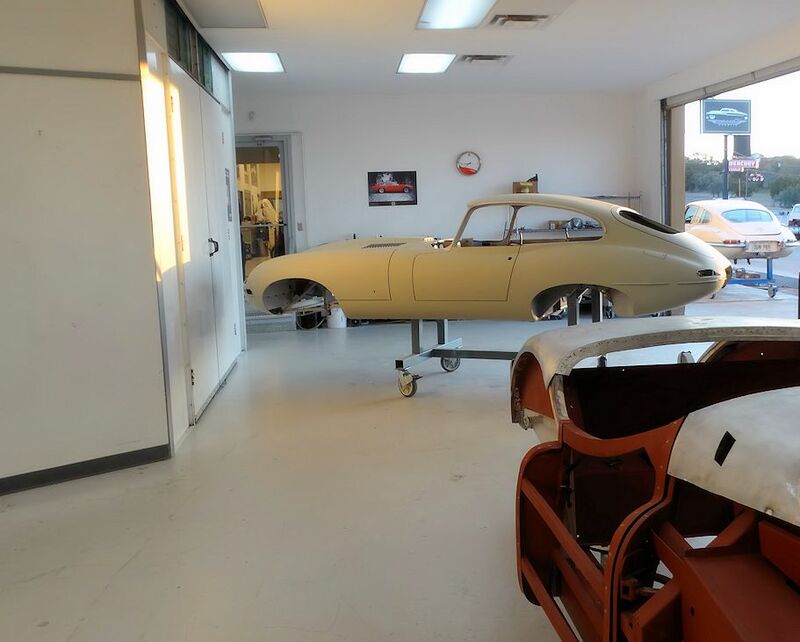 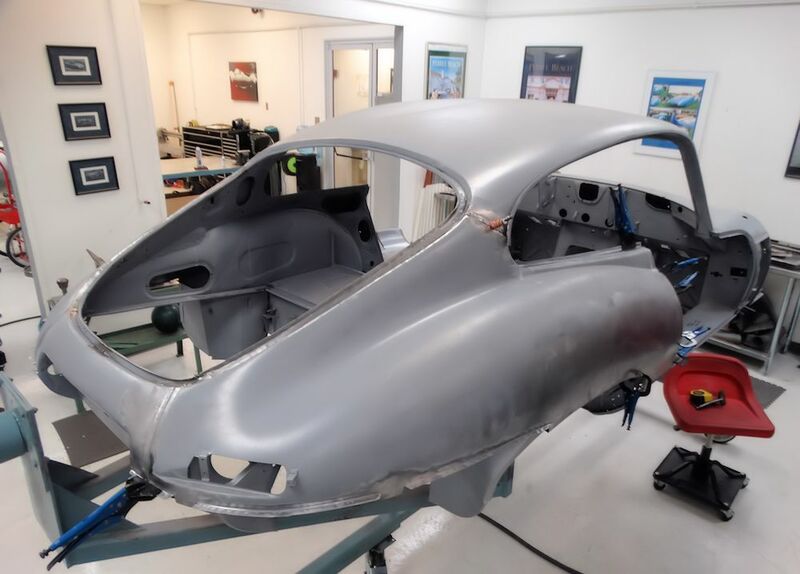 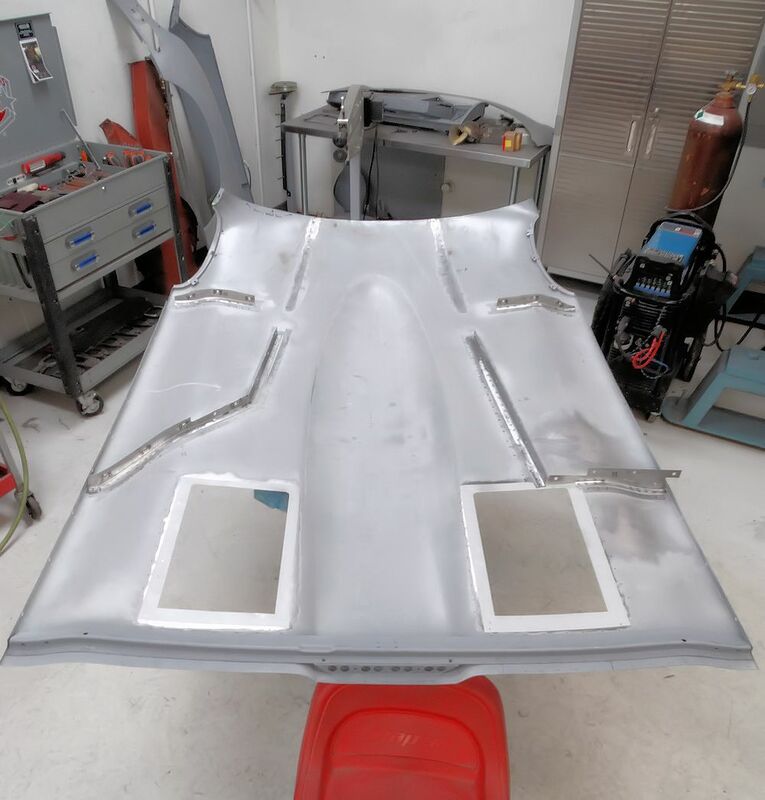 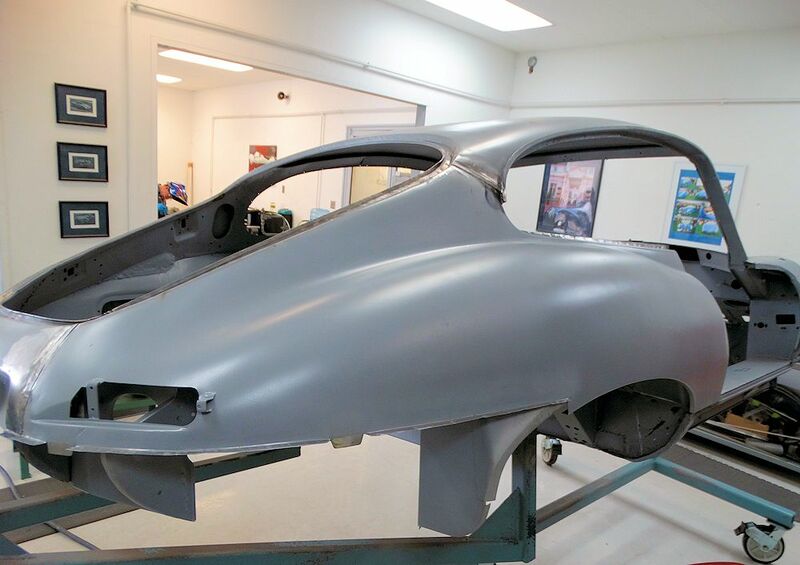 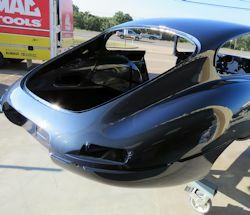 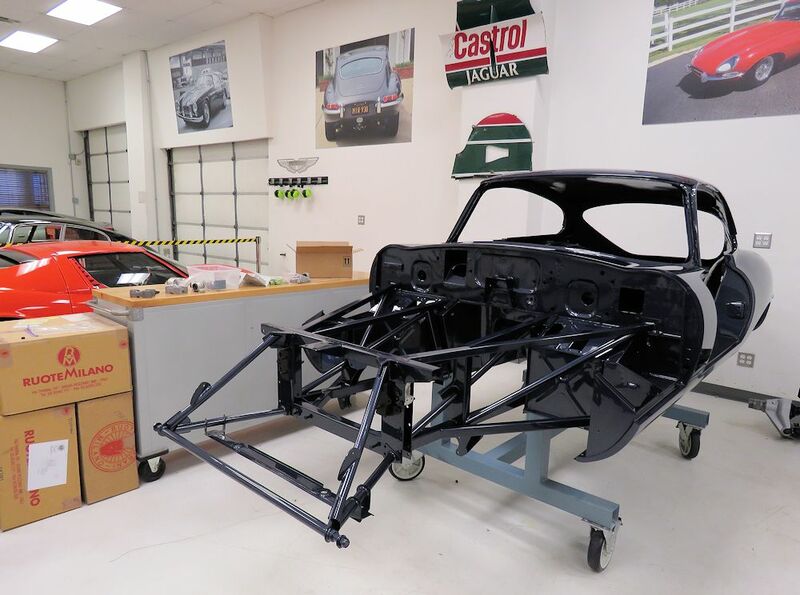 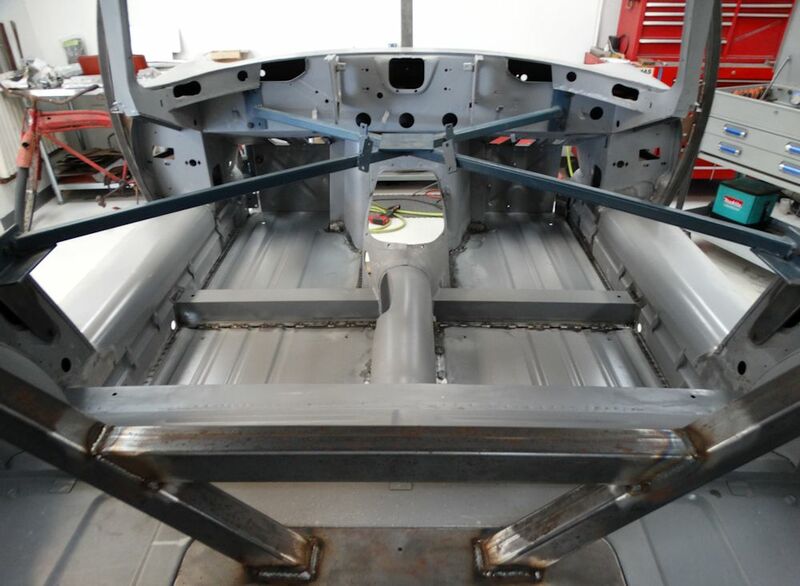 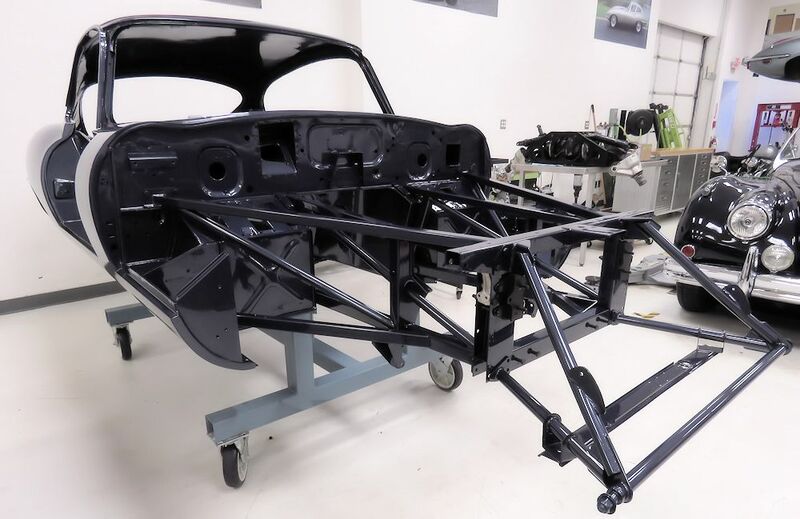 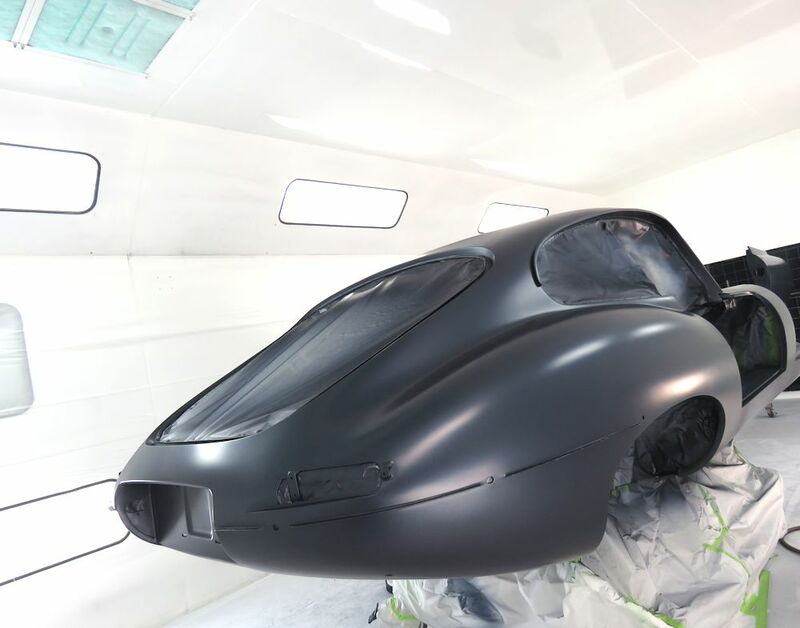 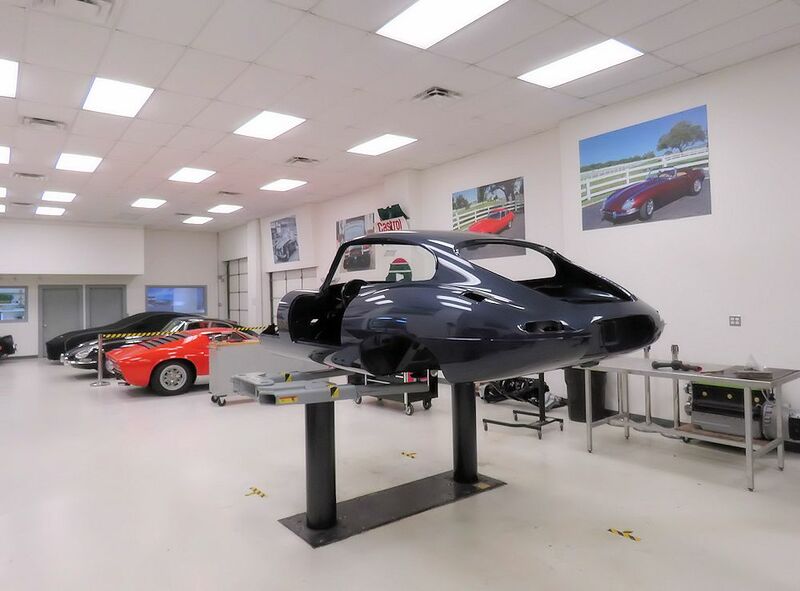 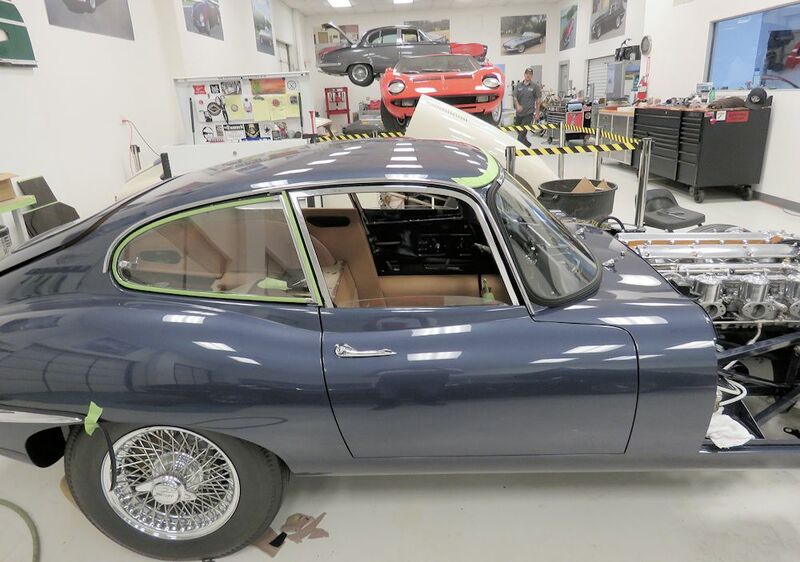 Some time ago we were fortunate enough to restore a totally original 15,000 mile E Type from which we were able to create a template for the Trico markings. The Trico label was originally painted fairly haphazardly, so we have done our best to replicate the factory markings. 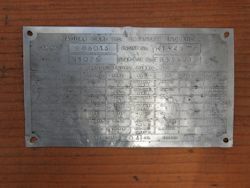 885013 was supplied new in Germany and as a result would have had the rare two eared knock-offs which were unique to the German and Swiss markets. We were lucky enough to obtain a couple of original German/Swiss knock-offs from Dr. Mike Mueller, but after several months of searching, we have been unable to complete our set. 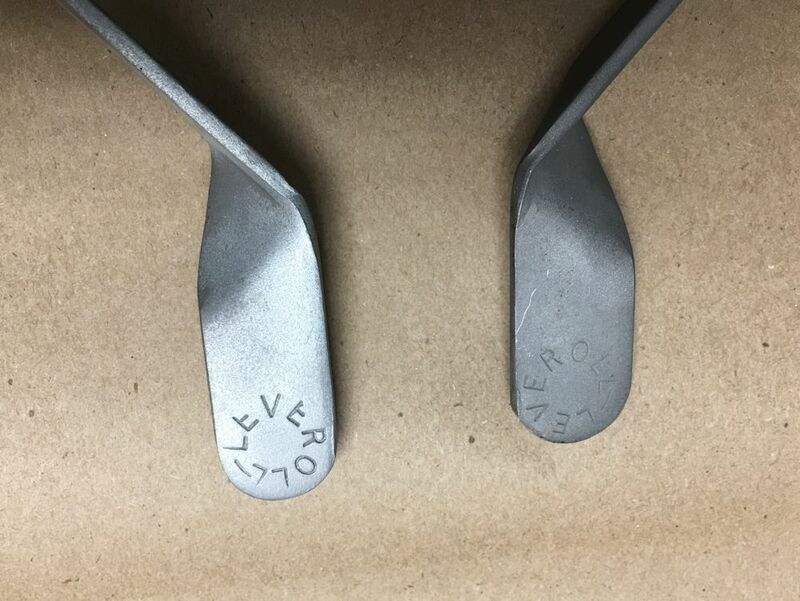 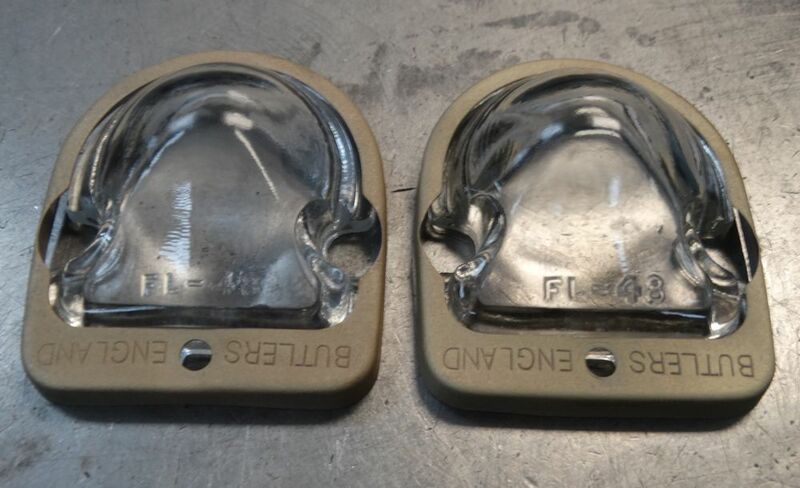 As a result we decided to modify a pair of US spec knock-offs to precisely match the appearance of the original two eared versions. 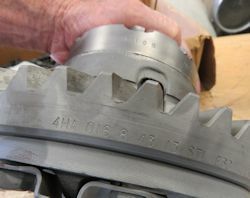 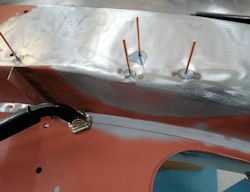 This was not as simple as trimming the larger ears on the US spec component, as the side profile was also slightly different. 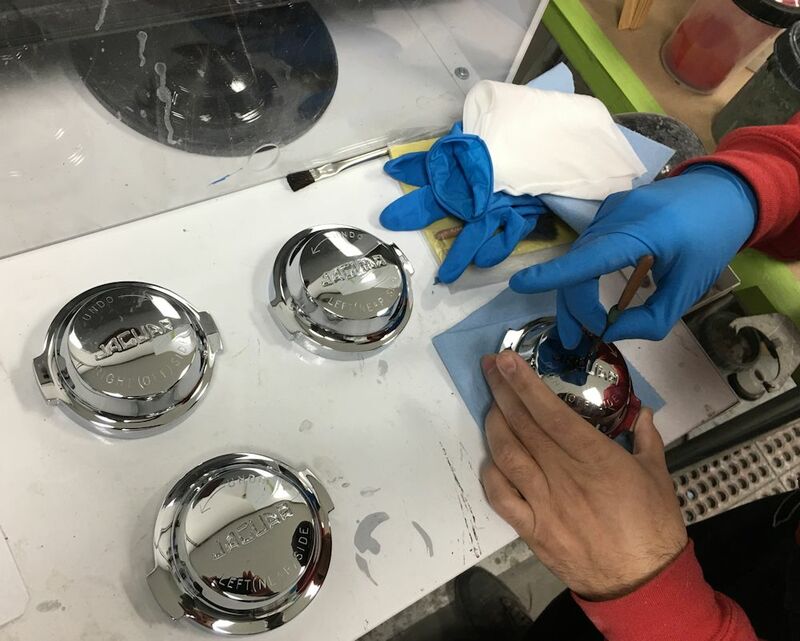 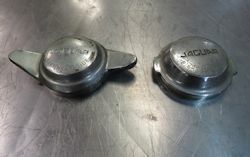 Corey in the CJ machine shop did a fantastic job of machining the the US knock-offs to look exactly like the German version. 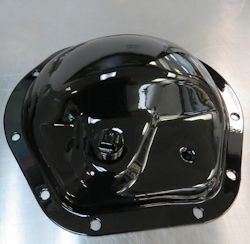 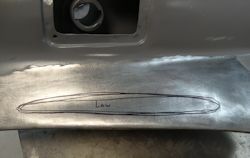 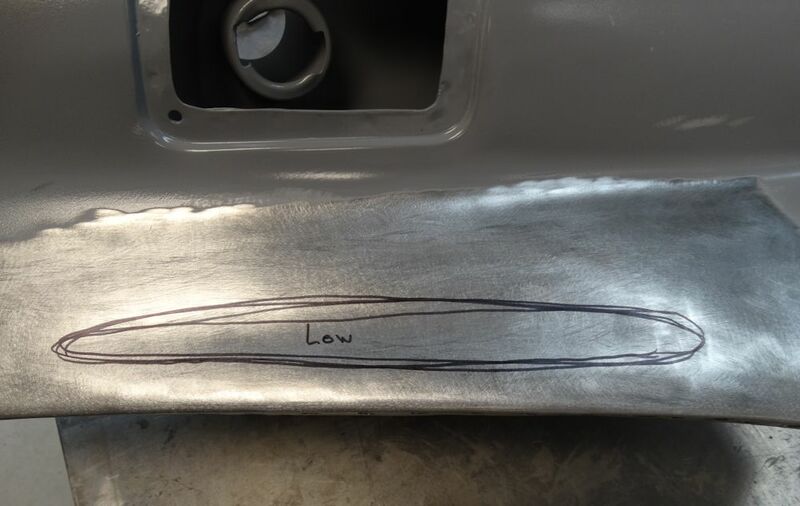 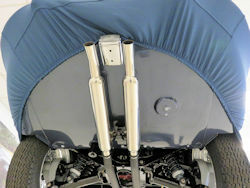 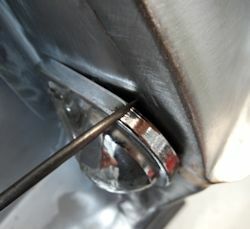 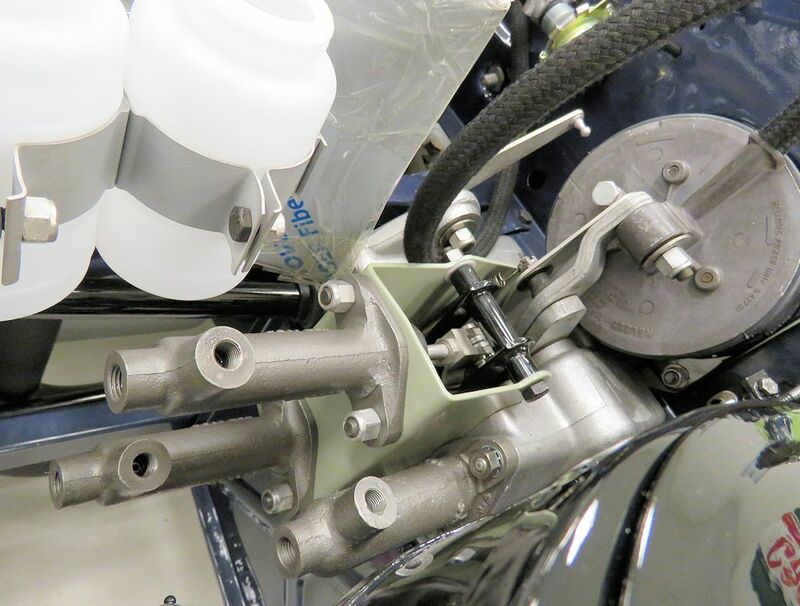 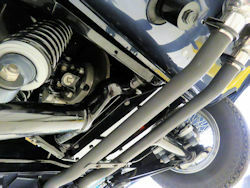 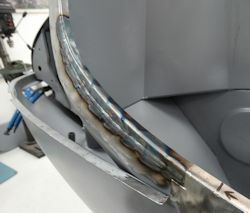 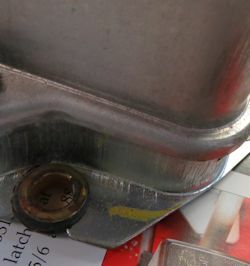 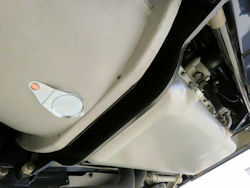 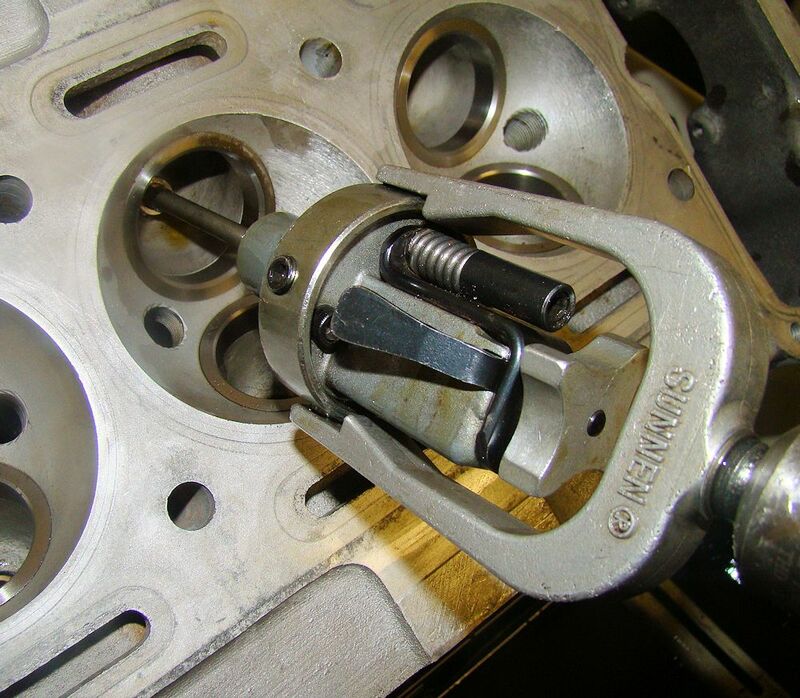 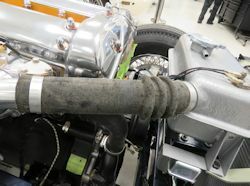 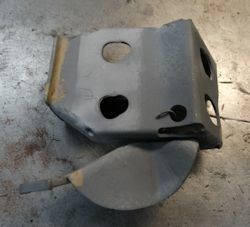 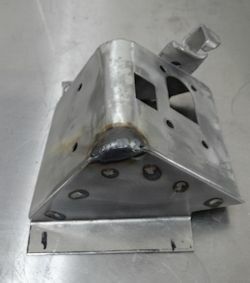 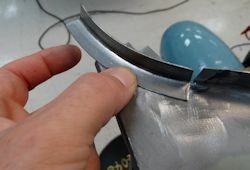 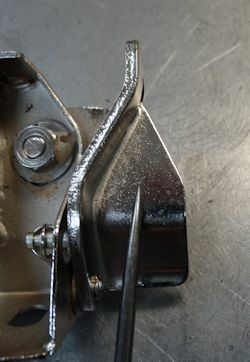 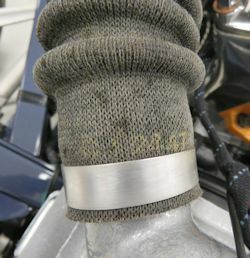 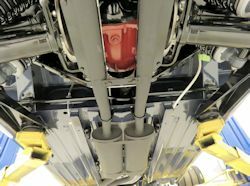 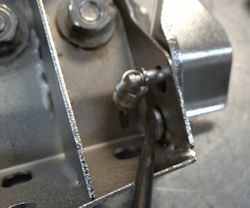 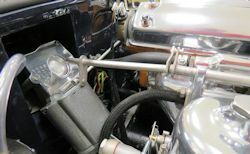 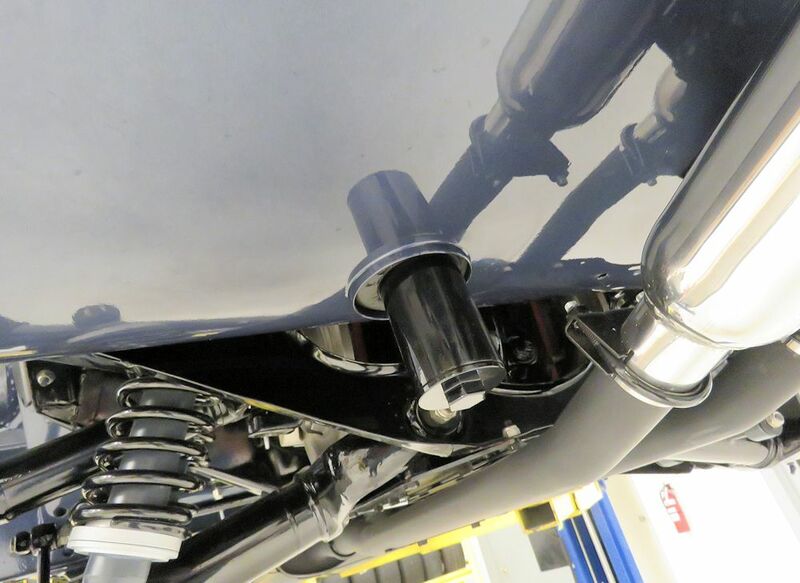 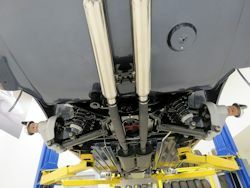 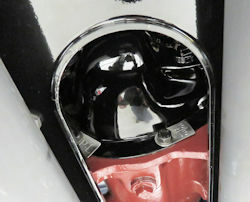 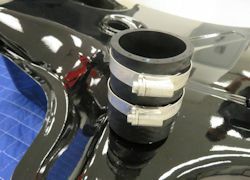 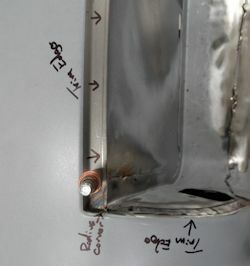 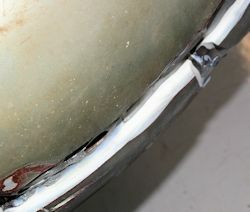 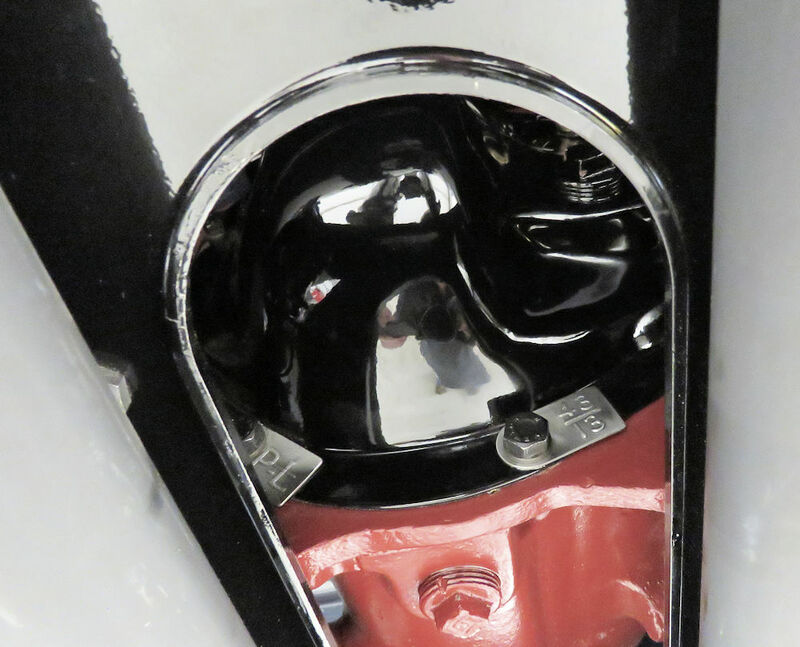 Another example of getting creative in order to get some of the tiny details correct involved the fuel tank drain sump. 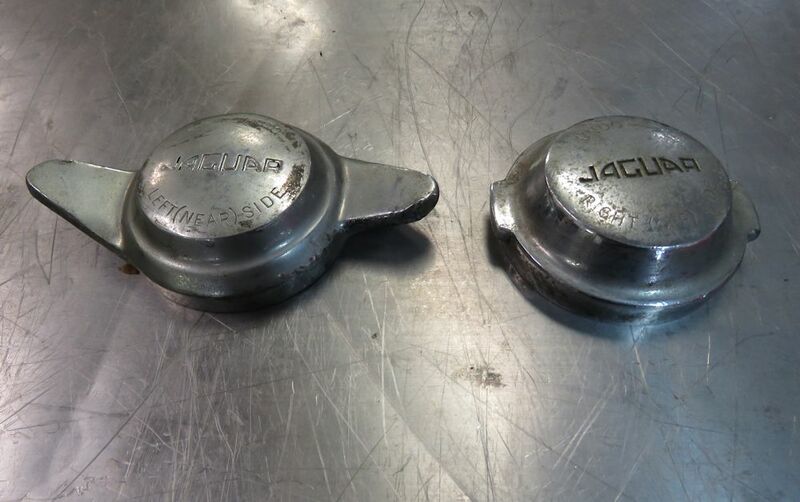 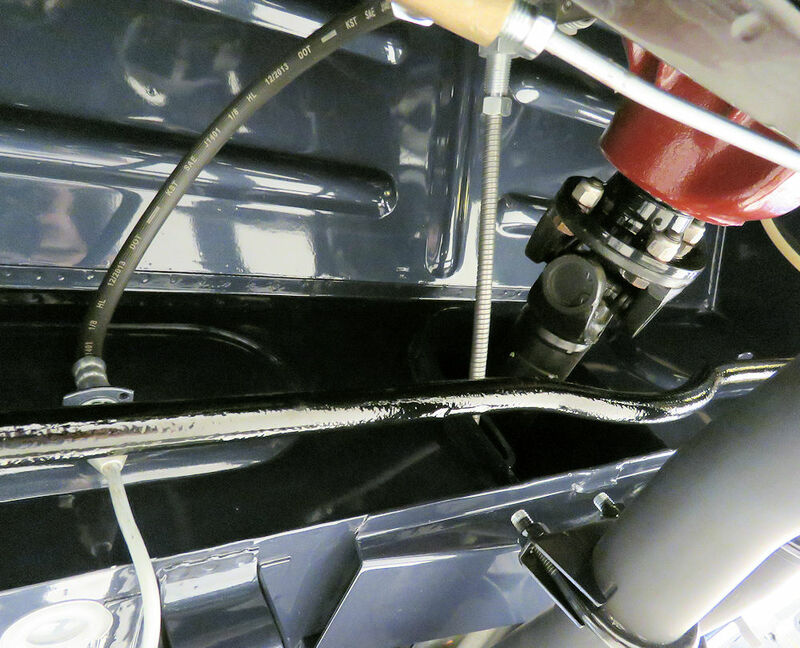 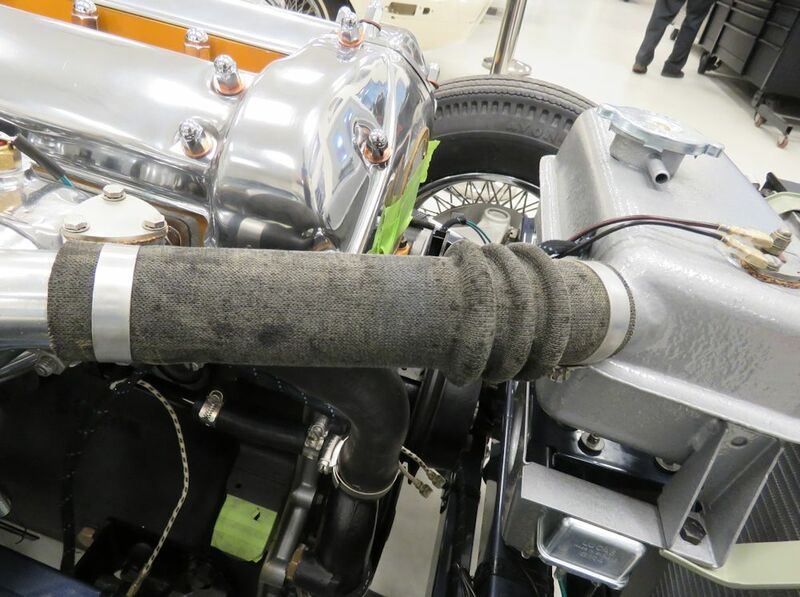 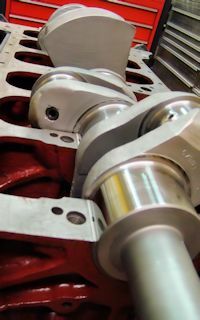 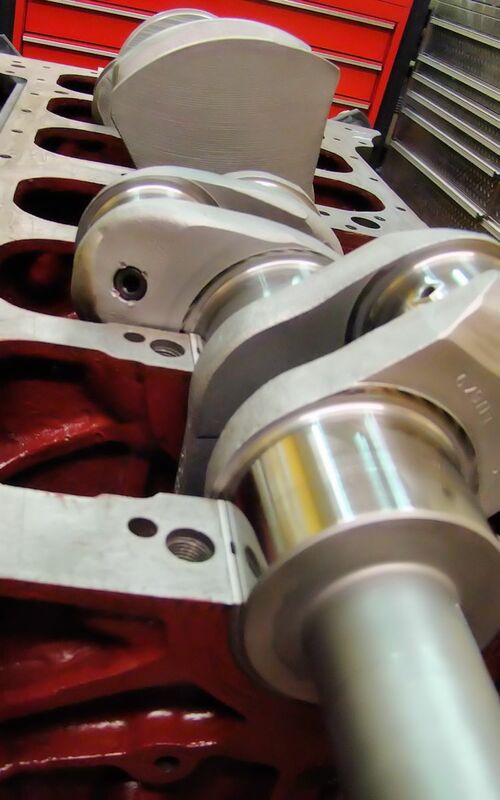 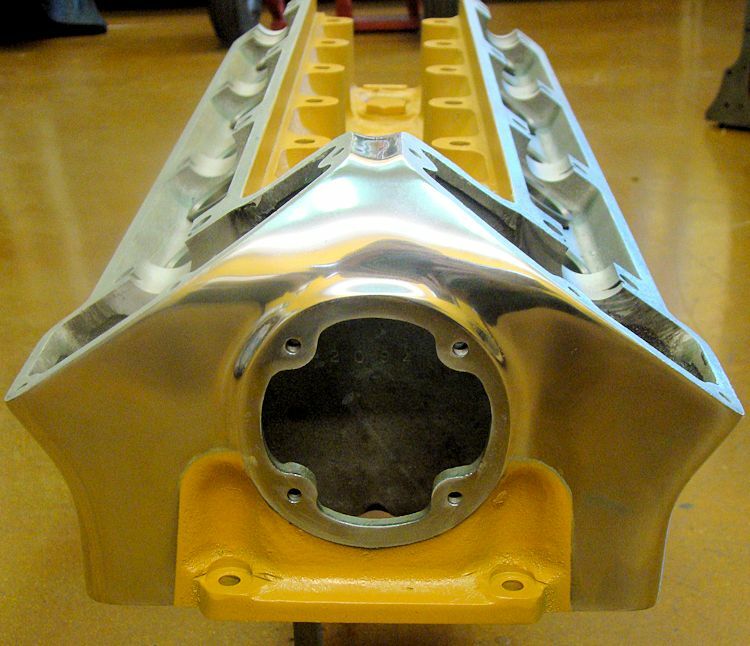 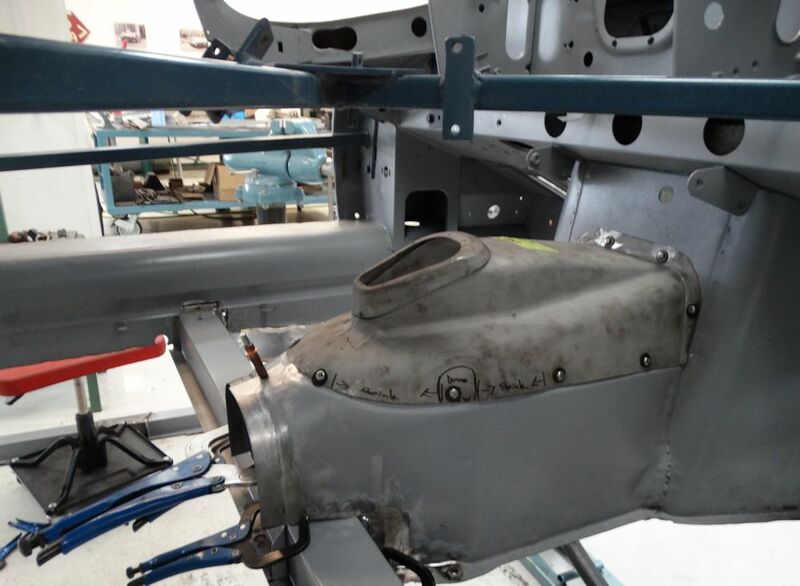 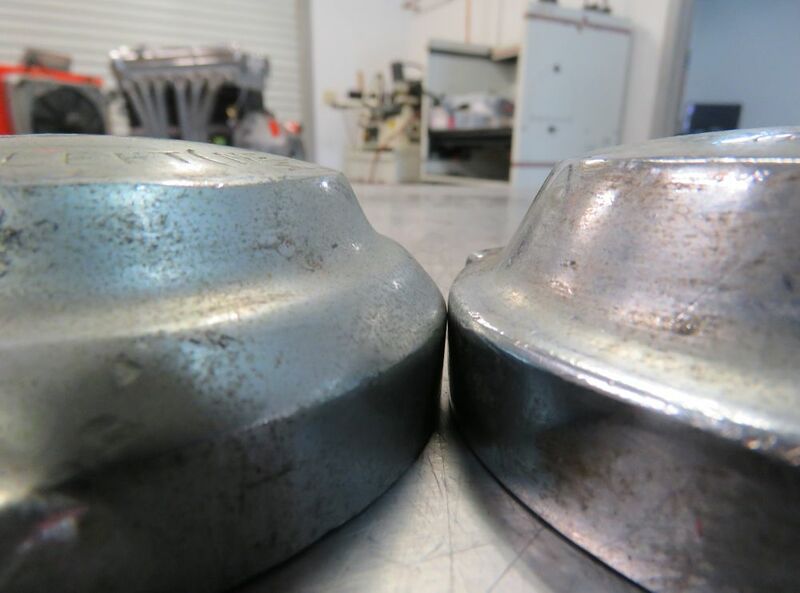 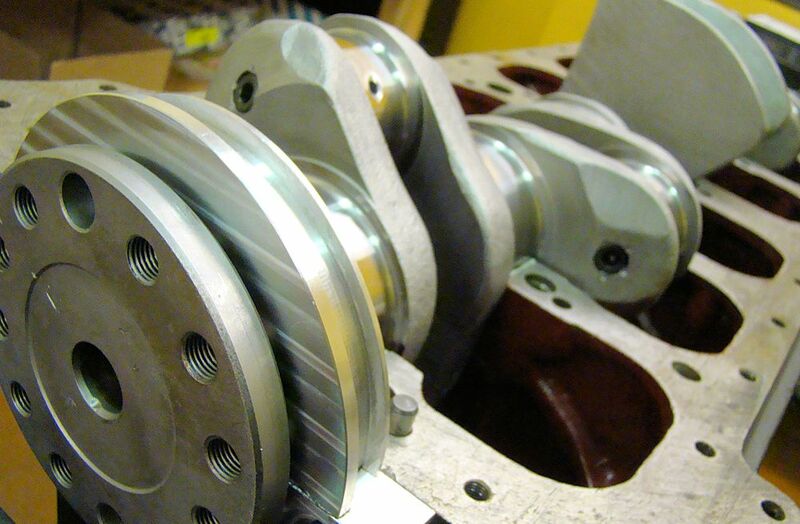 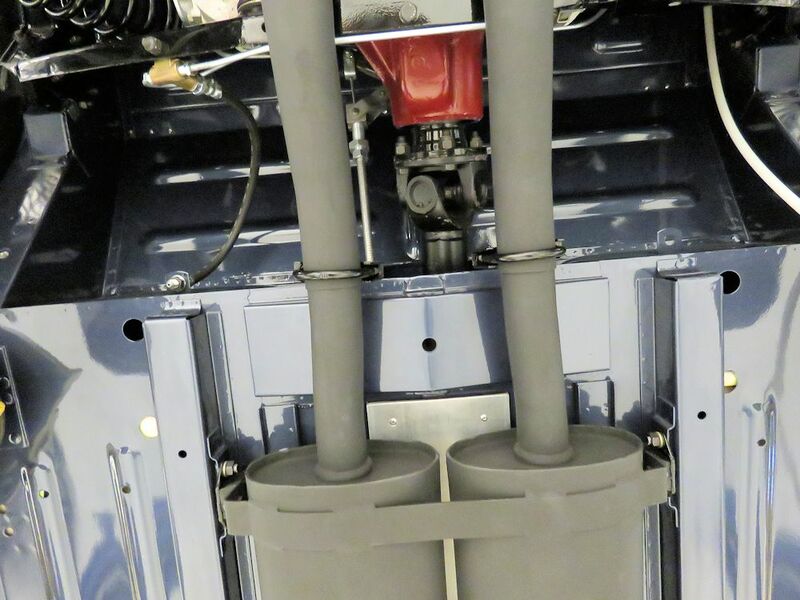 The very early cars had male threads on the sump, which was quickly reversed early in E Type production. 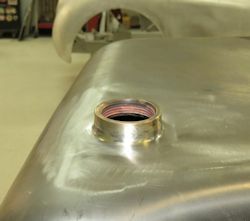 The early male thread sumps (and female thread gas tanks) are obviously no longer available, so huge thanks to Dave Ferguson at Images Auto Body in Campbell, California (who recently restored 885010), who had an extra male thread sump made (when he needed one for 885010) and made a gift of the spare to us for use on 885013. That was very generous of Dave and much appreciated! 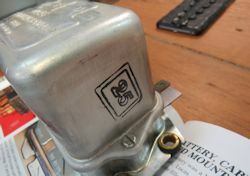 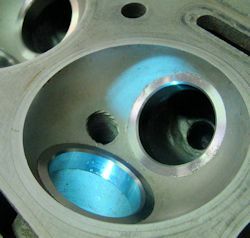 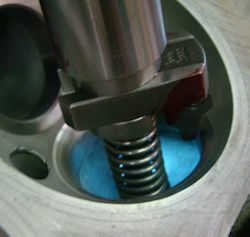 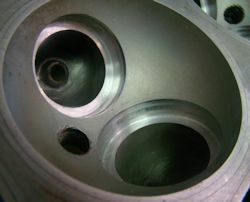 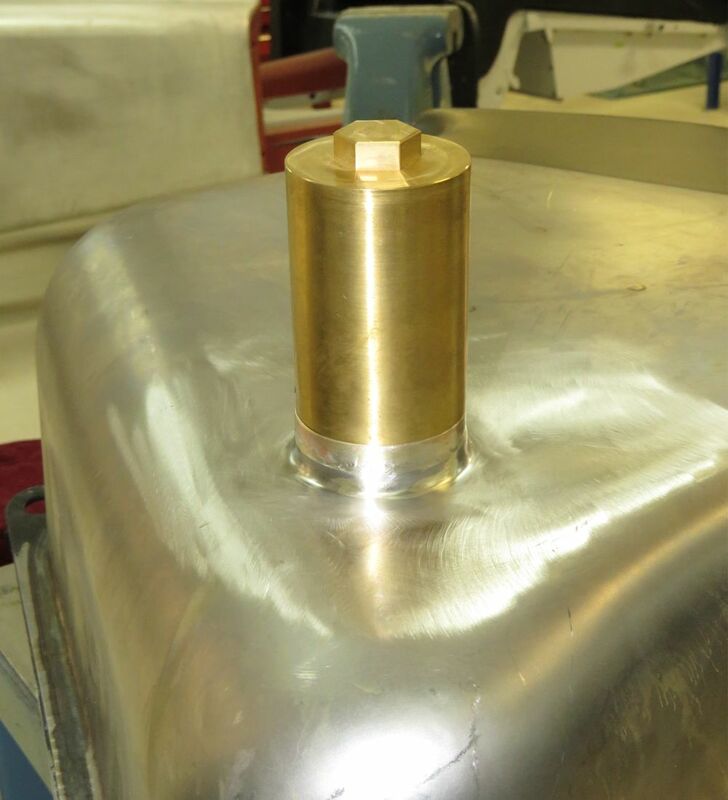 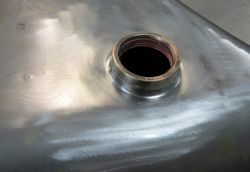 With our beautifully machined male thread sump in hand, we then had to modify a new gas tank to receive the early style sump. 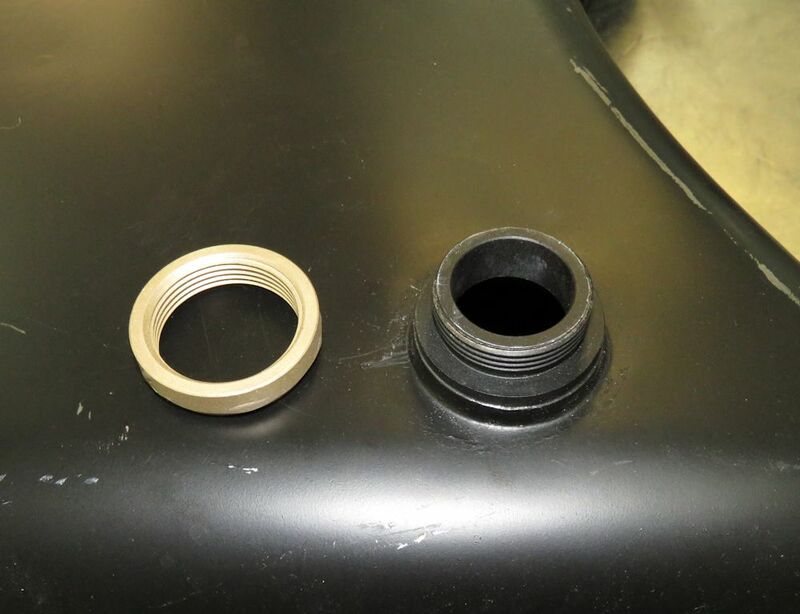 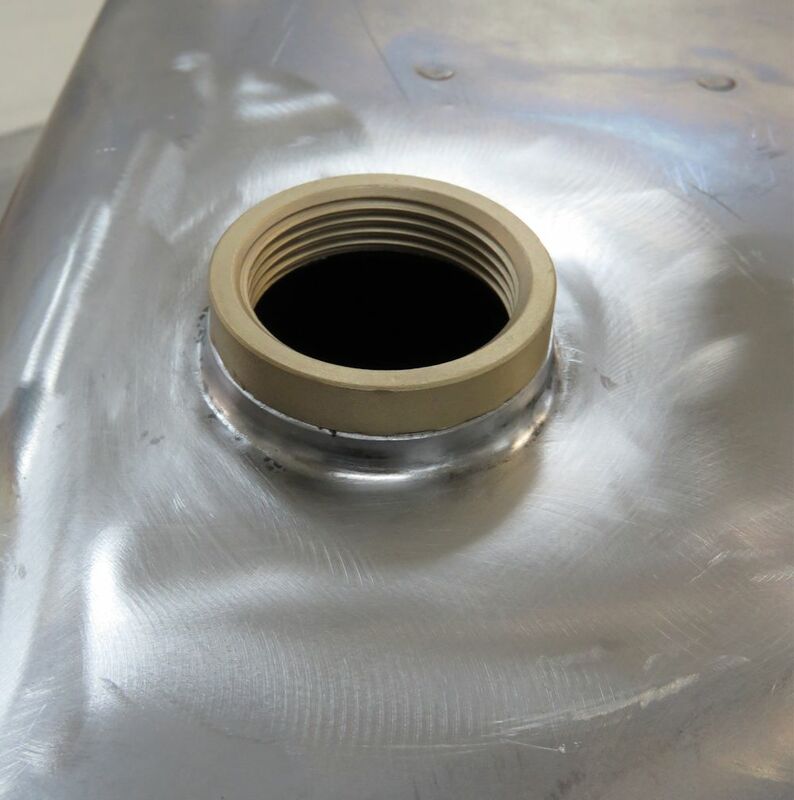 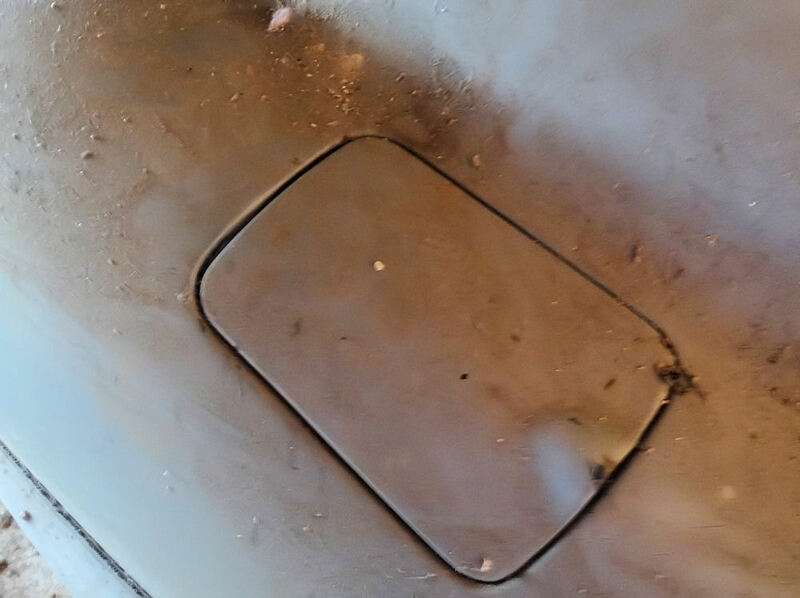 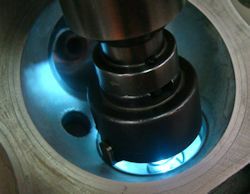 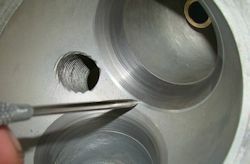 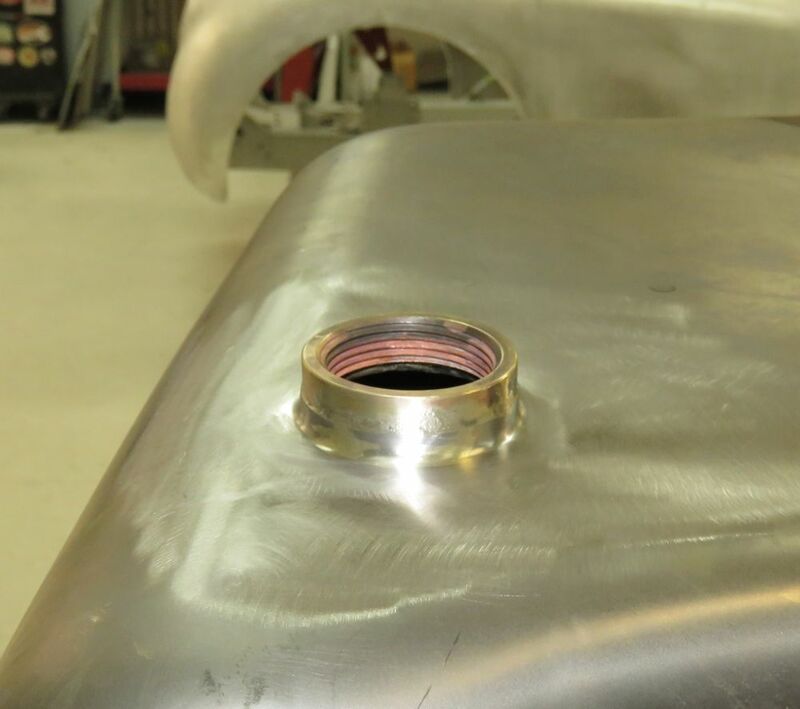 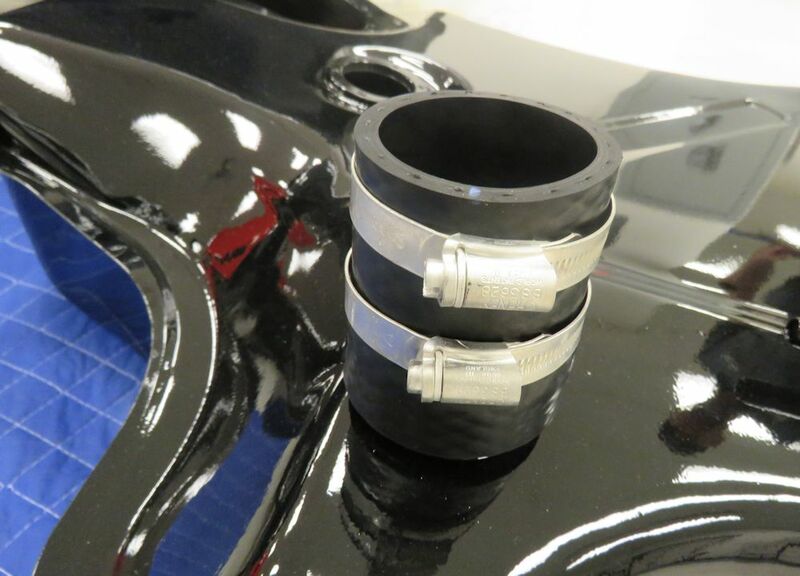 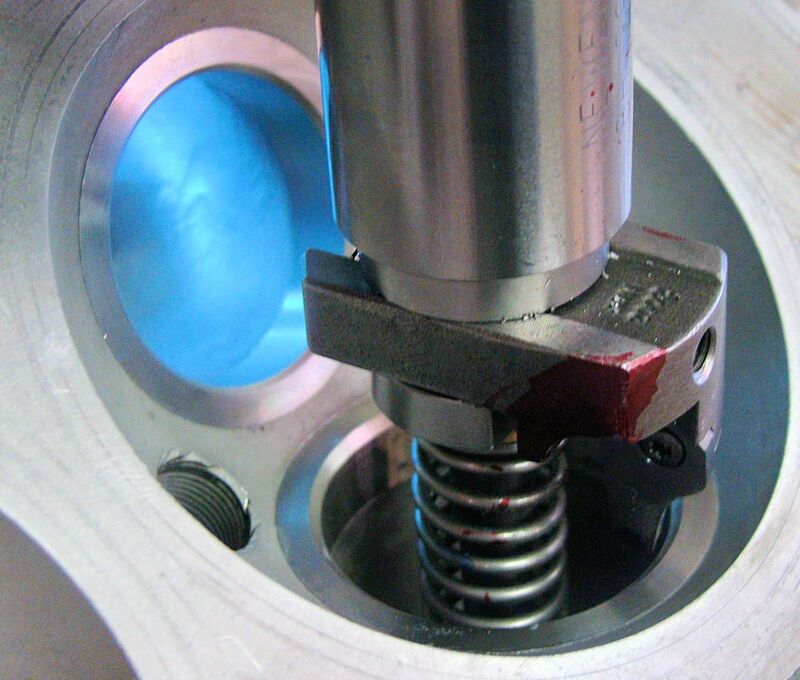 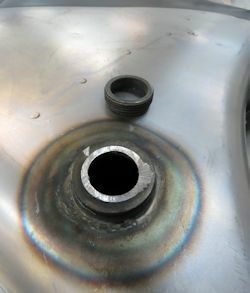 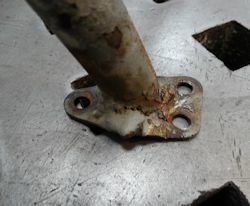 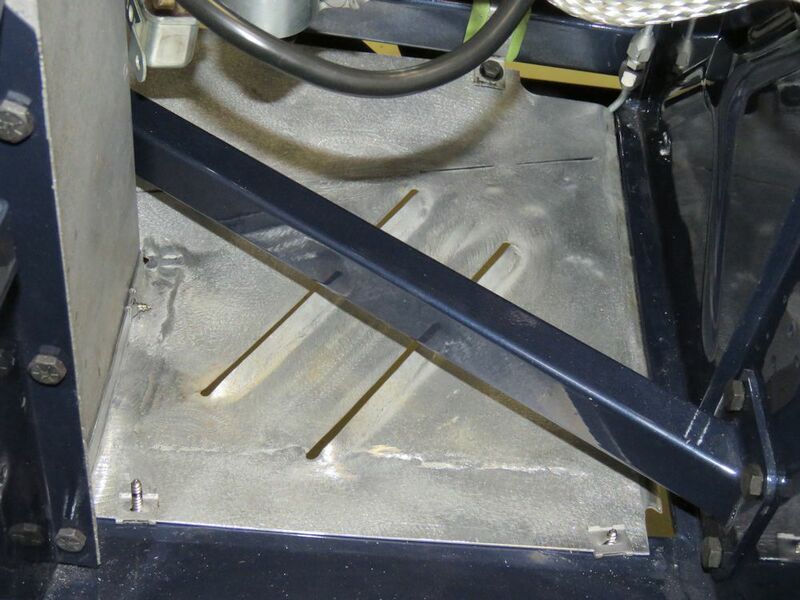 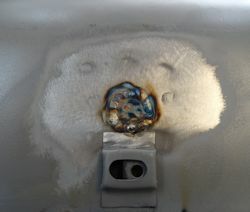 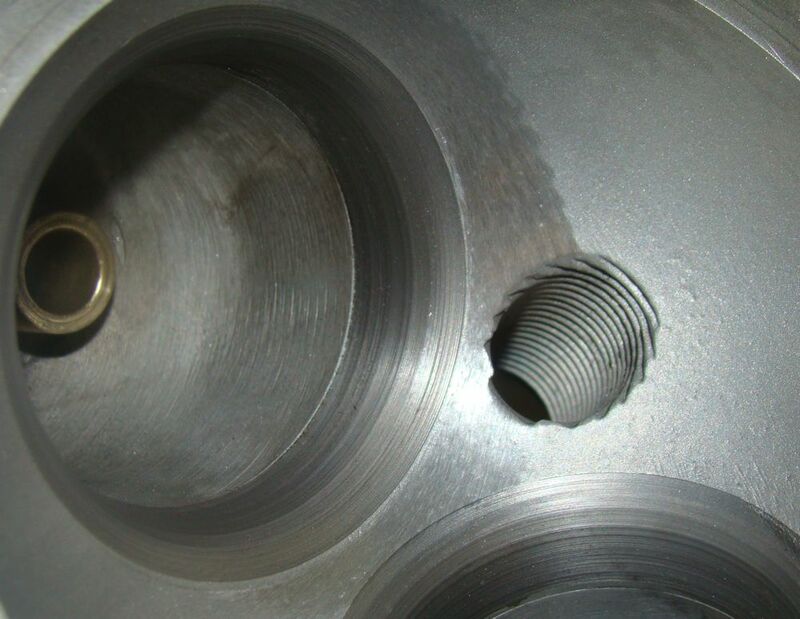 We achieved this by cutting the female threaded section of a later sump and brazing it to a new tank. 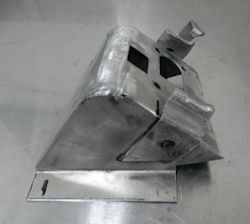 The finished result is indistinguishable from an early sump and tank. 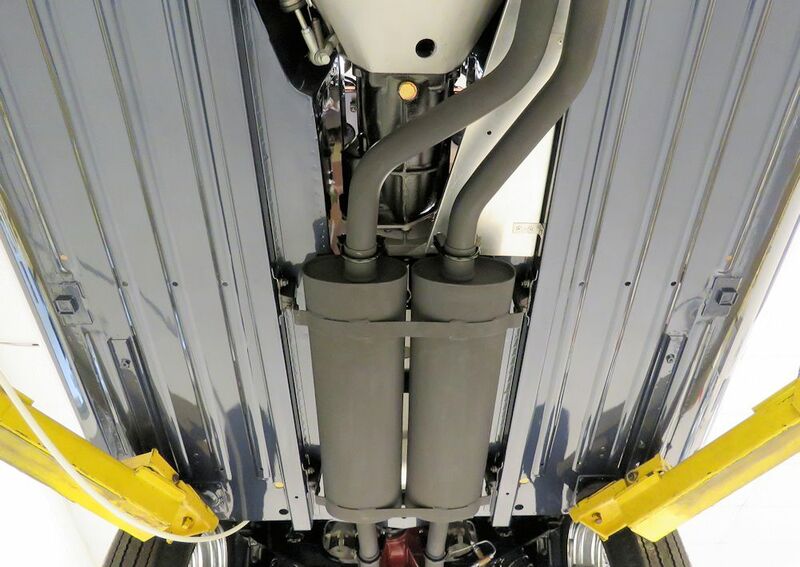 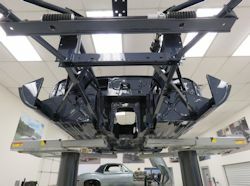 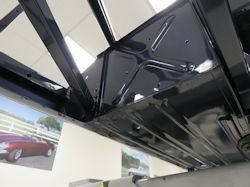 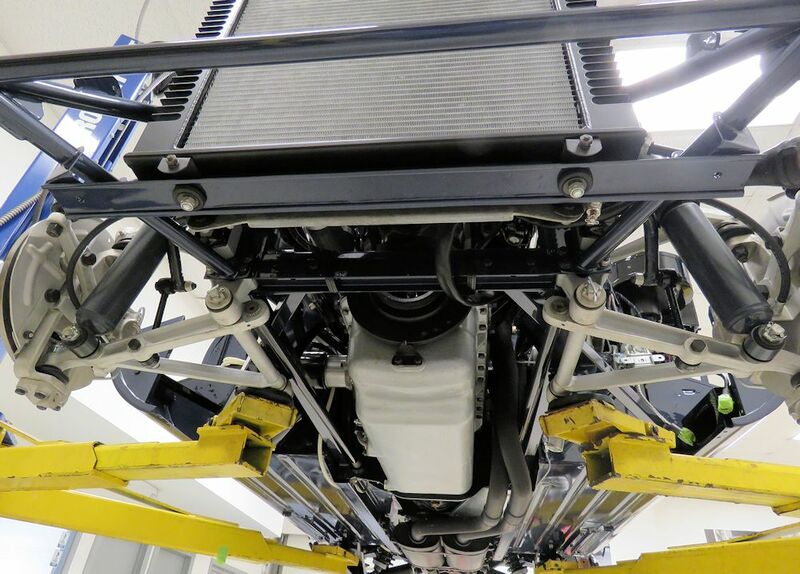 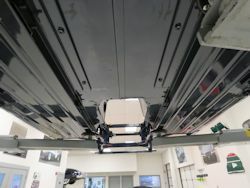 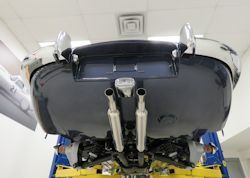 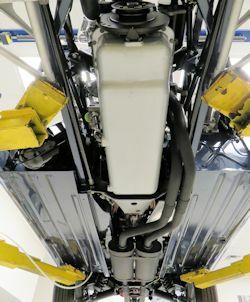 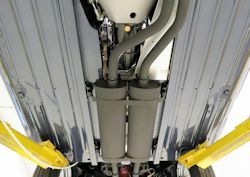 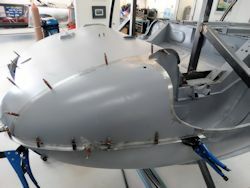 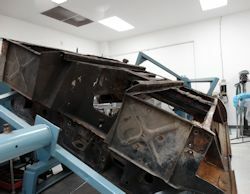 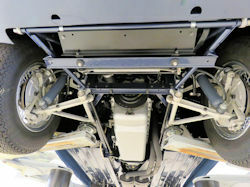 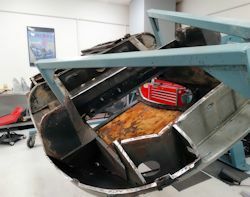 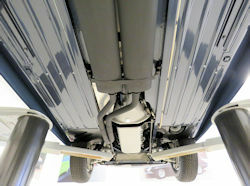 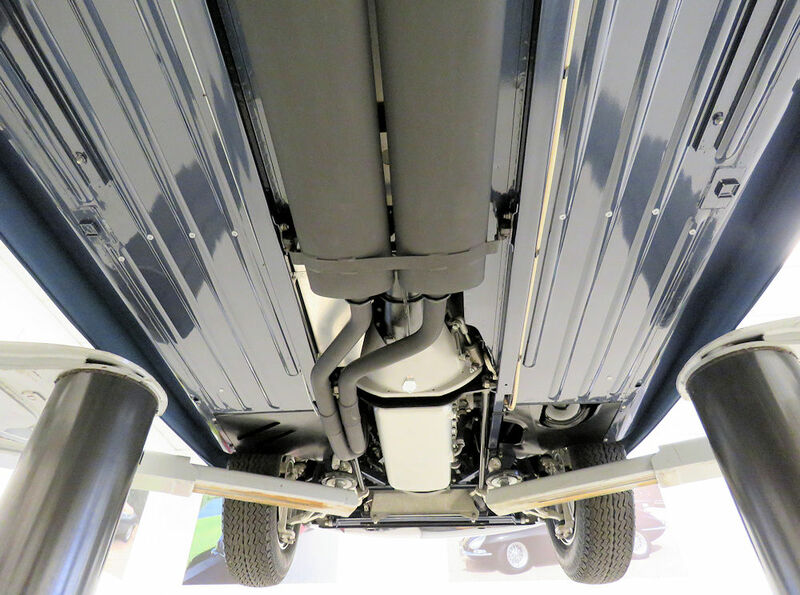 With the body on one of the workshop lifts to have the IRS installed, it was a good opportunity to snap a few photographs showing the underside of the car. 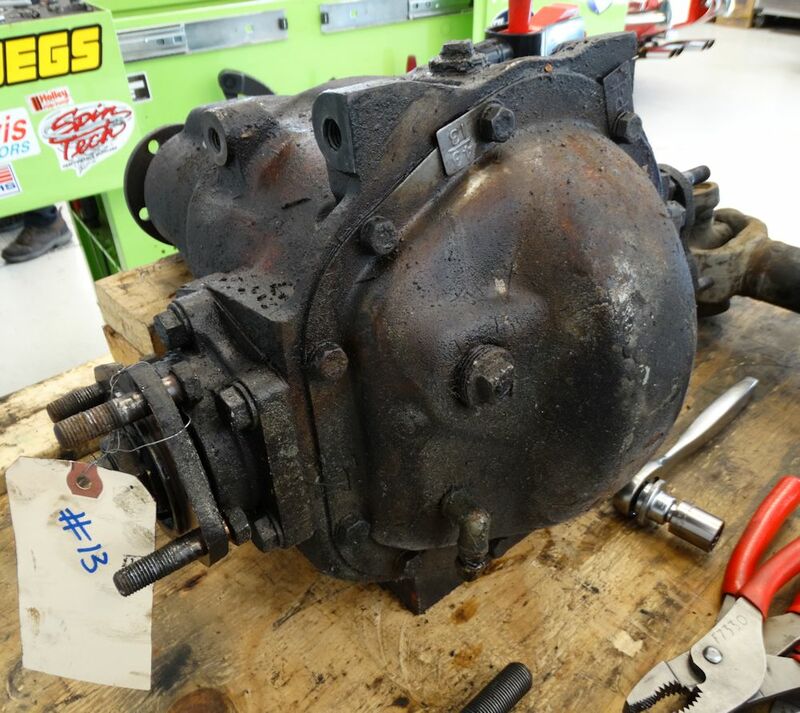 Time to put 885013 back on its wheels! 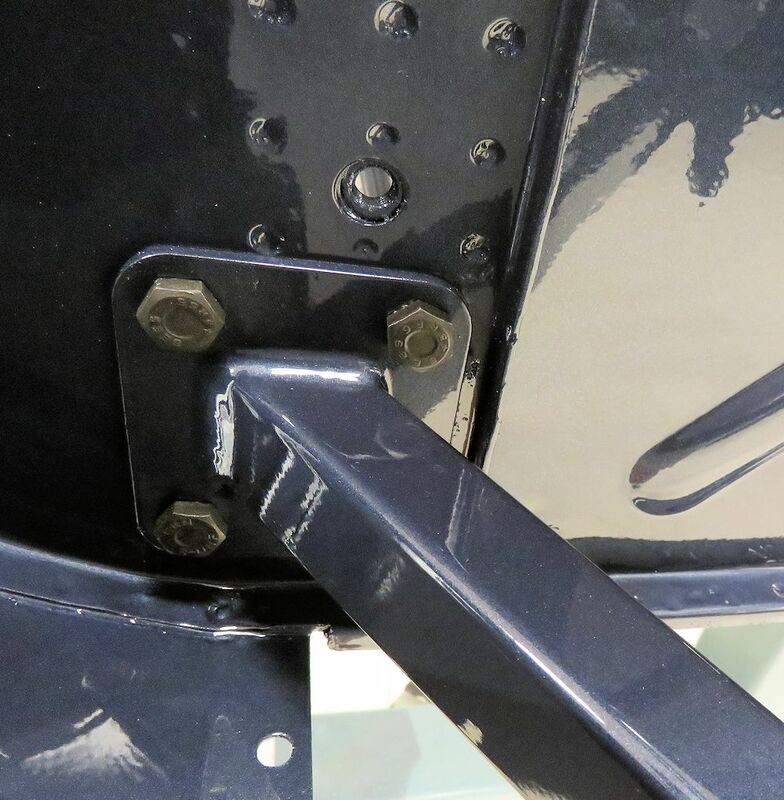 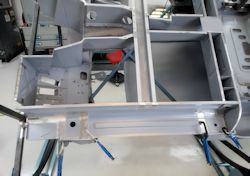 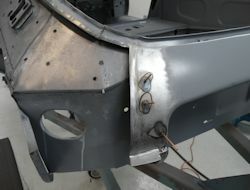 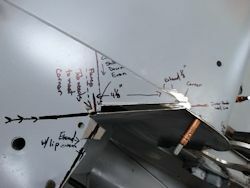 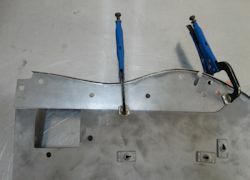 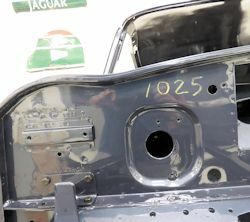 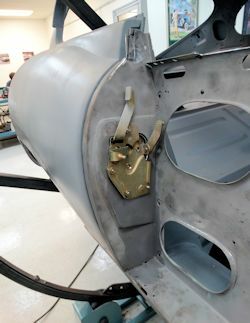 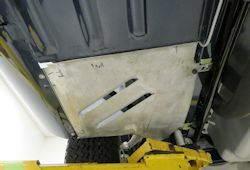 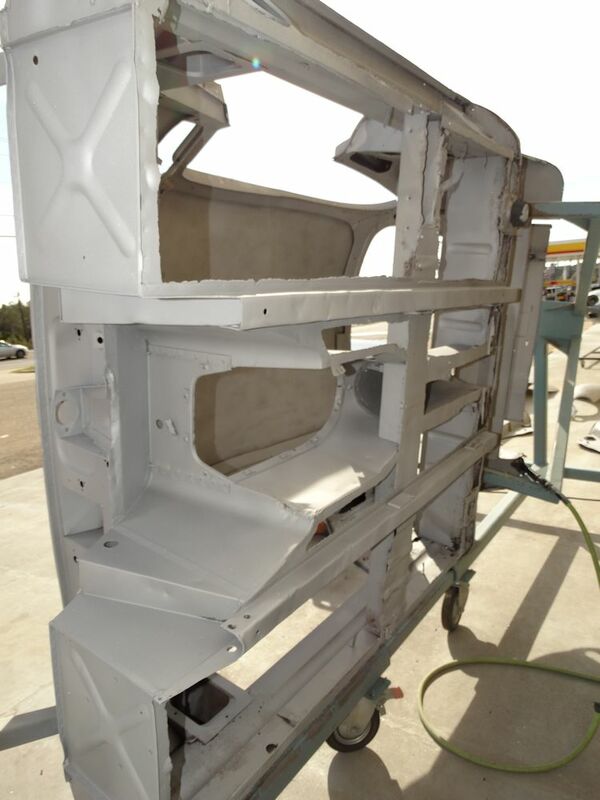 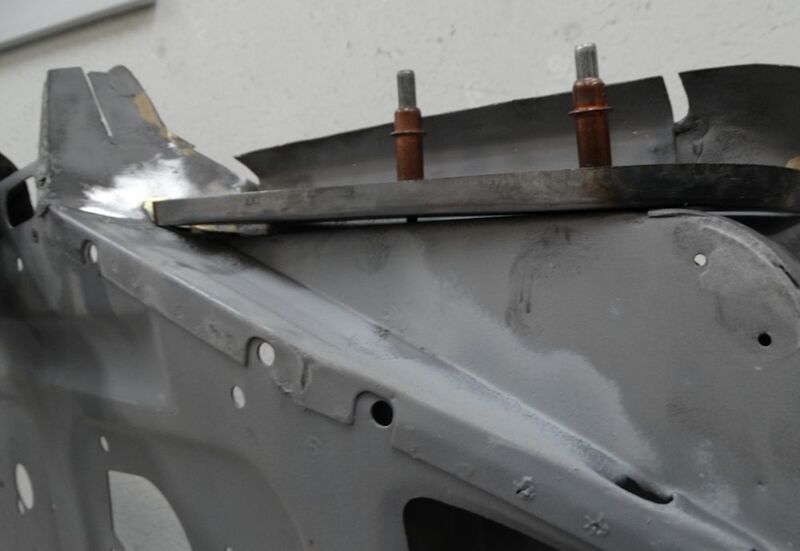 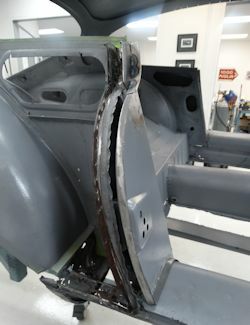 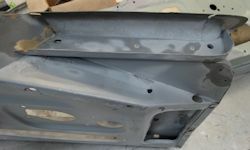 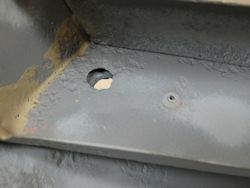 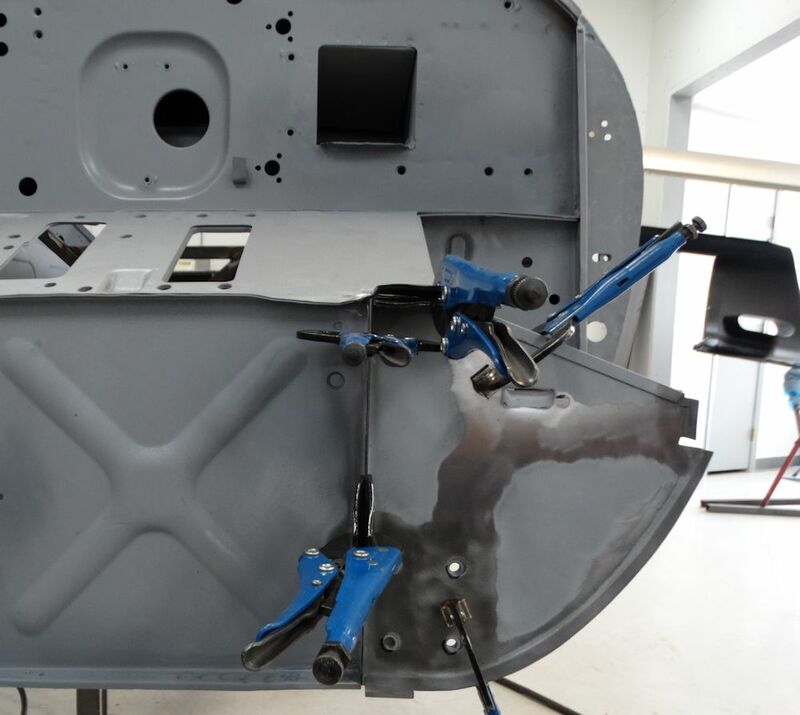 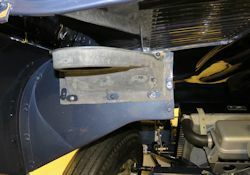 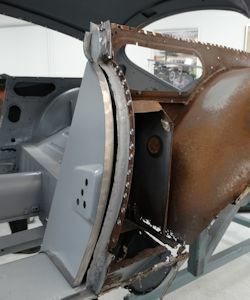 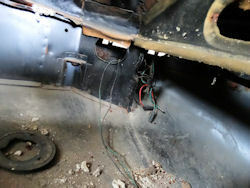 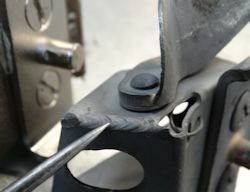 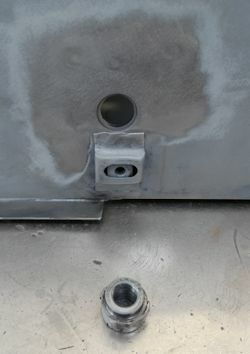 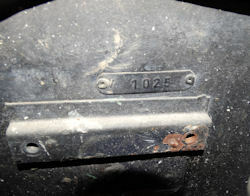 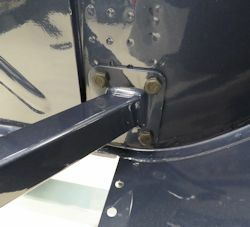 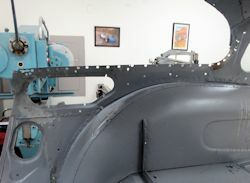 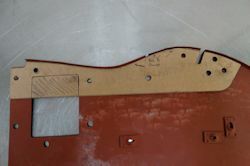 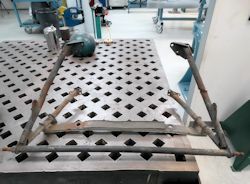 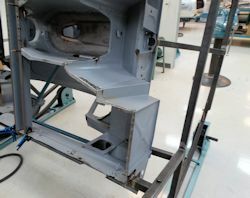 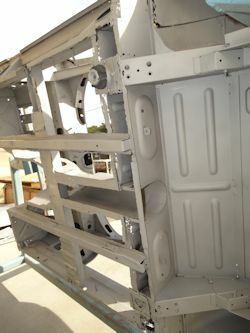 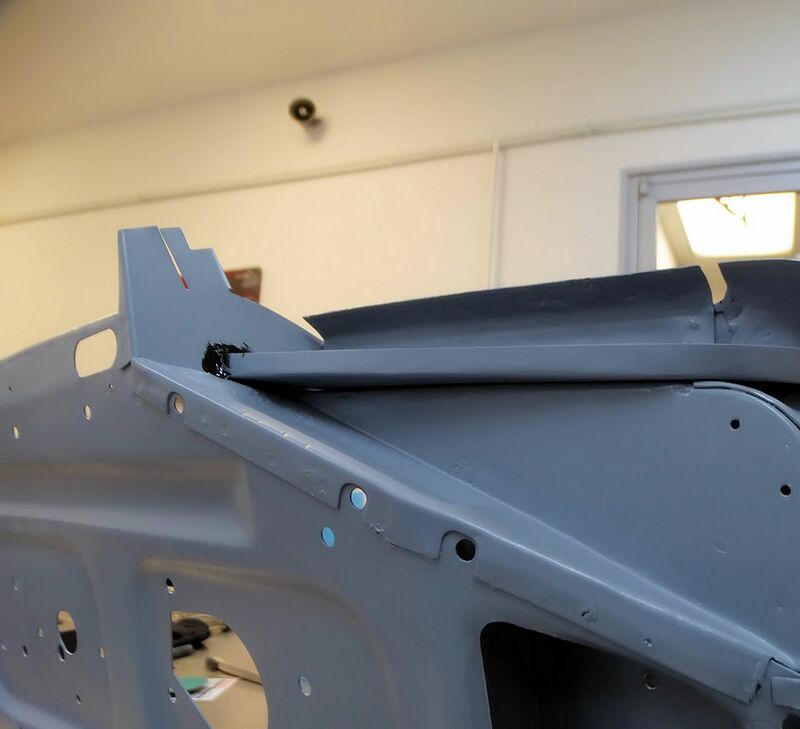 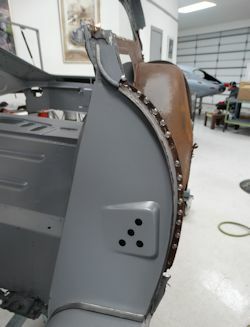 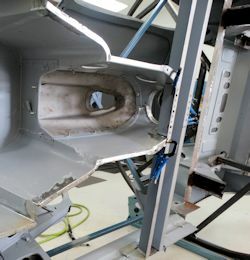 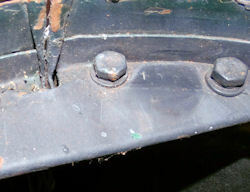 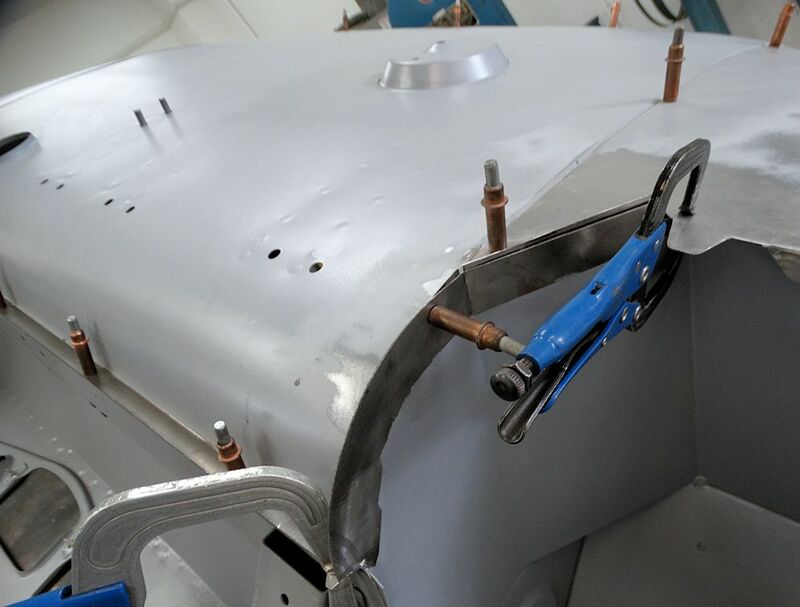 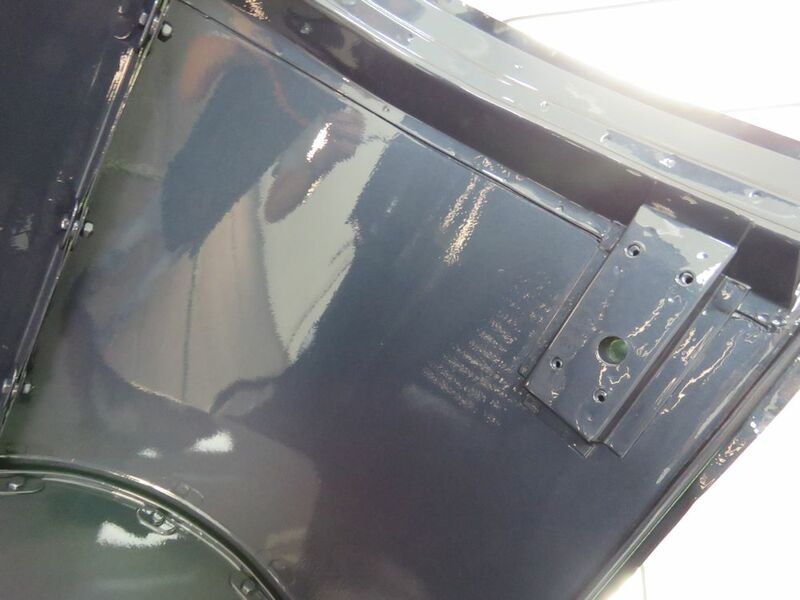 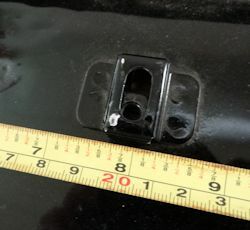 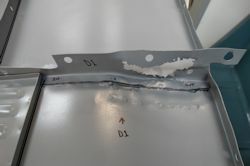 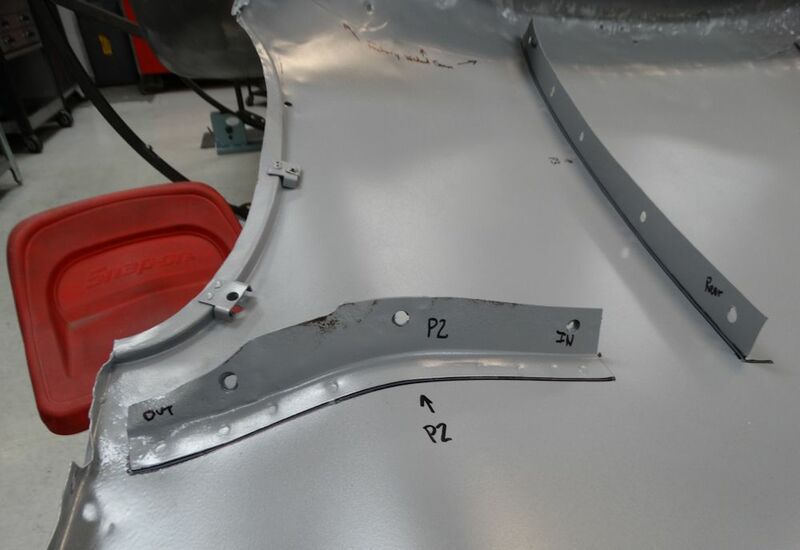 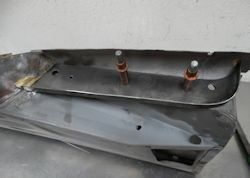 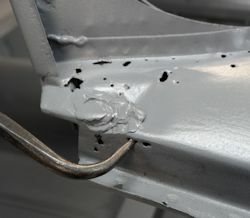 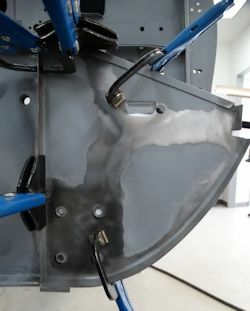 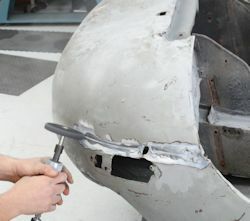 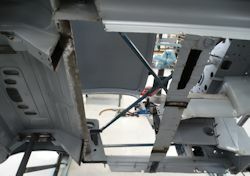 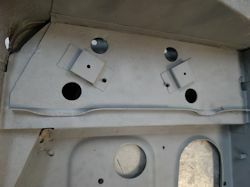 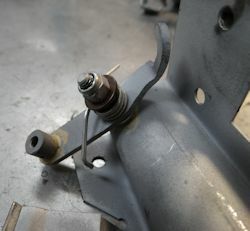 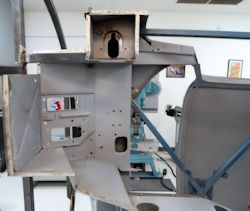 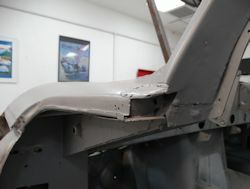 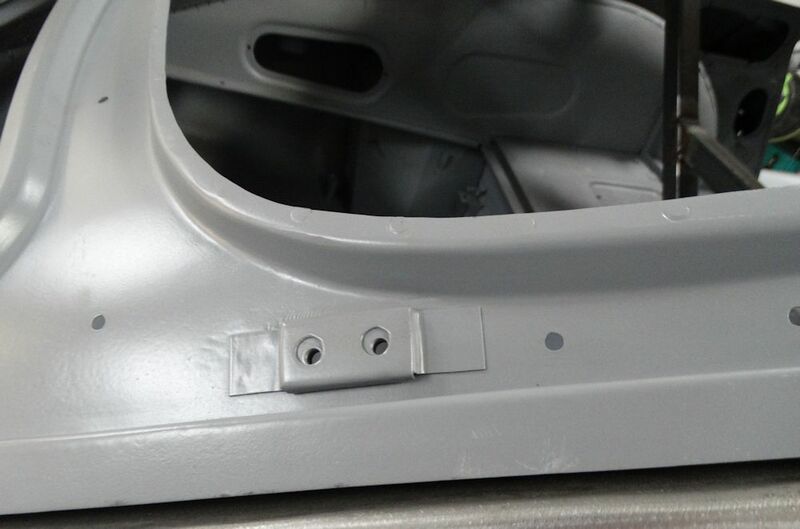 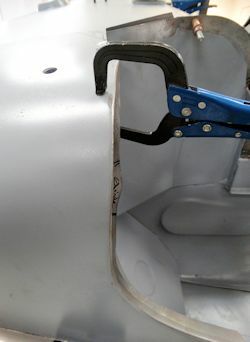 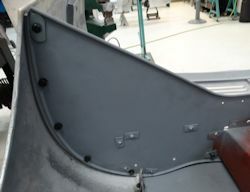 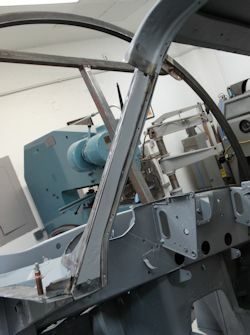 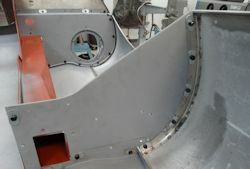 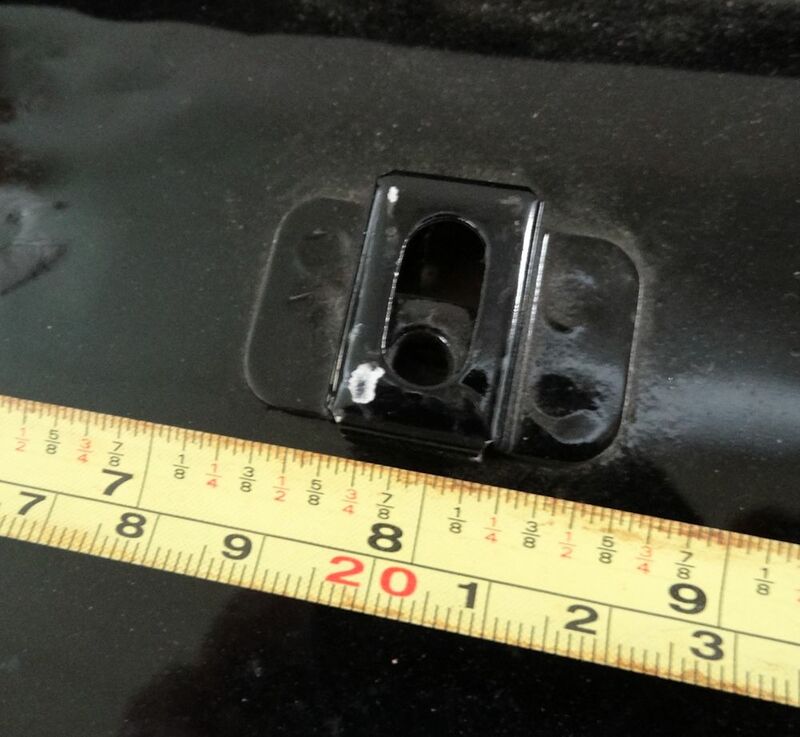 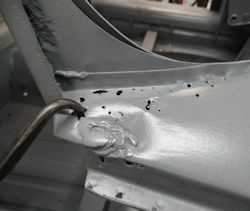 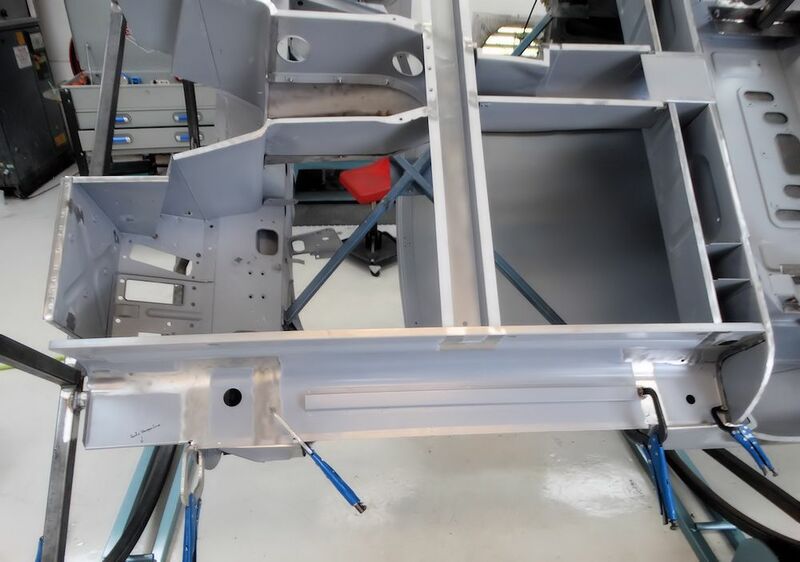 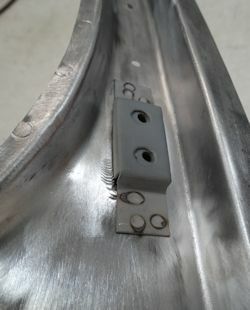 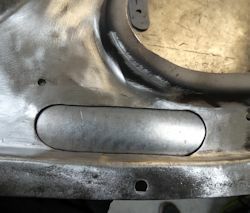 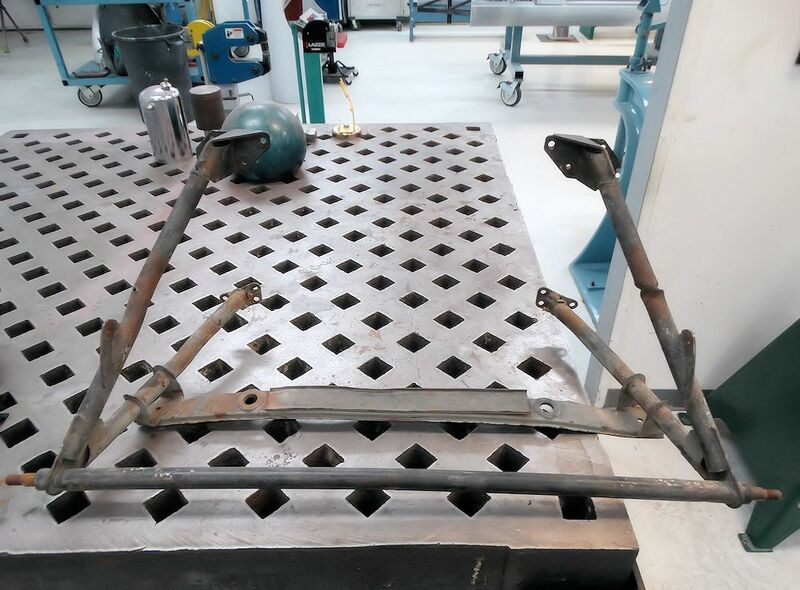 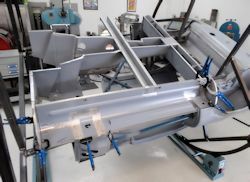 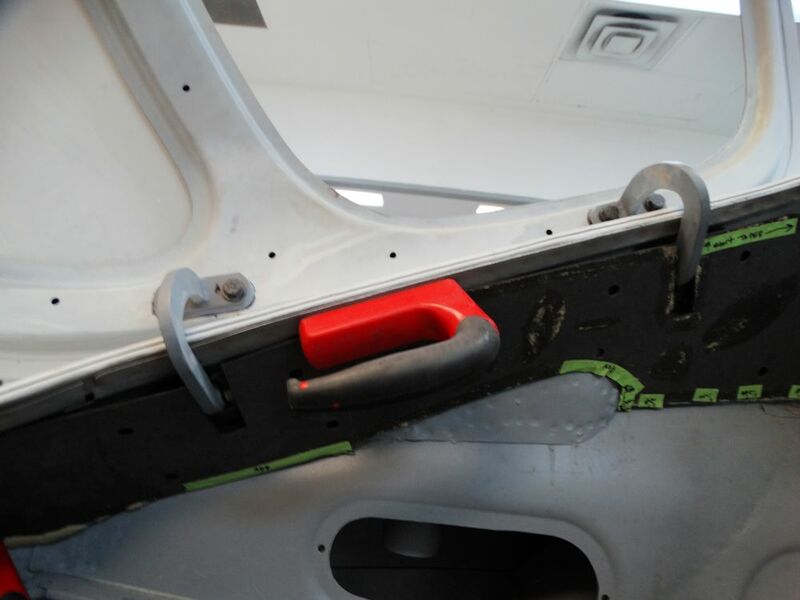 The following sequence of photos show some of the very early features in the painted bonnet hinge frame, as well as the restoration and installation of the all important body number tag on the firewall. The bonnet and tailgate have now been completed. 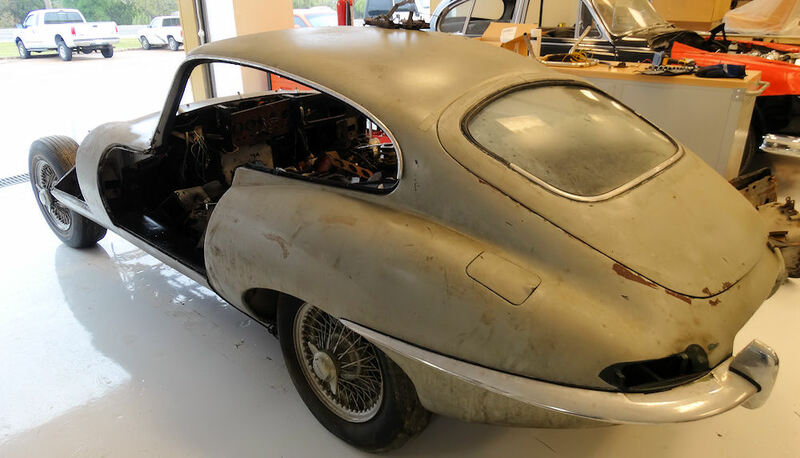 A huge amount of time and effort went into saving the bonnet for this car as 885013 is believed to be one of just three of the outside latch coupes that still has its original bonnet. 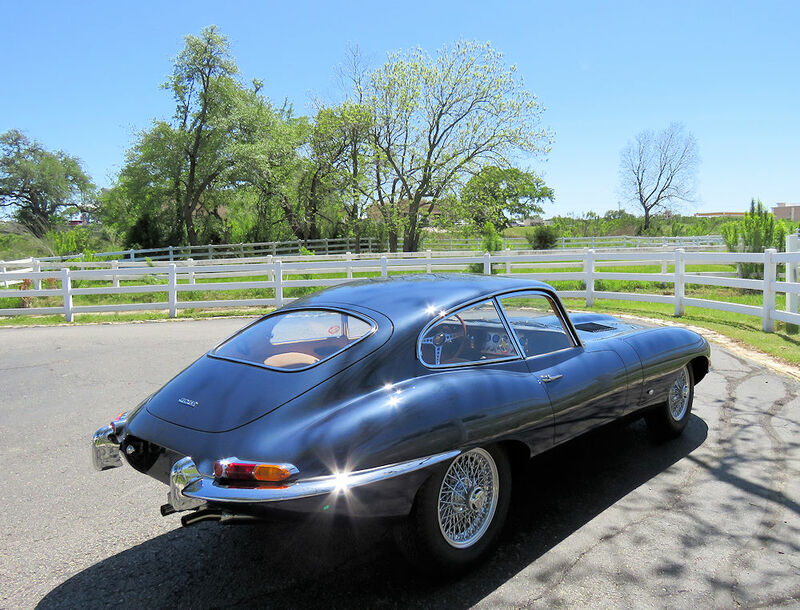 Opalescent Dark Blue is a color that really comes alive in the sunshine. 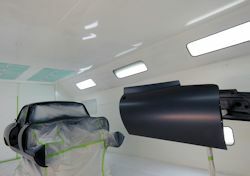 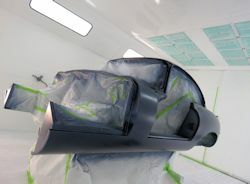 This afternoon Gerardo is painting the main body and doors. 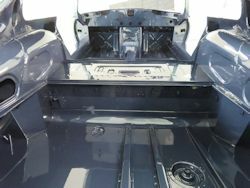 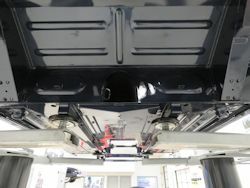 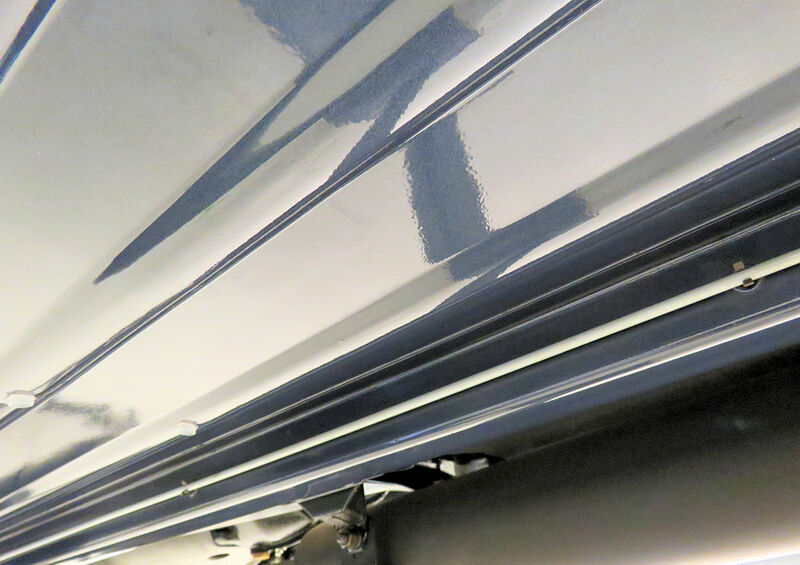 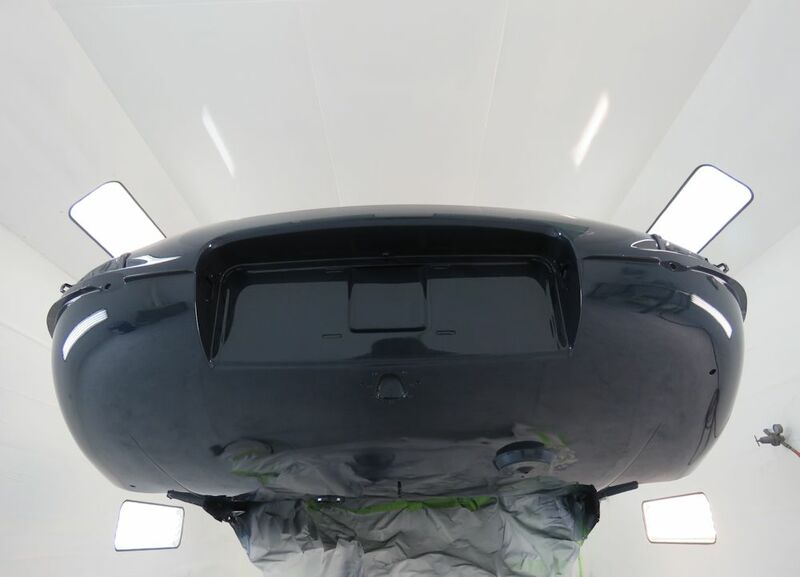 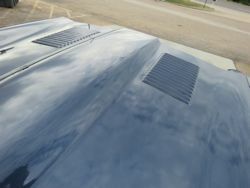 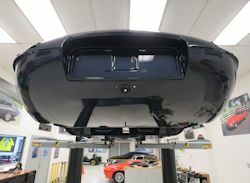 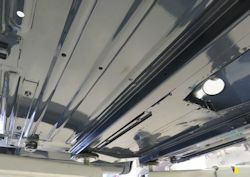 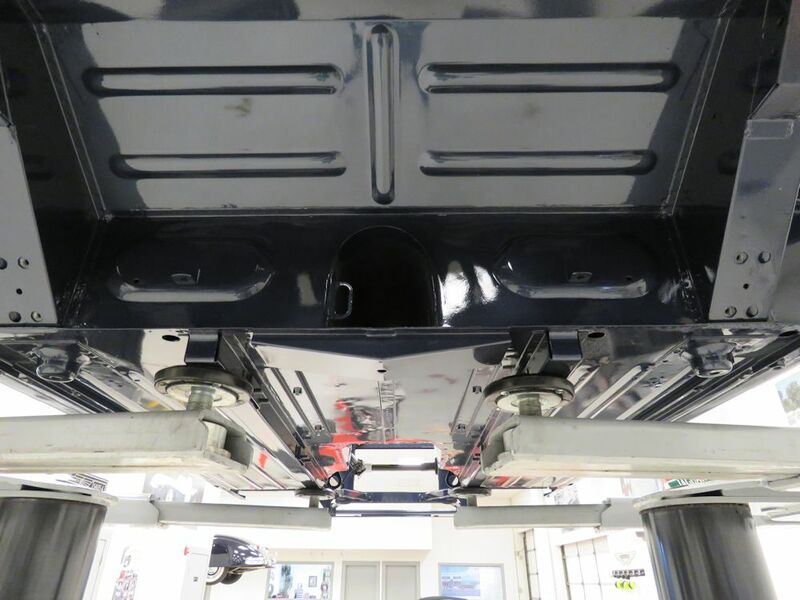 Painting the underside of the bonnet and the main floors. It is finally time to apply the first of the Opalescent Dark Blue paint. 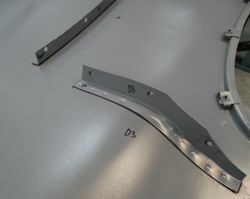 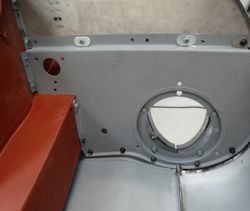 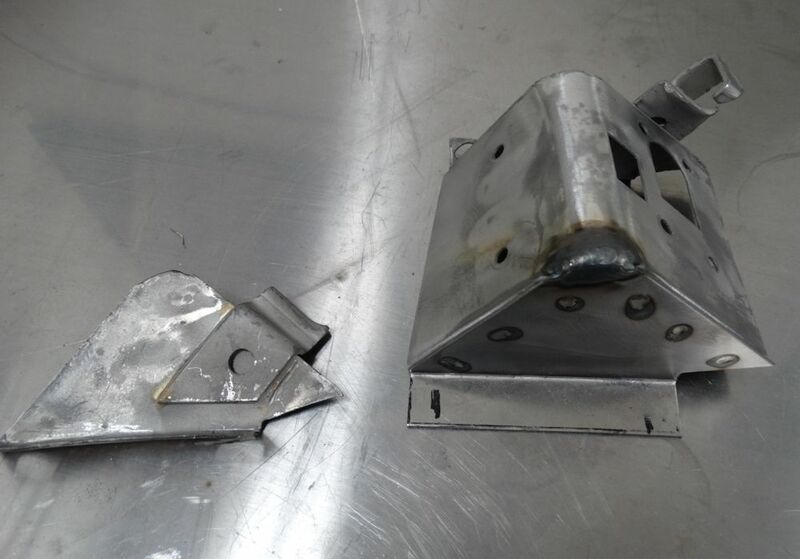 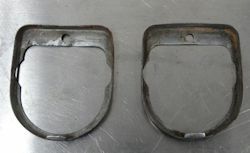 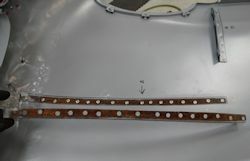 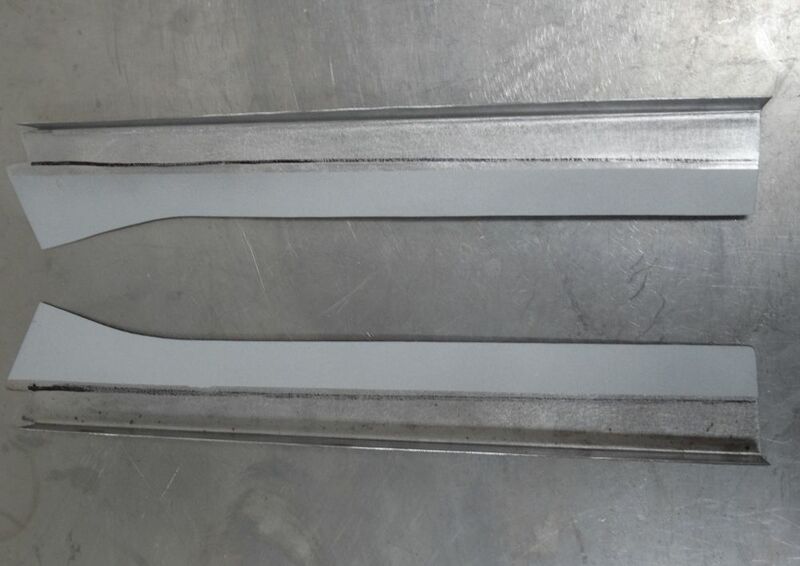 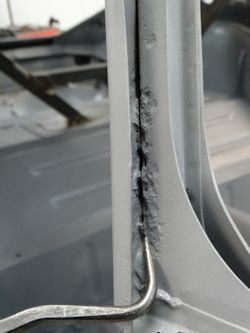 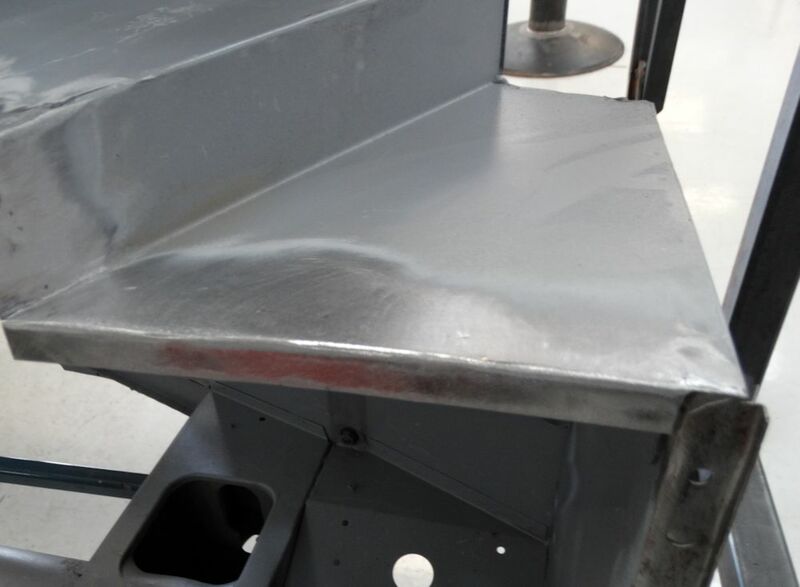 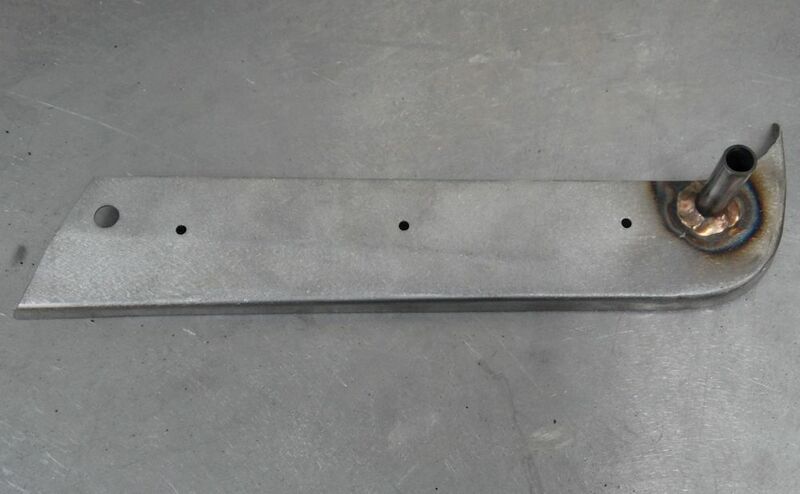 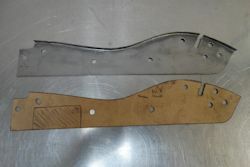 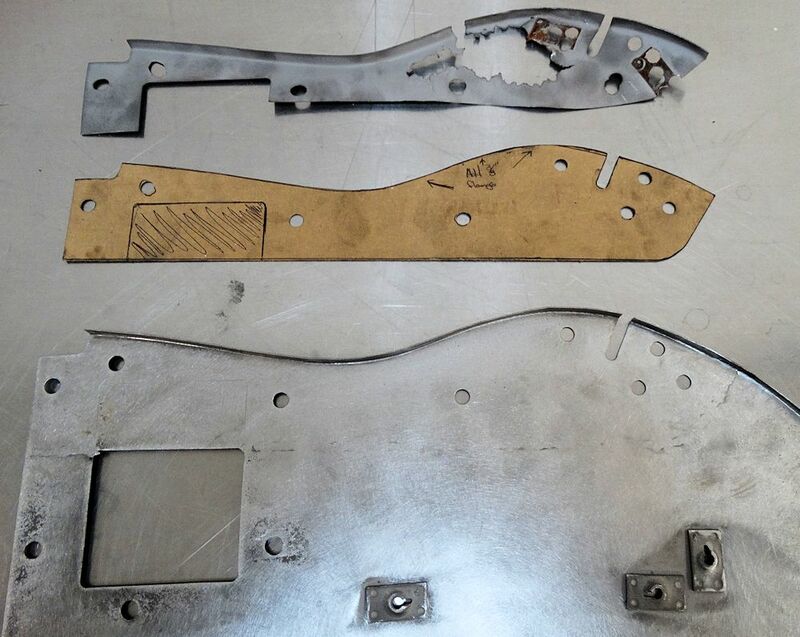 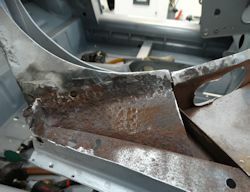 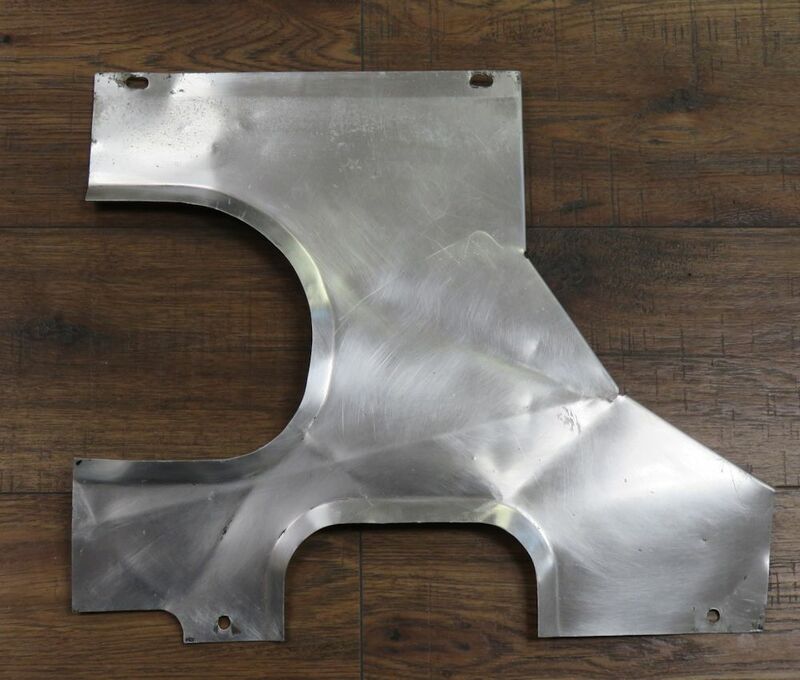 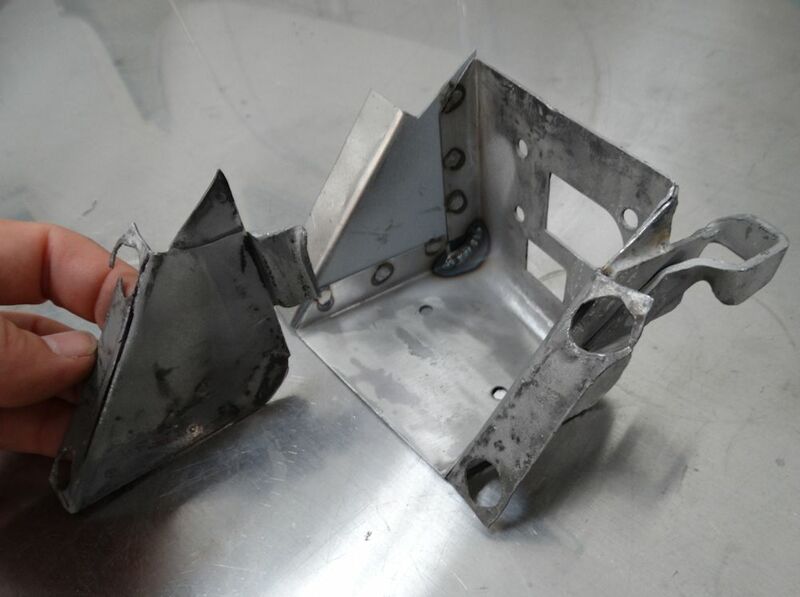 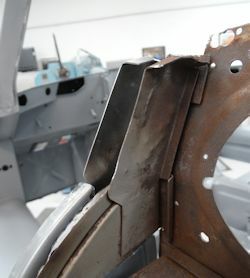 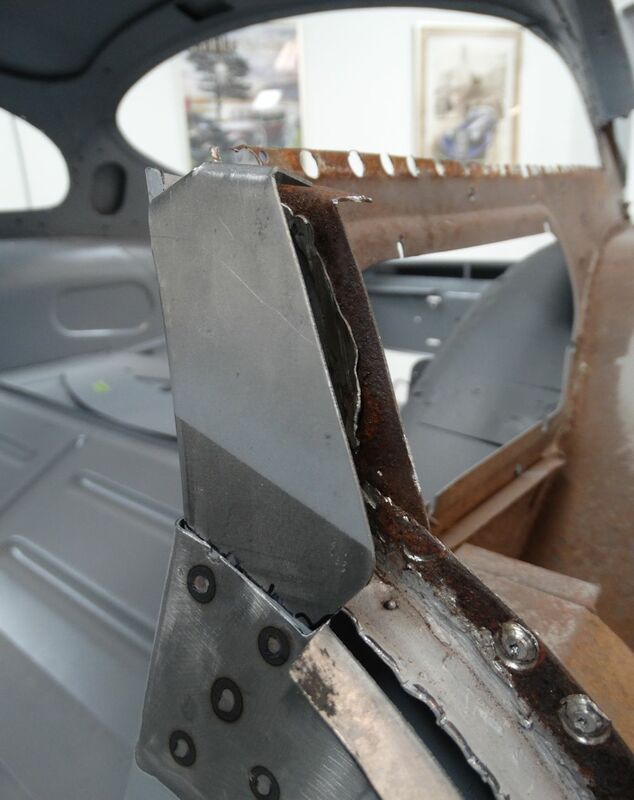 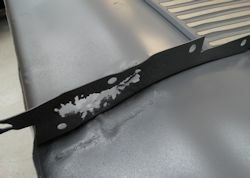 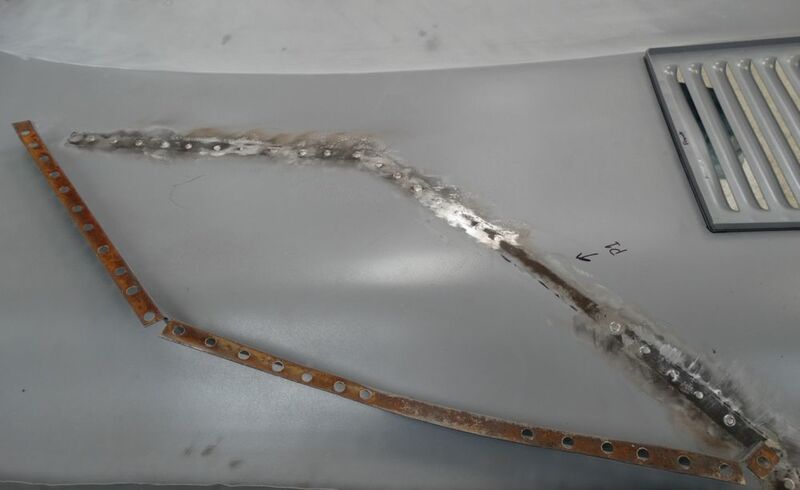 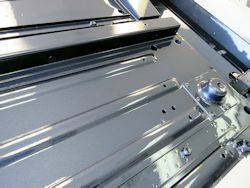 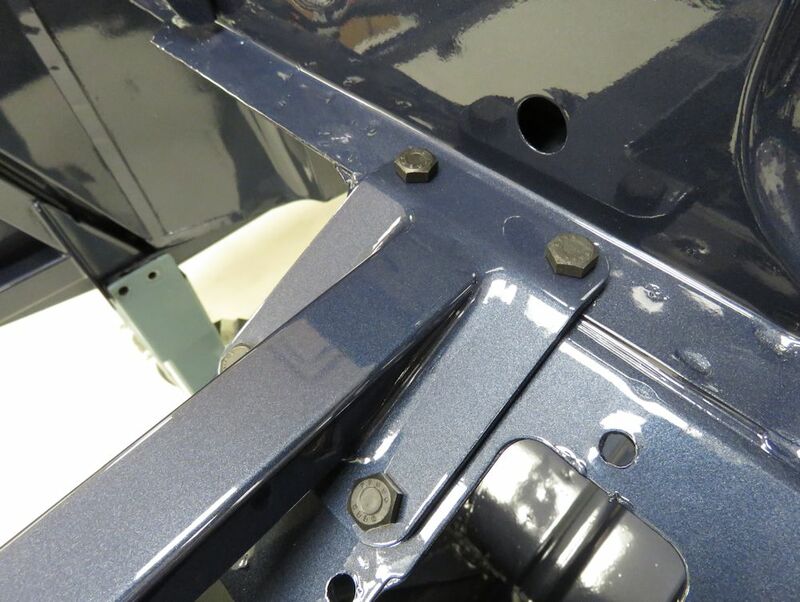 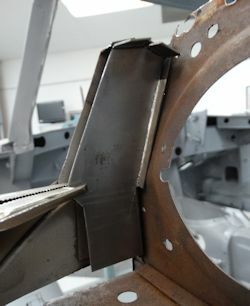 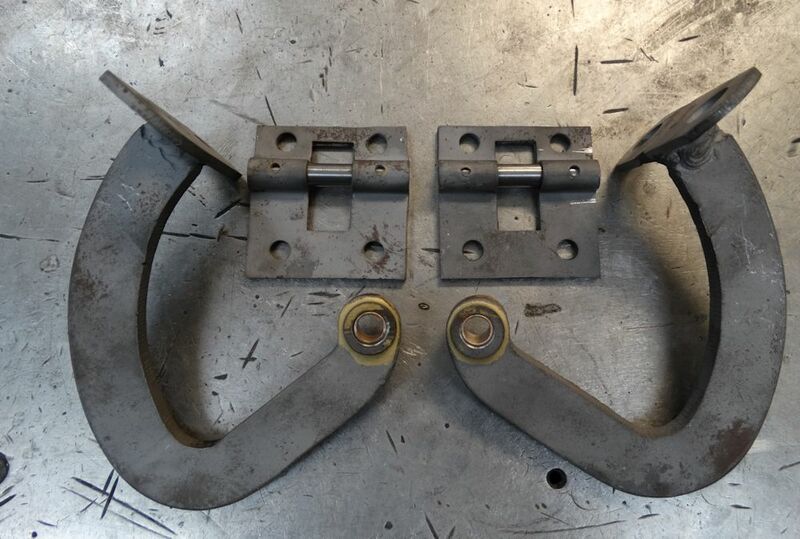 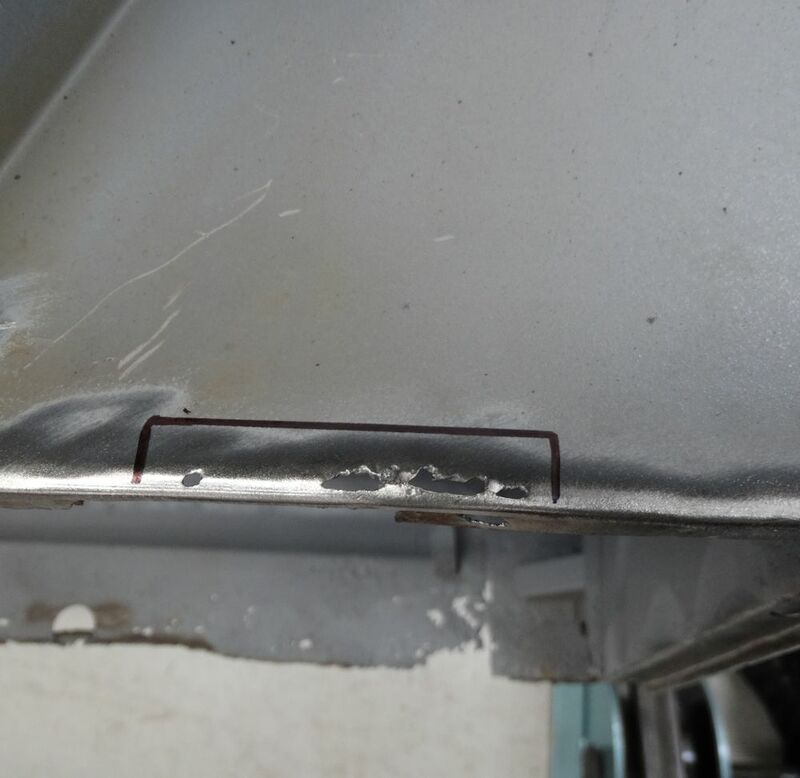 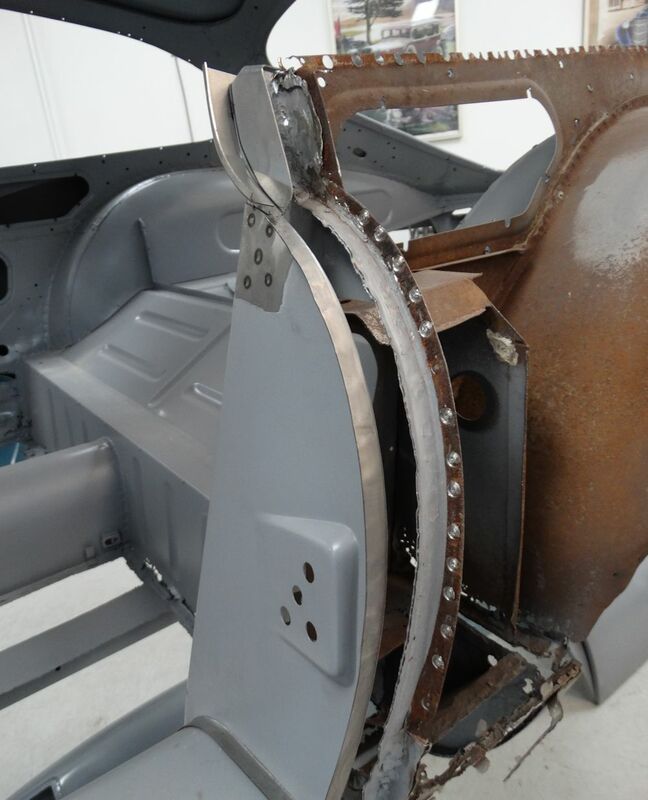 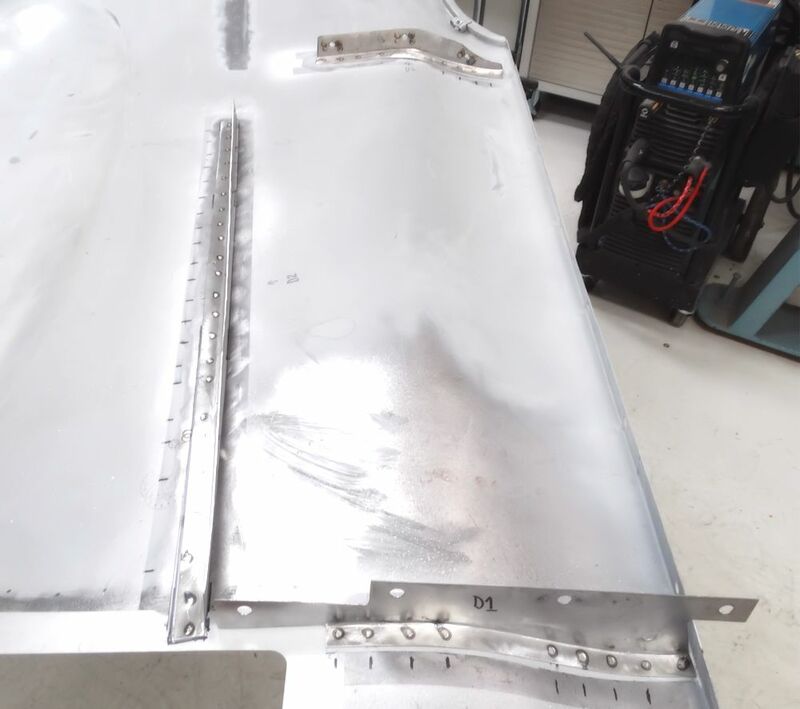 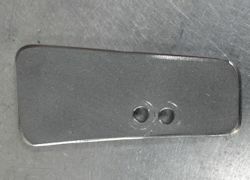 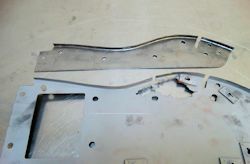 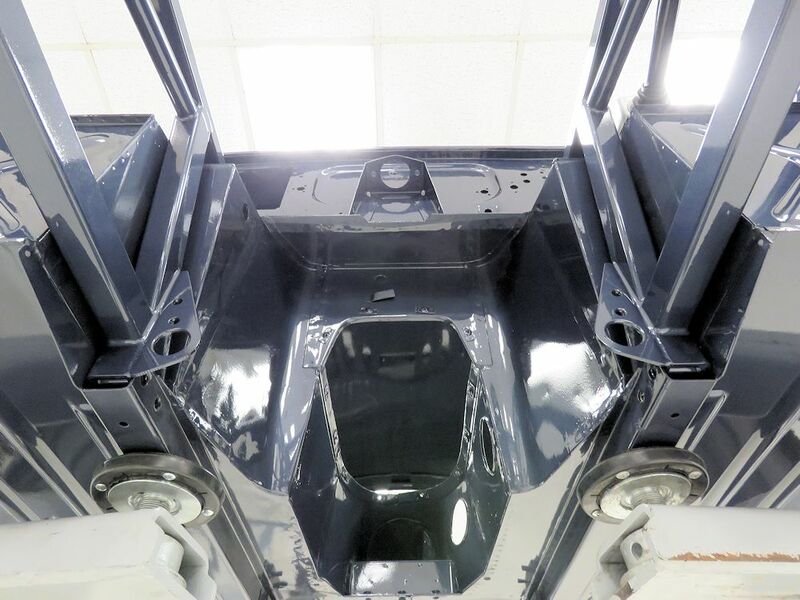 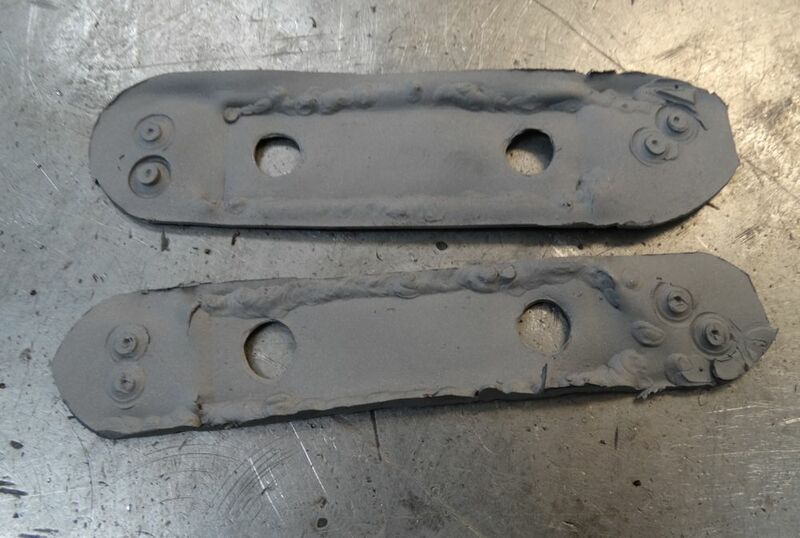 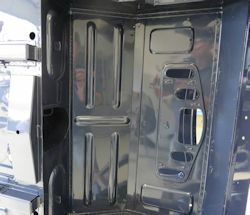 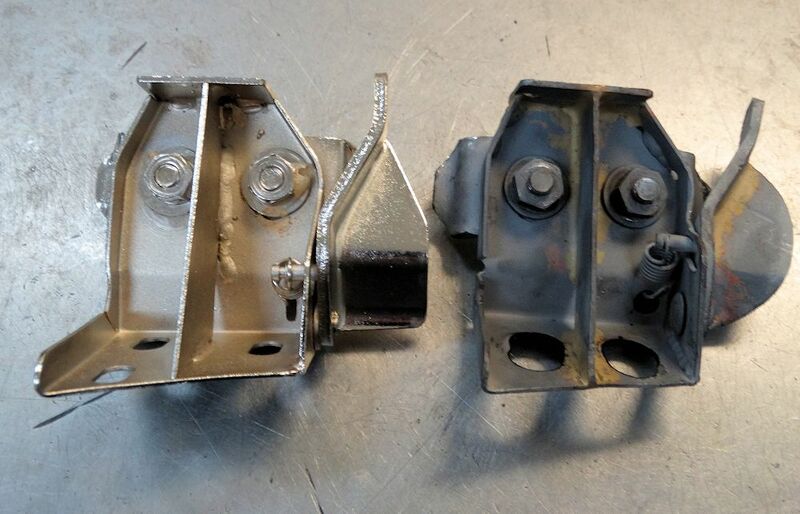 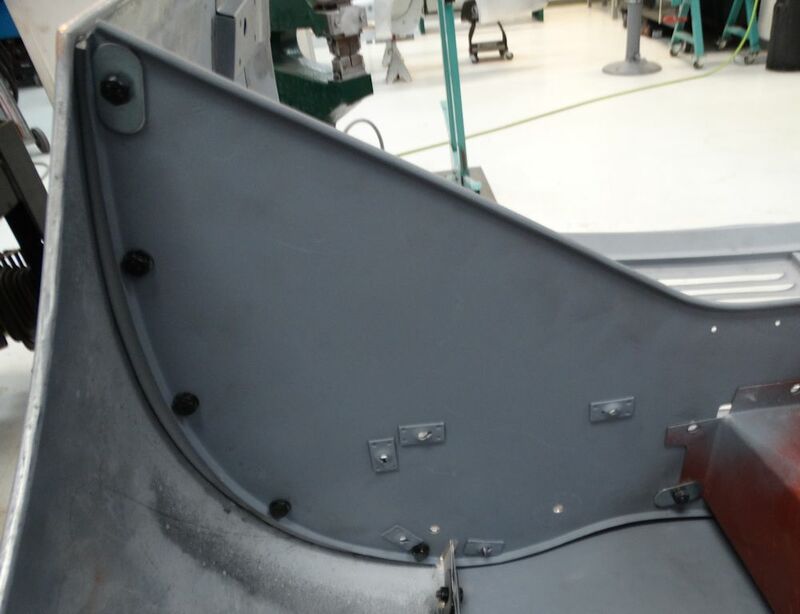 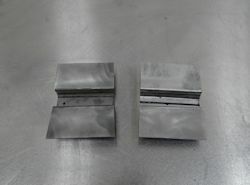 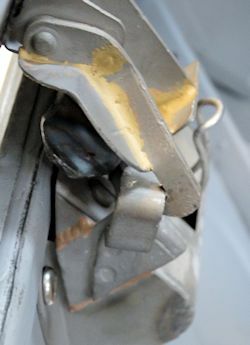 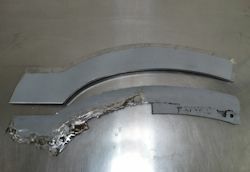 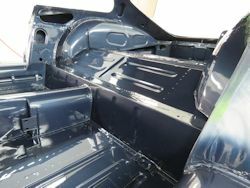 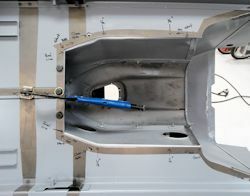 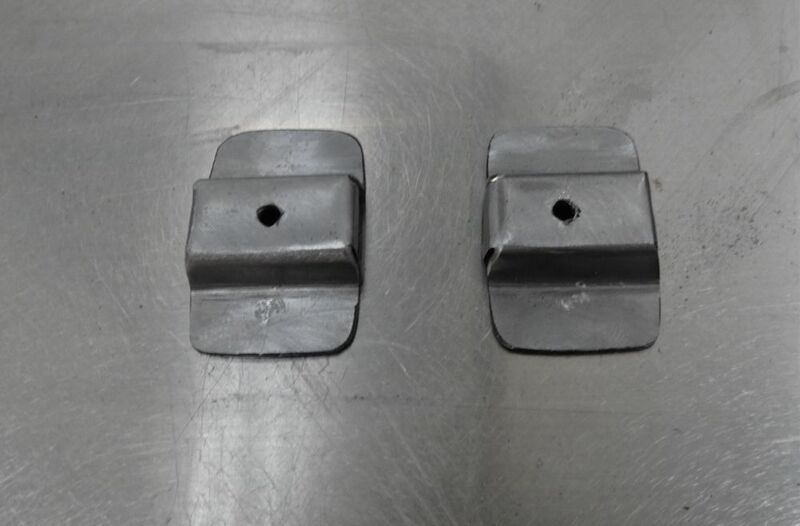 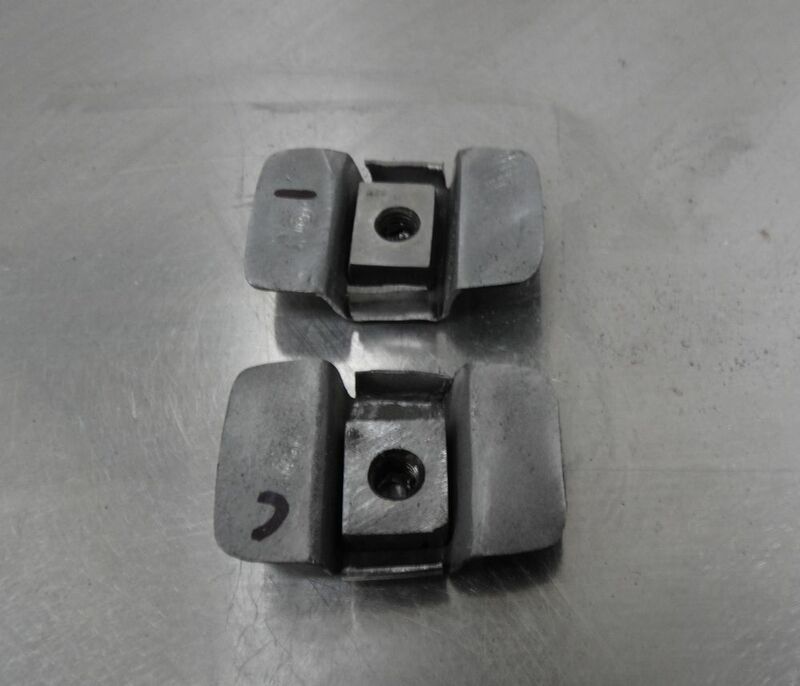 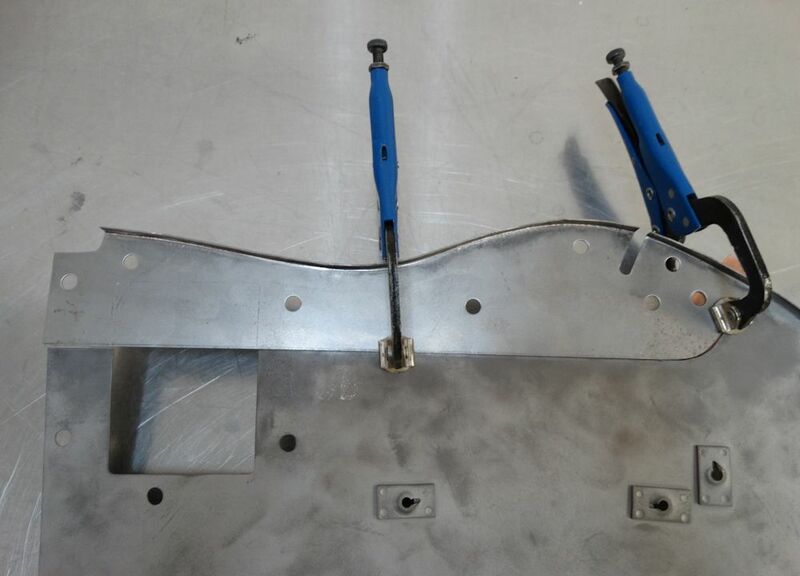 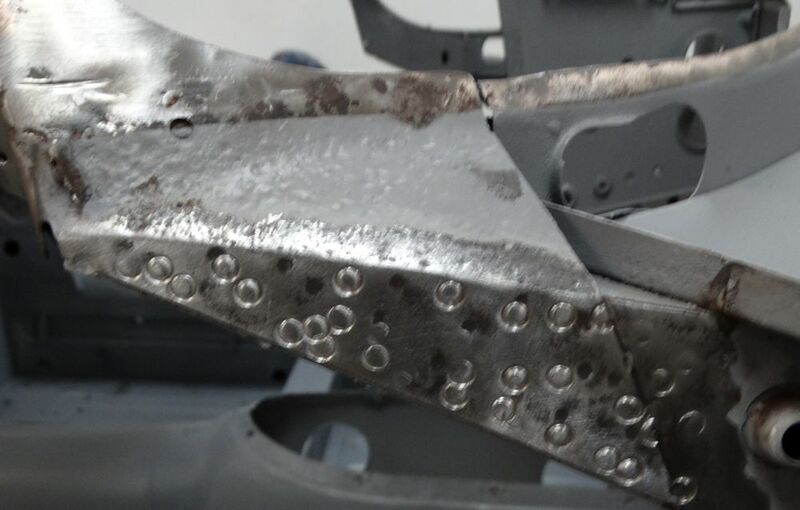 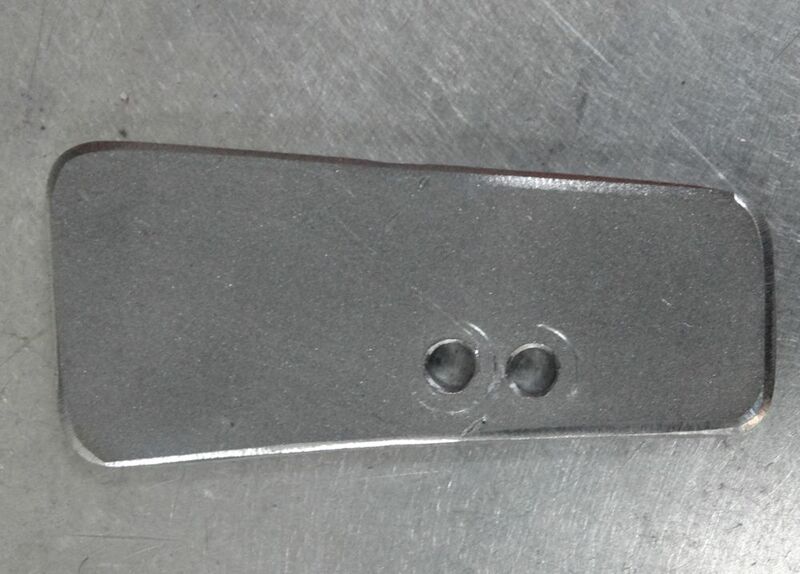 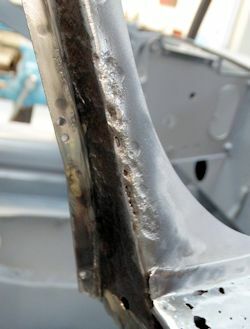 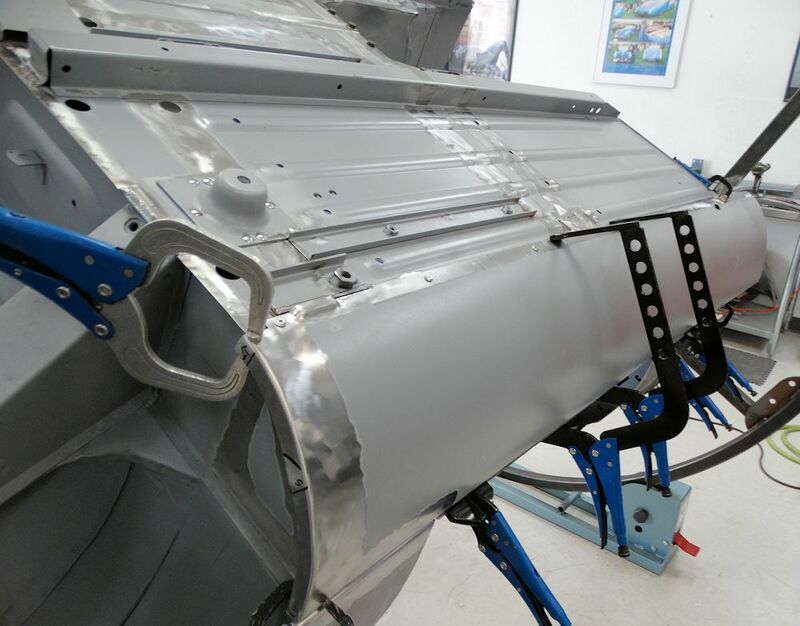 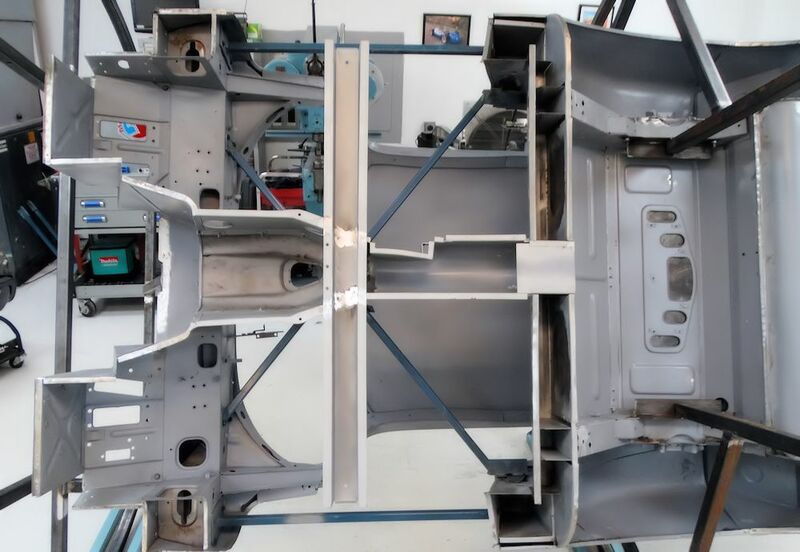 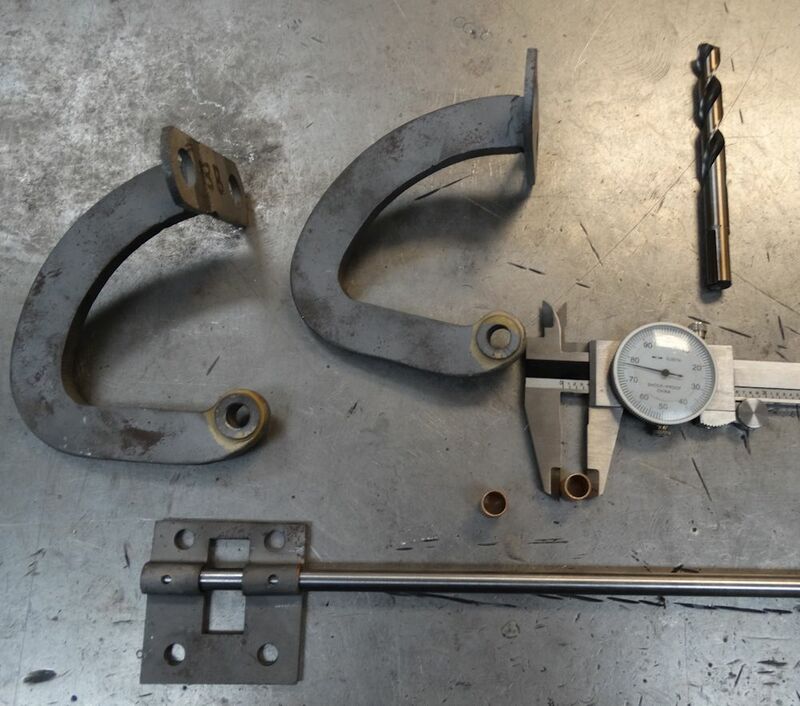 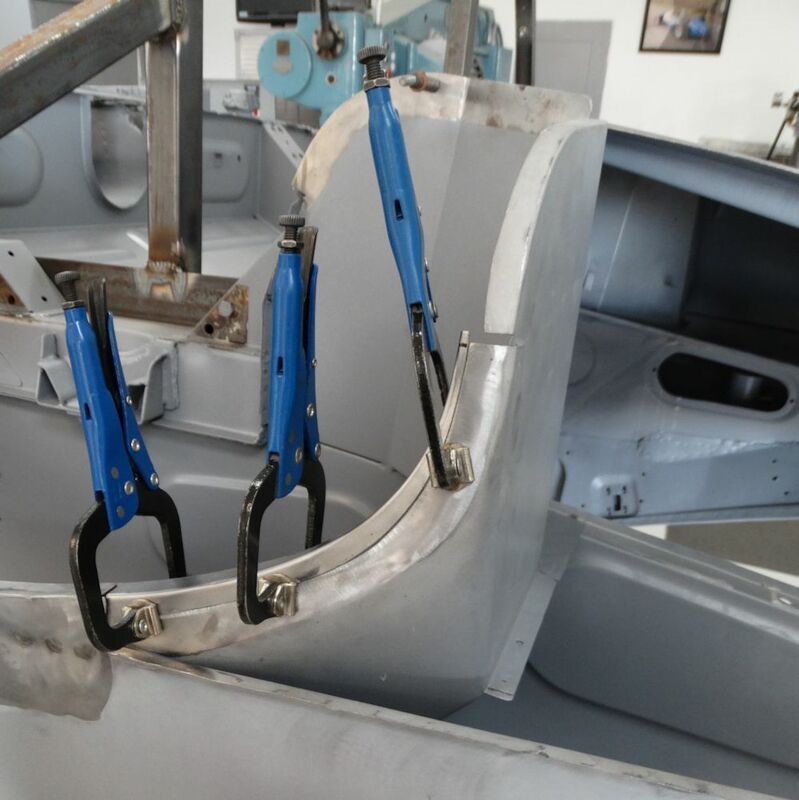 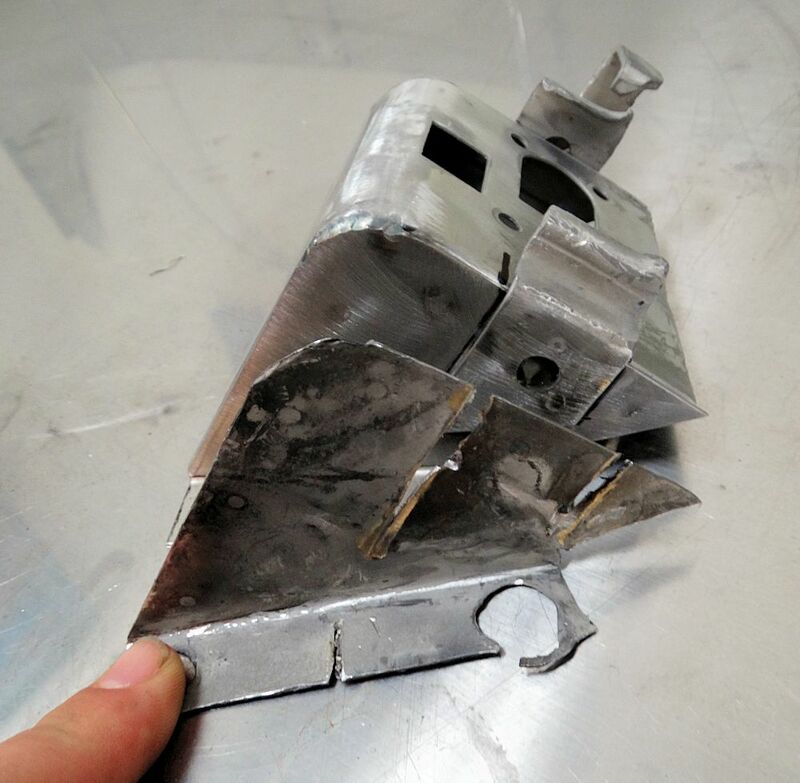 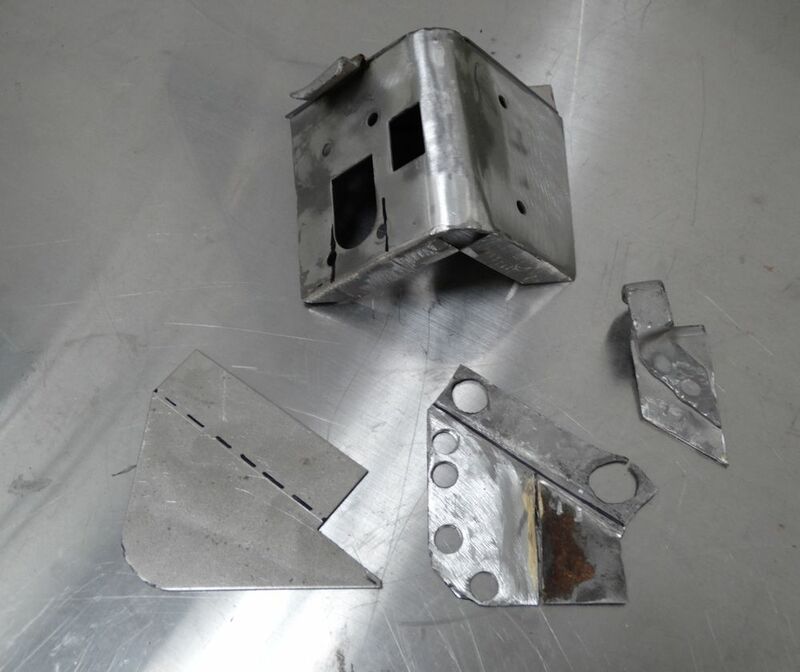 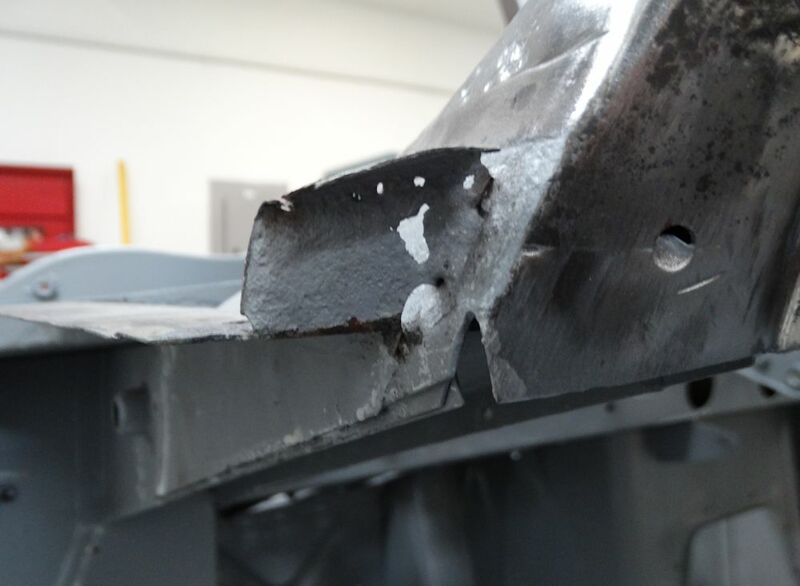 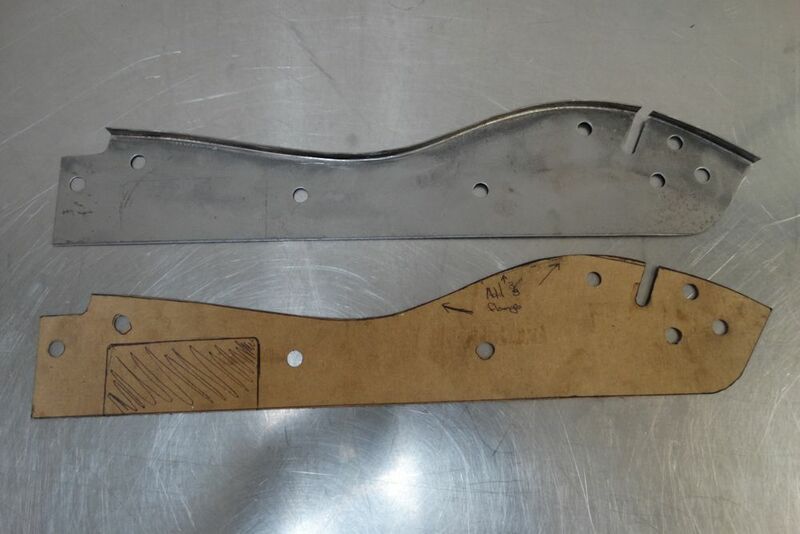 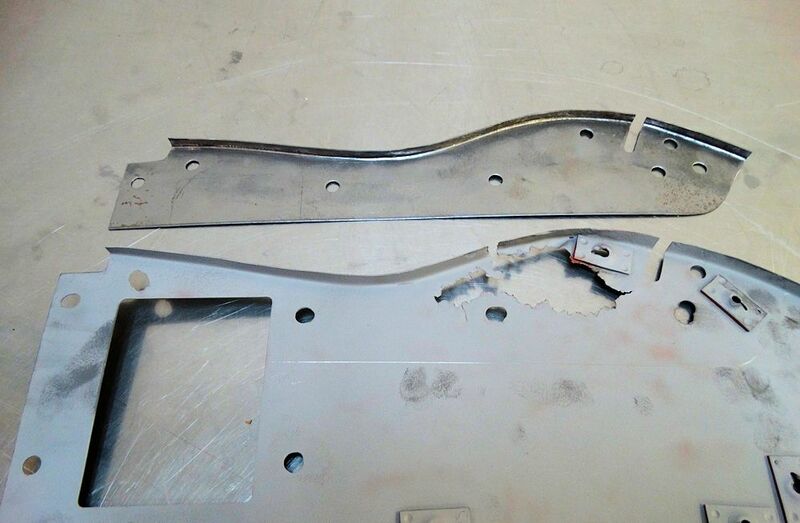 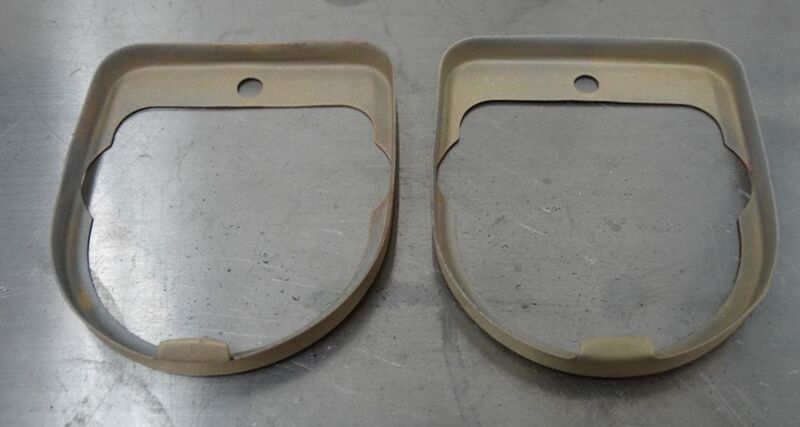 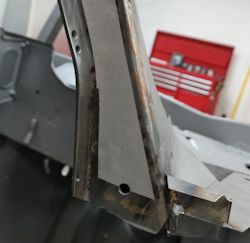 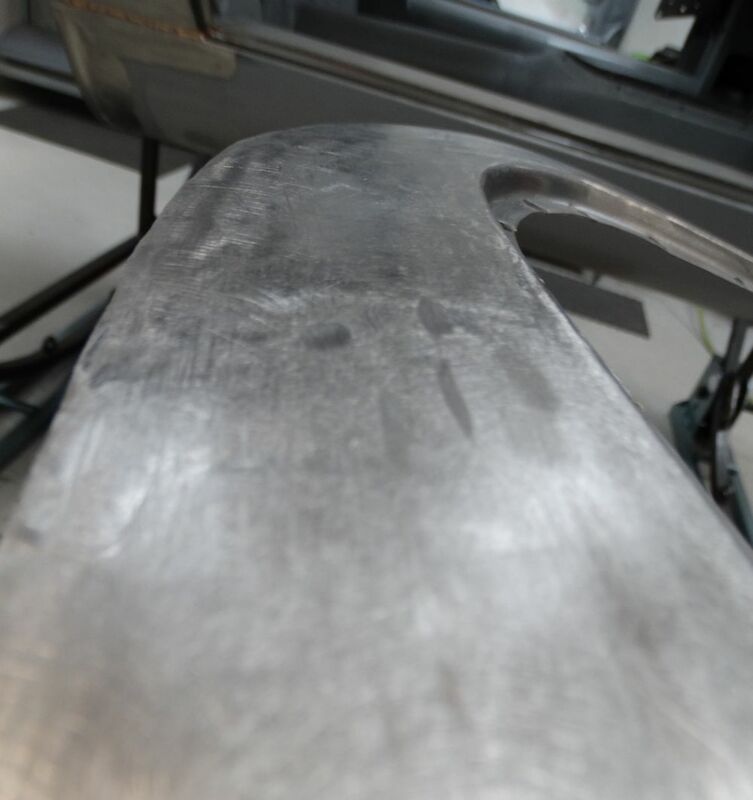 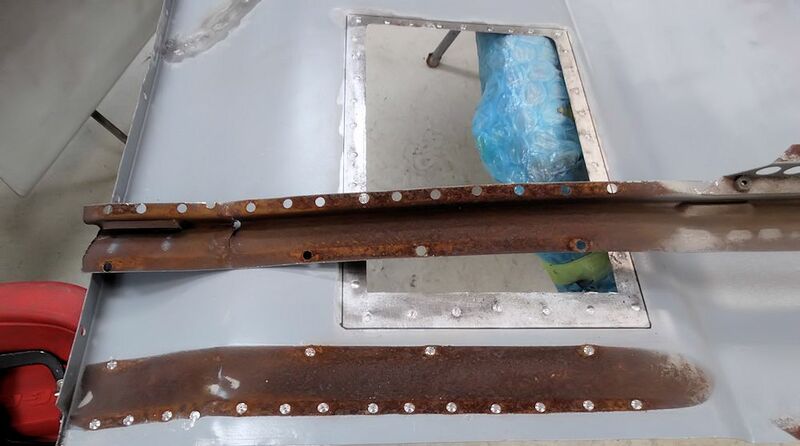 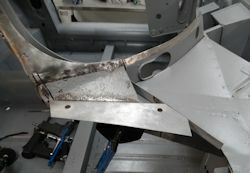 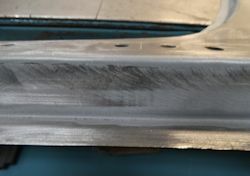 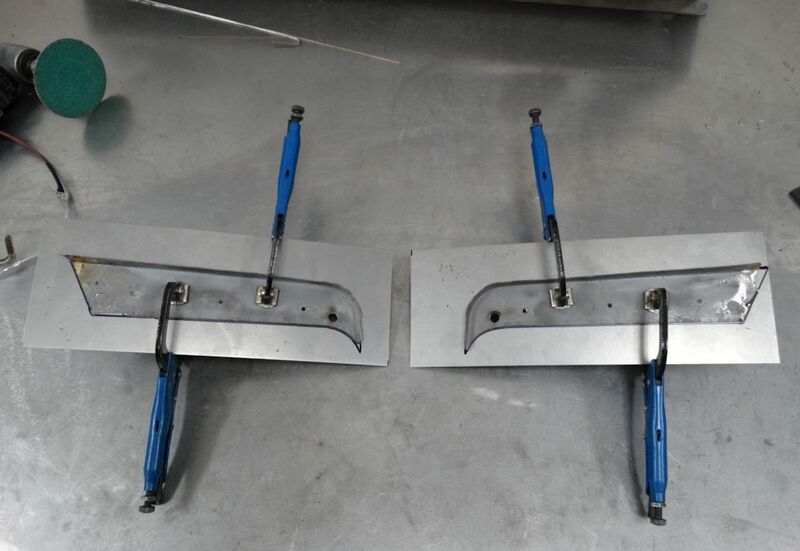 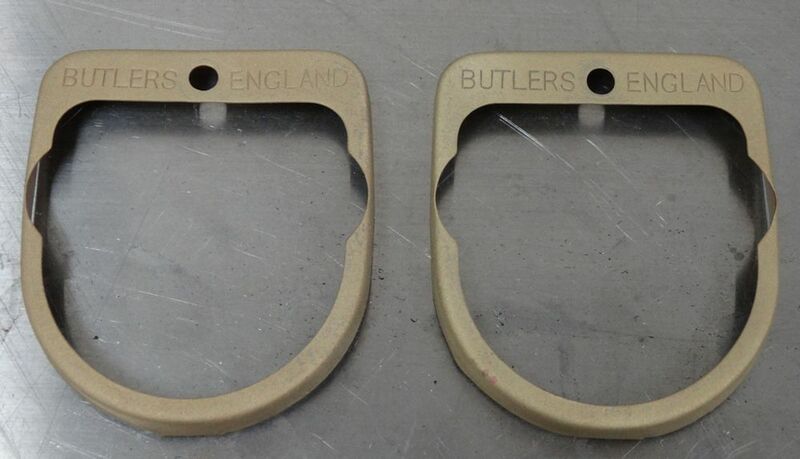 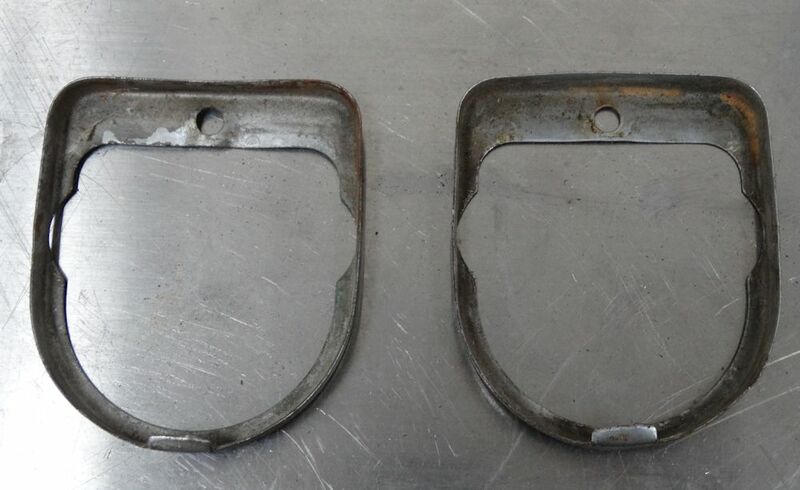 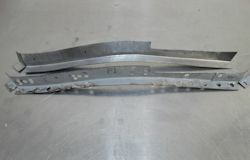 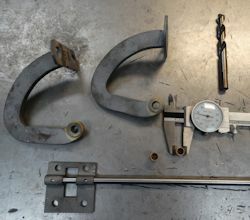 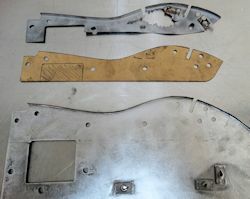 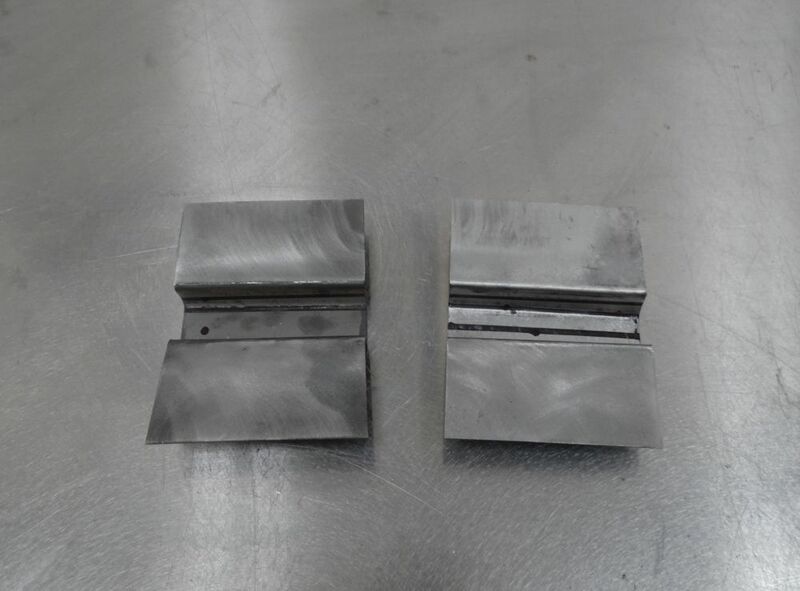 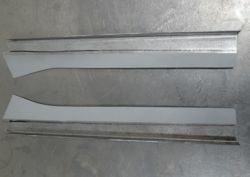 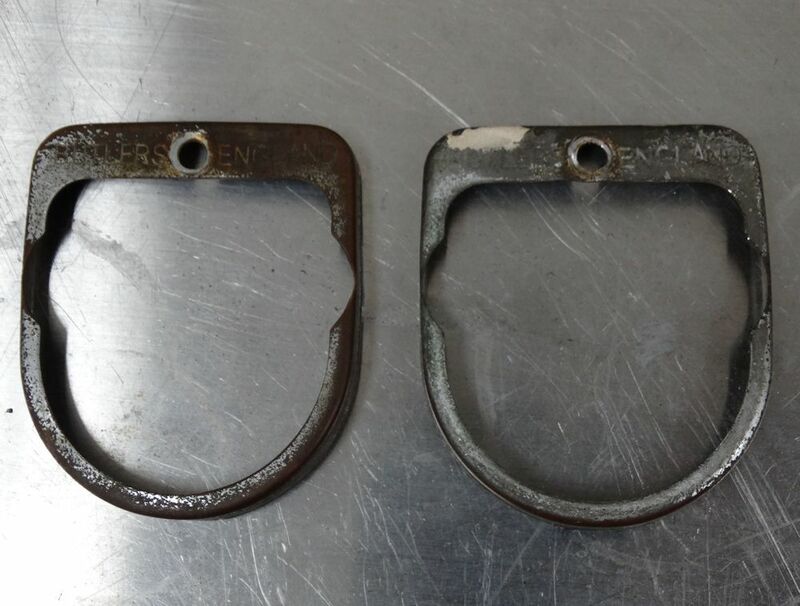 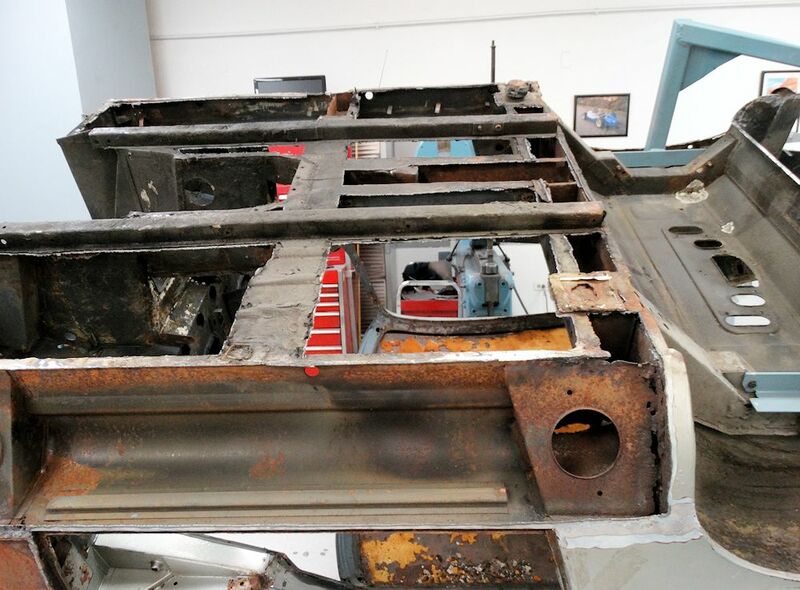 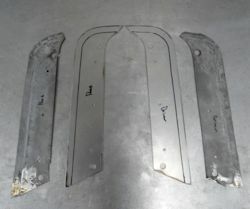 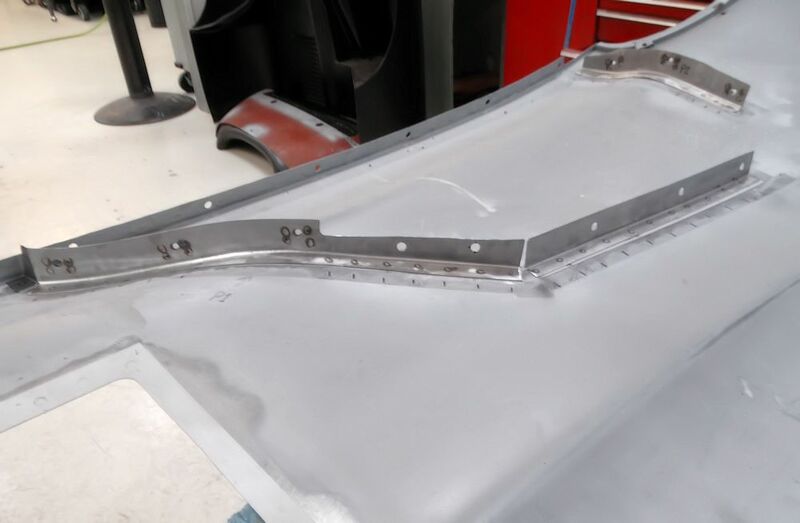 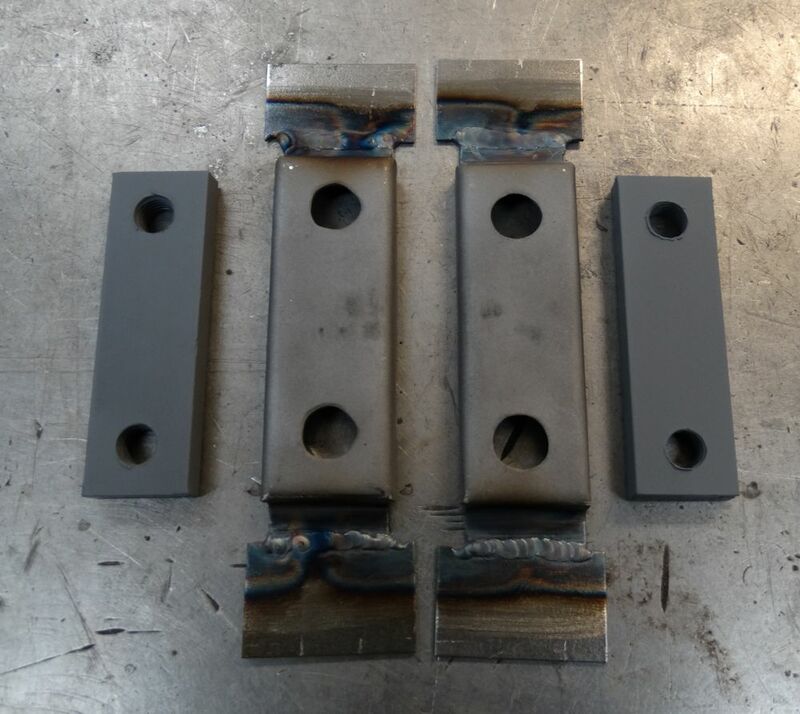 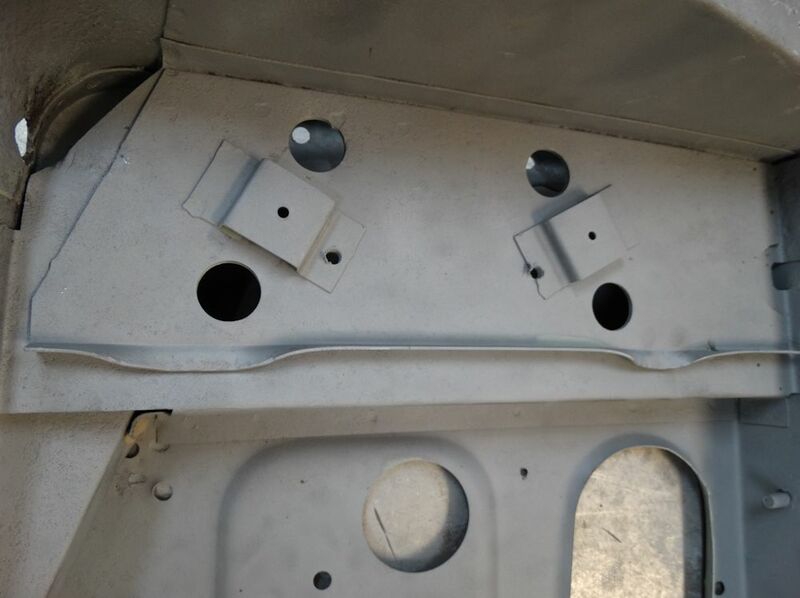 The following images show the difference between very early bonnet hinges and those fitted to E Types beyond the first few months of production. 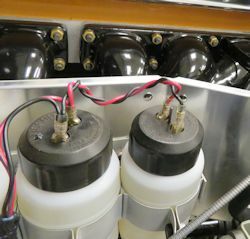 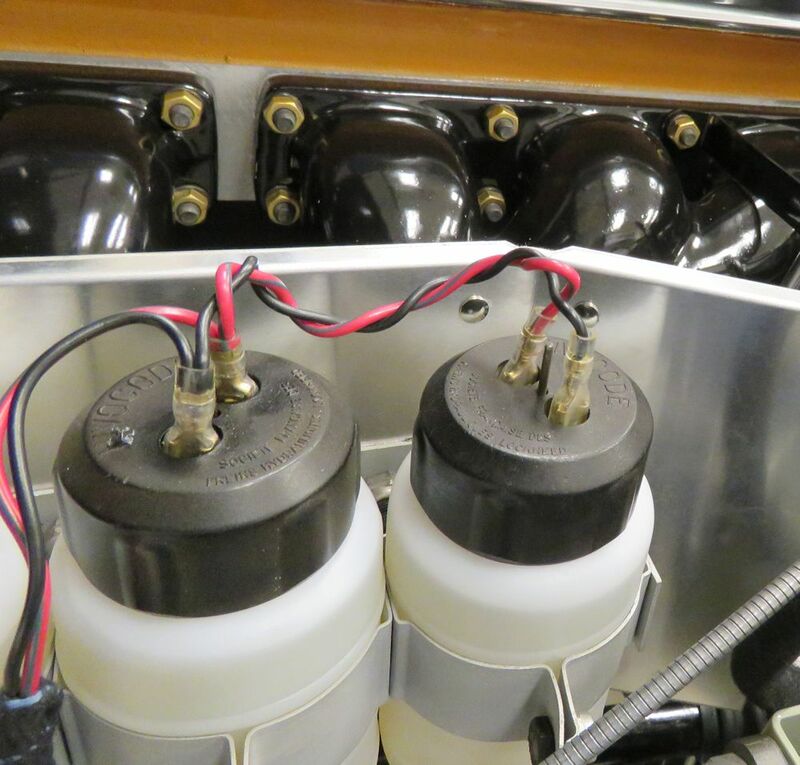 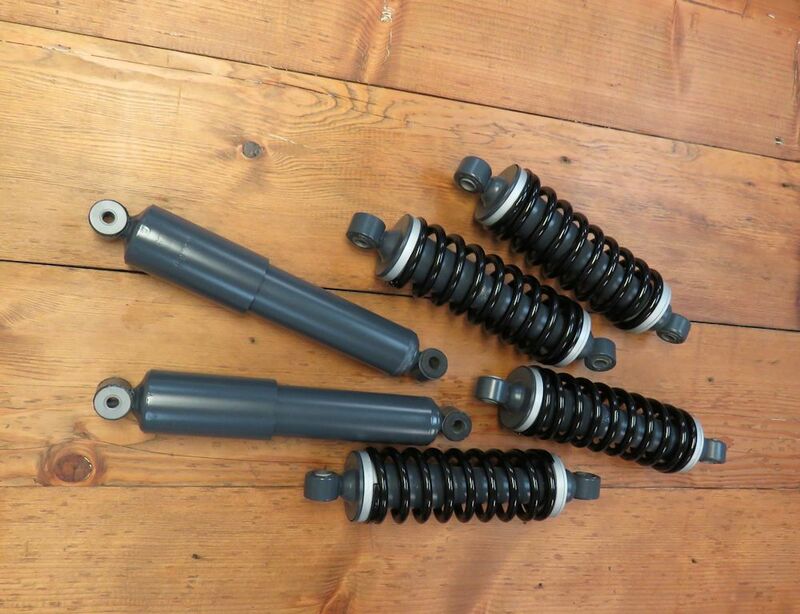 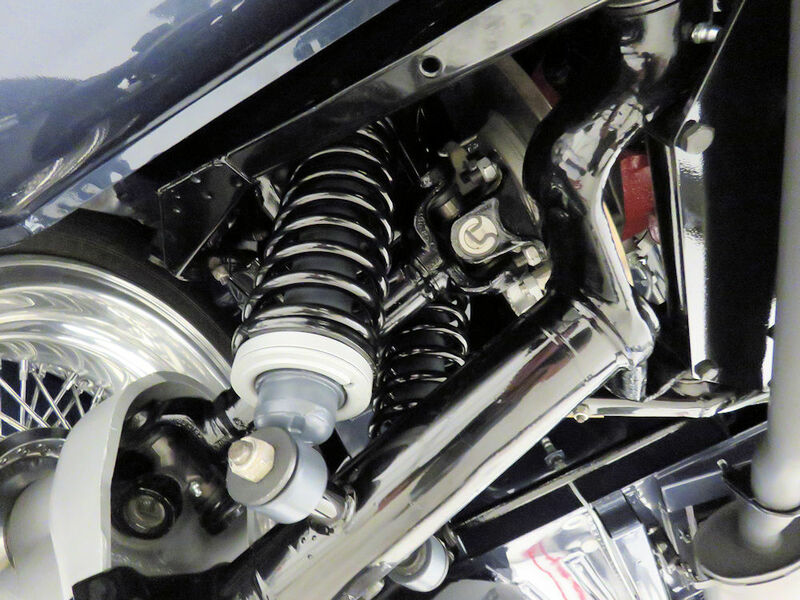 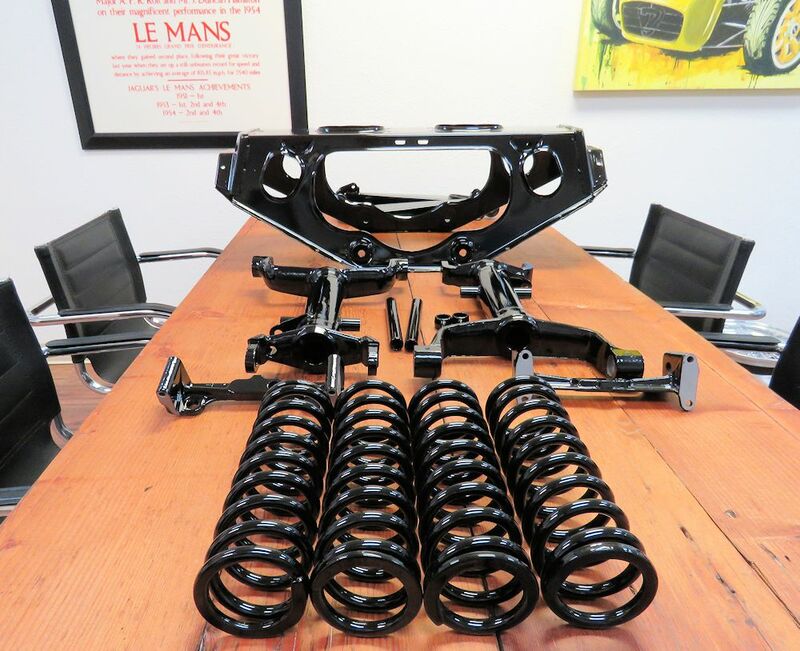 1961 vintage Girling shock absorbers restored to pristine condition. 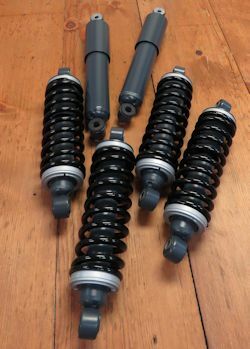 Shocks now restored and ready to install! 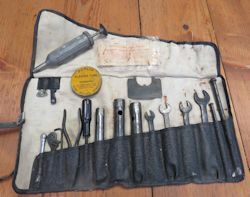 Tool kit now complete with all original and period correct tools. 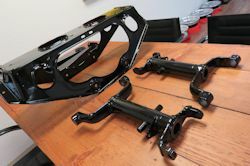 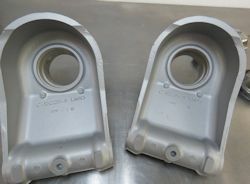 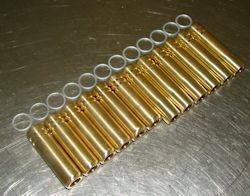 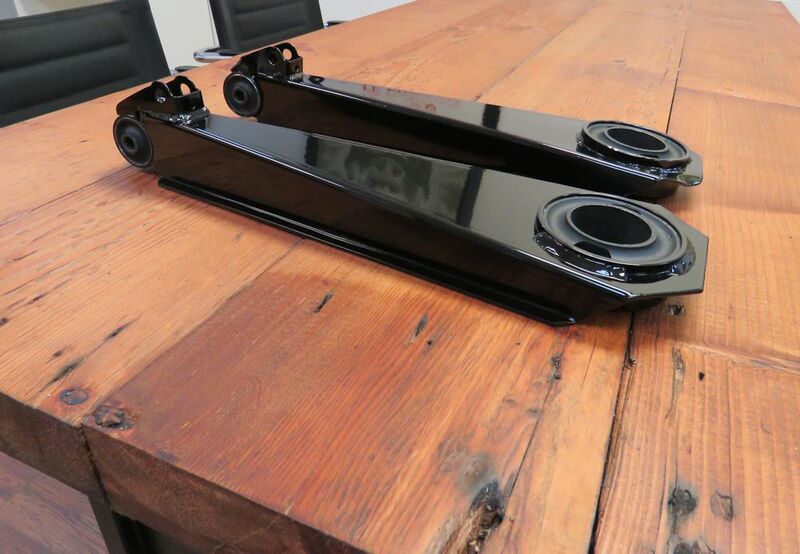 Powder coated IRS components ready for final assembly. First sighting of the famous outside bonnet latches! 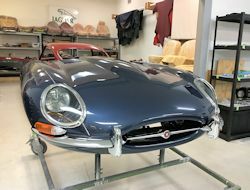 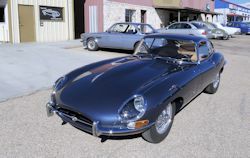 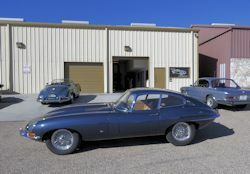 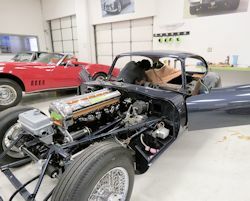 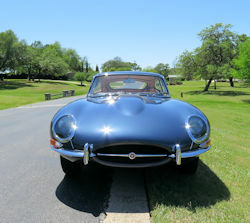 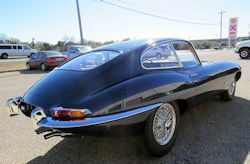 In our quest to have everything on this car as original and correct as humanly possible, we are very fortunate to have our friend and early E Type expert Mike Mueller not only advising on some of the finer points of originality, but also coming up with some of the hard to find parts that are unique to the extremely early cars. 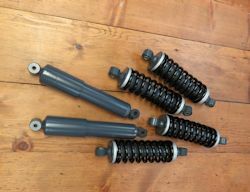 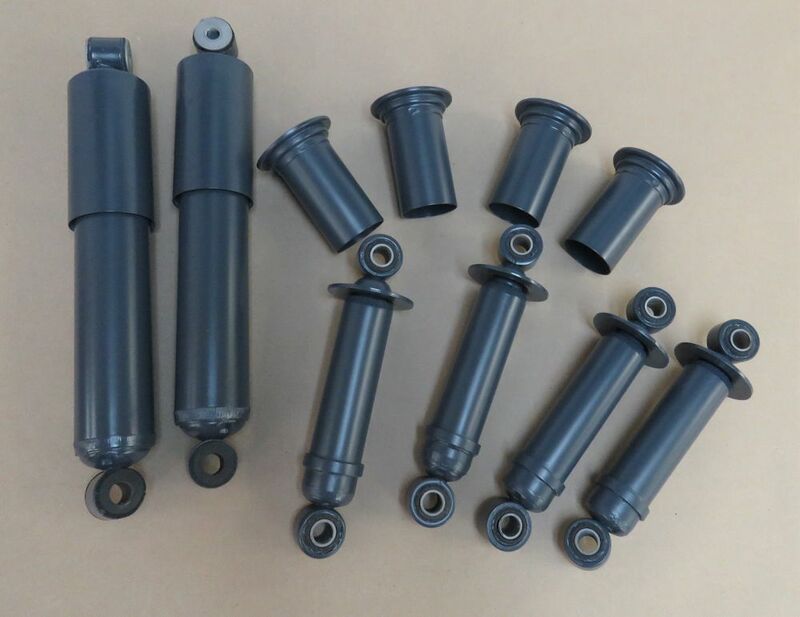 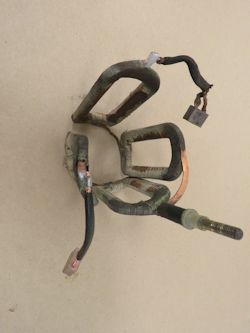 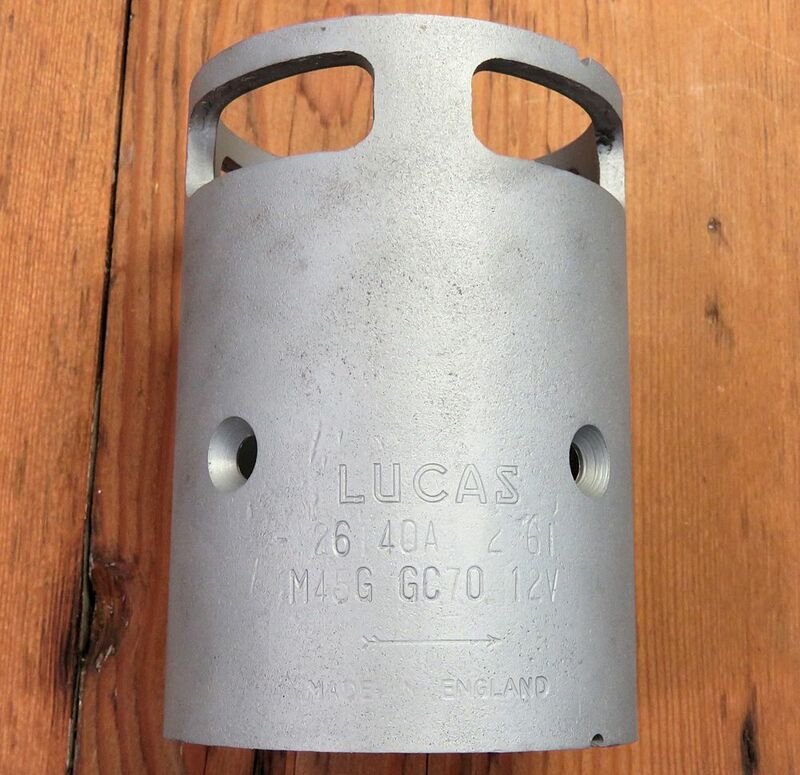 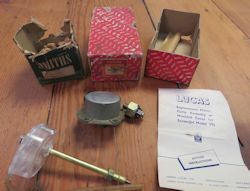 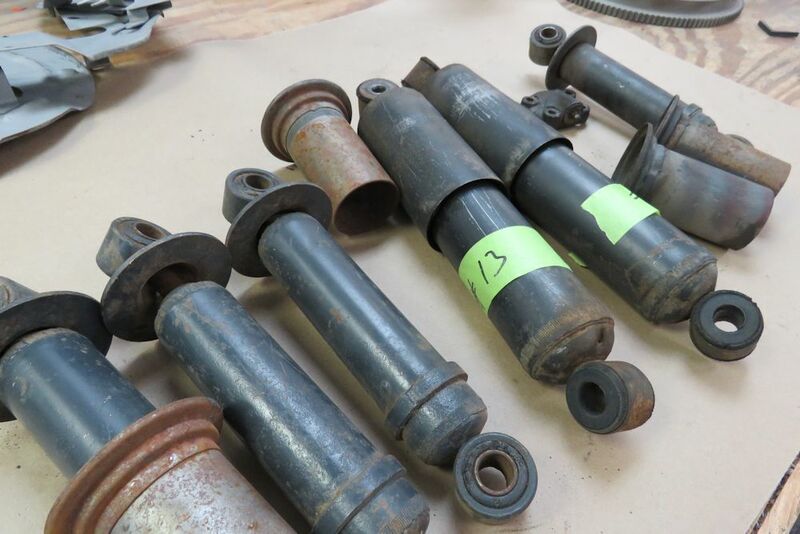 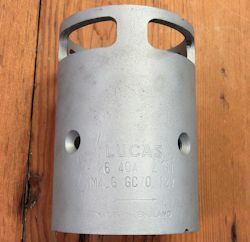 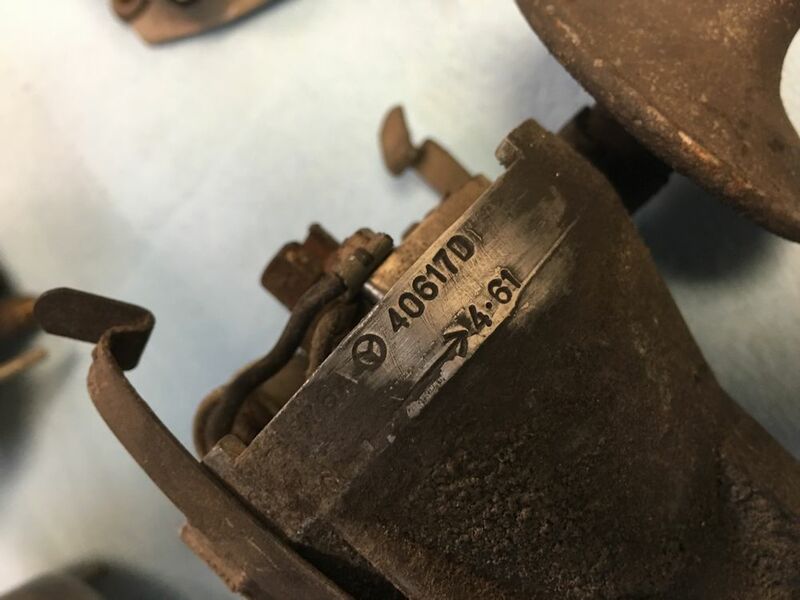 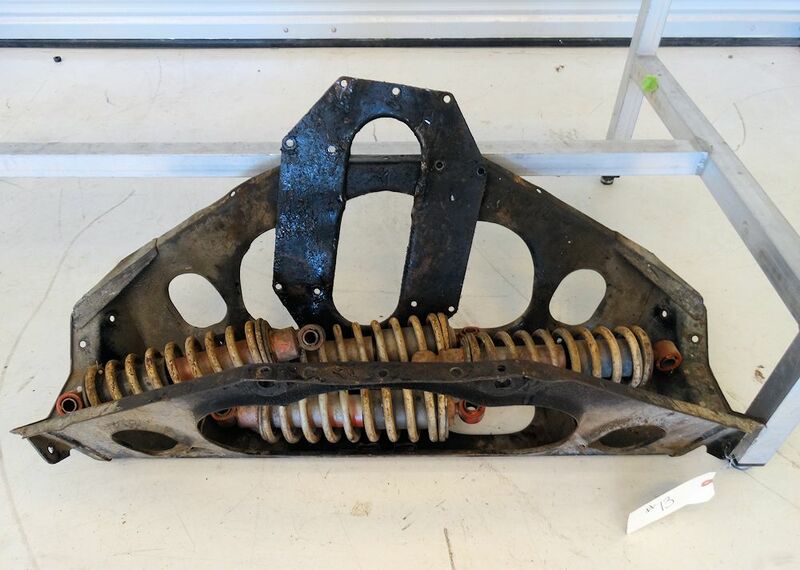 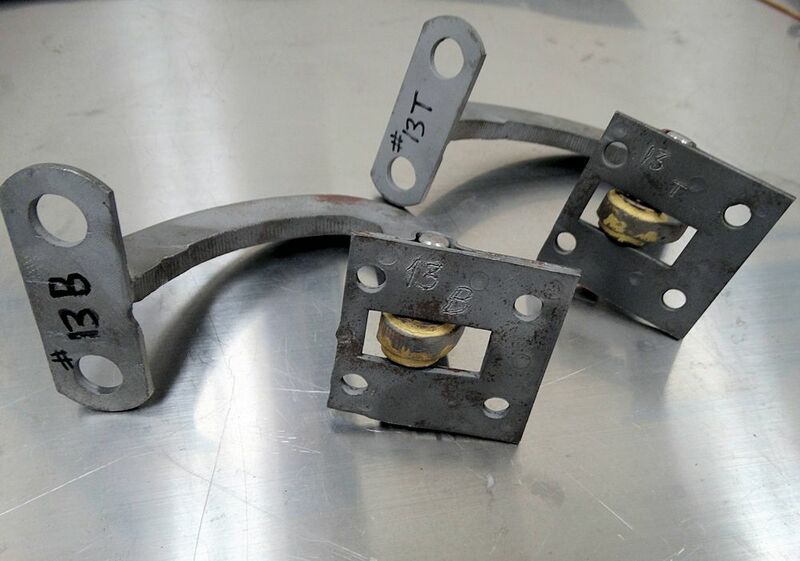 This week Mike was able to supply us with some very early Girling shock absorbers, as well as three out of four of the extremely rare German two eared 'safety' knock-offs. If anybody out there has a spare left hand German knock-off, we would love to buy it to complete the set we need for 885013. 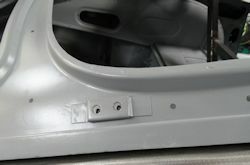 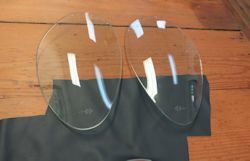 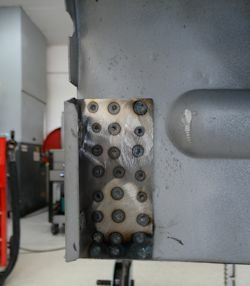 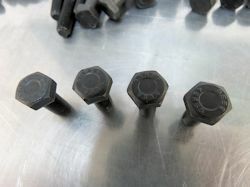 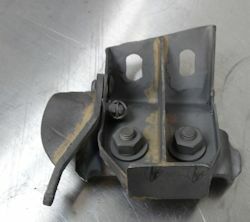 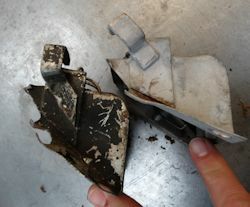 Our car was supplied new in Germany, which means the two eared 'safety' knock-offs would have been installed originally. 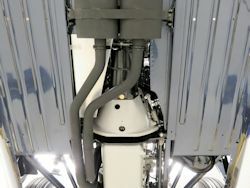 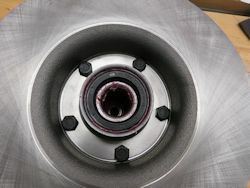 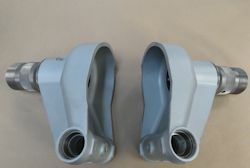 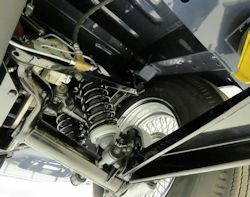 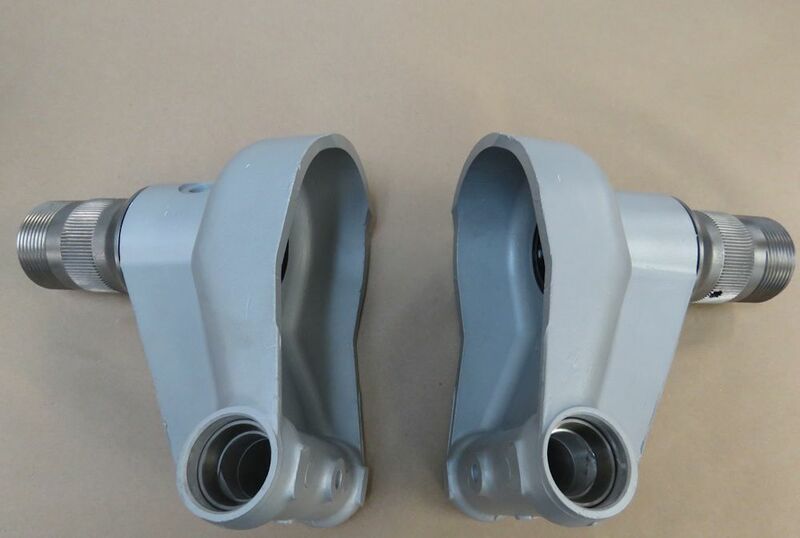 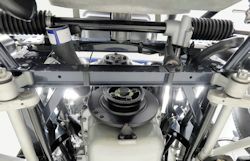 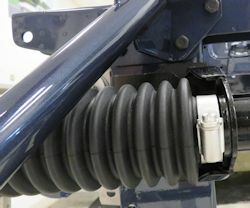 In two of the photos below you can see the rear hub carriers. 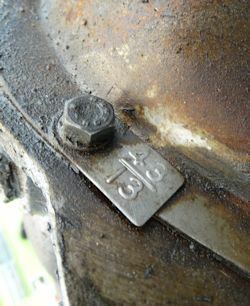 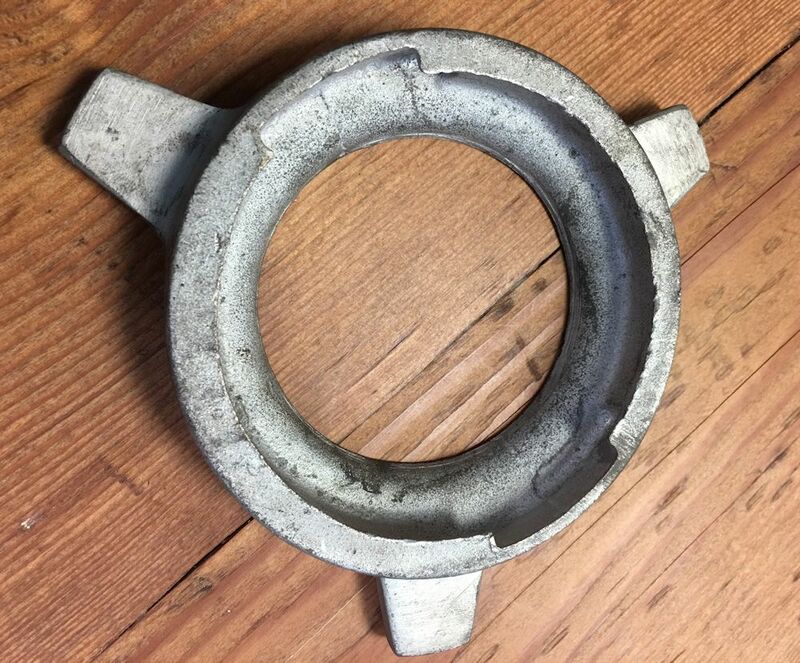 The very earliest cars had an undocumented hub carrier, part number C15229-4. 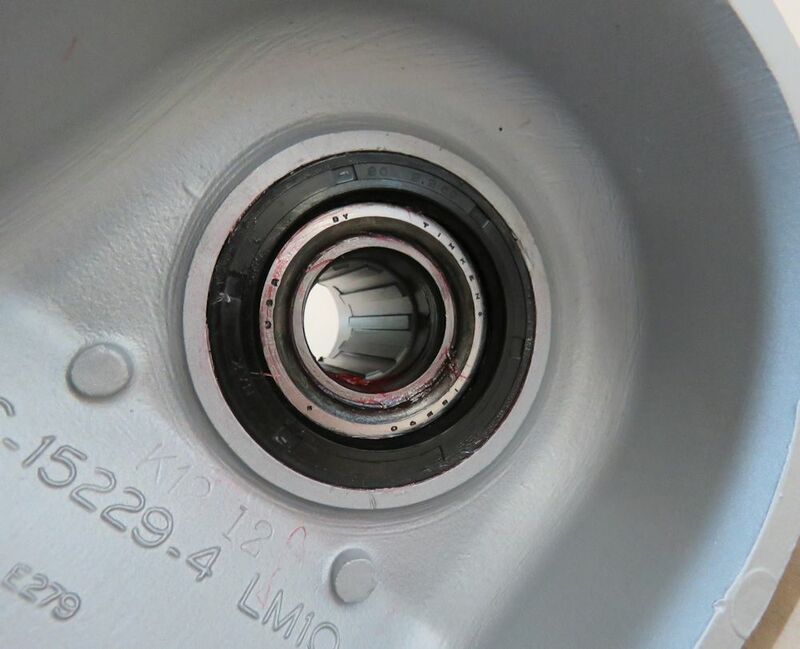 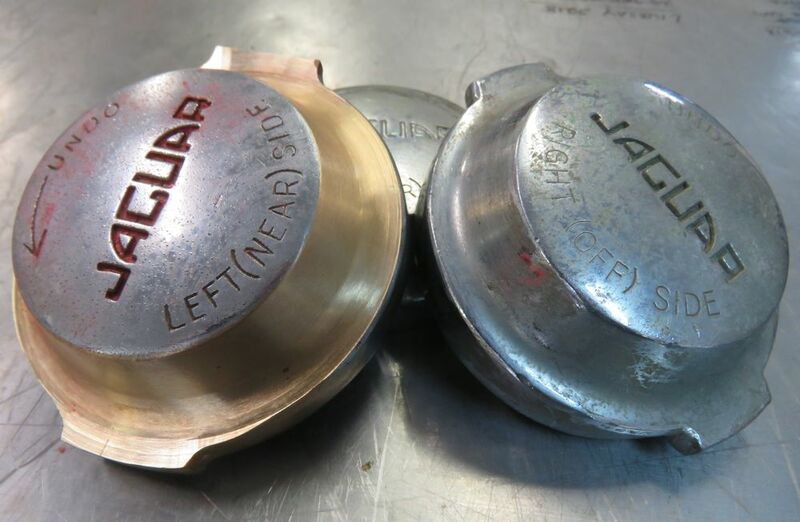 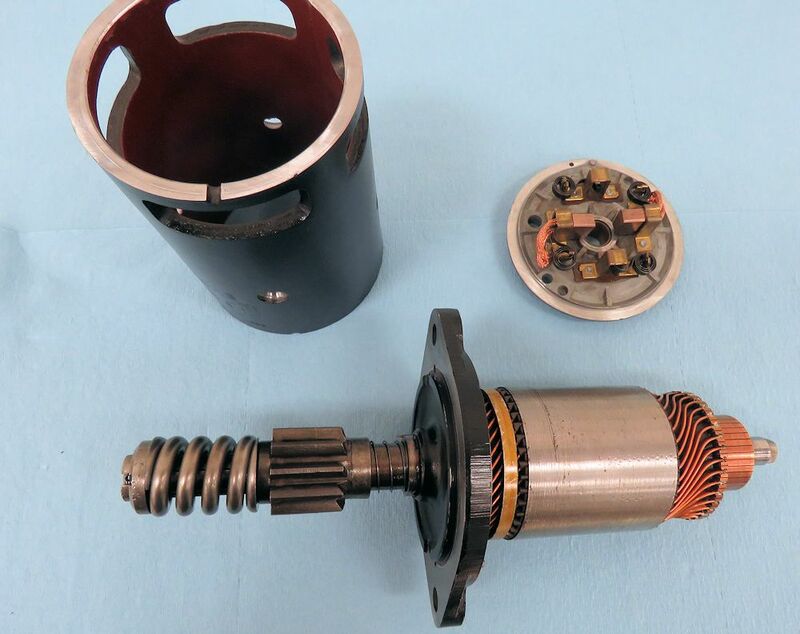 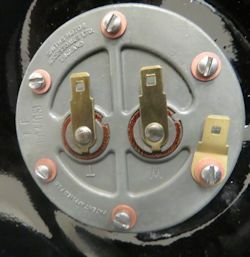 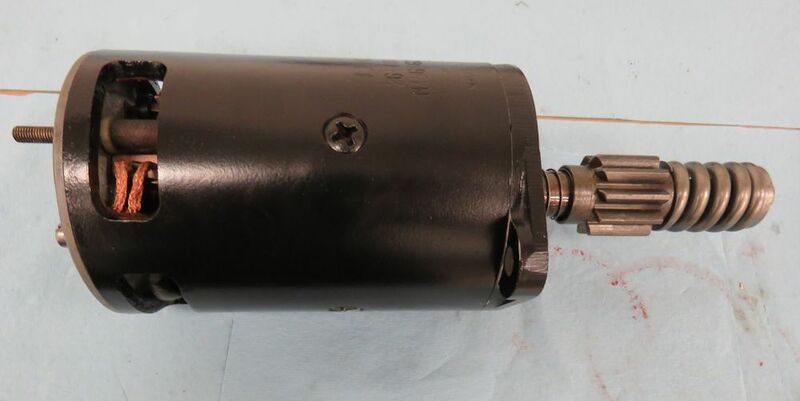 This part number was not mentioned in the J30 Spare Parts Catalogue, which incorrectly cited part number C19063 as the earliest form of hub carrier used. We have restored numerous outside latch roadsters, as well as two of only 18 LHD outside latch coupes to leave the factory, and we have seen several cars with the C15229-4 hub carriers. 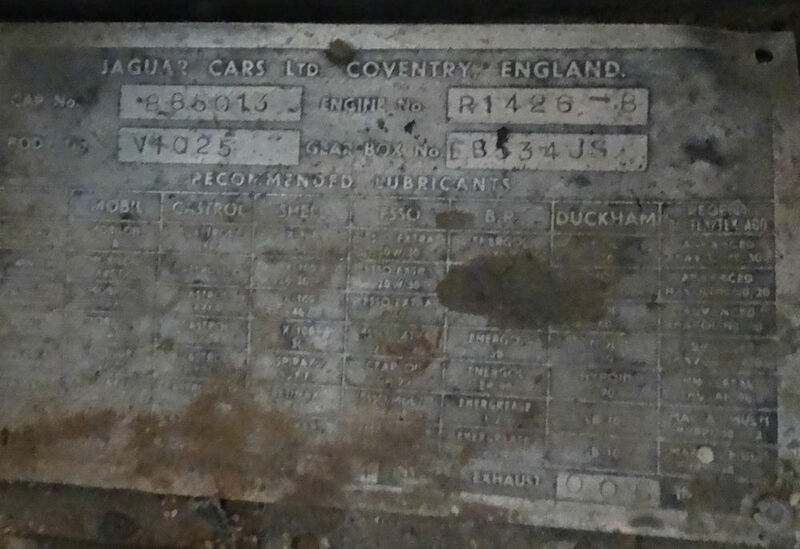 Interestingly, while 885013 has clearly had the C15229-4 hubs from new, 885020 and 885036 both had the C19063 carrier listed in the Parts Catalogue. 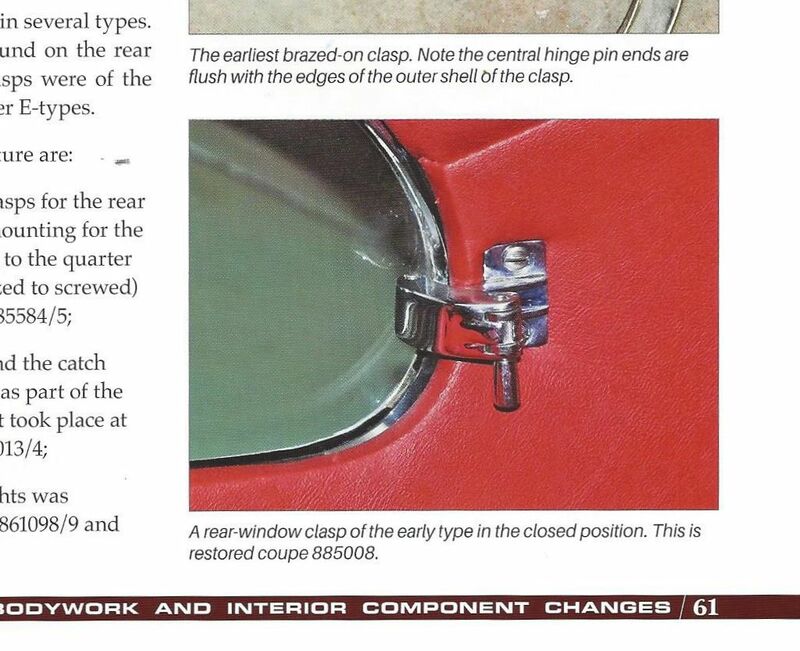 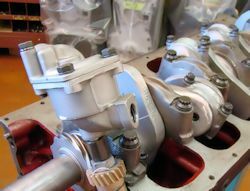 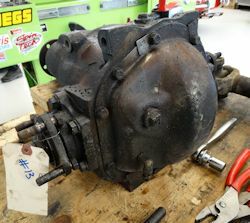 We have documented several outside latch roadsters built prior to July 1961 that had the C15229-4 hubs. I honestly don't know what the 136 denotes..
Special thanks to Dr. Mike Mueller, the accepted world authority on outside latch E Type coupes, who was kind enough to loan us an original outside latch coupe door and an ultra early production bonnet mouth tray, so that we could replicate each of them for our restoration of 885013. 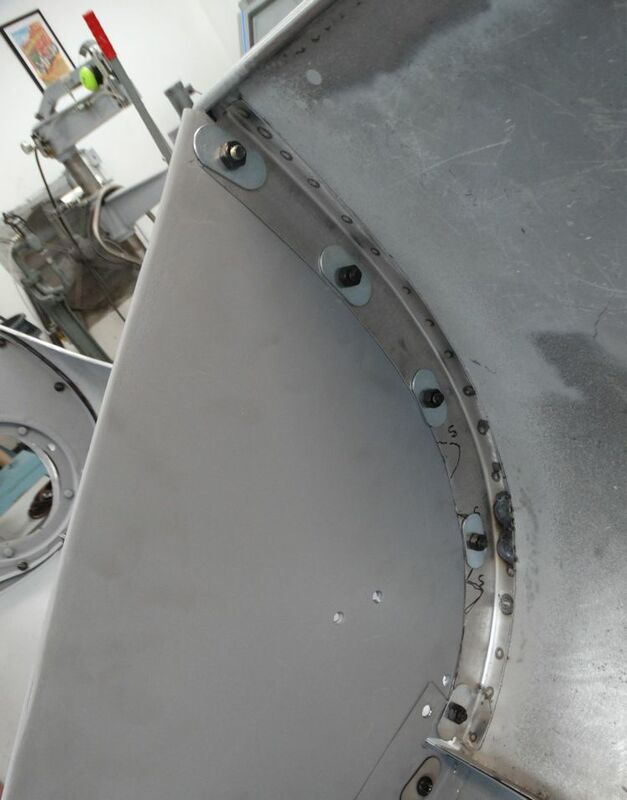 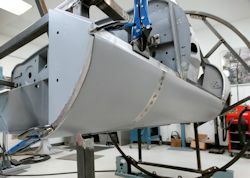 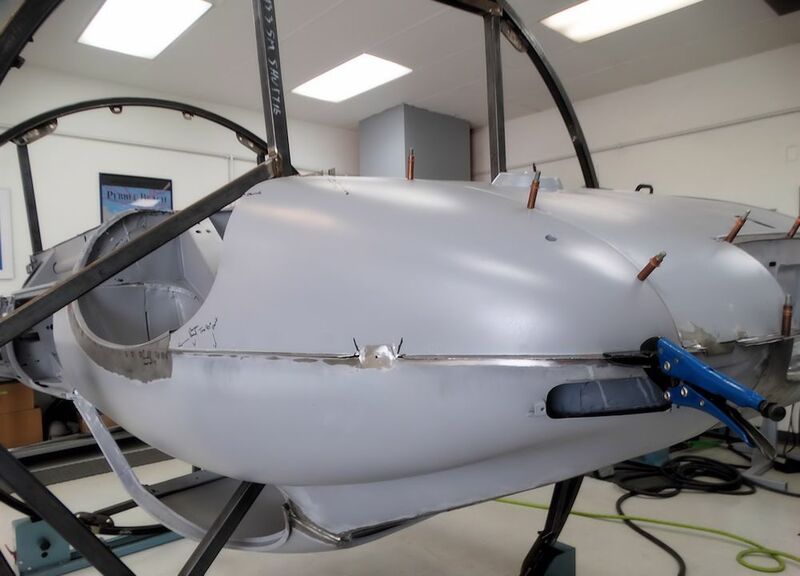 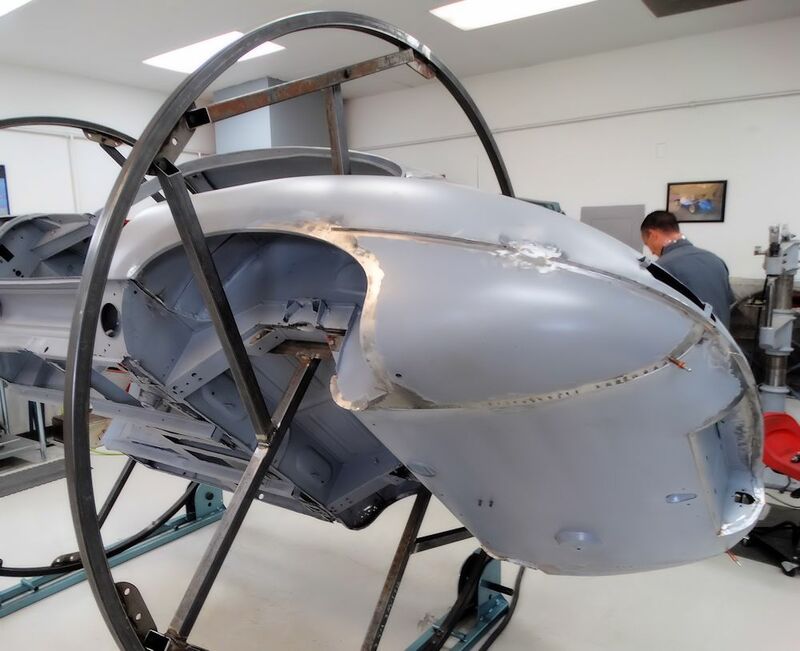 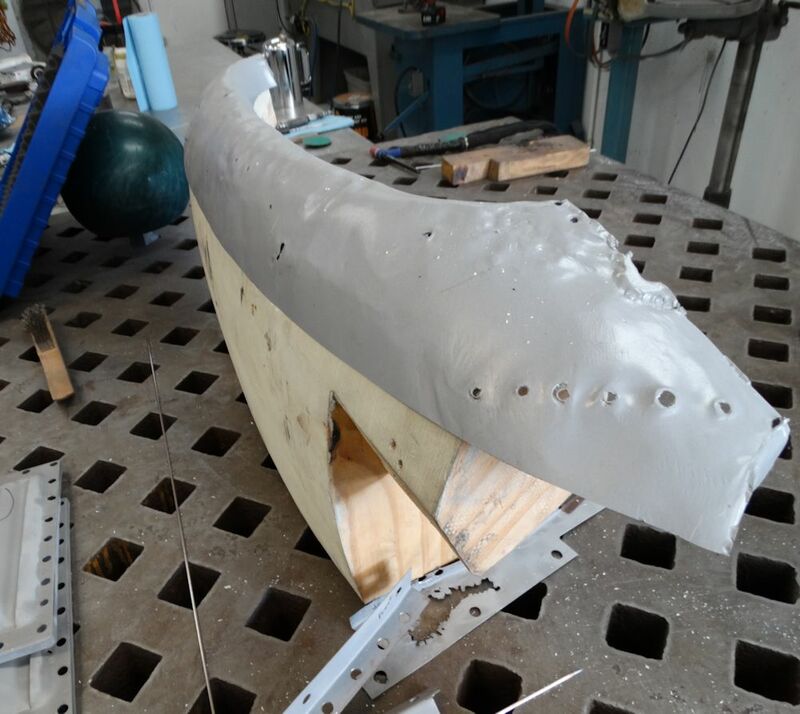 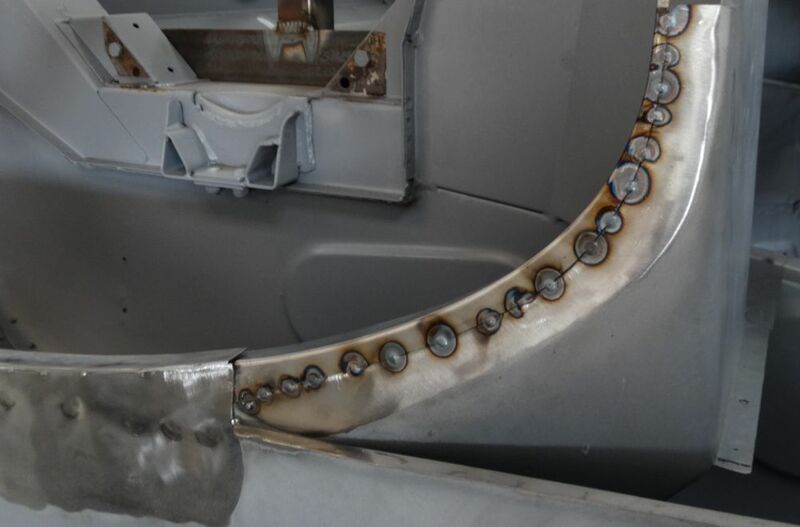 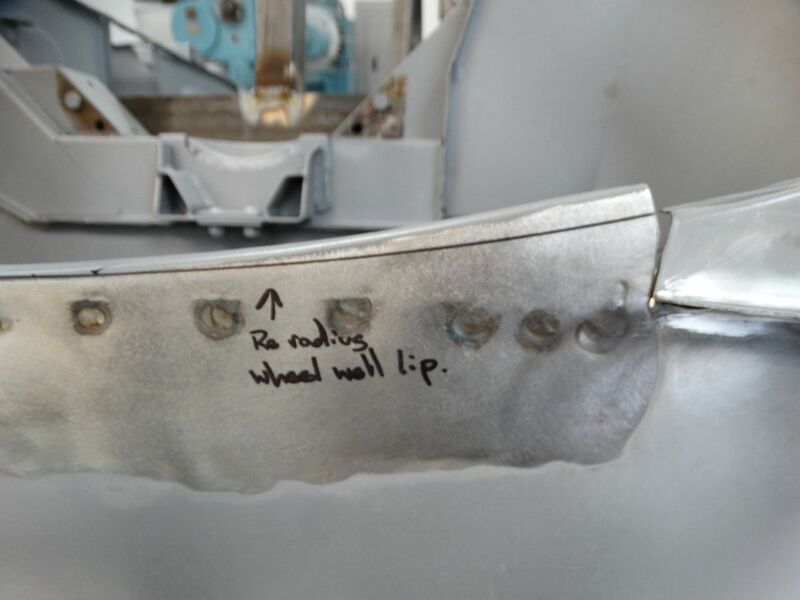 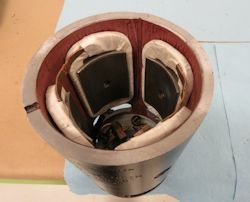 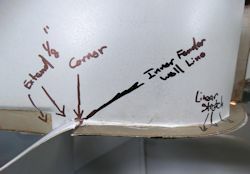 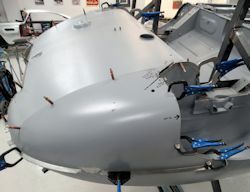 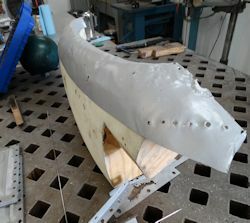 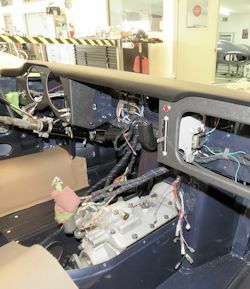 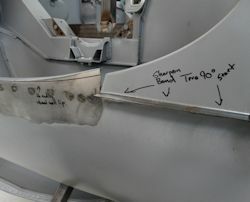 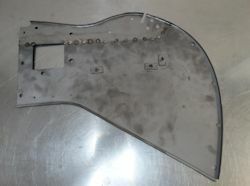 The photos below show the modifications in progress. 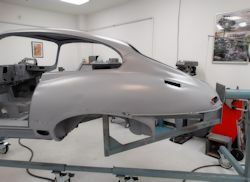 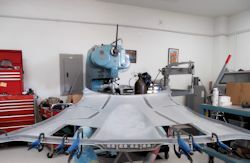 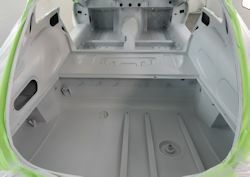 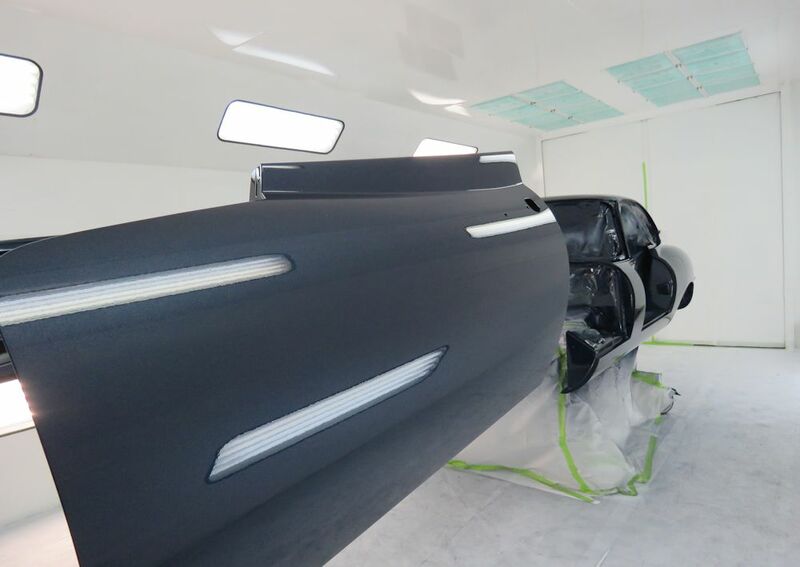 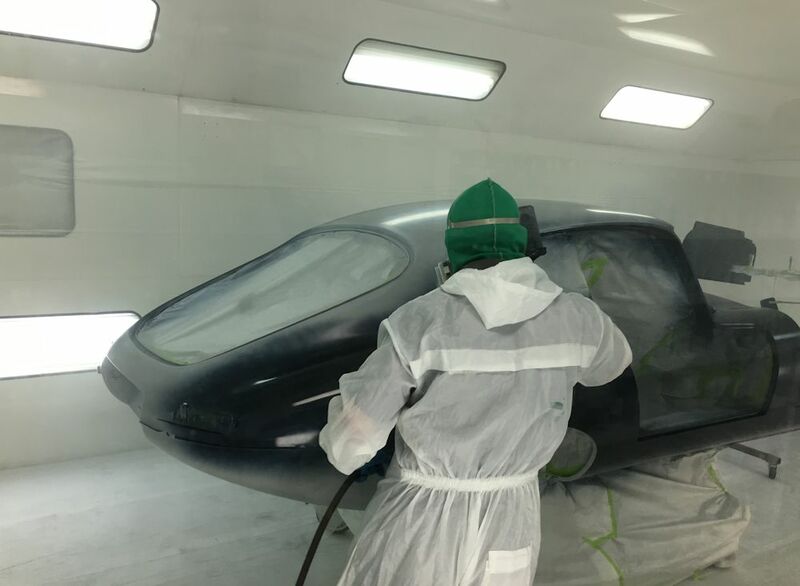 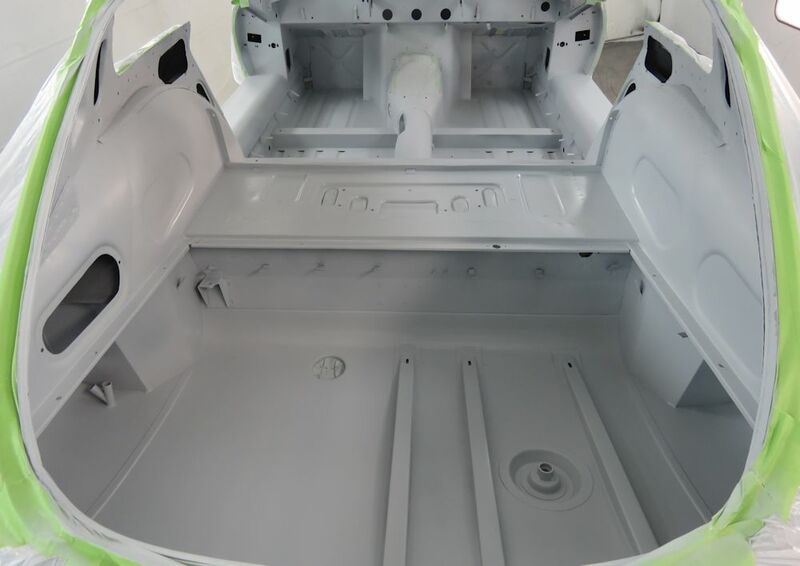 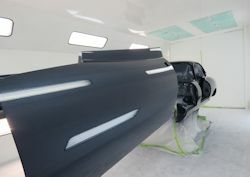 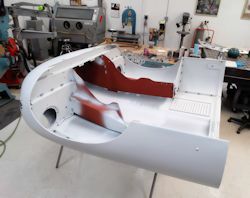 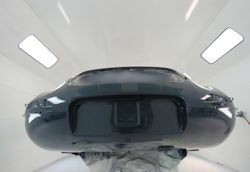 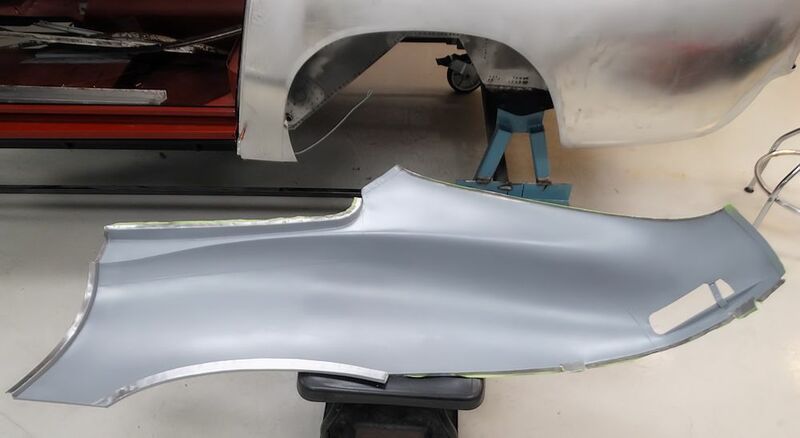 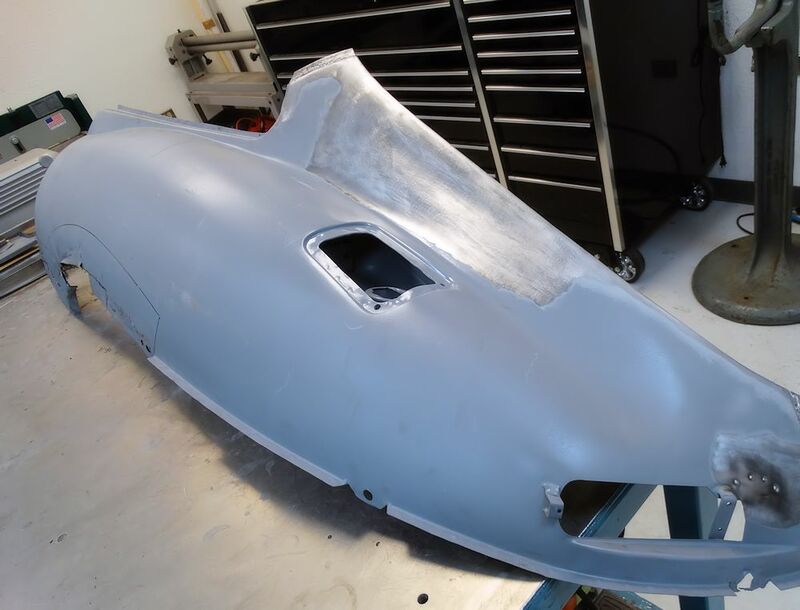 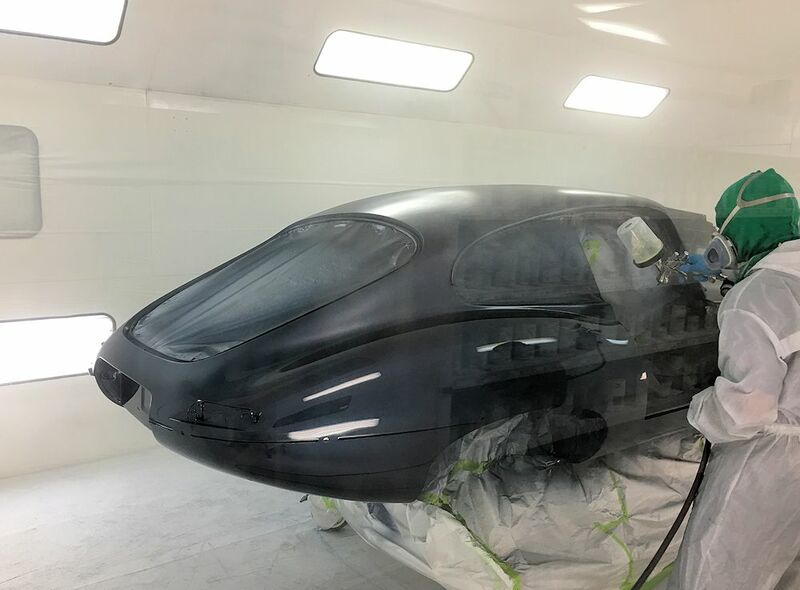 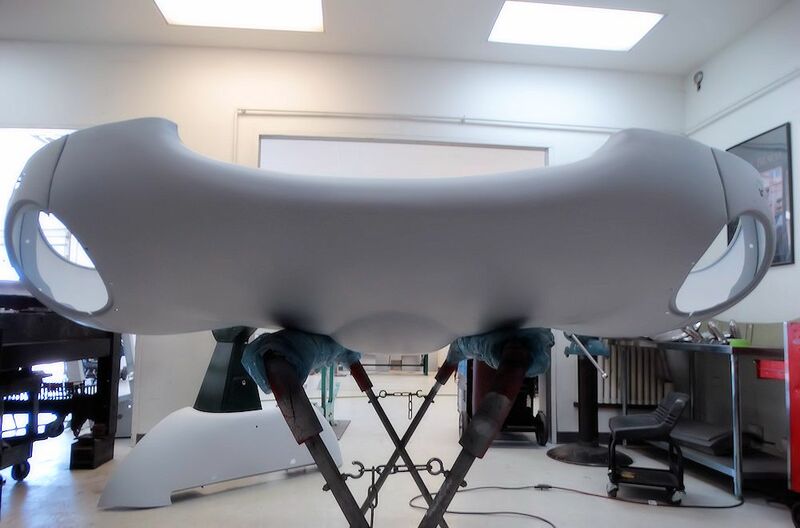 I am delighted to report that we have now completed the bodywork stage of this project and 885013 has been primed with Spies Hecker Raderal sprayable polyester primer. 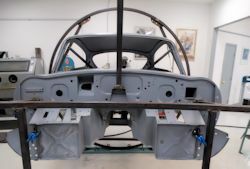 All of the panel gaps have been finalized at this stage and the car is scheduled to be painted very early in the New Year. You may never see a better fitting bonnet! 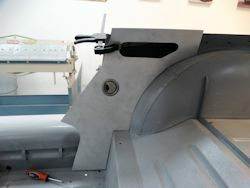 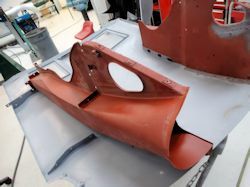 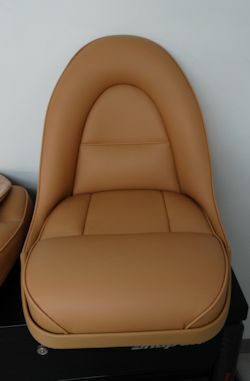 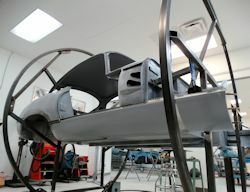 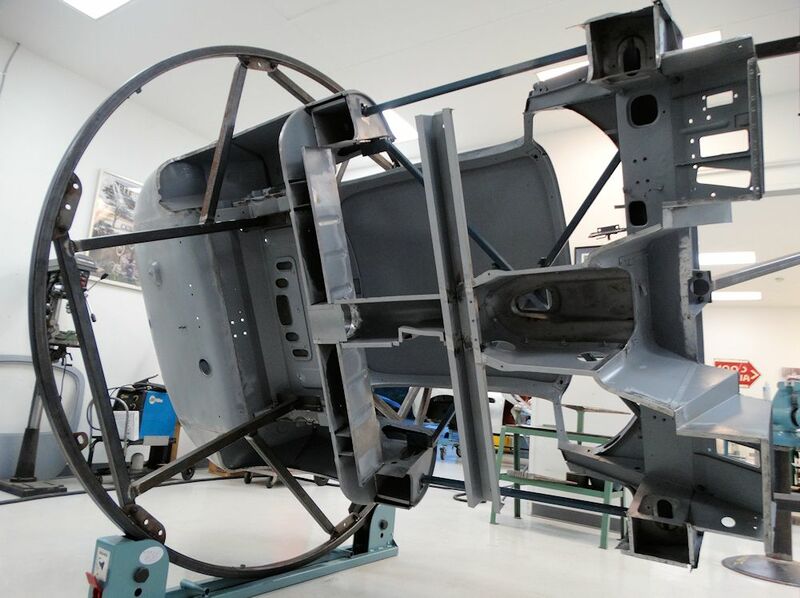 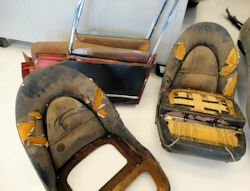 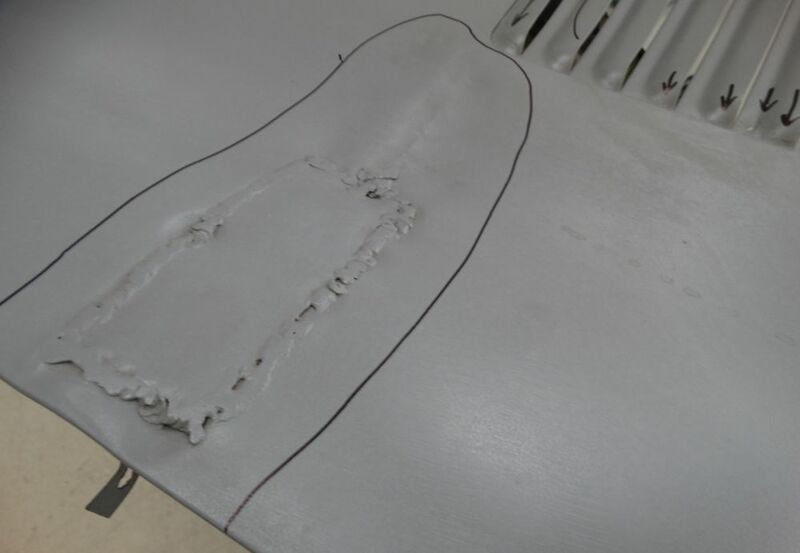 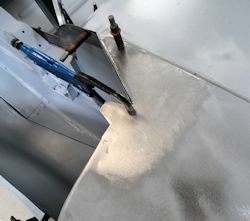 Carlos has now completed the re-trim of the first seat. 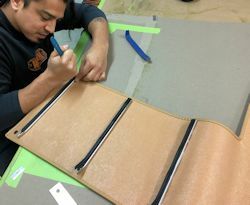 Carlos has been putting on something of a master class, trimming your seats. 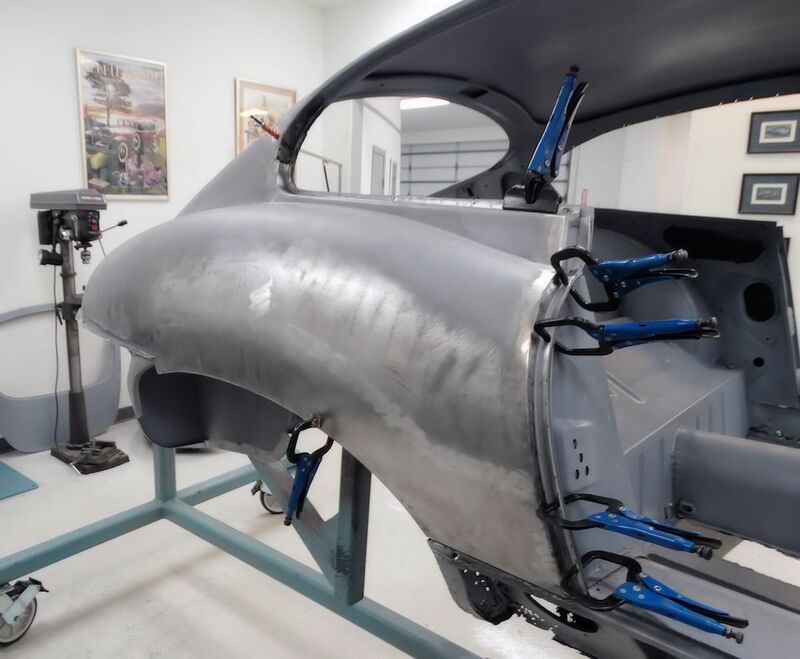 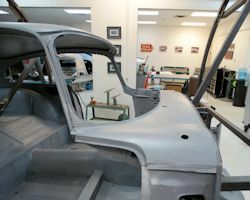 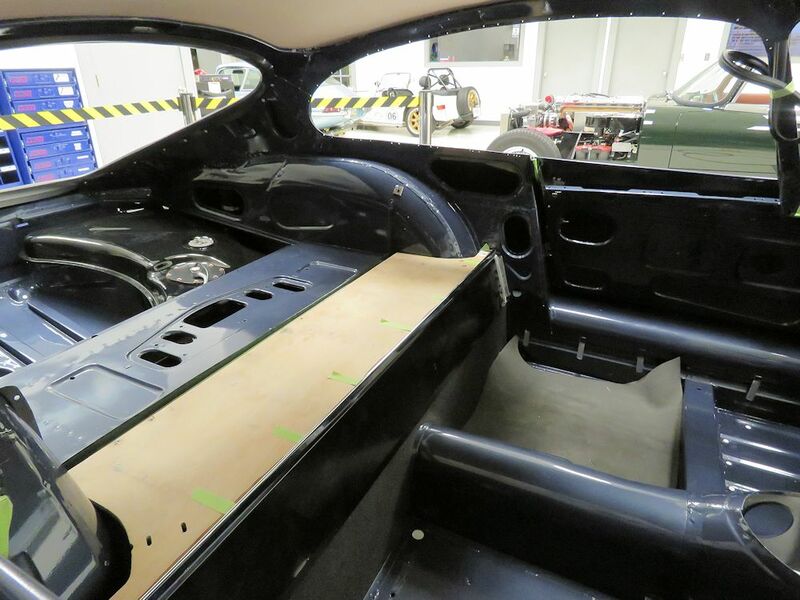 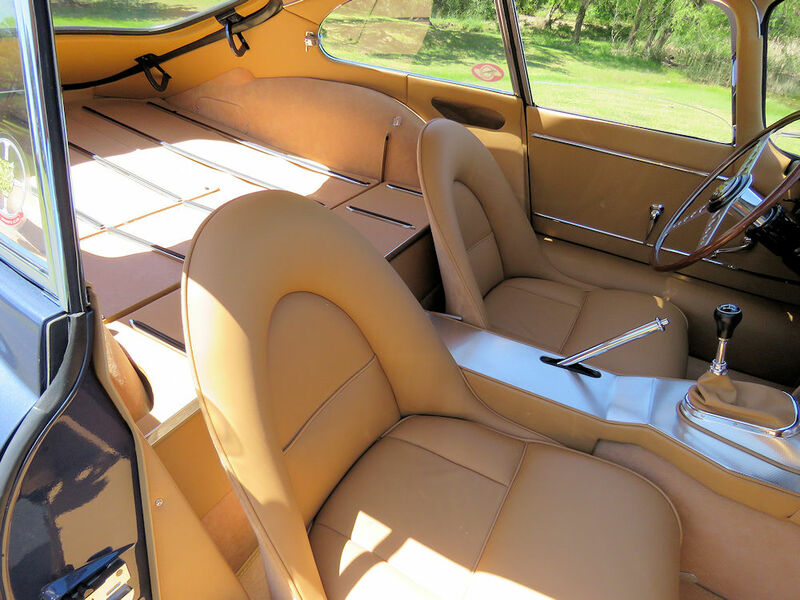 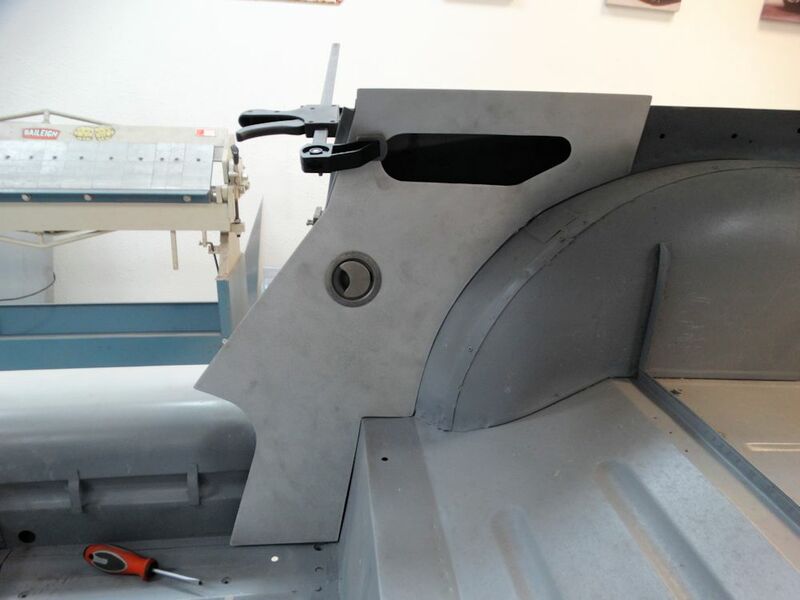 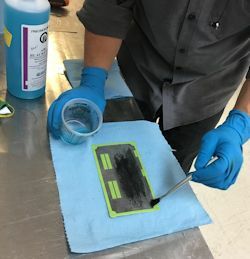 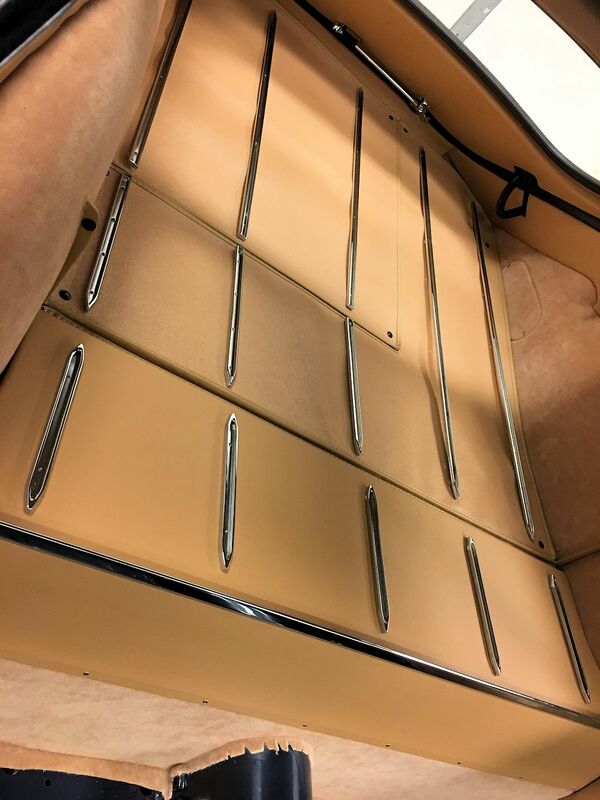 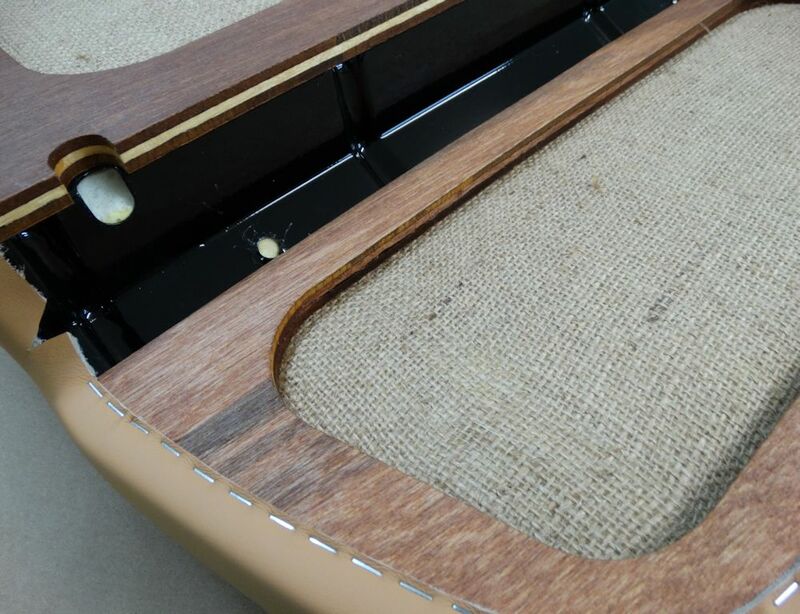 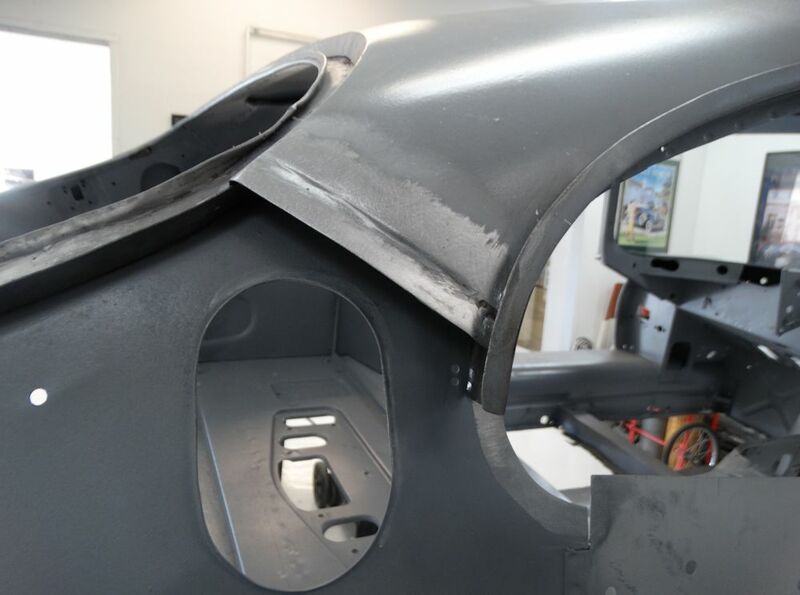 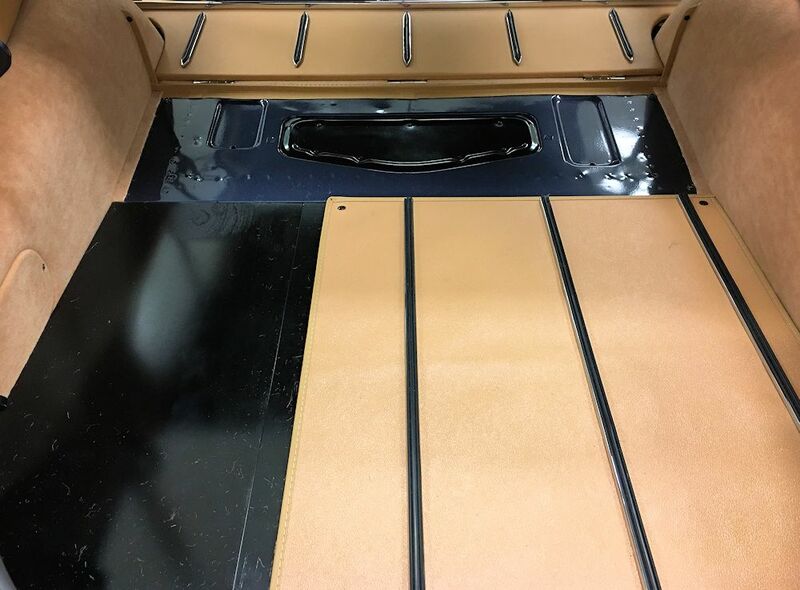 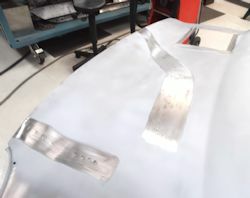 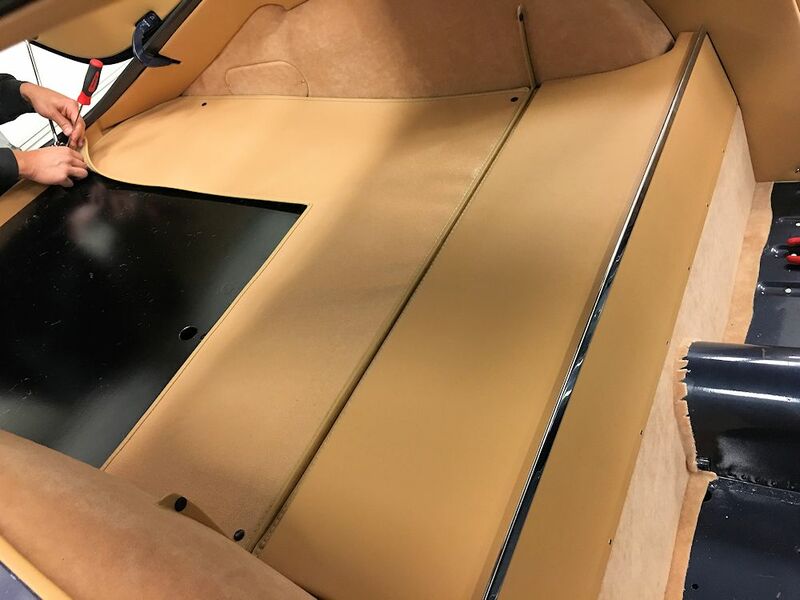 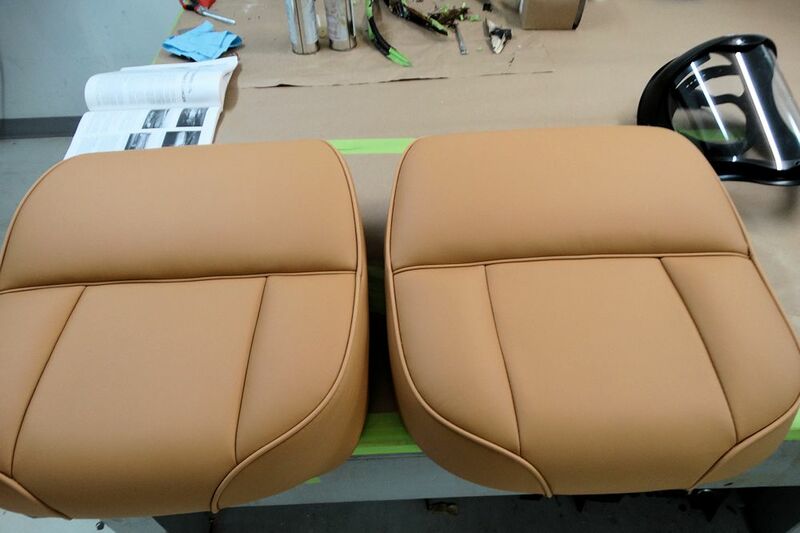 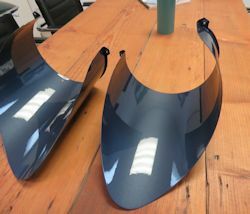 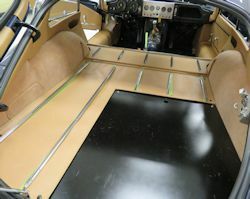 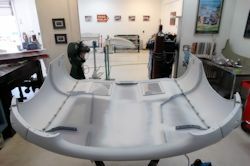 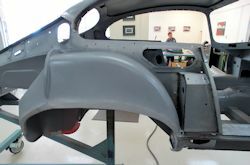 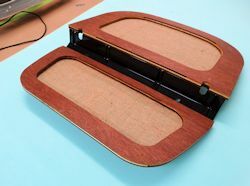 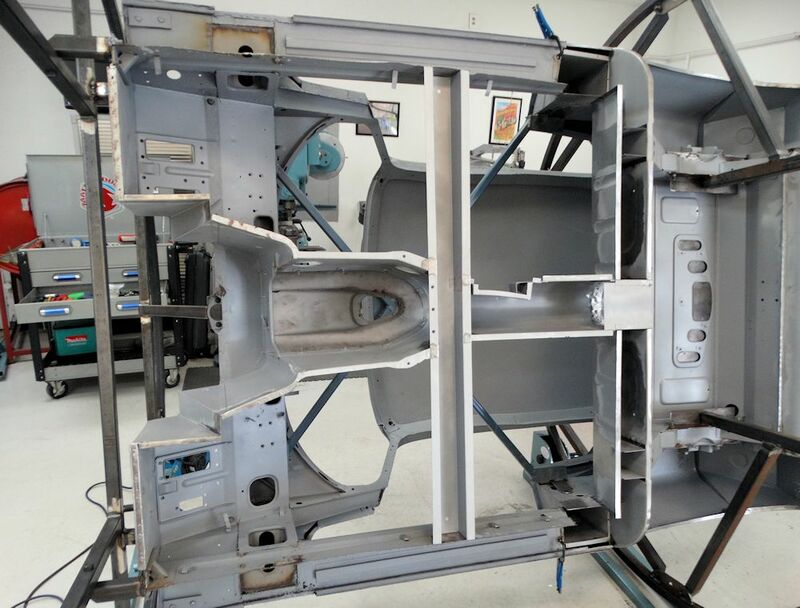 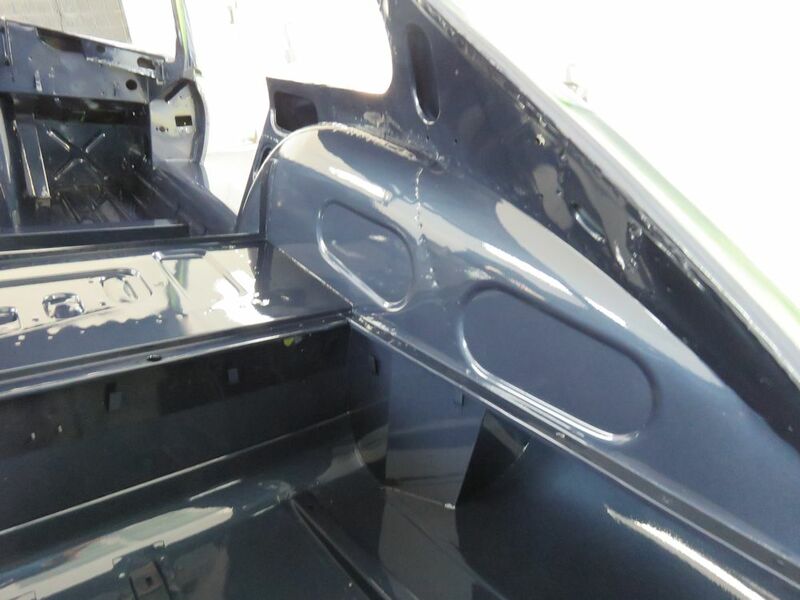 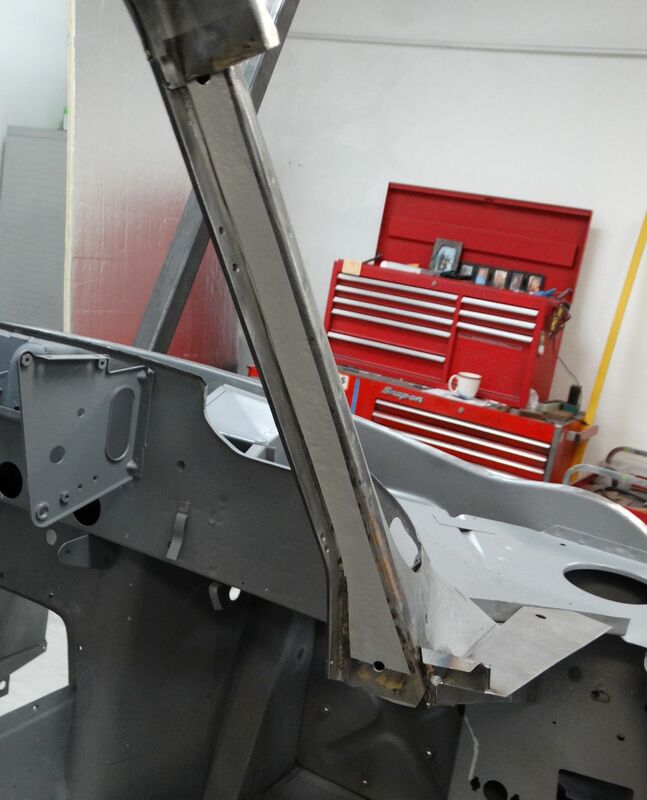 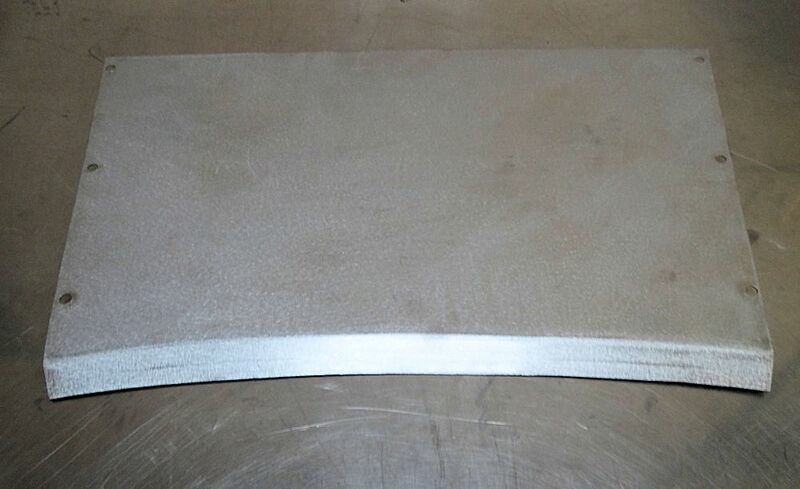 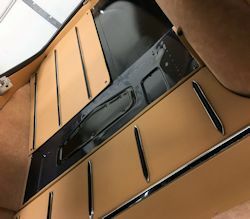 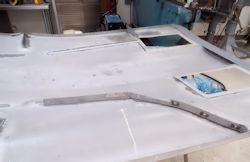 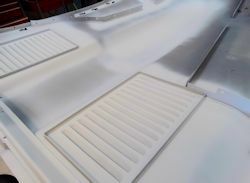 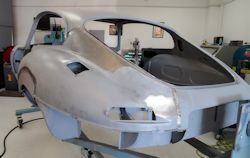 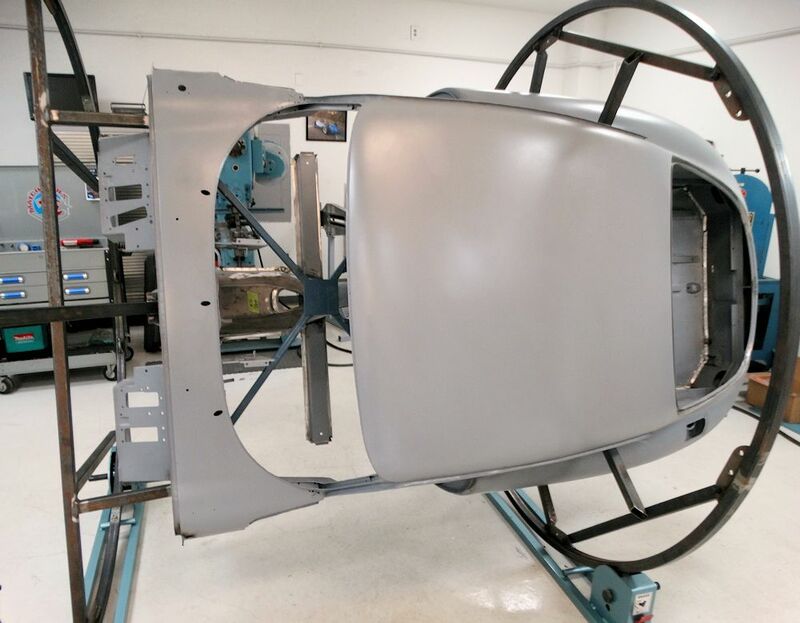 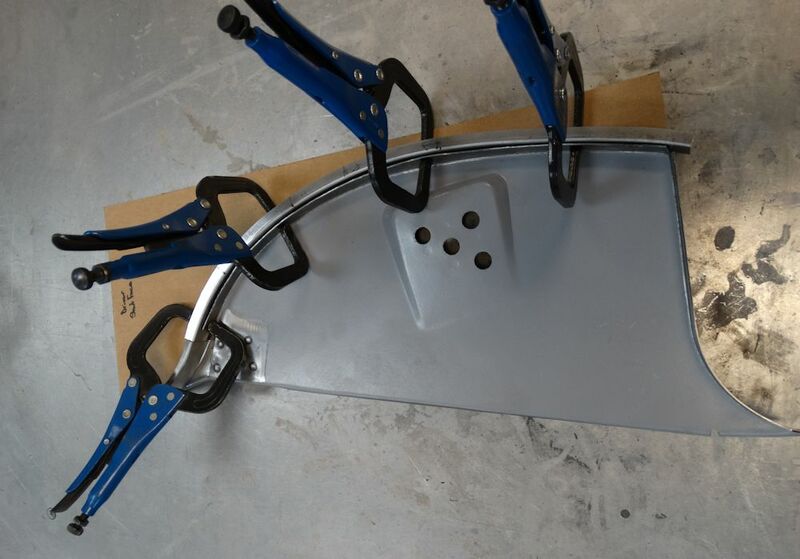 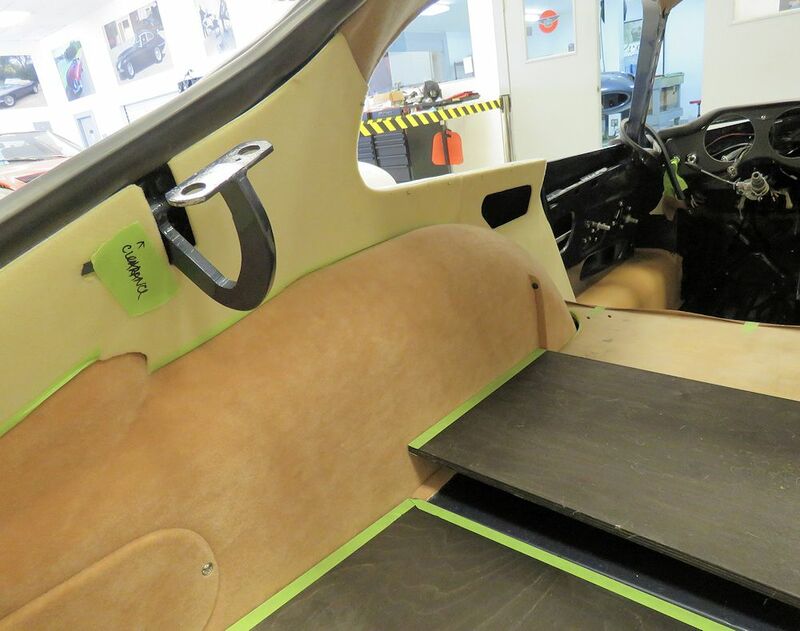 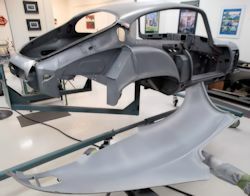 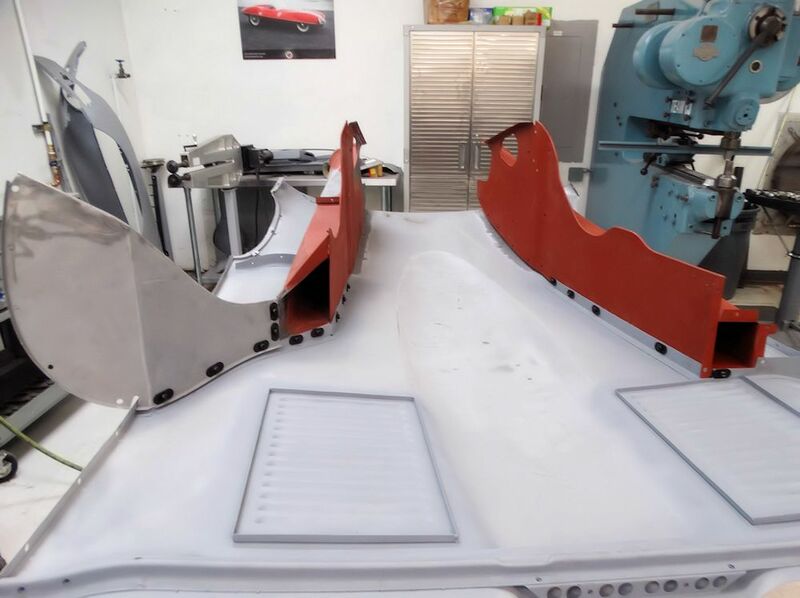 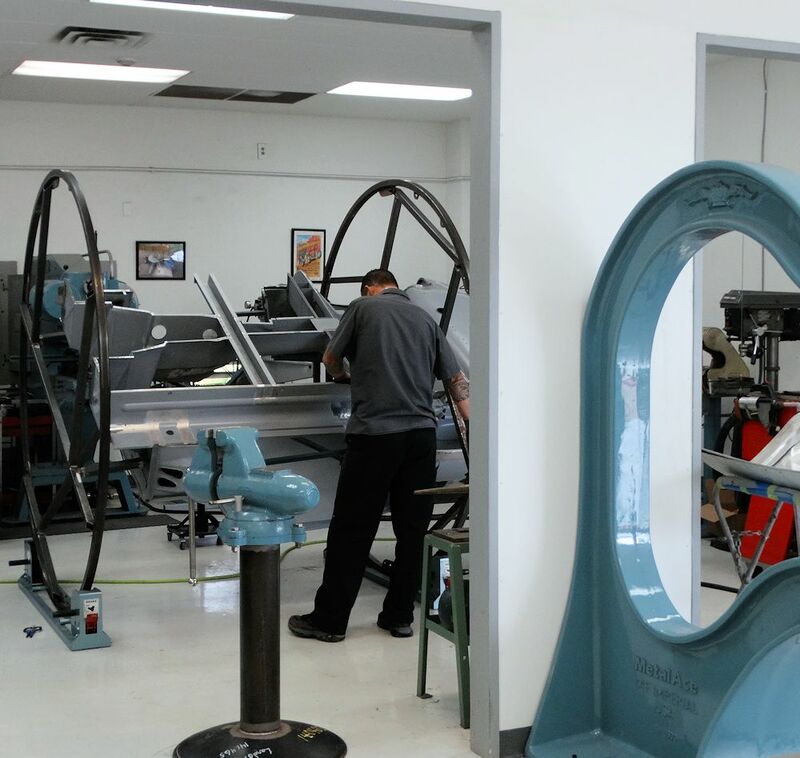 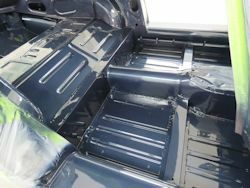 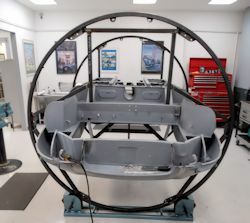 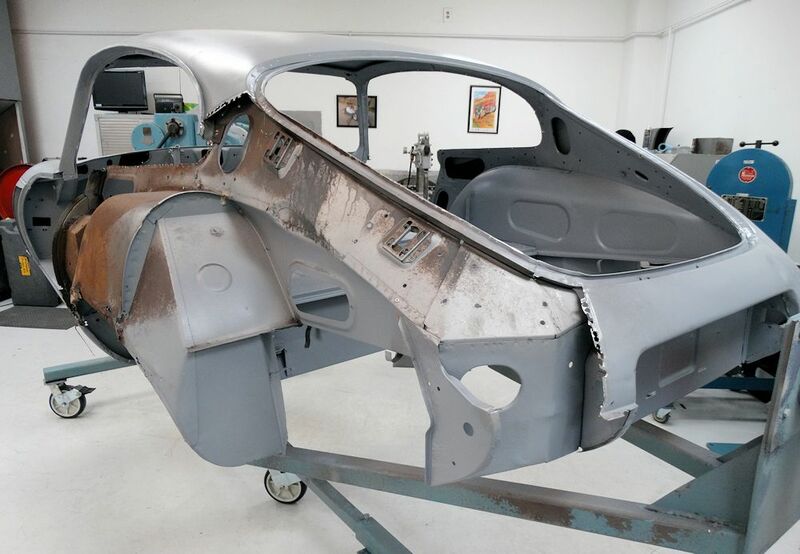 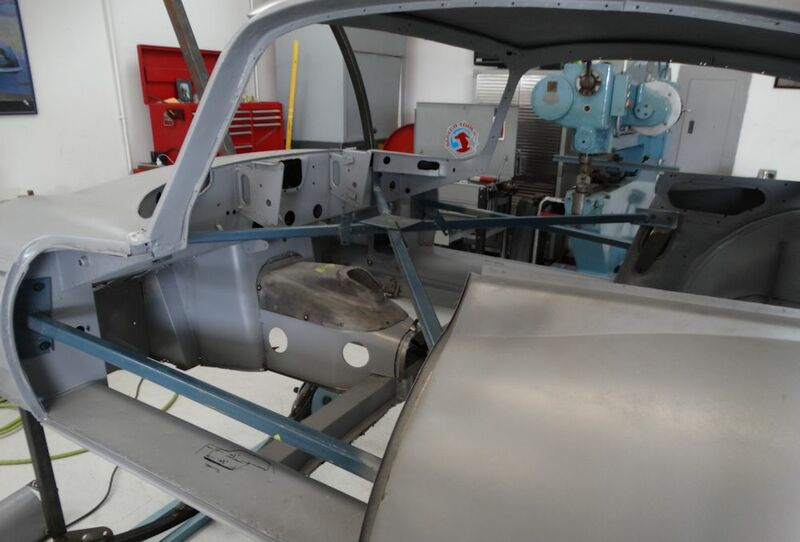 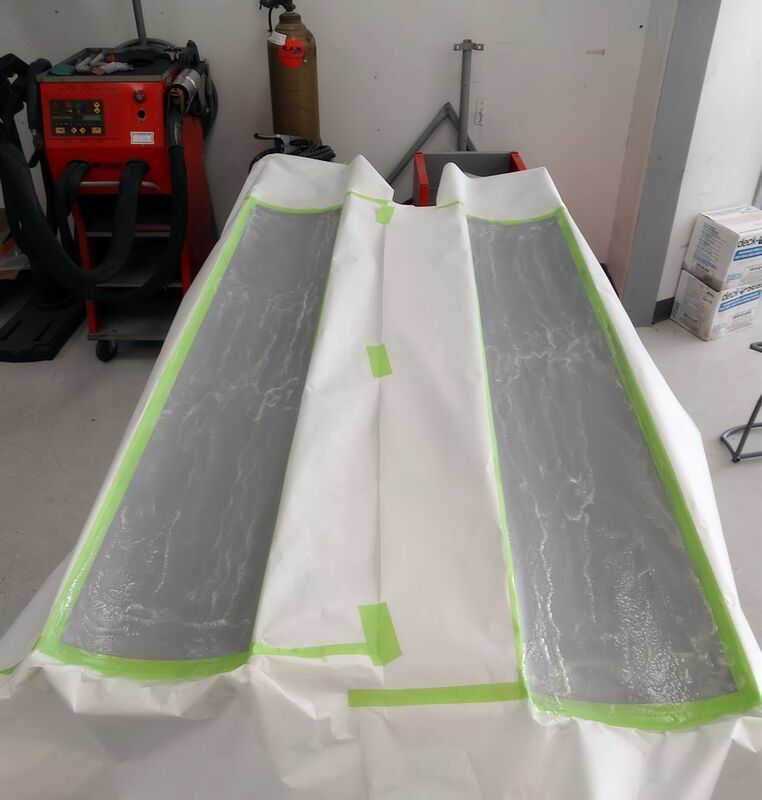 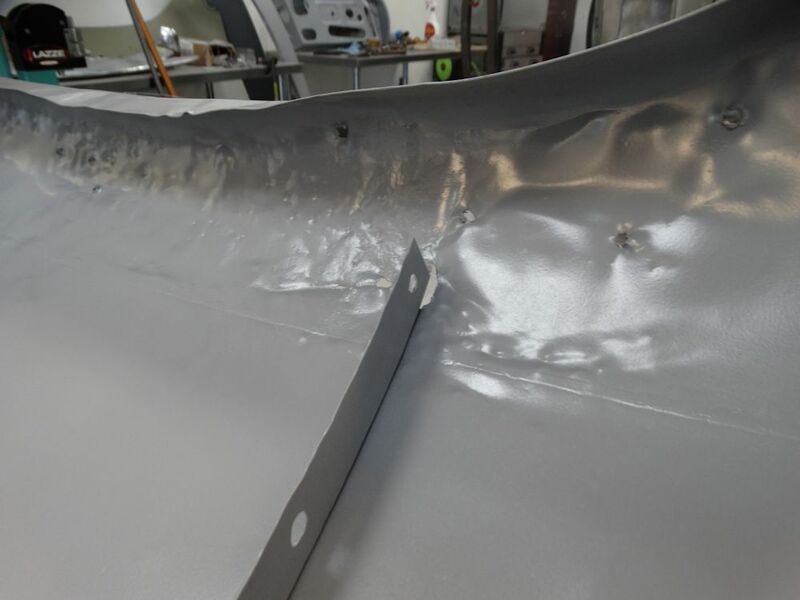 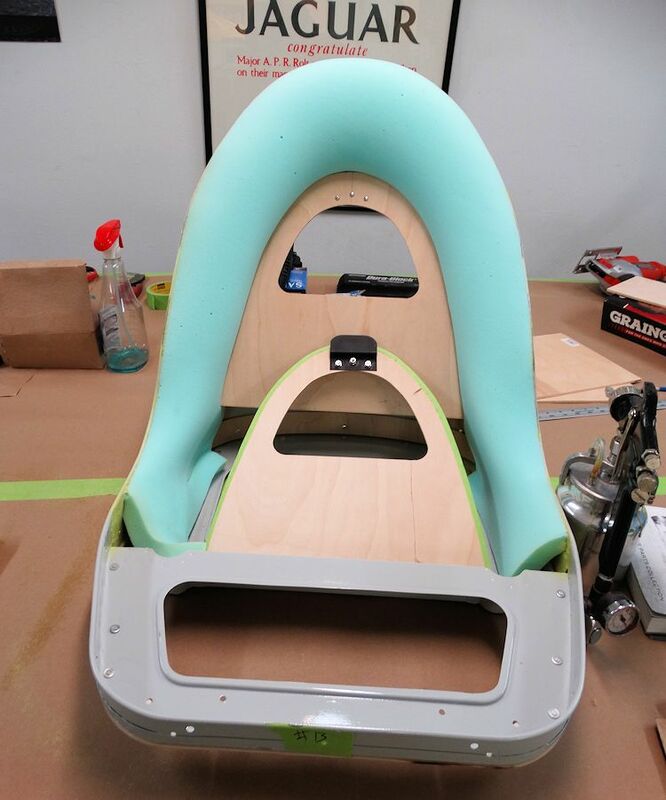 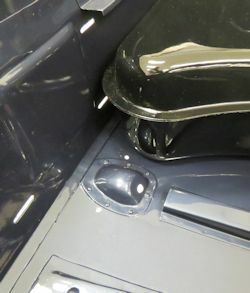 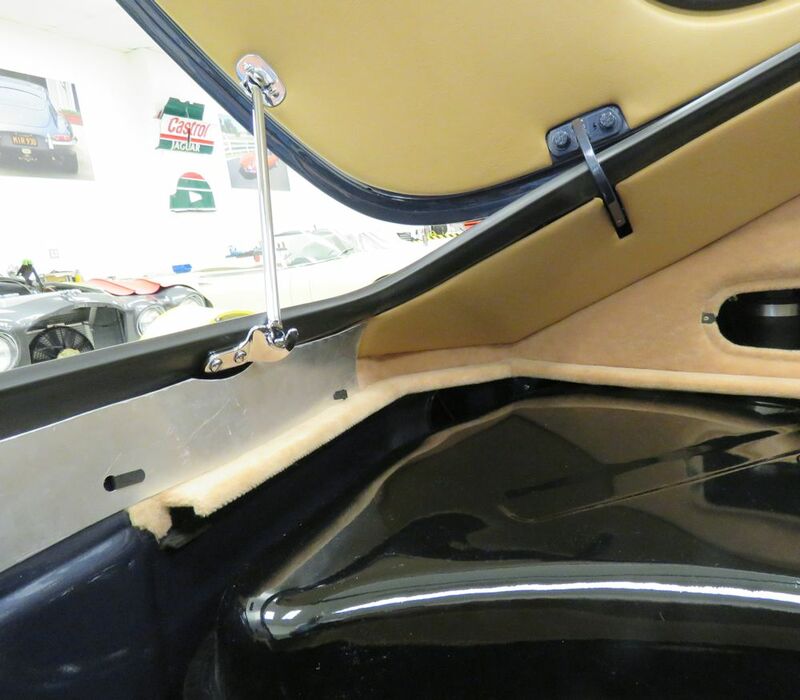 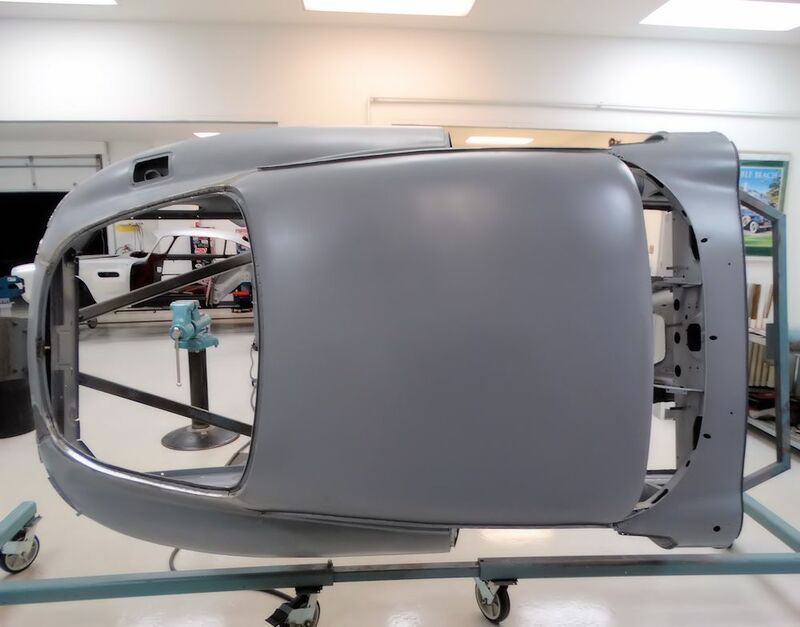 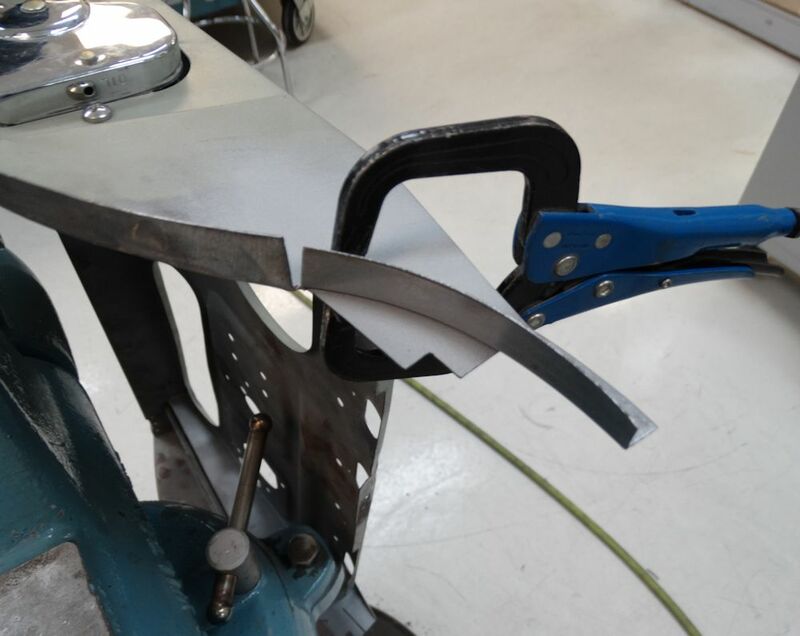 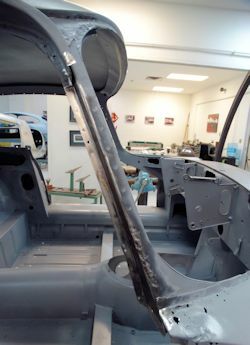 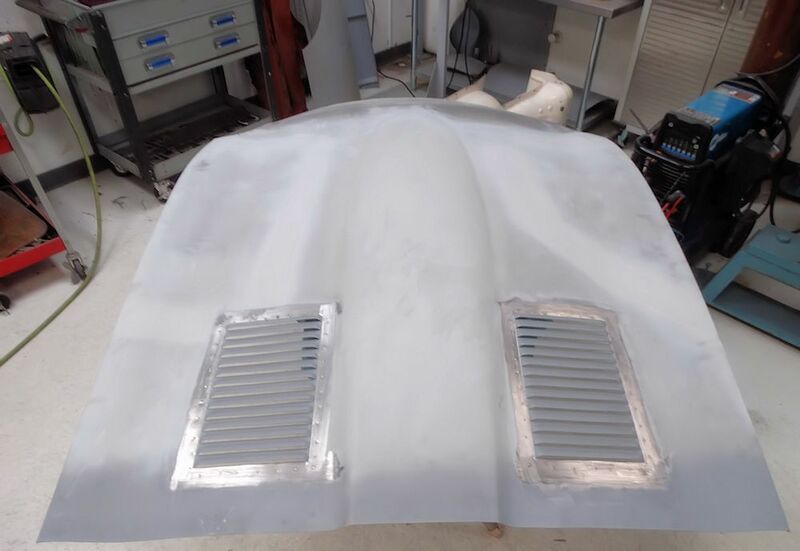 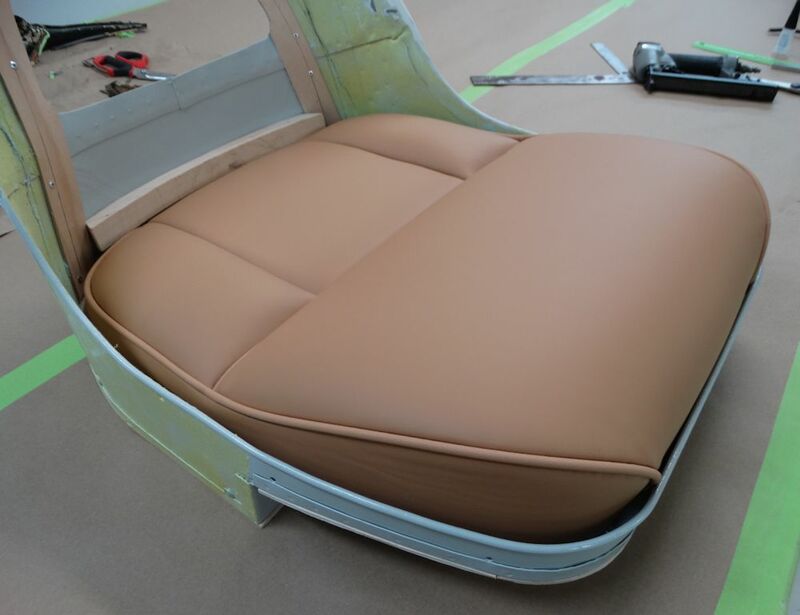 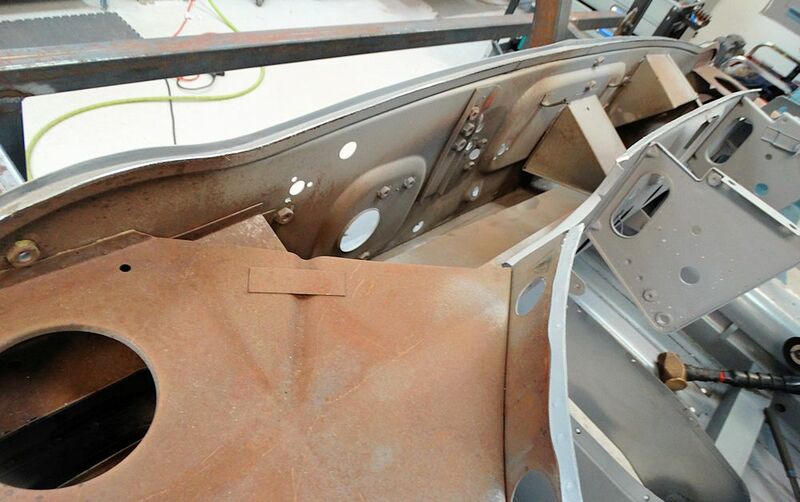 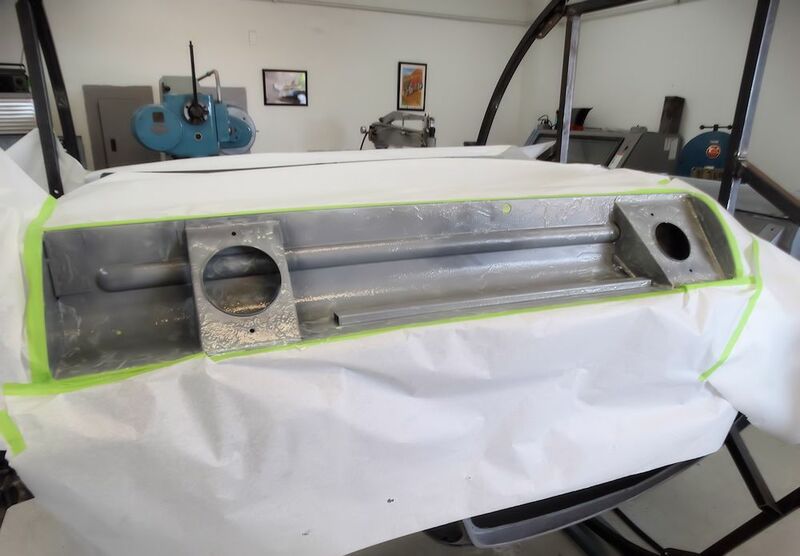 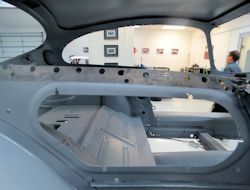 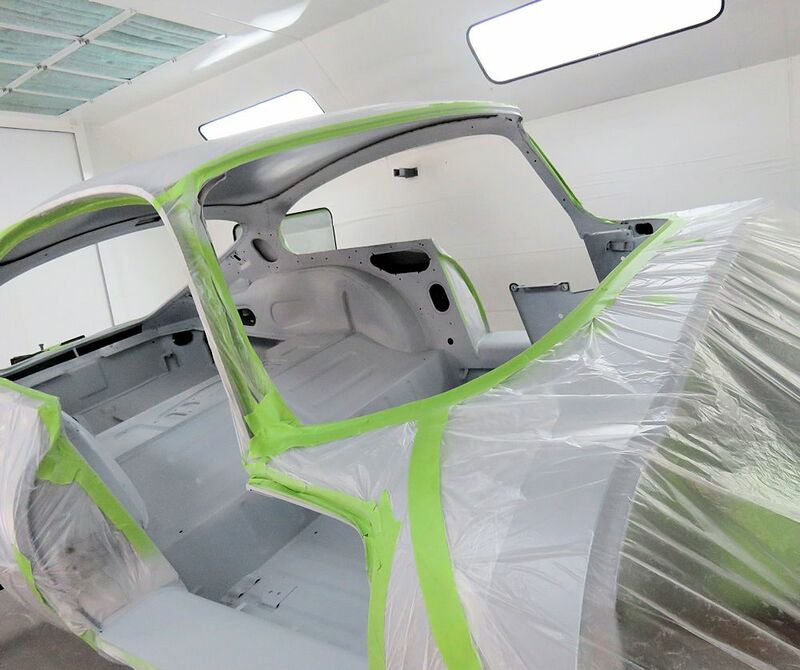 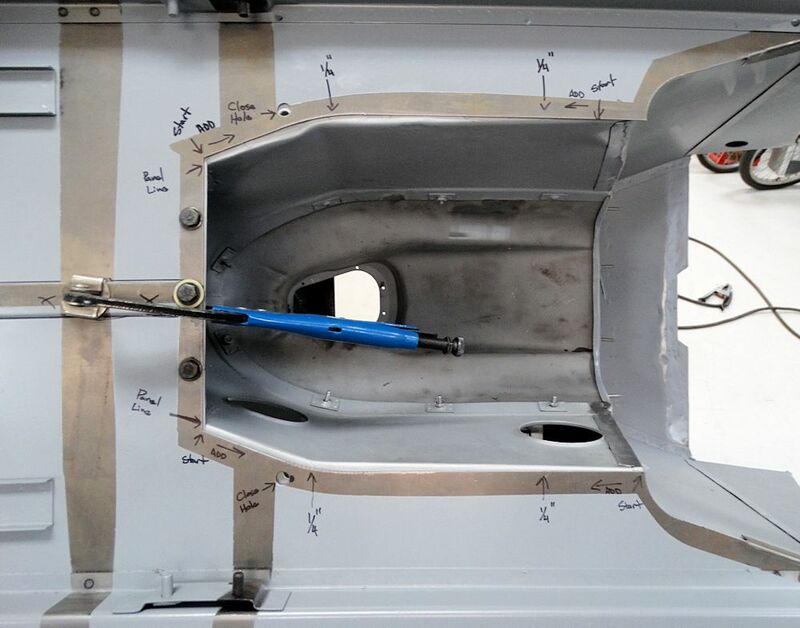 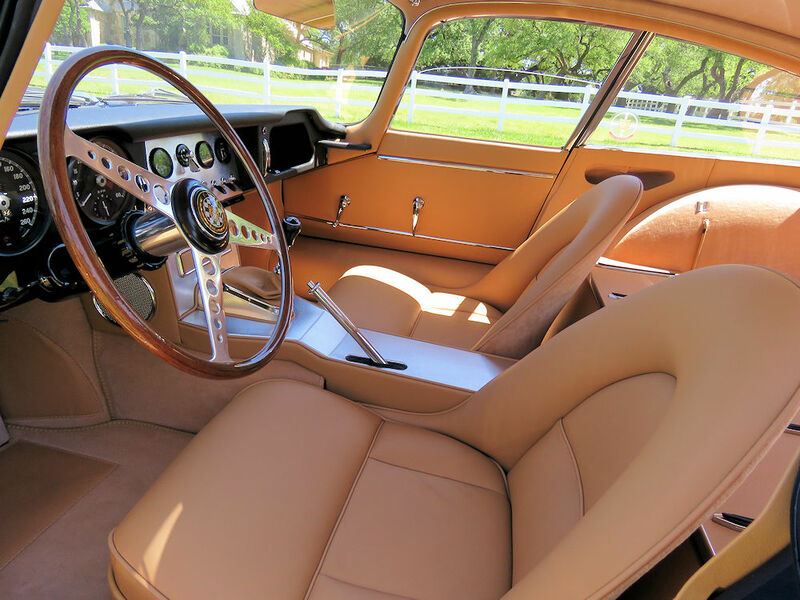 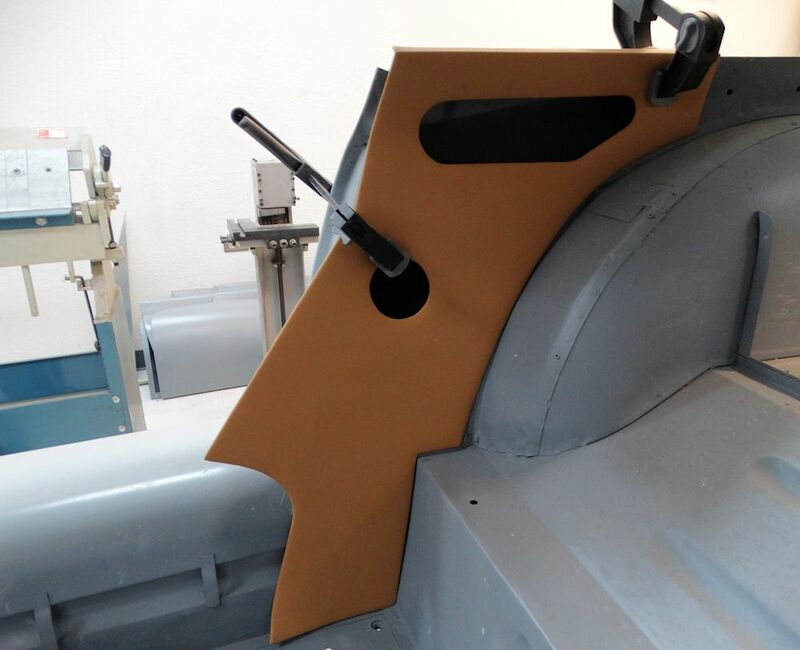 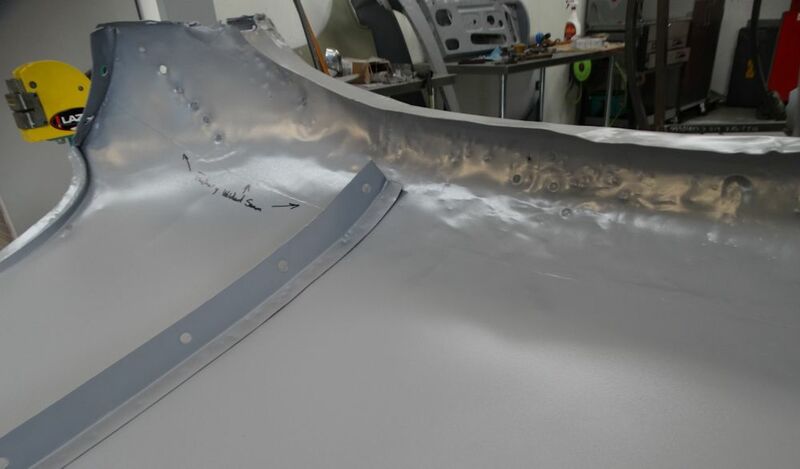 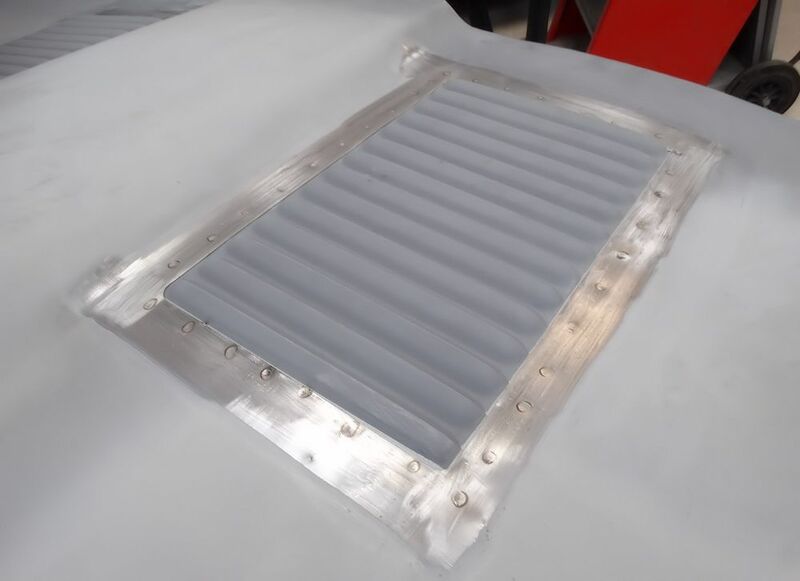 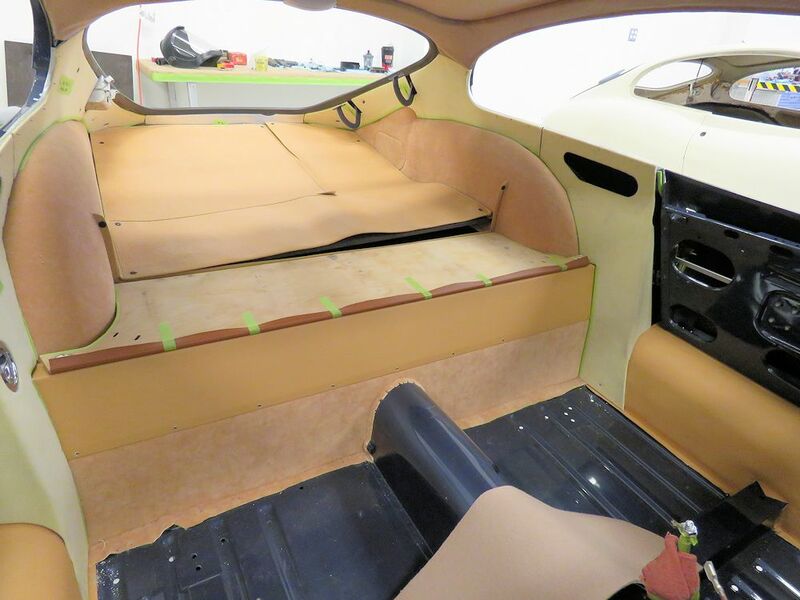 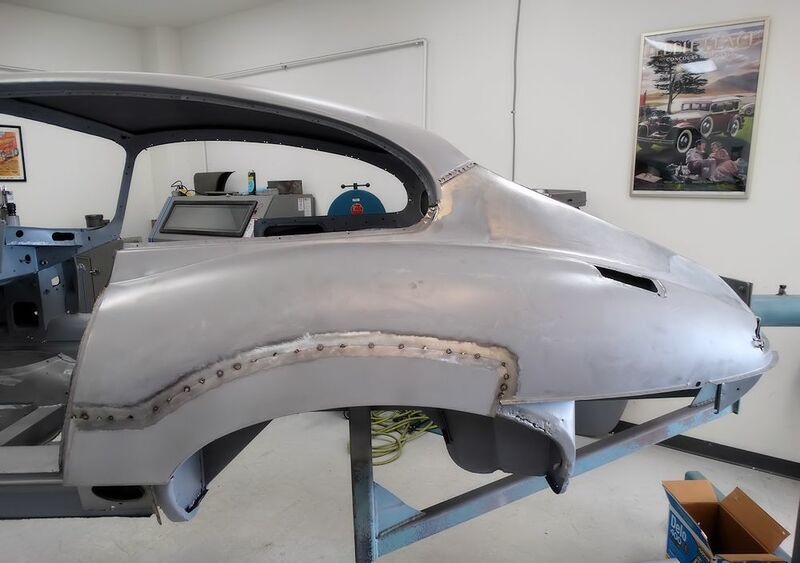 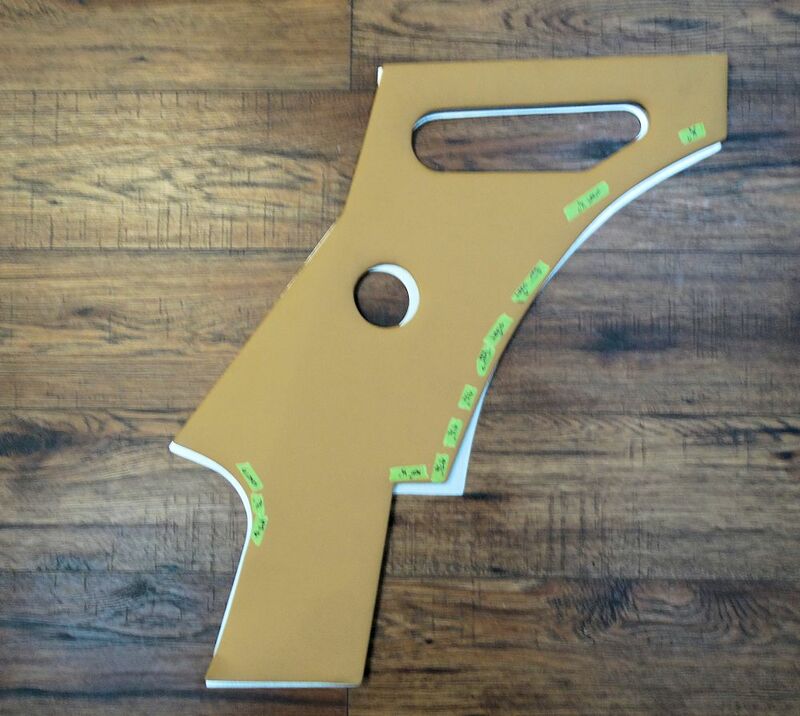 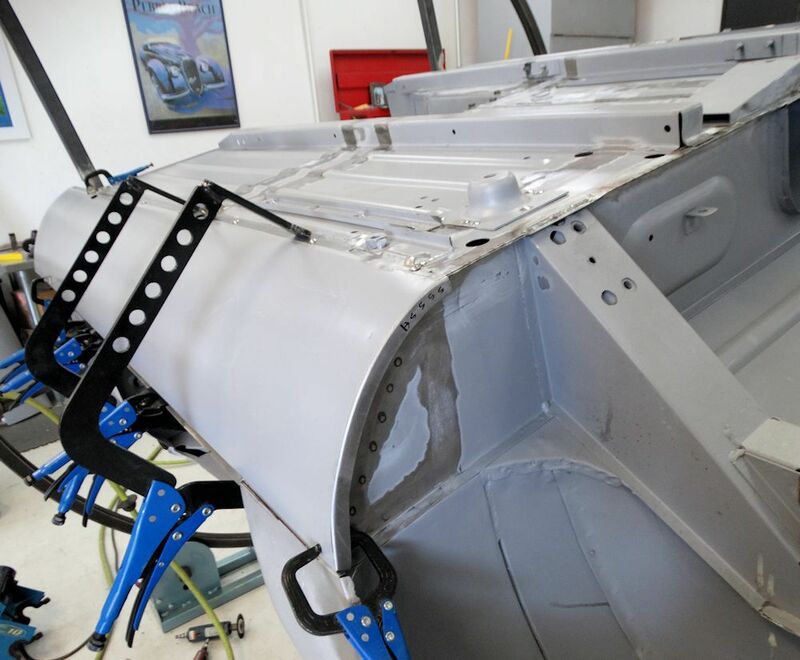 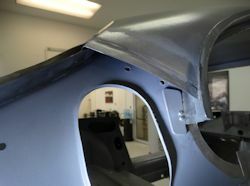 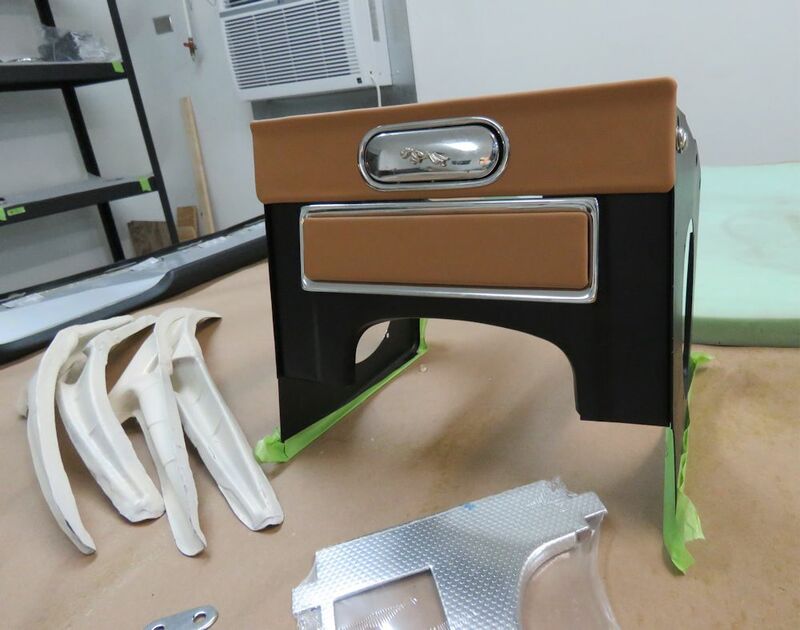 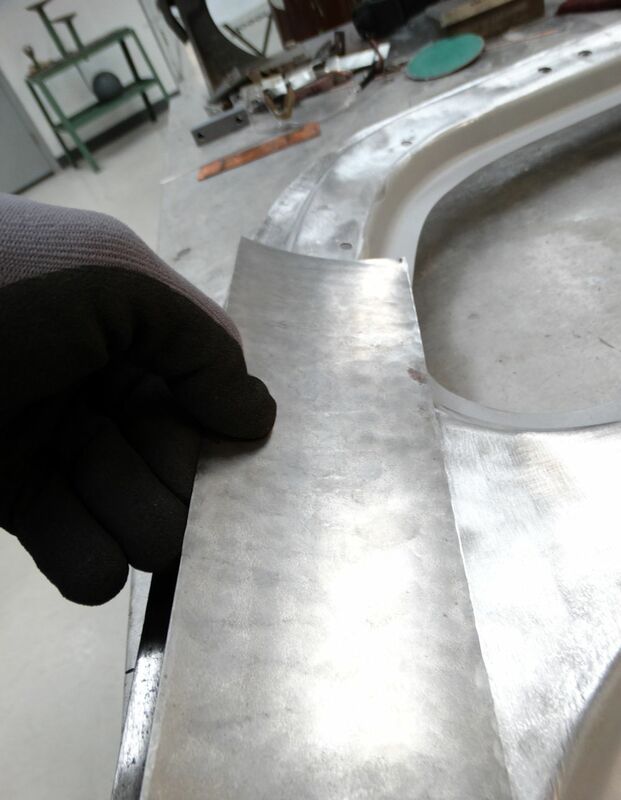 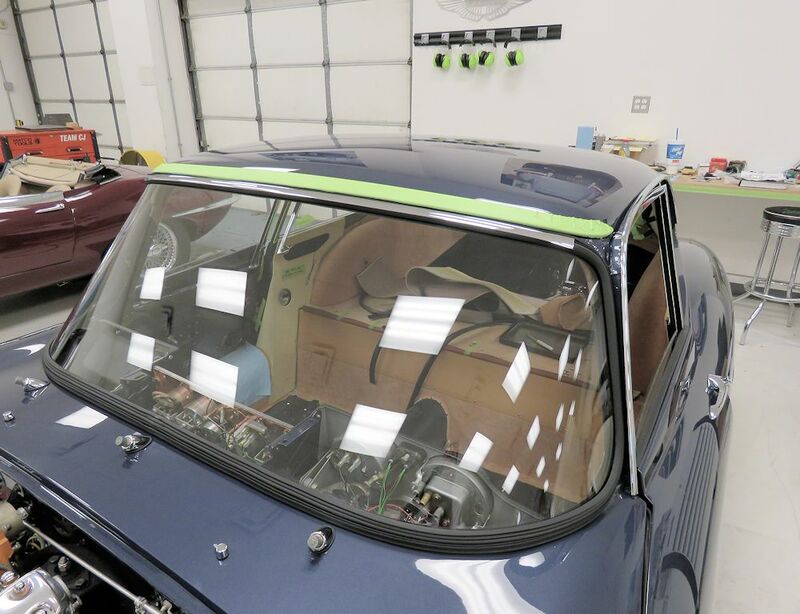 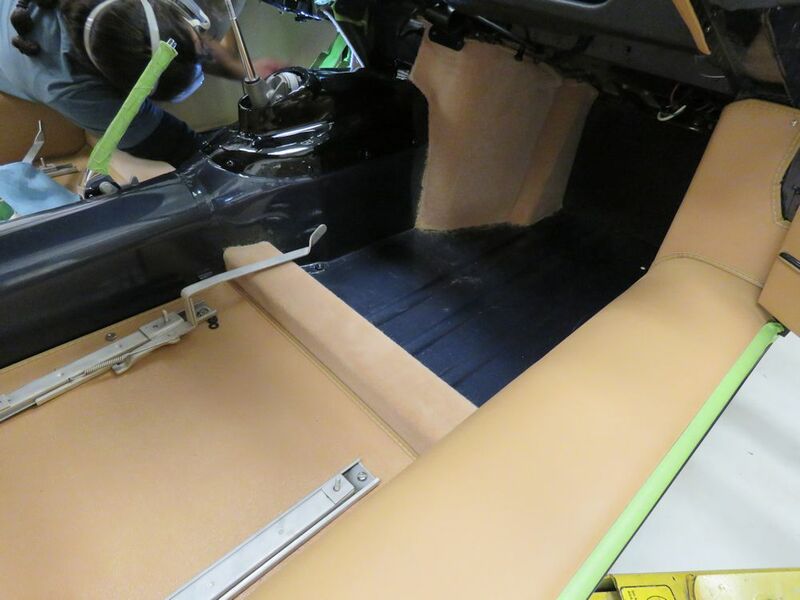 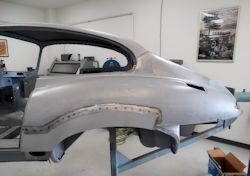 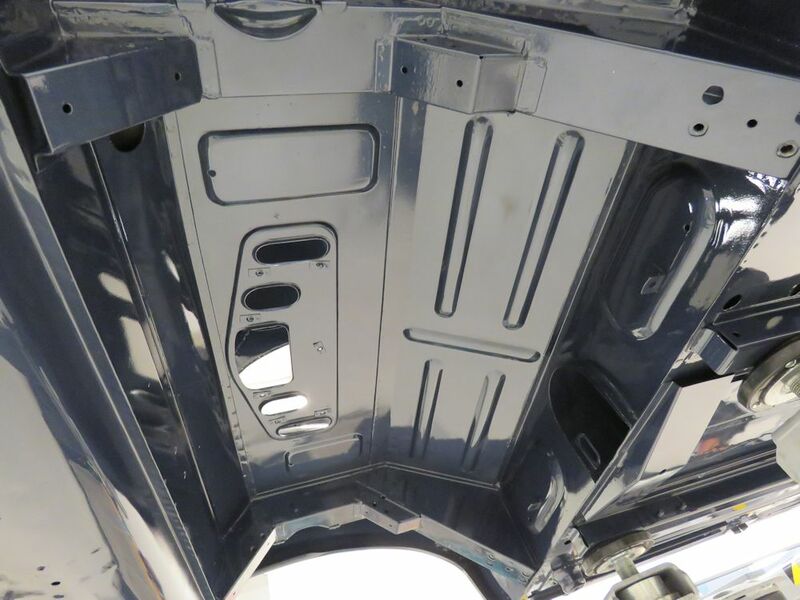 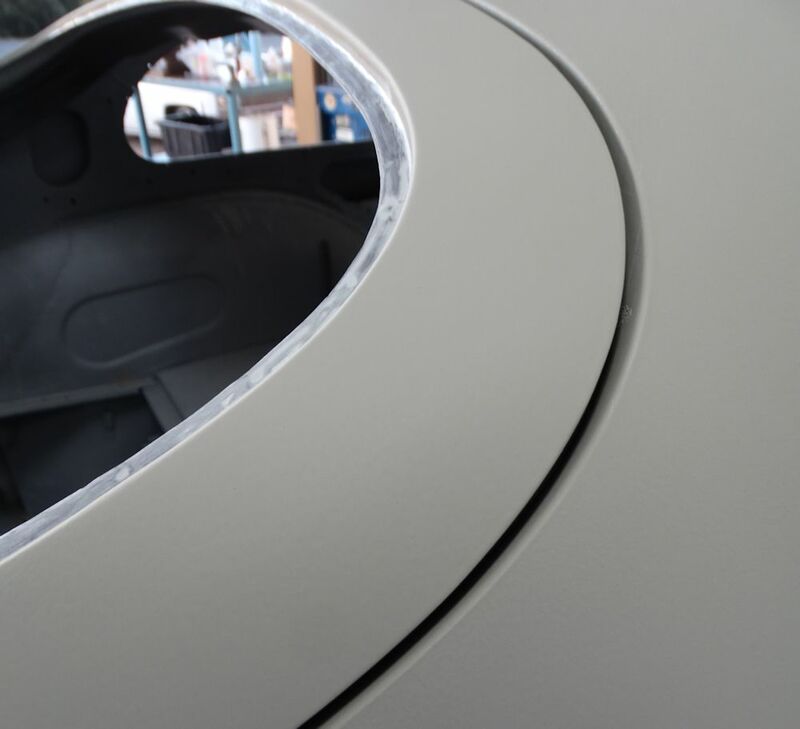 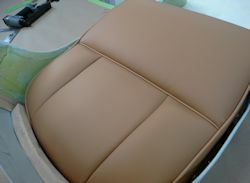 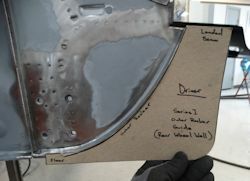 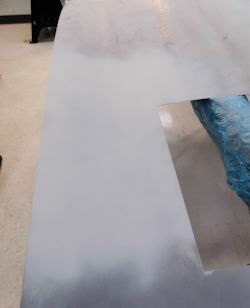 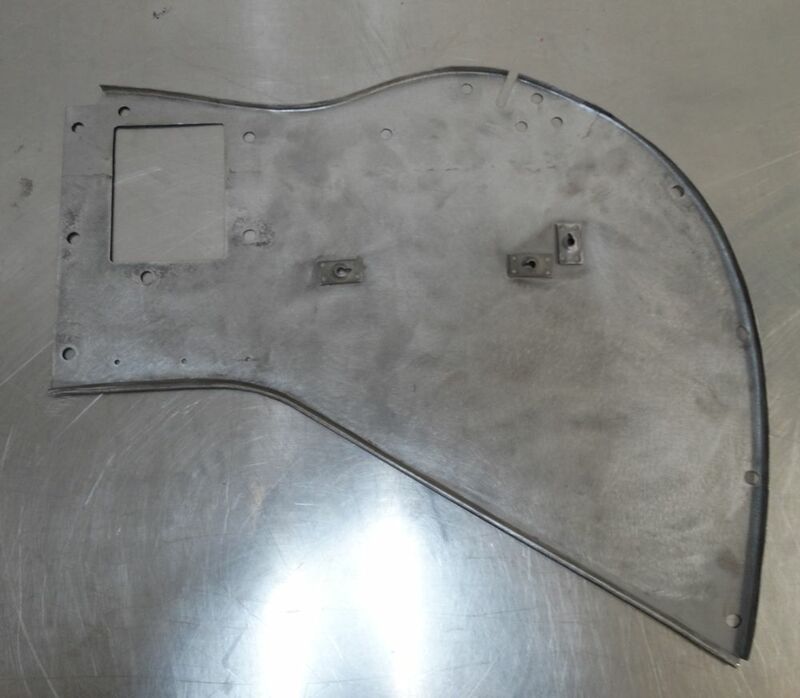 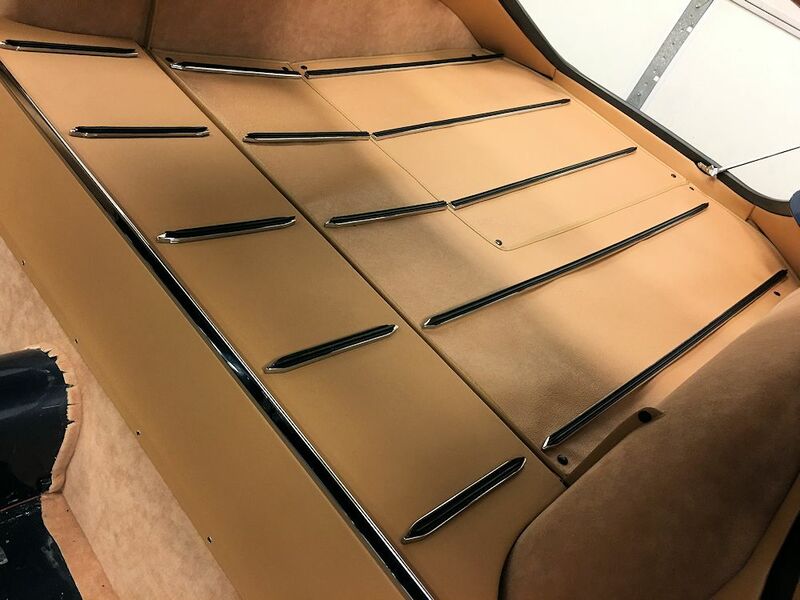 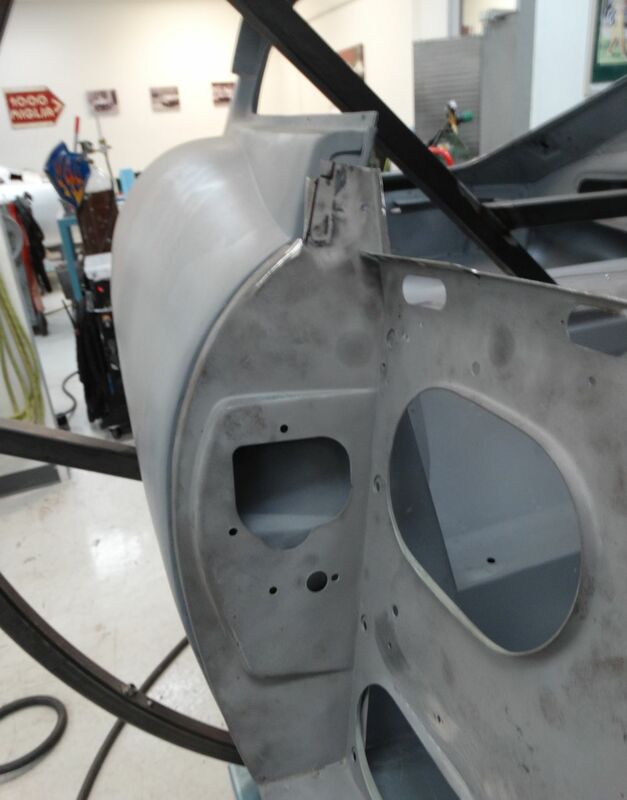 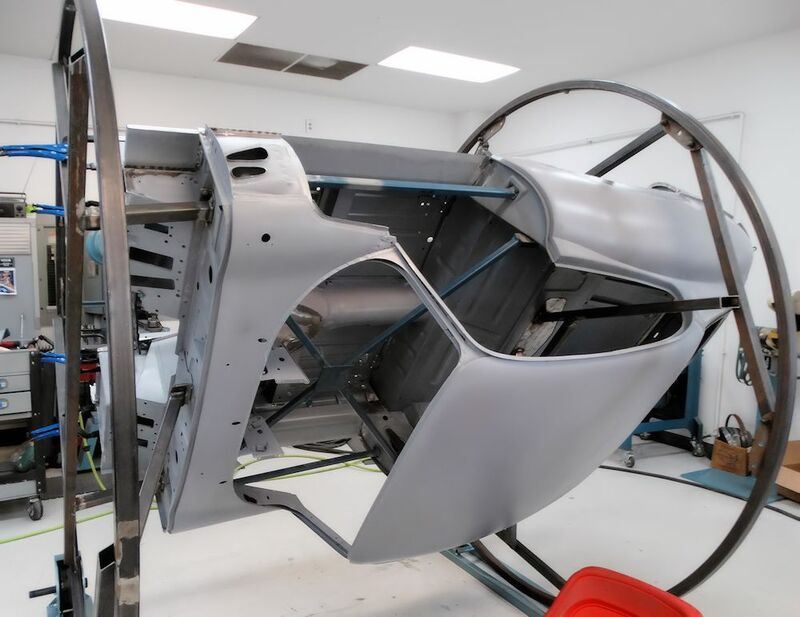 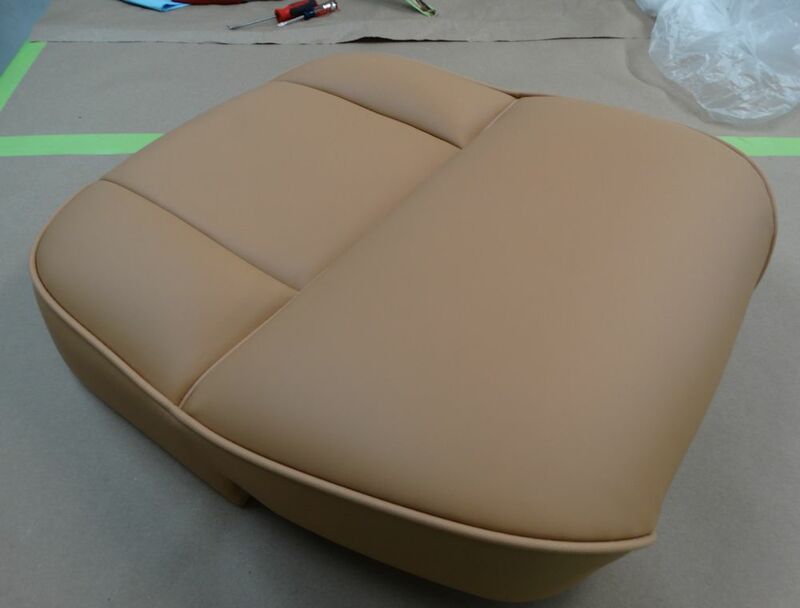 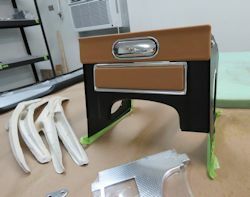 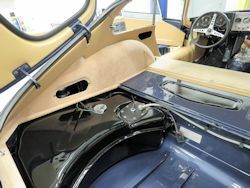 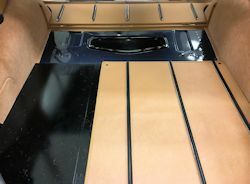 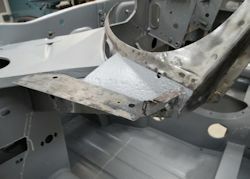 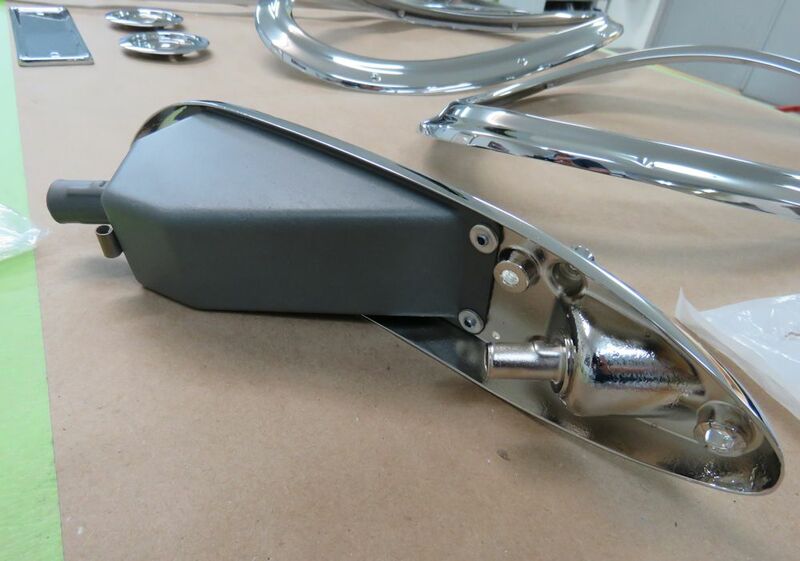 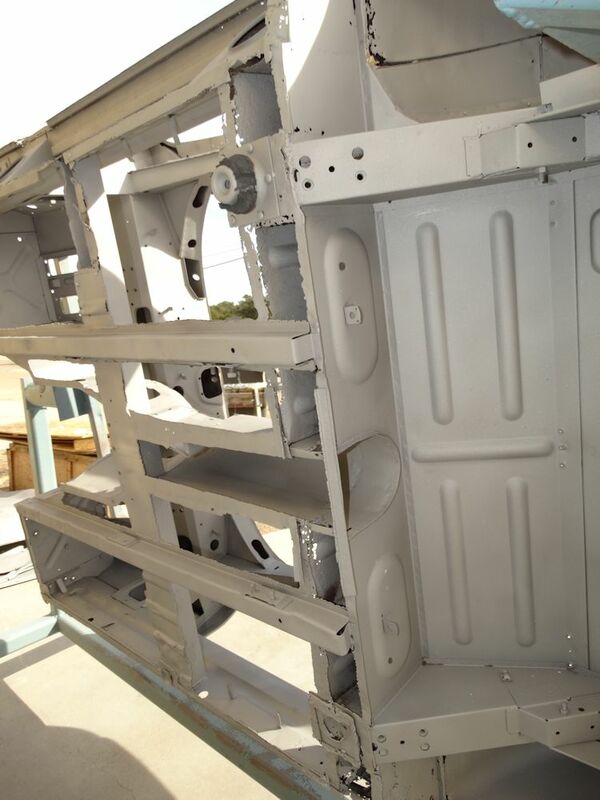 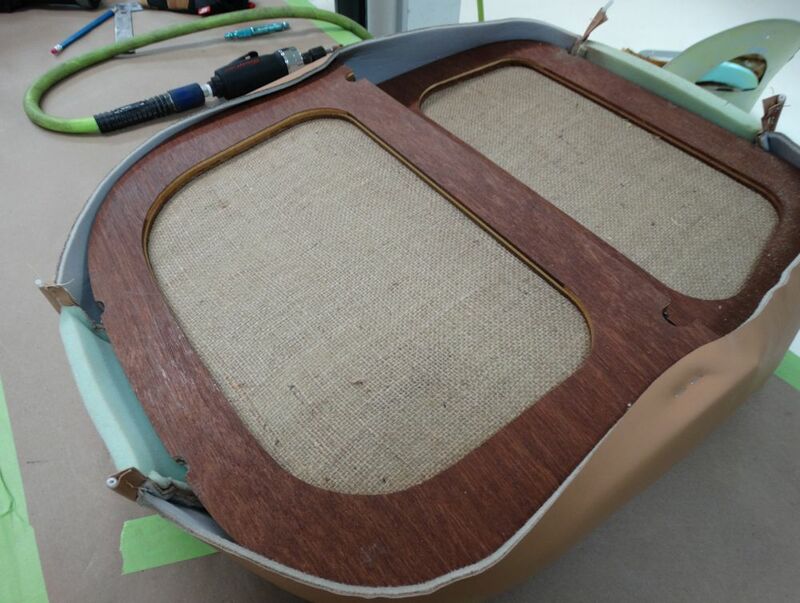 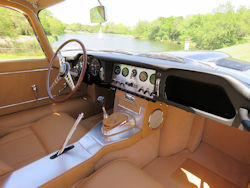 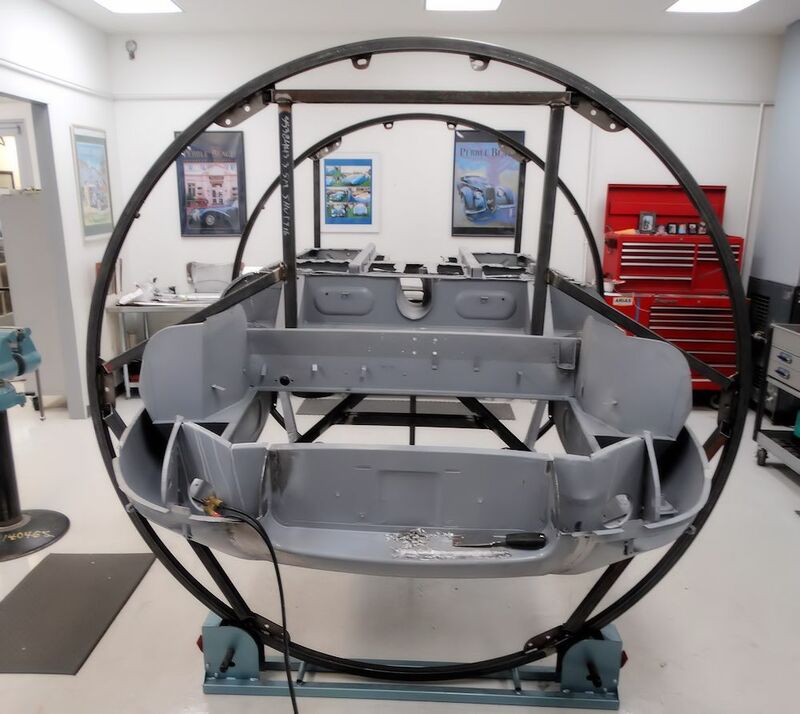 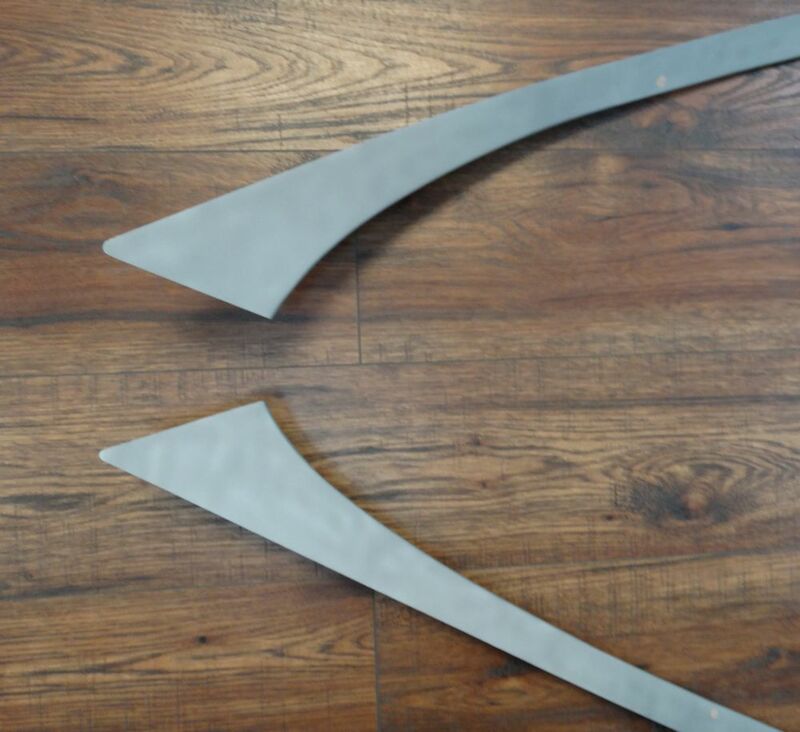 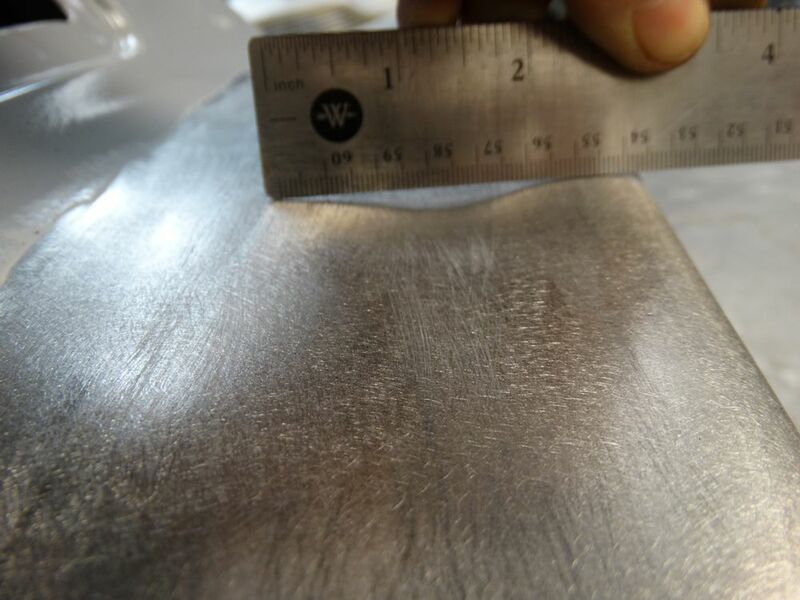 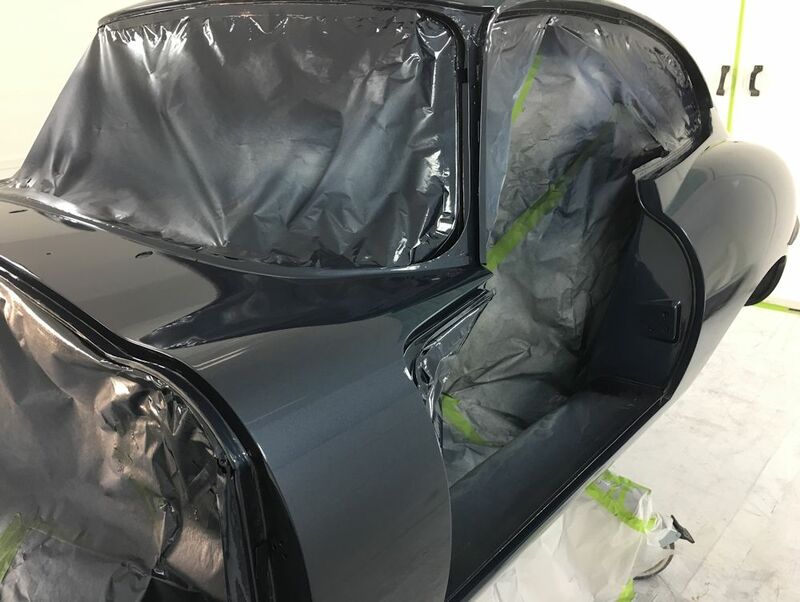 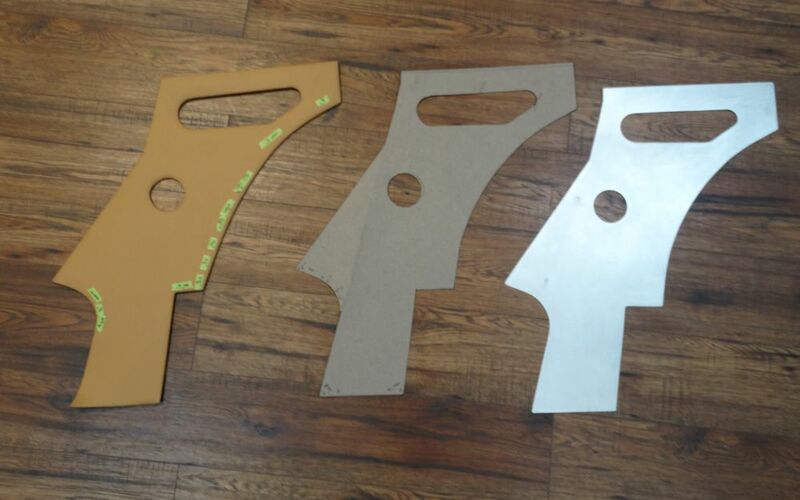 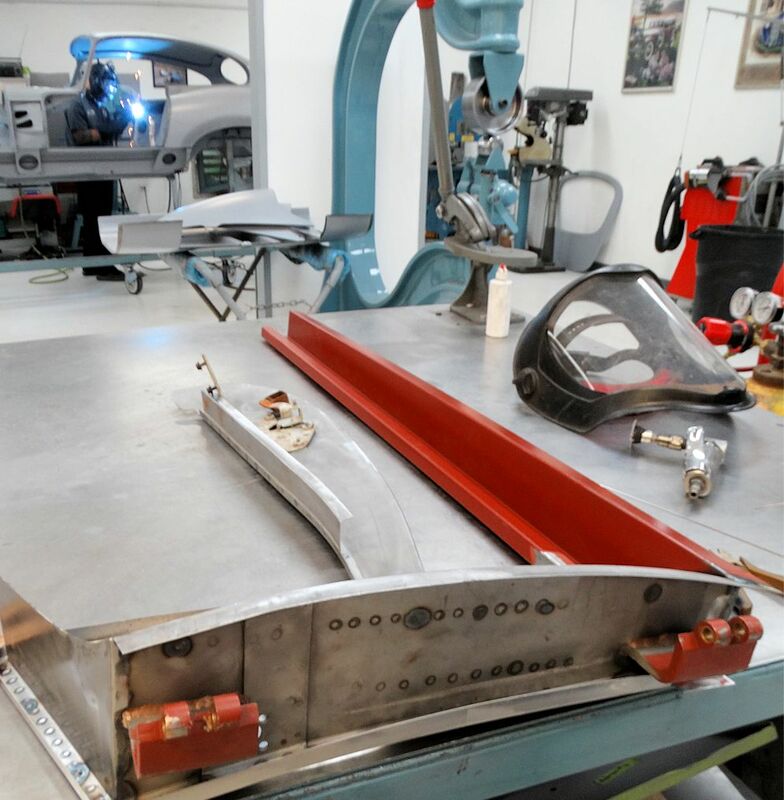 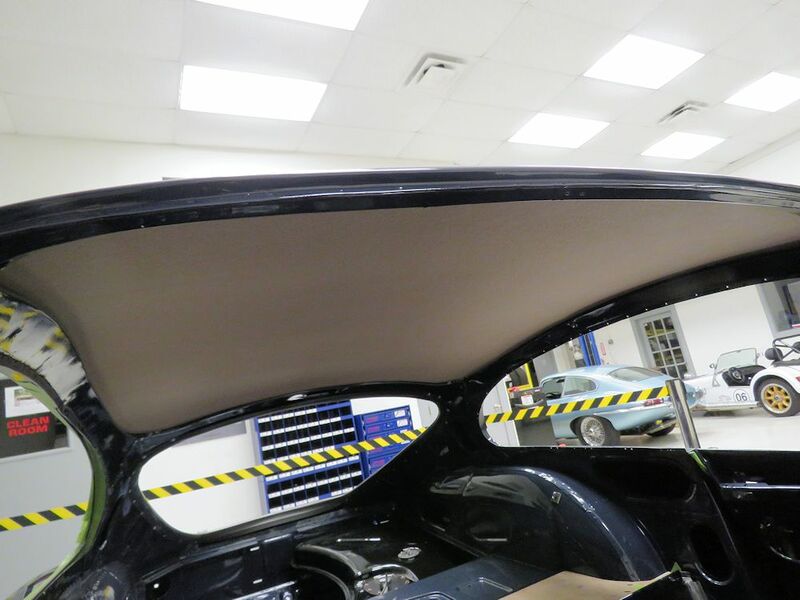 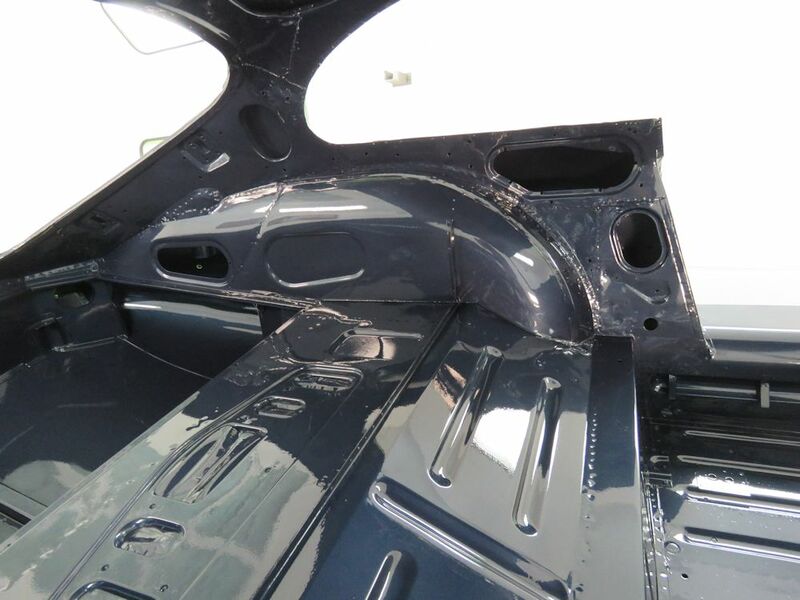 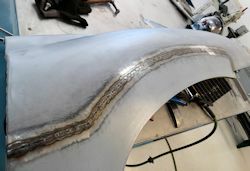 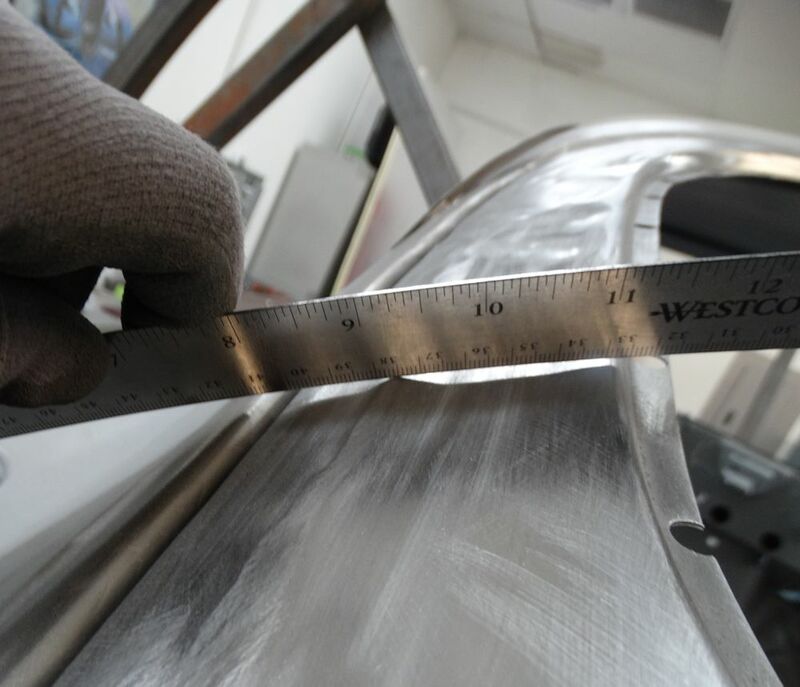 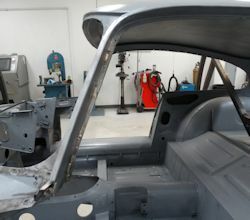 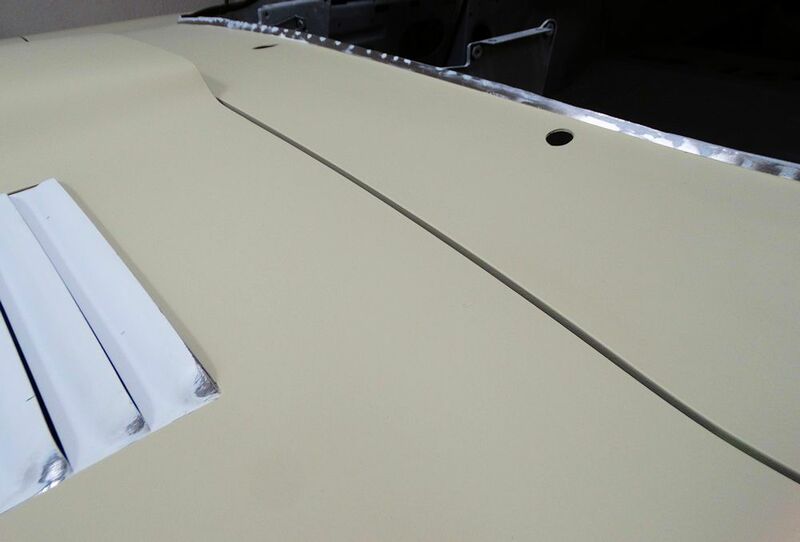 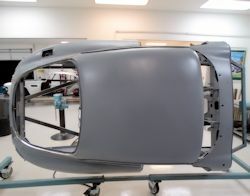 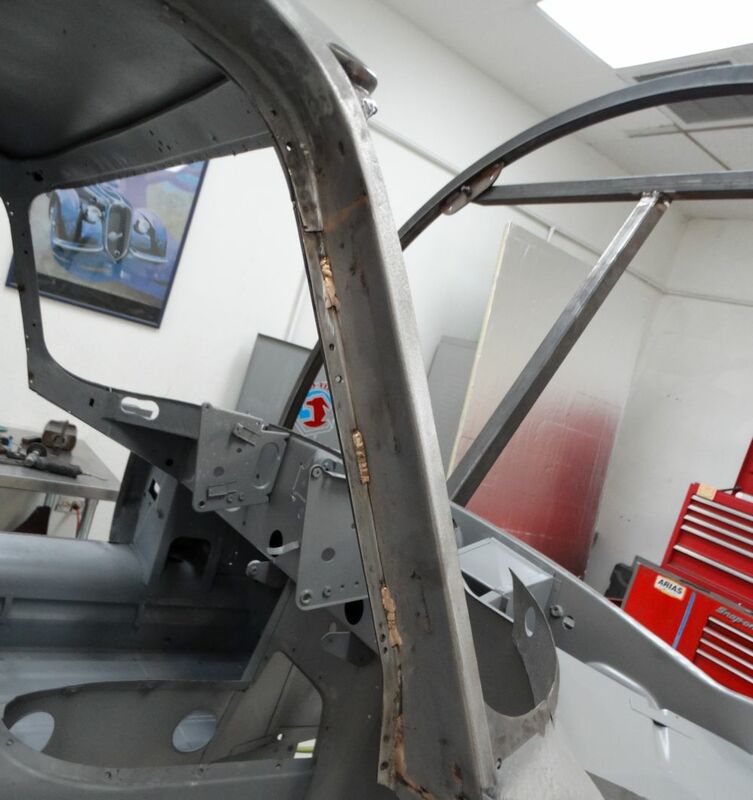 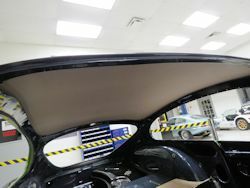 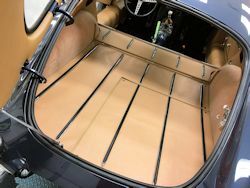 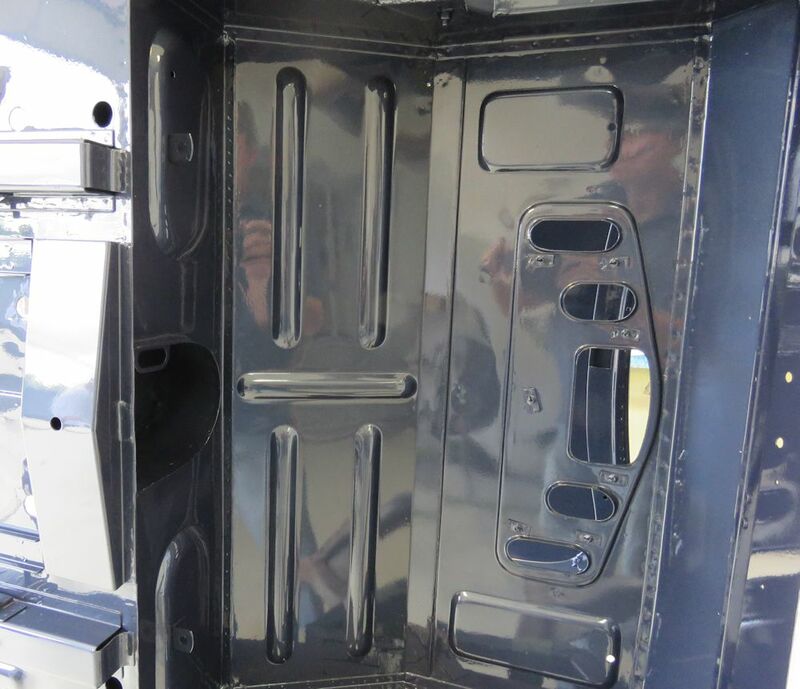 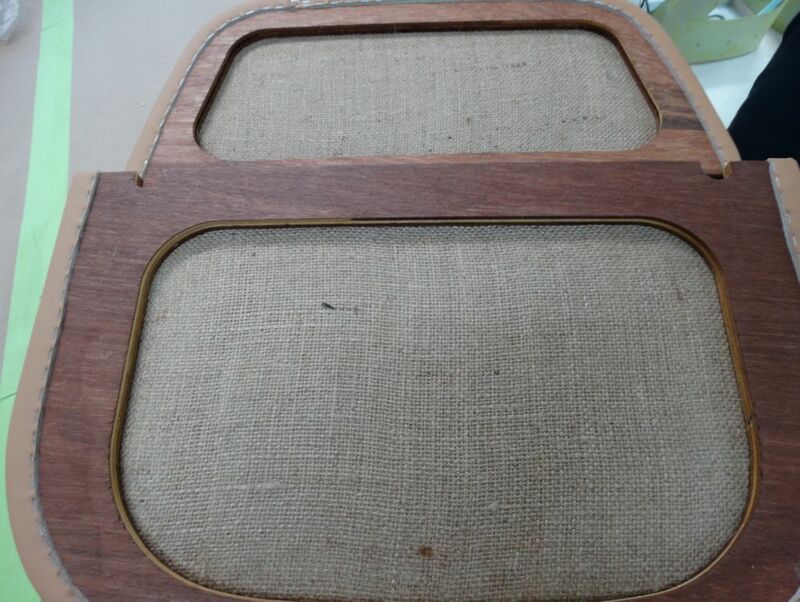 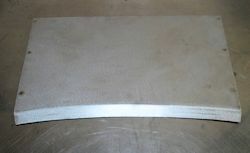 We have had to fabricate several interior trim panels as there are subtle differences between the very early cars and later production models. 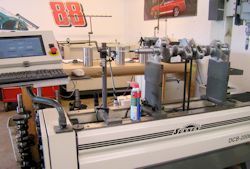 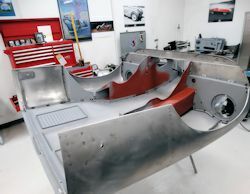 It isn't really possible to buy a 'kit' for the very early cars, because so many things were hand built, resulting in variations from one car to the next. 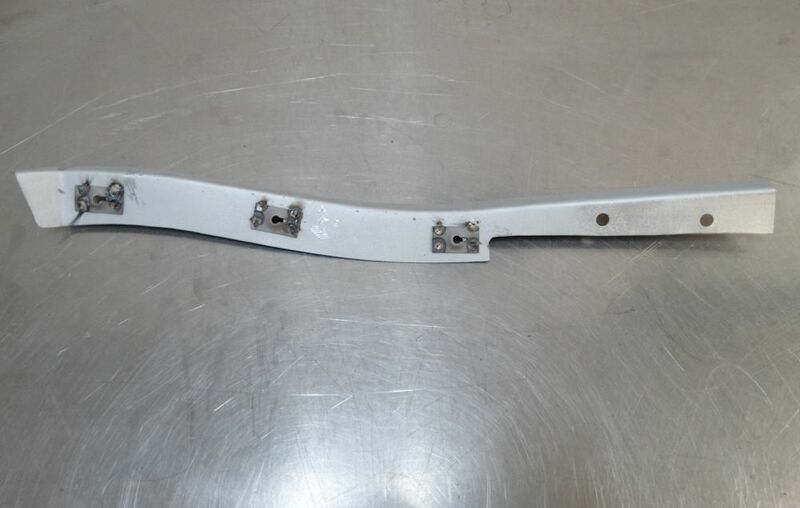 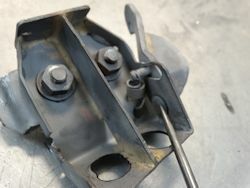 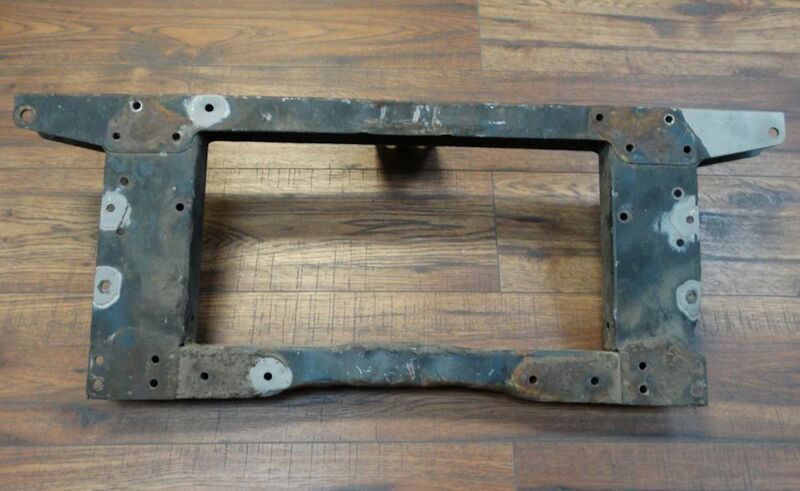 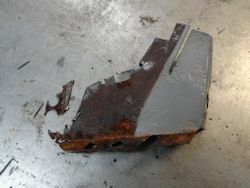 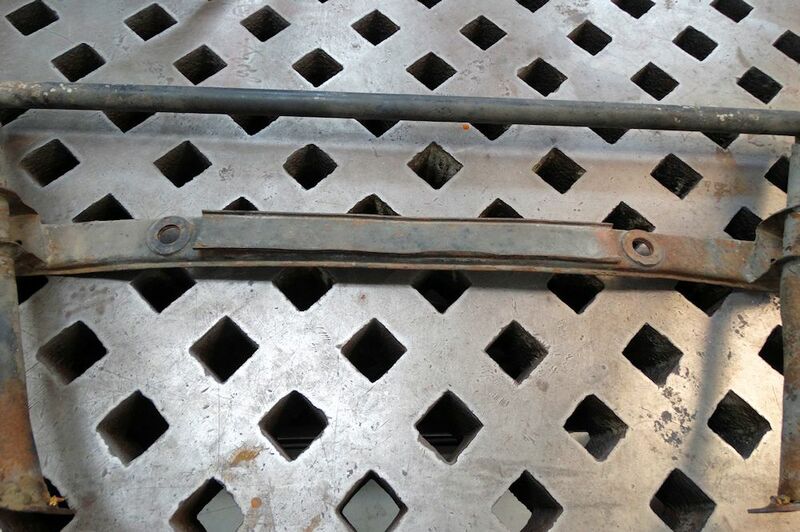 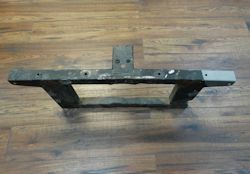 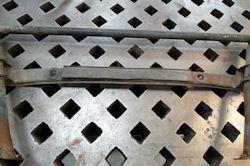 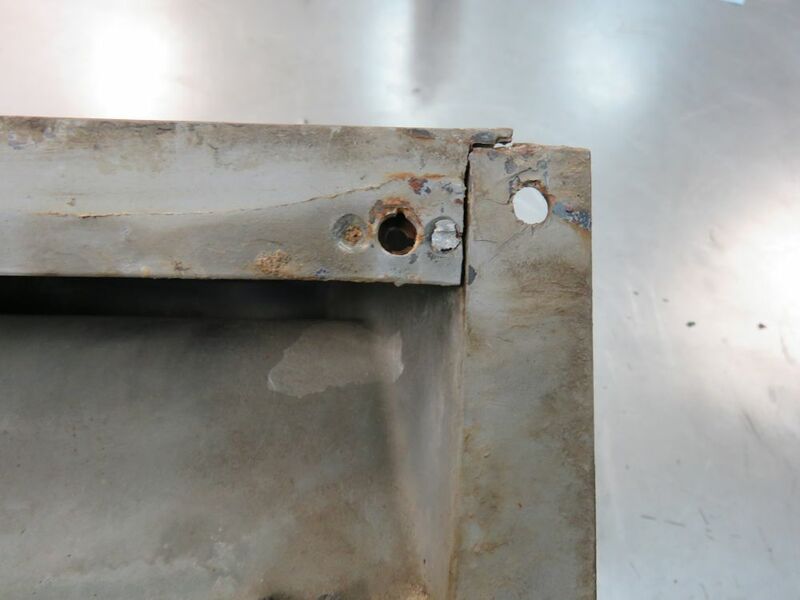 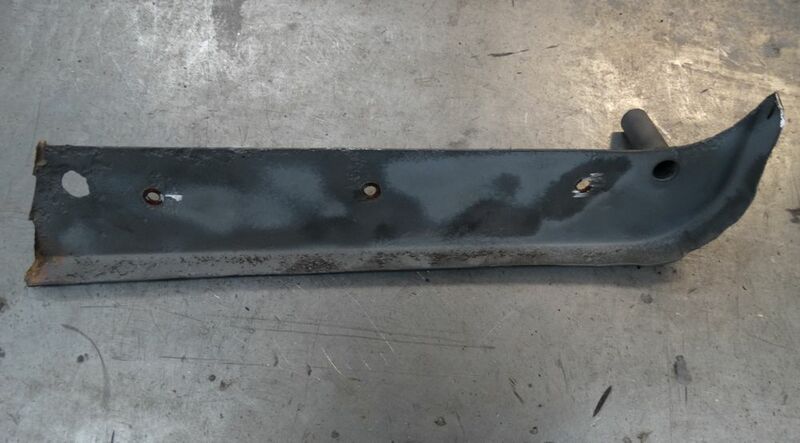 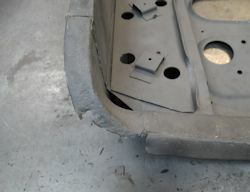 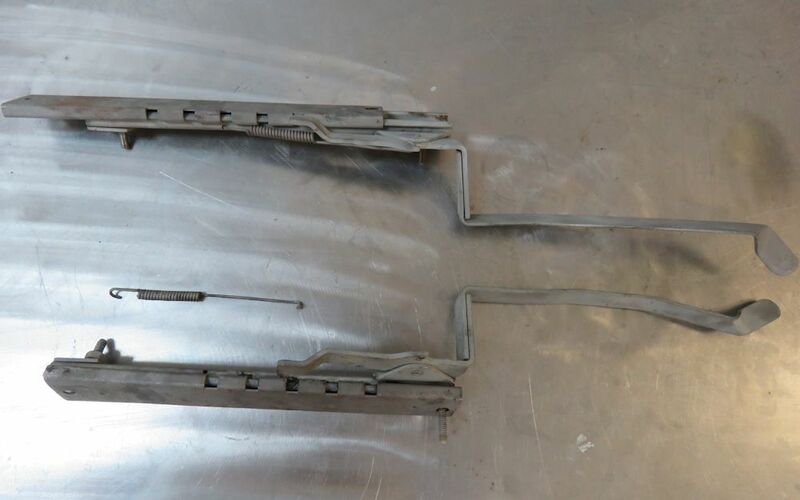 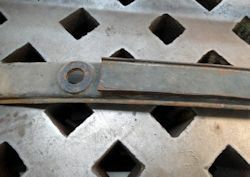 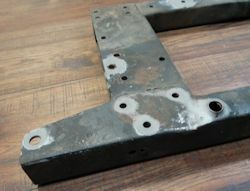 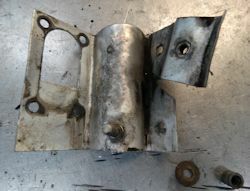 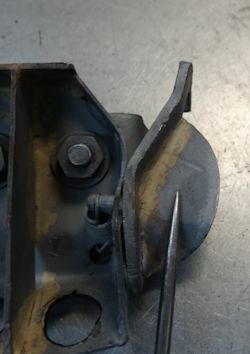 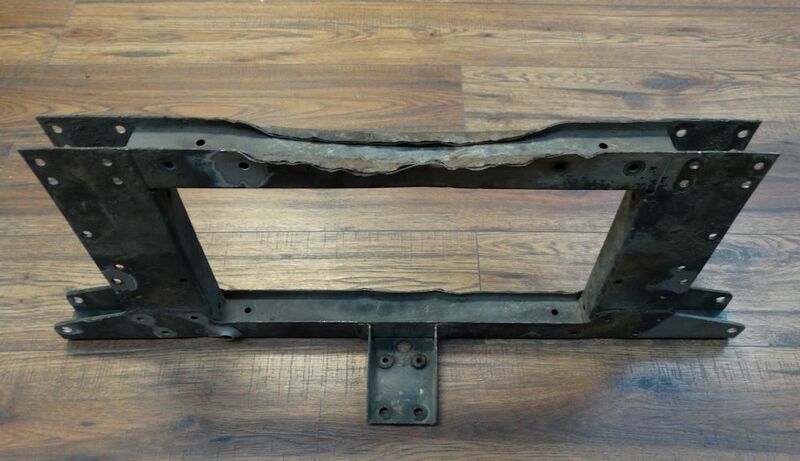 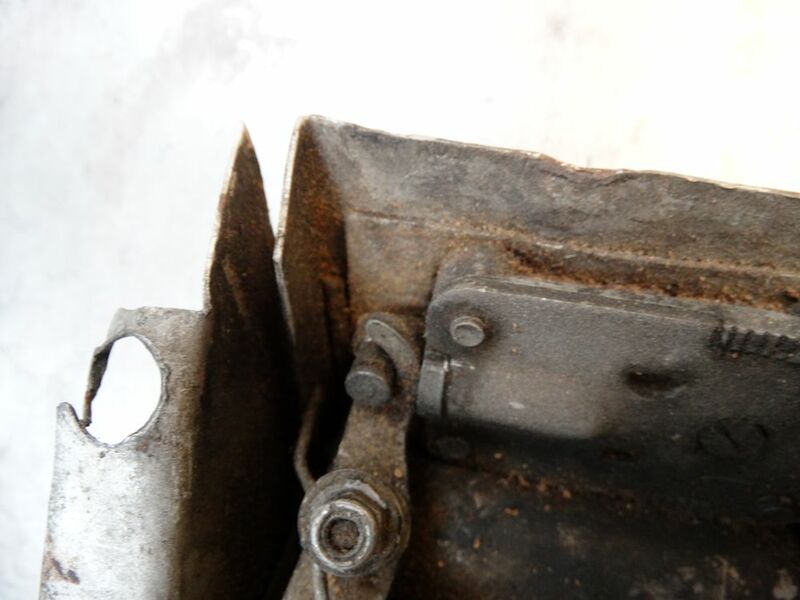 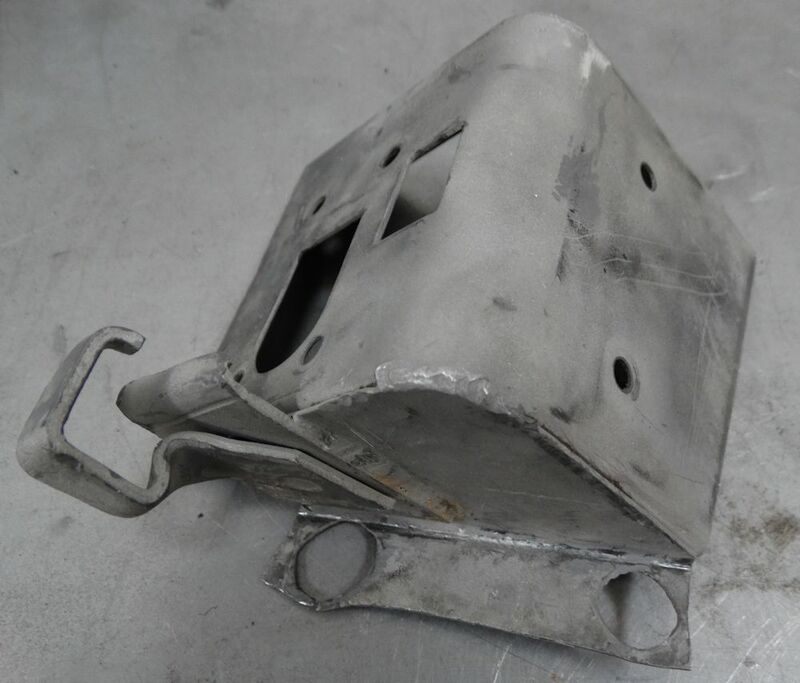 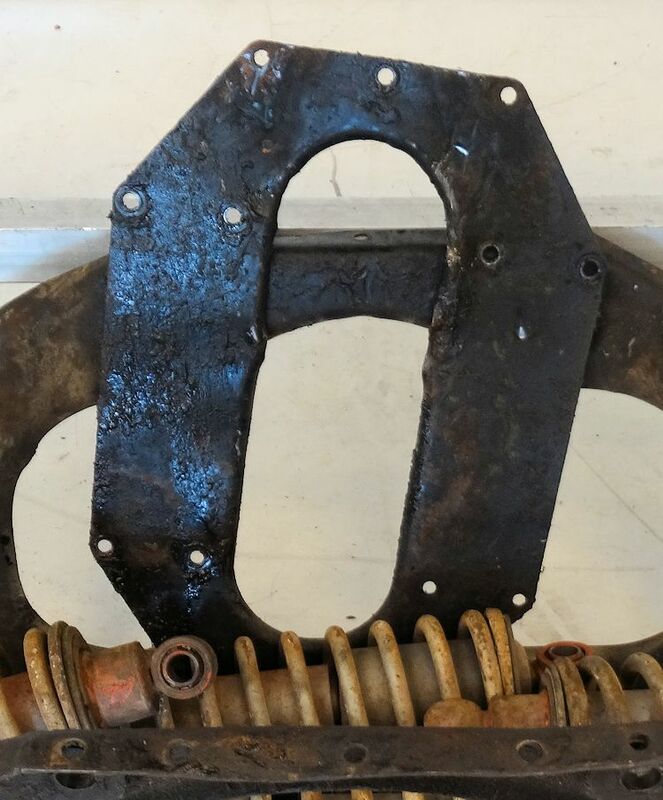 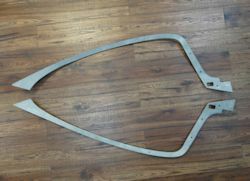 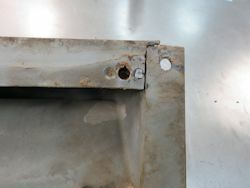 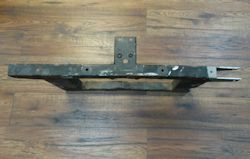 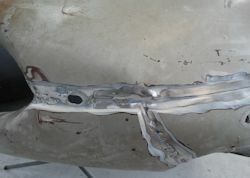 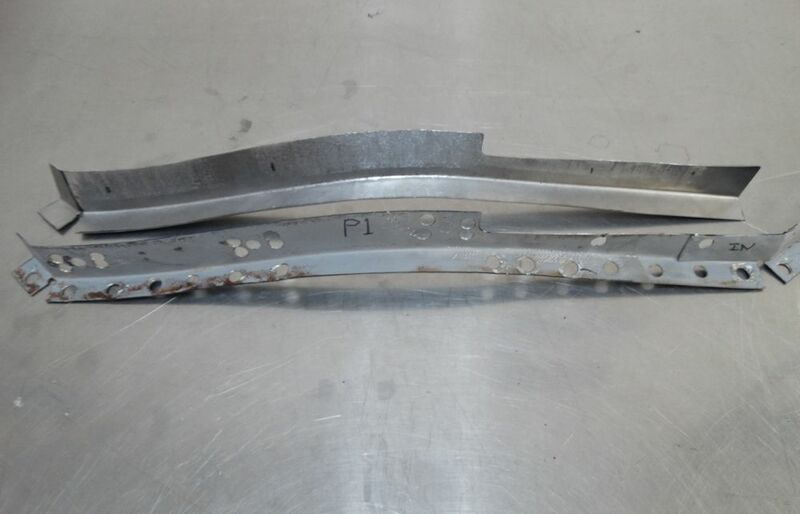 Your original bonnet hinge frame was unfortunately too badly damaged to restore. 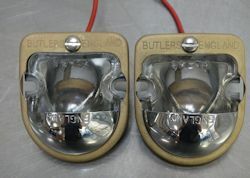 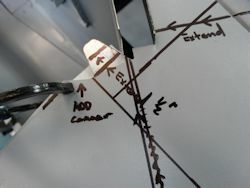 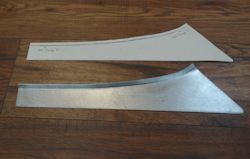 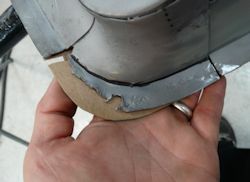 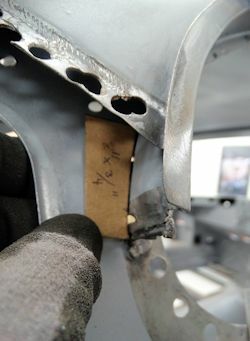 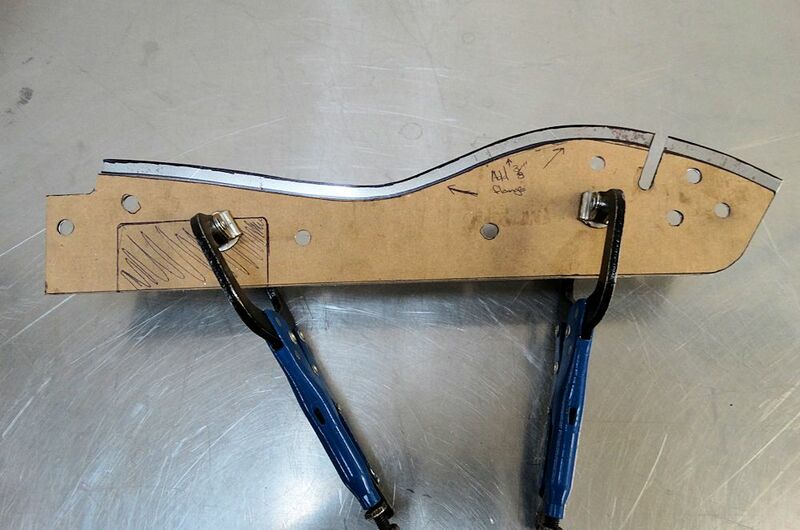 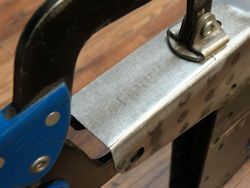 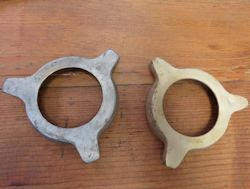 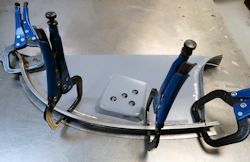 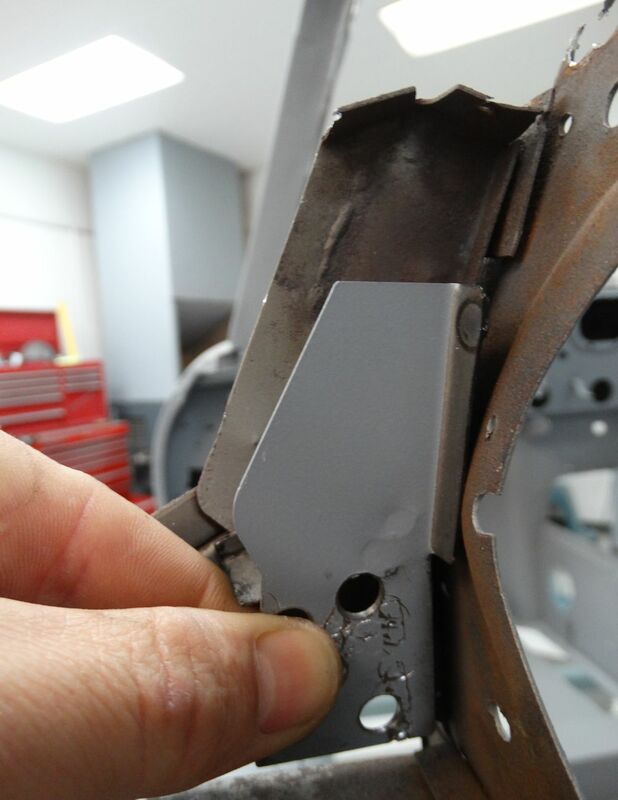 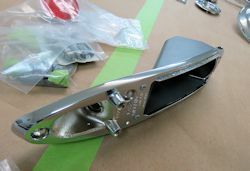 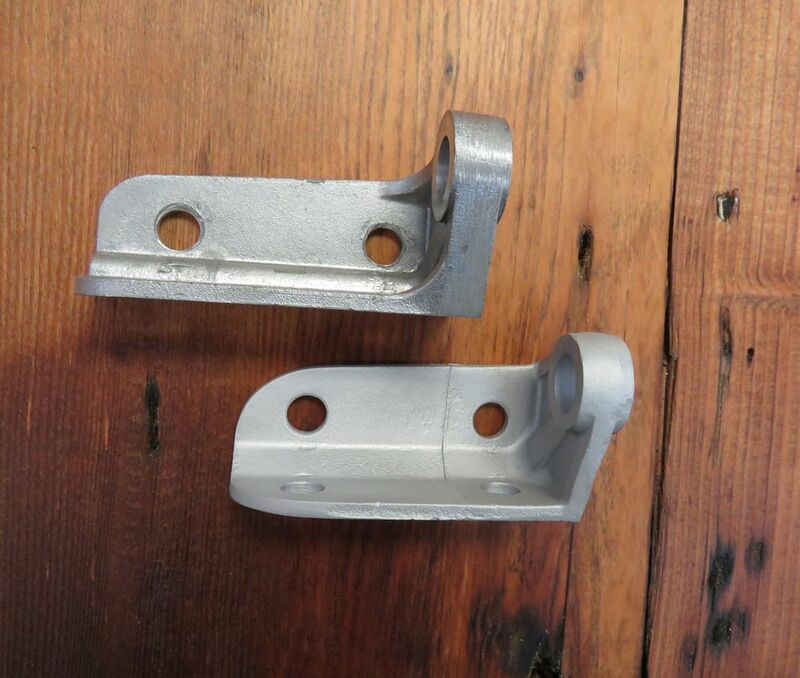 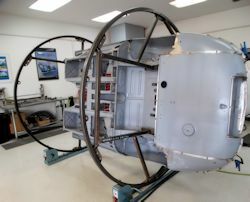 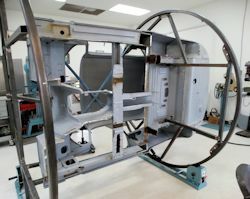 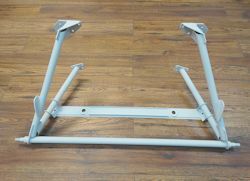 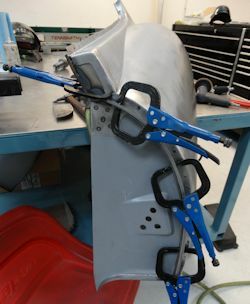 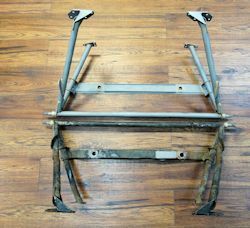 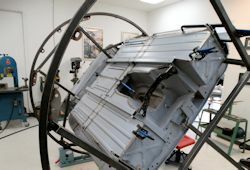 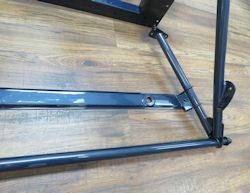 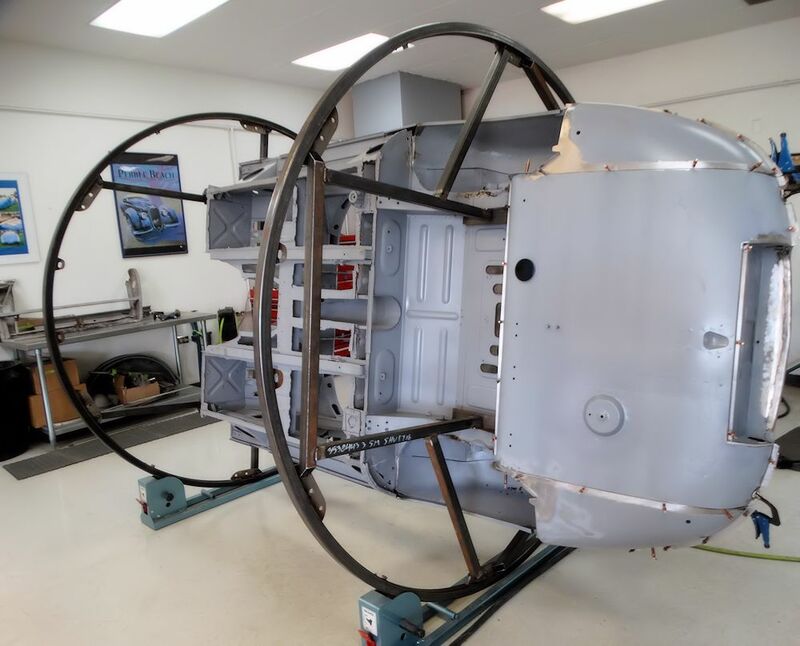 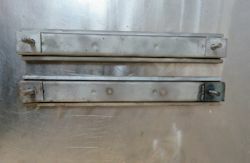 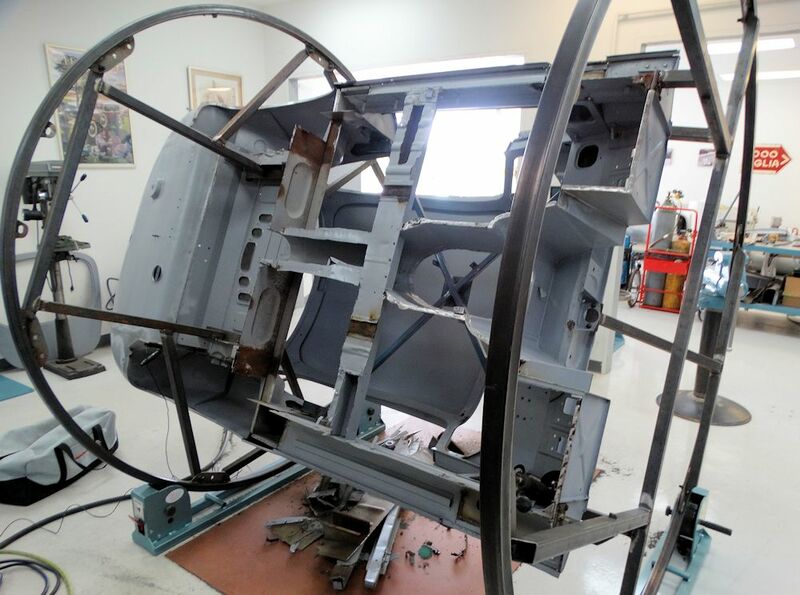 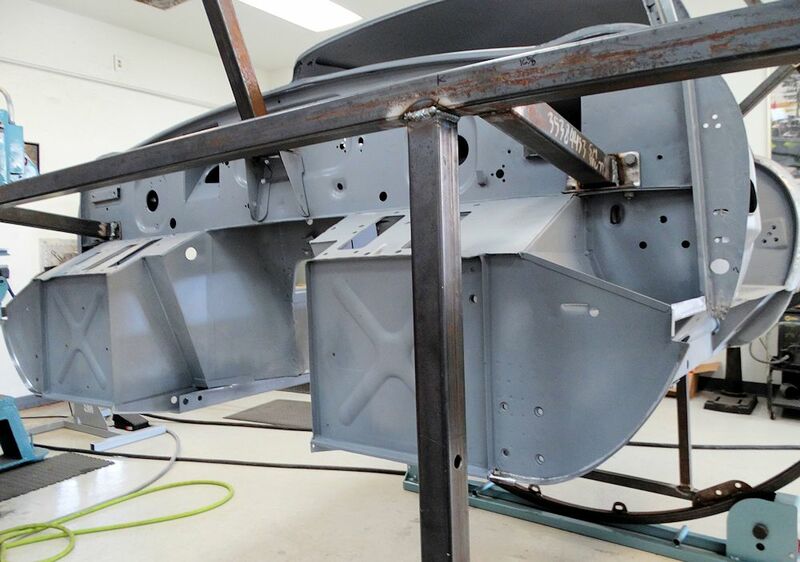 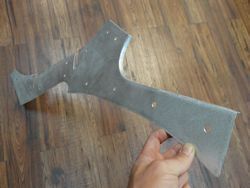 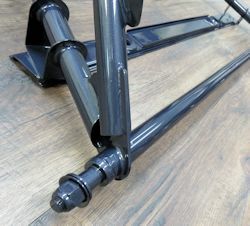 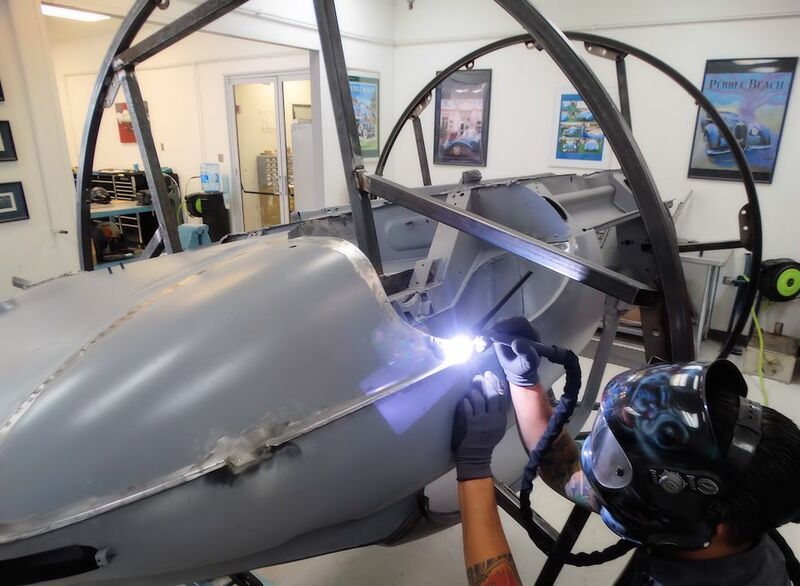 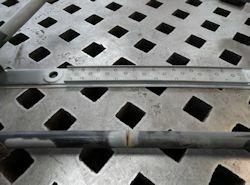 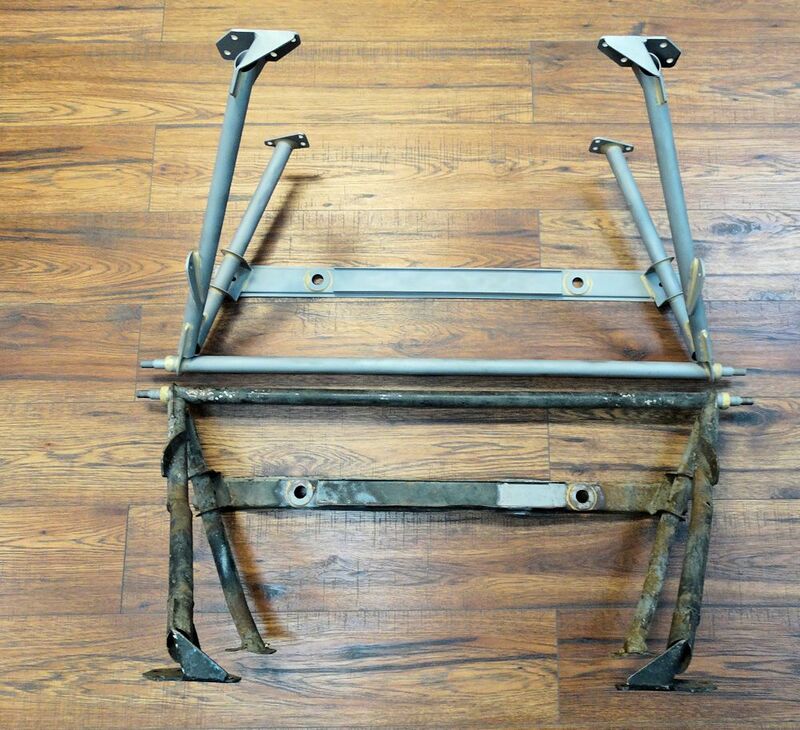 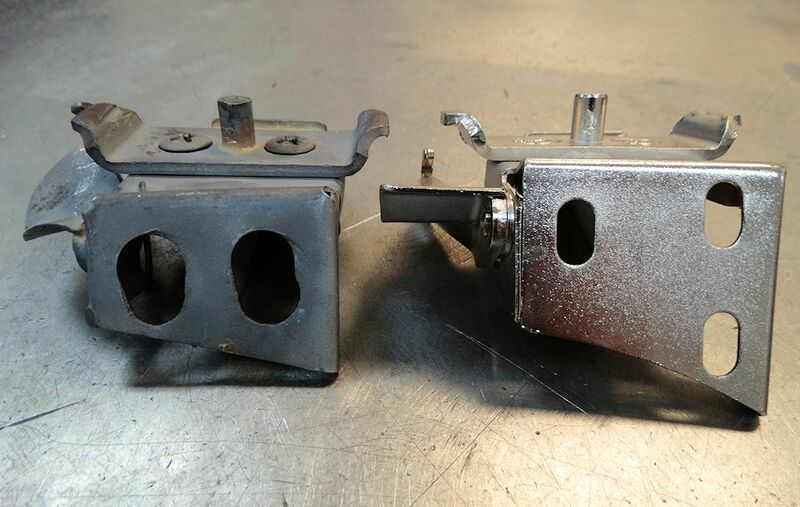 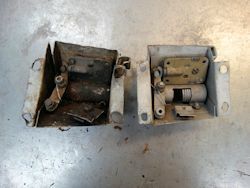 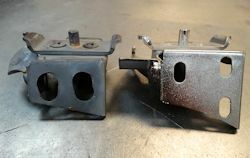 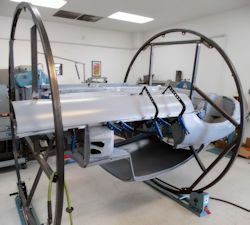 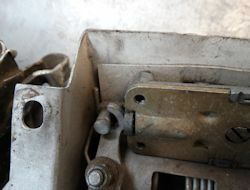 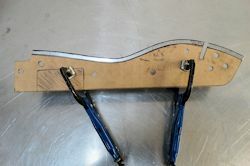 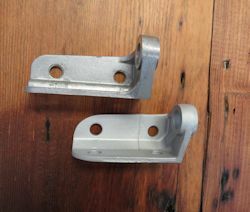 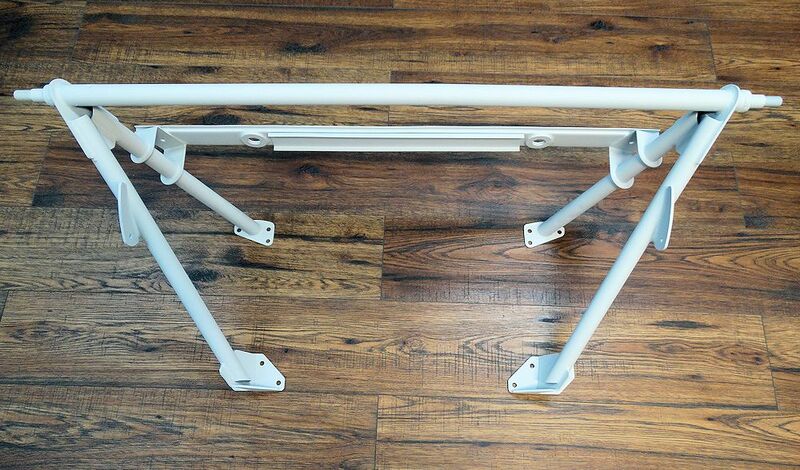 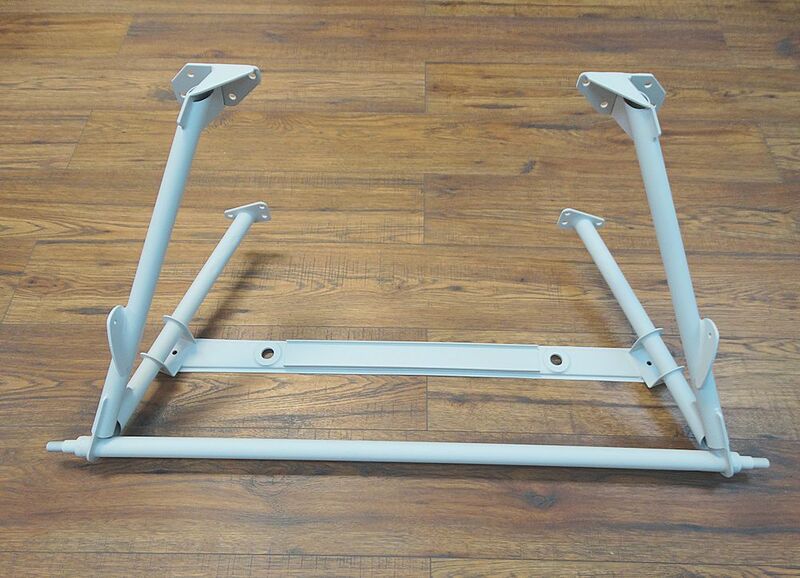 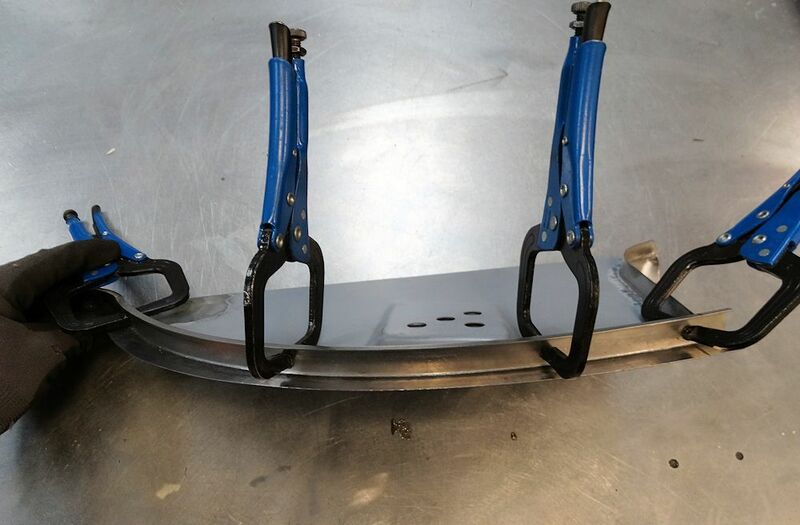 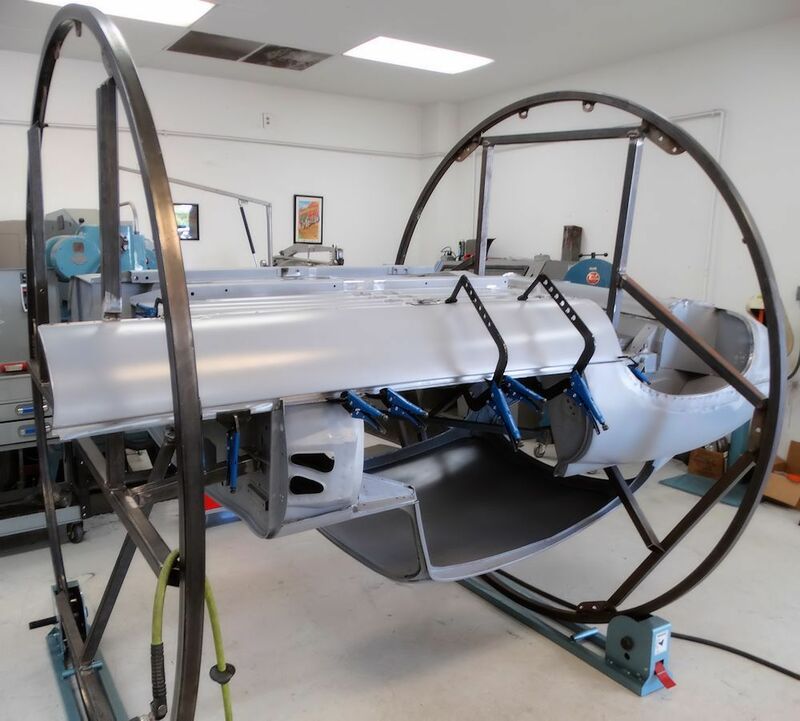 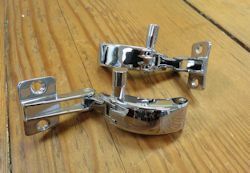 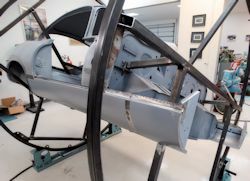 As there are several differences between the very early hinge frames and the later versions, Matt spent some time modifying a replacement frame to look exactly like the original. The following sequence of photographs show how we achieved this. 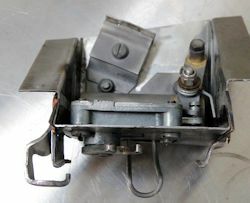 Your original outside latch bonnet has now been restored and assembled. 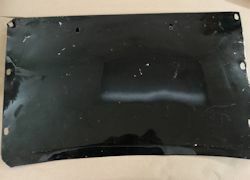 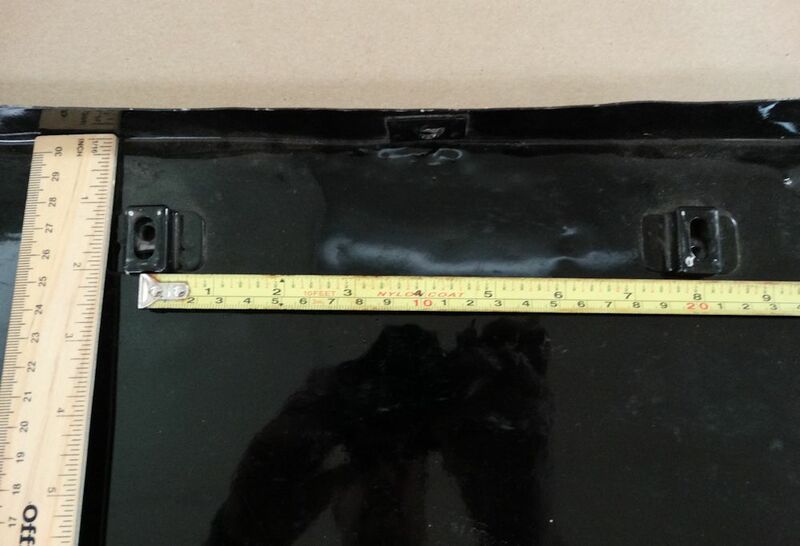 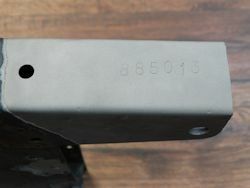 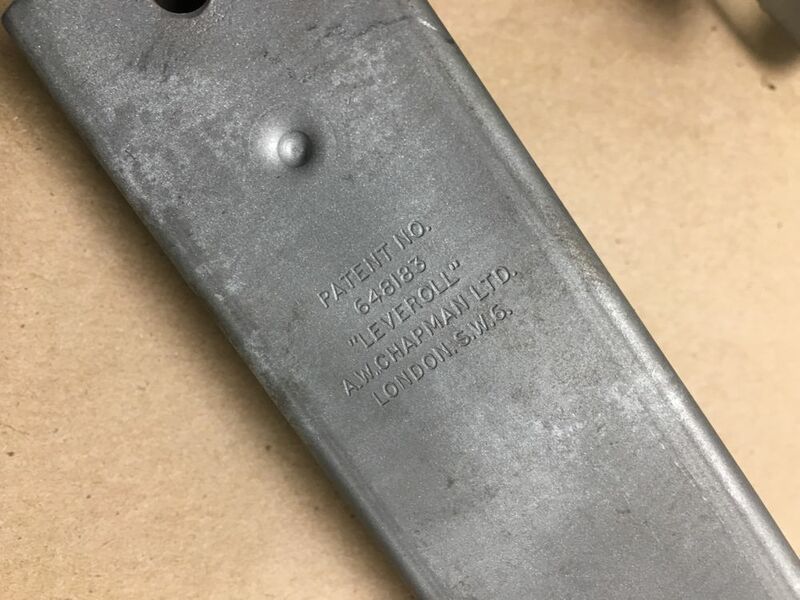 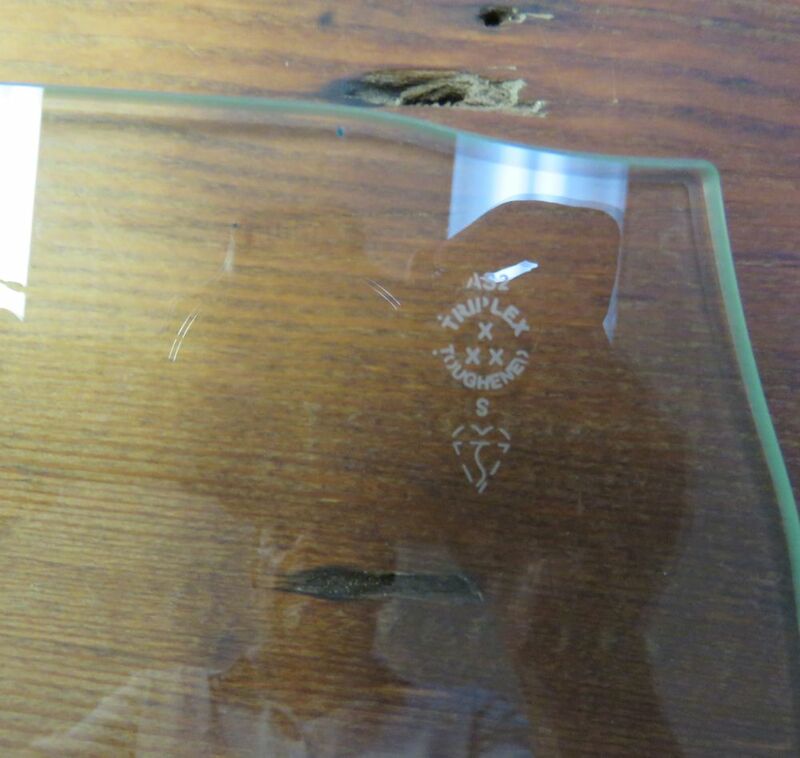 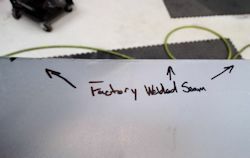 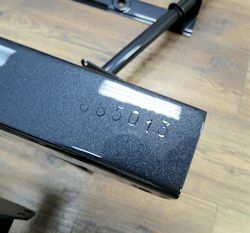 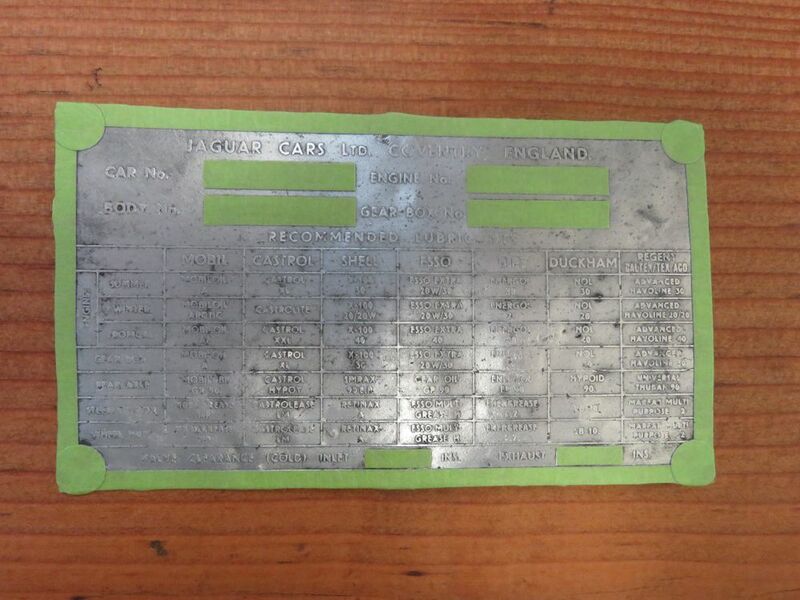 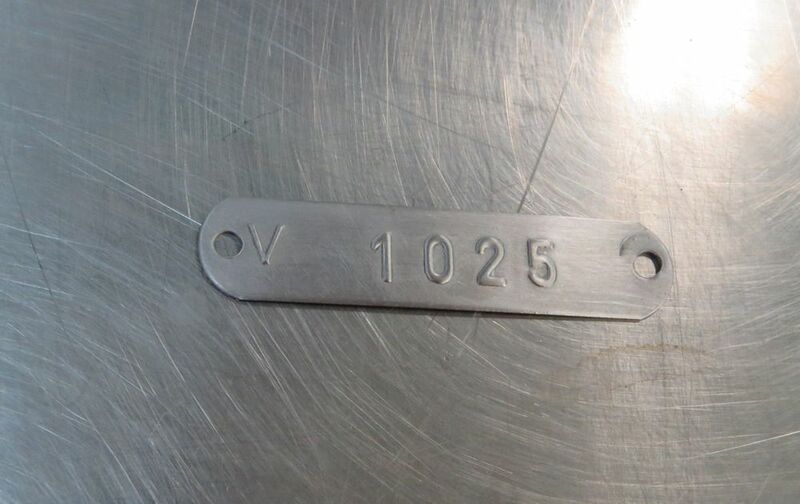 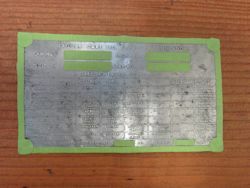 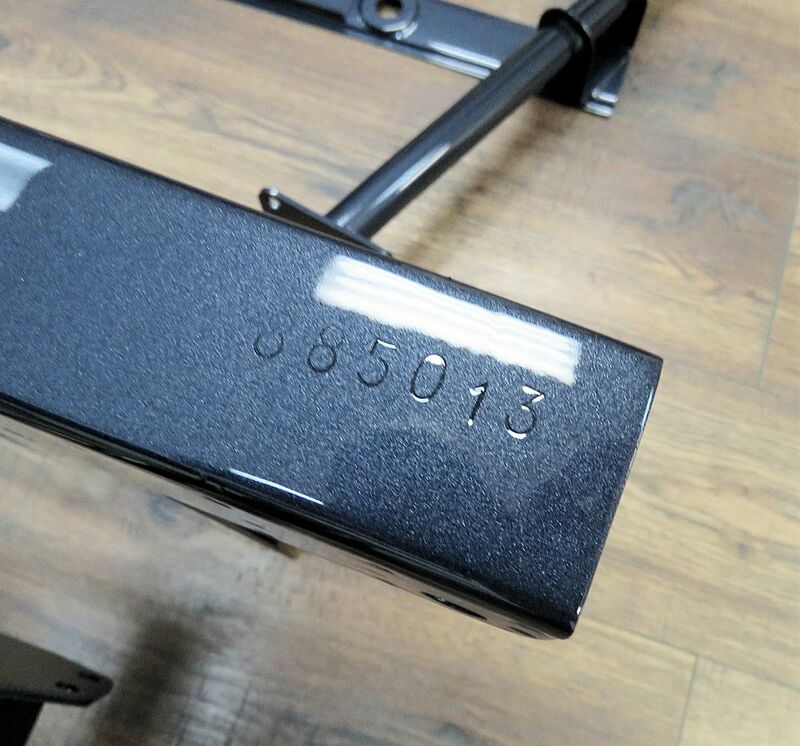 Your original picture frame was too badly damaged to save, although we felt it was important to retain the original factory chassis number stamping. 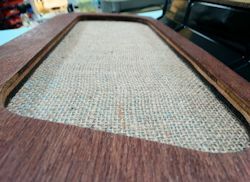 To that end, Matt cut away the stamped portion of the original picture frame and transplanted it to a new frame. The original picture frame was mangled! 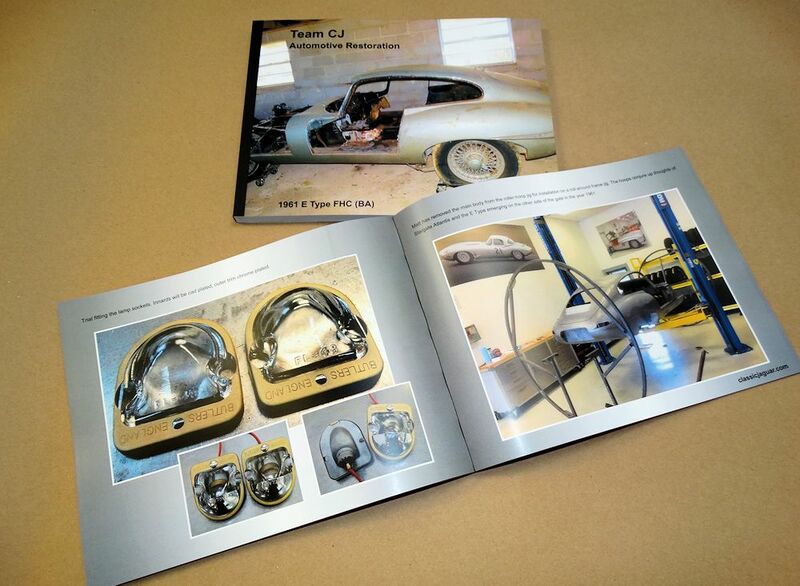 Your Team CJ restoration book is already at almost 200 pages - and the car has yet to be painted! 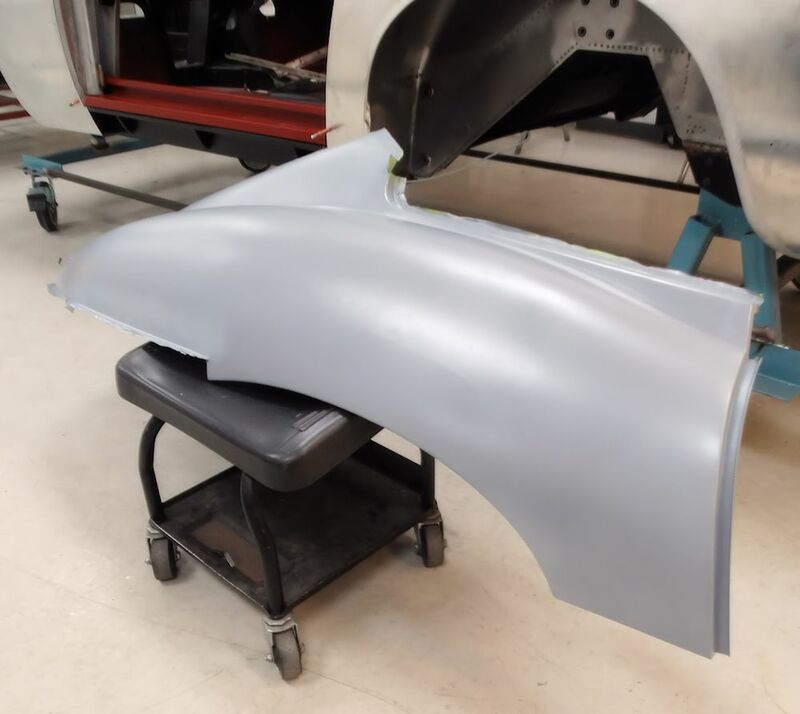 Matt has almost finished restoring your bonnet. 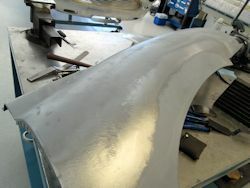 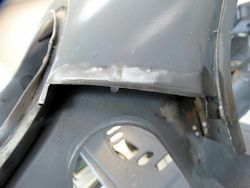 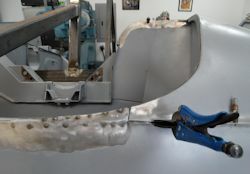 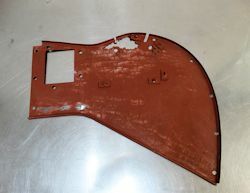 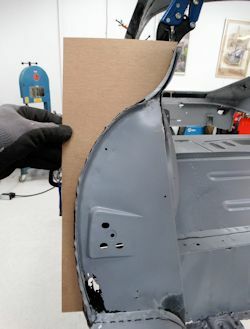 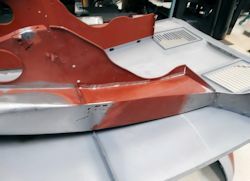 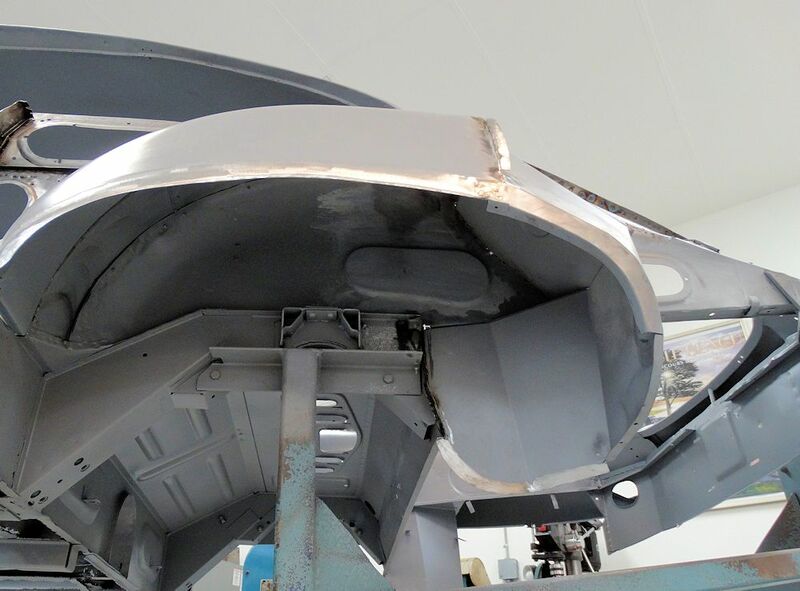 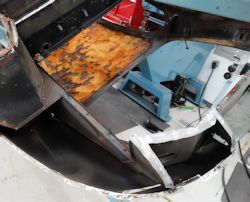 All that remains to be done is to reconstruct the belly pan that forms the bottom half of the bonnet mouth. 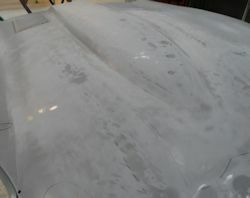 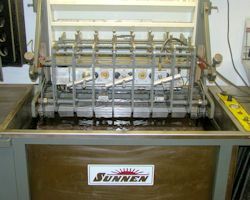 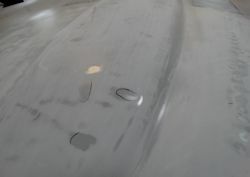 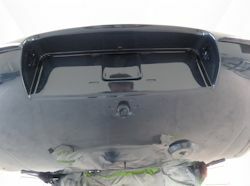 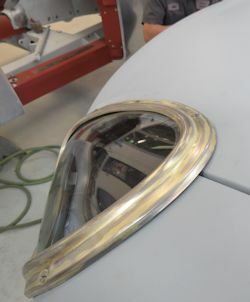 Continuing with the restoration of your original bonnet. 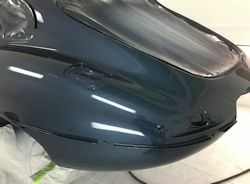 Matt has been pressing ahead with the restoration of your bonnet. 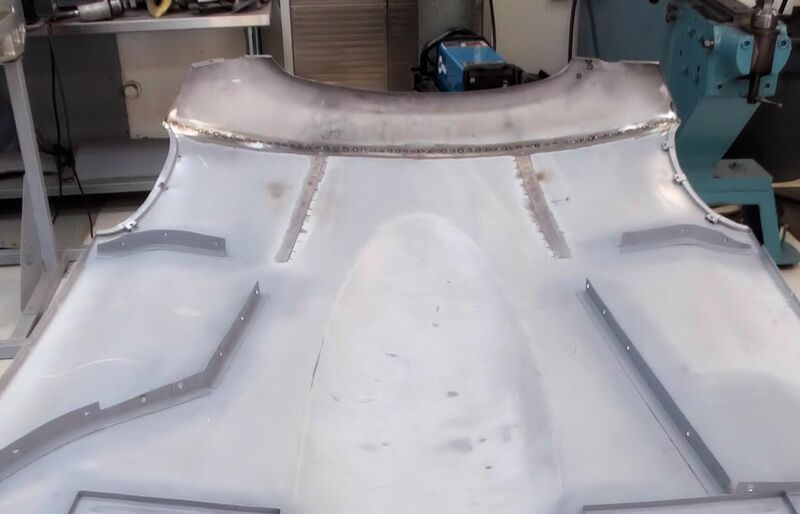 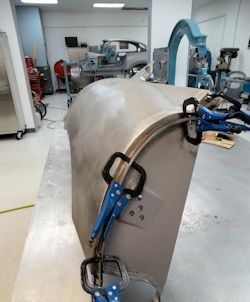 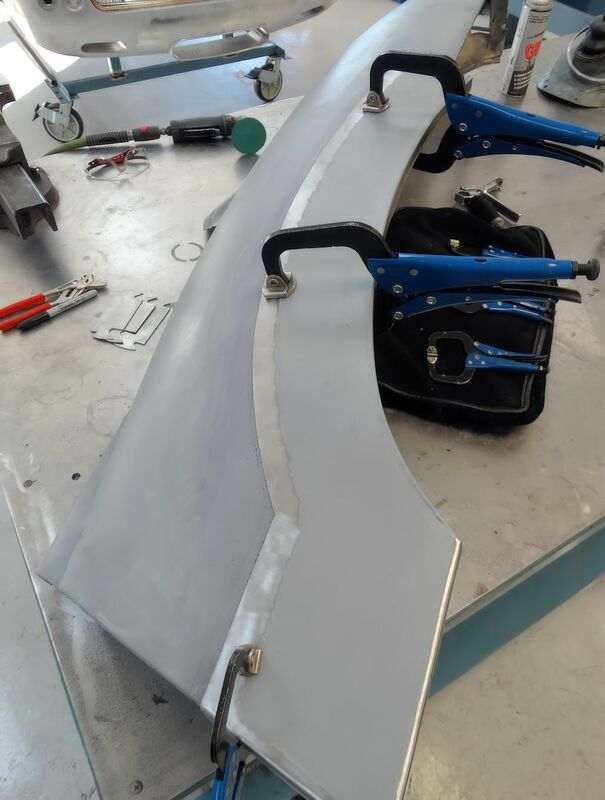 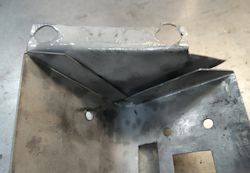 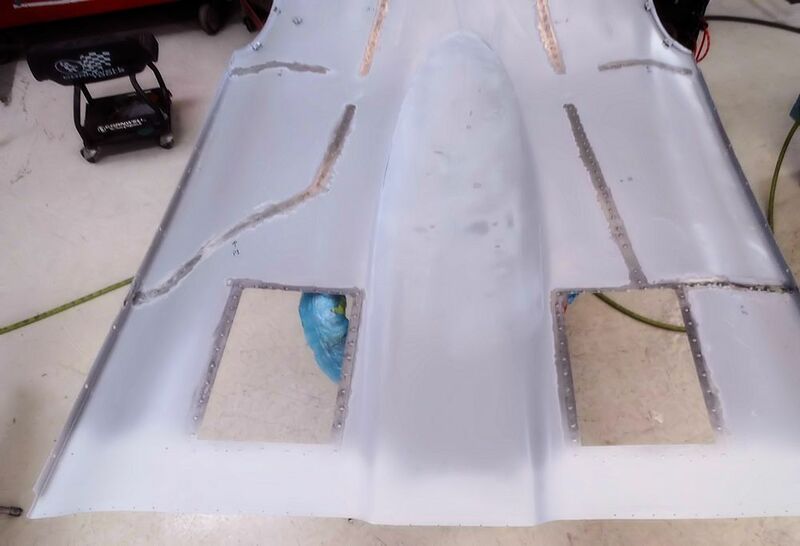 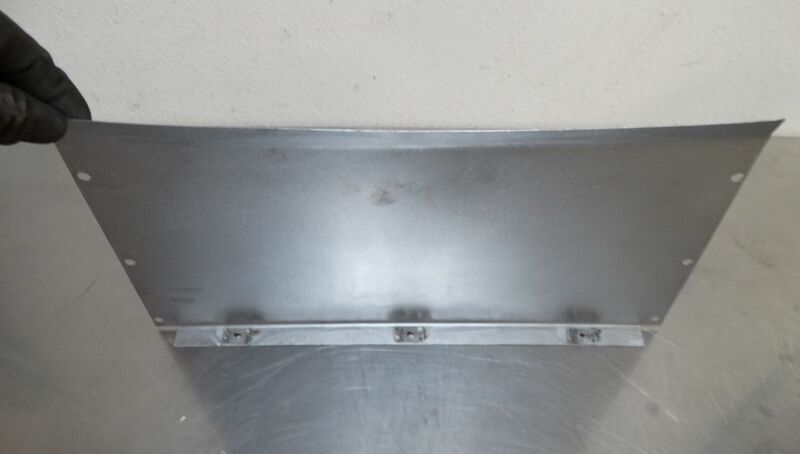 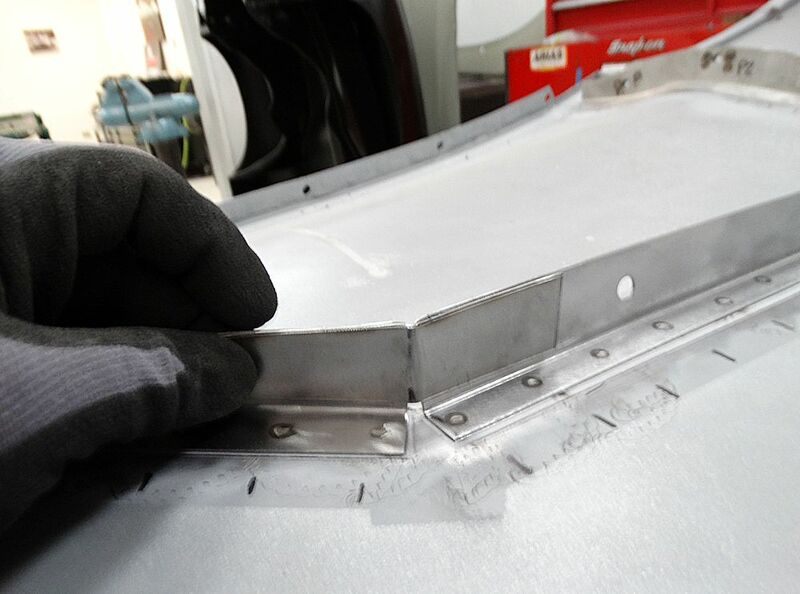 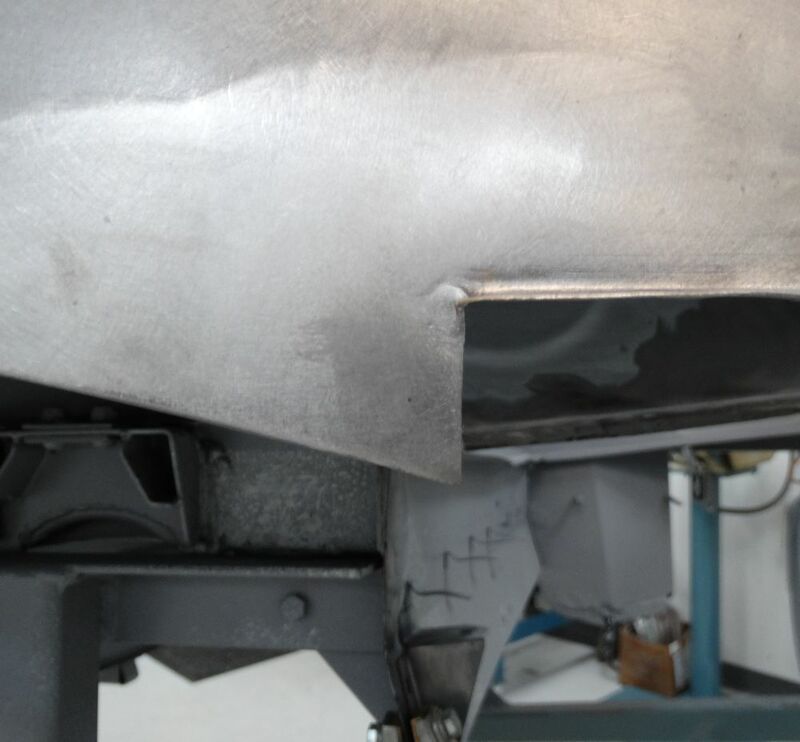 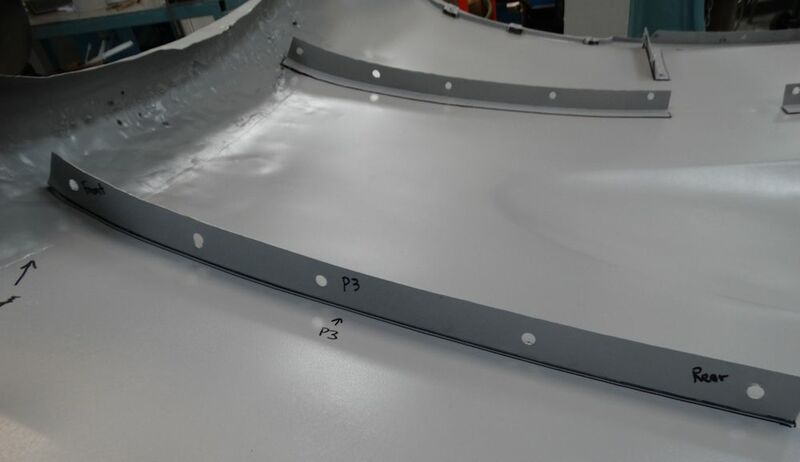 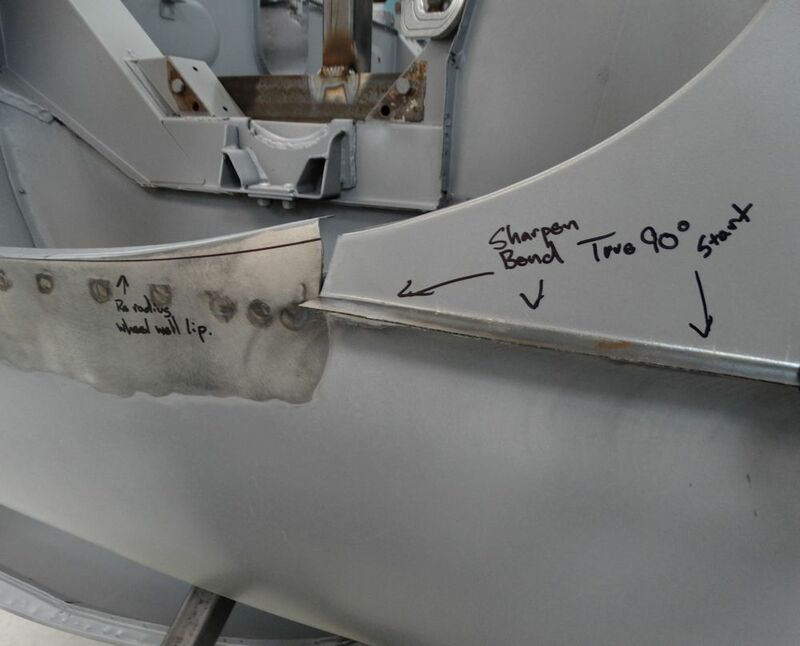 Some of the brackets on the underside of the bonnet center section were a little too rough to be re-used, so we fabricated new replacements. 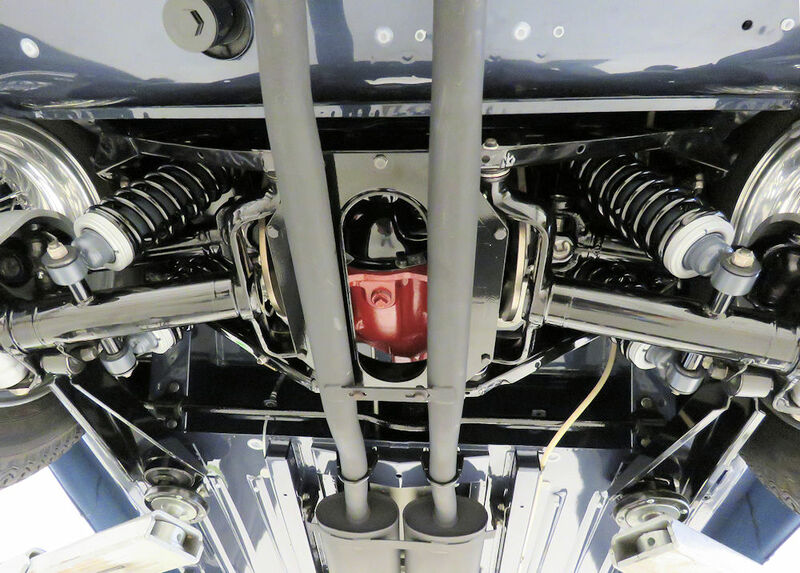 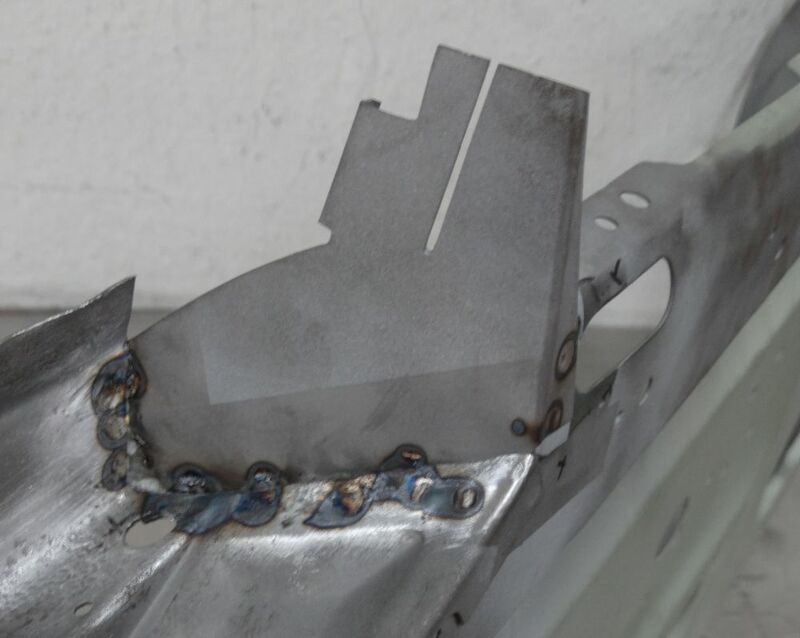 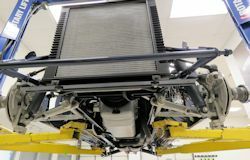 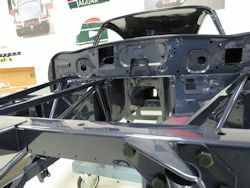 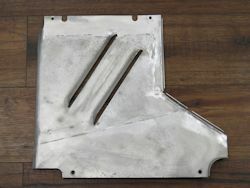 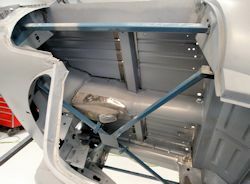 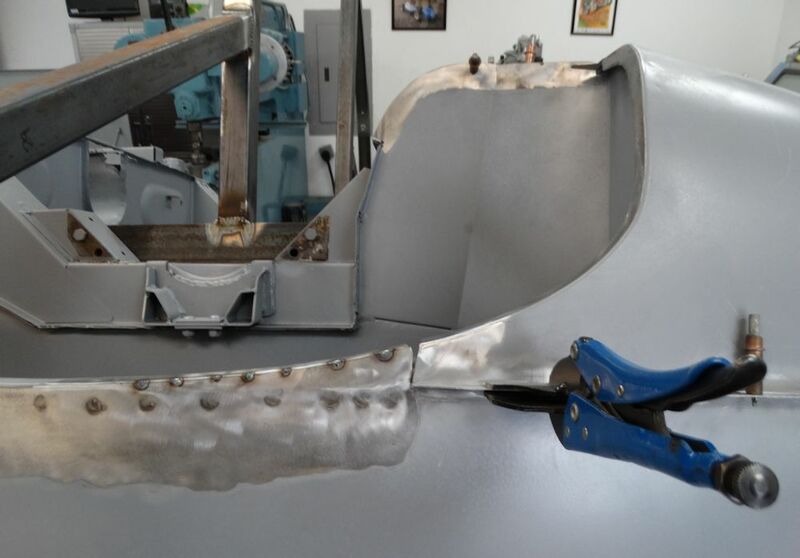 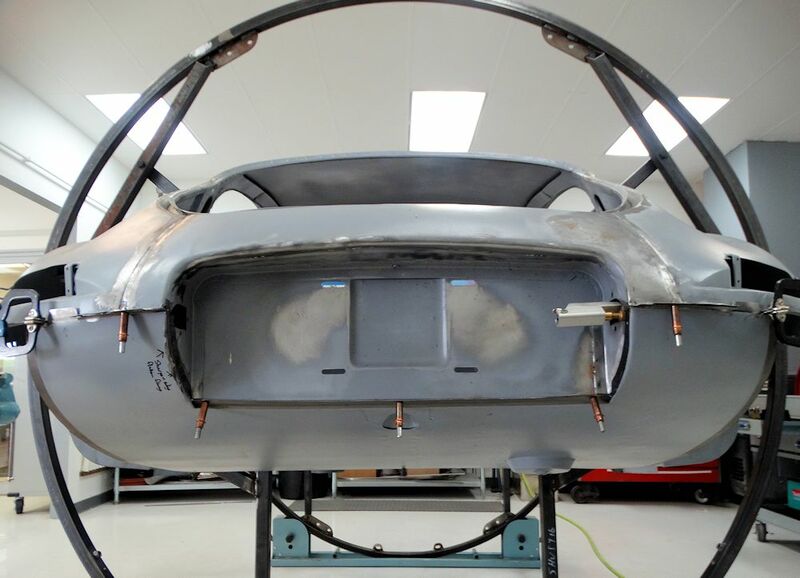 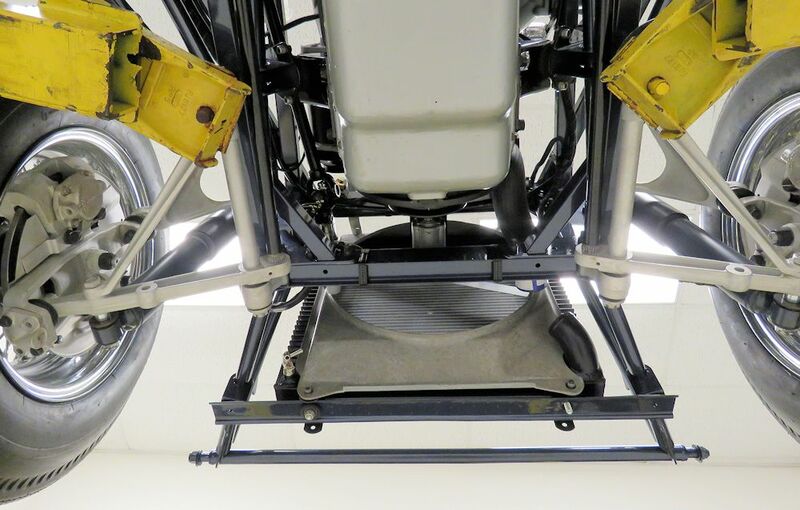 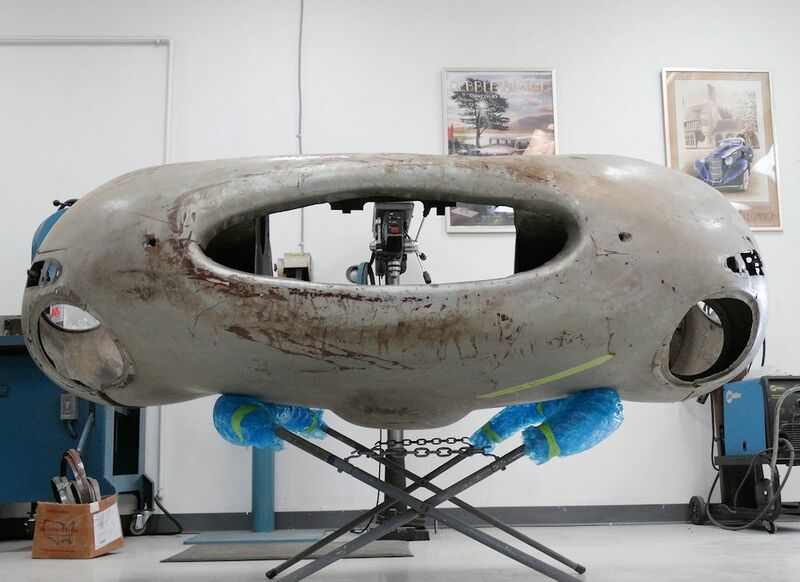 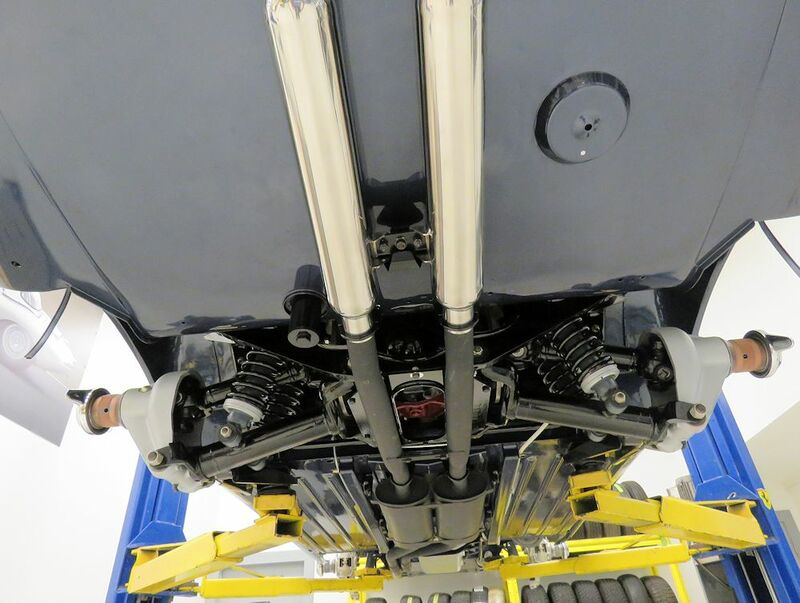 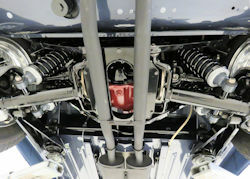 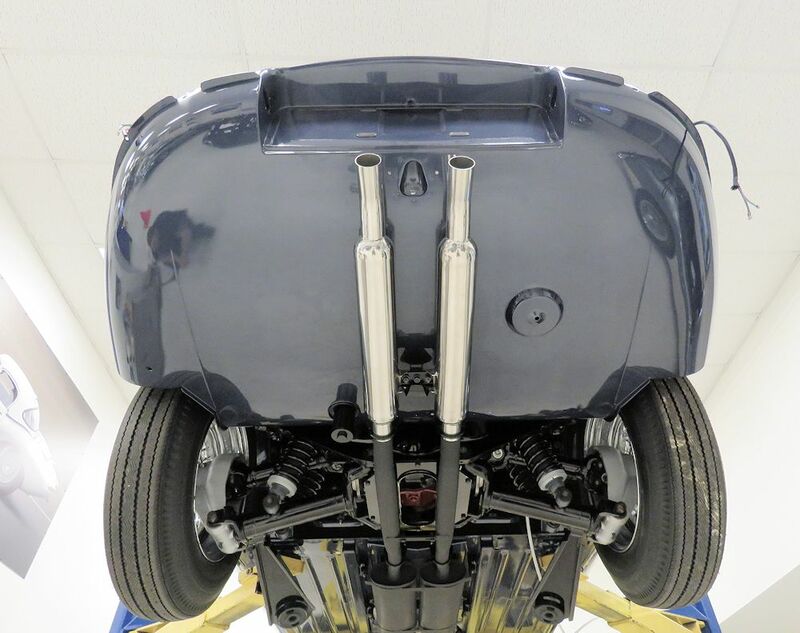 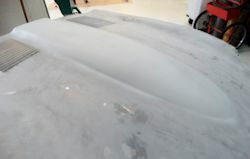 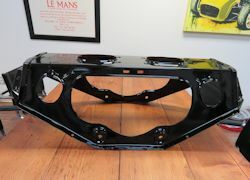 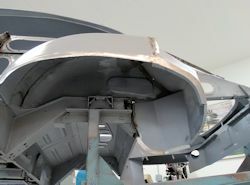 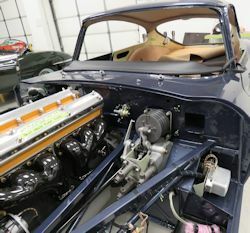 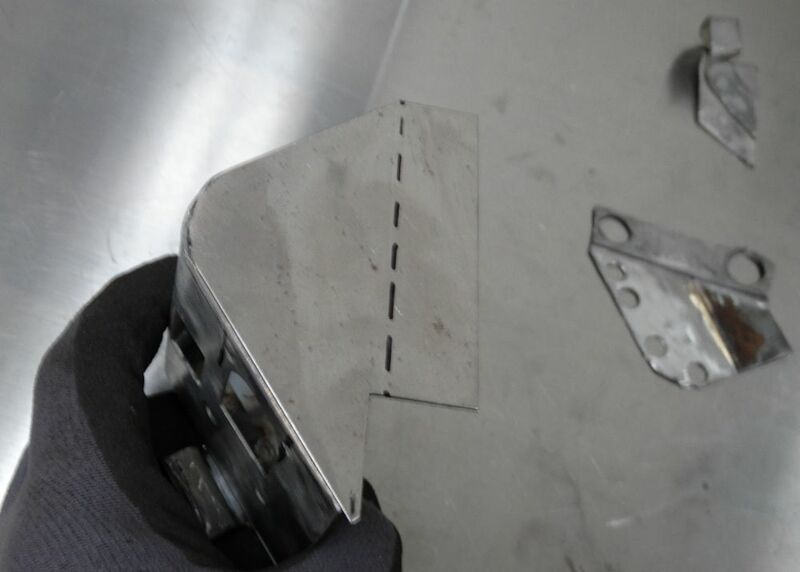 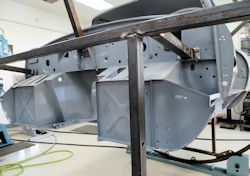 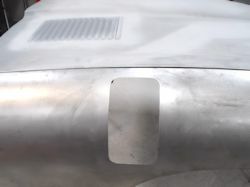 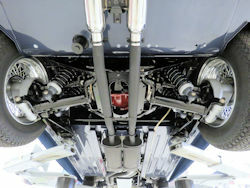 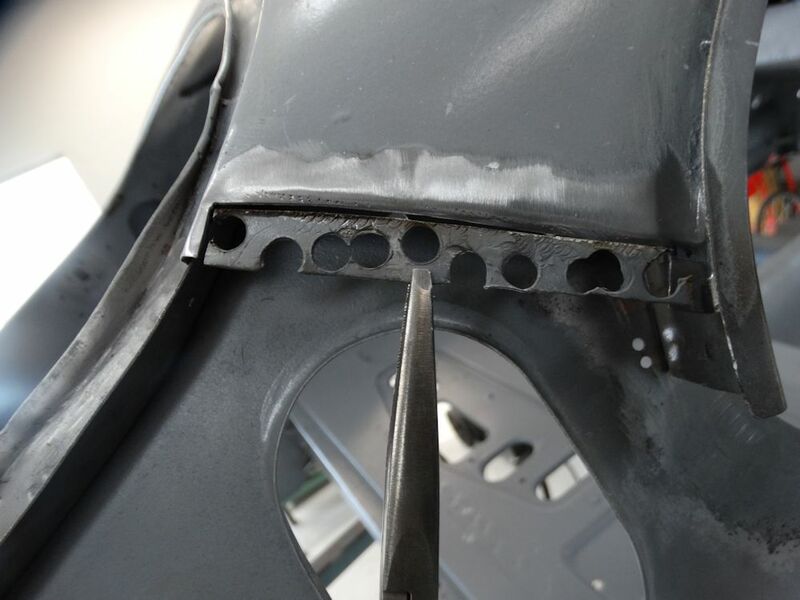 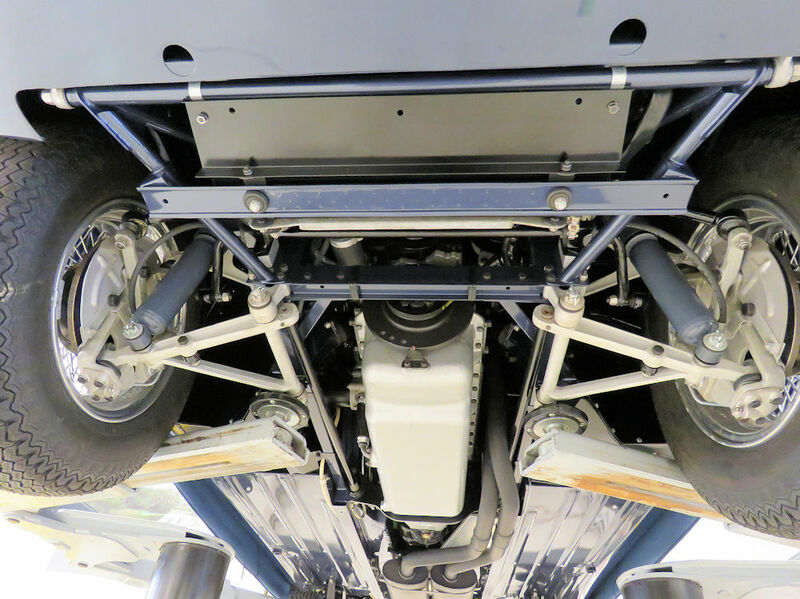 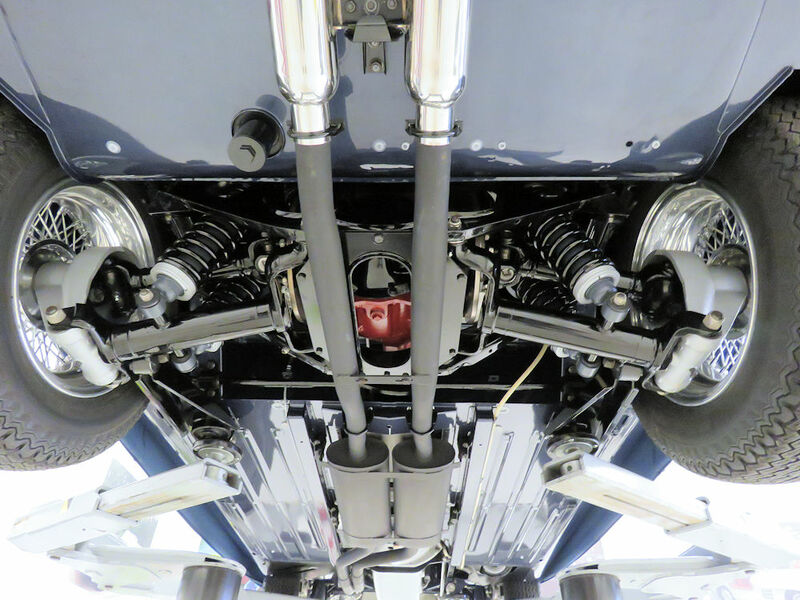 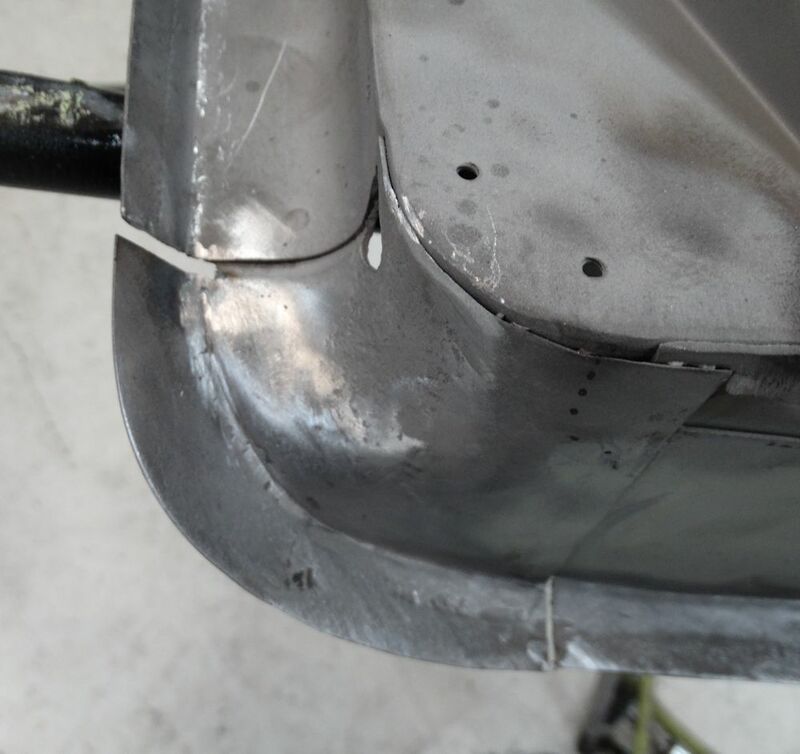 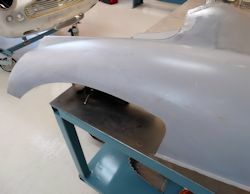 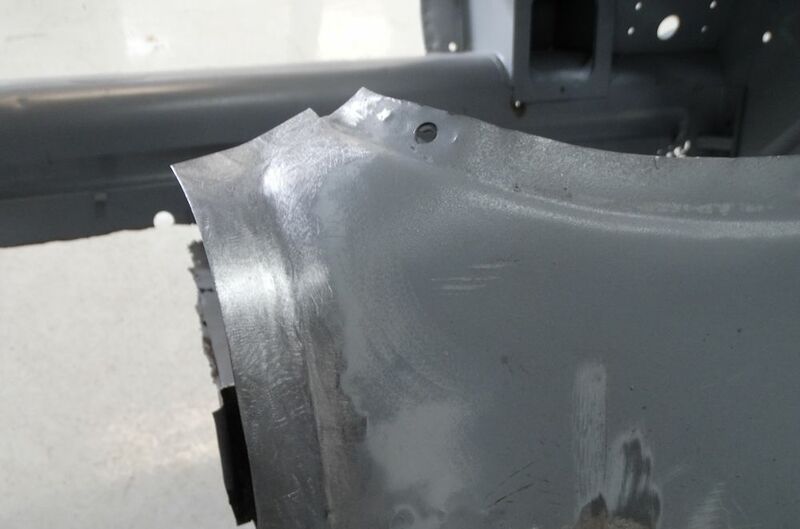 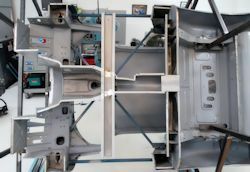 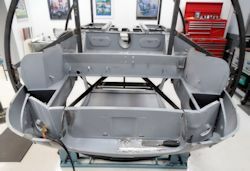 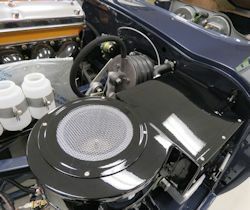 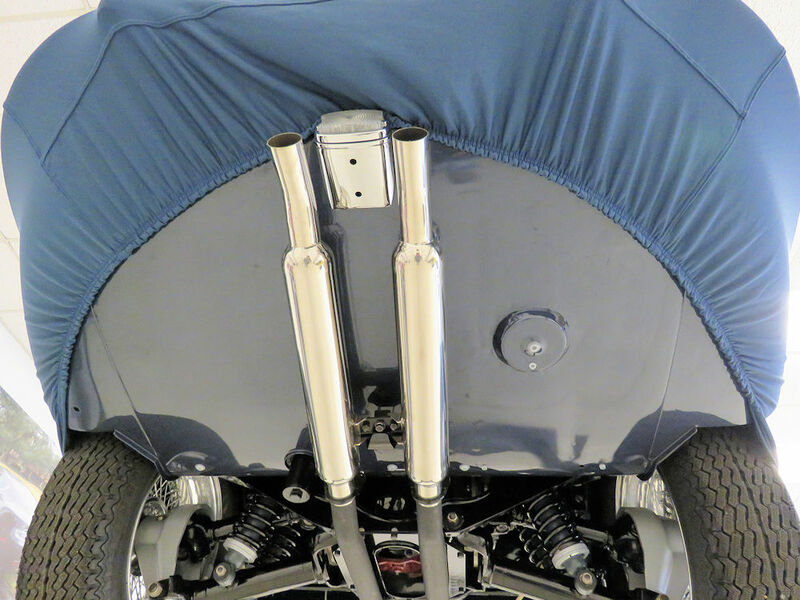 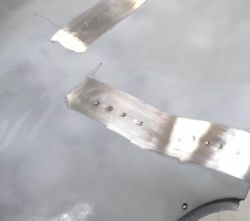 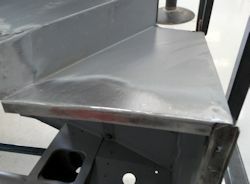 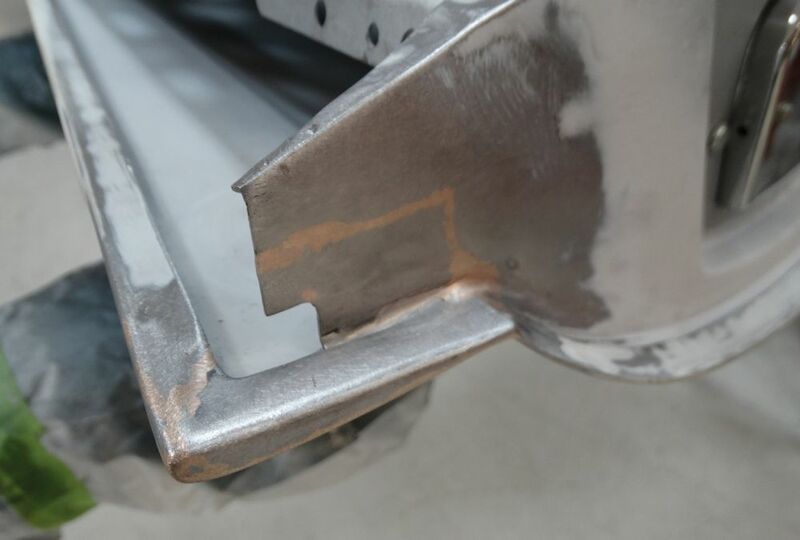 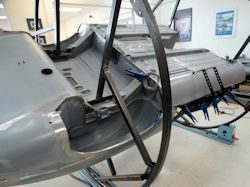 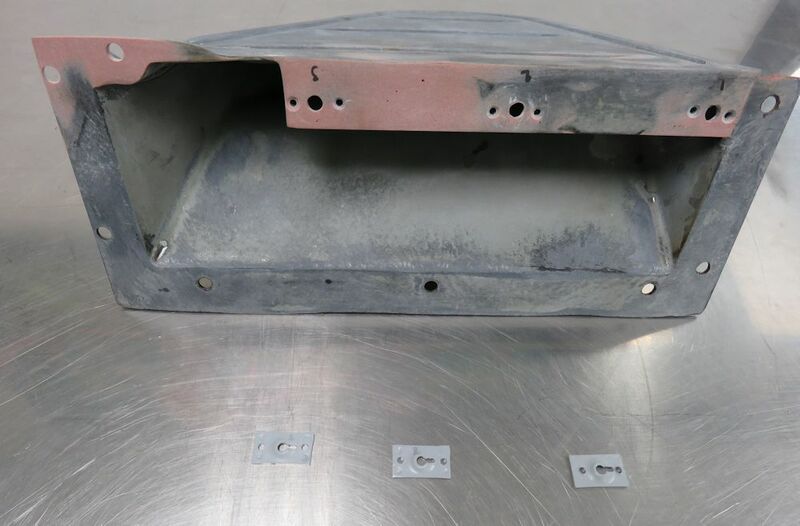 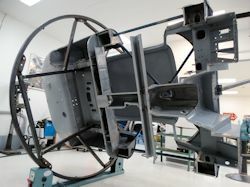 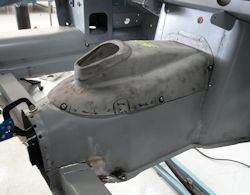 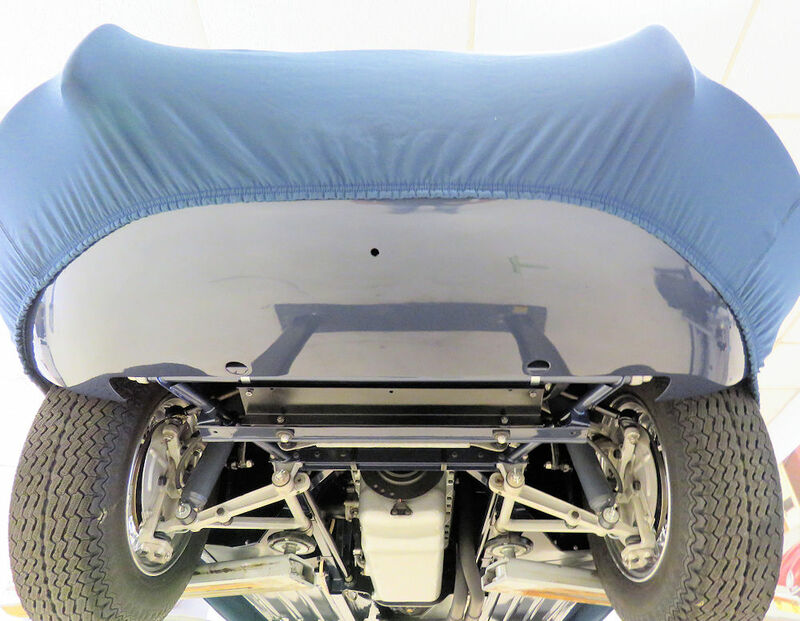 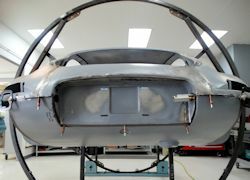 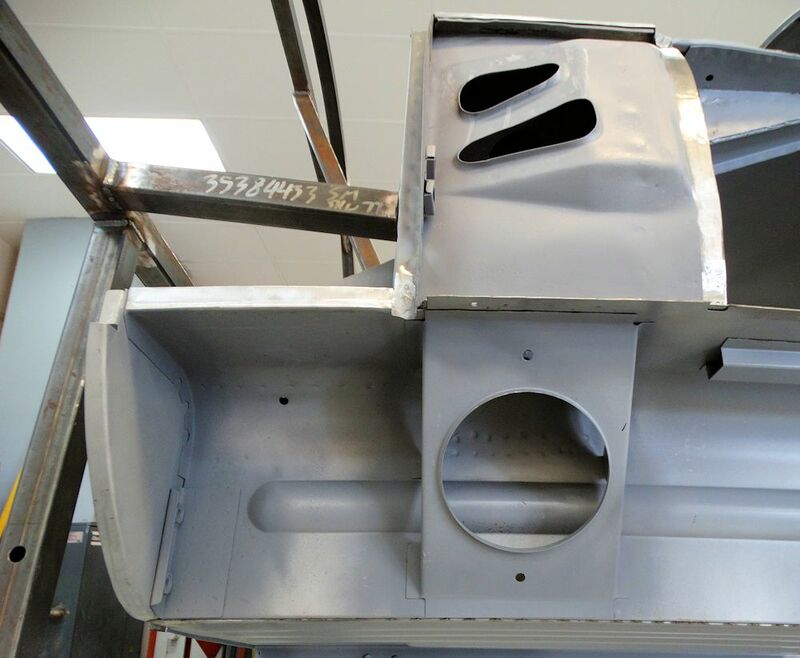 On the very early bonnets, all of the support brackets beneath the bonnet center section and on the inner wall of the front wings were spot welded in place, rather than glued, as was the case on later production E Types. 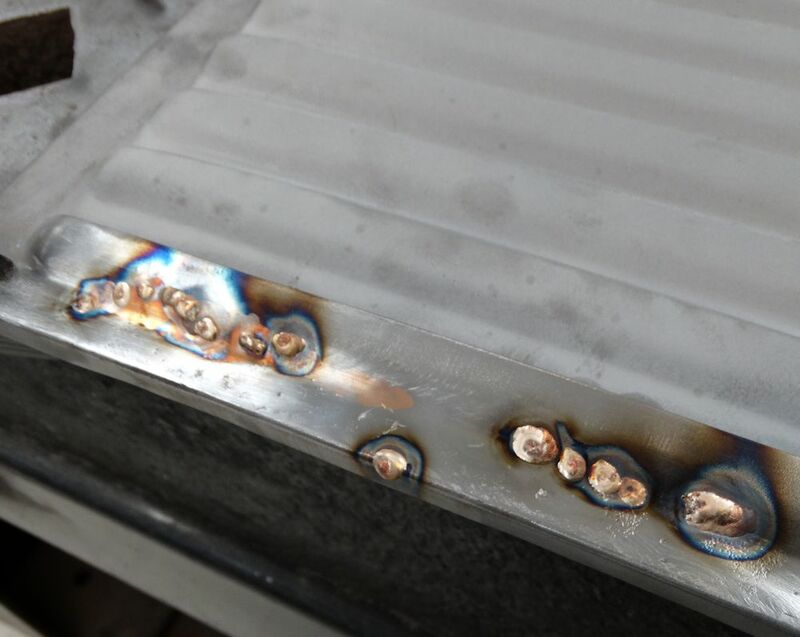 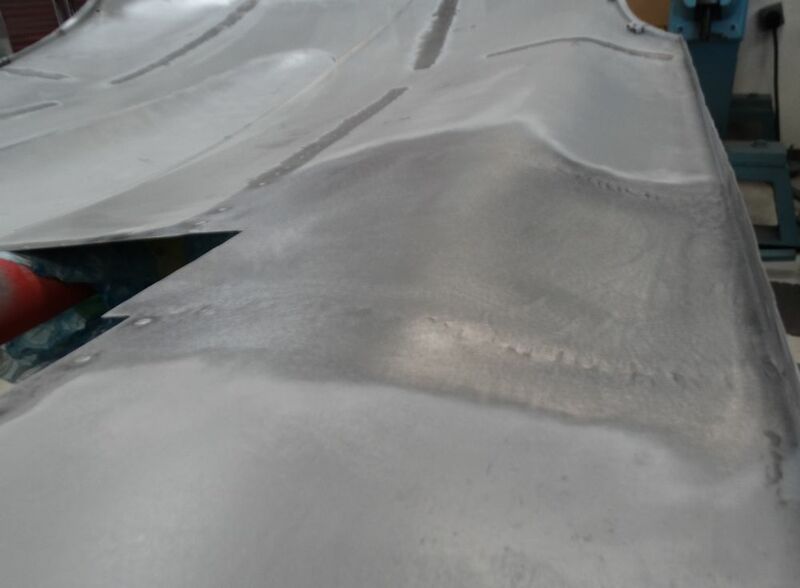 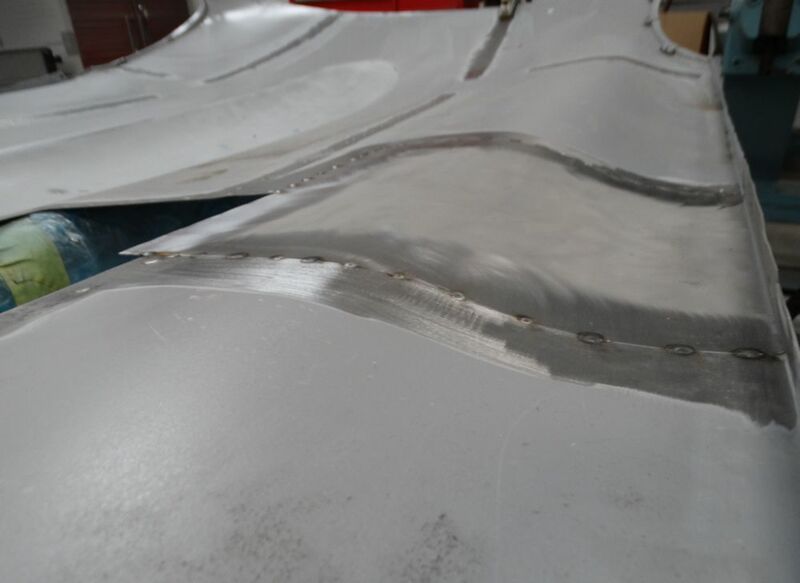 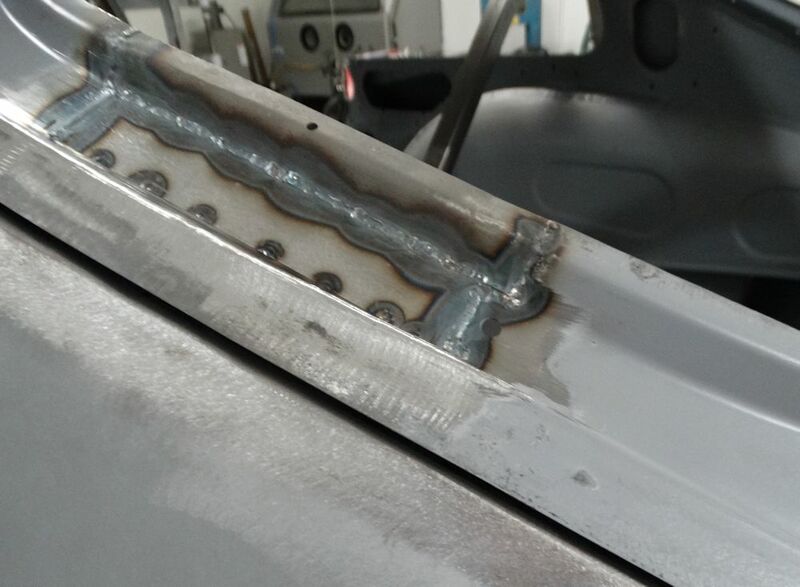 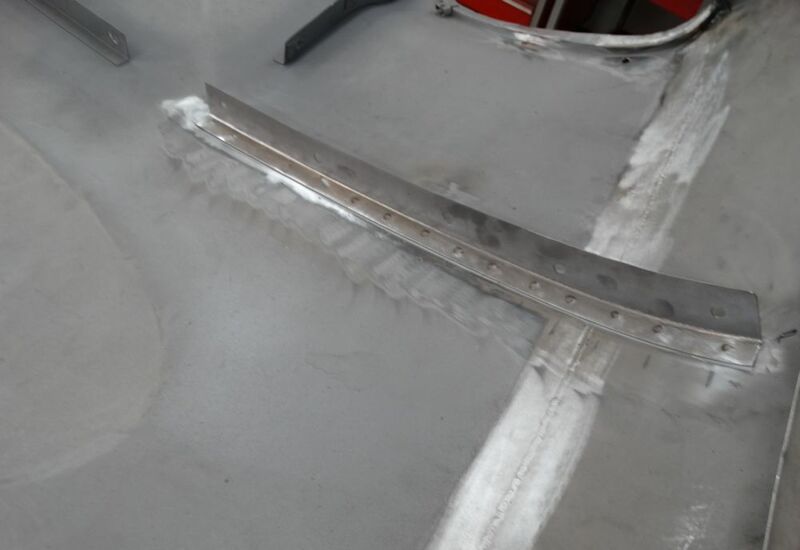 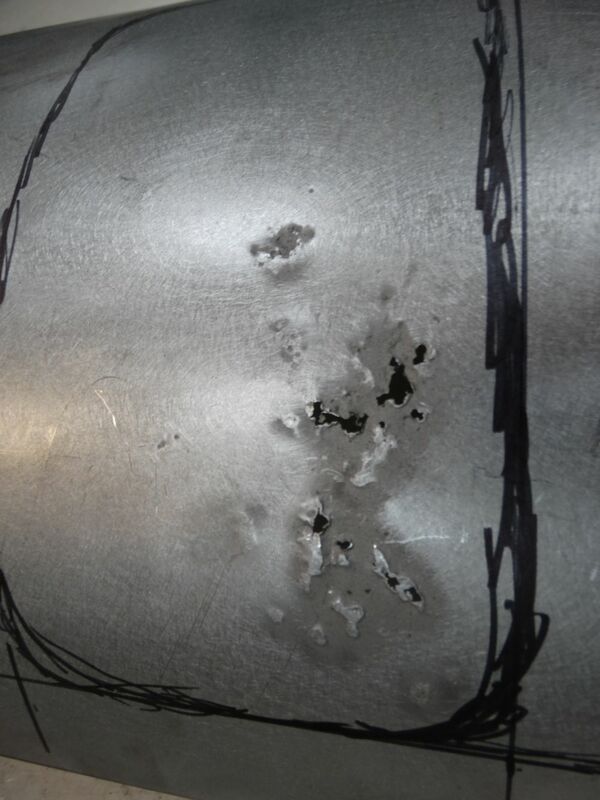 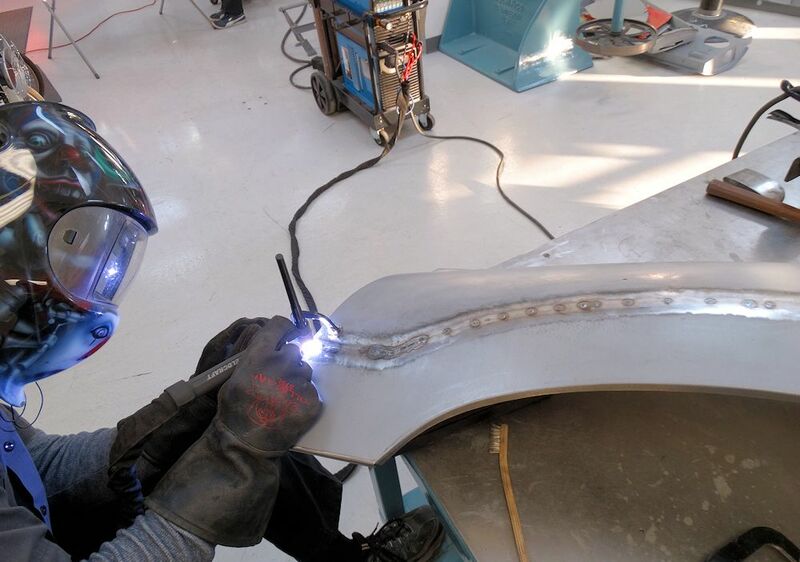 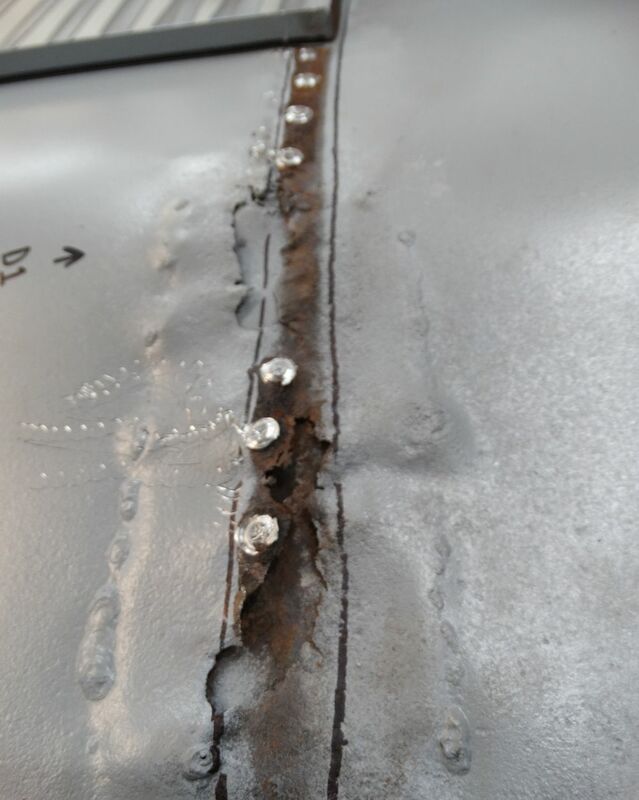 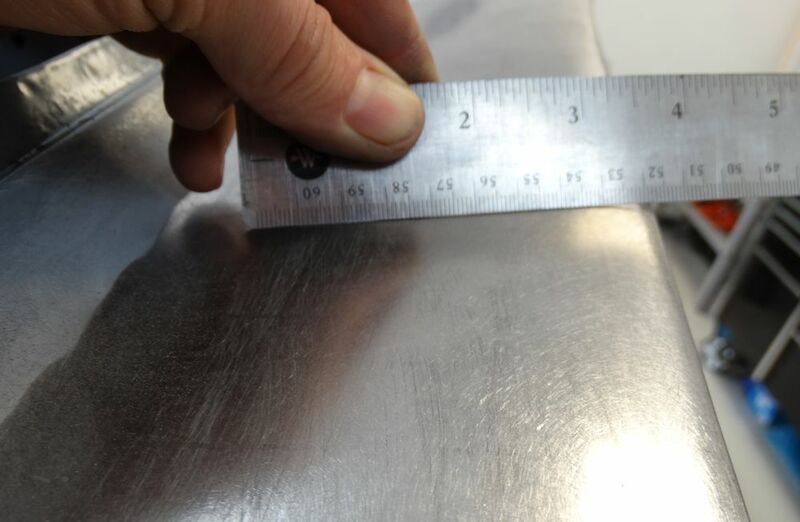 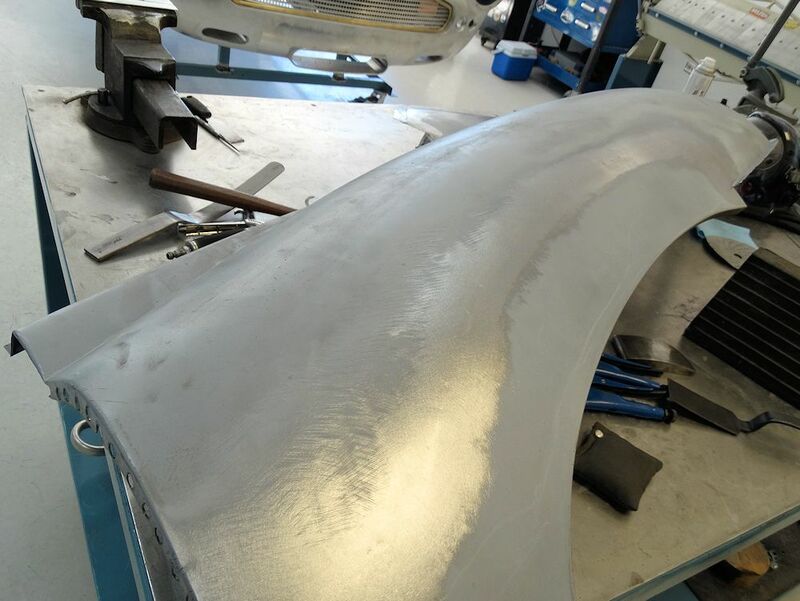 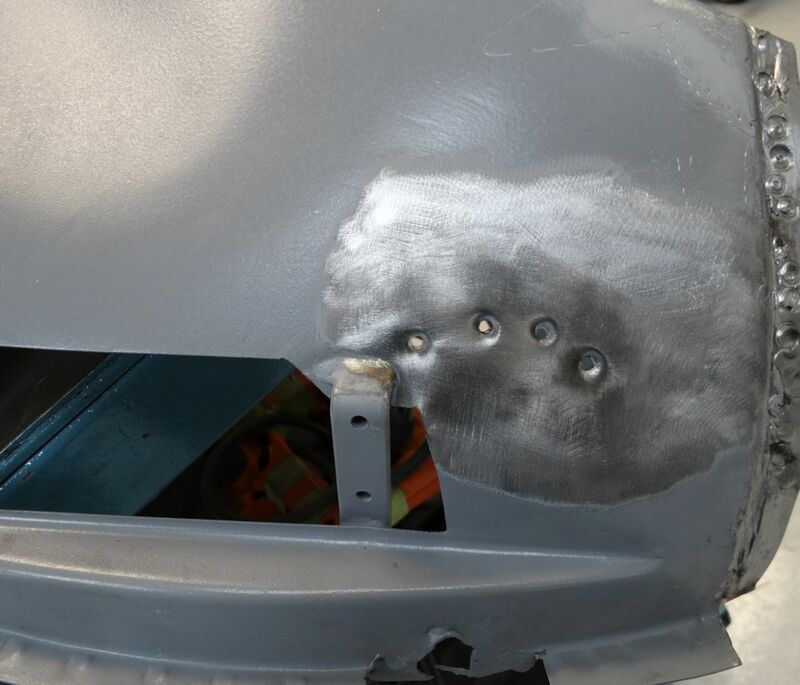 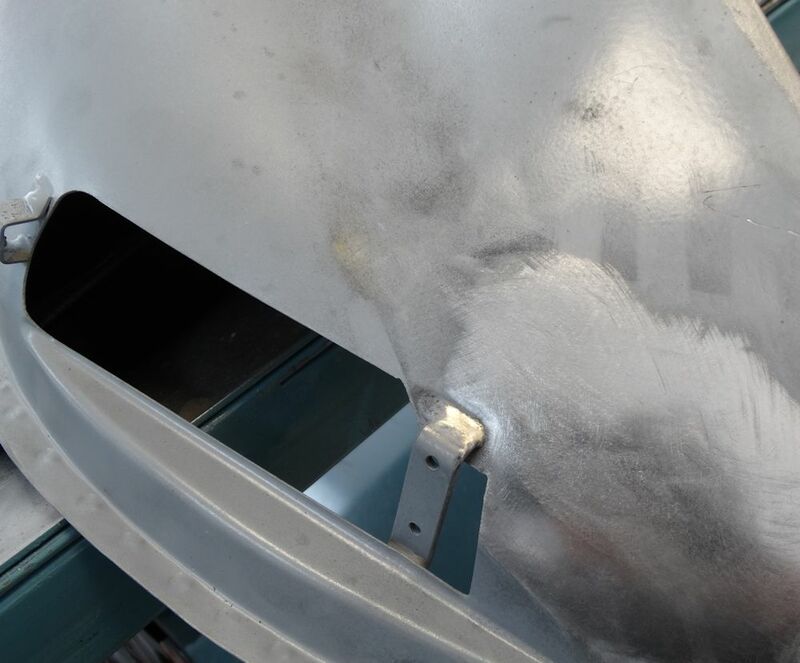 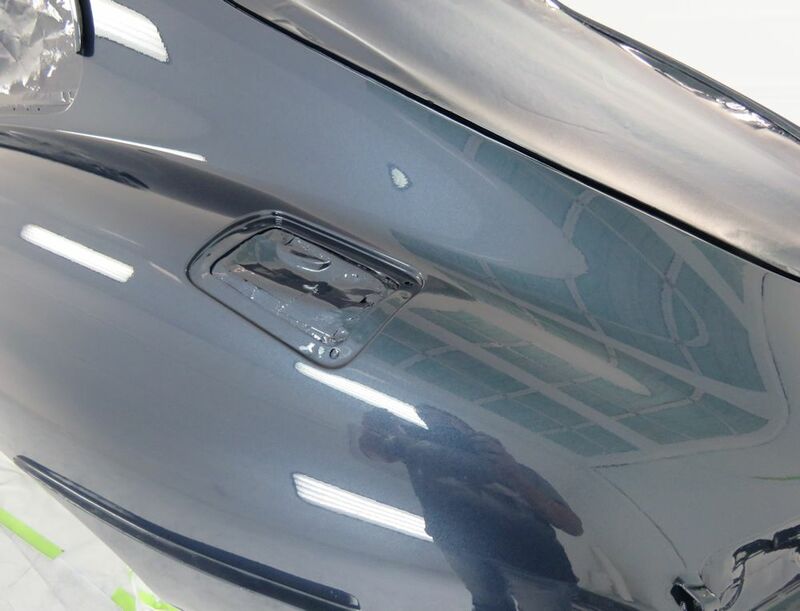 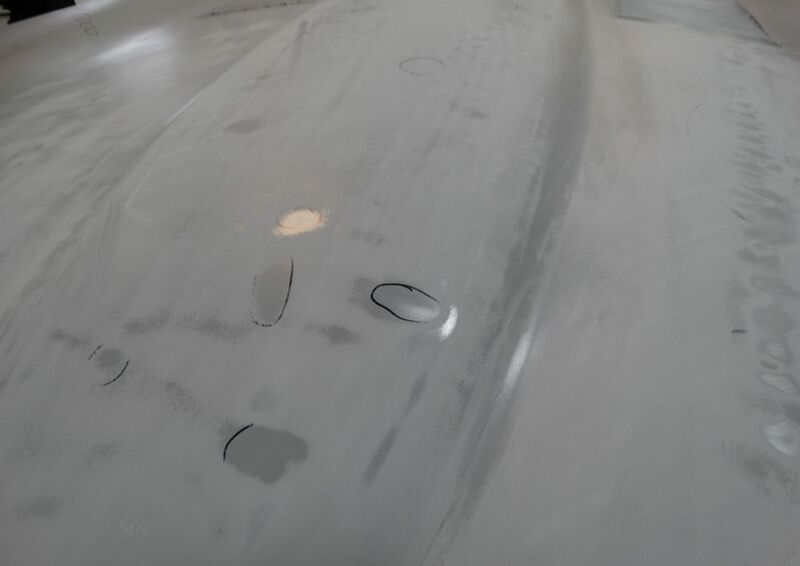 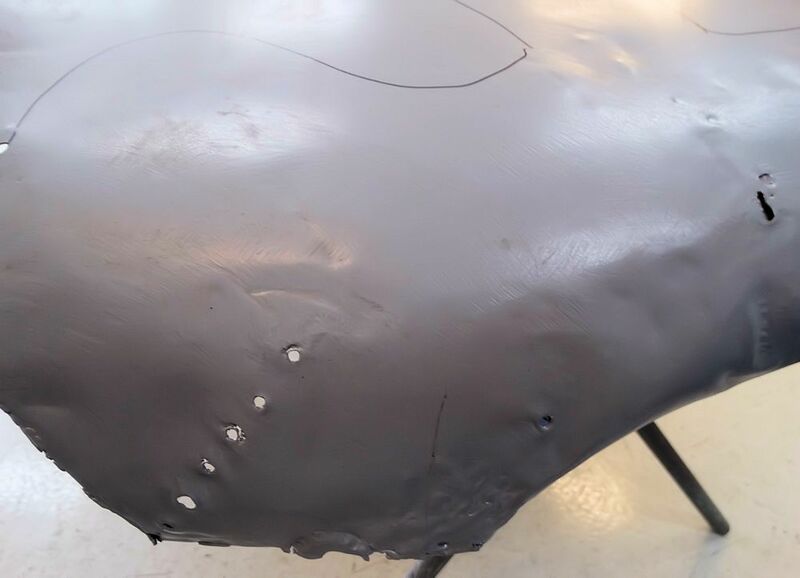 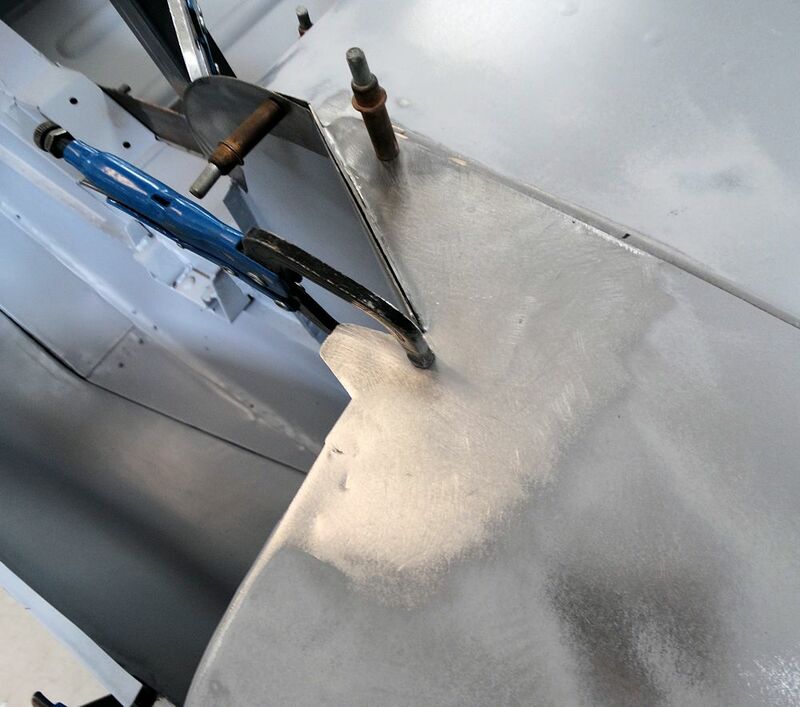 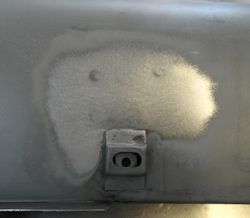 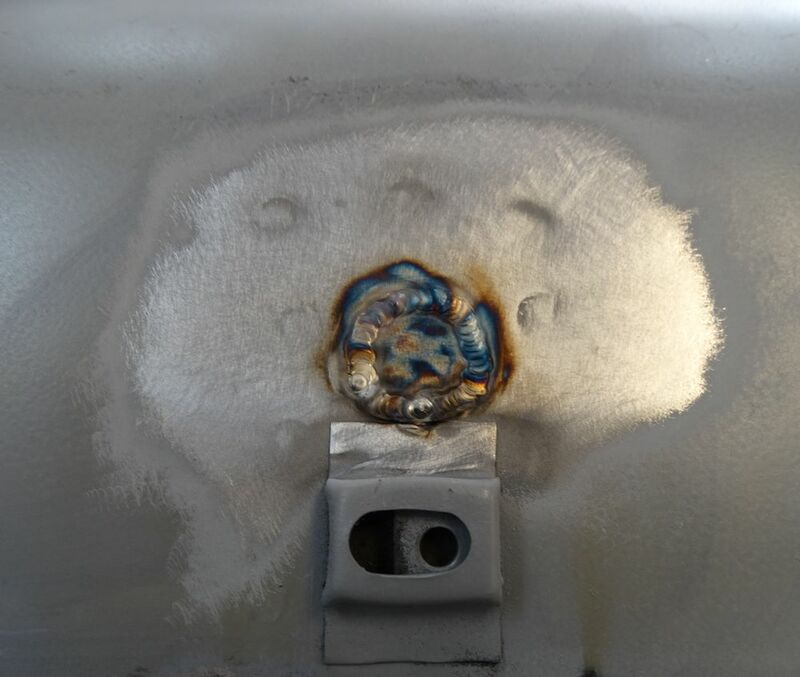 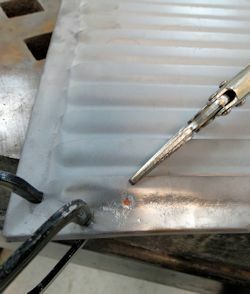 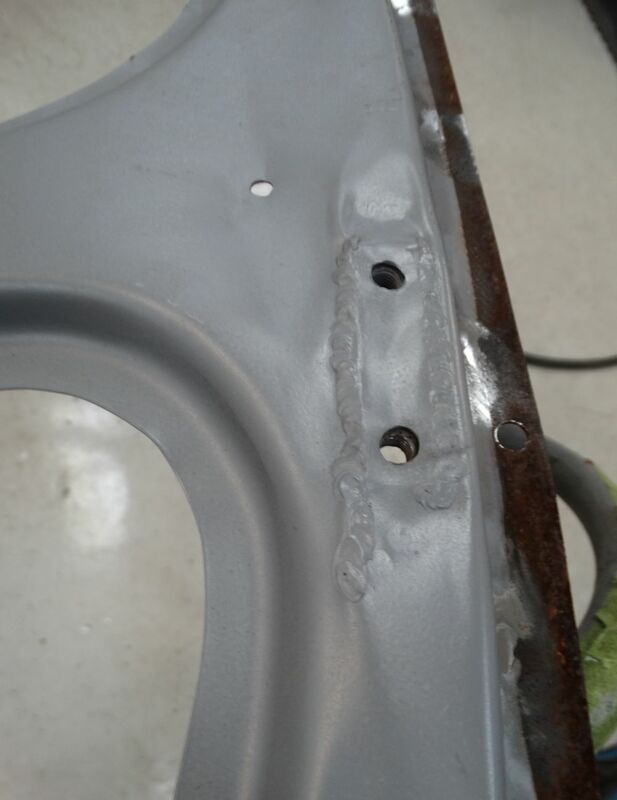 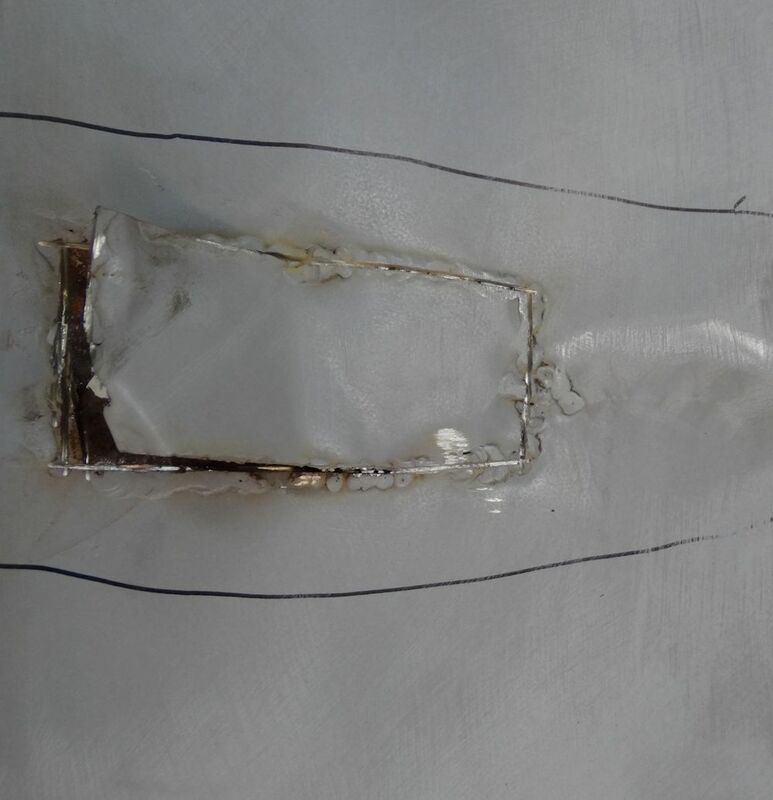 In restoring your bonnet, Matt has been taking great care to replicate the precise location of every last spot weld. 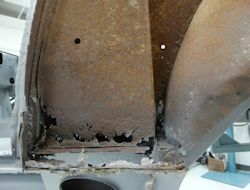 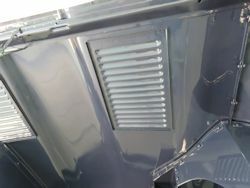 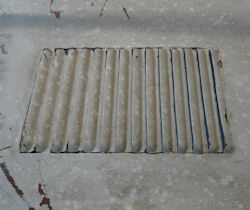 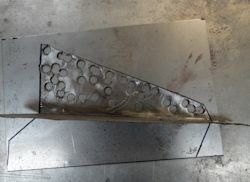 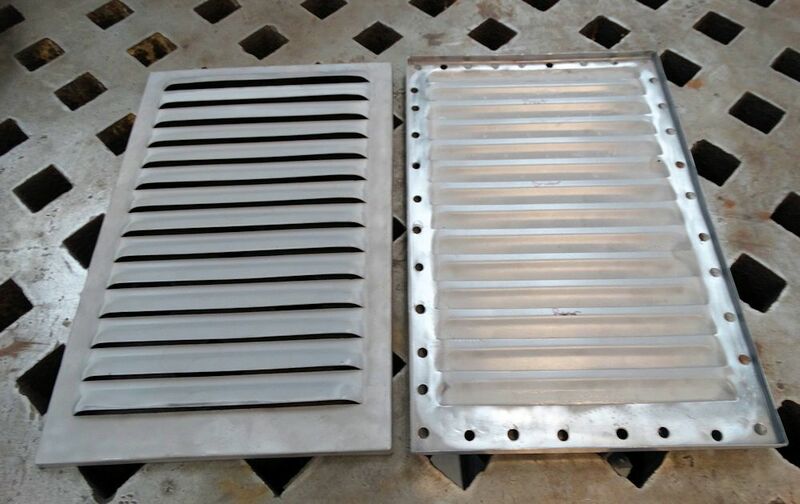 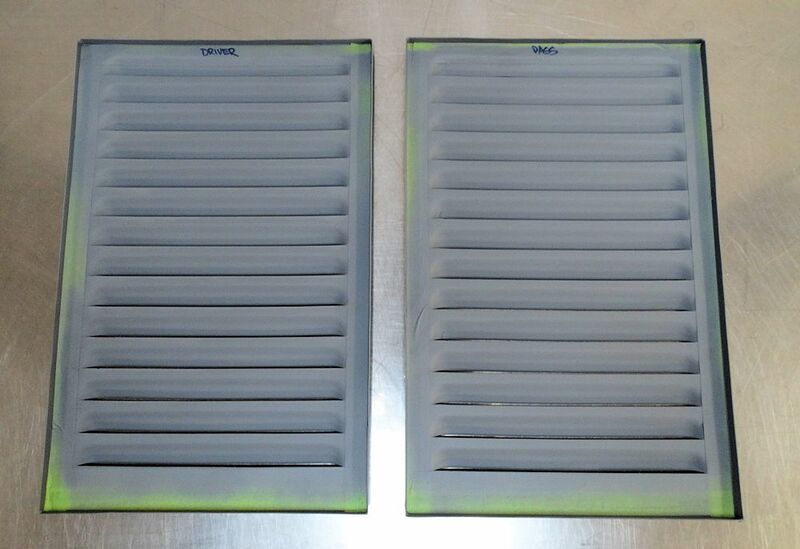 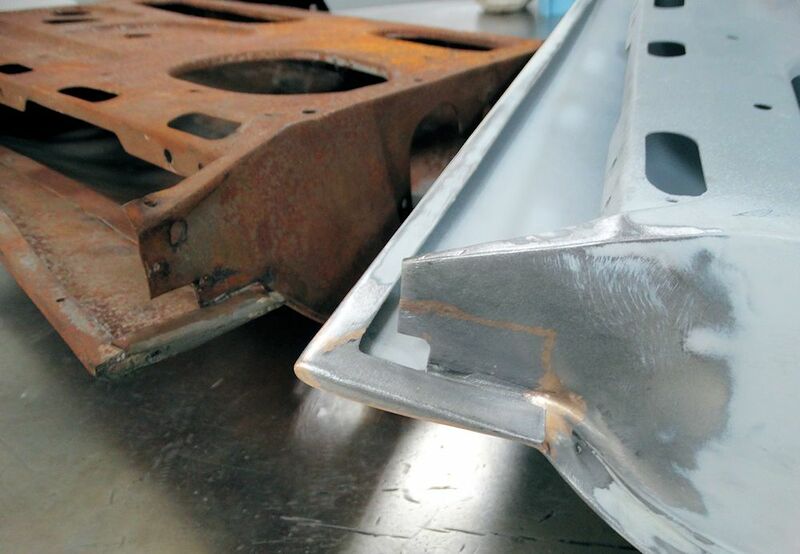 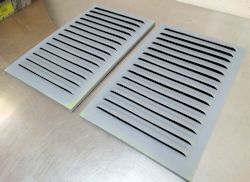 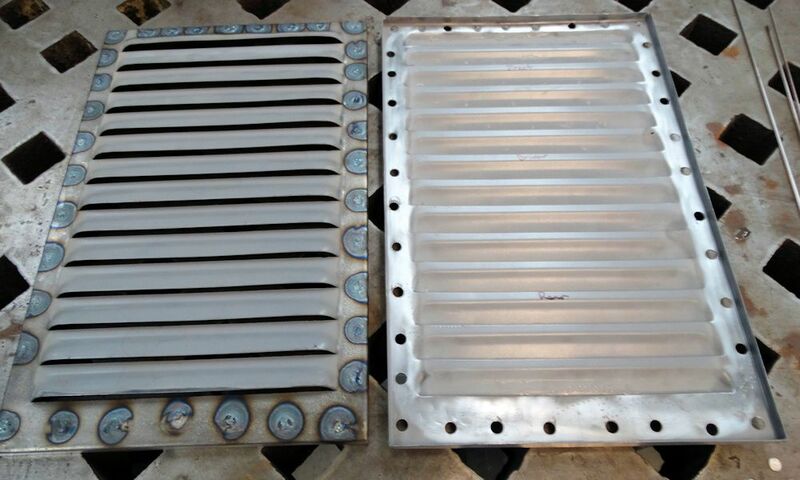 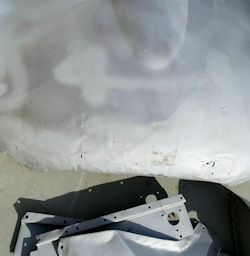 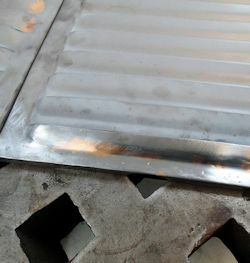 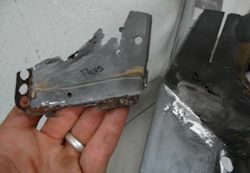 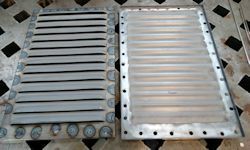 We were determined to save the original bonnet louvers, despite them being badly pitted and actually holed in some areas. 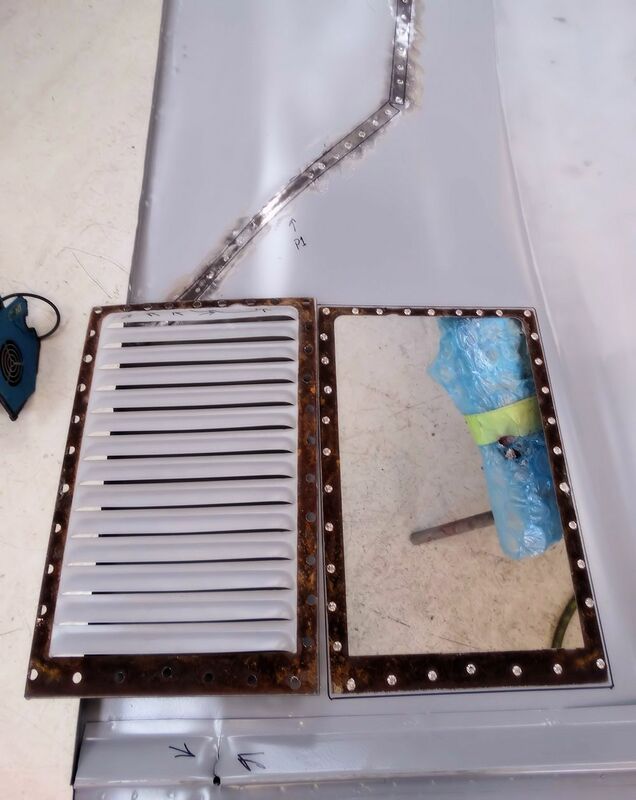 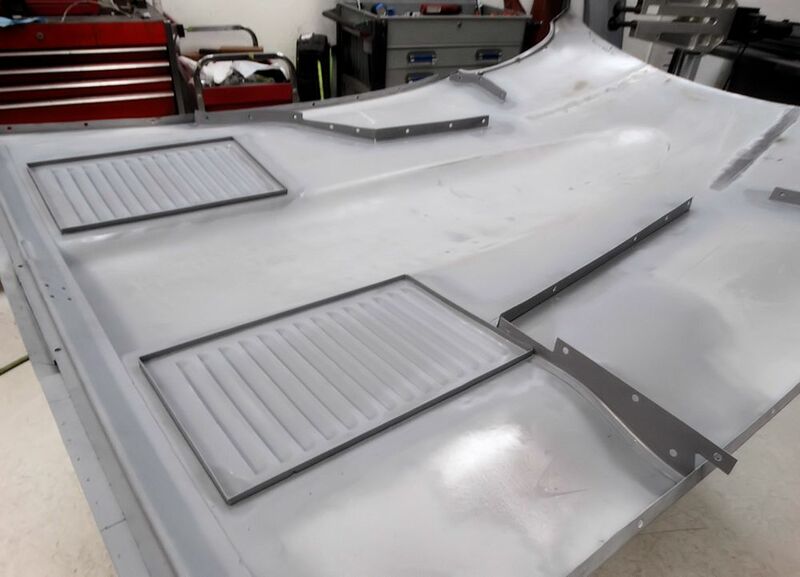 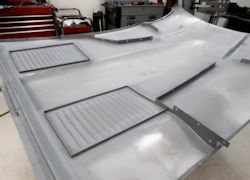 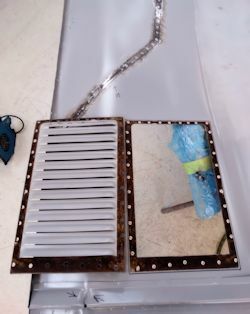 It took some ingenuity on Matt's part, including fabricating a copper louver to use as a backing panel to the original louvers during the welding process. 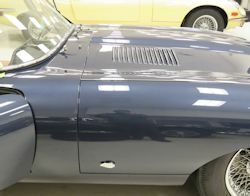 I thought you might be interested to have Matt explain his methods personally. 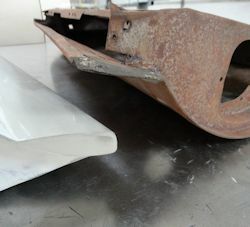 The original bonnet from 885013, albeit creased and crunched from accident damage and dilapidated with rust, is obviously worth saving as it is one of only three original LHD outside latch coupe bonnets still with its original body. 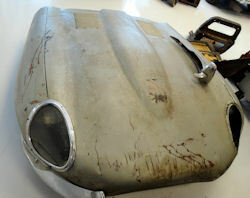 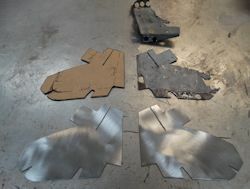 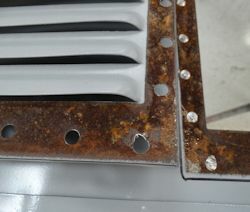 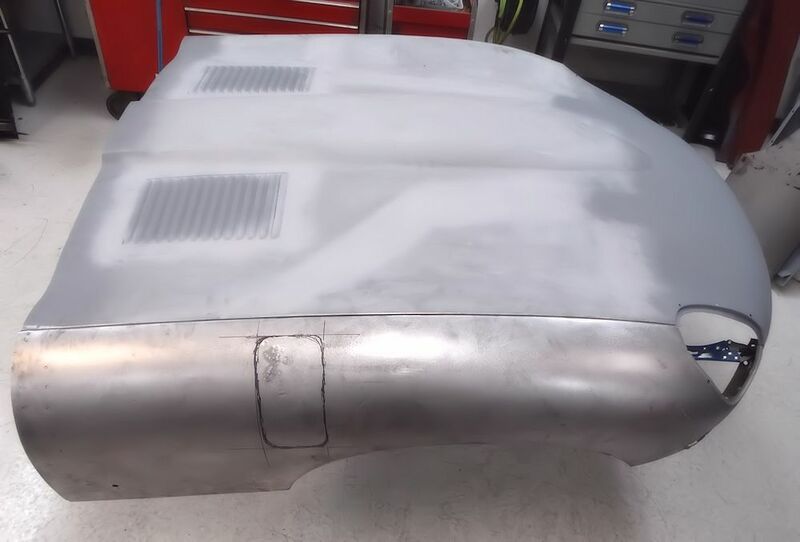 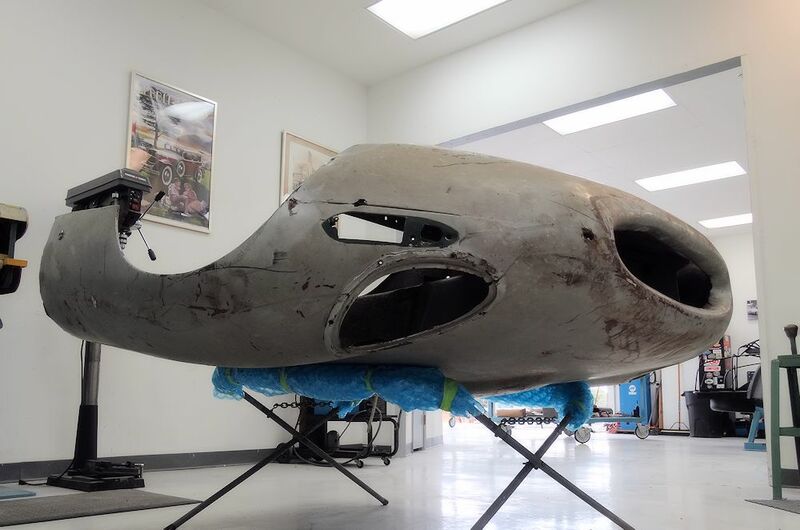 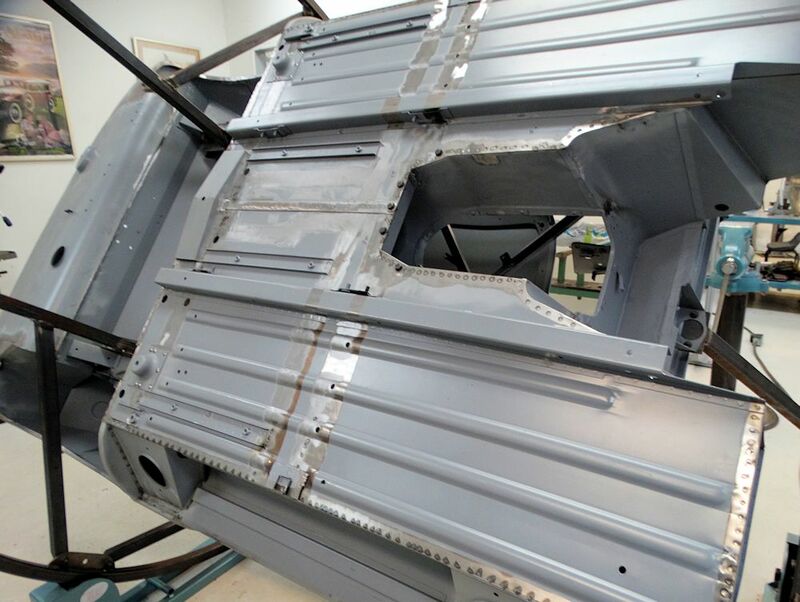 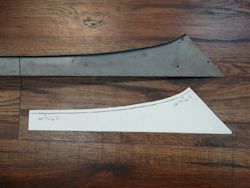 Our goal with this project is to preserve as much of the original sheet metal as possible. 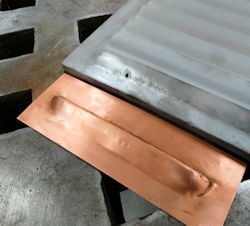 Without going into a rabbit hole of theory and textbook detail, I have compiled my thoughts and actions behind the 'copper louver' idea in the following paragraphs. 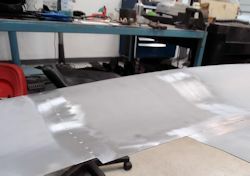 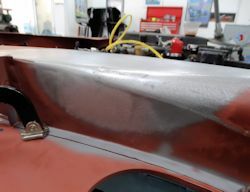 After removing both spot welded louver panels from the bonnet center section, I found extensive rust and pitting on the mating surfaces between the two panels. 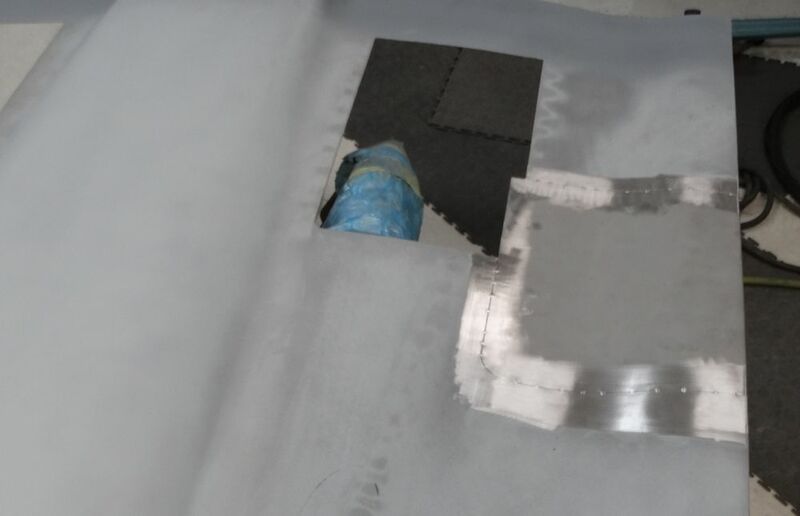 After media blasting, wire wheeling and treating the surfaces with Ospho (a rust sealer and inhibitor), I could see the full extent of the dilapidation that had meandered onto the visible (upper) sections of the louvers. 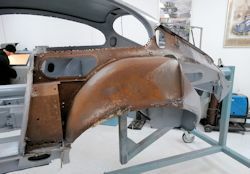 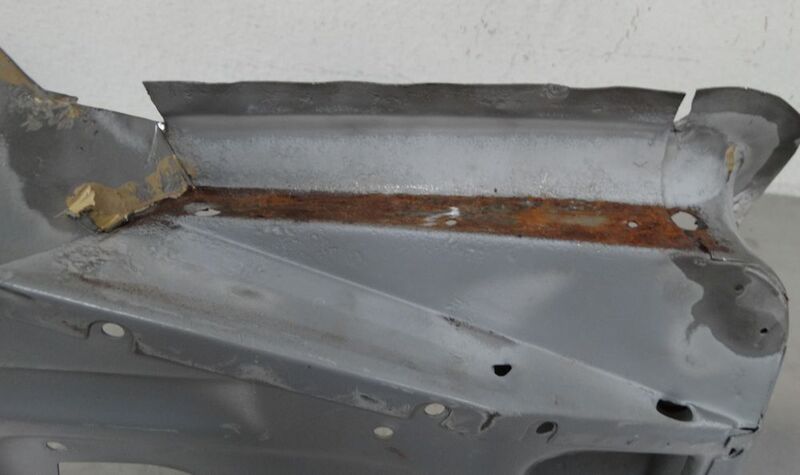 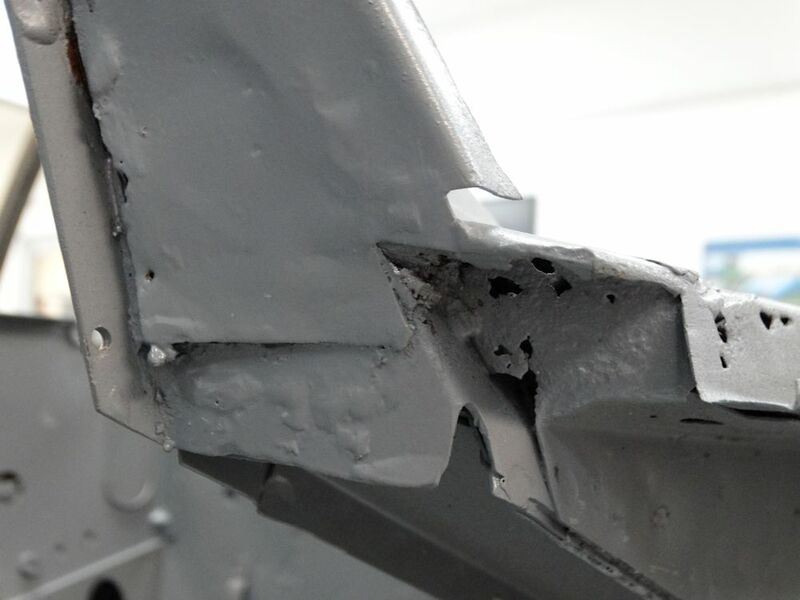 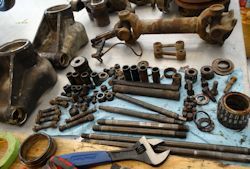 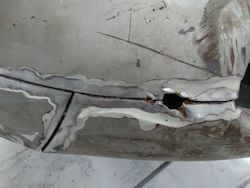 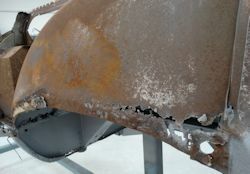 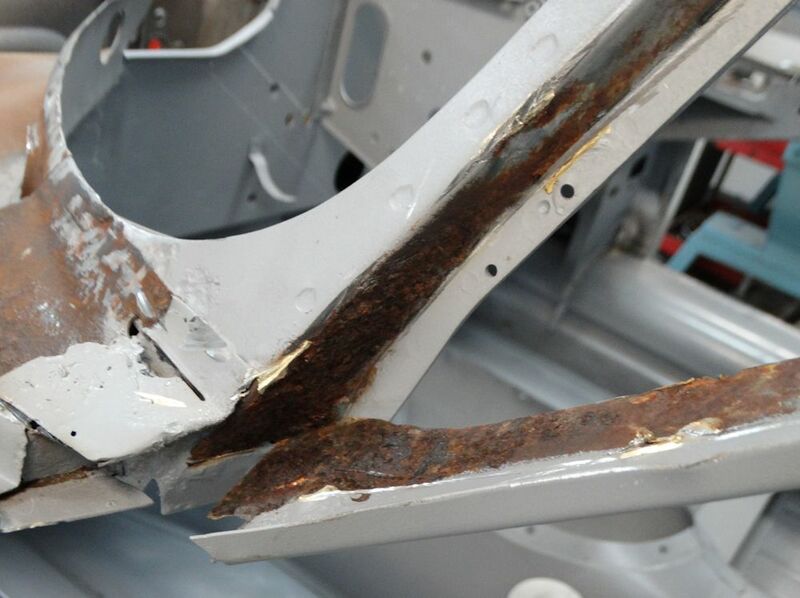 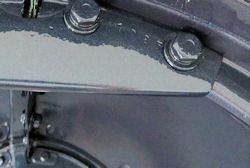 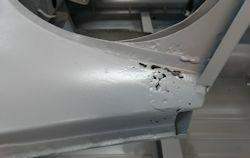 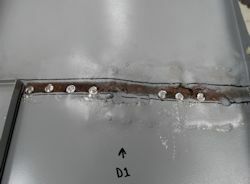 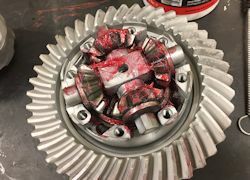 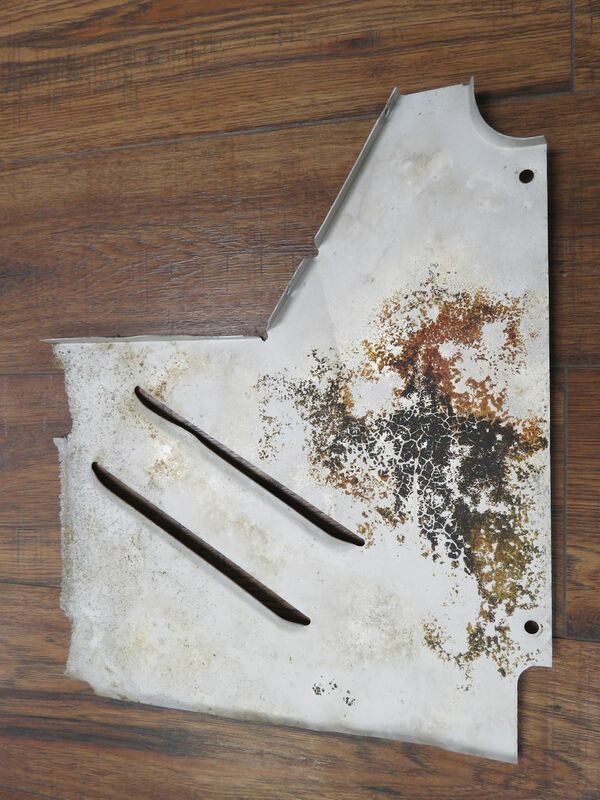 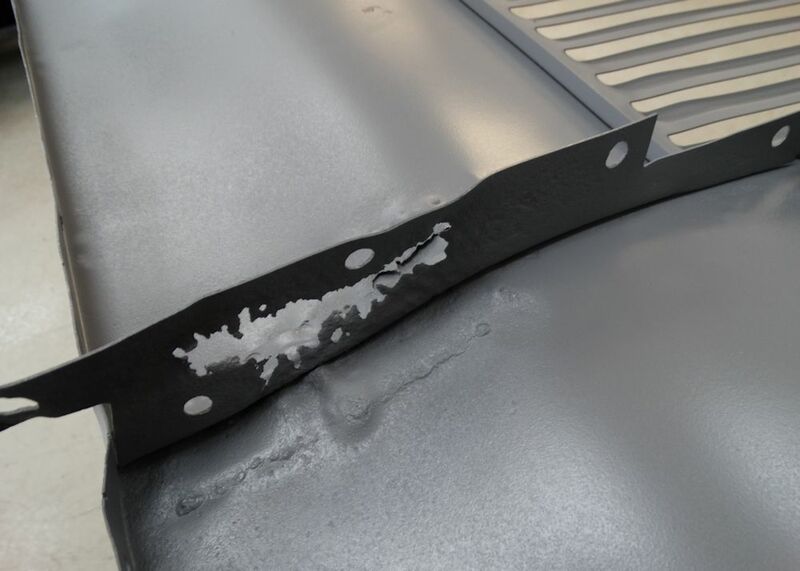 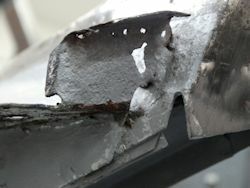 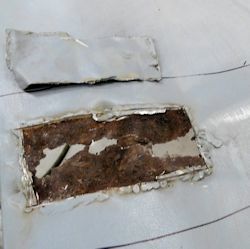 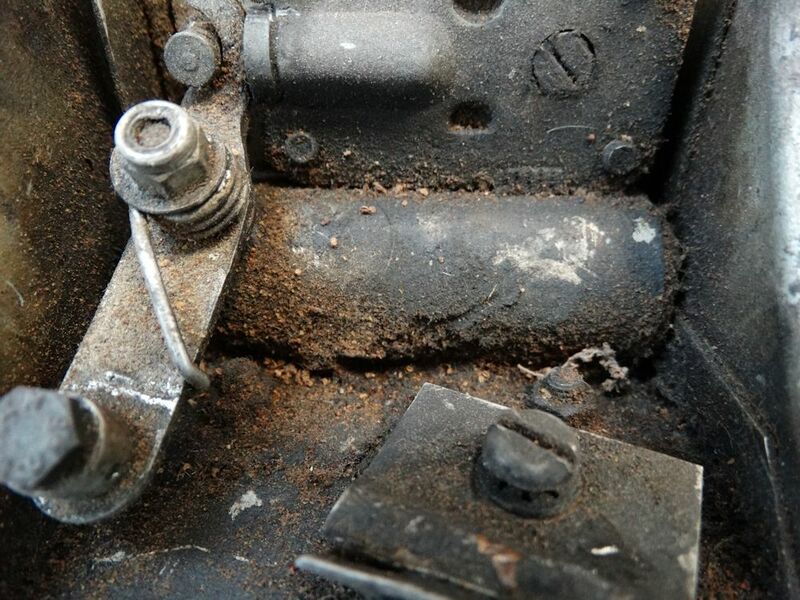 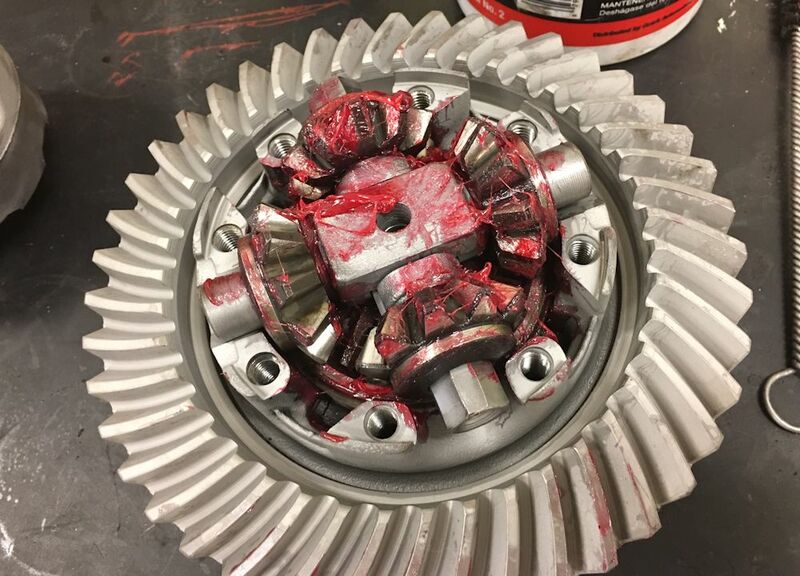 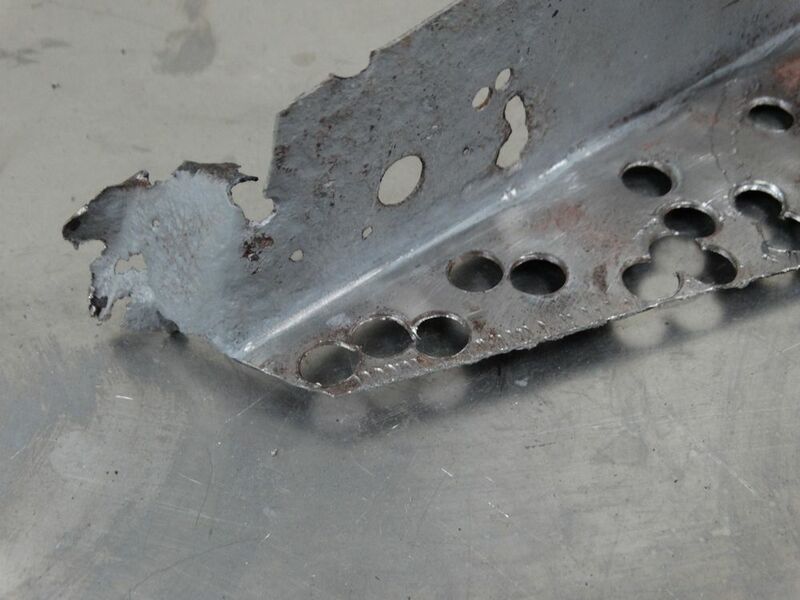 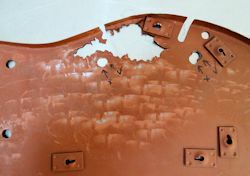 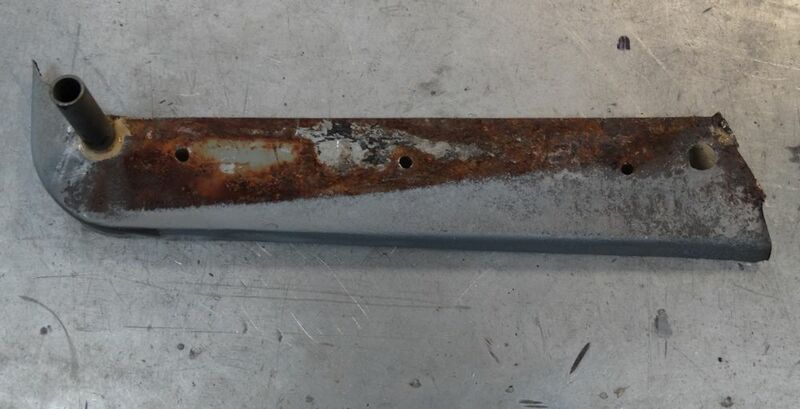 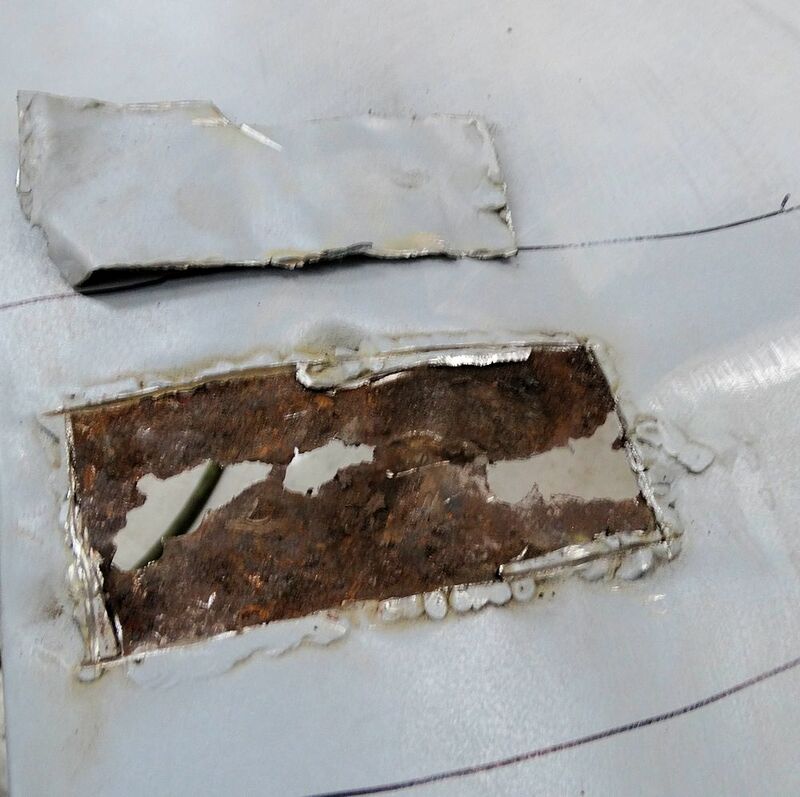 Rust had eaten away the metal, leaving behind extensive pitting, and even some holes, all of which had been hidden beneath multiple layers of paint and body filler. 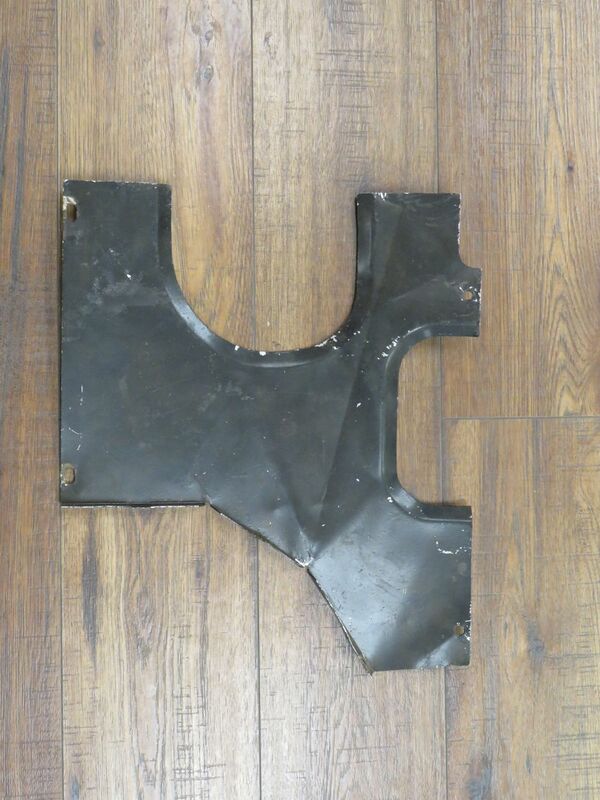 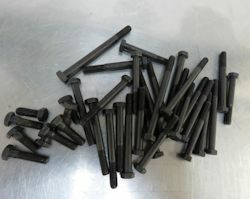 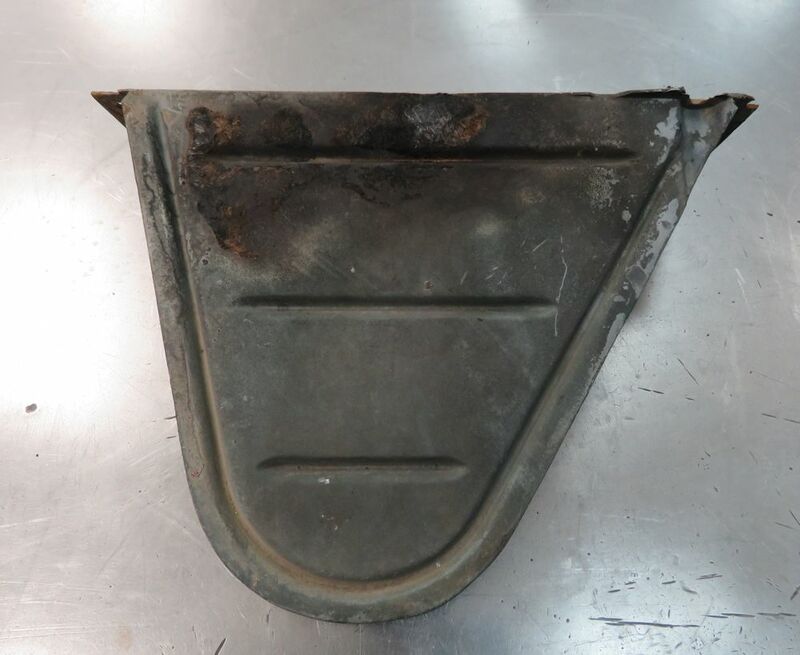 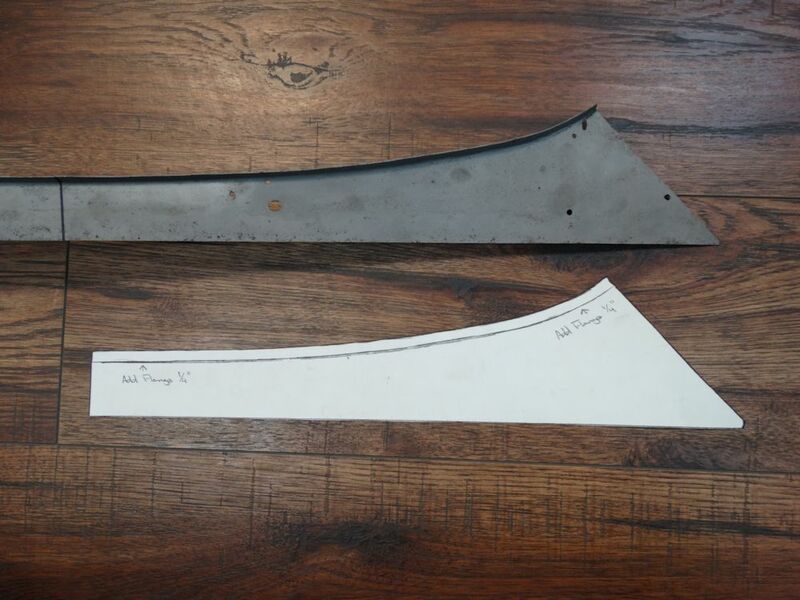 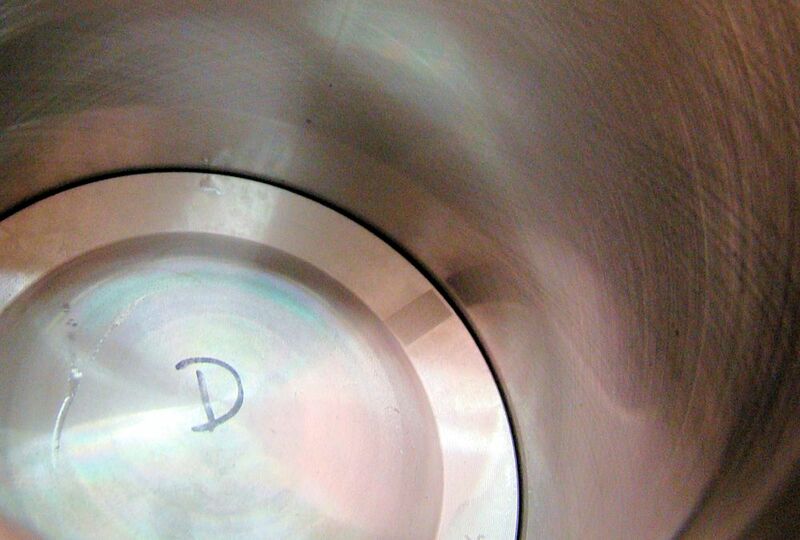 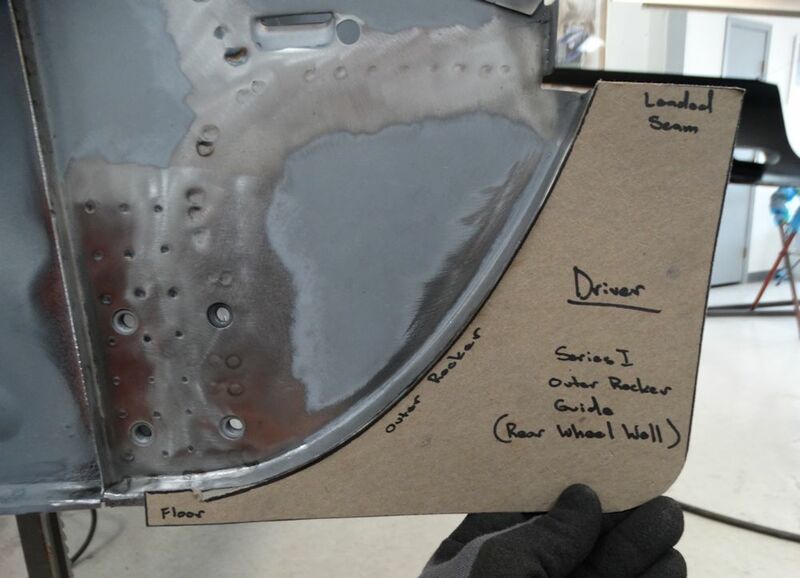 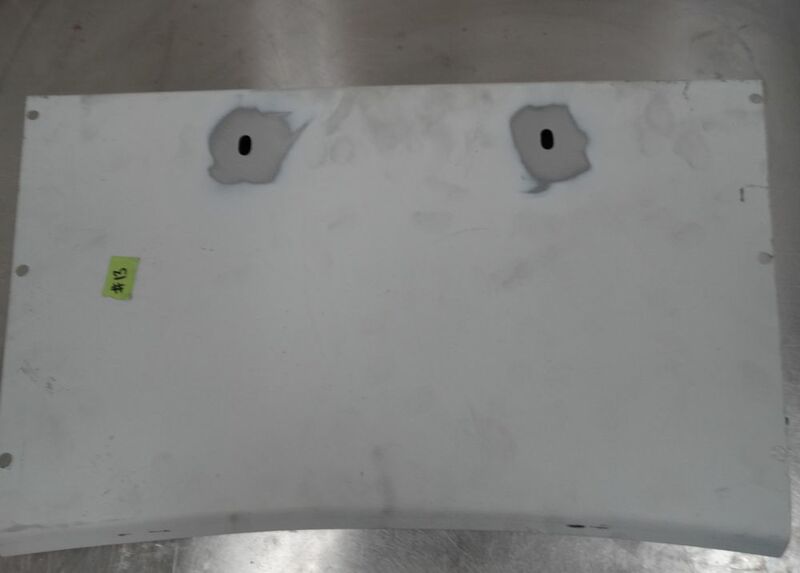 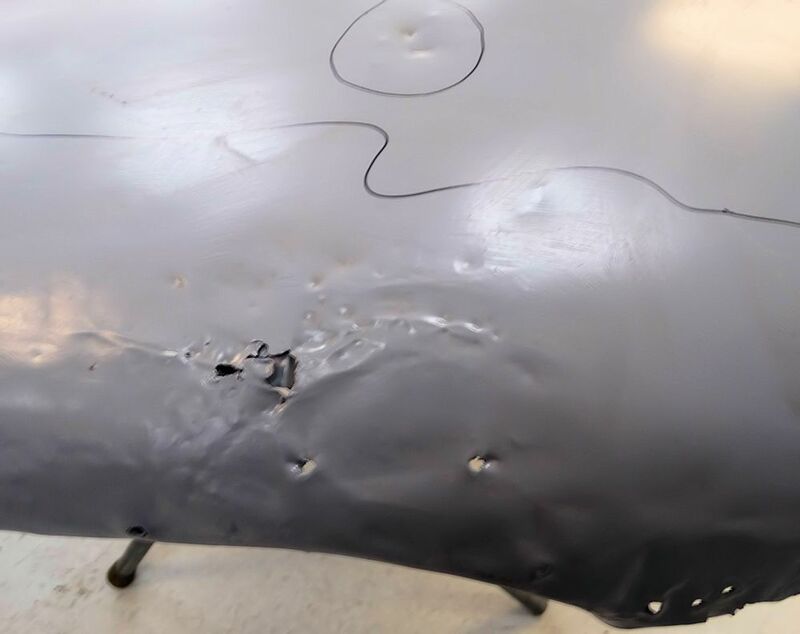 The bonnets were factory stamped from 20 gauge sheet metal, which itself is already thin. 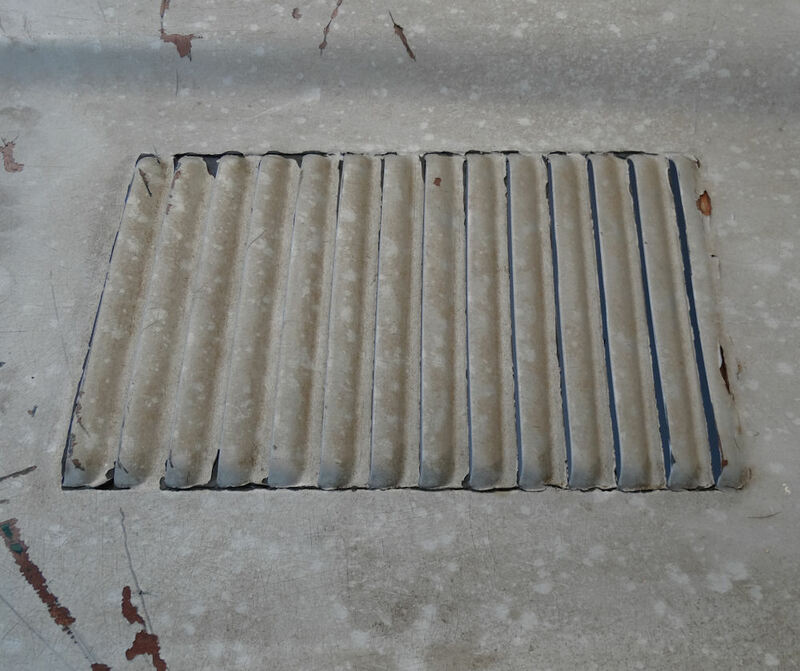 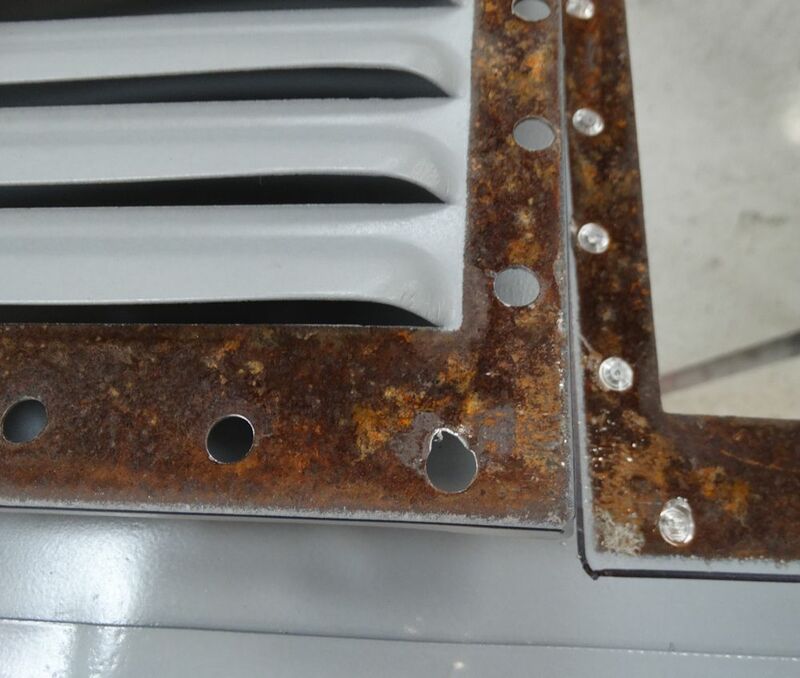 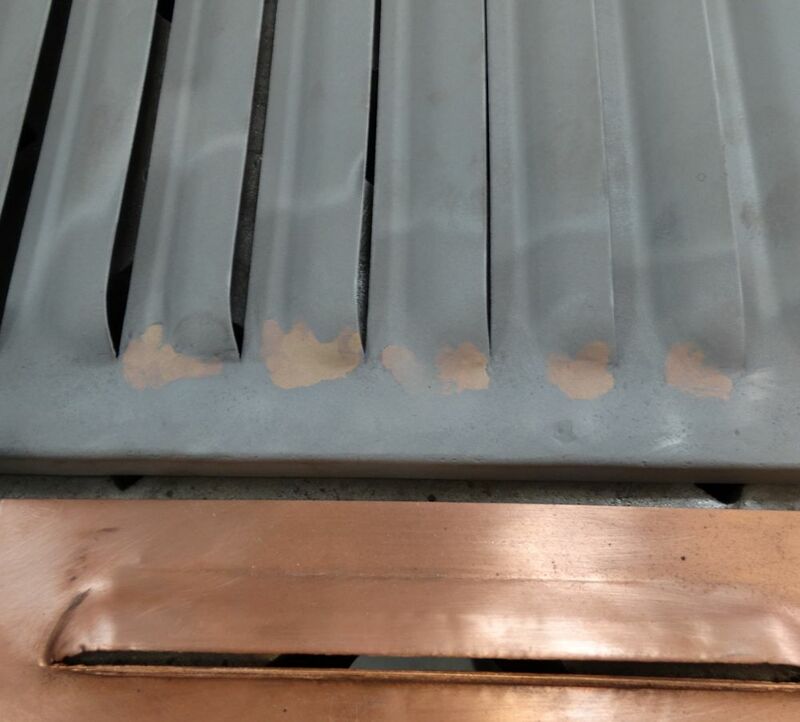 Add in the dilapidation from the spreading corrosion, and we were obviously faced with a significant challenge to properly repair the louvers. 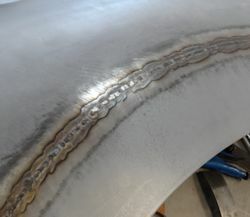 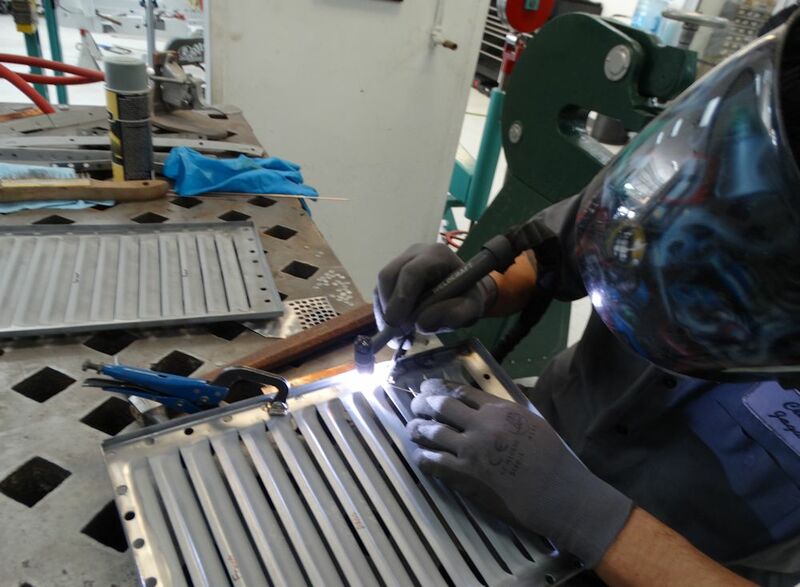 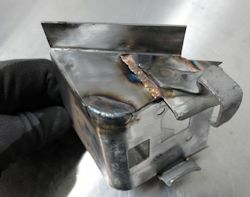 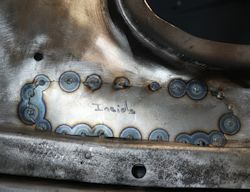 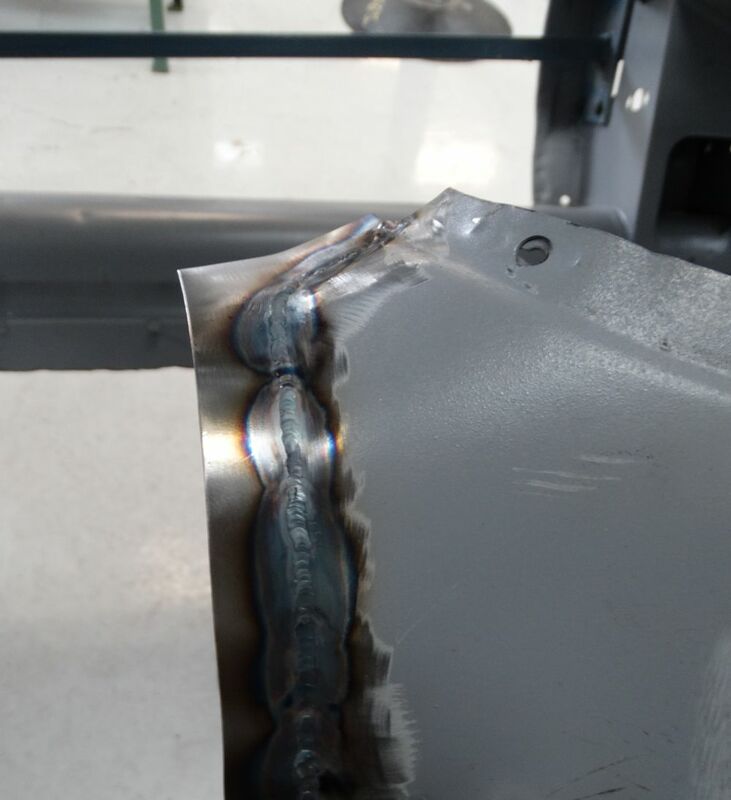 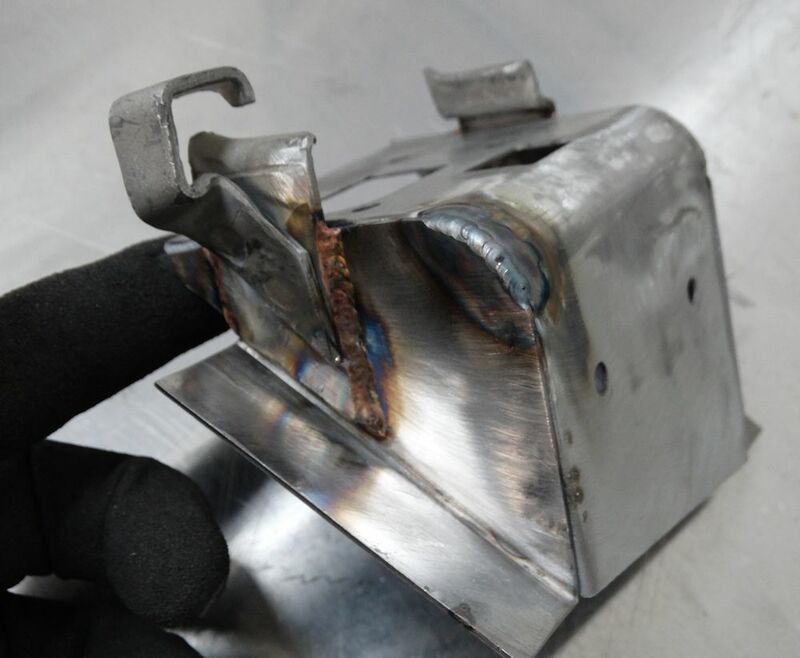 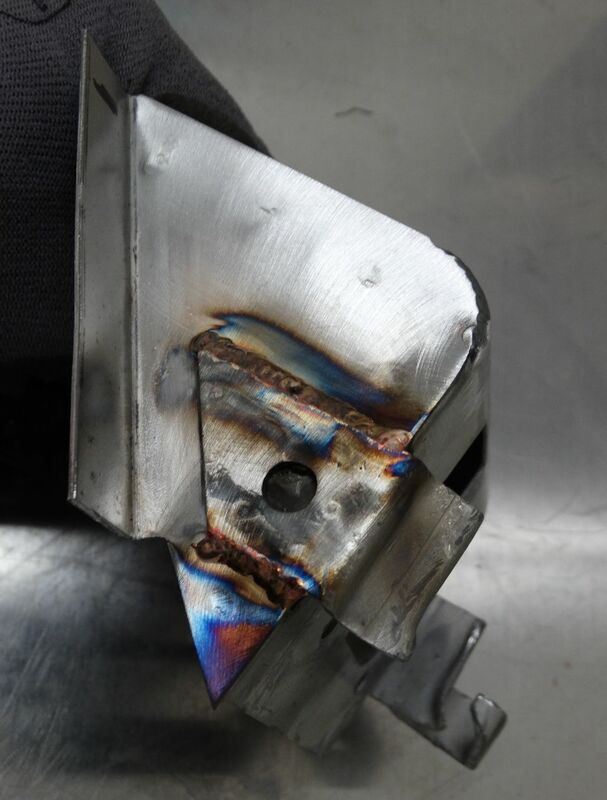 A TIG welder adds heat to the weld zone, which will effectively eat away thin material when welding. 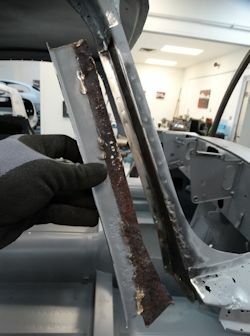 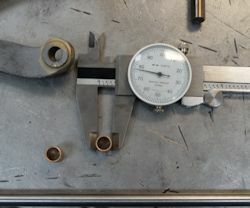 In order to prevent the material from literally disappearing, you have to be light with the heat and quick to add filler rod (in this case silicon bronze). 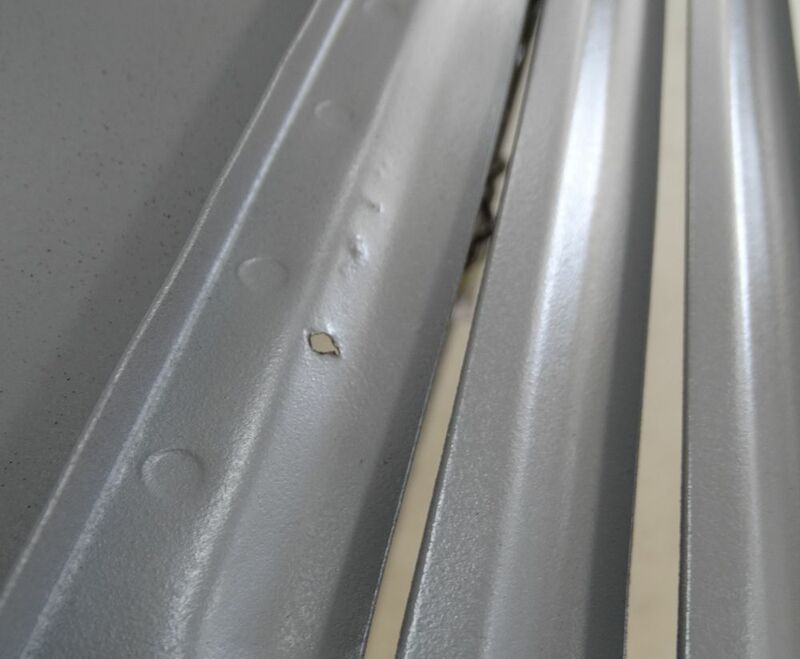 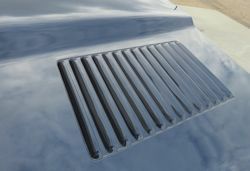 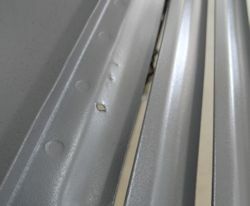 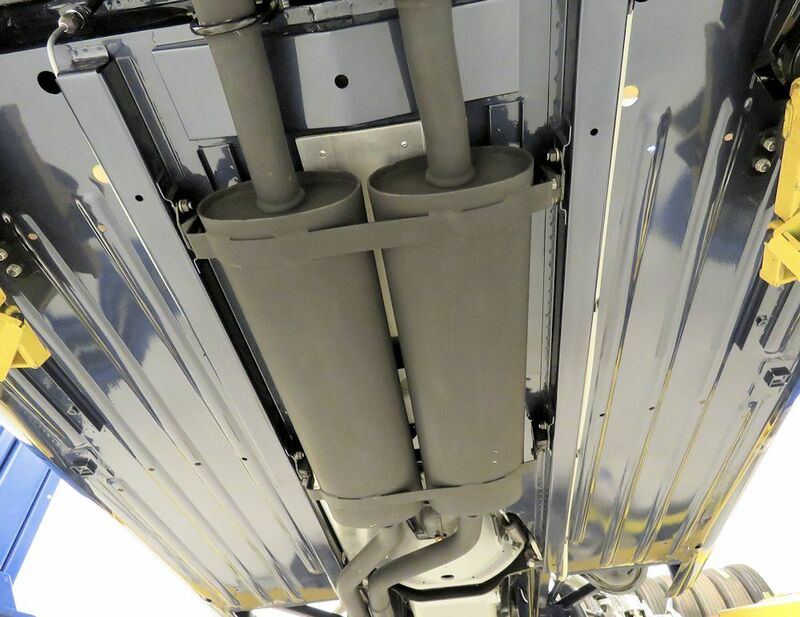 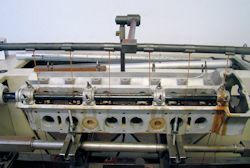 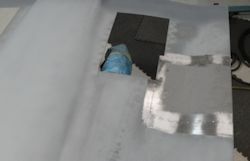 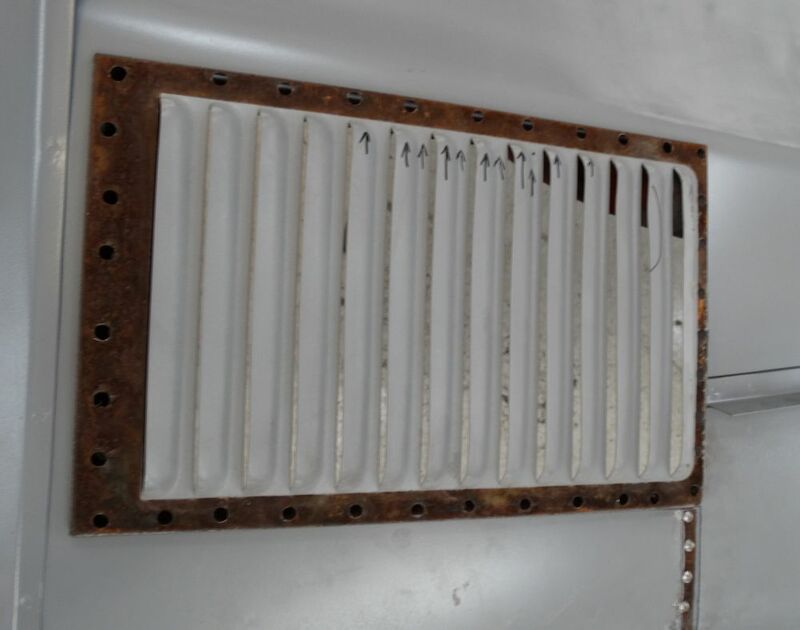 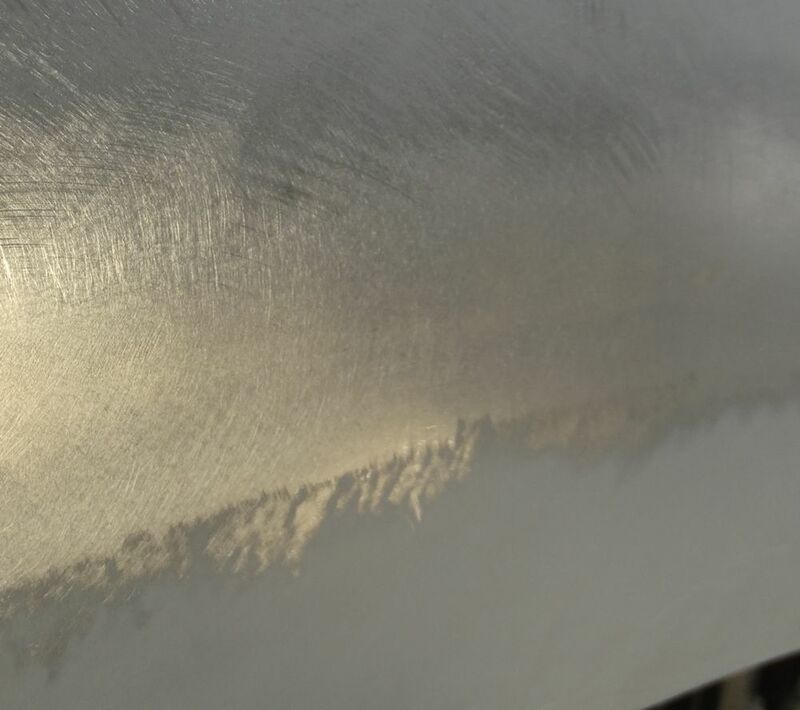 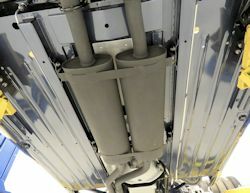 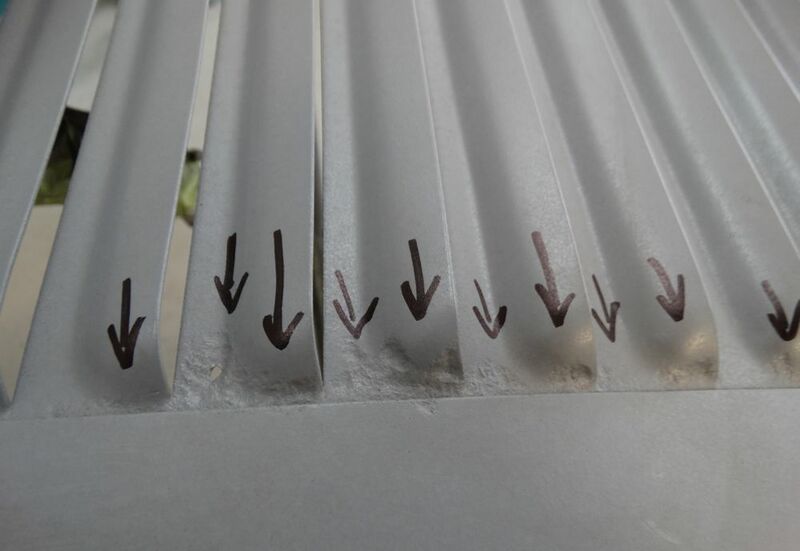 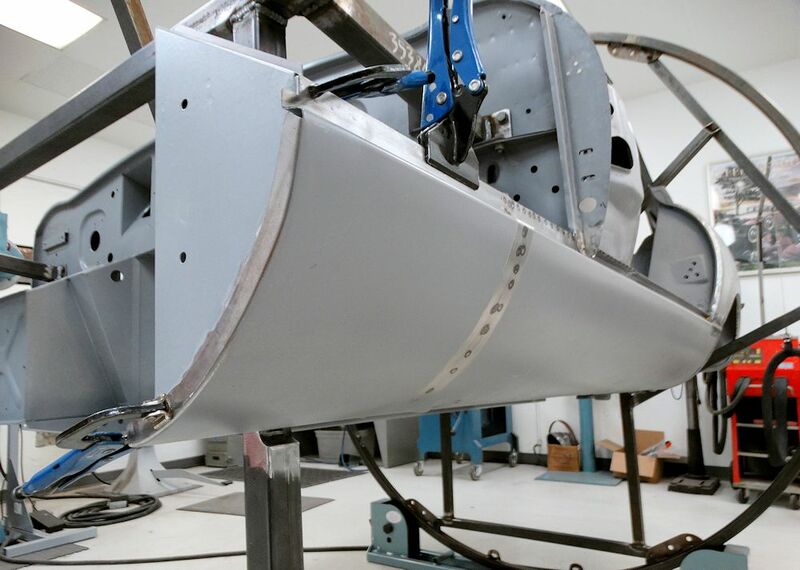 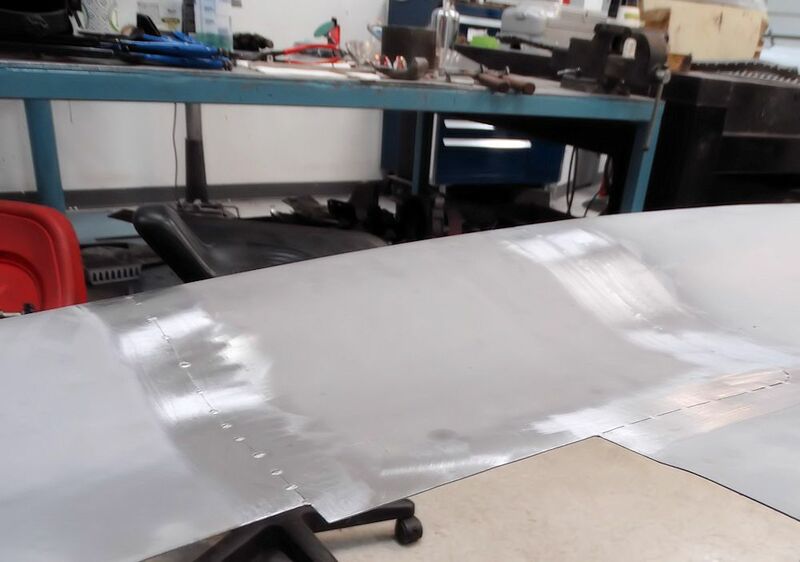 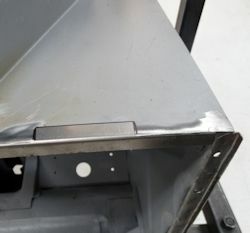 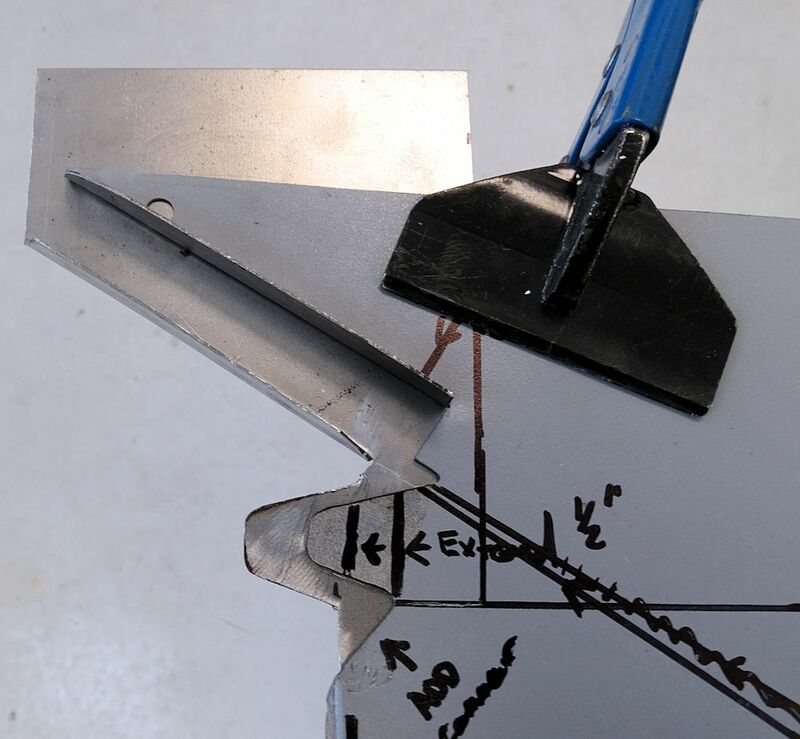 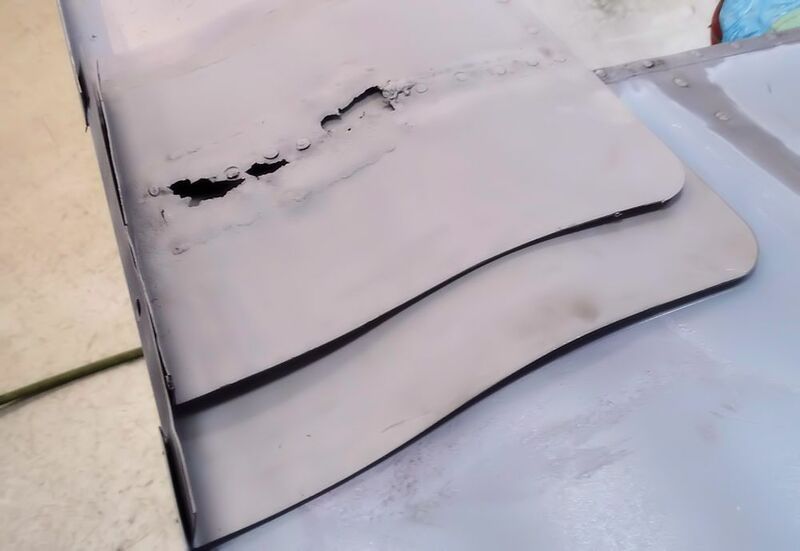 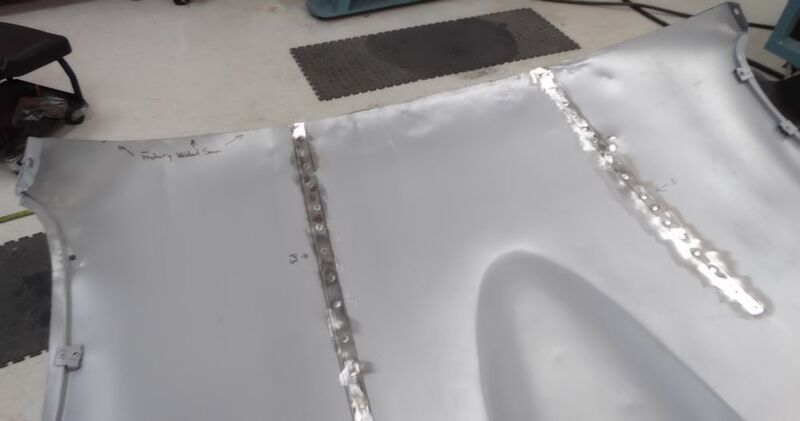 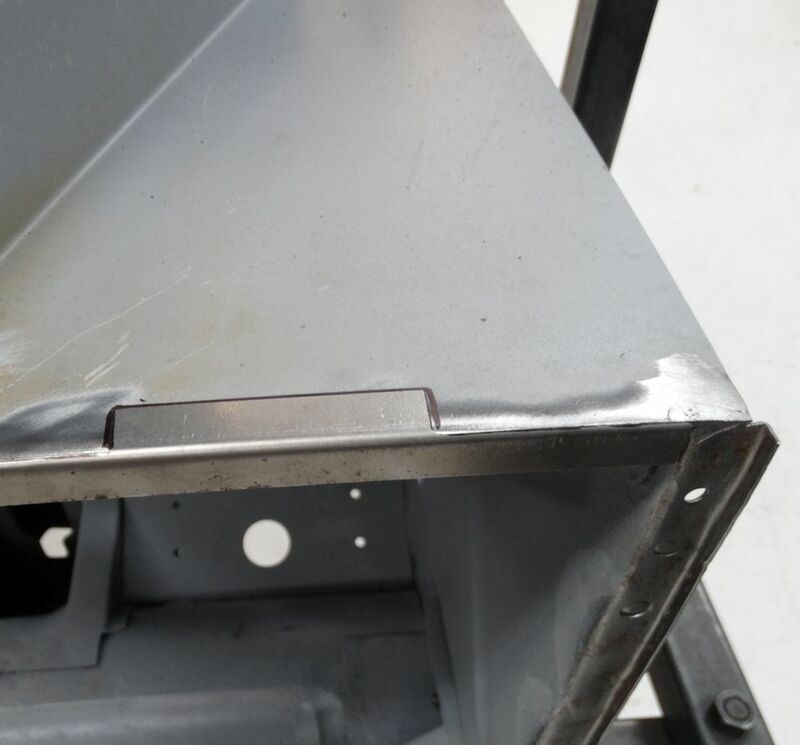 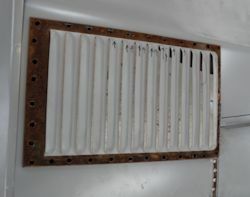 However, in this case, due to the severity of the rust, and the existence of actual pitted holes, no amount of light heat and rod dabbing would keep the pitted louvers intact. 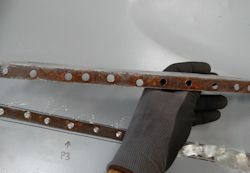 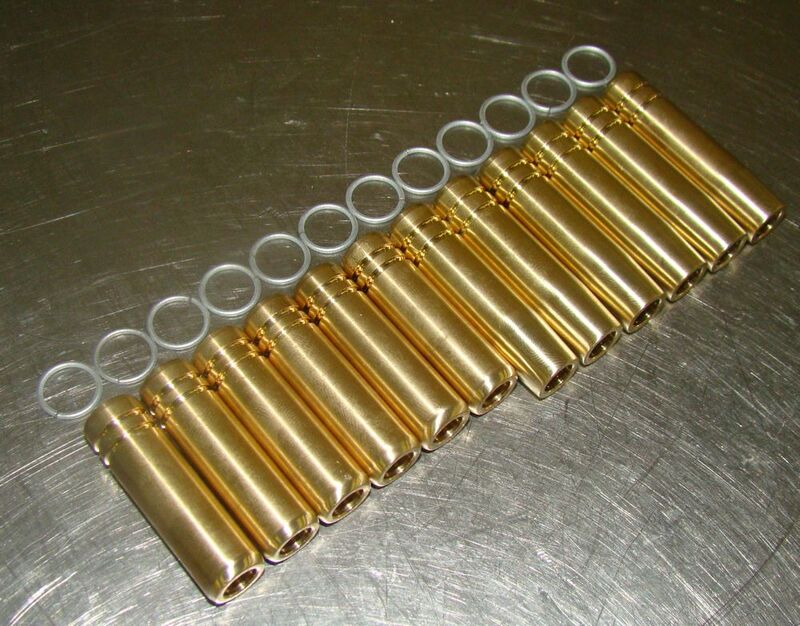 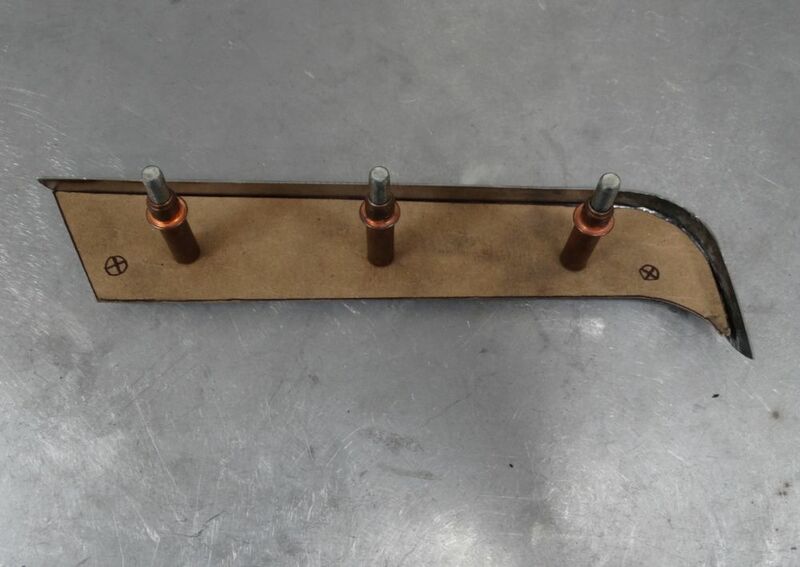 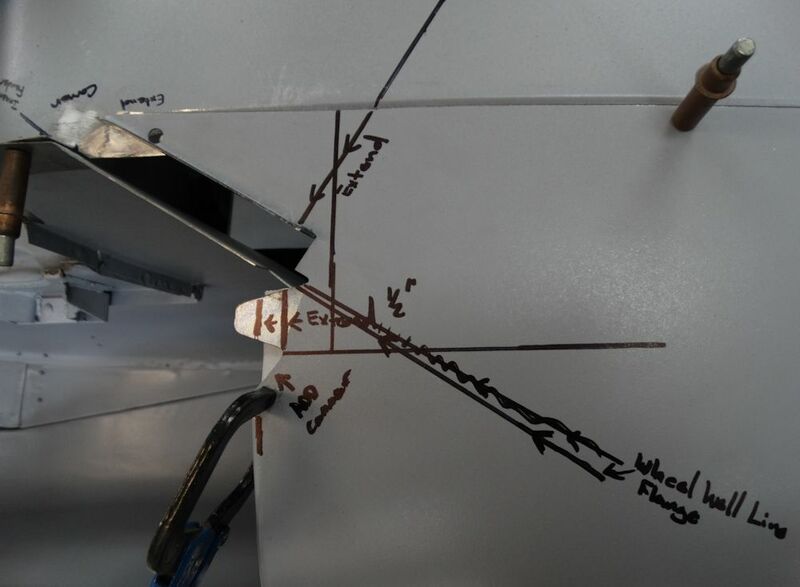 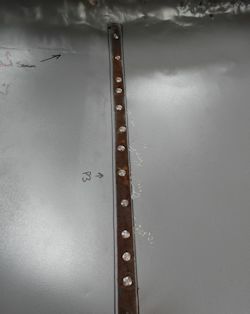 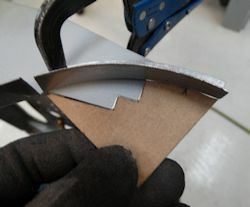 I regularly use 30 ounce copper sheet clamped to the back side of sheet metal when welding in patch panels. 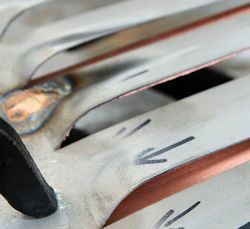 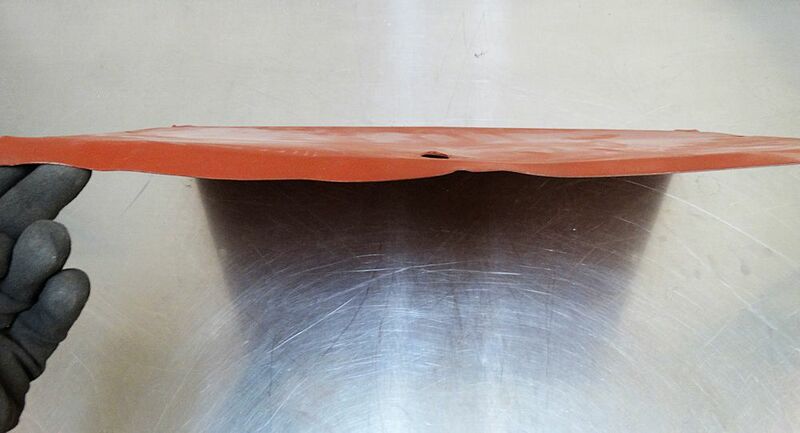 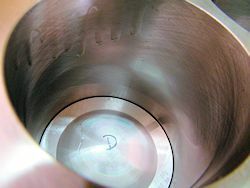 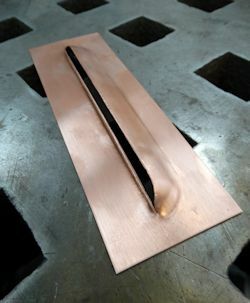 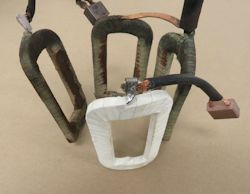 The copper acts as a heat sink and also keeps the back side of the weld shielded from the atmosphere. 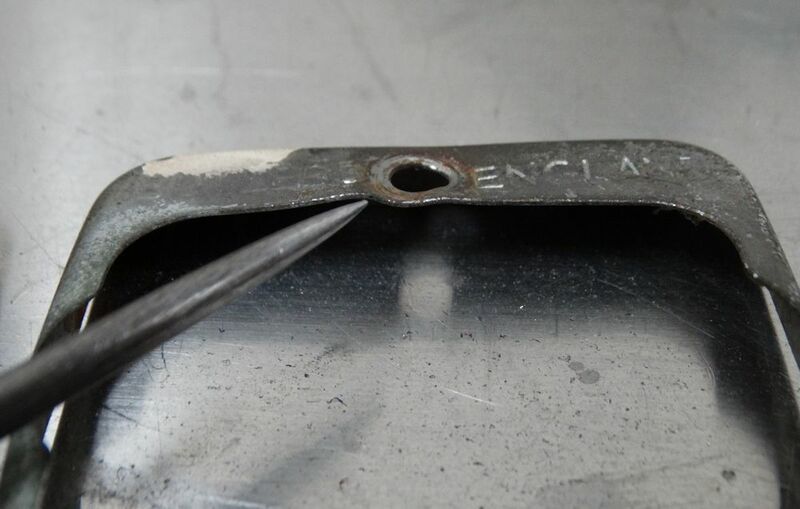 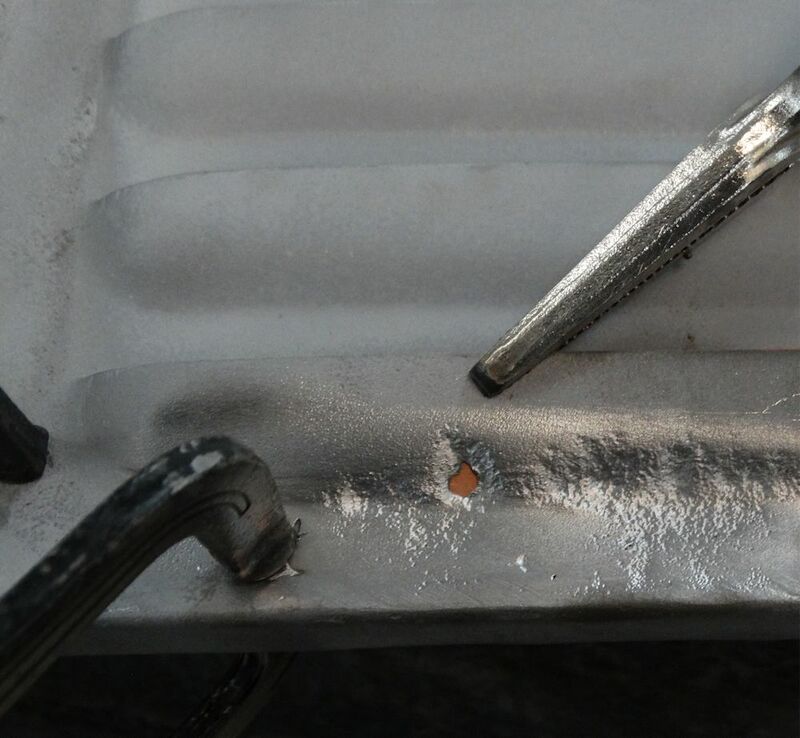 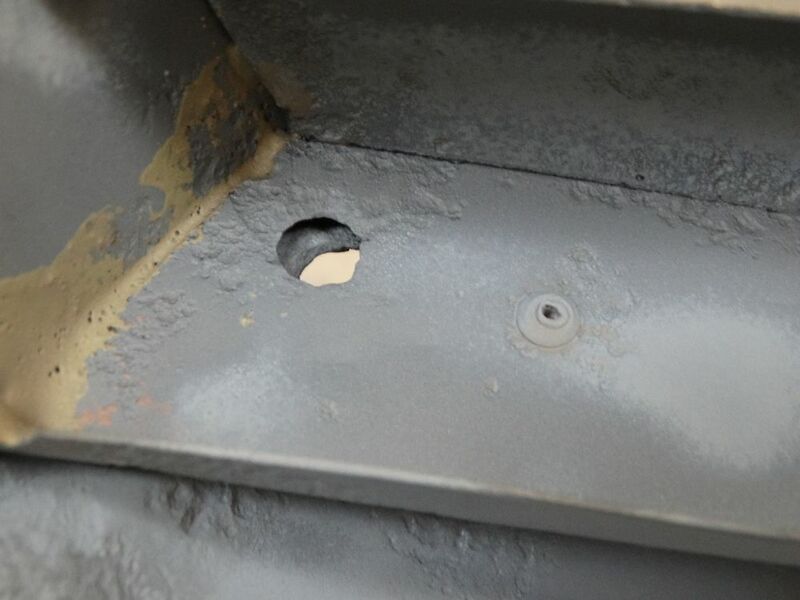 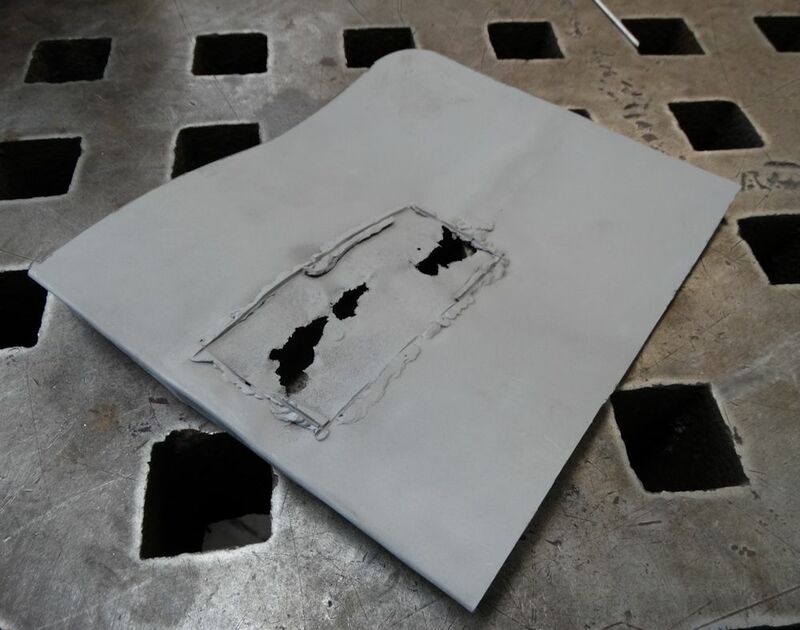 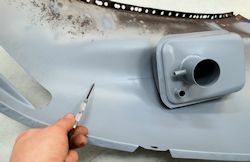 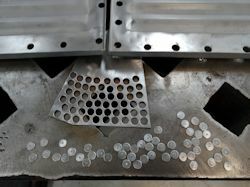 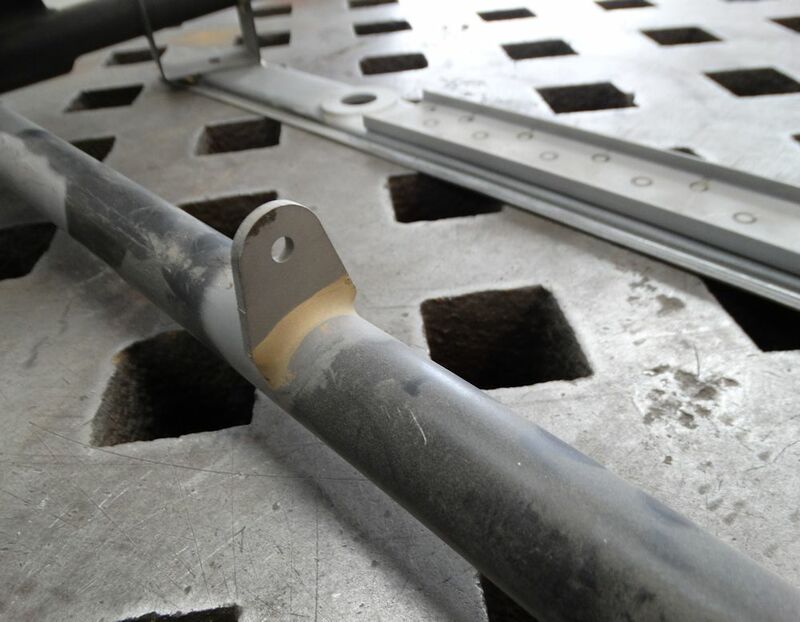 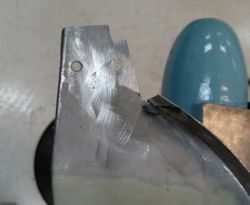 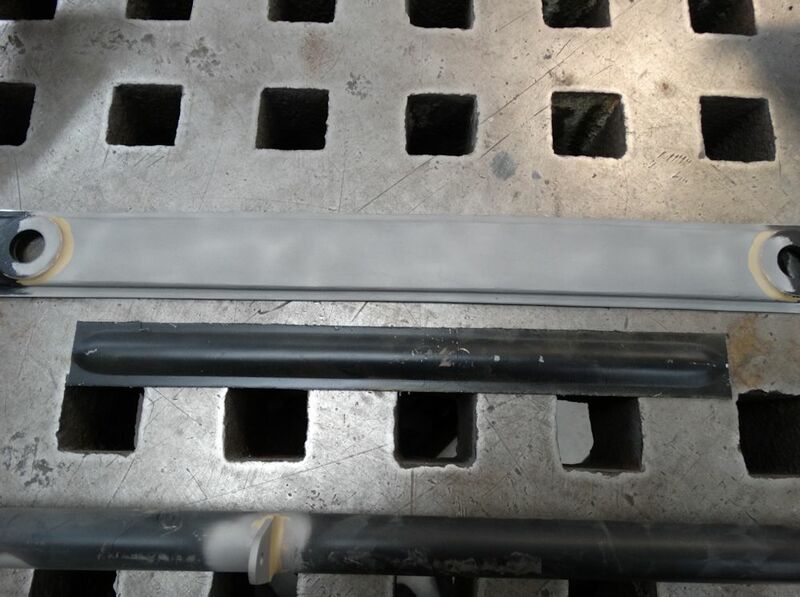 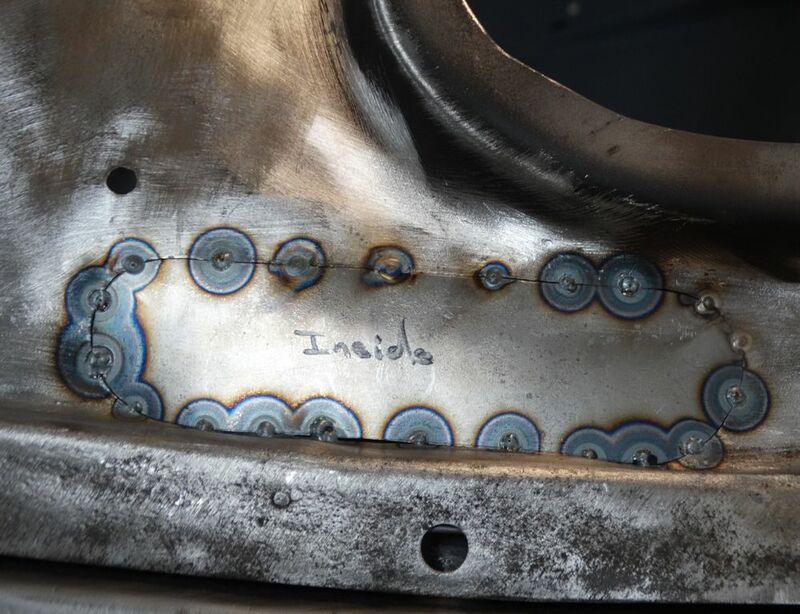 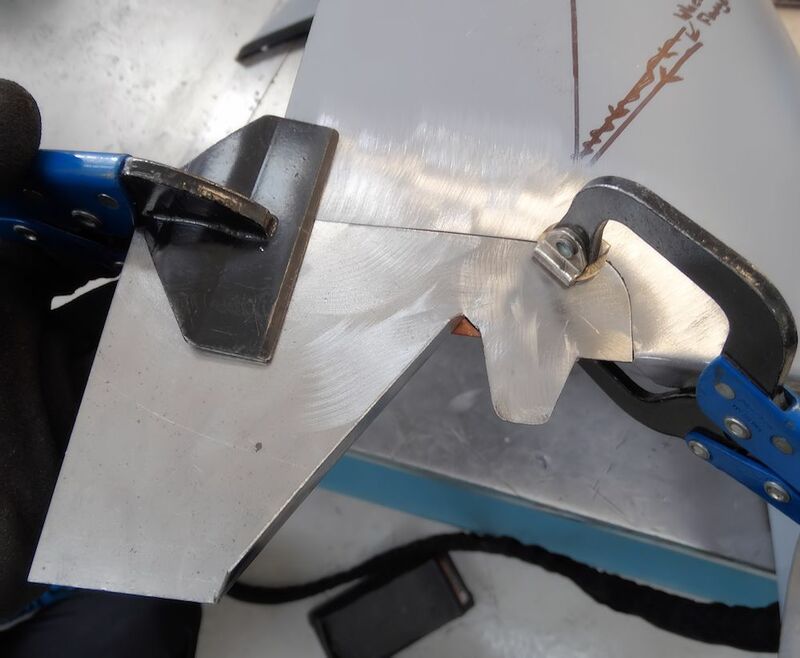 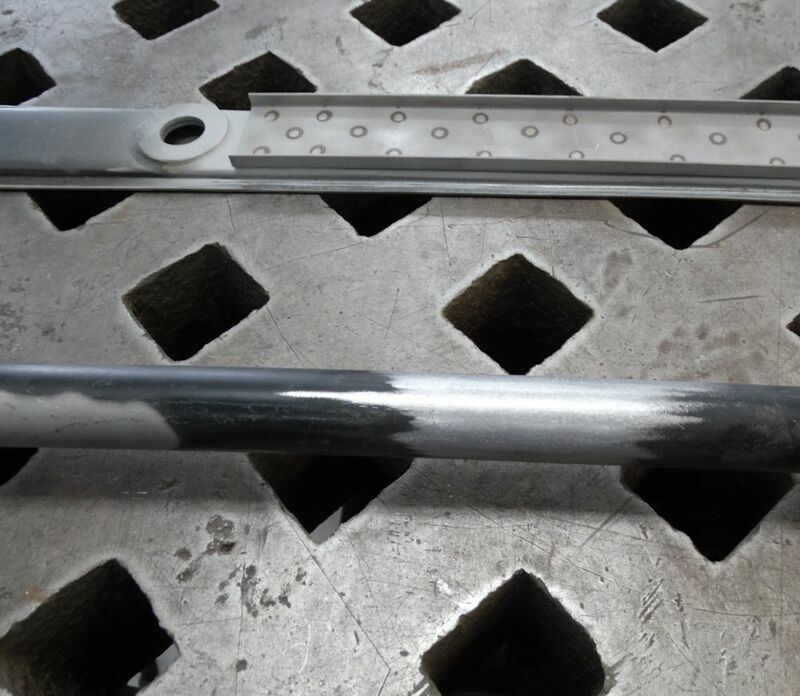 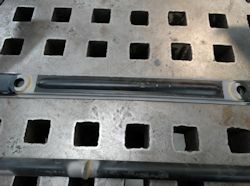 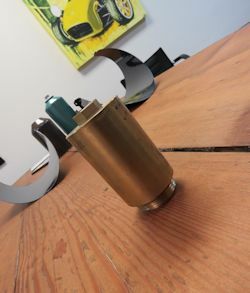 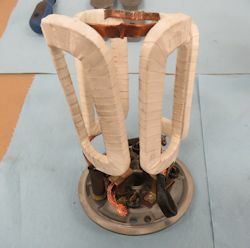 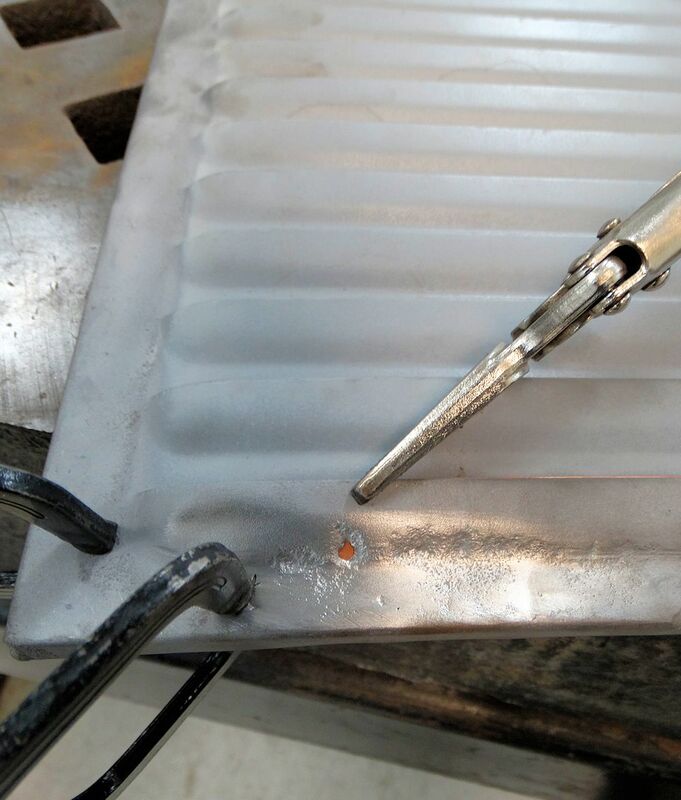 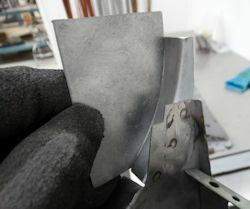 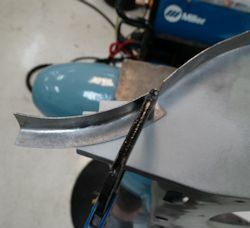 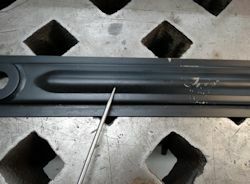 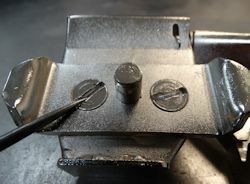 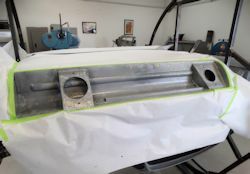 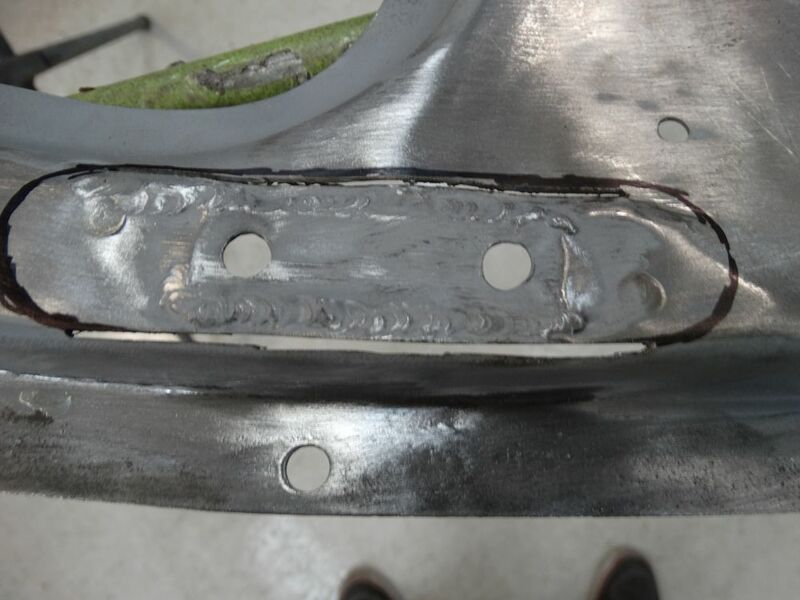 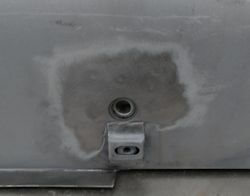 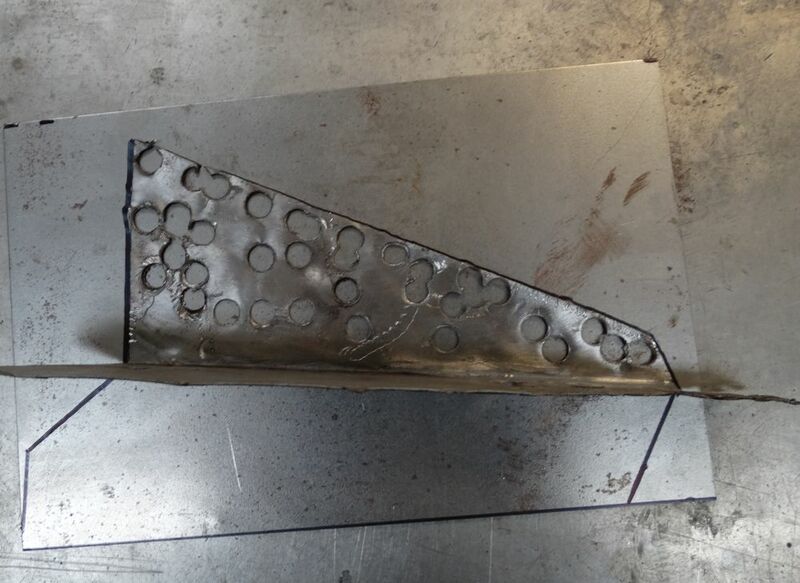 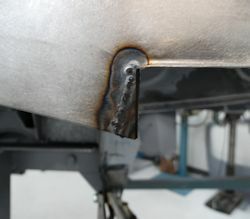 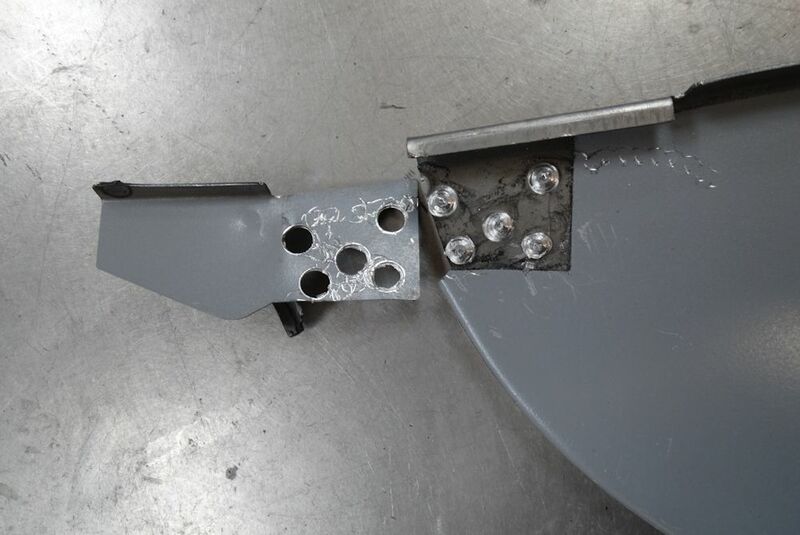 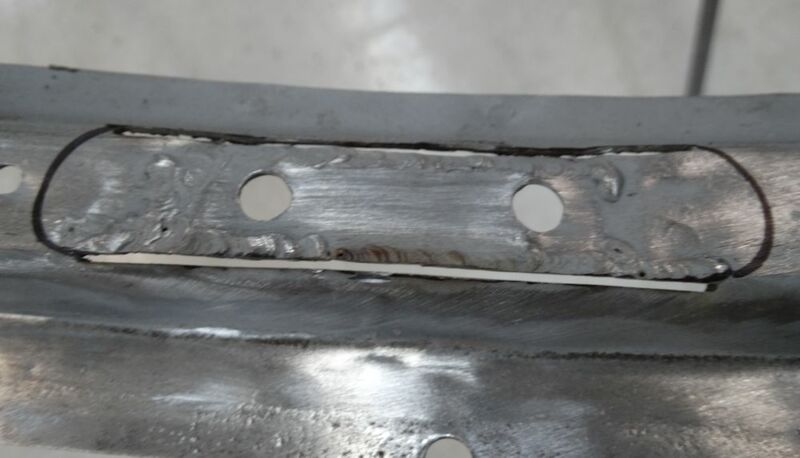 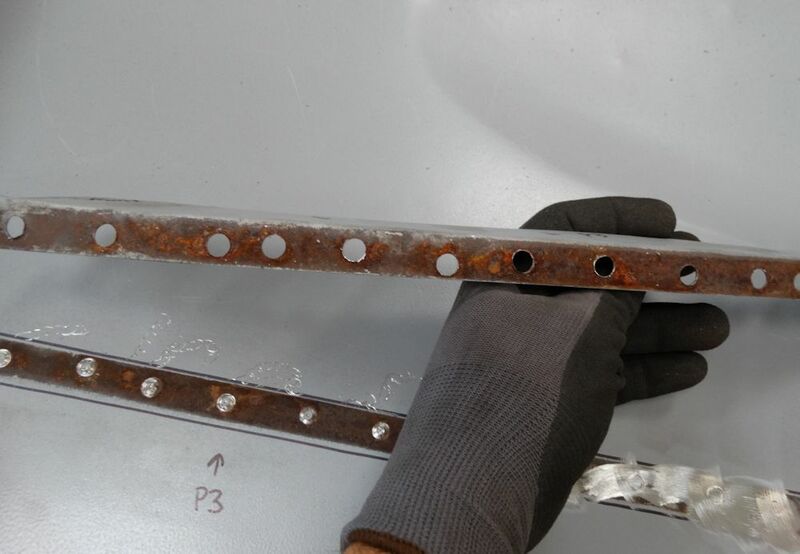 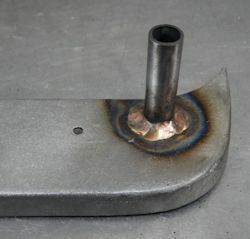 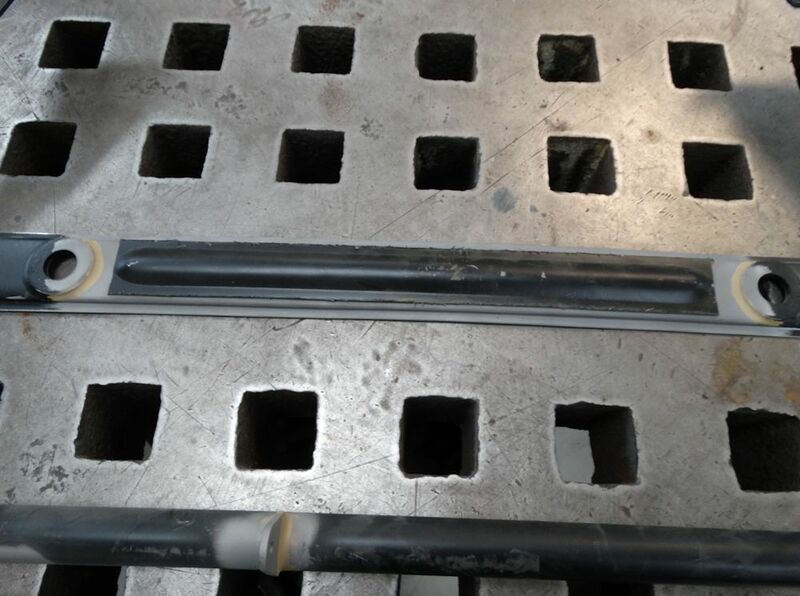 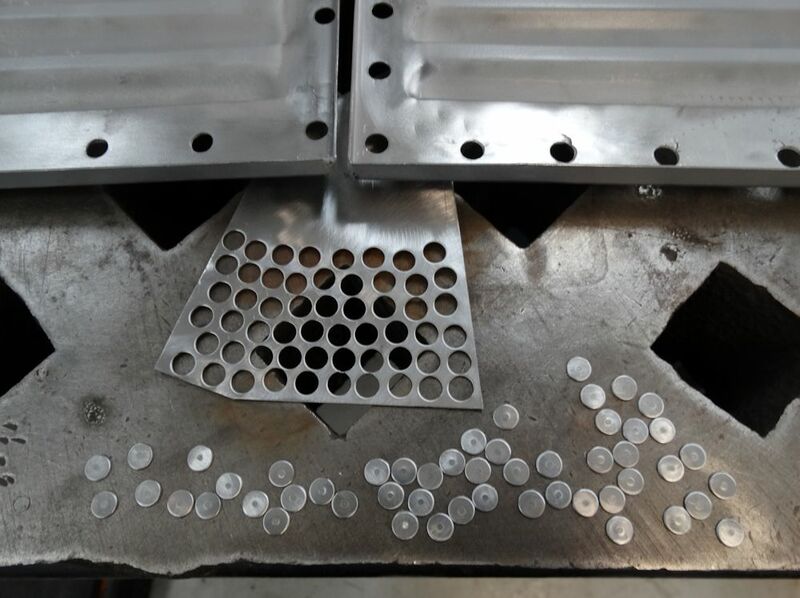 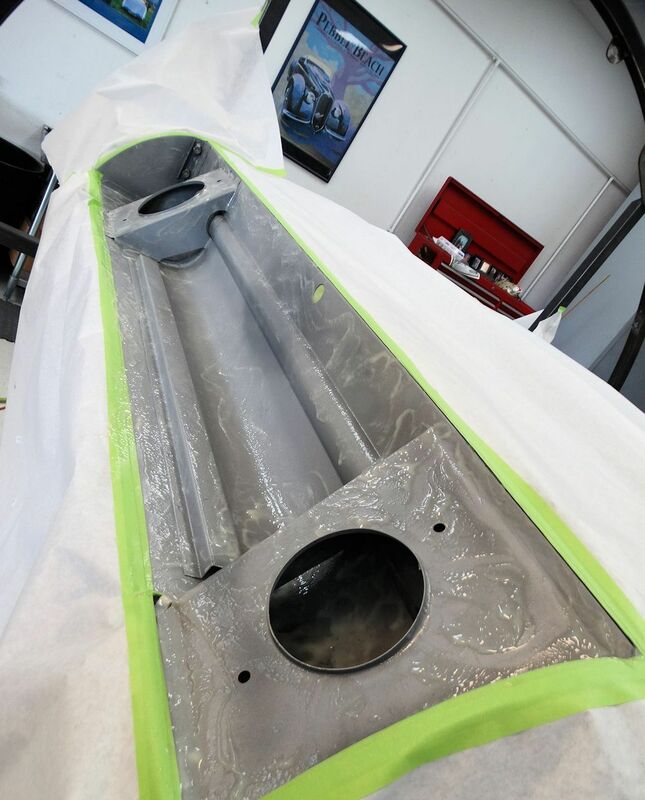 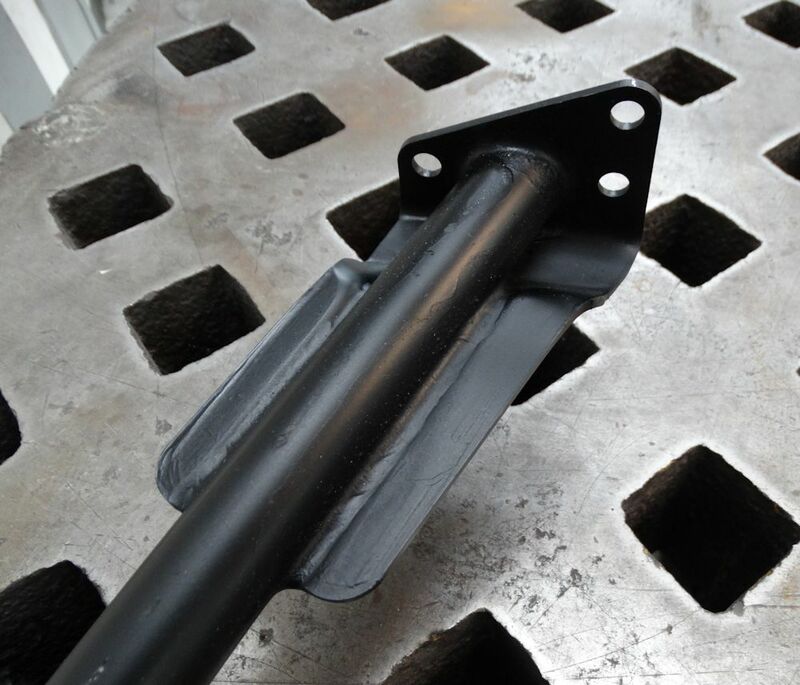 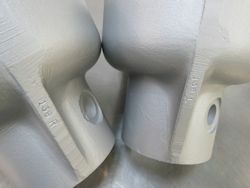 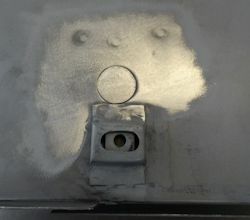 This allows small holes to be filled with weld by keeping the focus of heat off the area, so the base metal will accept a filler rod without disappearing. 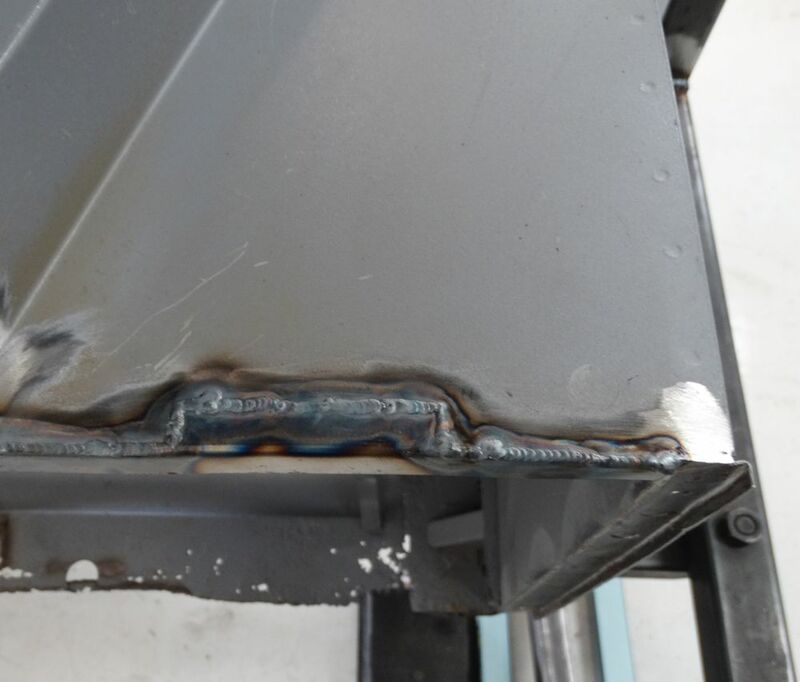 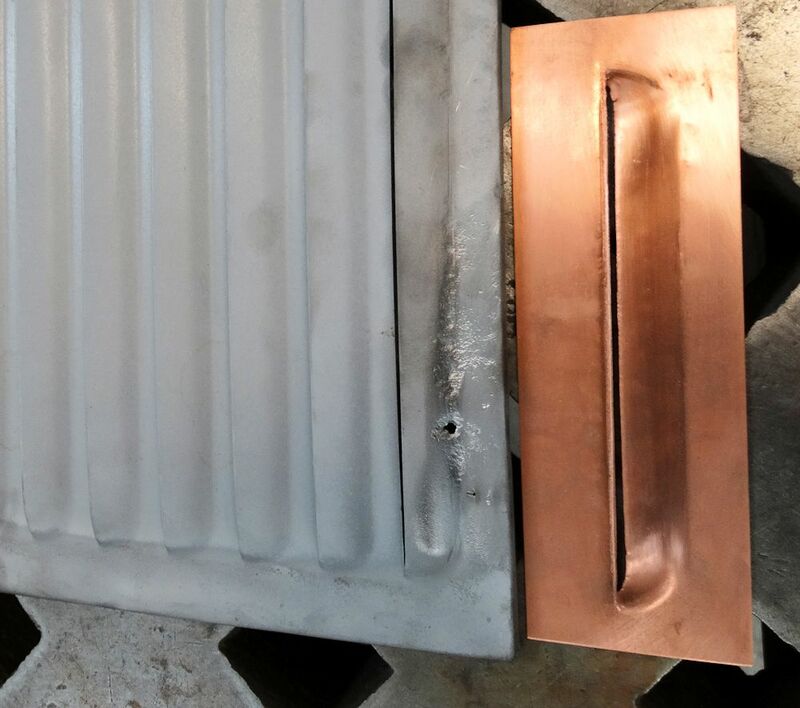 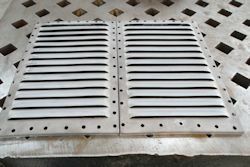 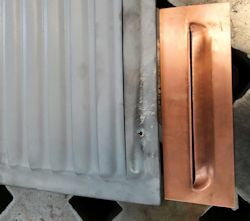 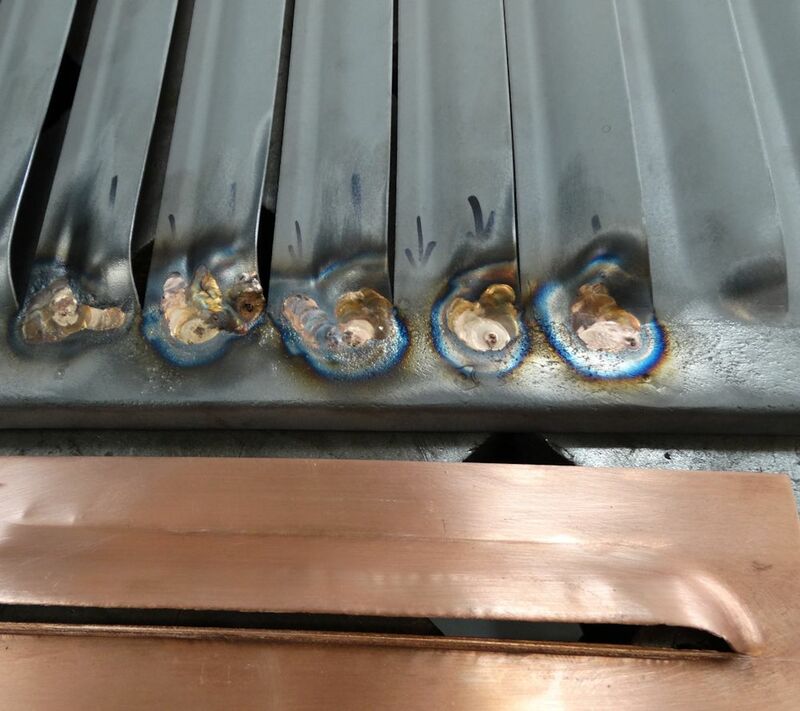 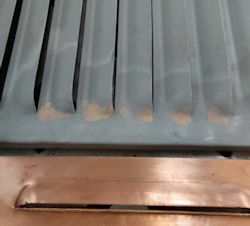 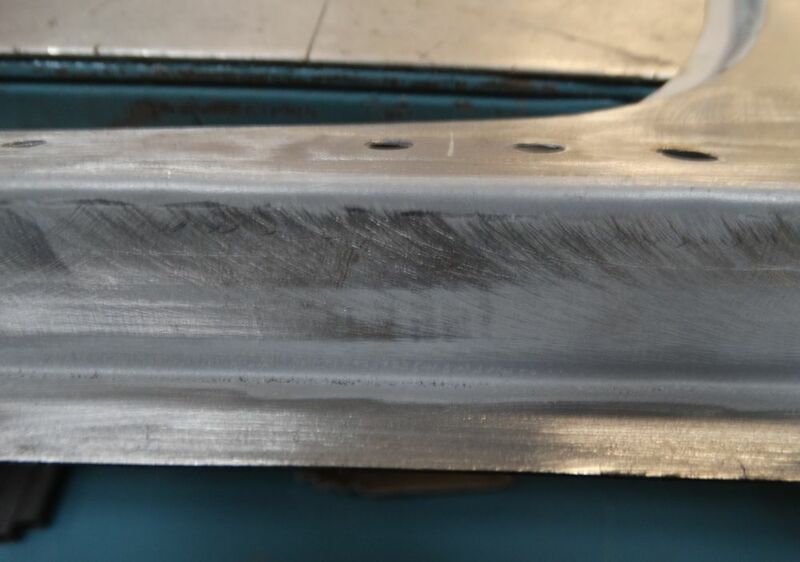 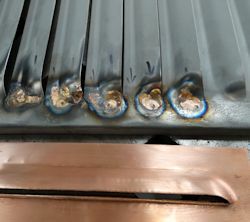 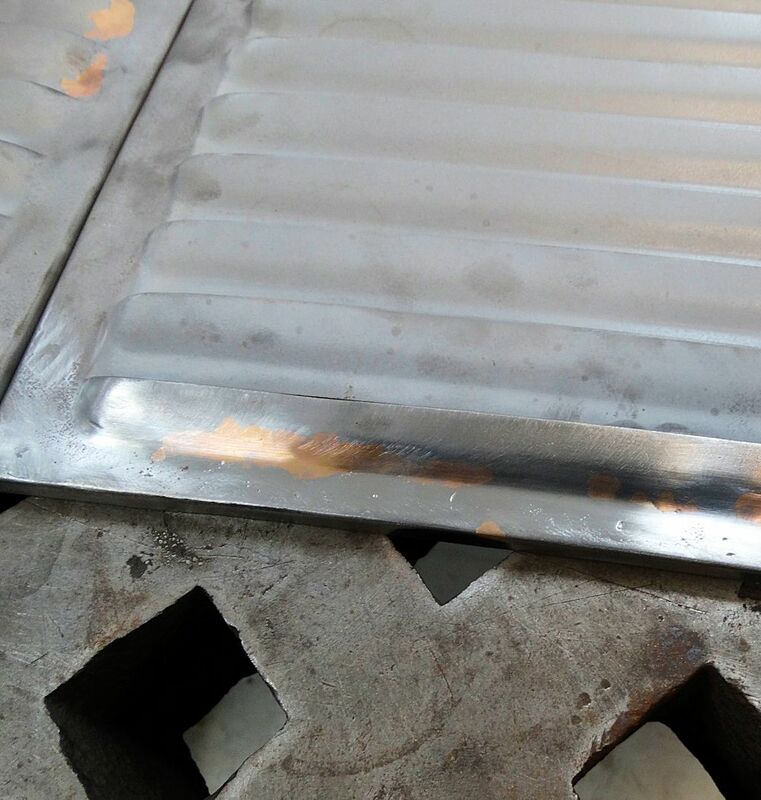 After making a test panel with our louver cutter on the Pullmax machine, I was able to repair the original louvers by copper backing them during the welding process. 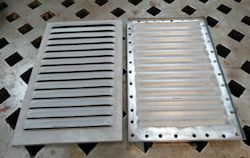 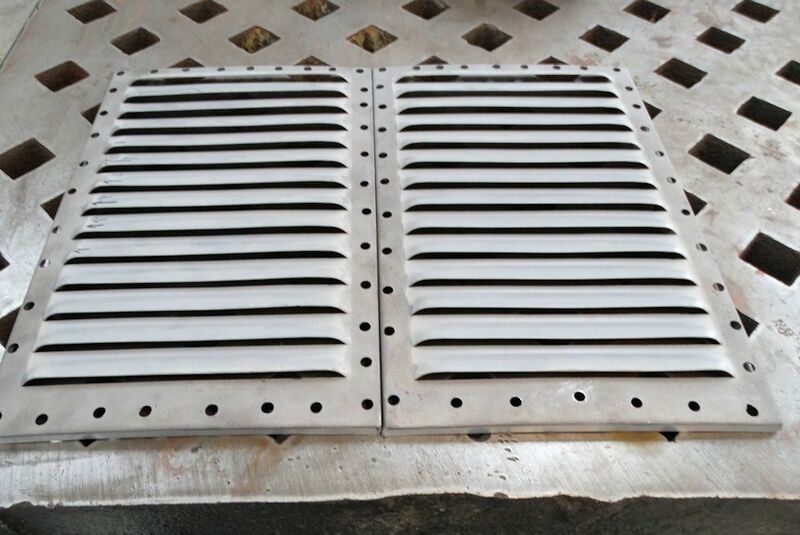 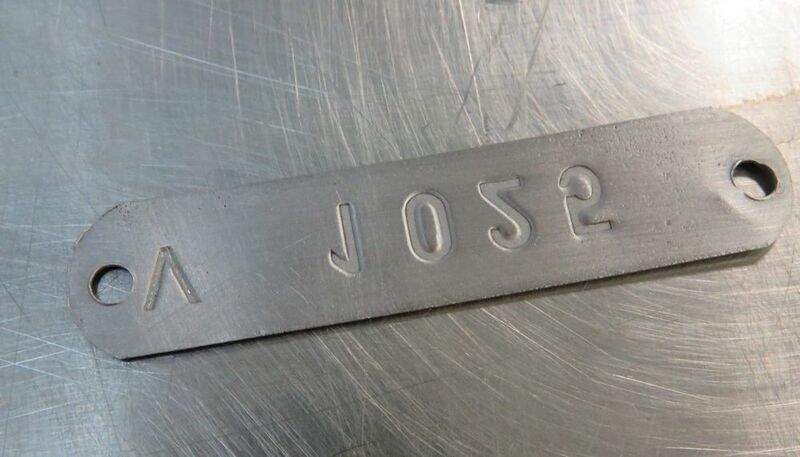 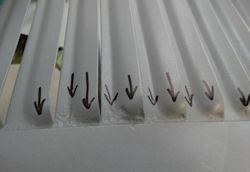 The louver cutter made a slightly less pronounced replica of the factory louvers so it backed the stamping perfectly. 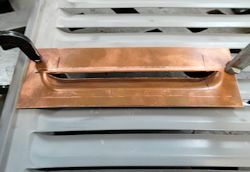 I lightly clamped the copper louver in place and used a silicon bronze rod to TIG weld up the pitted areas. 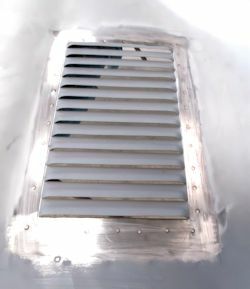 Repairing the louvers this way kept the original sheet metal intact and filled the missing and low areas with a less intrusive material. 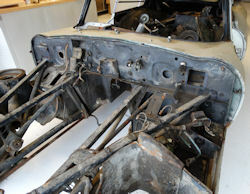 The follow sequence of photographs show some of the challenges we have restoring the original outside latch bonnet. 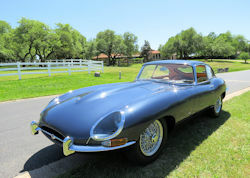 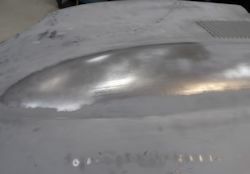 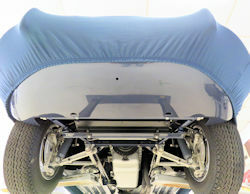 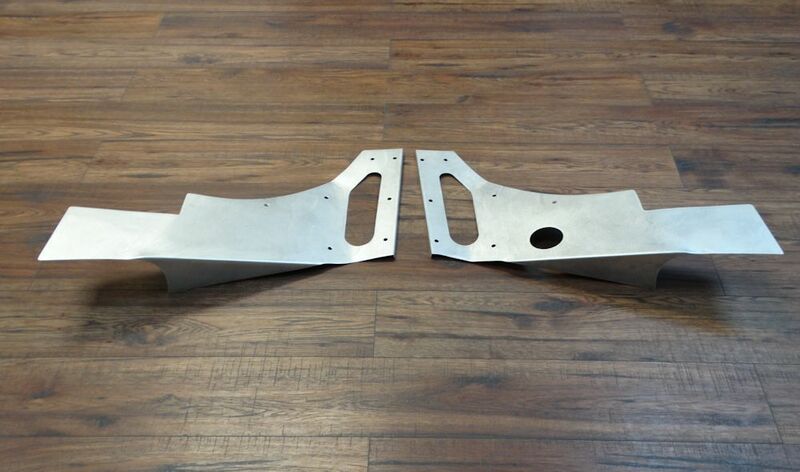 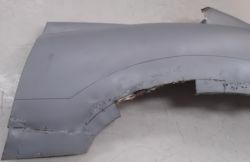 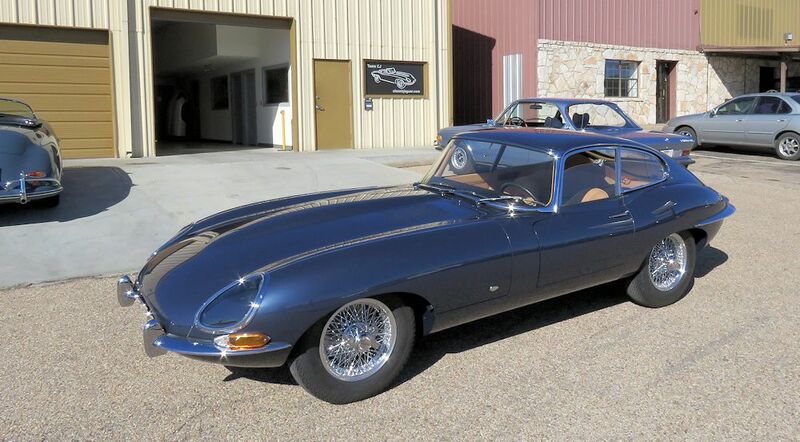 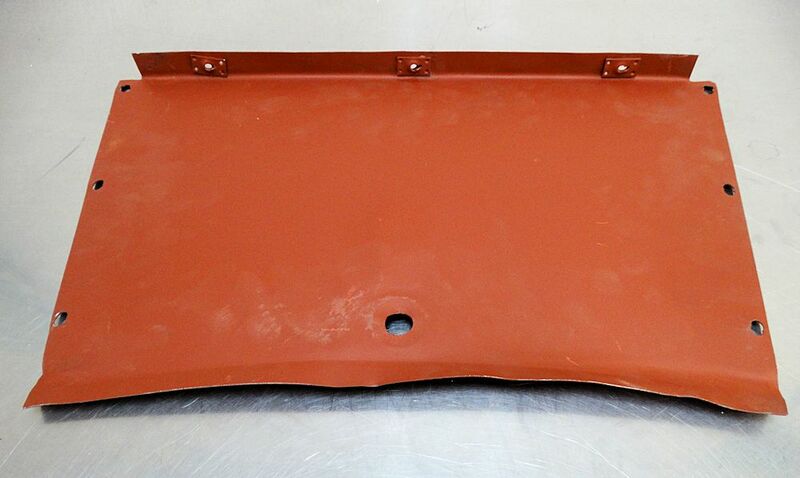 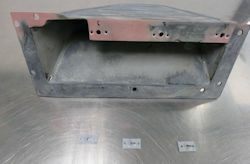 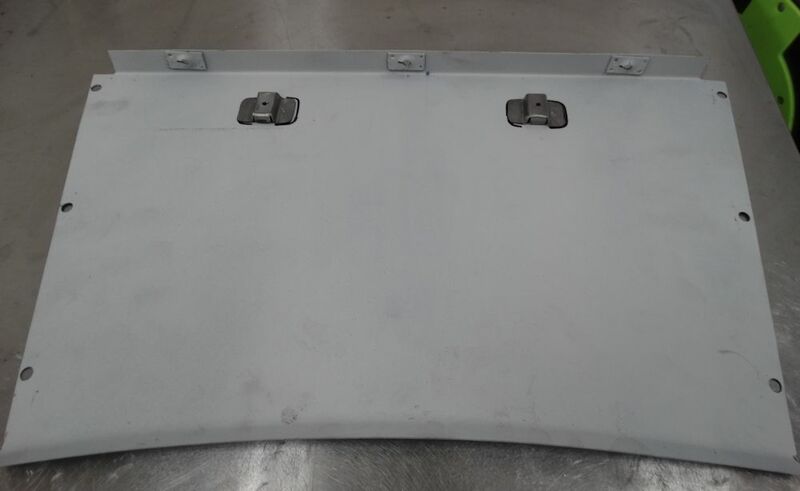 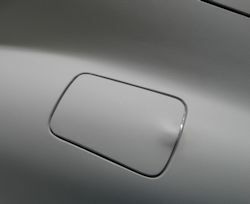 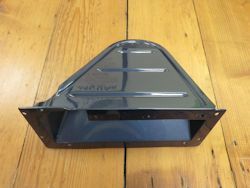 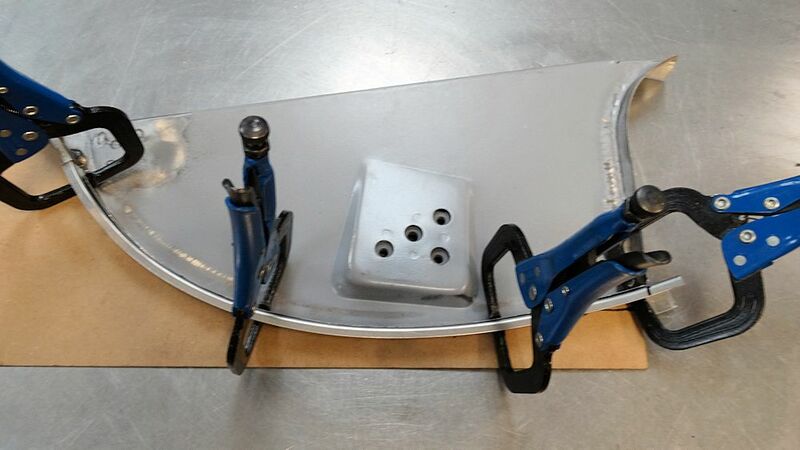 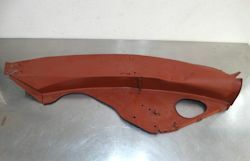 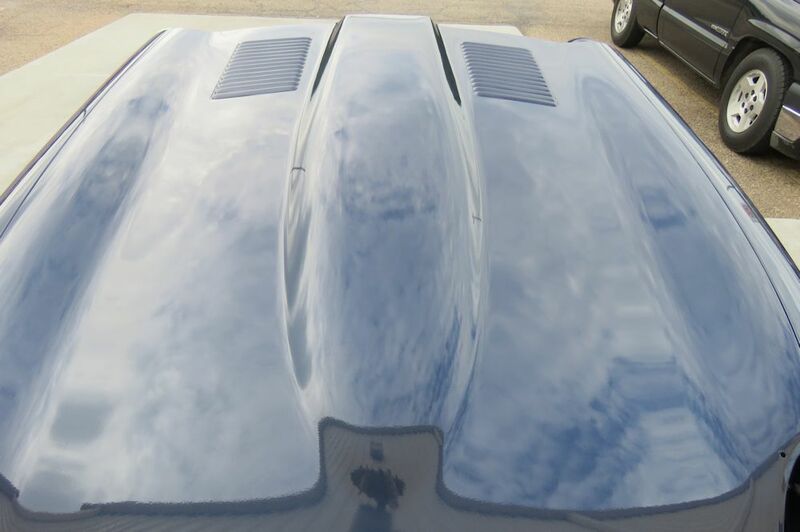 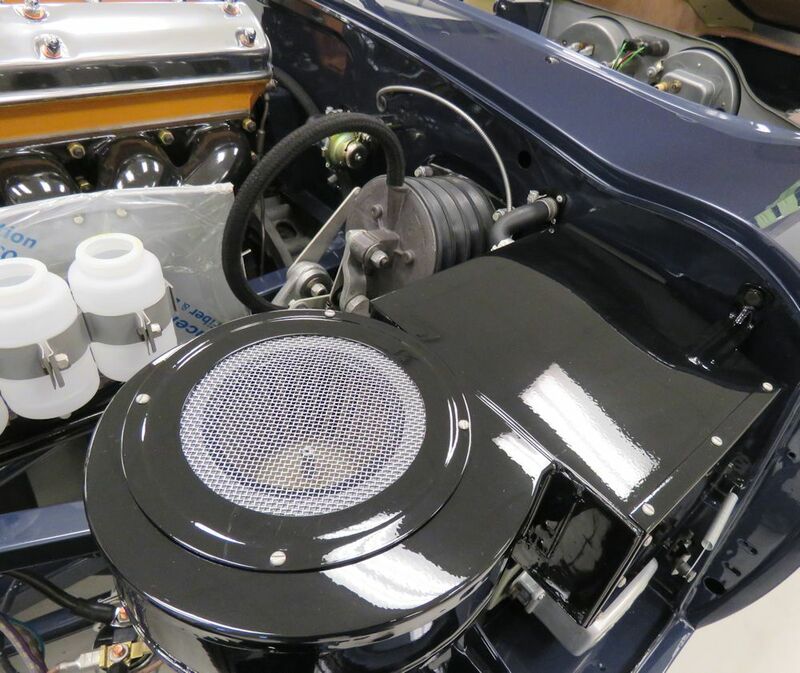 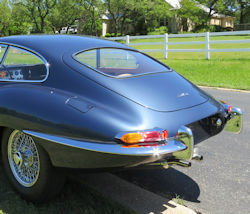 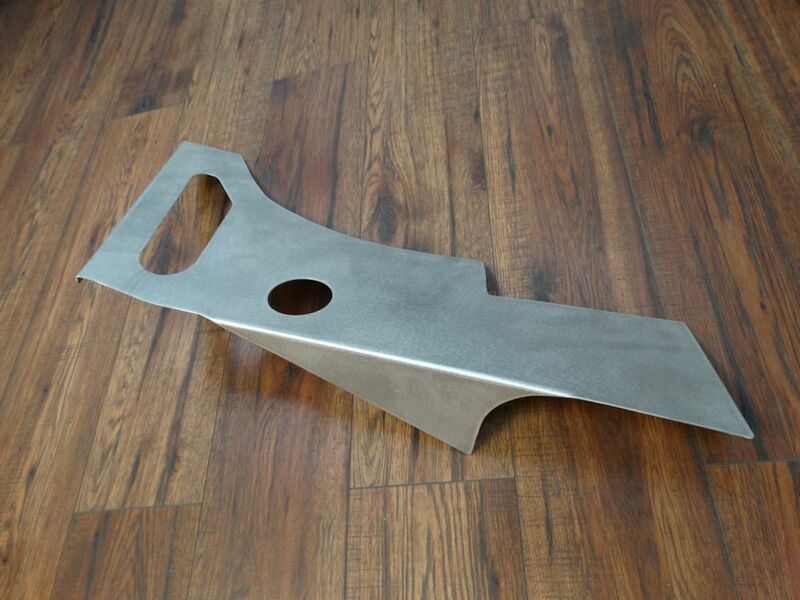 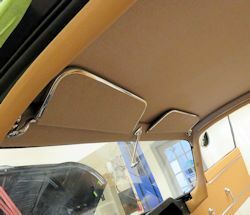 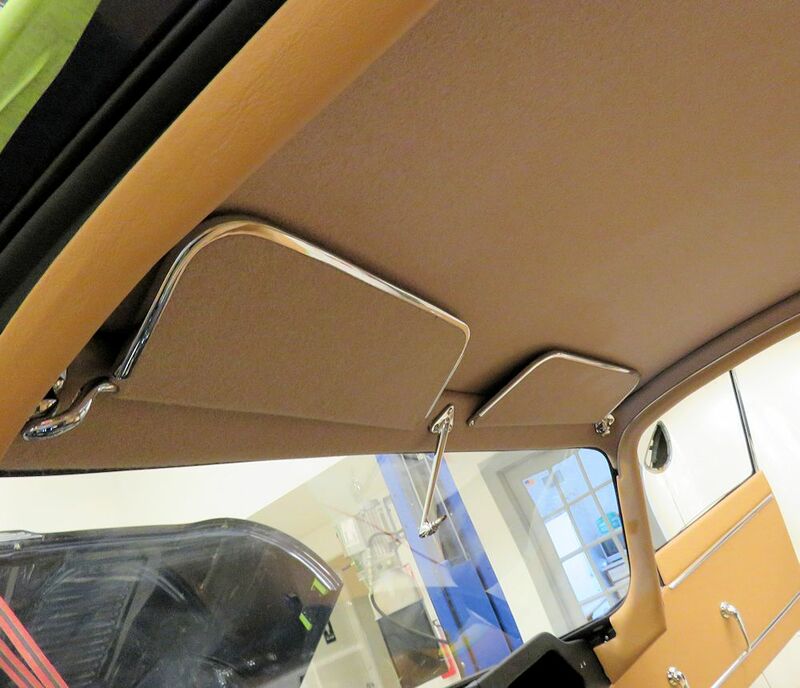 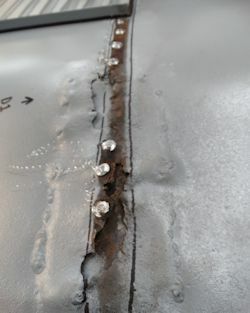 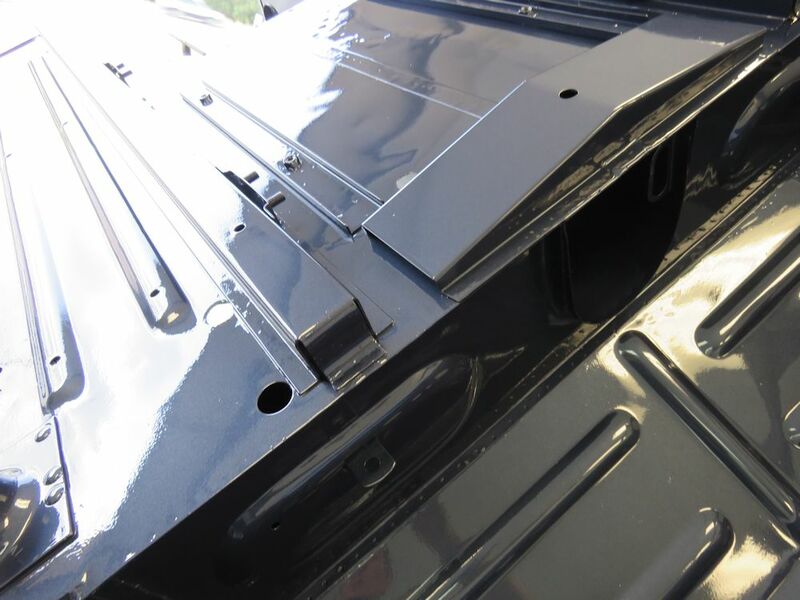 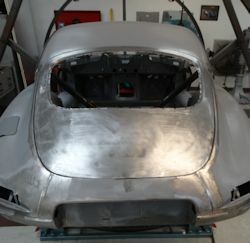 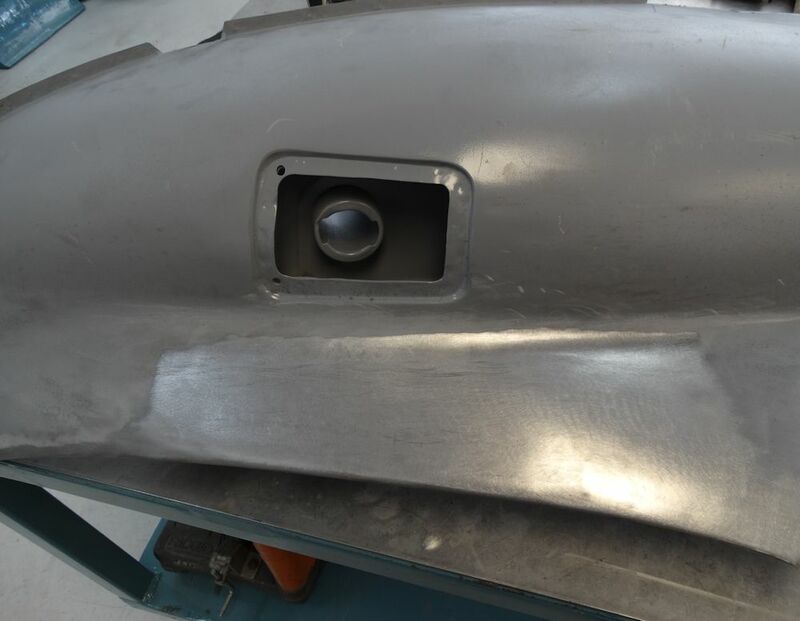 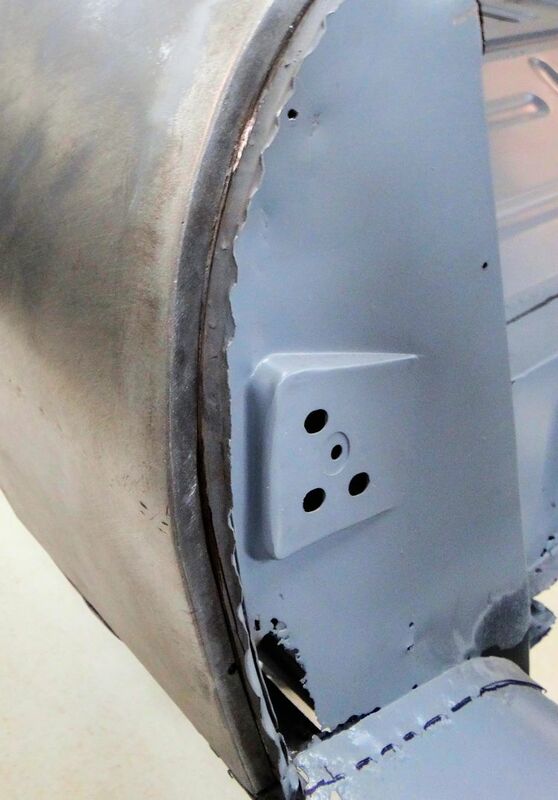 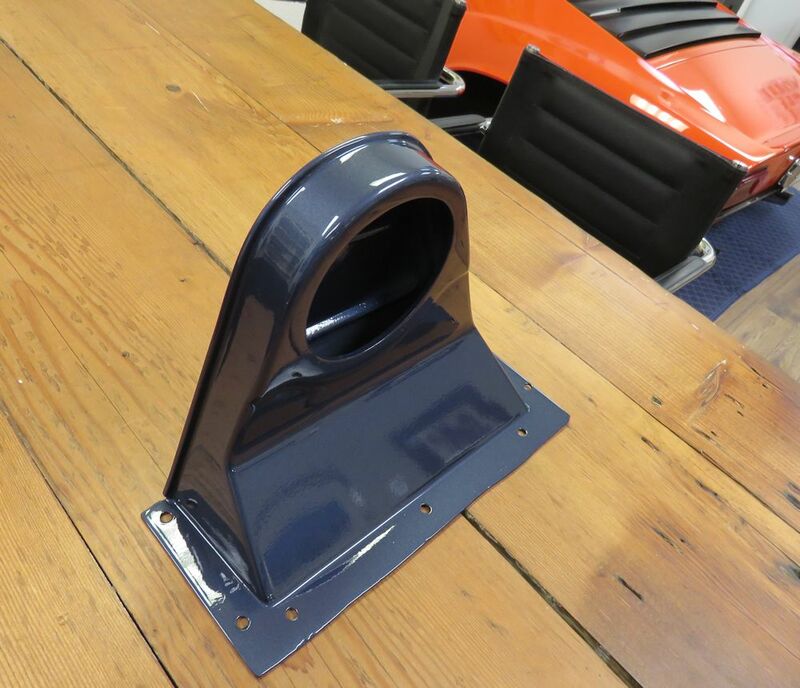 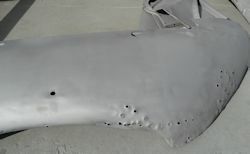 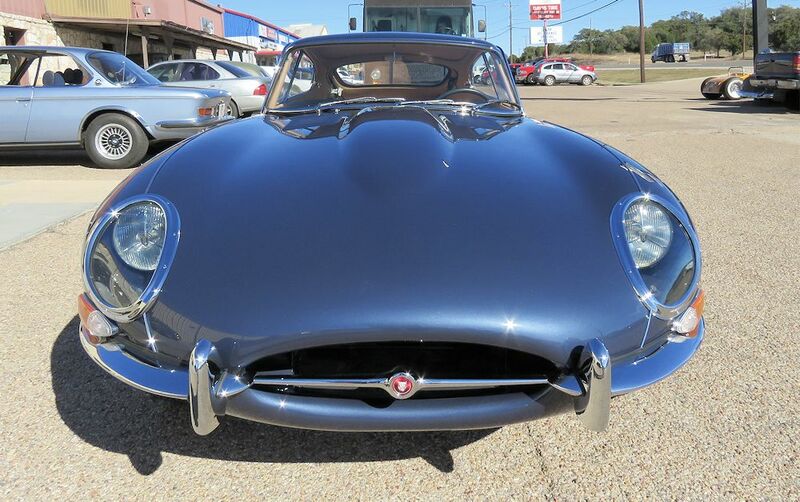 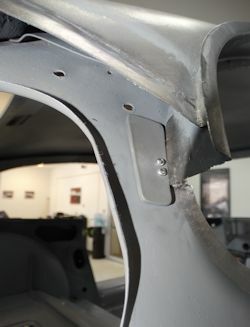 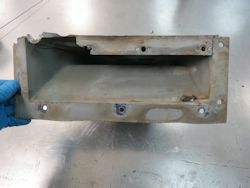 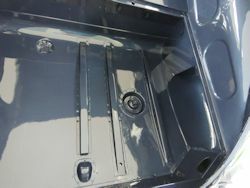 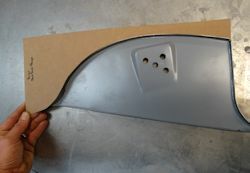 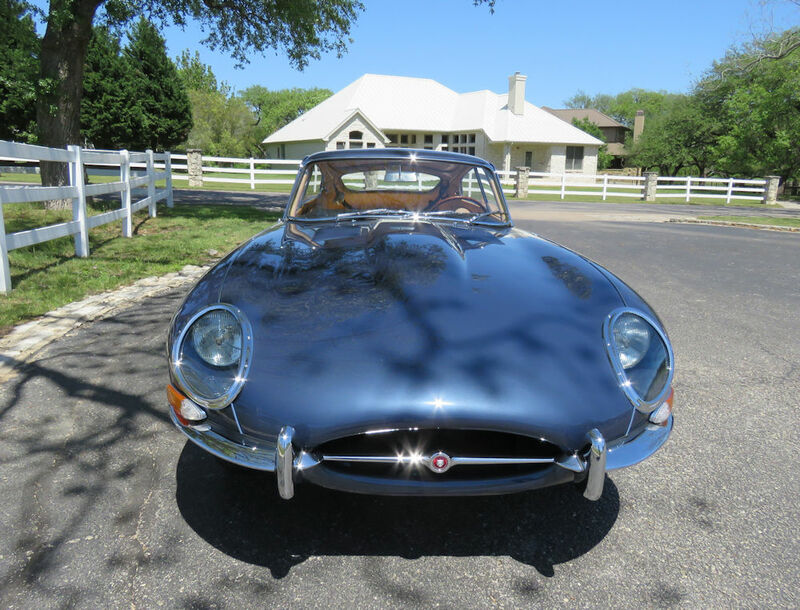 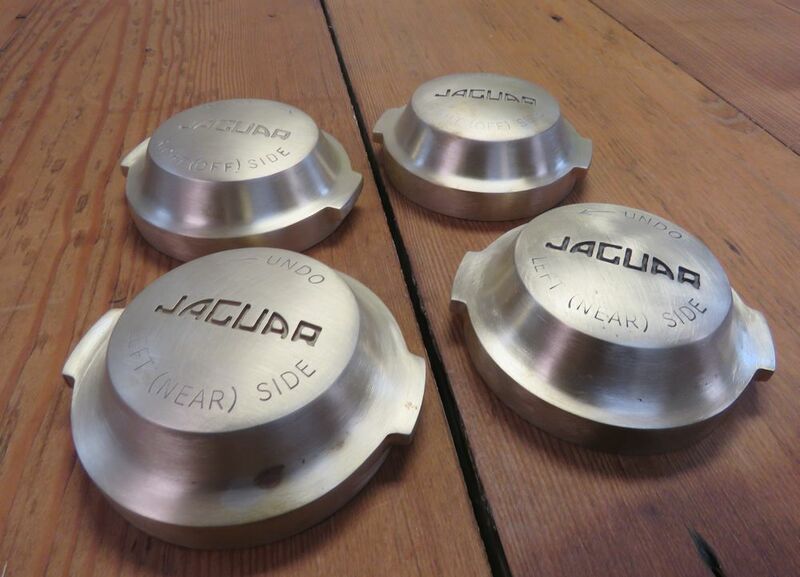 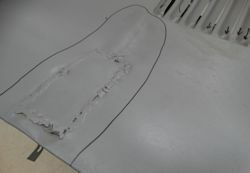 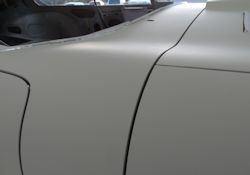 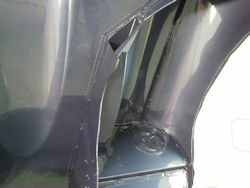 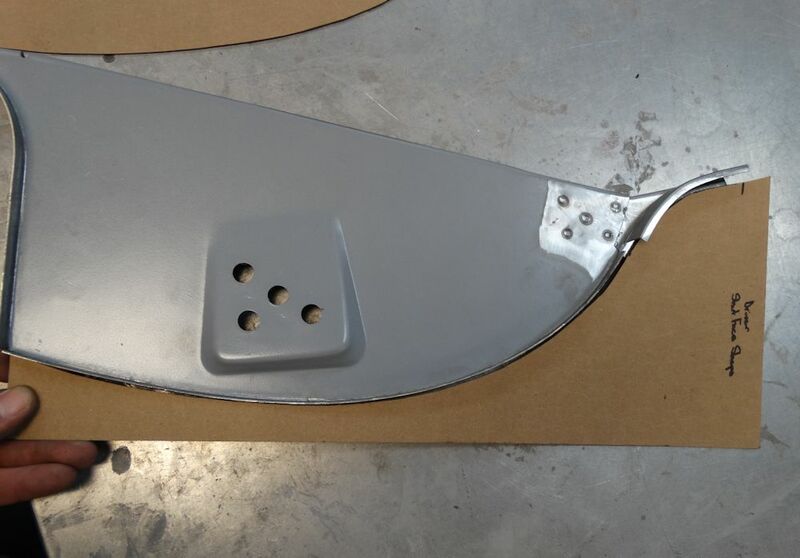 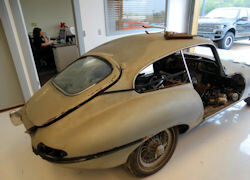 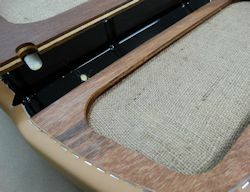 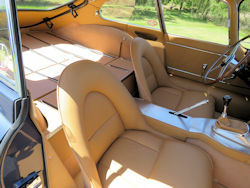 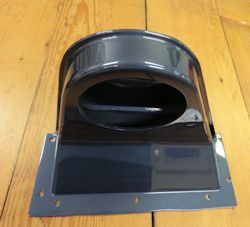 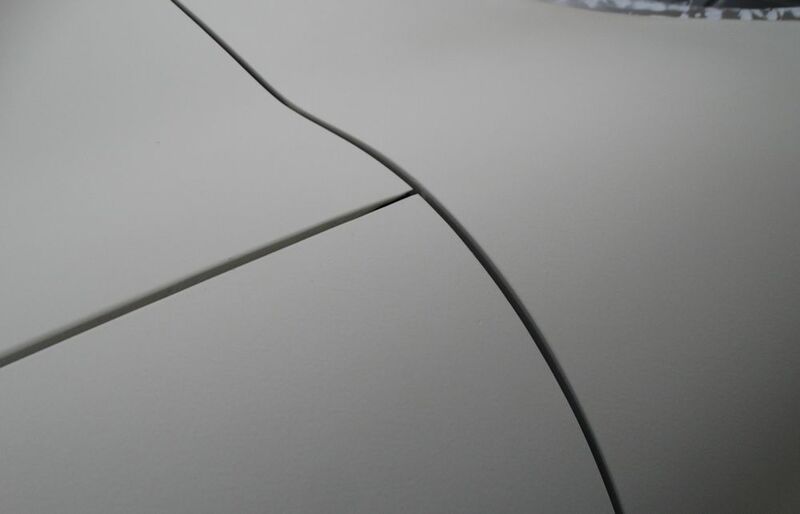 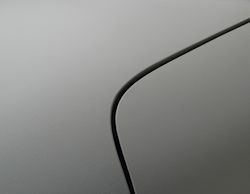 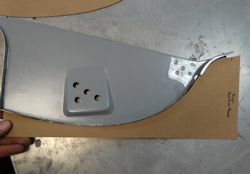 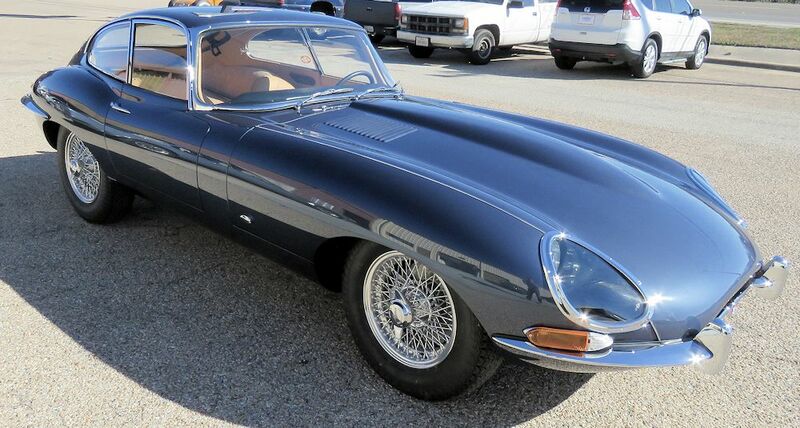 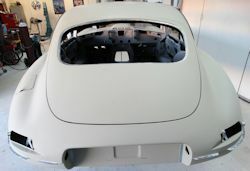 For any other E Type, we would simply supply a new bonnet and modify it to look like an outside latch unit. 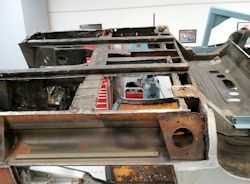 However, as we believe 885013 may be one of only three LHD outside latch coupes that still has its original bonnet, we think it is worth the extra time and effort to save as much of the original sheet metal as possible. 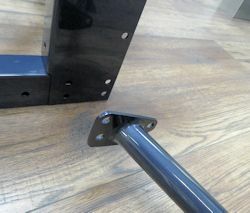 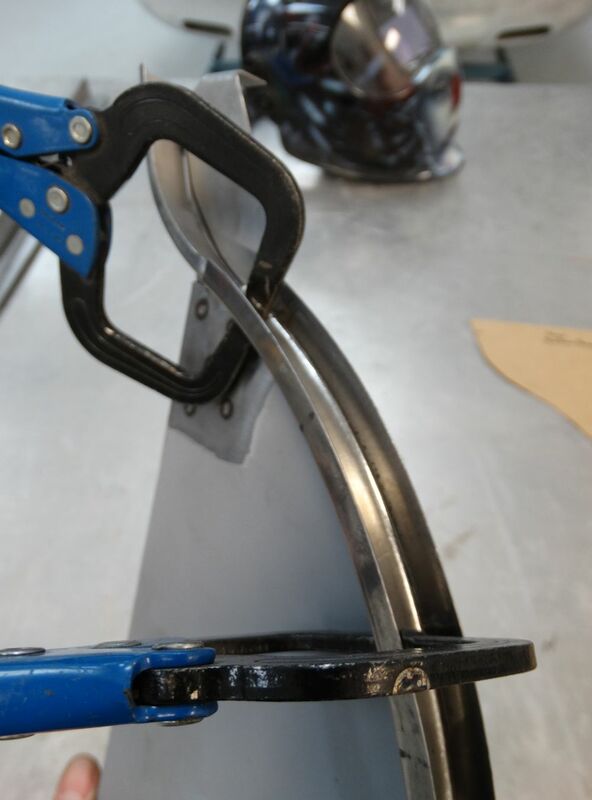 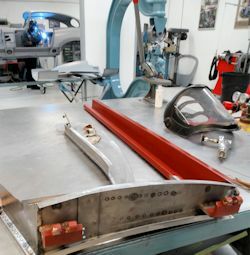 Matt has removed the main body from the roller-hoop jig for installation on a roll-around frame jig. The hoops conjure up thoughts of Stargate Atlantis and the E Type emerging on the other side of the gate in the year 1961.. 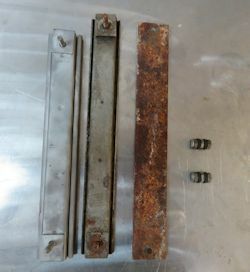 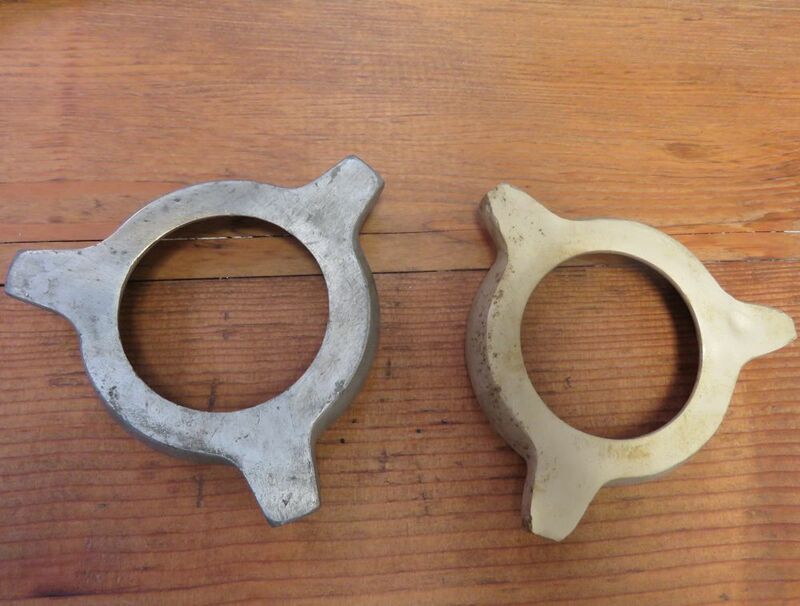 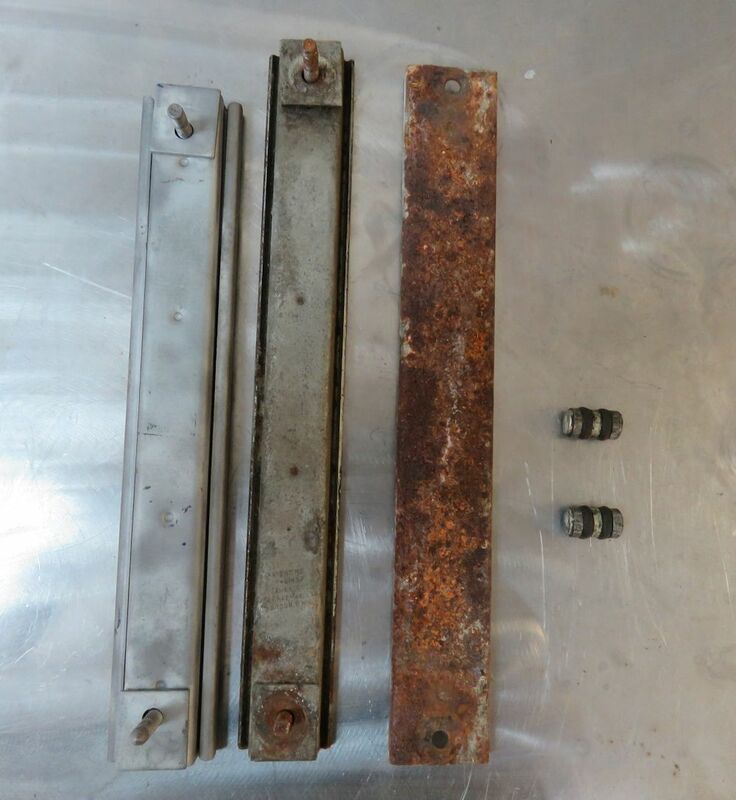 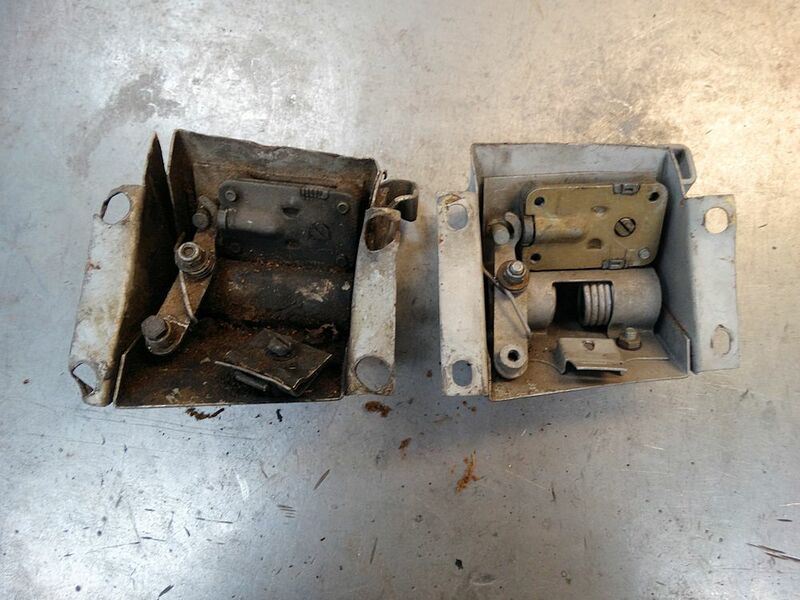 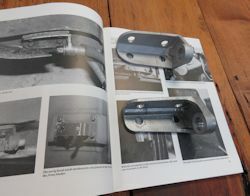 Interesting to note the many differences between the very early type of hatch door latch and one from just a year later in the E Type production cycle. 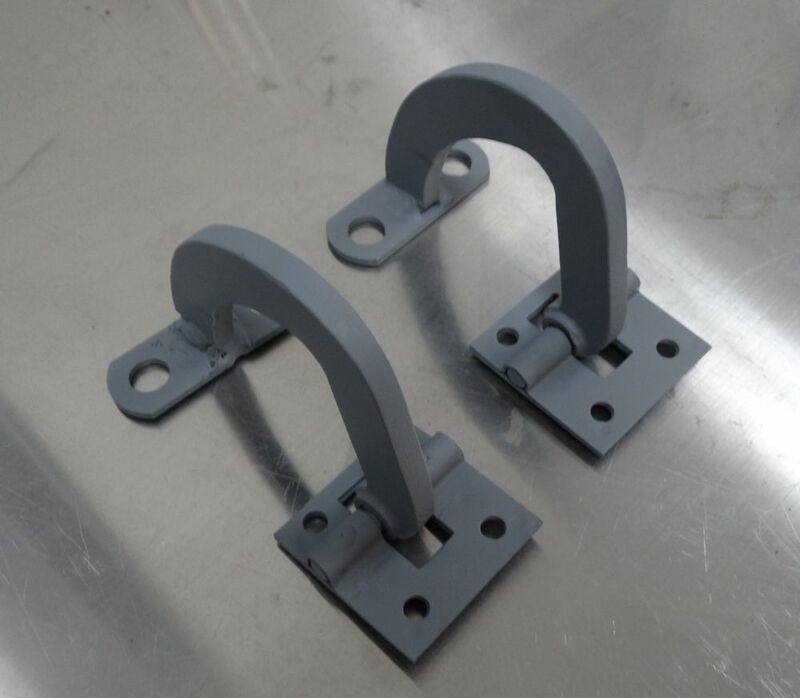 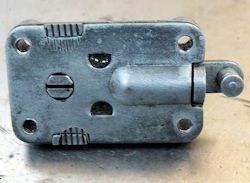 In the photographs below, the later style latch is the freshly plated unit. 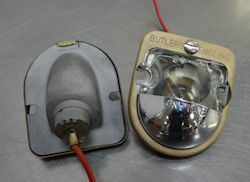 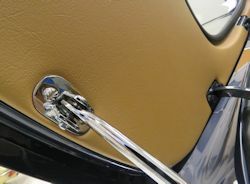 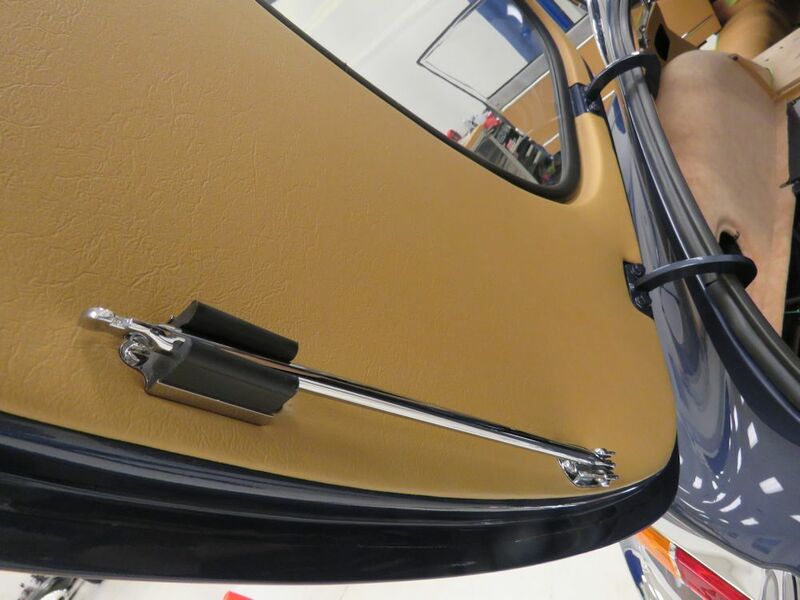 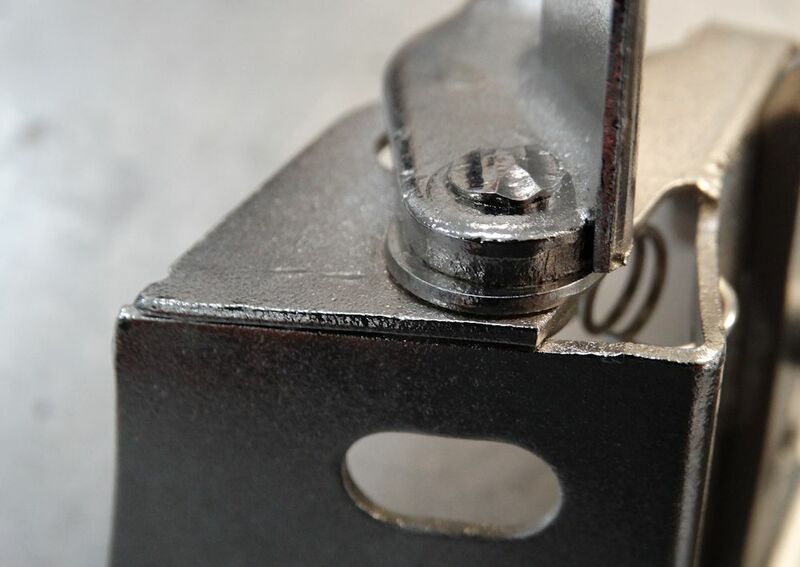 The following sequence of photos highlight some of the differences between the very early production, 'hand made' tailgate latch fitted to 885013, and the mass produced version used on virtually all regular production coupes. 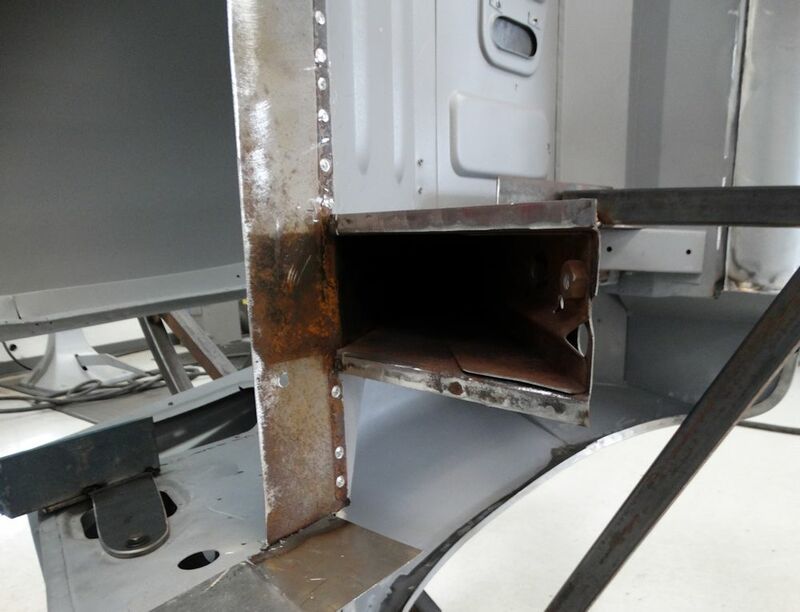 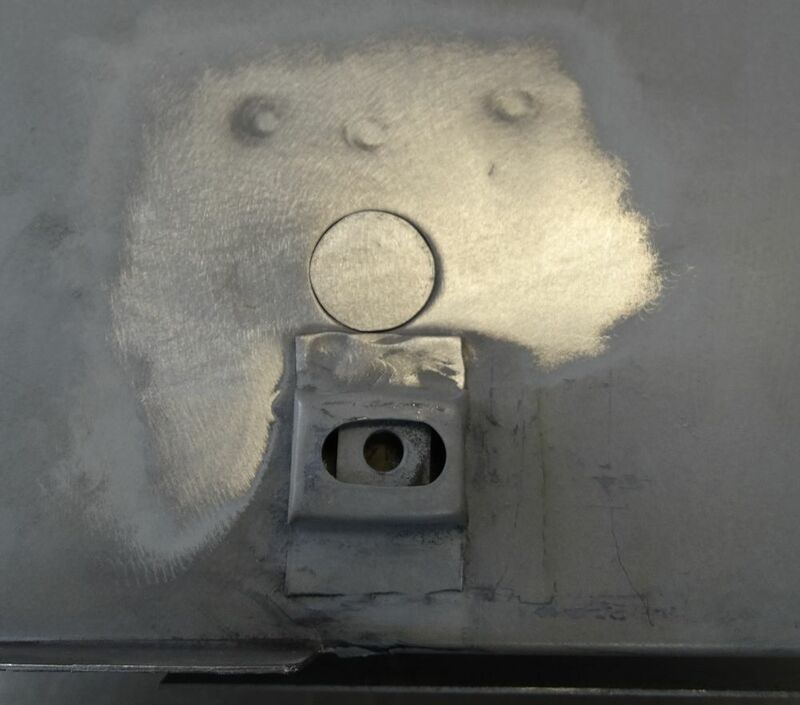 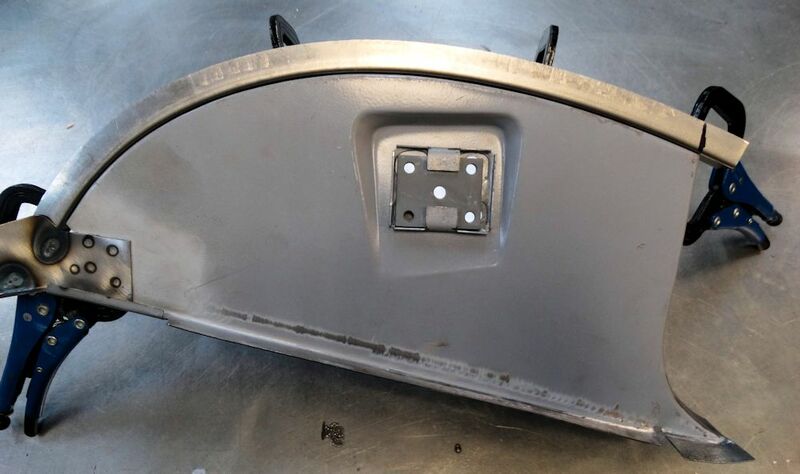 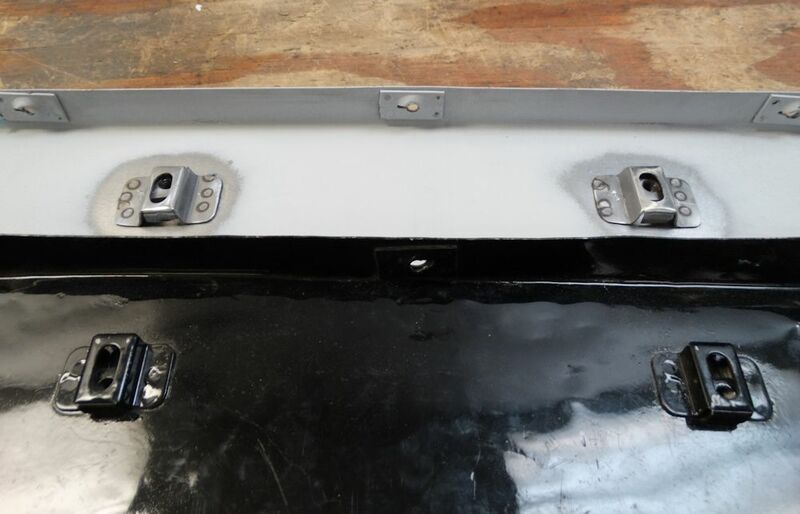 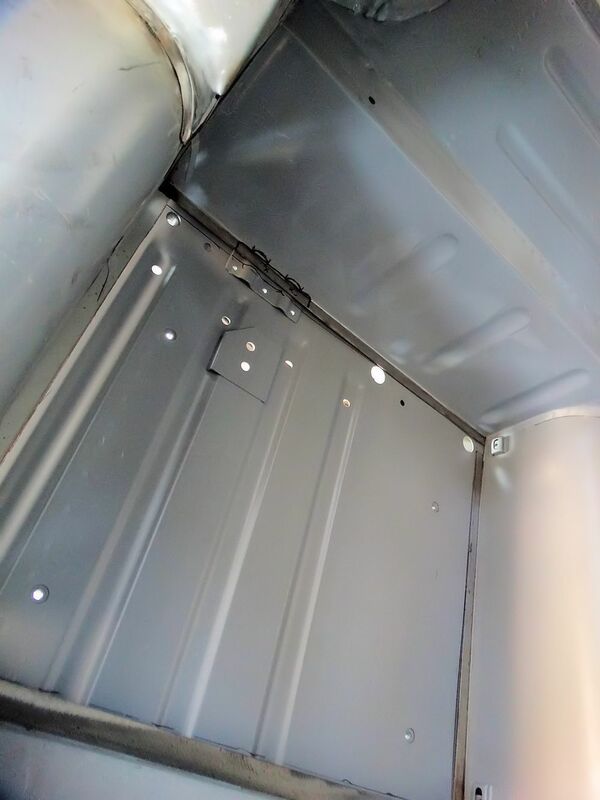 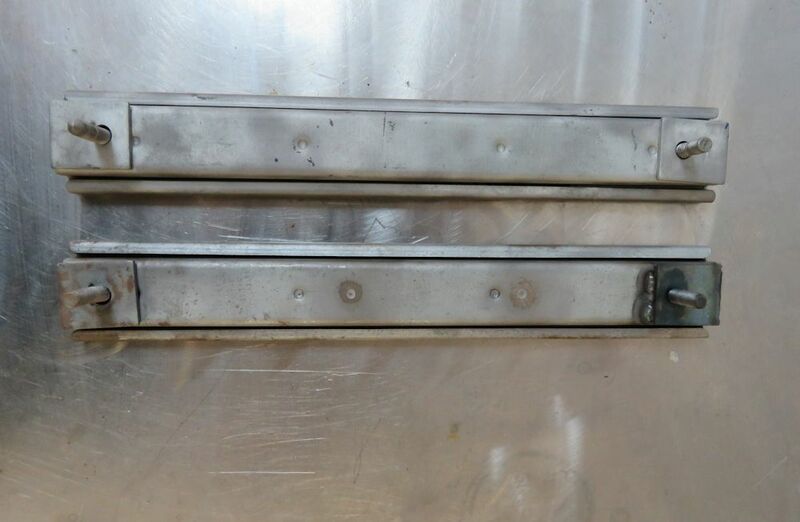 There are quite a few differences between the very early tailgates and later production items, so it was important that we repaired, rather than replaced, the hatch door for 885013. 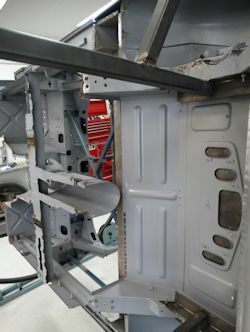 Huge progress in the CJ Coachworks over the last few weeks. 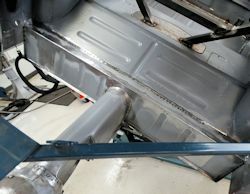 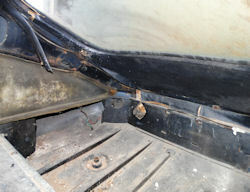 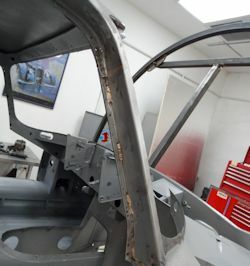 Rust proofing inner sill box sections and installing new outer sill panels. Installing the new outer sills and trial fitting new floors.. 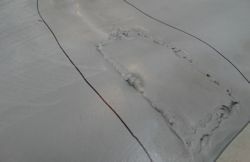 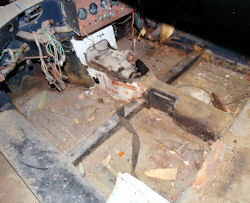 Removing what is left of the old floors with a plasma cutter, repairing the transmission tunnel.. 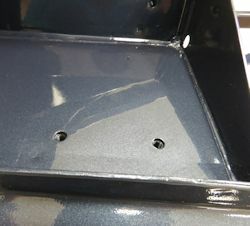 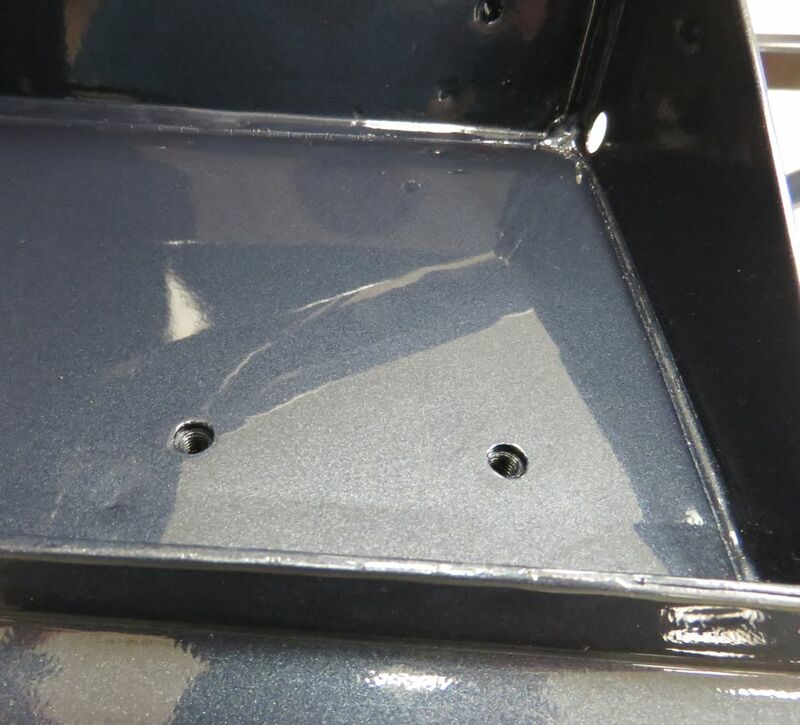 The new boot floor and lower quarters have now been welded in place, and Matt has also corrected the shape of the rear wheel arches. 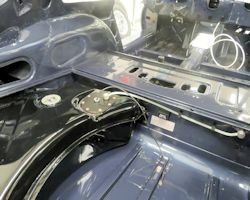 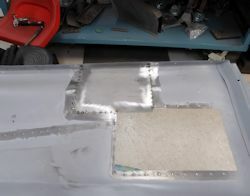 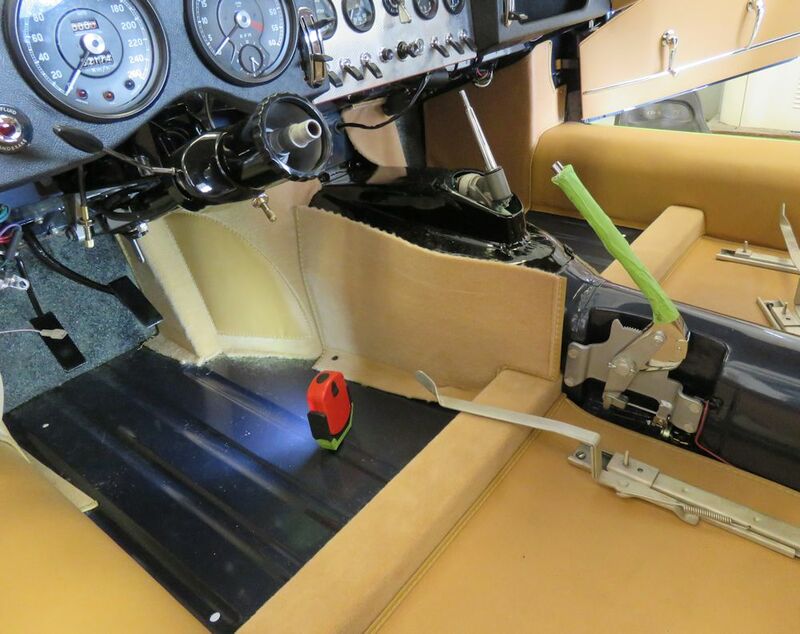 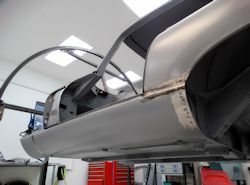 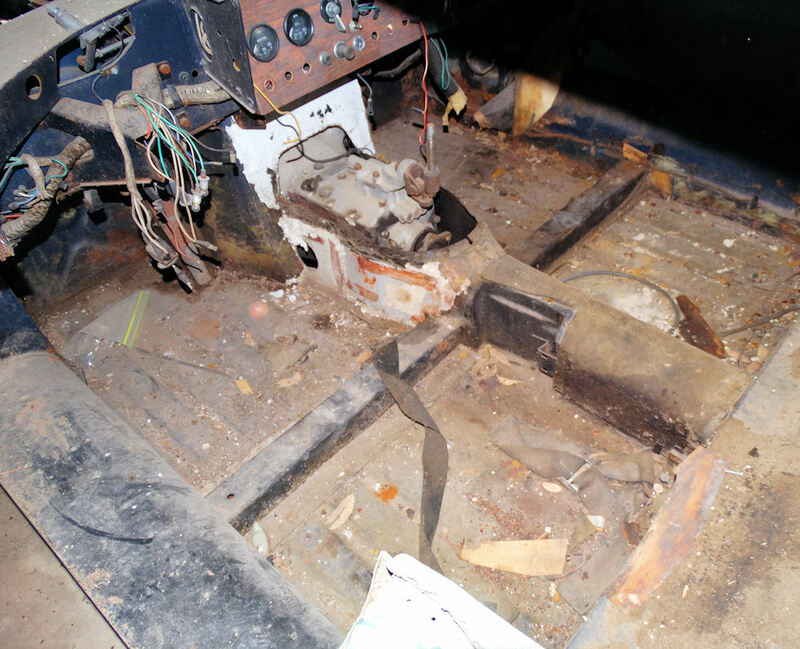 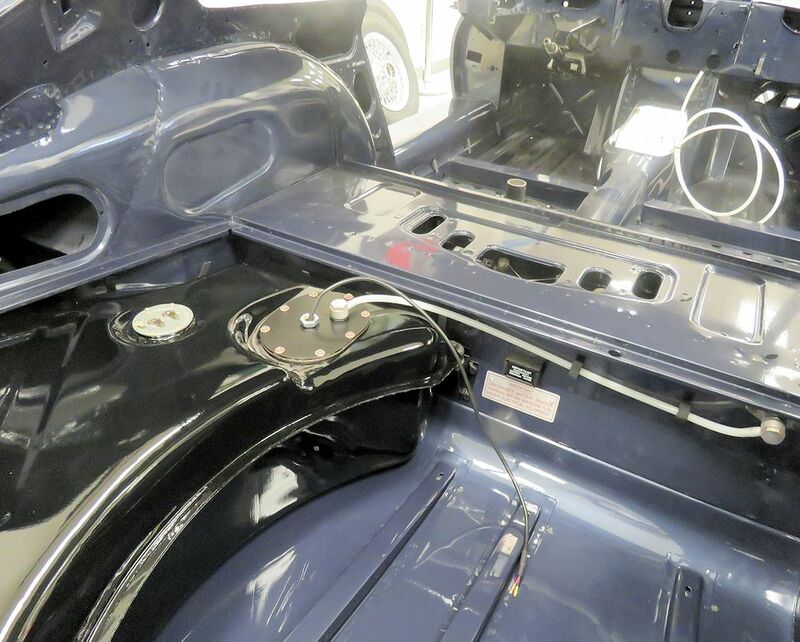 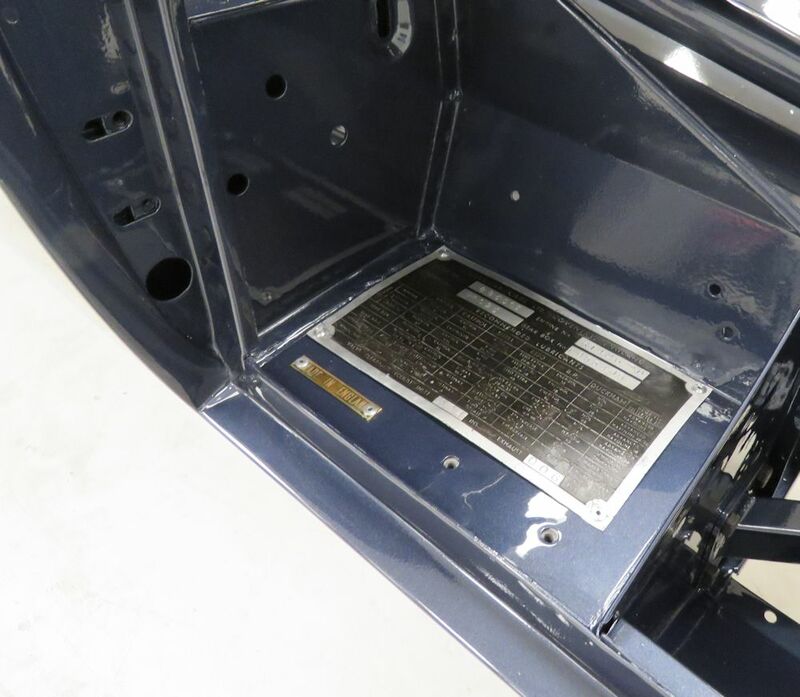 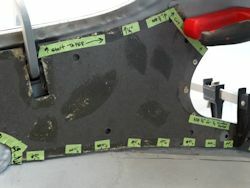 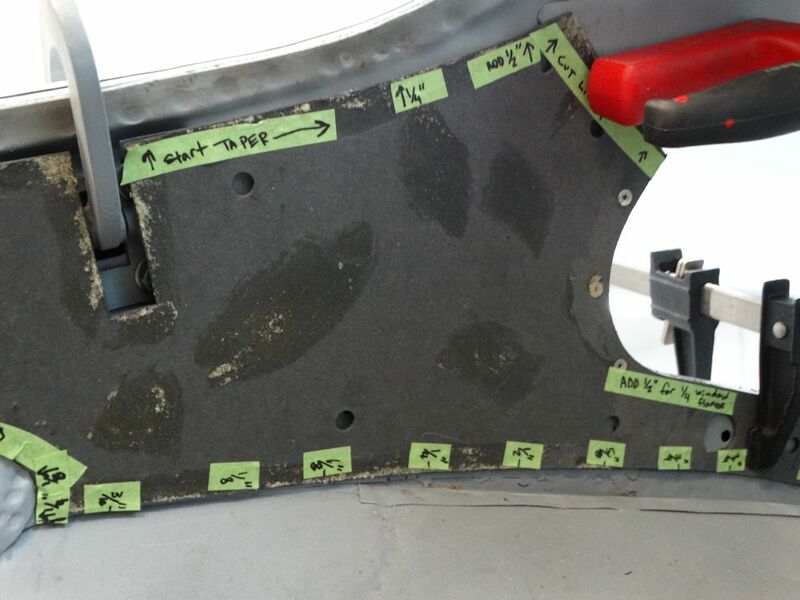 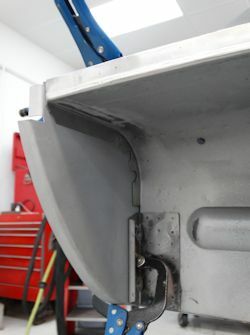 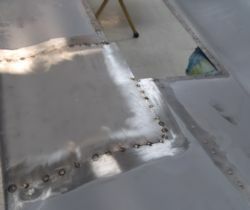 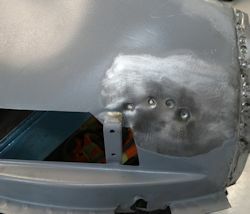 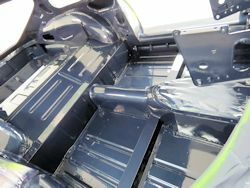 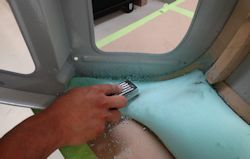 Matt has been busy replacing the boot floor and lower quarter panels.. 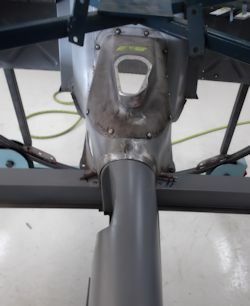 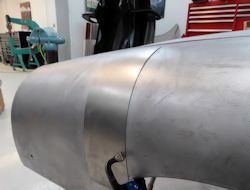 The right hand rear quarter panel has now been repaired and installed..
Matt has been making great progress with the RH rear quarter and B pillar repairs. He is almost to a point where the second quarter panel can be permanently installed . 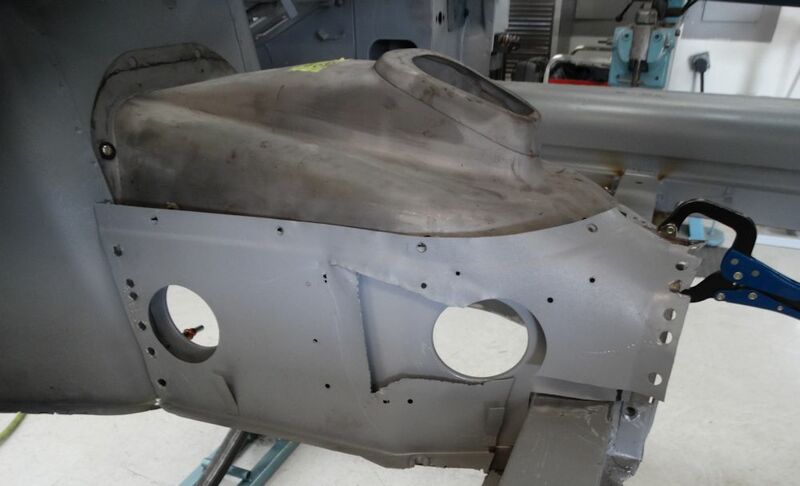 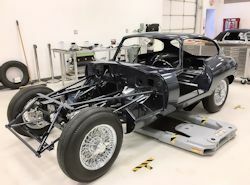 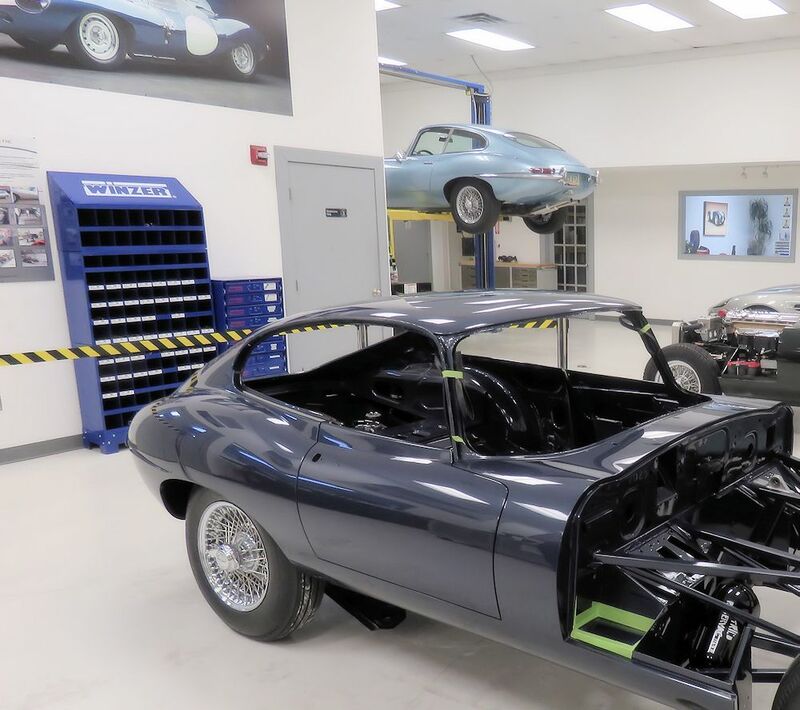 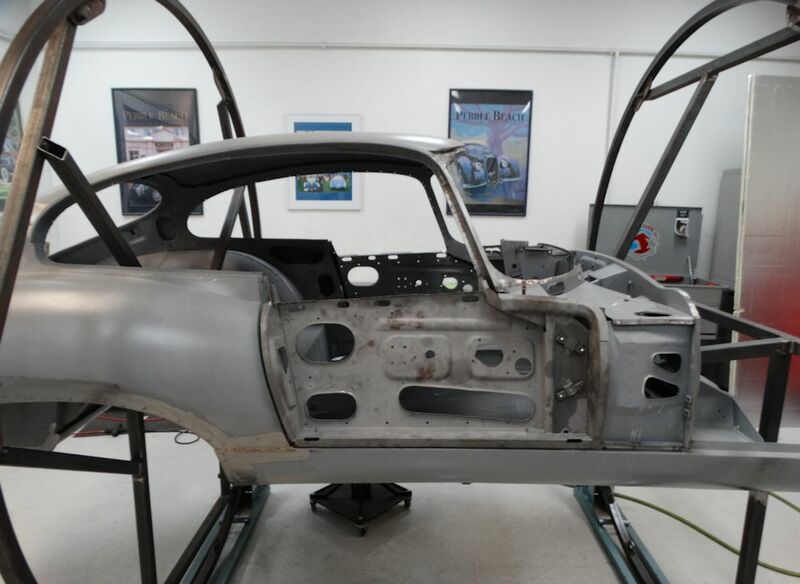 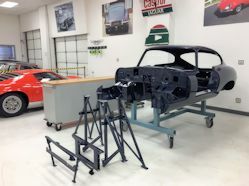 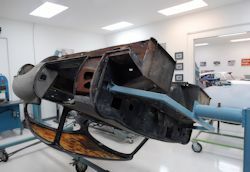 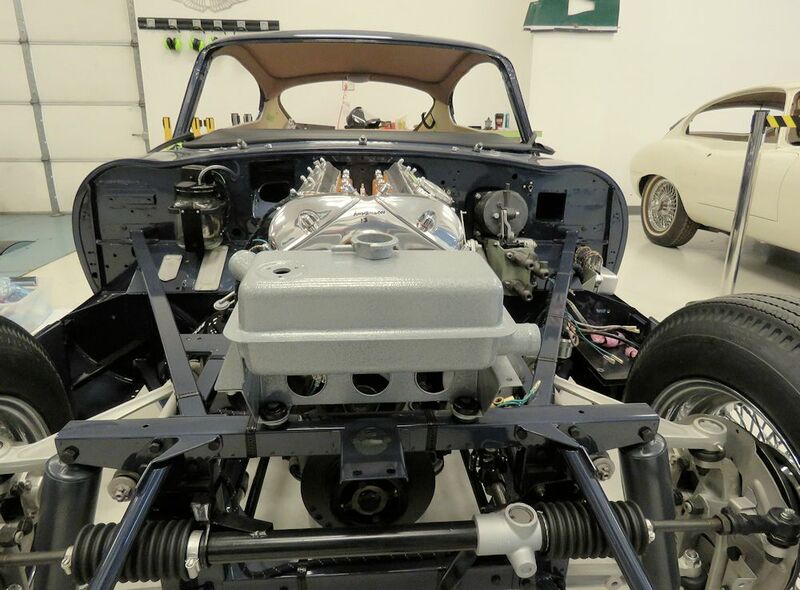 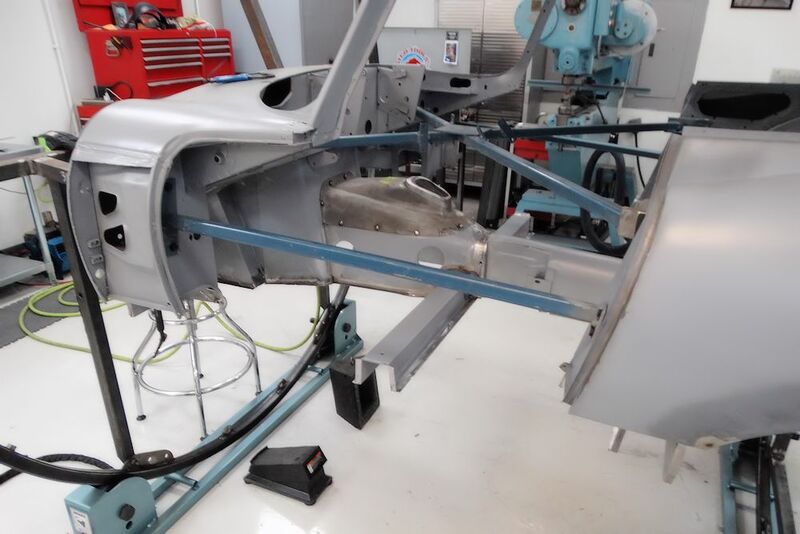 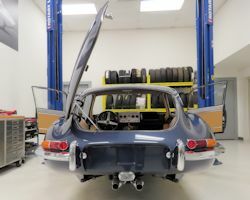 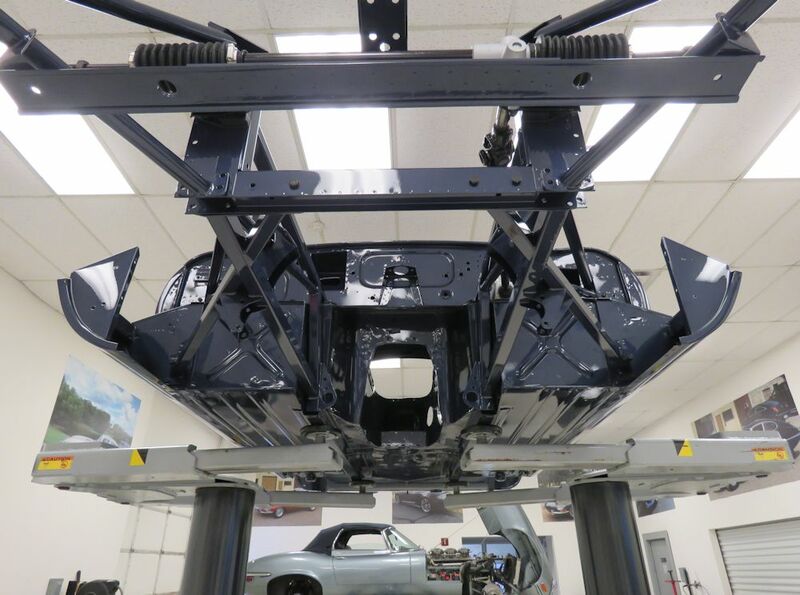 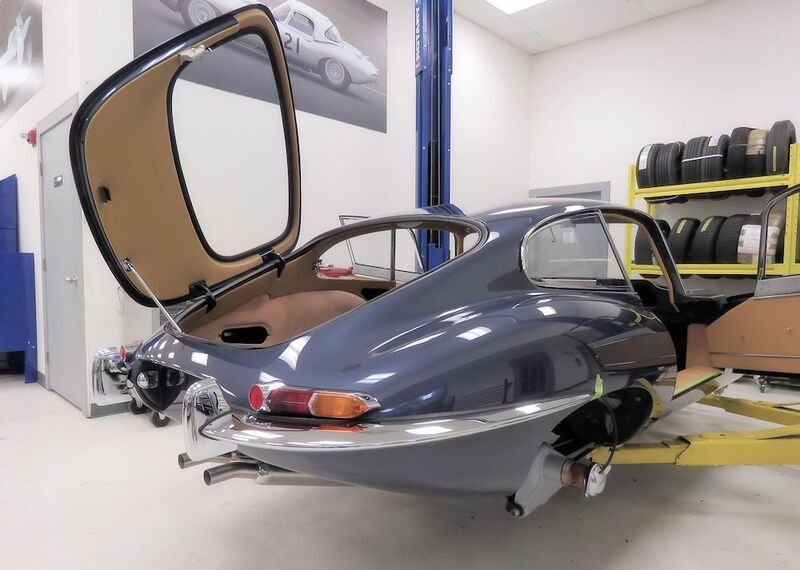 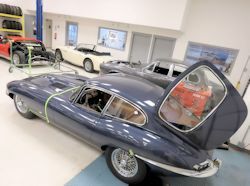 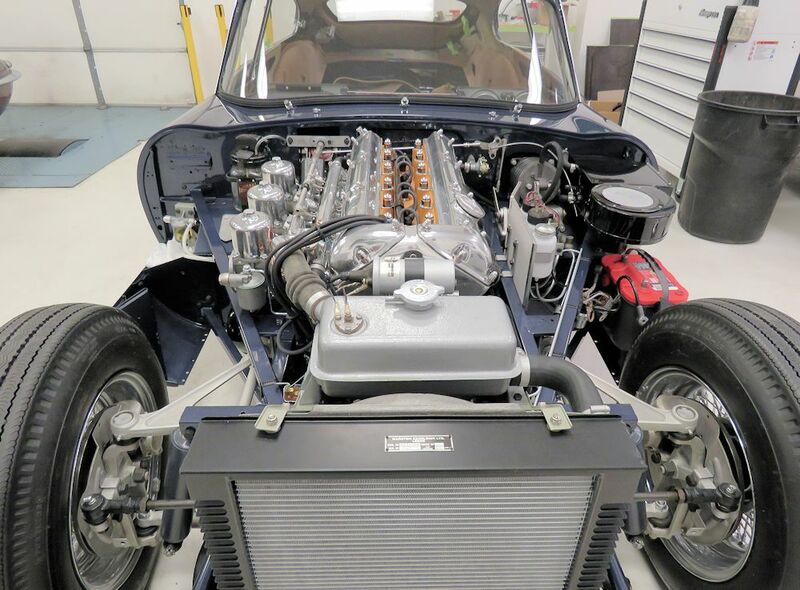 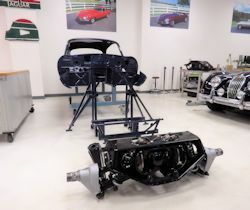 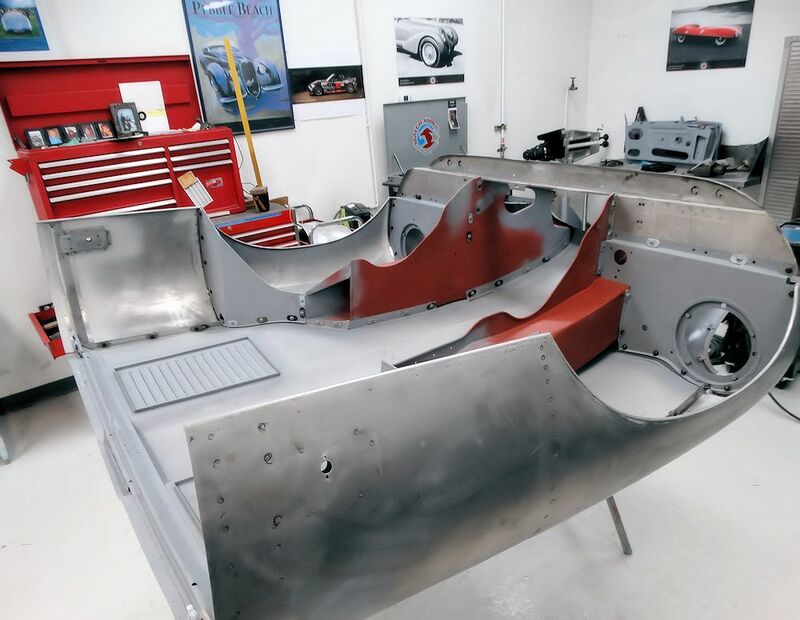 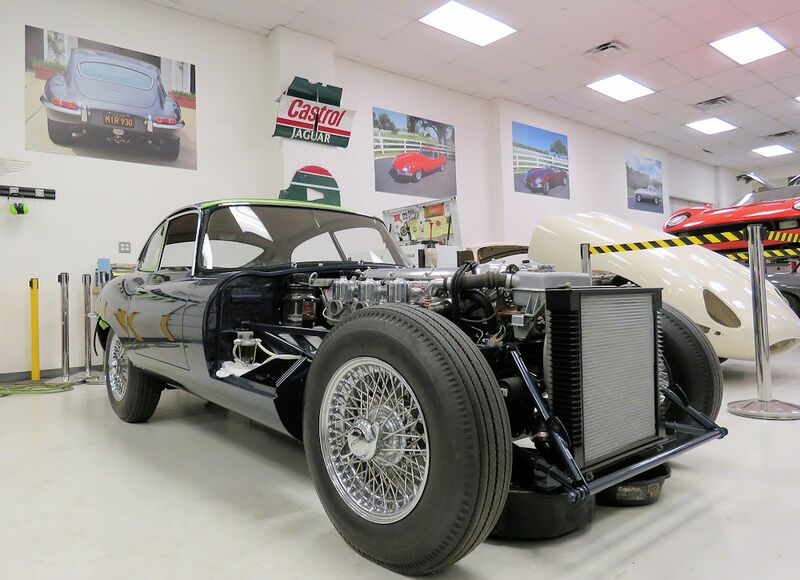 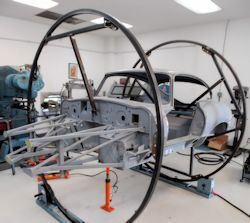 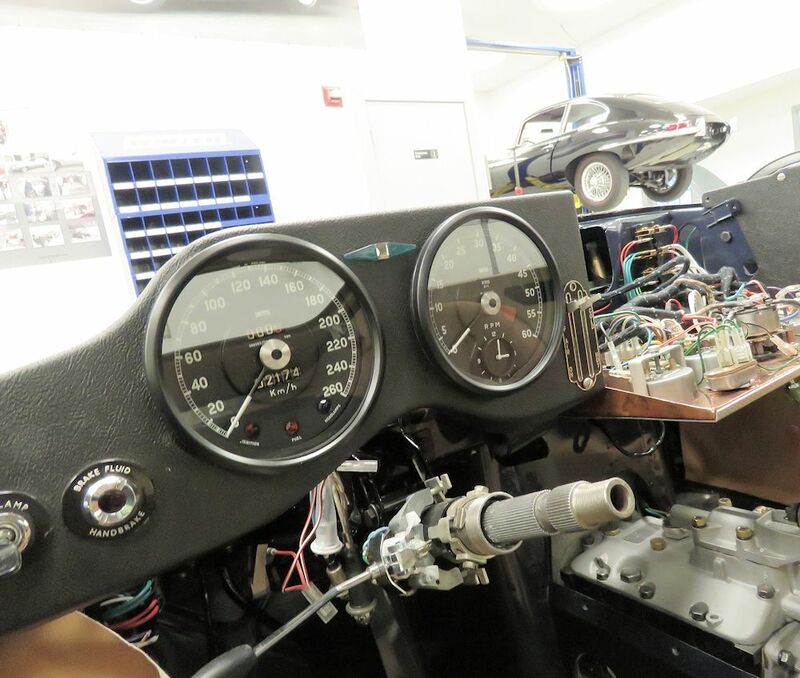 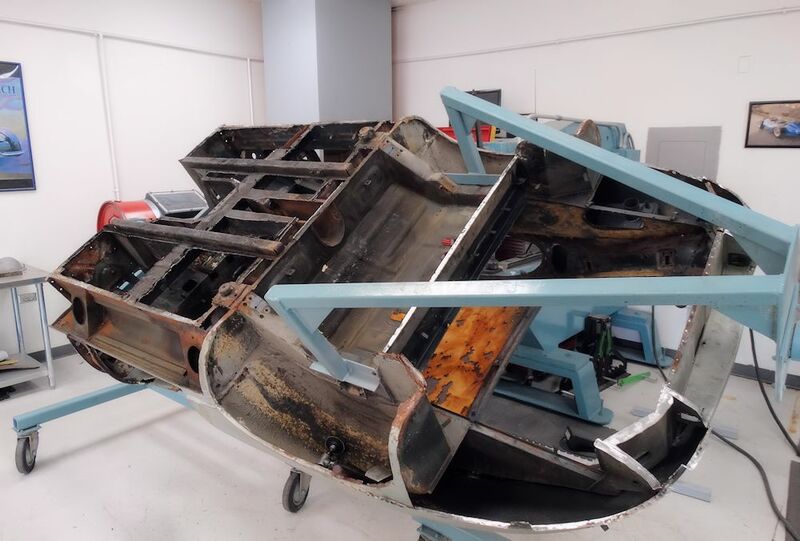 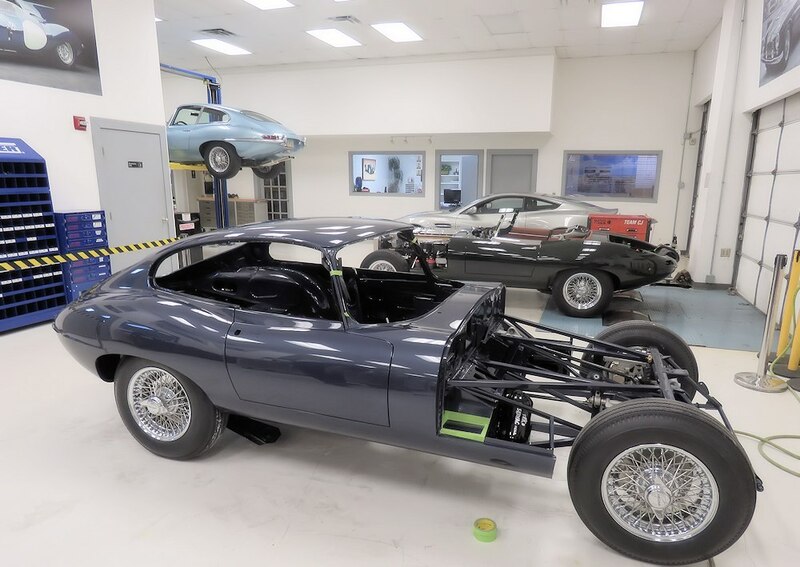 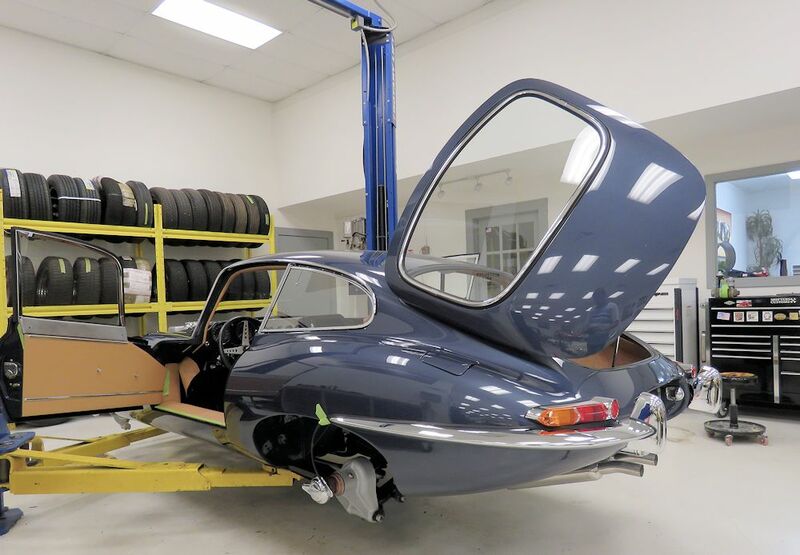 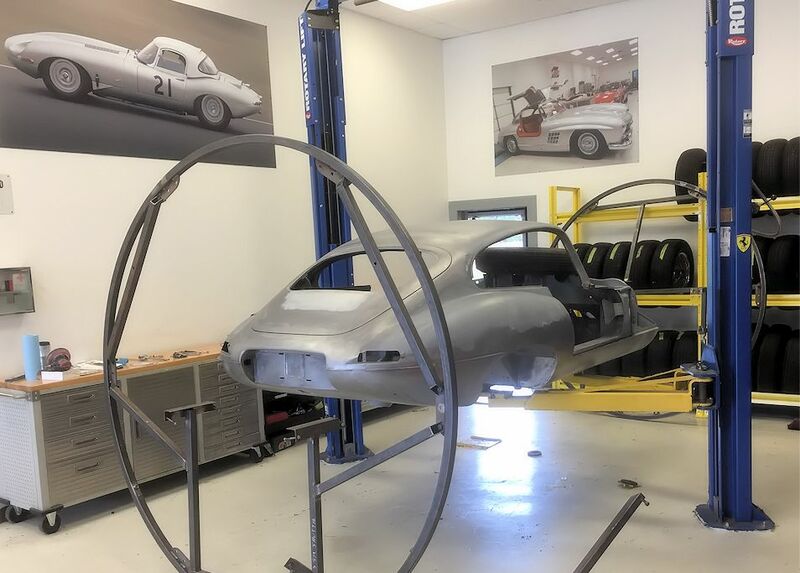 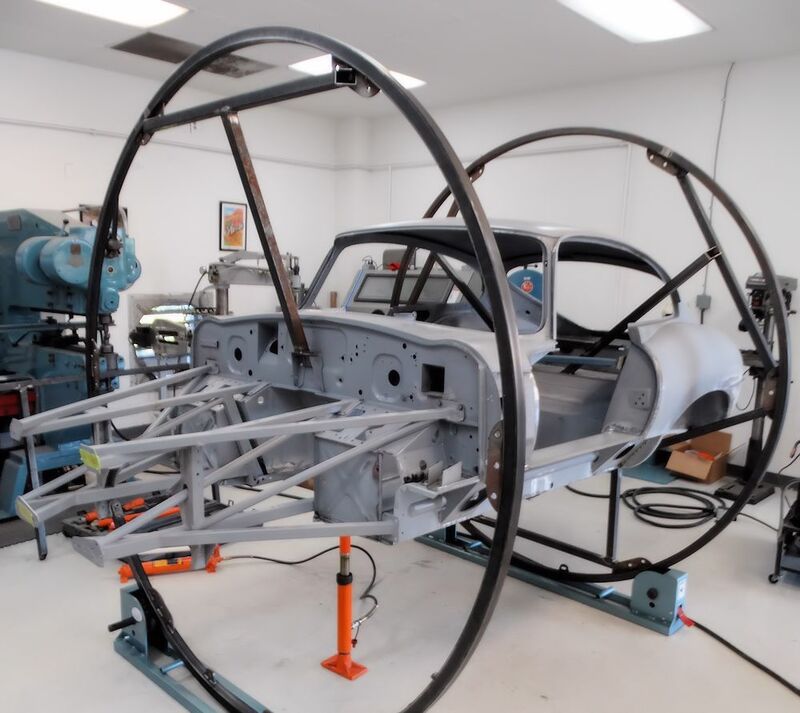 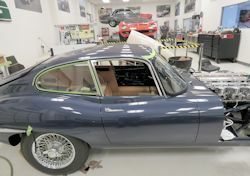 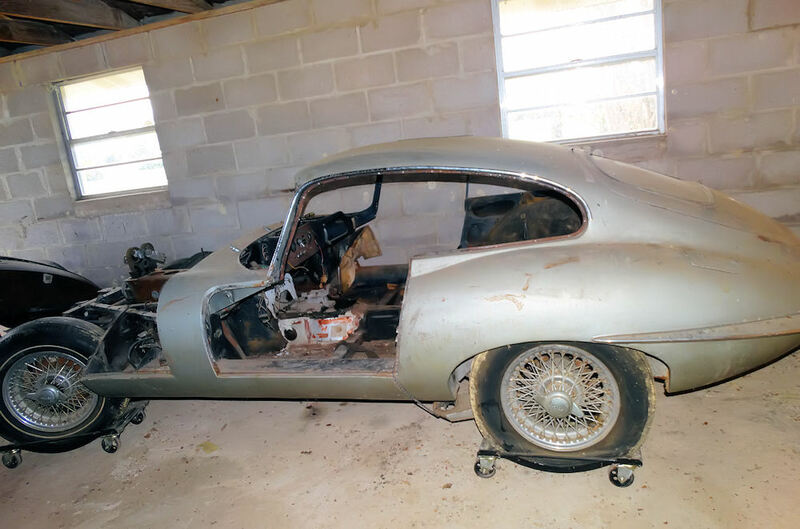 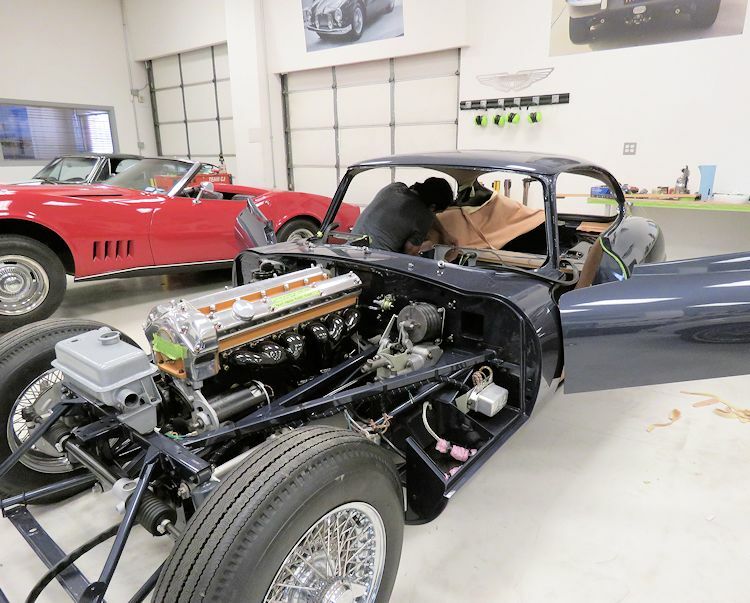 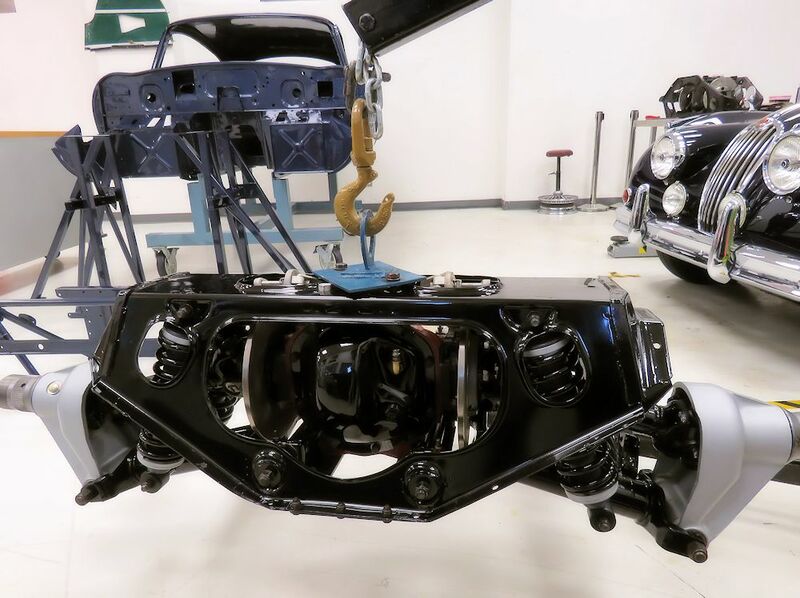 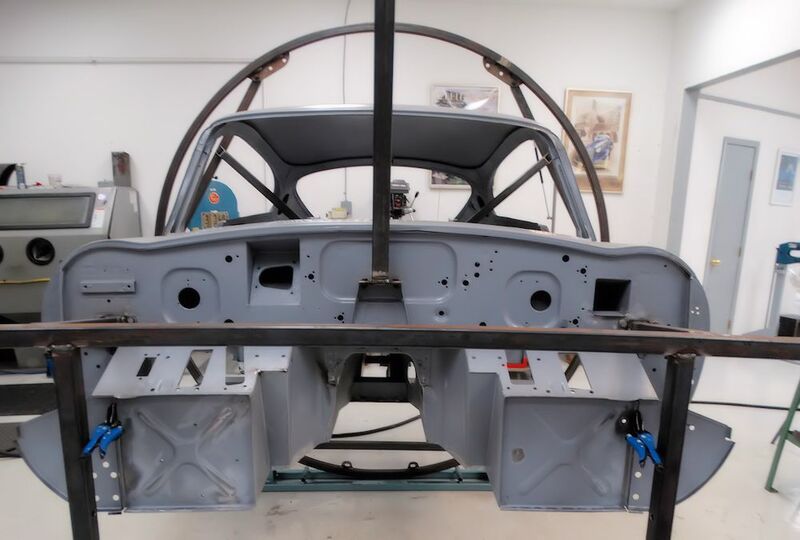 We have now completely disassembled the IRS and have the restoration and rebuild underway..
We are excited to get the body restoration of this very important E Type underway. 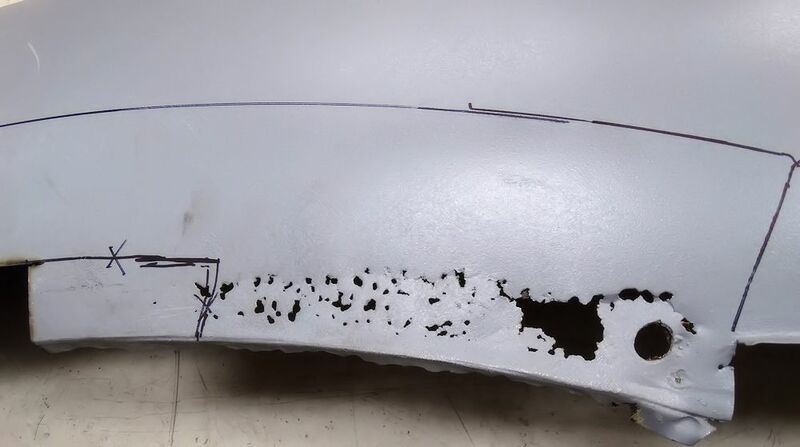 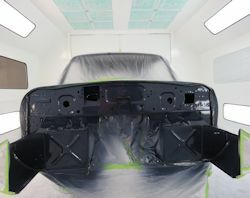 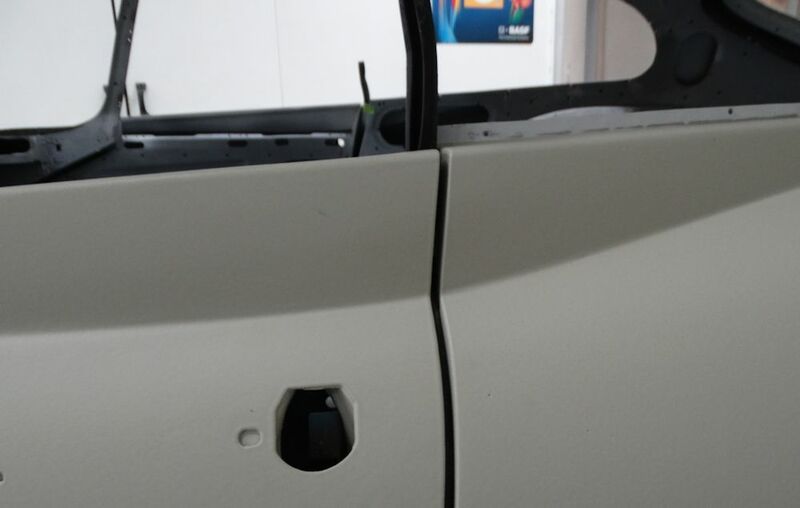 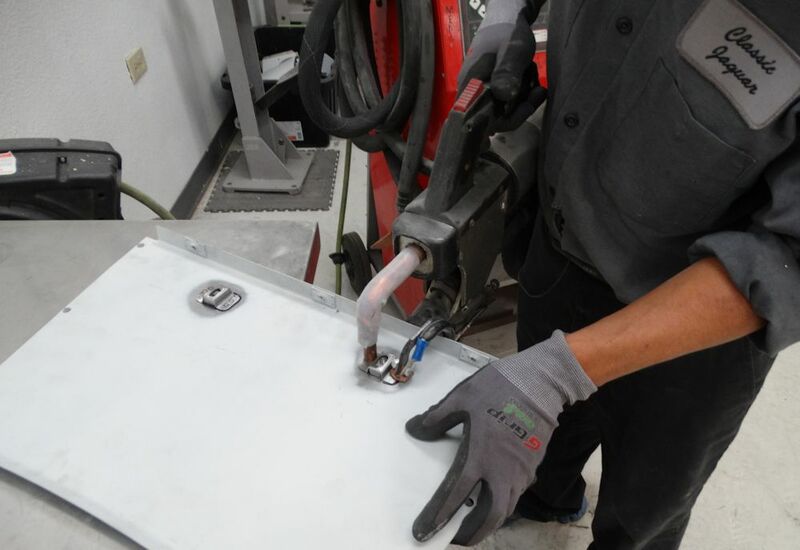 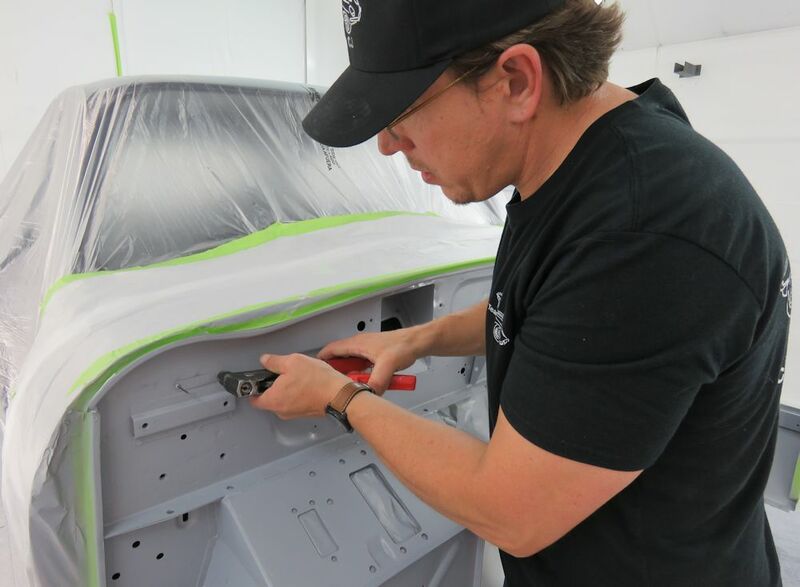 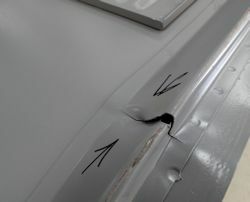 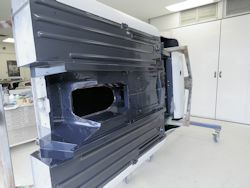 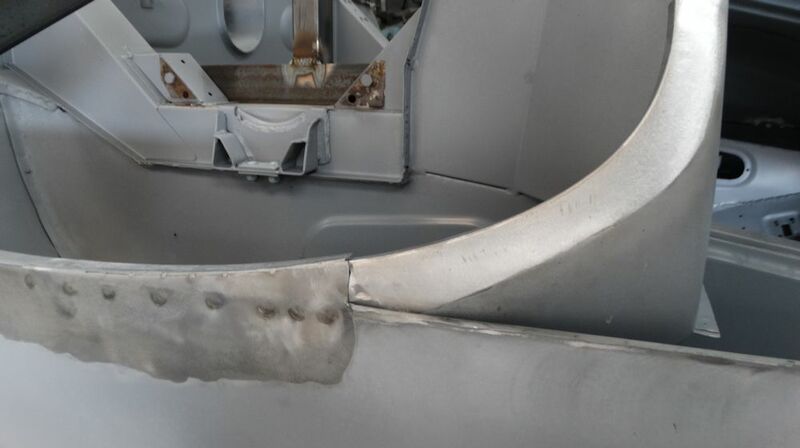 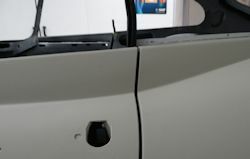 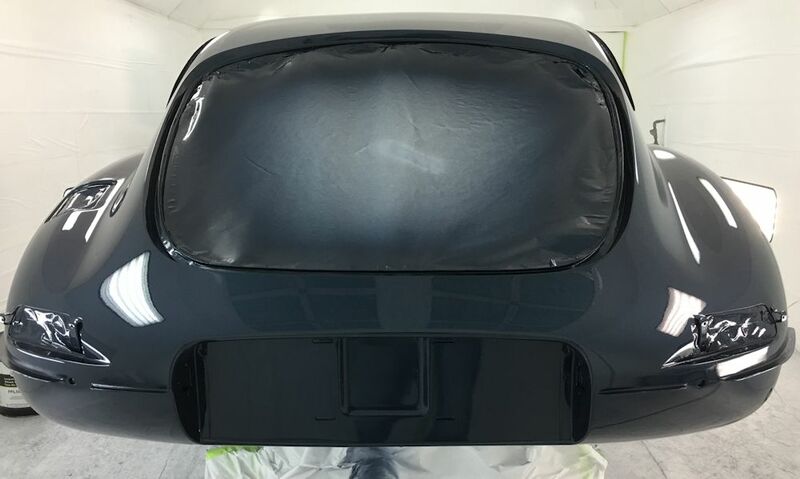 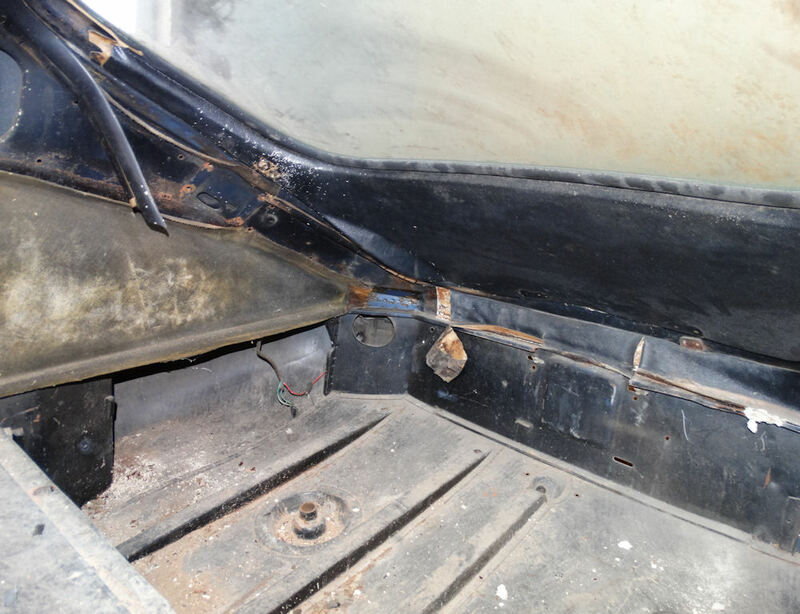 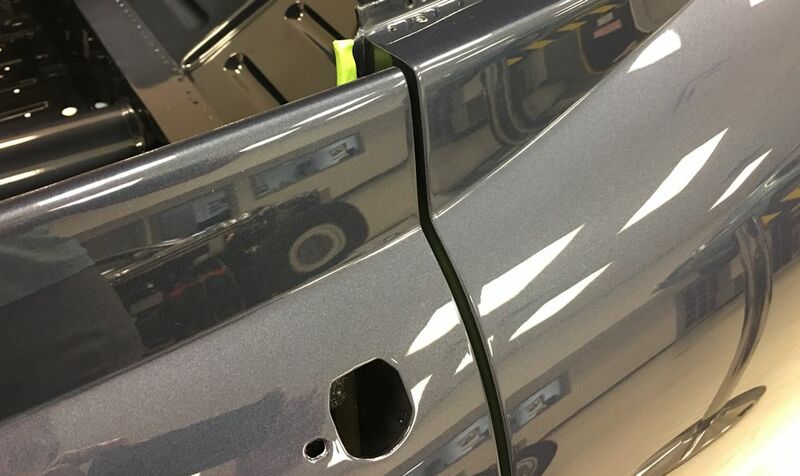 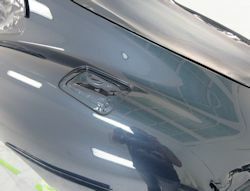 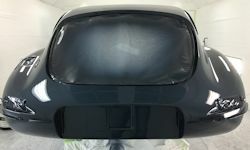 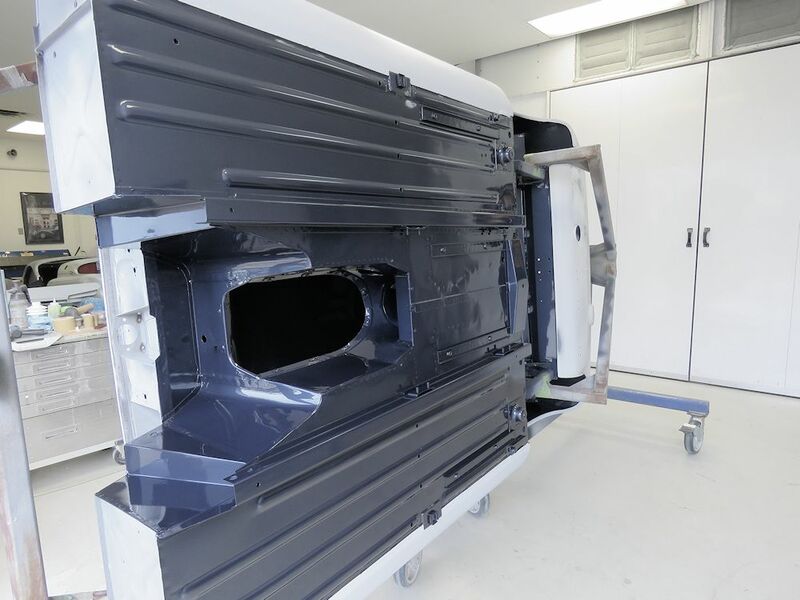 Our first job is to remove and repair the driver's side quarter panel, as well as to fabricate and install a new seal rail for the door shut face panel. 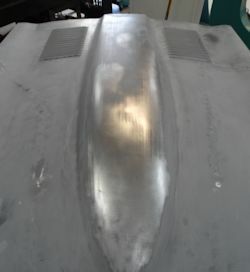 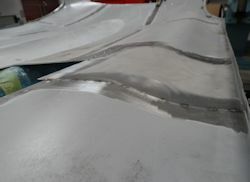 Back from the blasters, the main bodyshell is very much as expected, the bonnet a little rougher than we would have hoped. 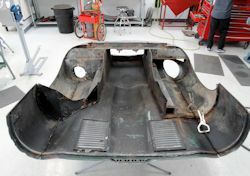 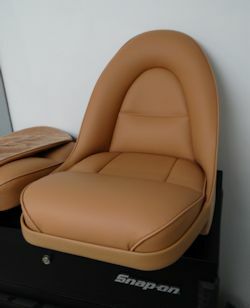 We will have the body restoration underway next week. Time to get this important body restoration underway. Our first task will be to strip and disassemble the bonnet. 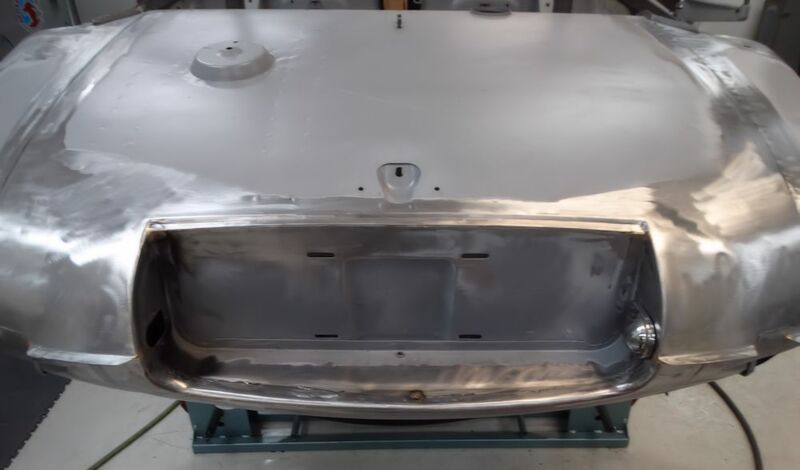 We have decided to restore (rather than replace) the bonnet because we understand that 885013 is one of only 3 of the surviving outside latch coupes that still has its original factory bonnet. 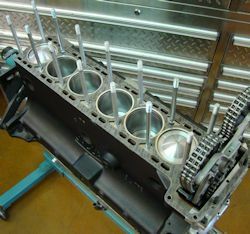 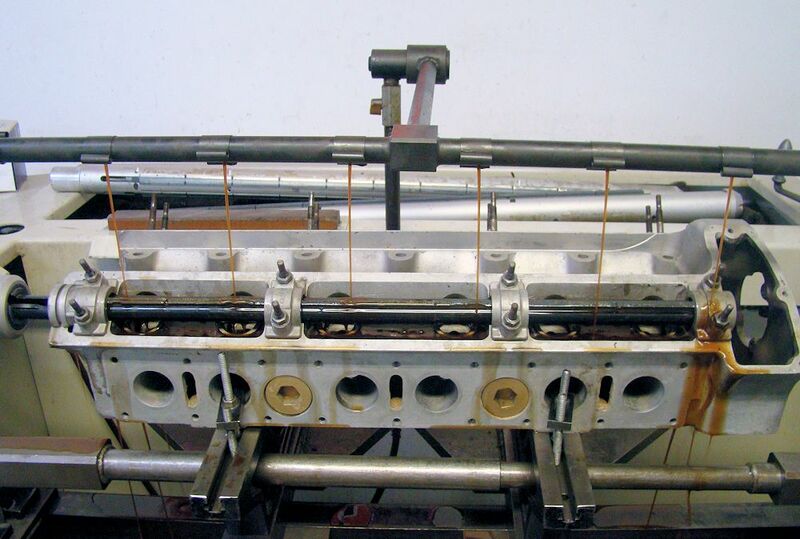 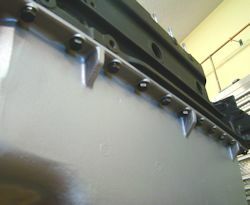 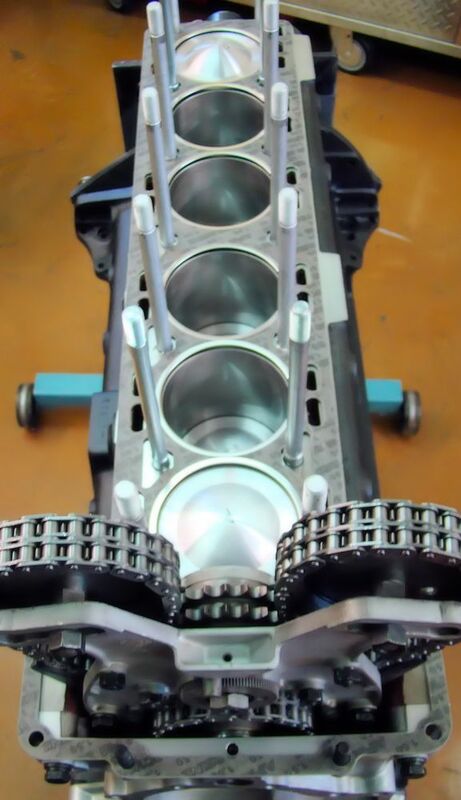 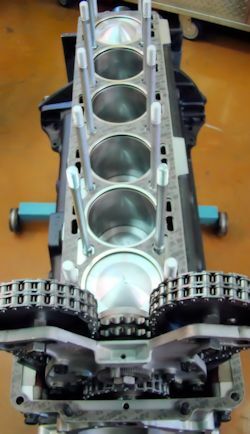 The last four photographs in the sequence below show the completed engine rebuild. 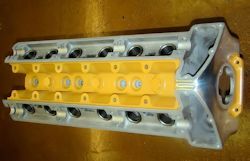 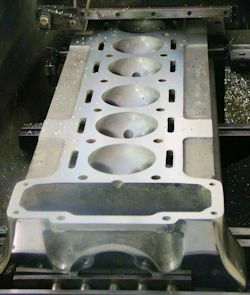 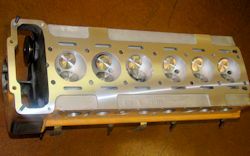 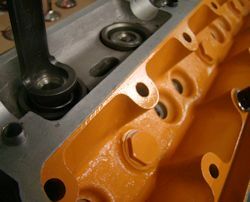 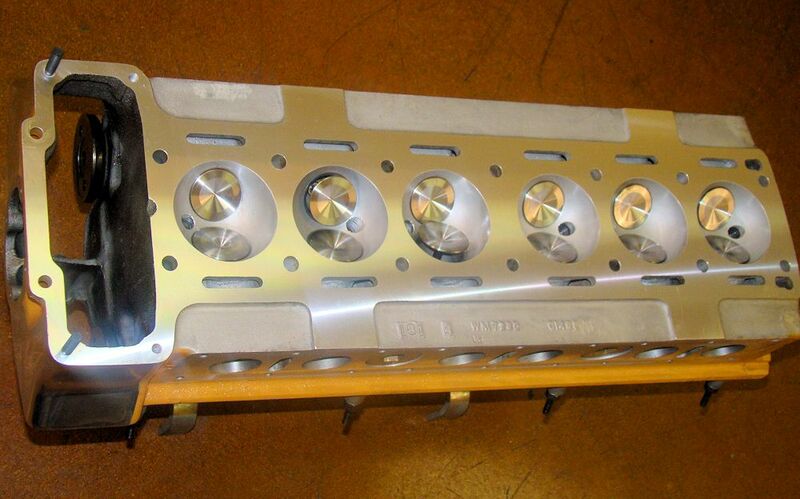 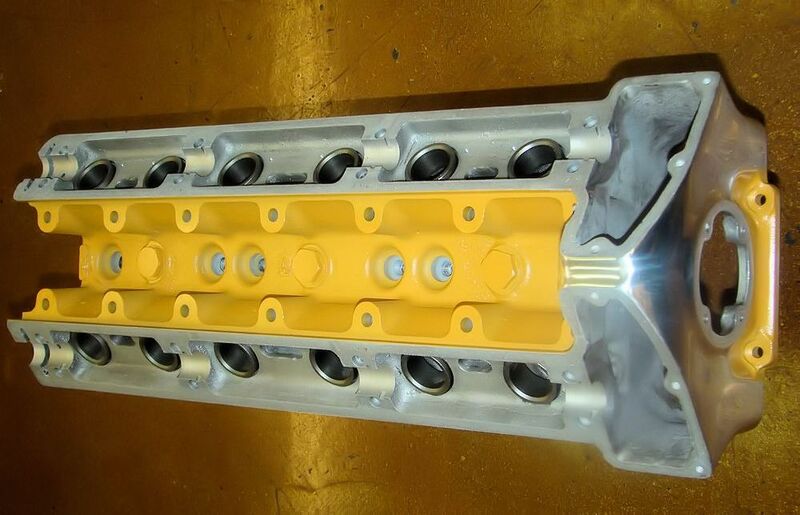 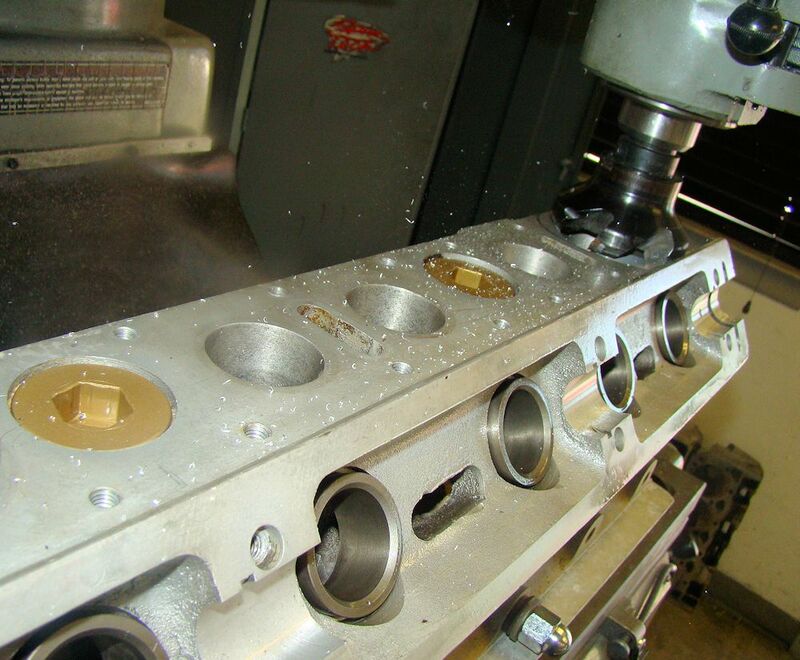 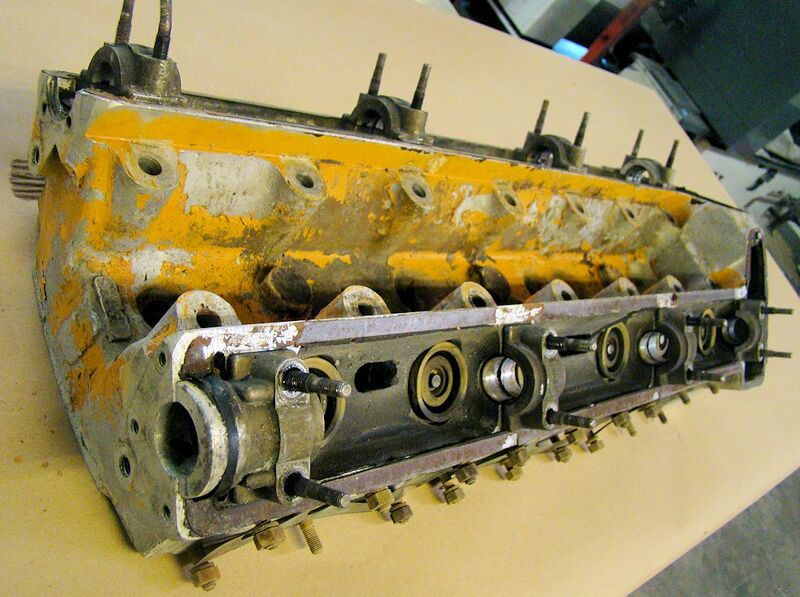 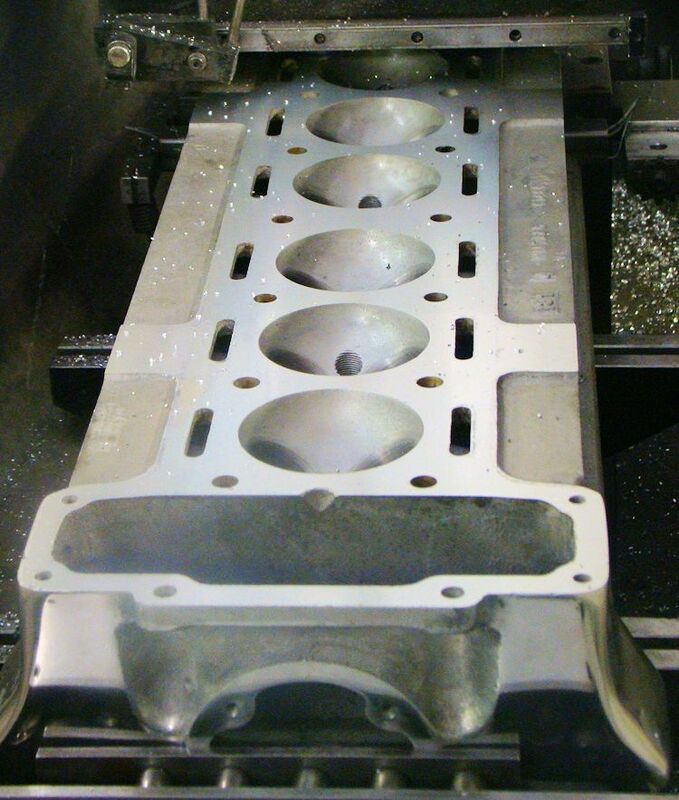 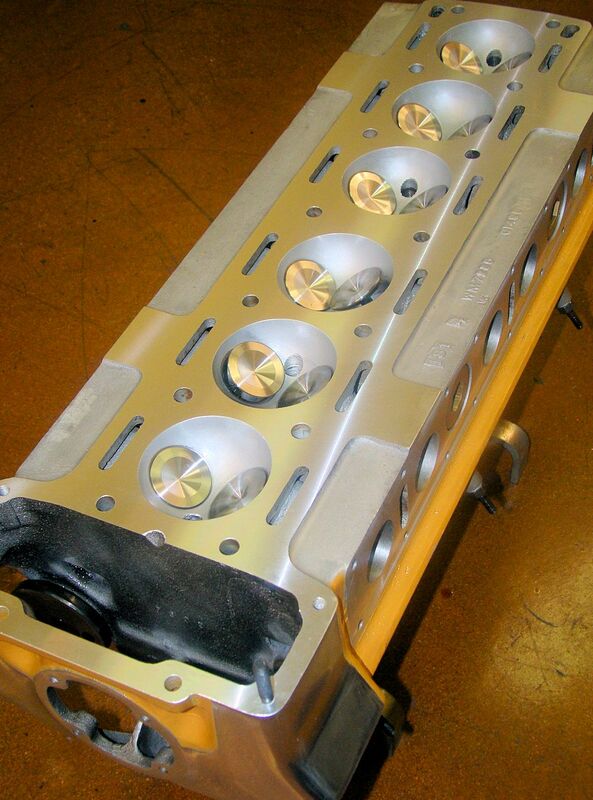 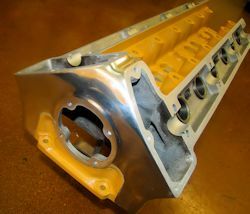 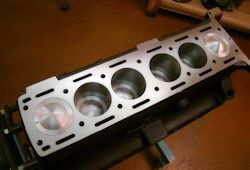 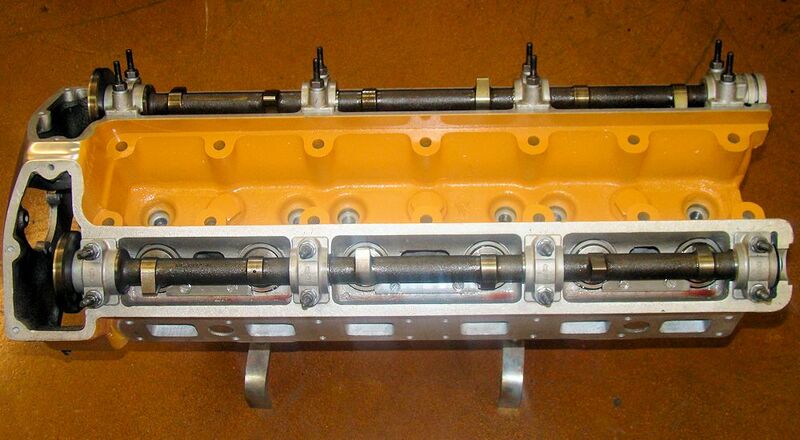 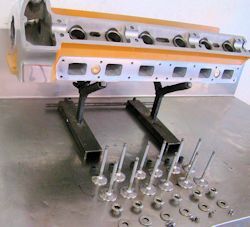 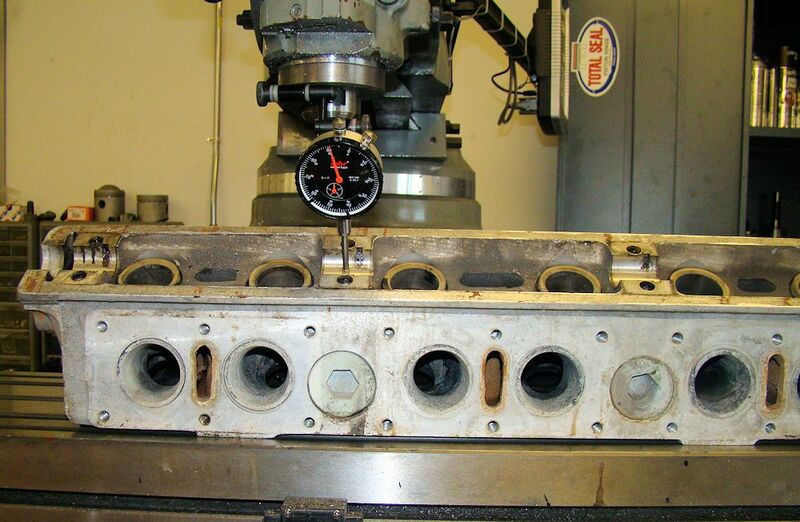 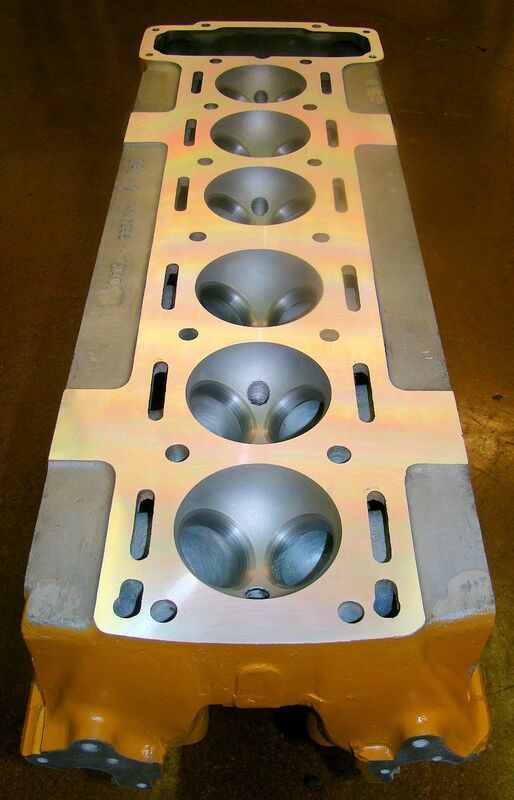 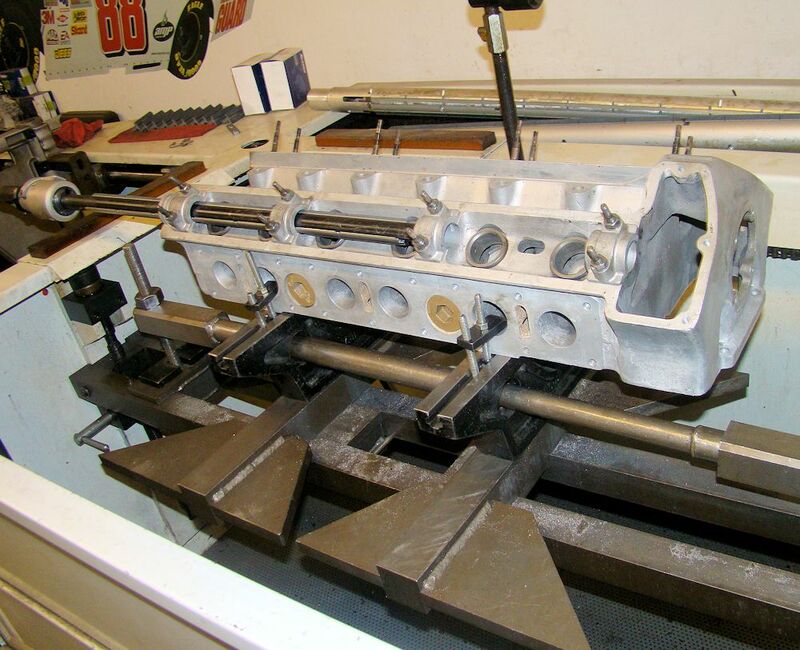 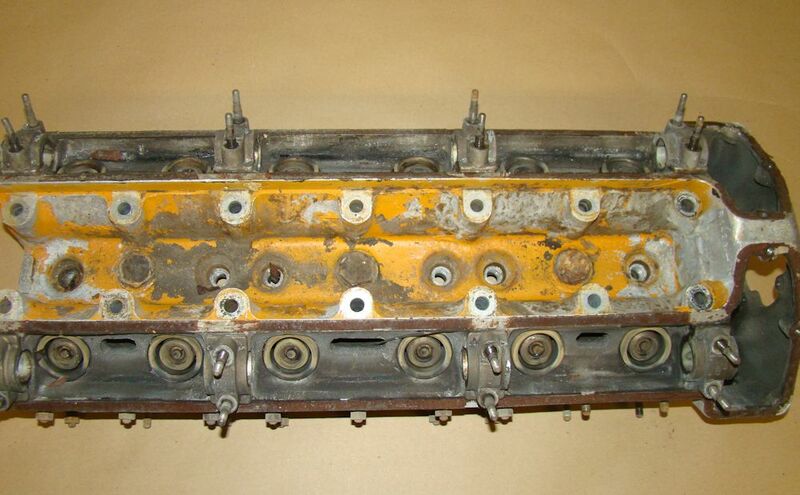 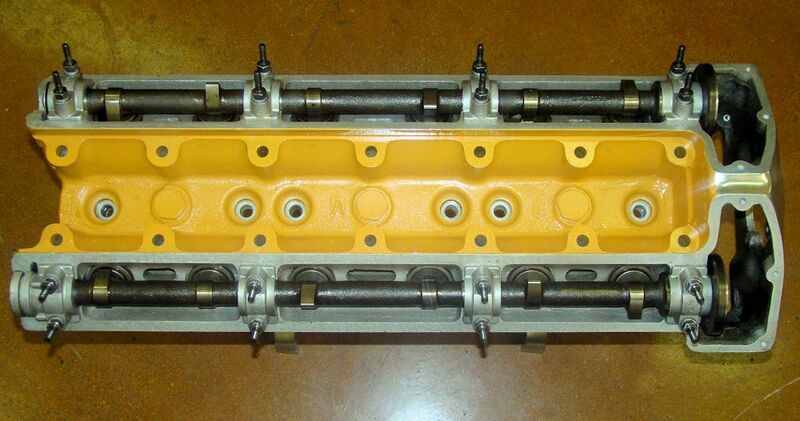 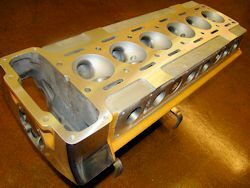 We have now fully assembled your cylinder head.. 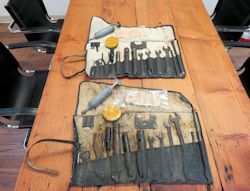 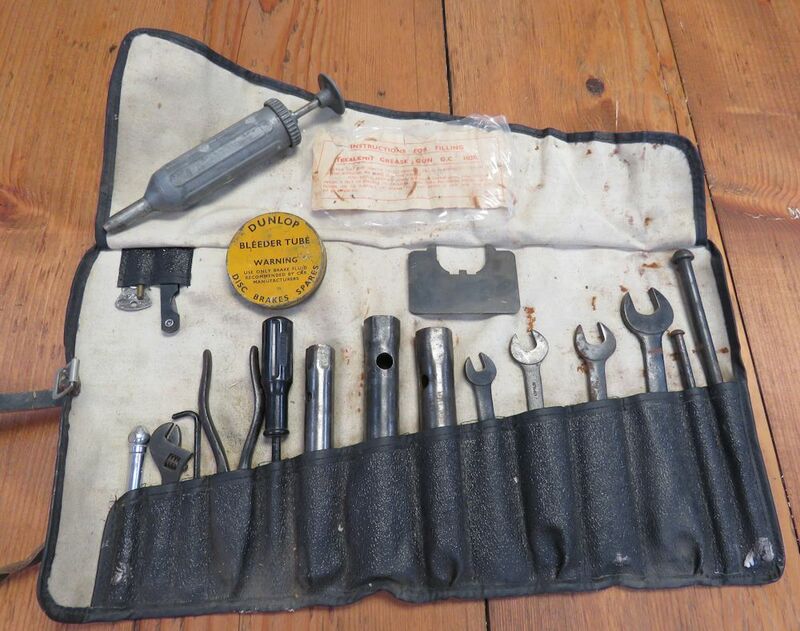 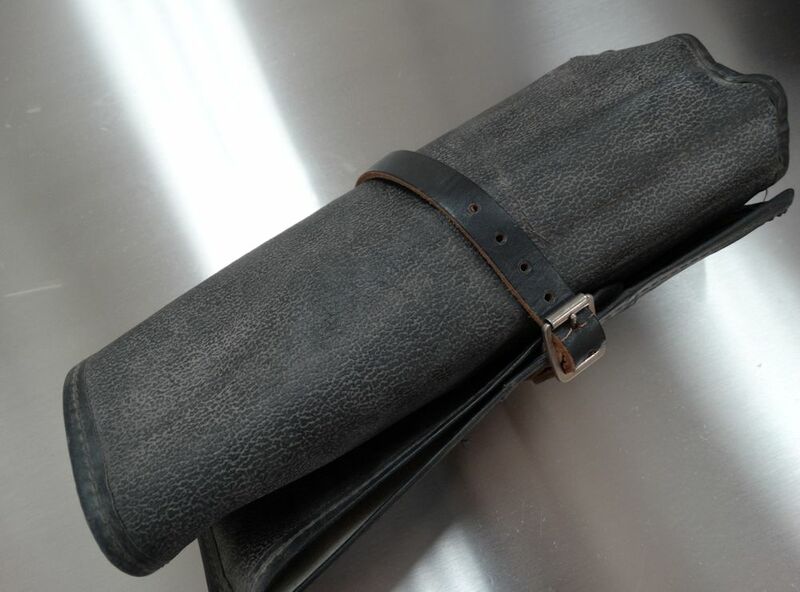 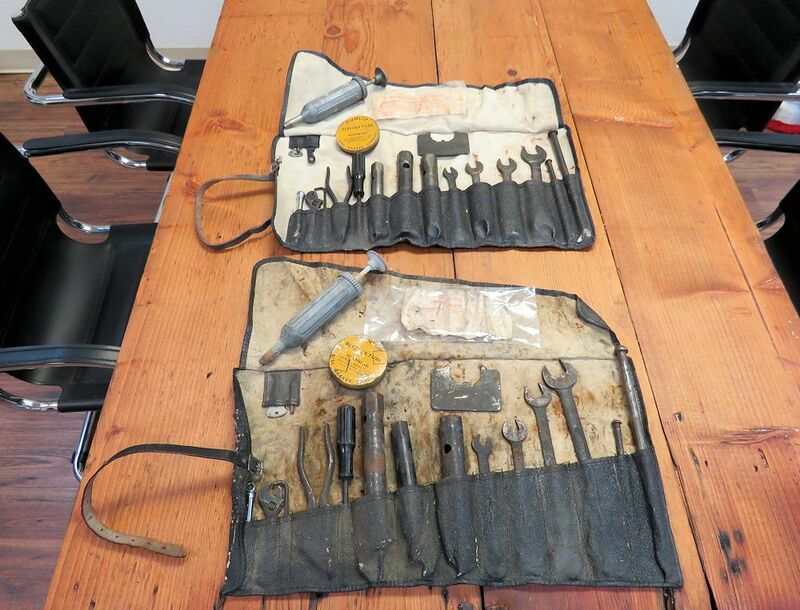 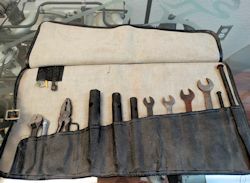 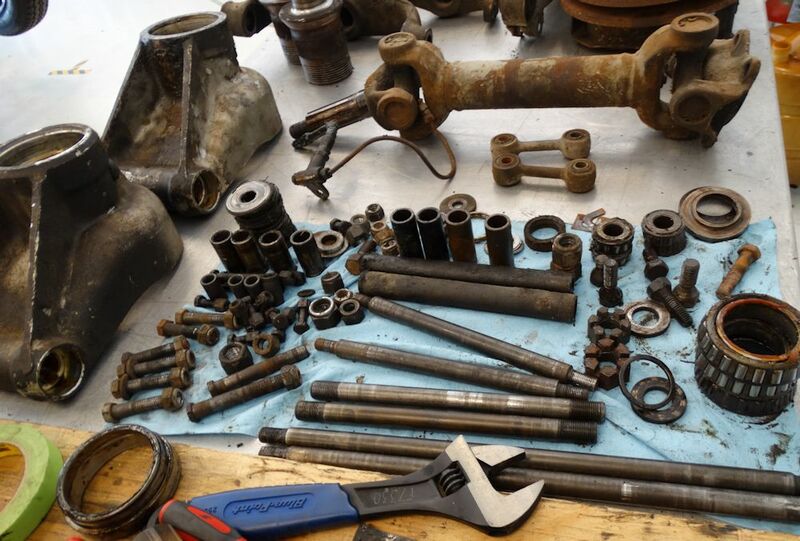 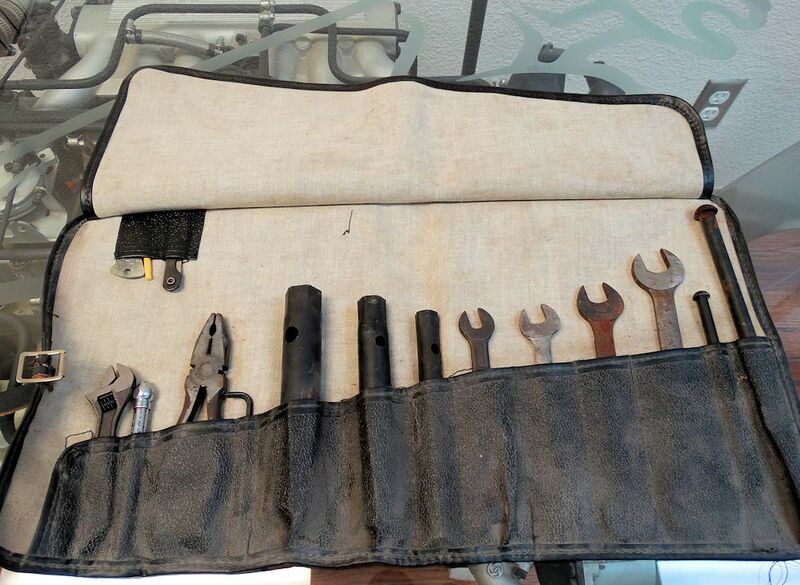 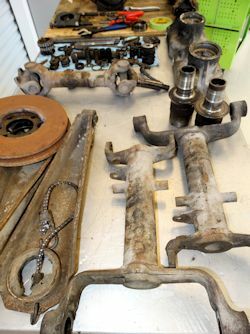 Original Jaguar tool kit will be restored to new condition.. 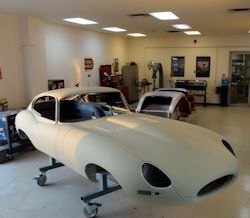 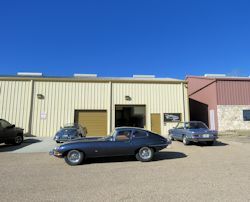 I am pleased to report that your car is now safely in the CJ workshops and we already have the restoration underway.